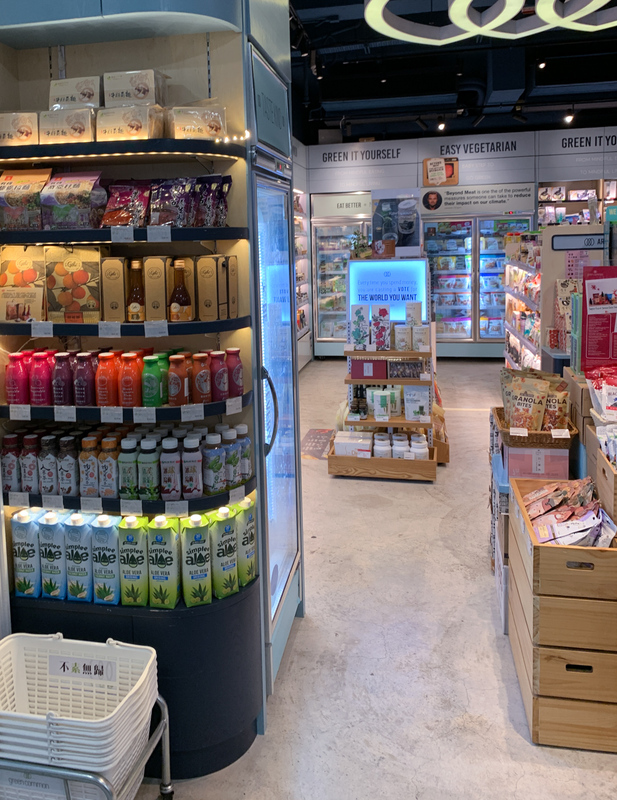 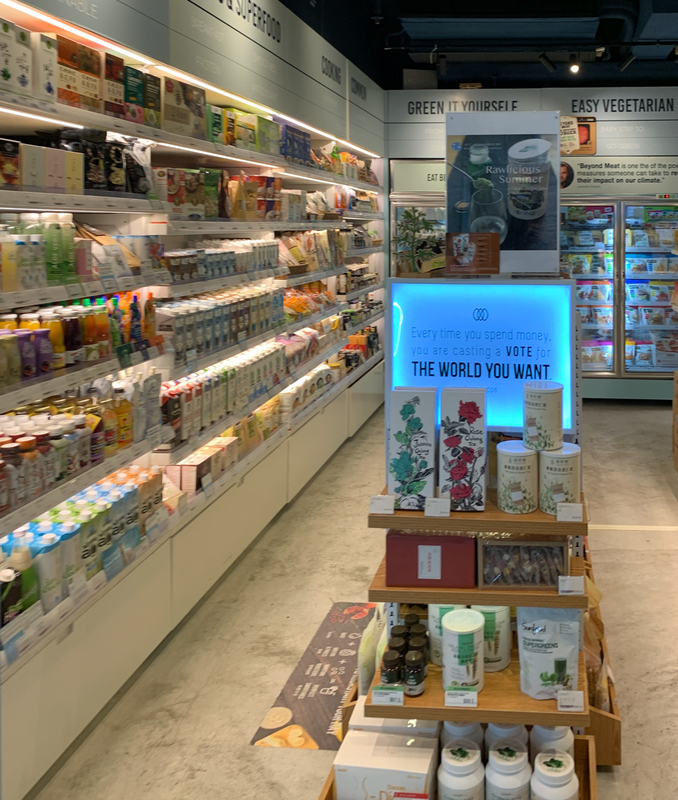 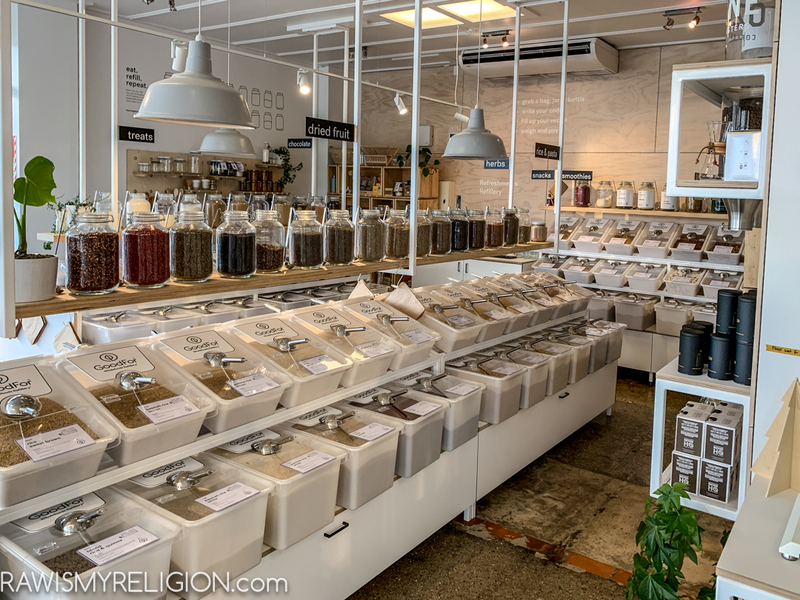 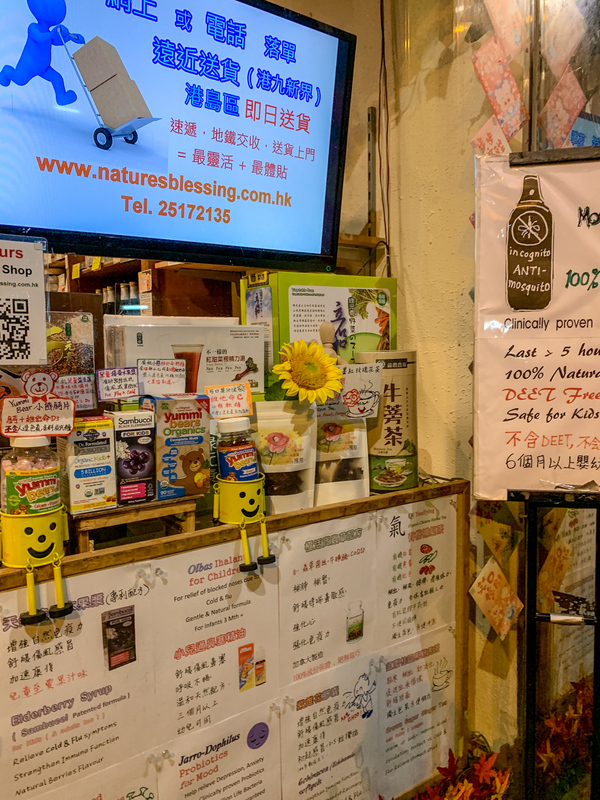 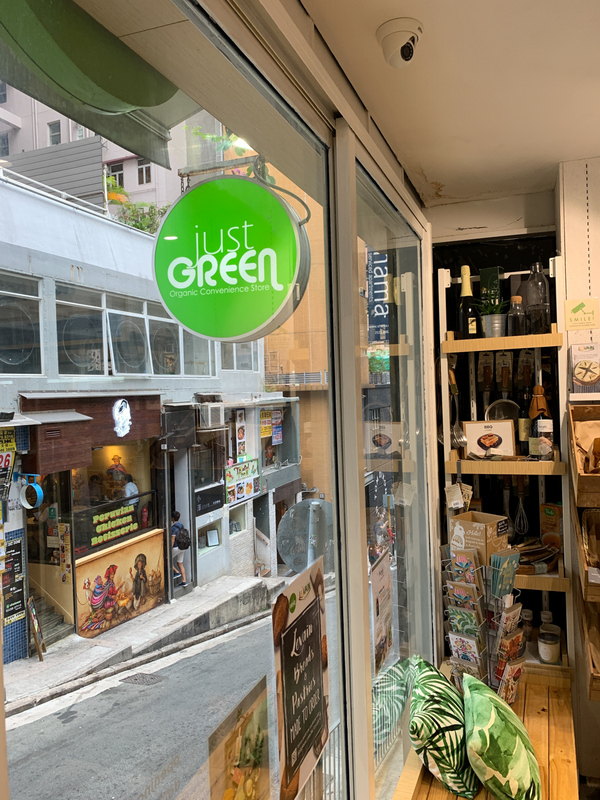 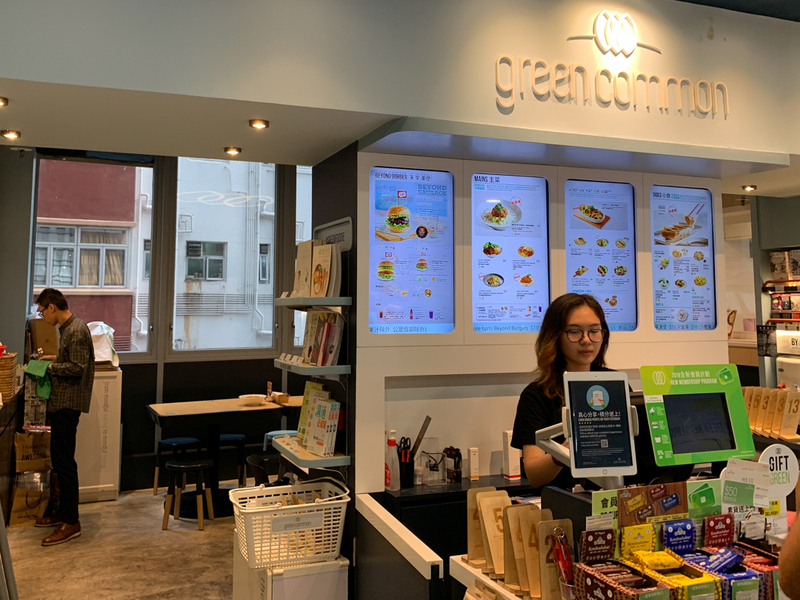 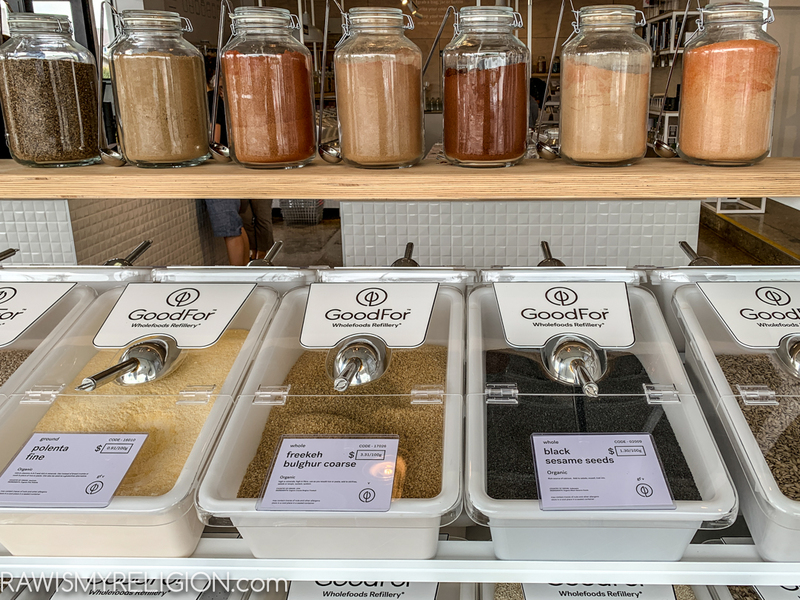 This shop is attached to the Greenwoods Raw Cafe in the center of Hong Kong. 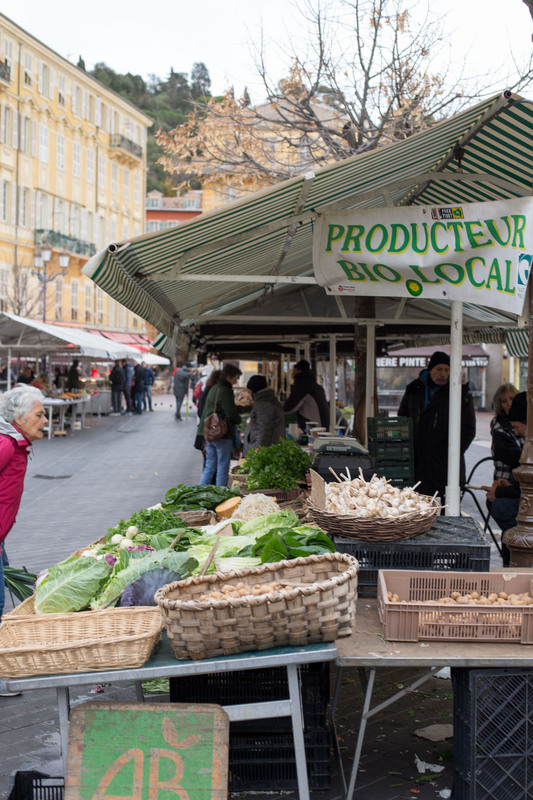 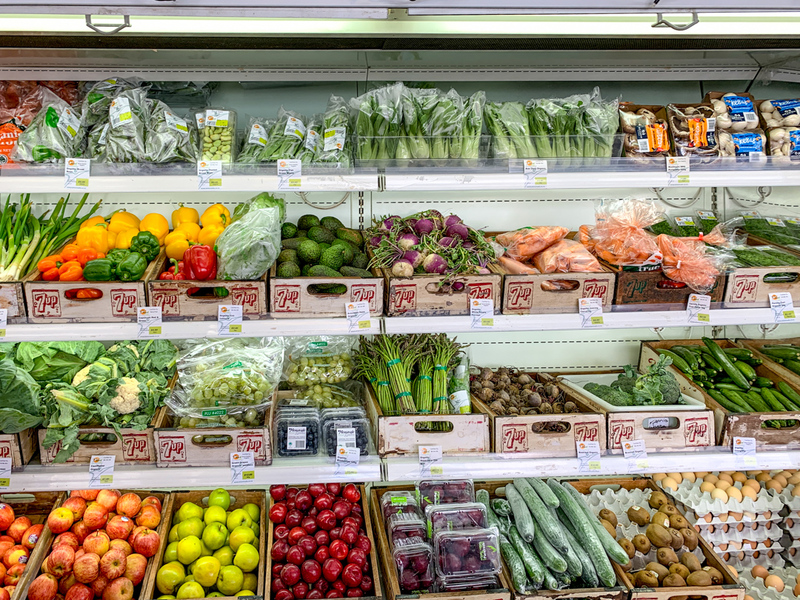 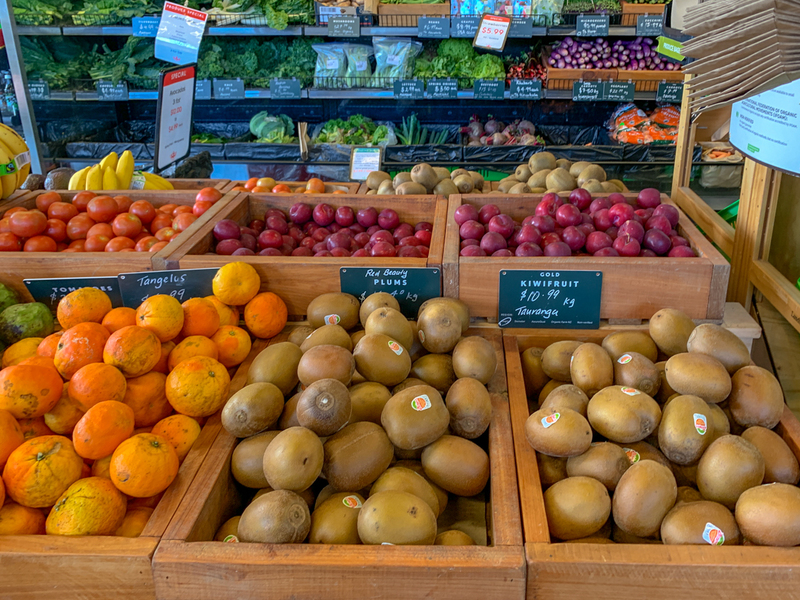 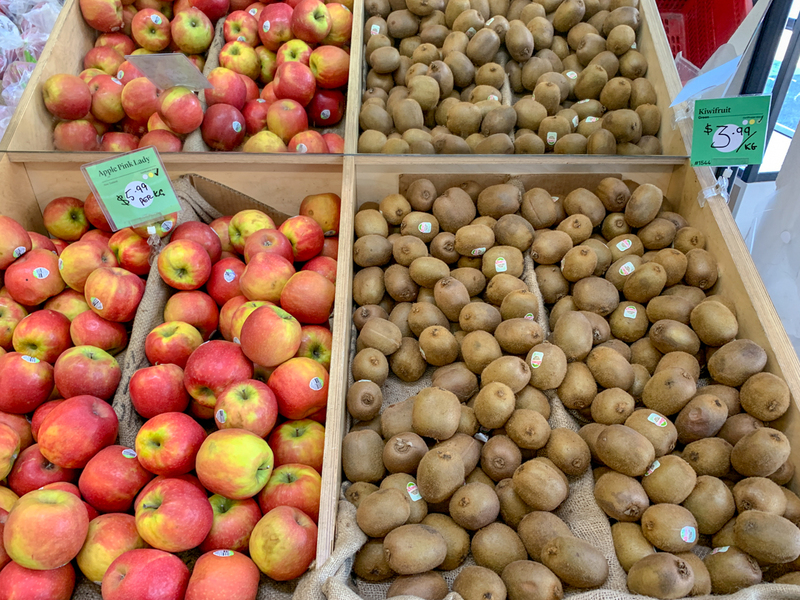 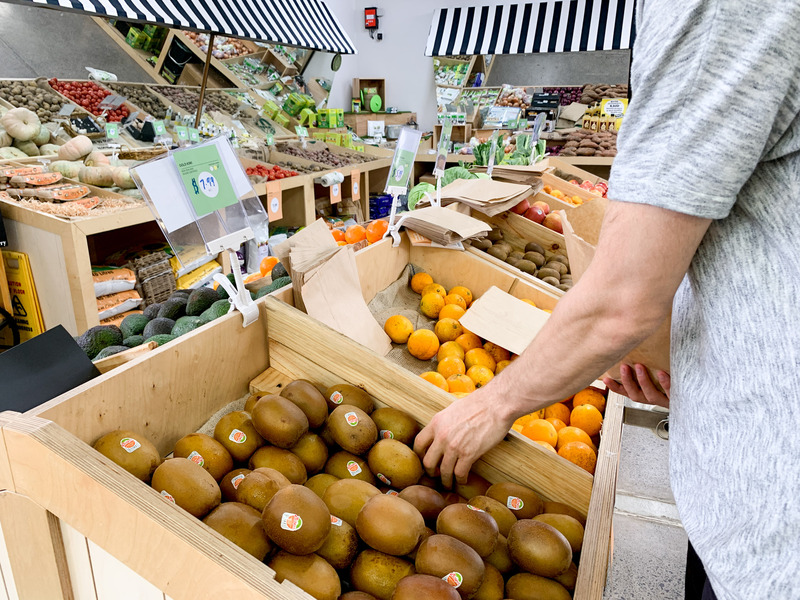 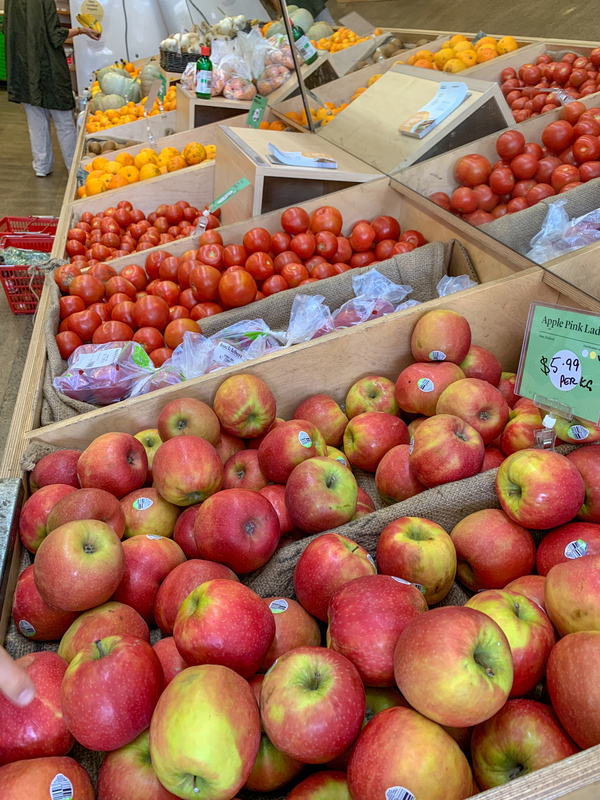 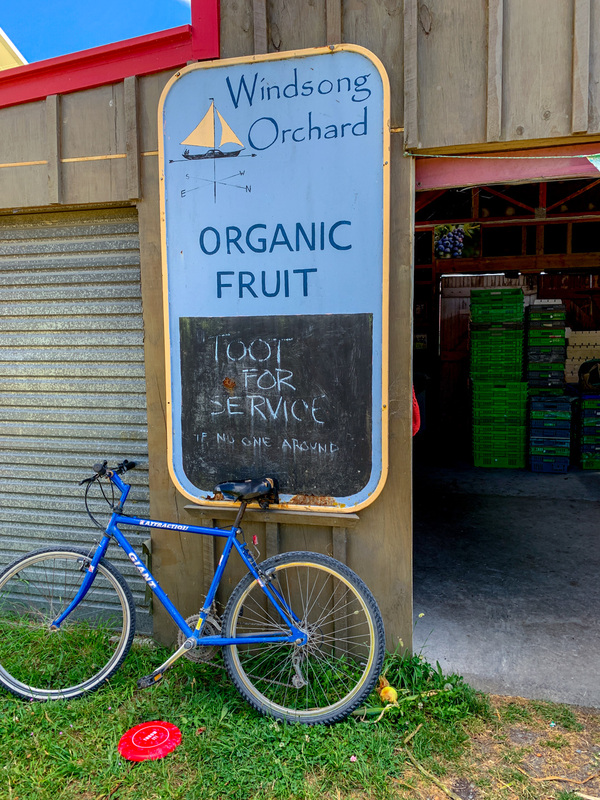 They sell some organic fruits and veggies, the availability really depends on the season and the day of the week. 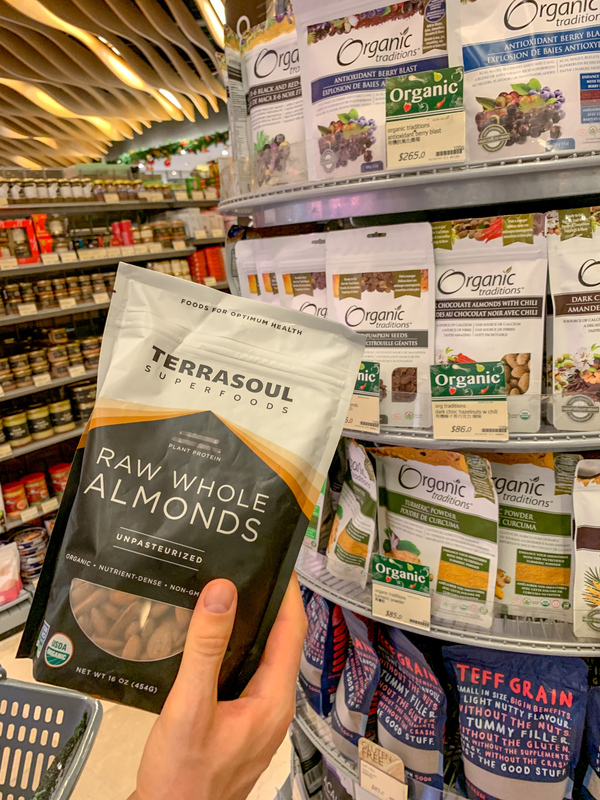 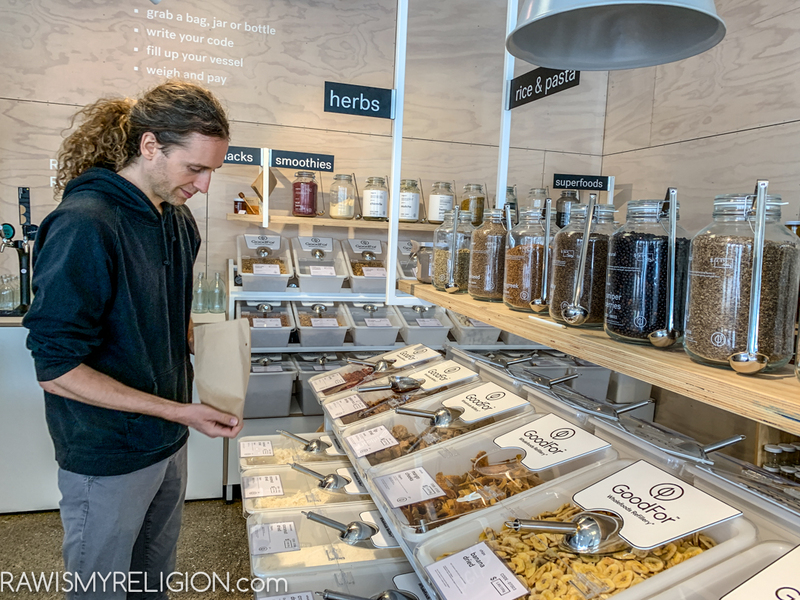 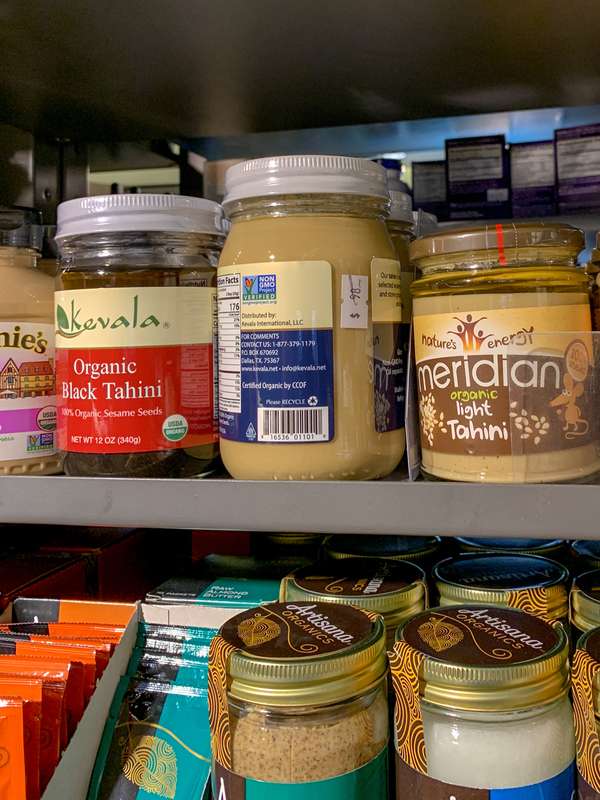 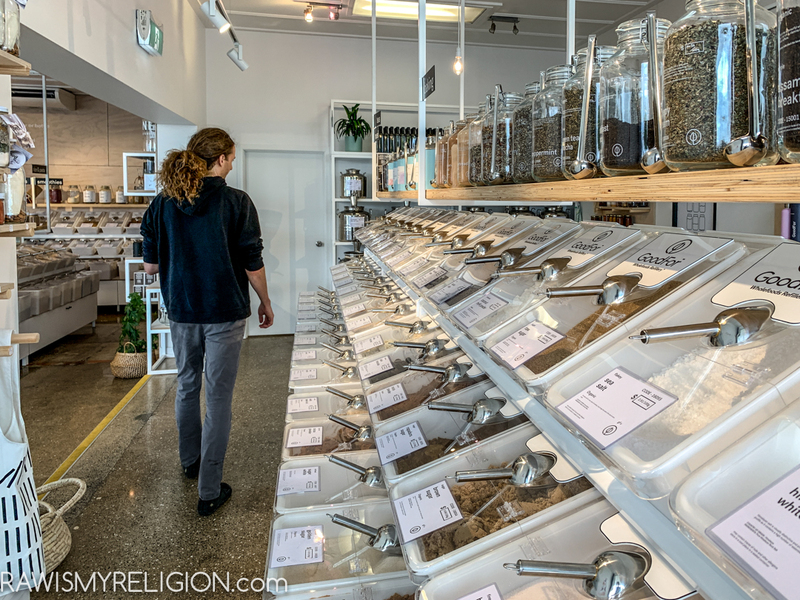 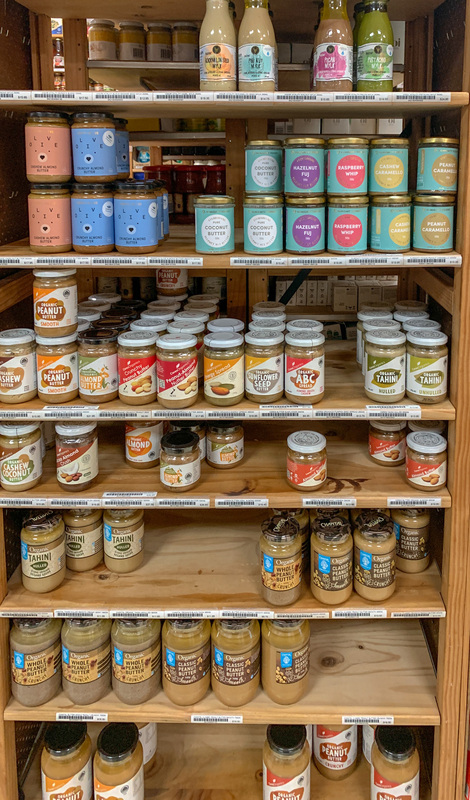 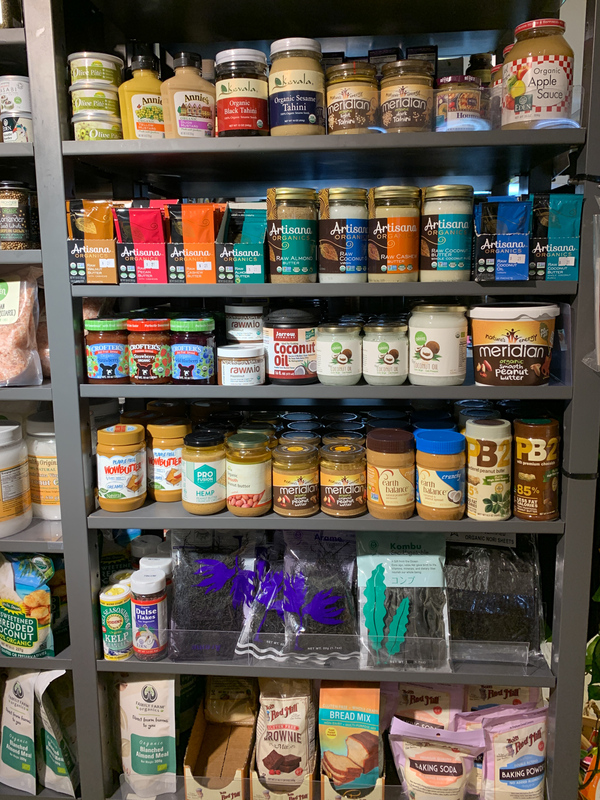 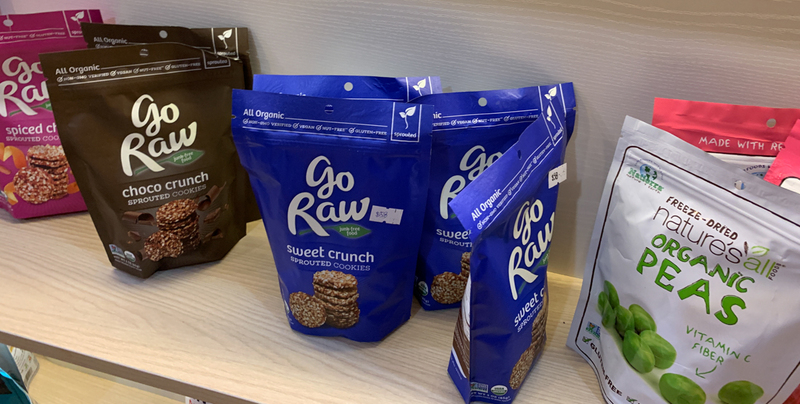 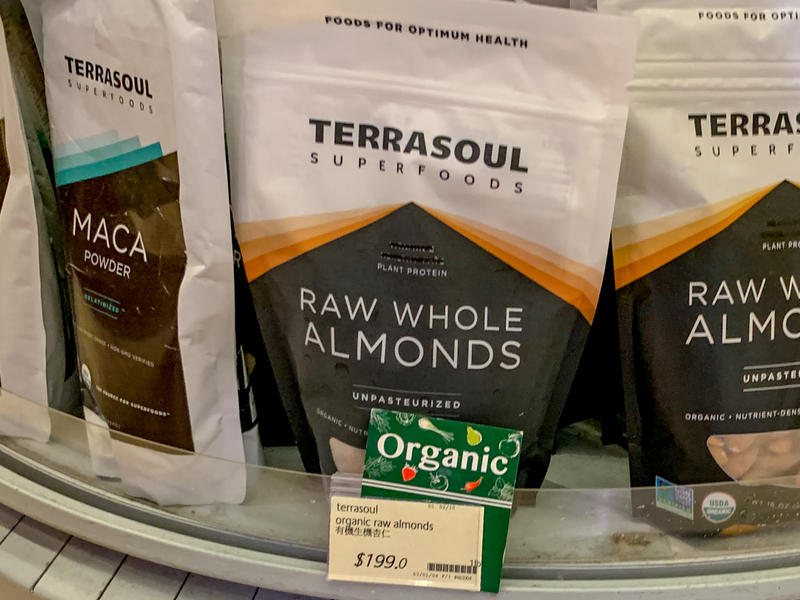 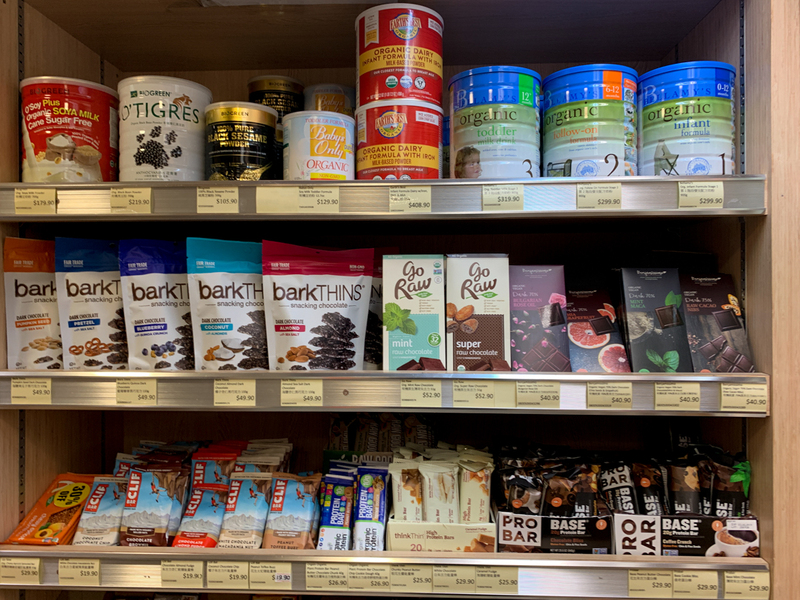 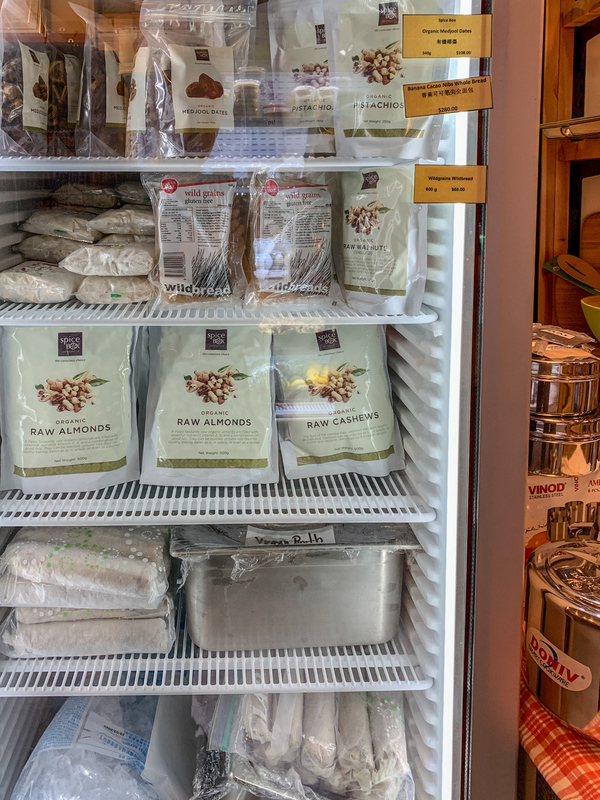 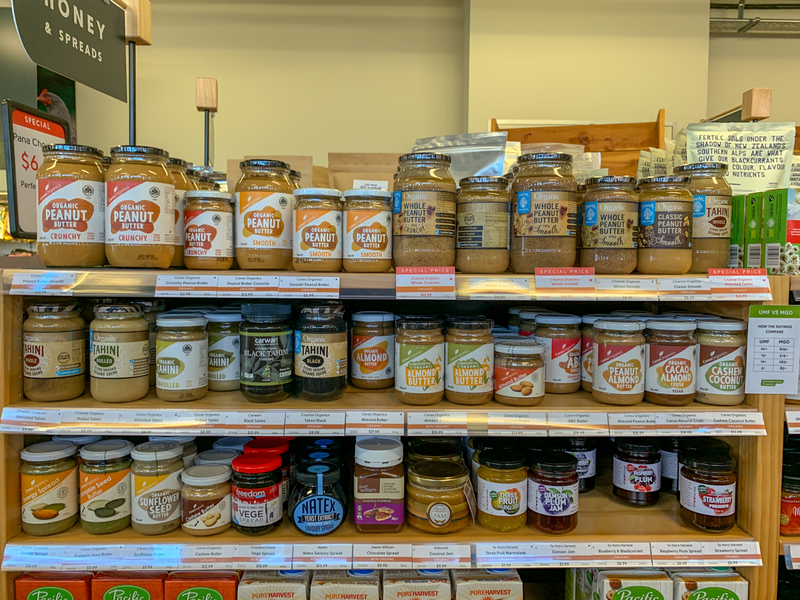 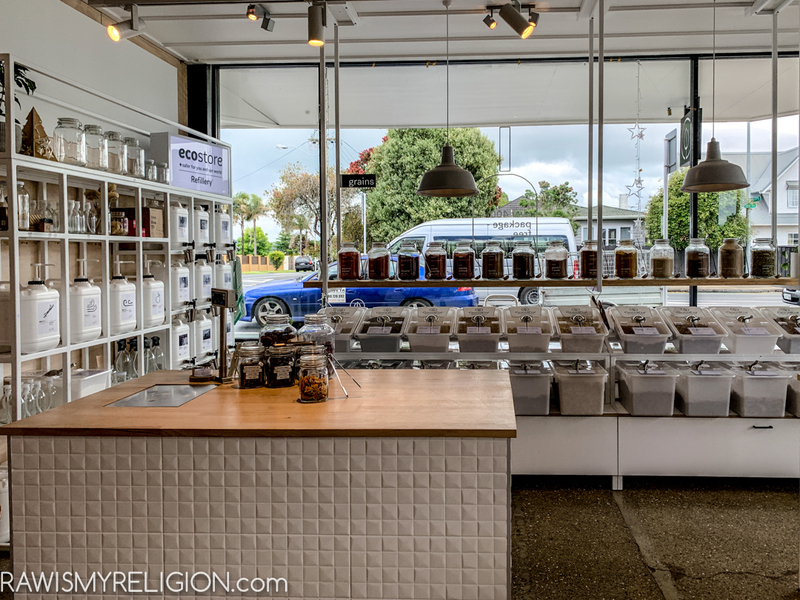 We found some great raw products here like raw nut butter, raw dates, and organic raw nuts. 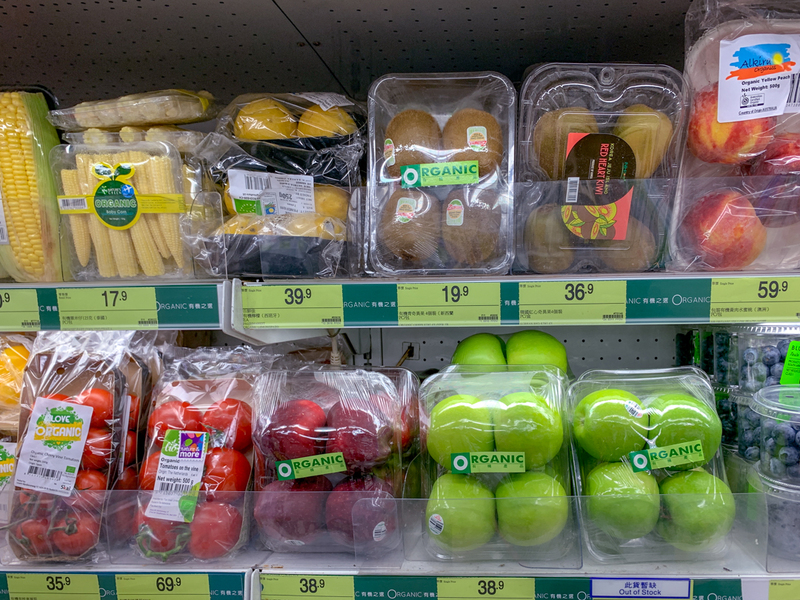 There was some fruit like organic bananas, apples and dragon fruit, organic bell pepper, orgaic cucumber and greens. 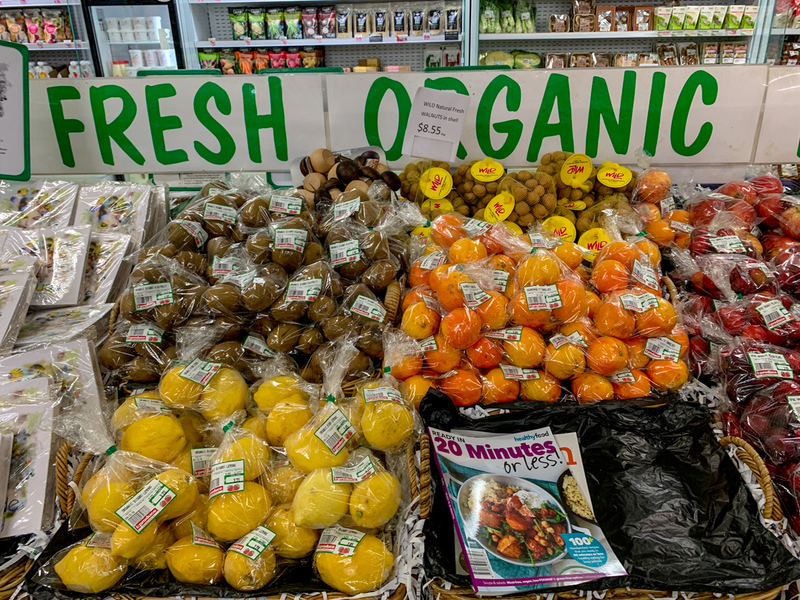 Also organic lemons. 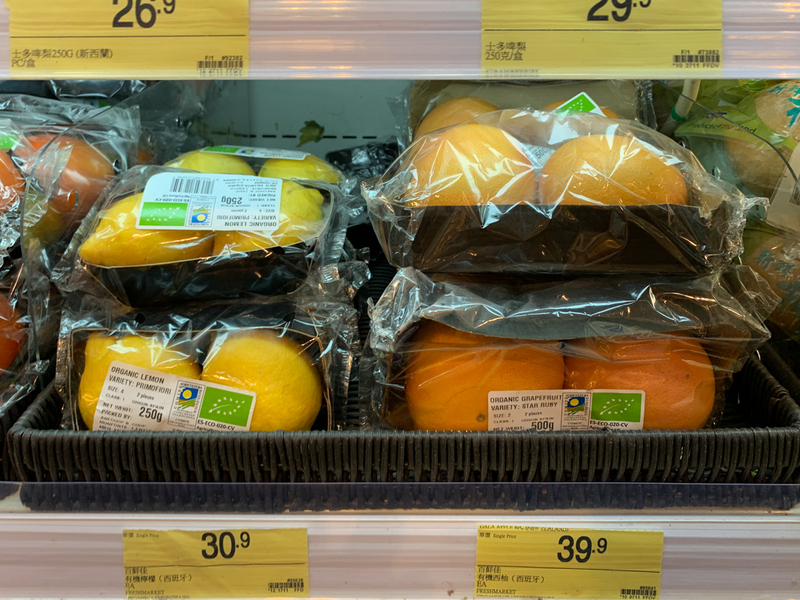 More fruit like oranges, coconuts and dates in the fridge. 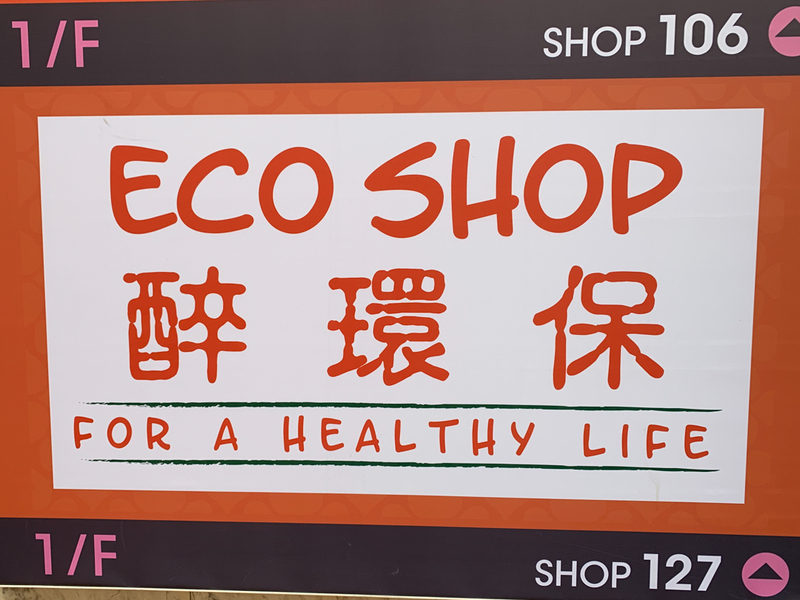 They had a 5 years celebration and therefore everything was 20% off. 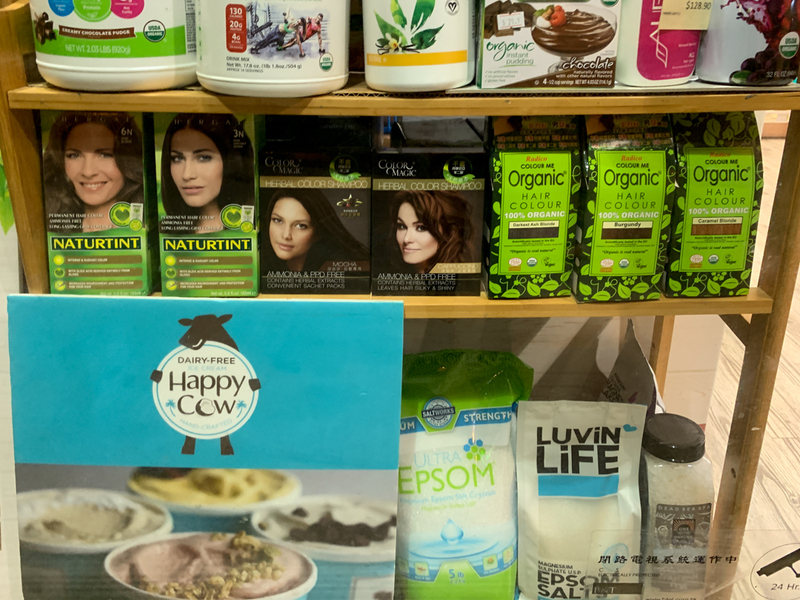 Here are some beauty products, organic spices and organic nuts. 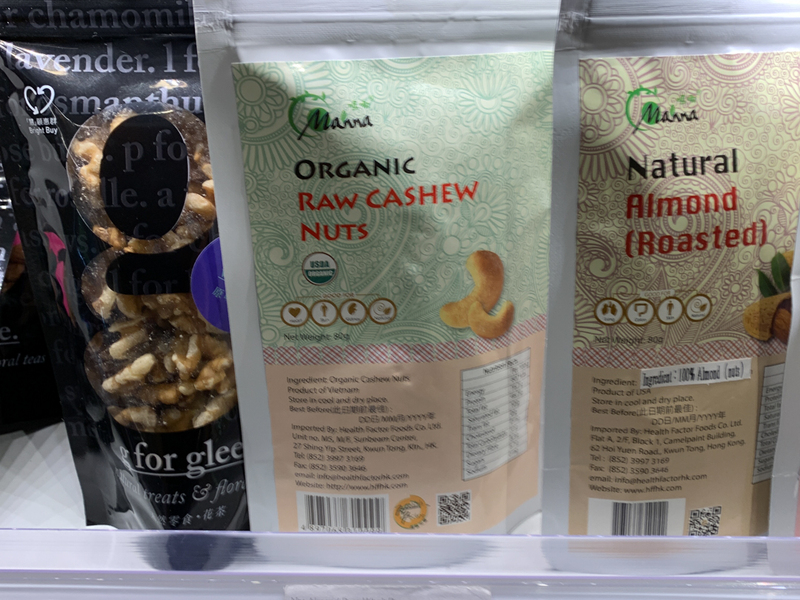 What we bought at the store: raw organic almond buttter, raw granola, raw organic dates, raw organic brazil nuts. 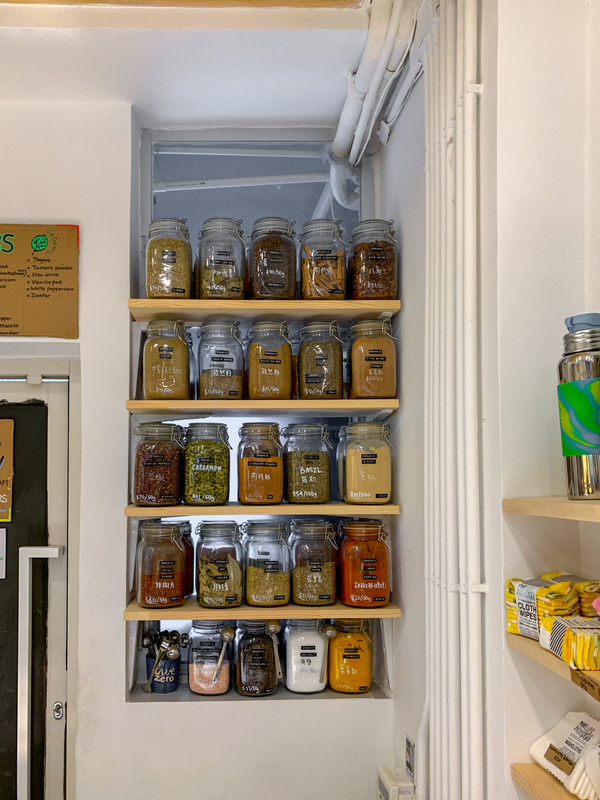 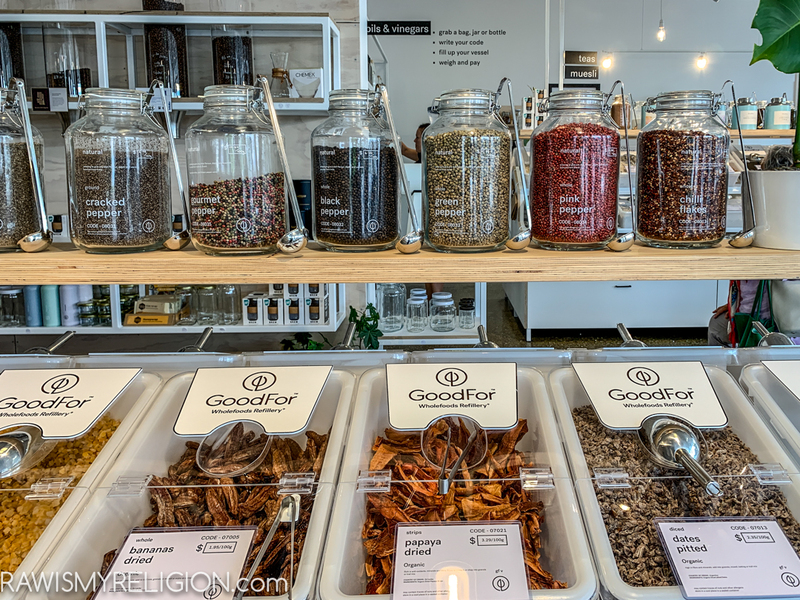 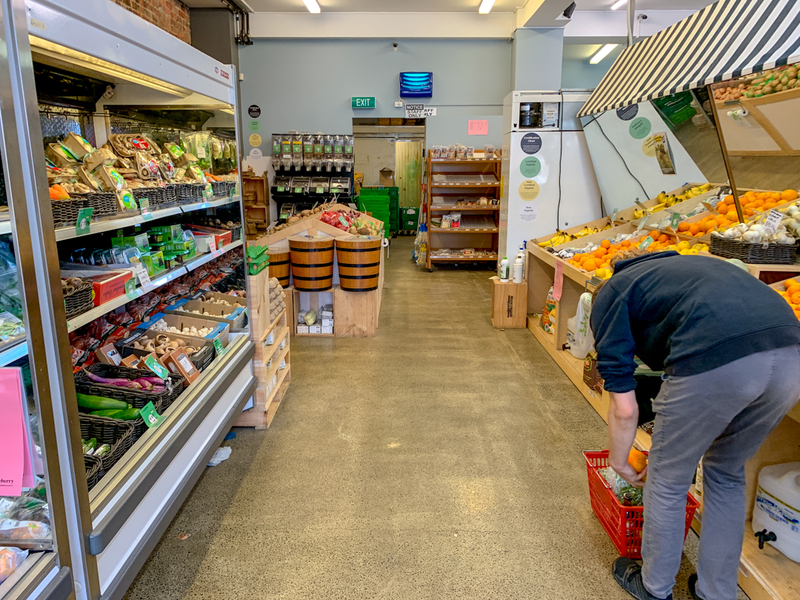 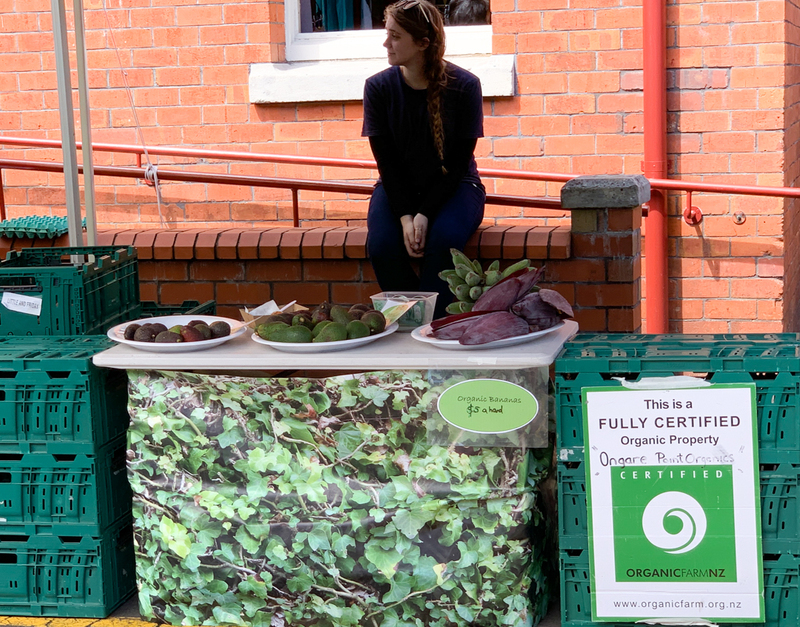 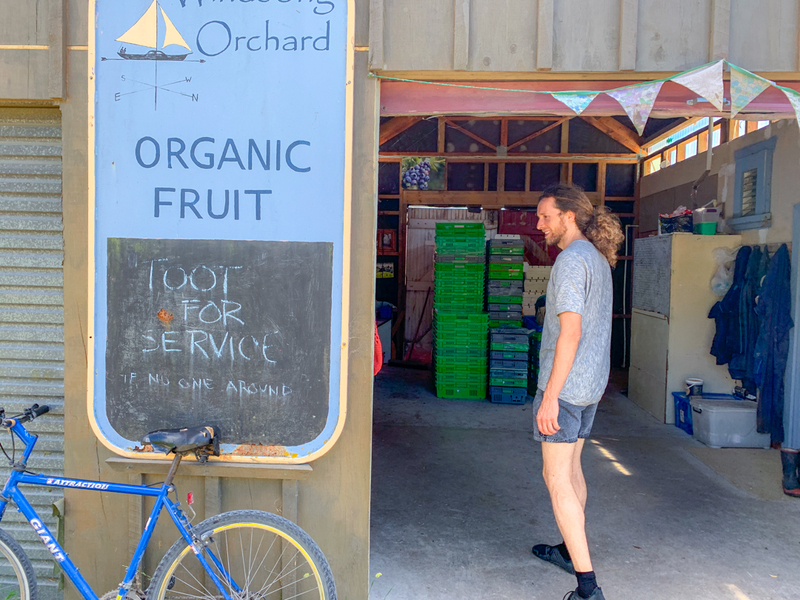 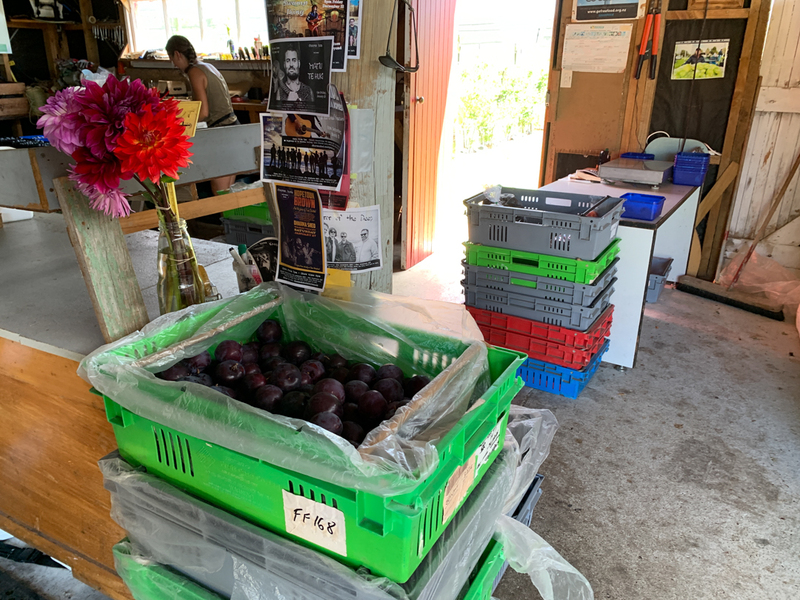 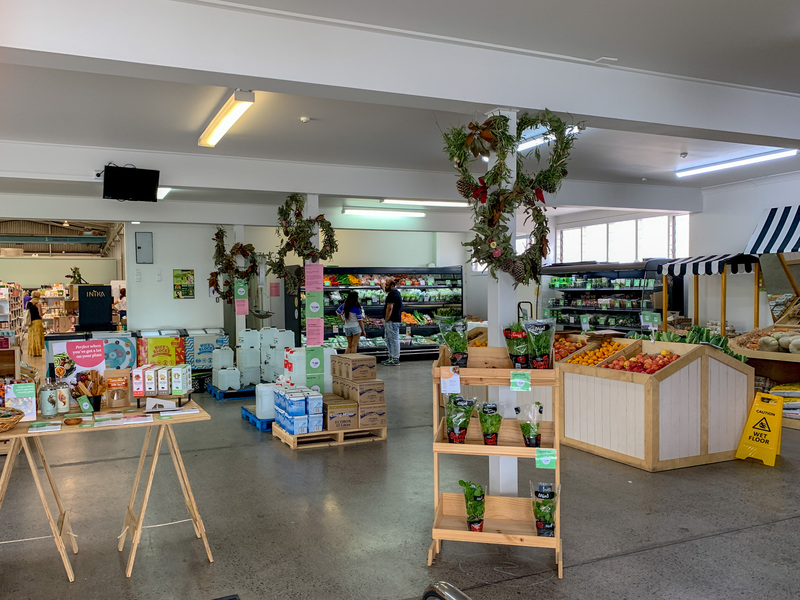 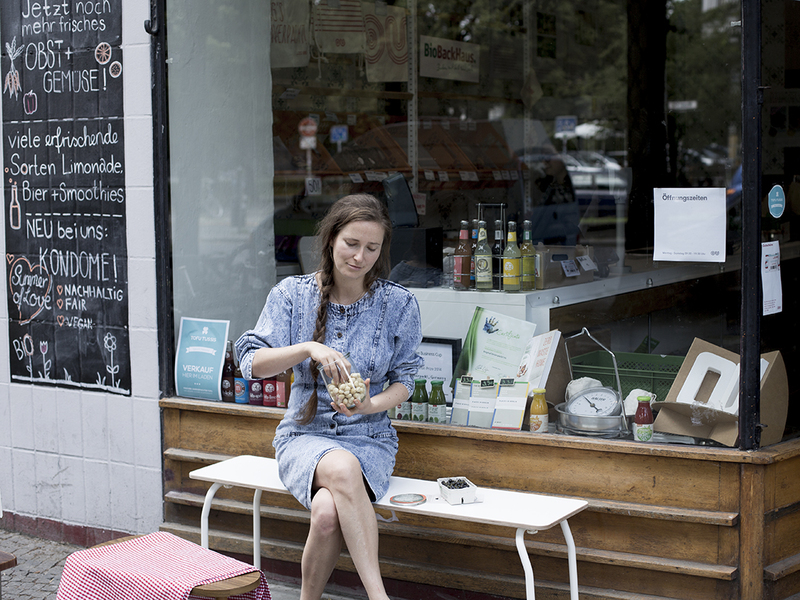 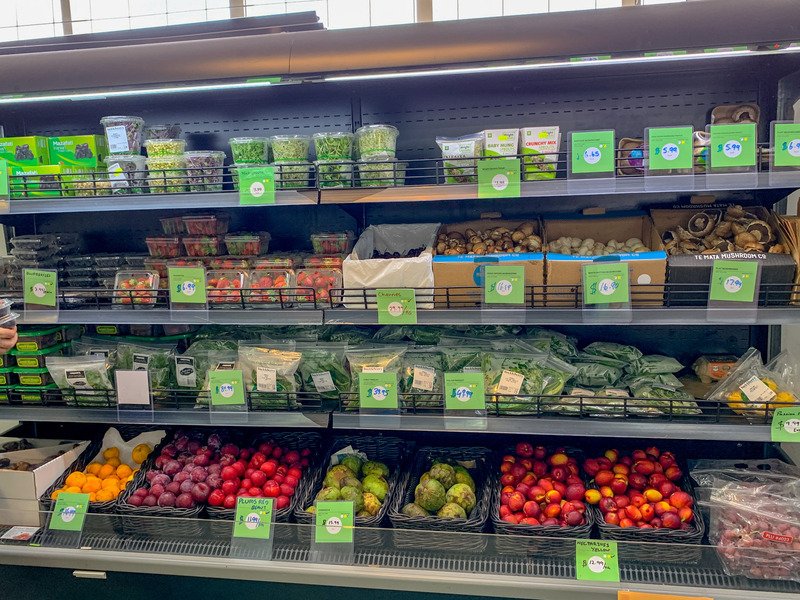 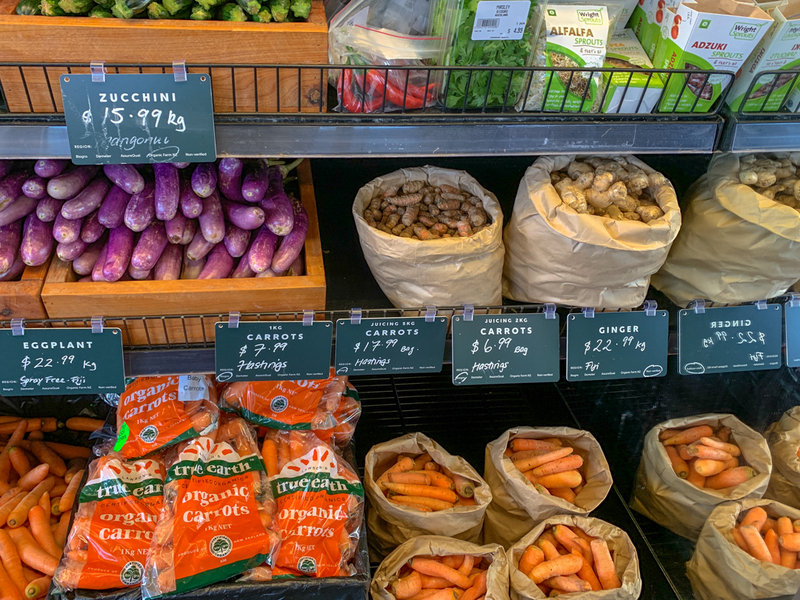 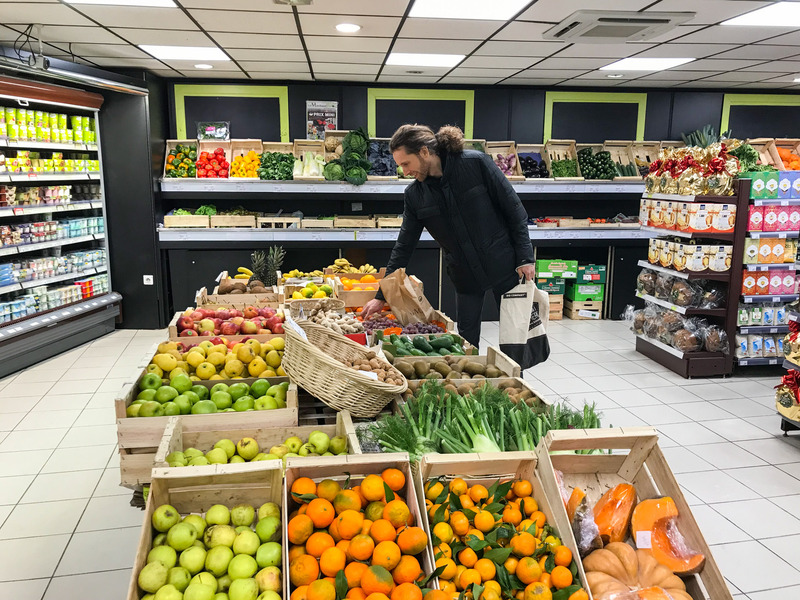 A small shop with some organic produce, pretty close to the zero waste store. 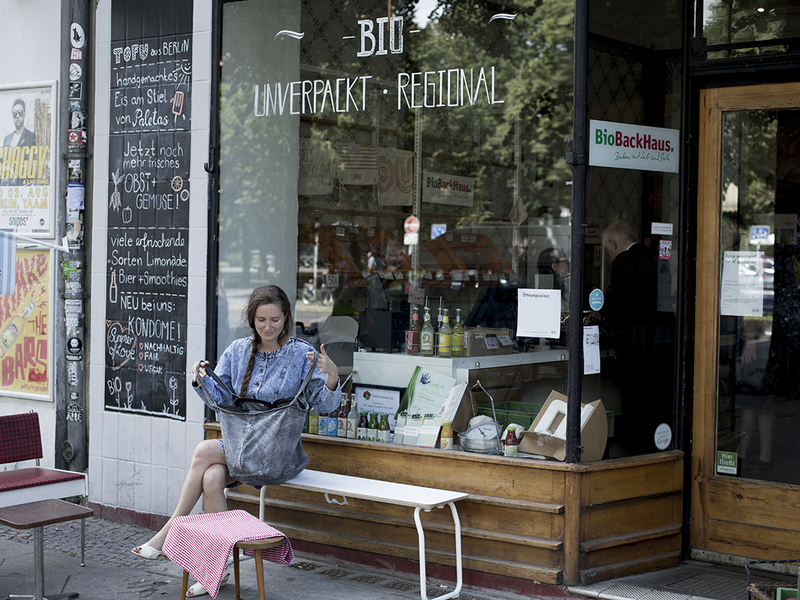 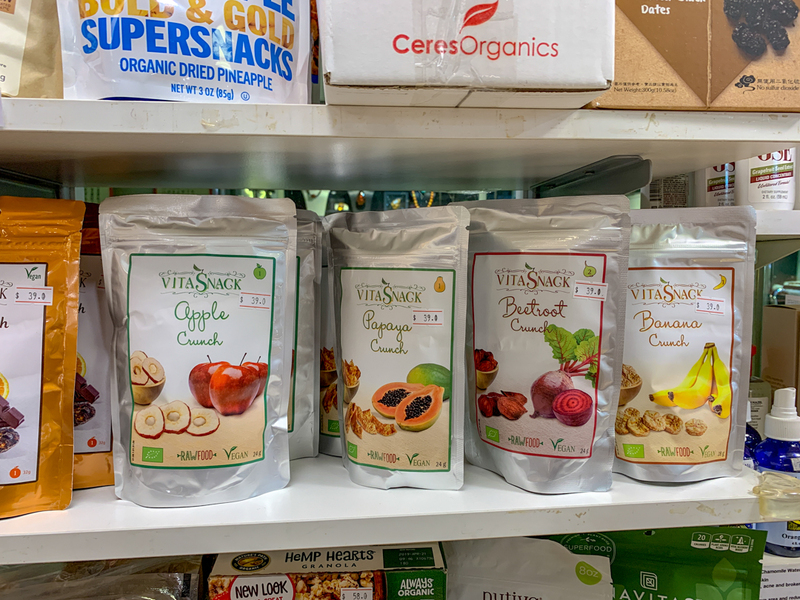 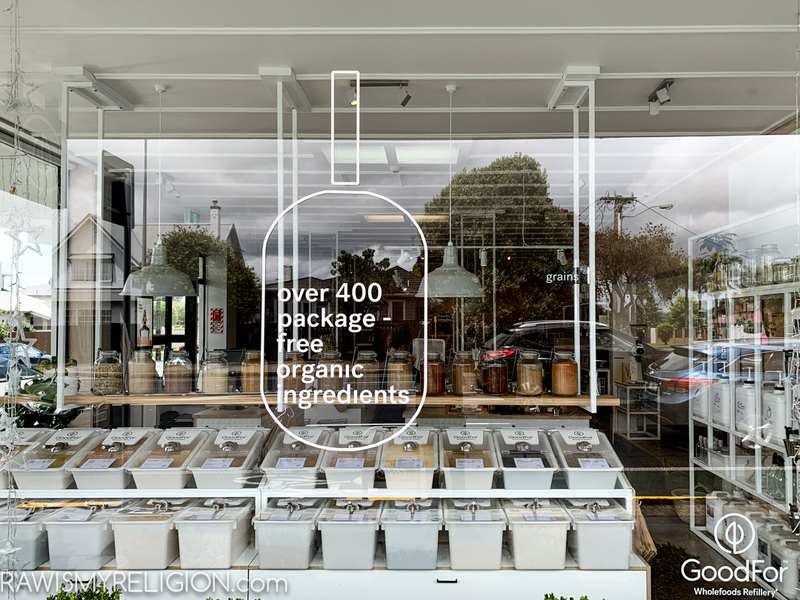 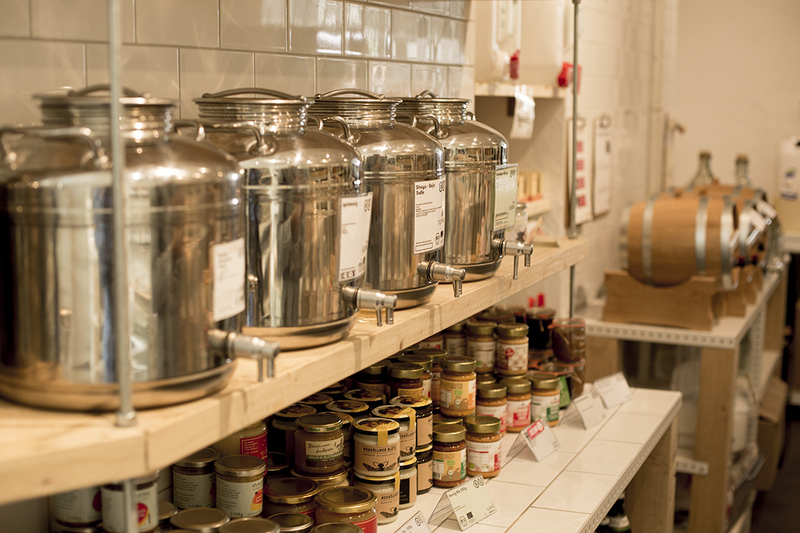 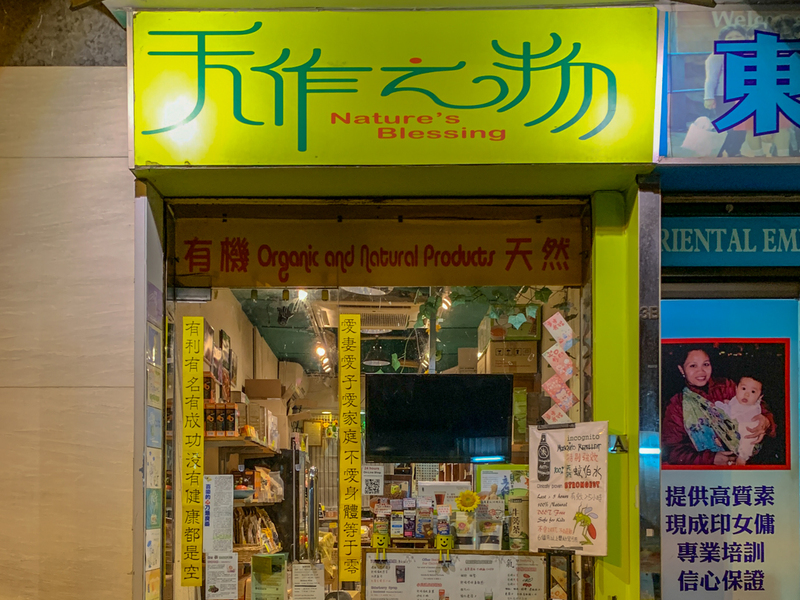 Small bulk store with organic products. 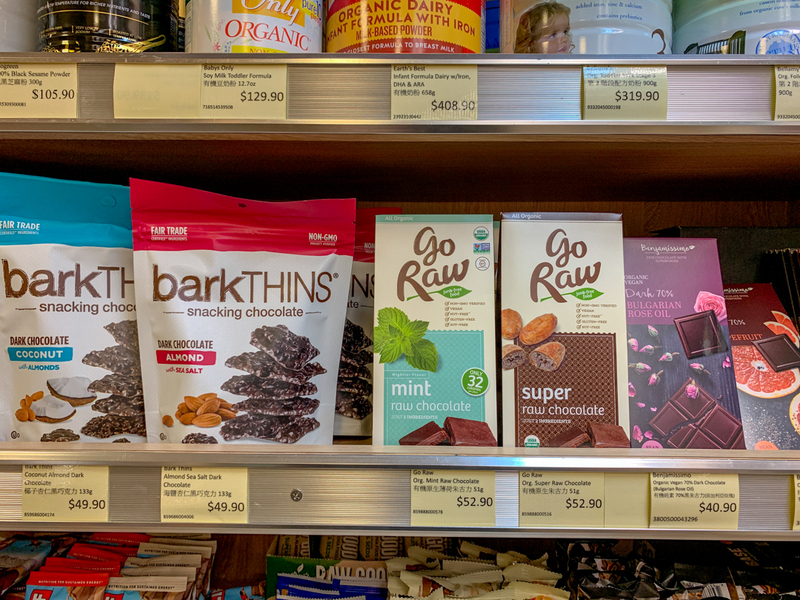 Nuts, fruit, organic chocolate. 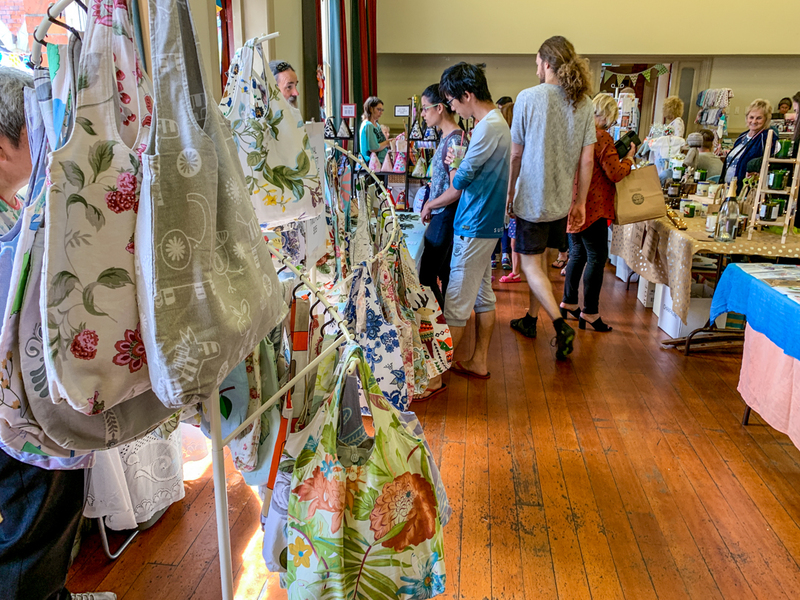 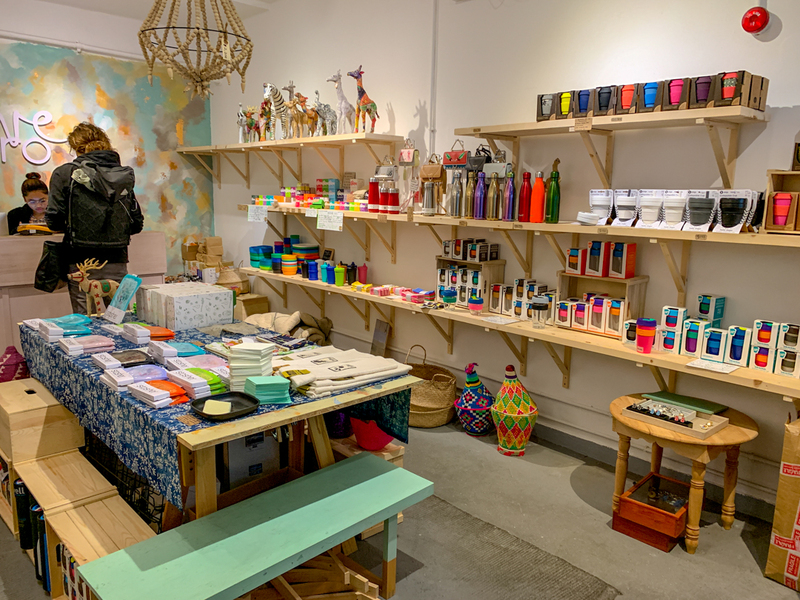 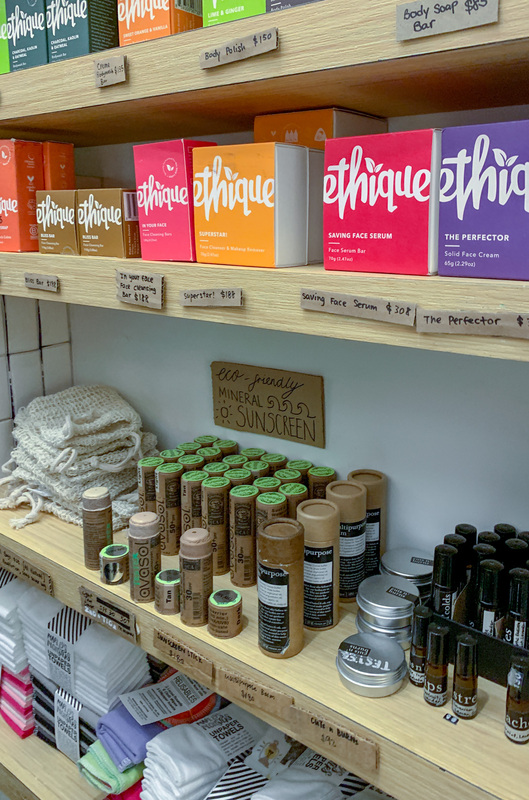 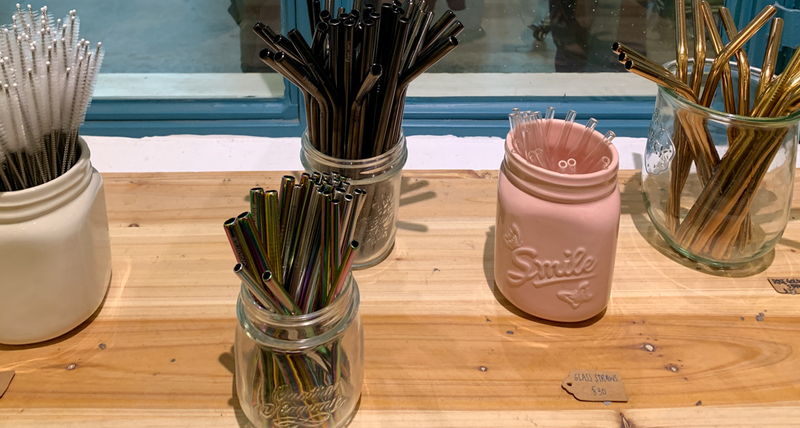 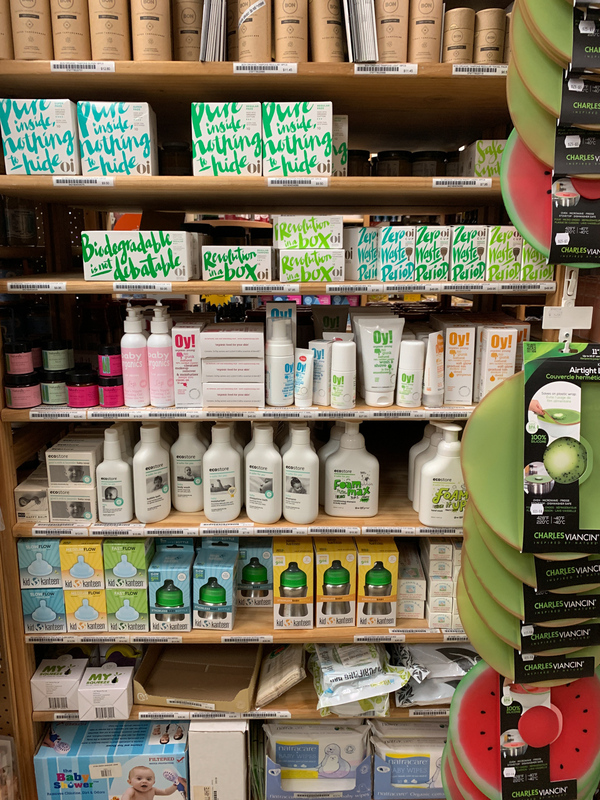 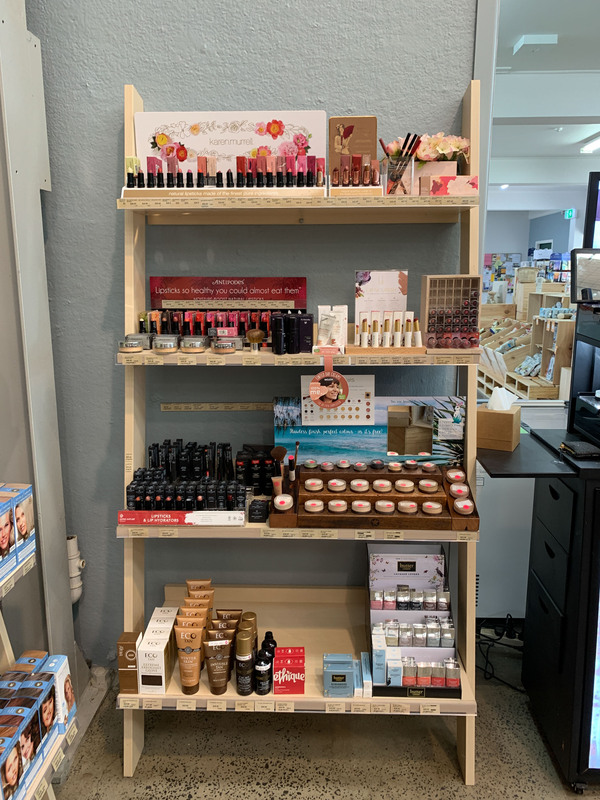 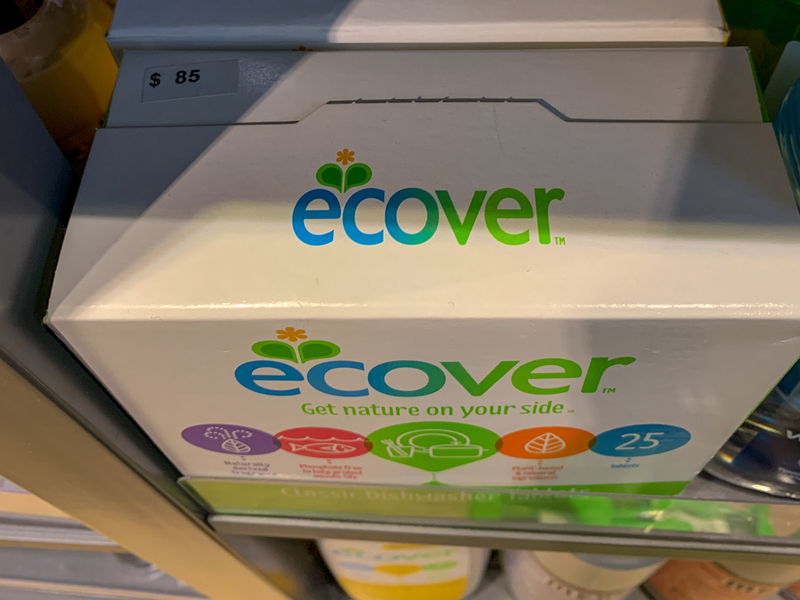 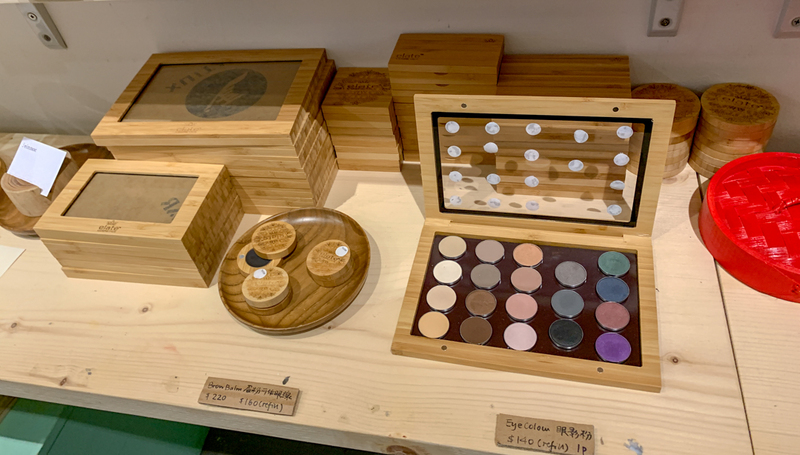 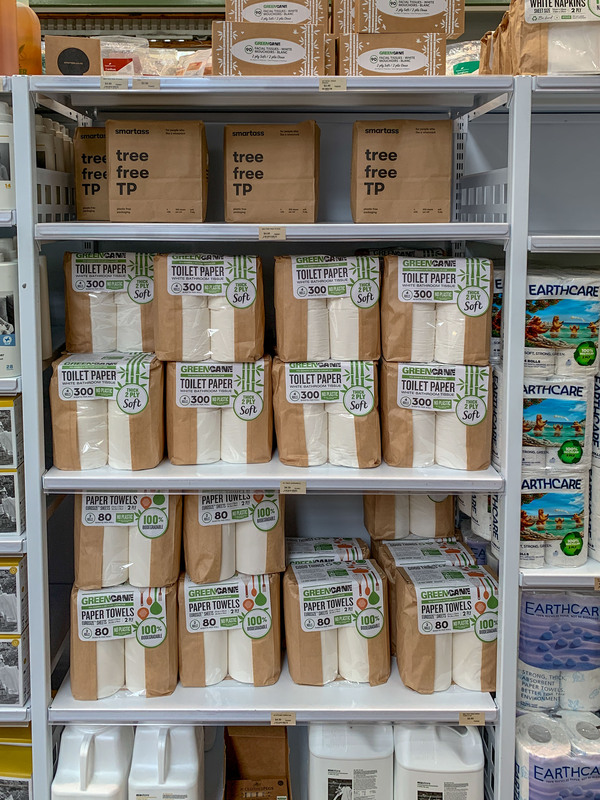 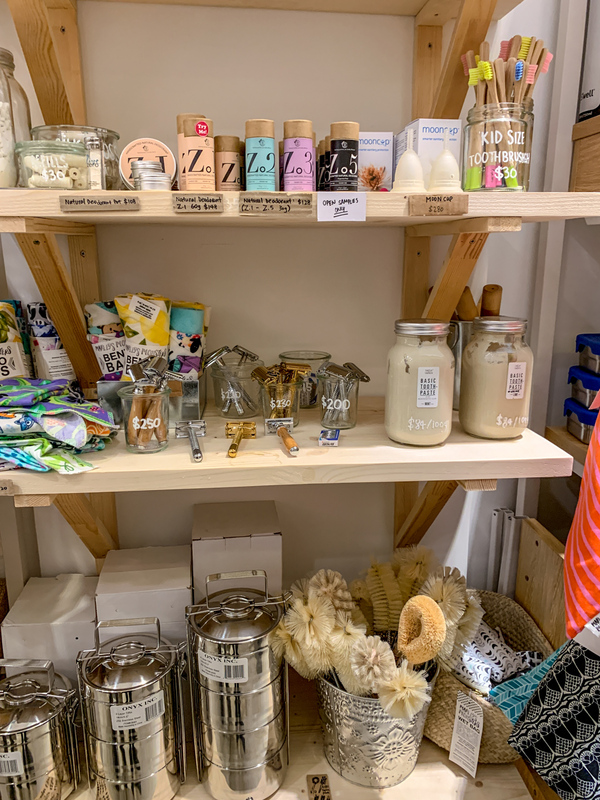 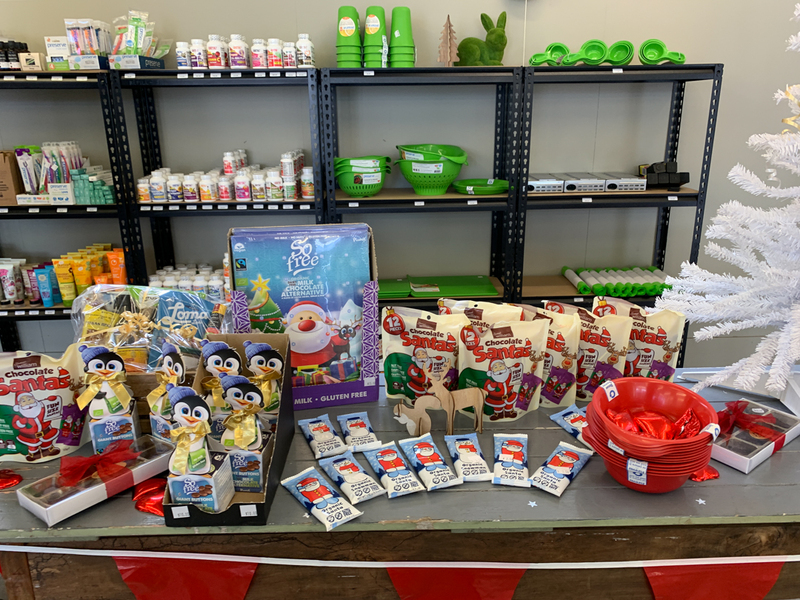 Natural detergent, cosmetics, reusable straws, and containers. 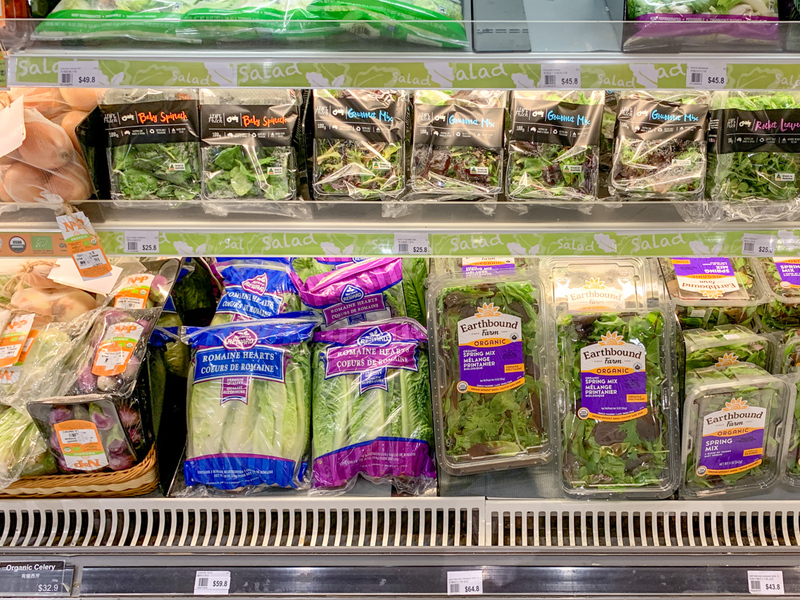 There is a fridge with organic greens. 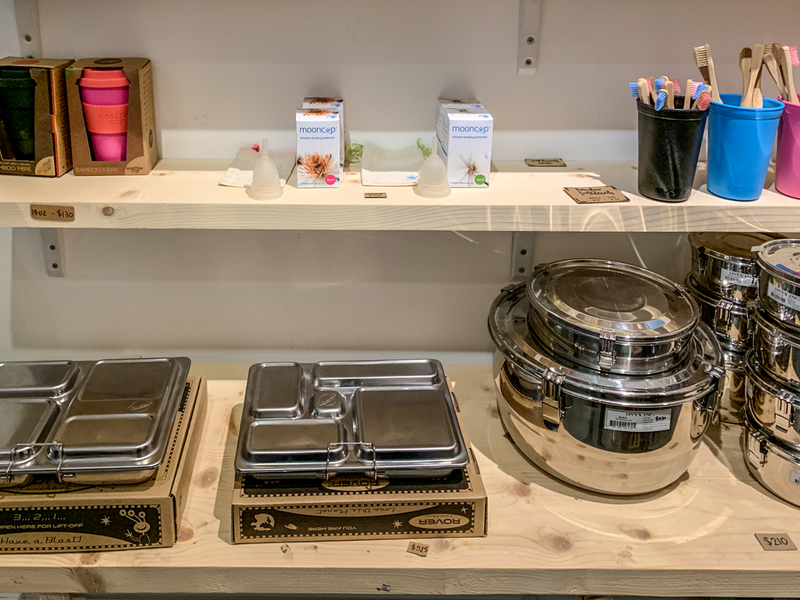 Awesome, beautiful stainless steel containers, perfect as a bigger bento box. 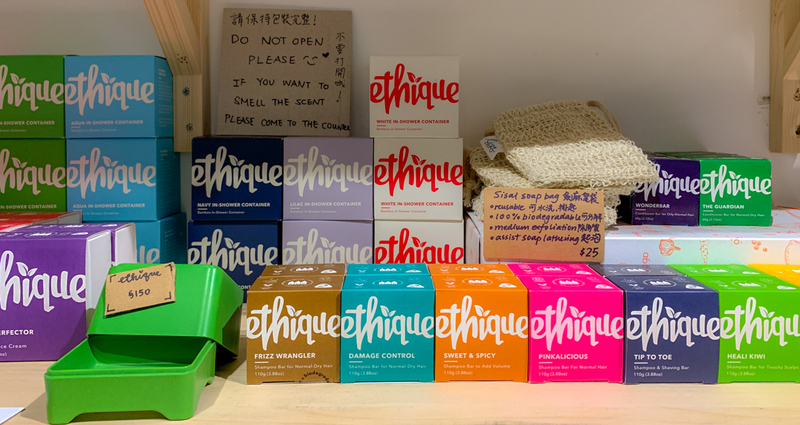 Menstrual cups, a super useful and zero waste menstrual care product. 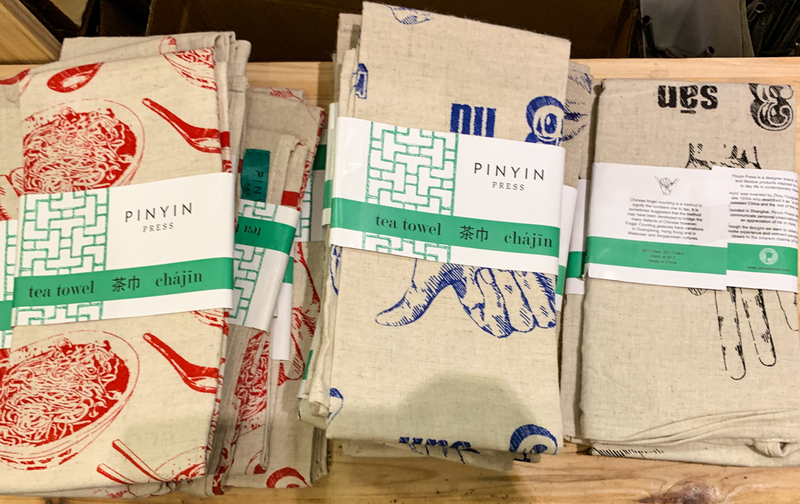 Beautiful kitchen towels. 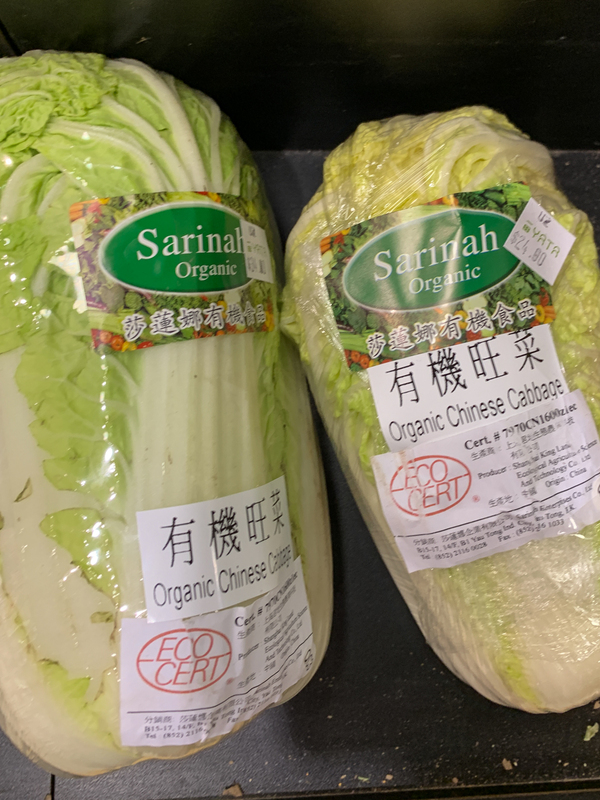 We picked up the one on the right. 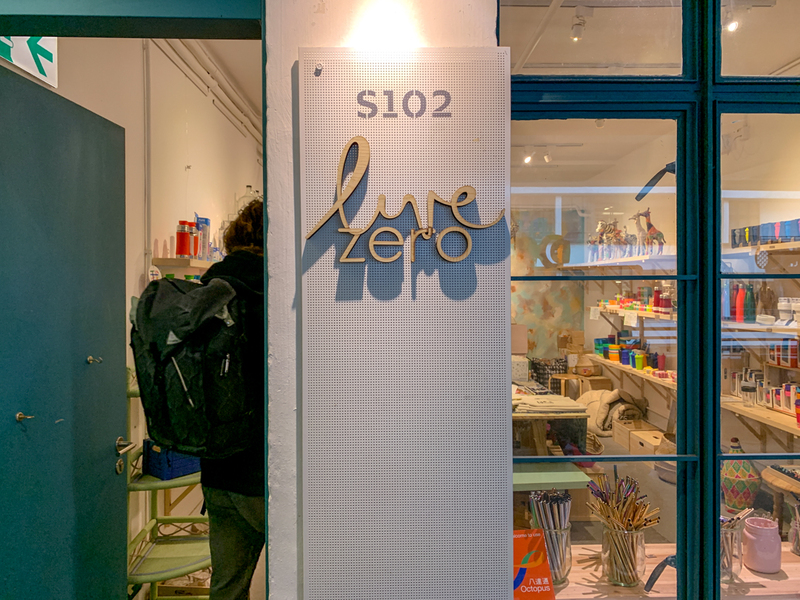 The Live Zero shop is on the second floor. 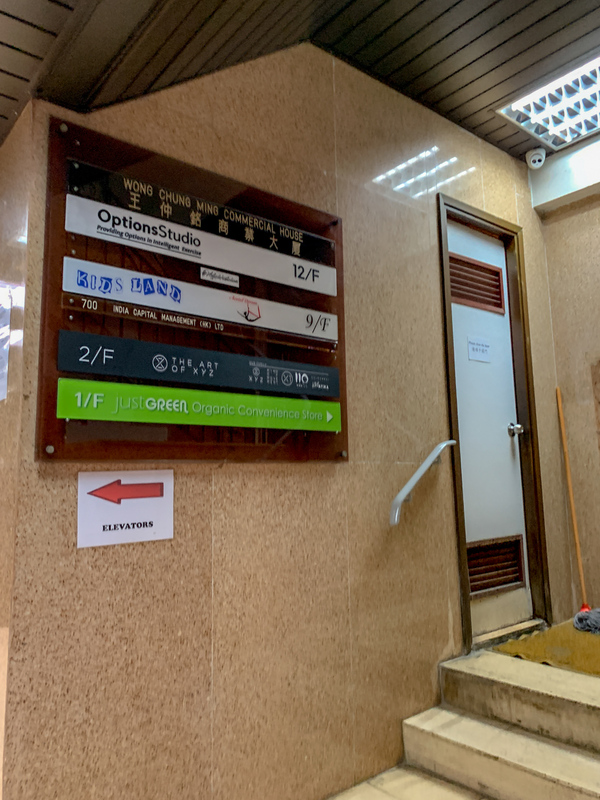 If you have troubles finding it, ask the friendly guards at the information desk. 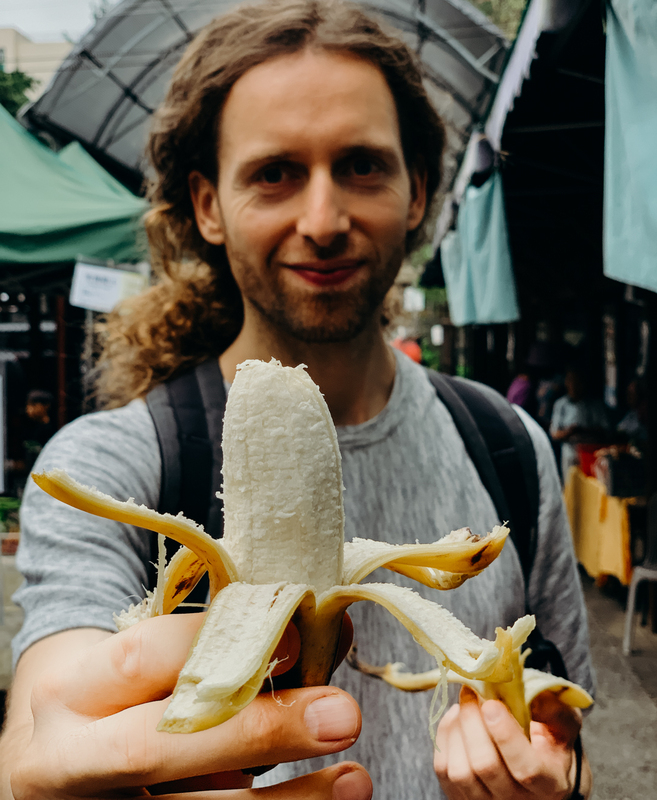 Organic bananas are the cheapest here. 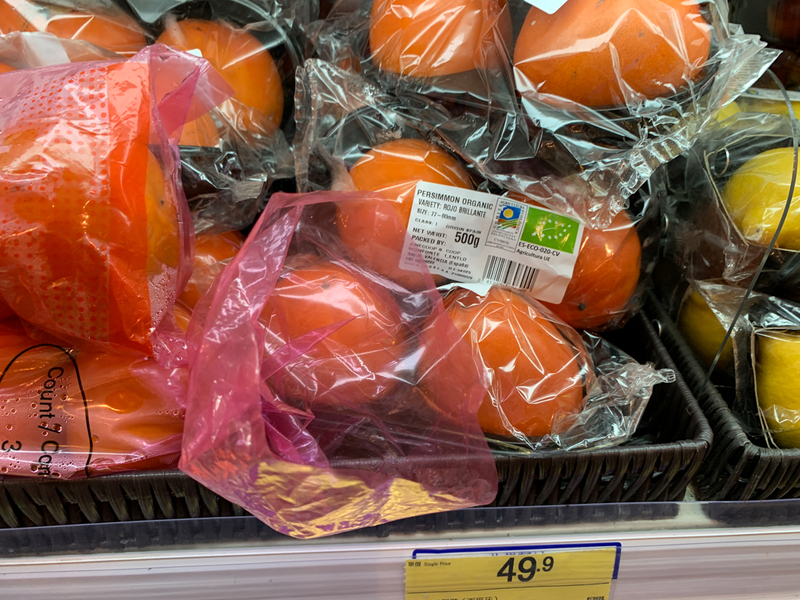 Wish they were not packaged in plastic. 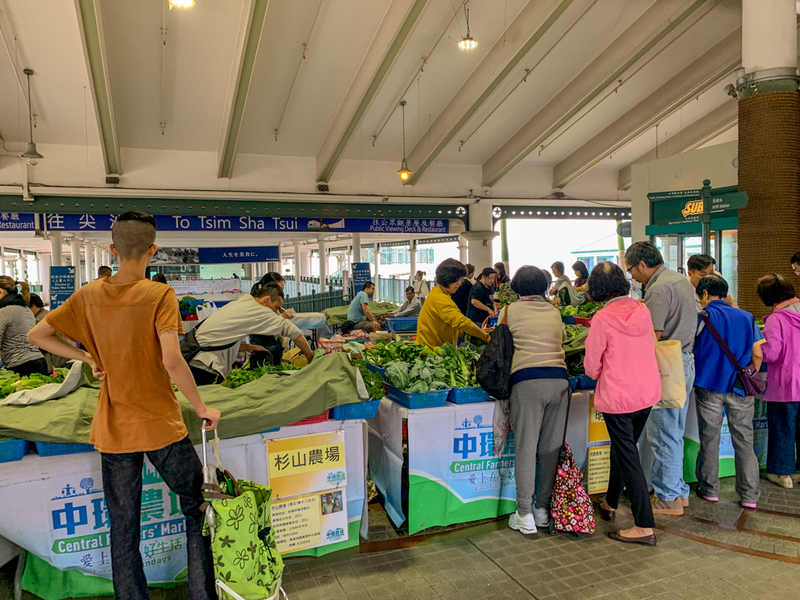 This farmers’ market is awesome and super central on the Hong Kong island on pier 7. 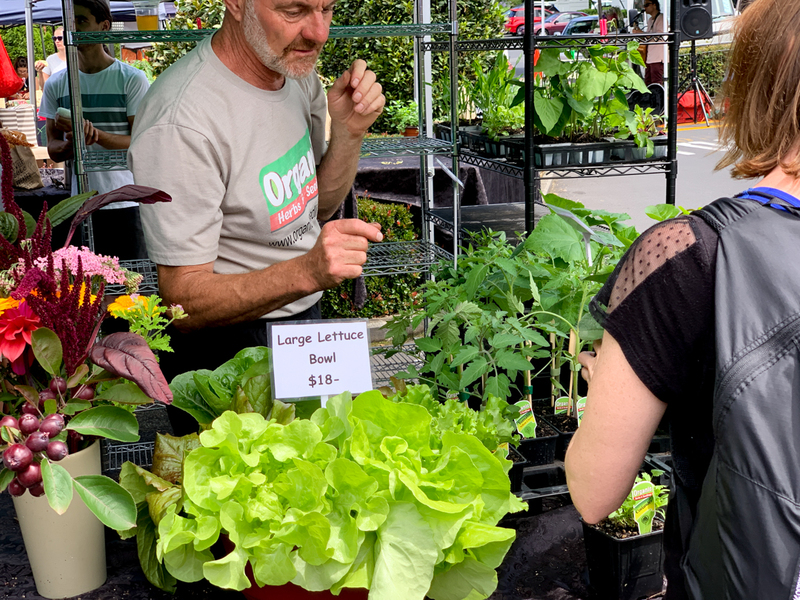 All the produce is organic and the vendors super nice. 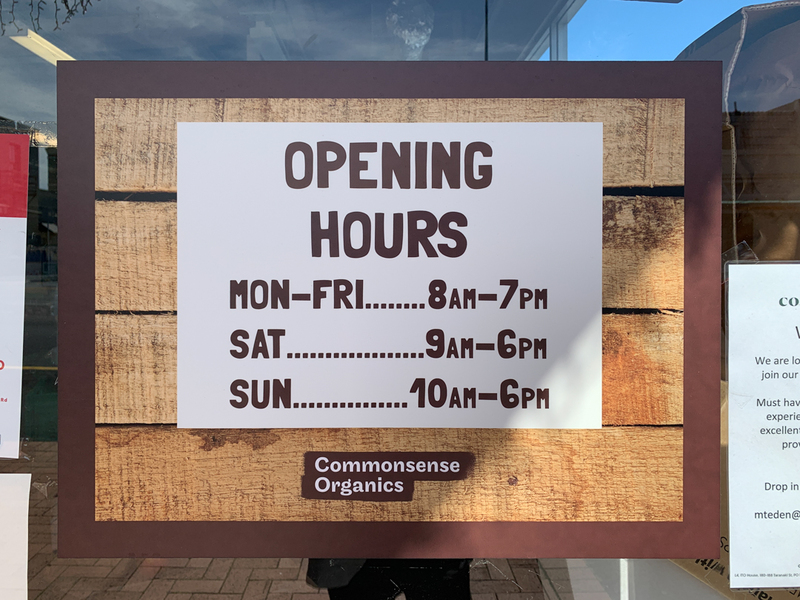 The vibe is a little tense, the pace is fast. 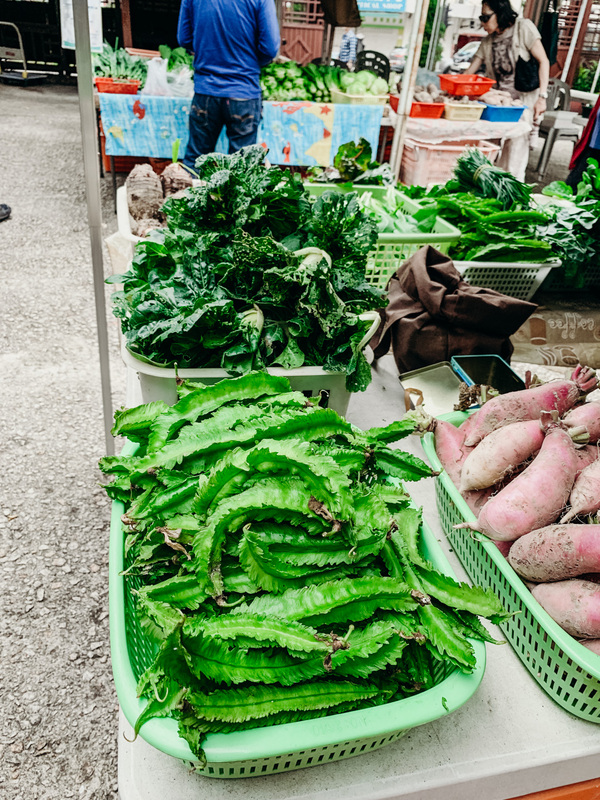 The vendors don’t bring a lot of produce and the best stuff goes fast, be there 10:45 to get all you need. 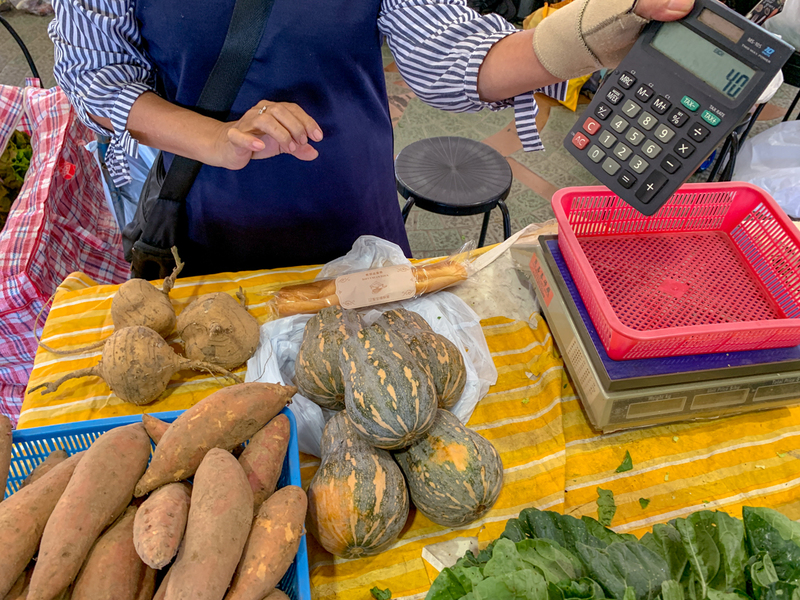 Bring cash, small banknotes are better, vendors might not have change. 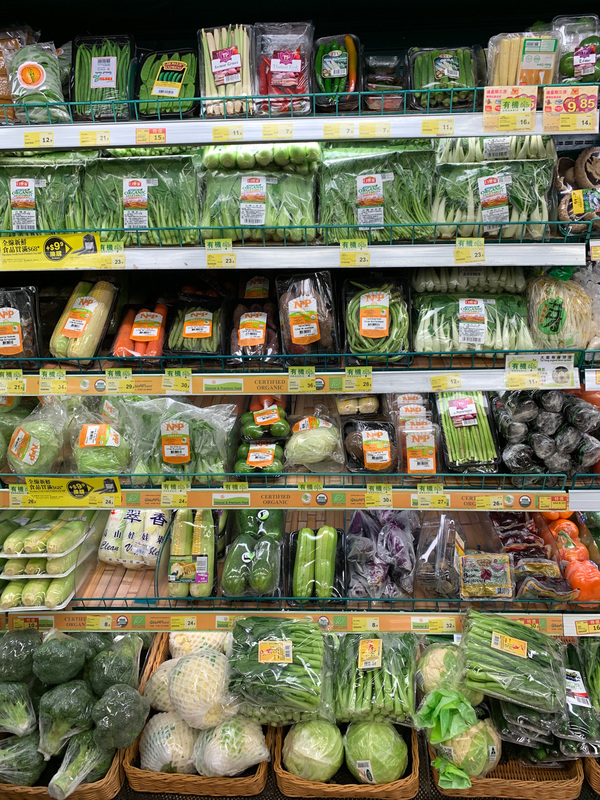 Shortly before 11 the veggies are all covered. 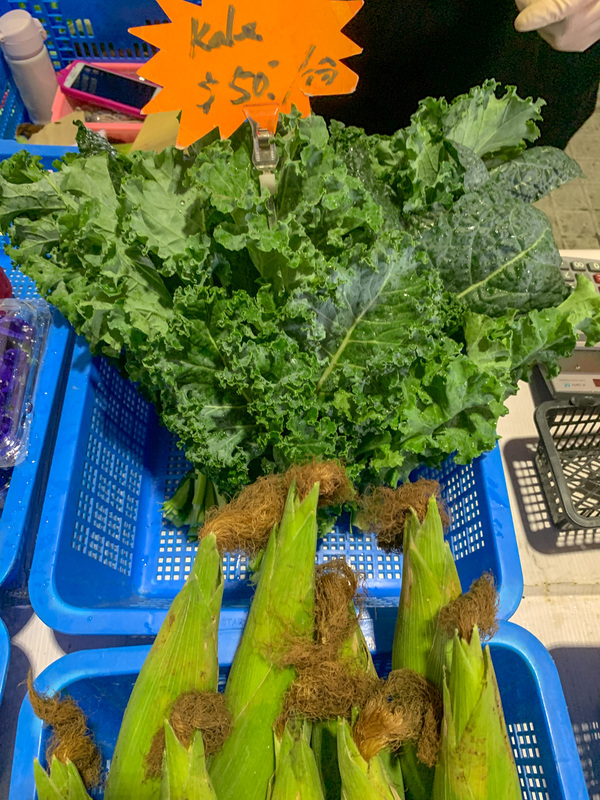 Vendors are packing basket for the pre-orders. 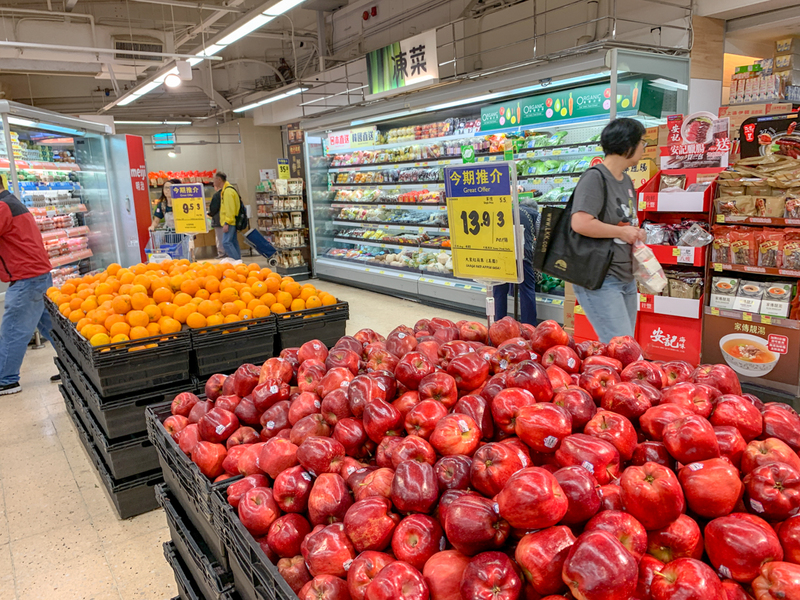 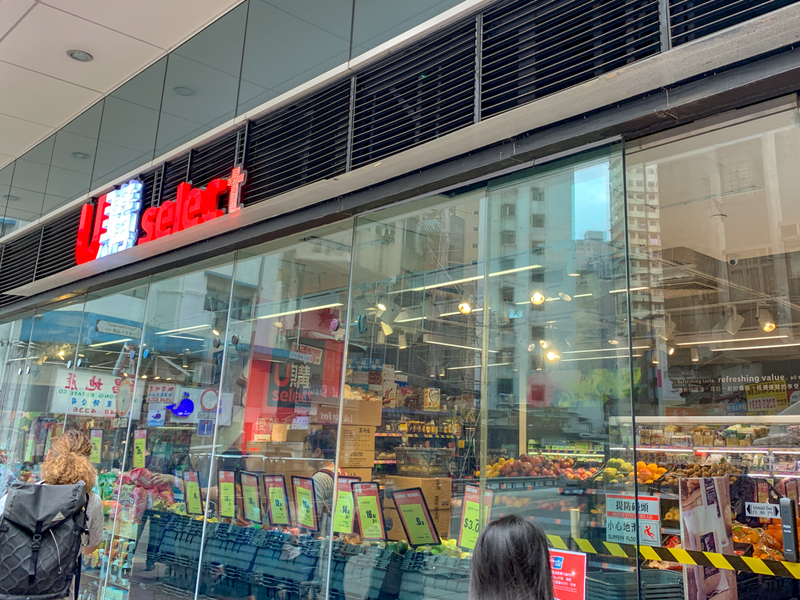 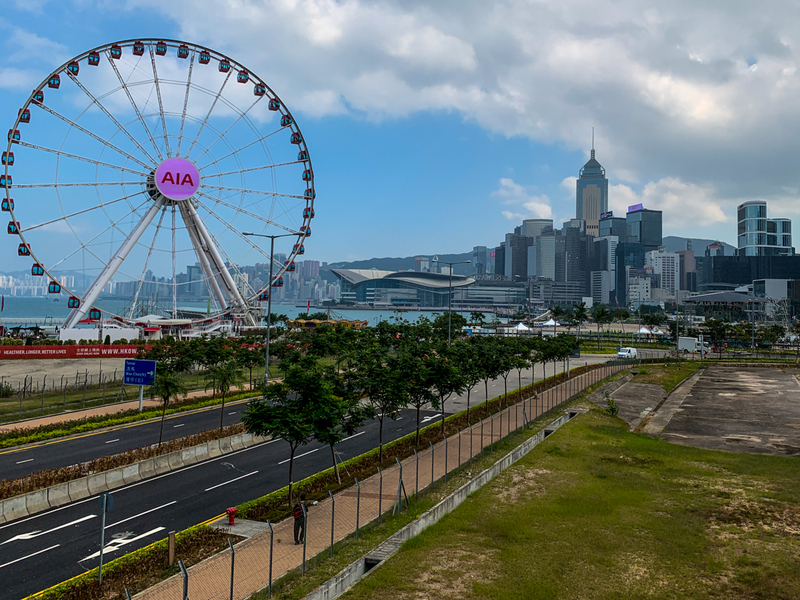 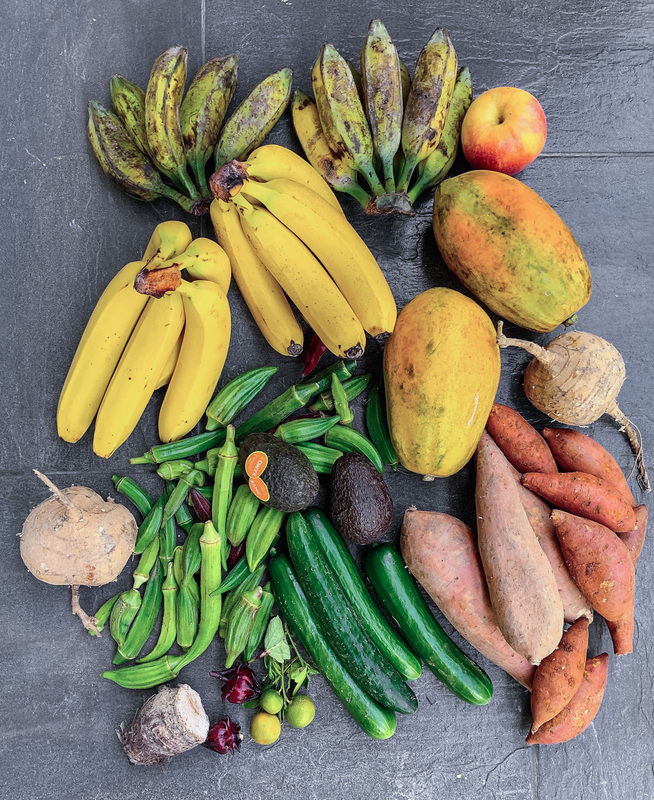 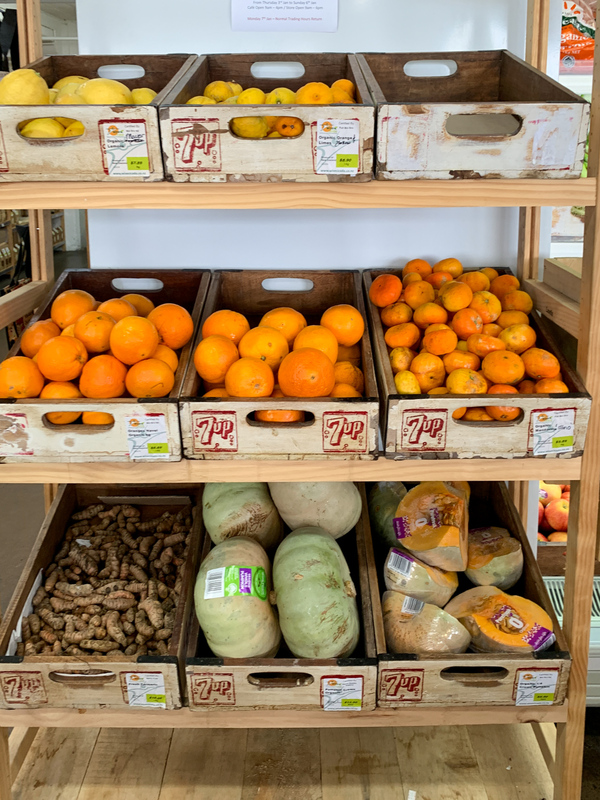 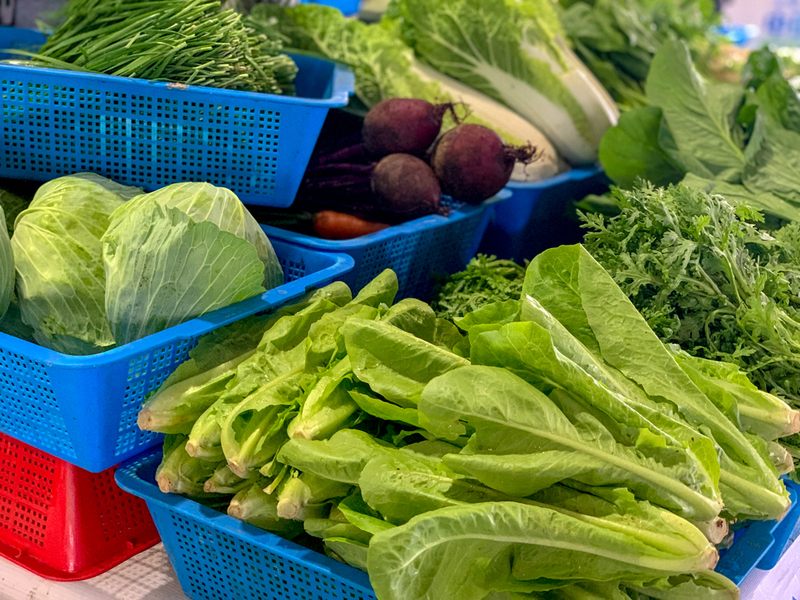 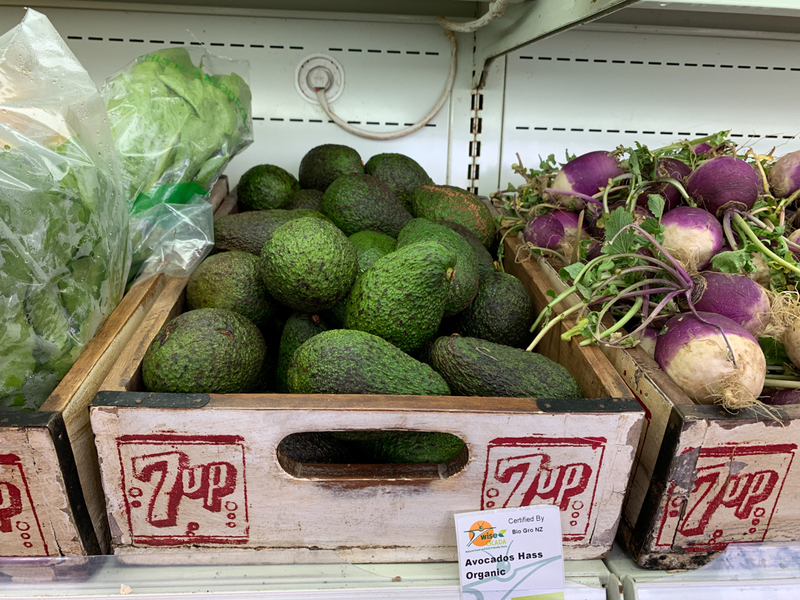 If you live in Hong Kong and going to get your produce regularly here, pre-order with the vendors to get the best produce. 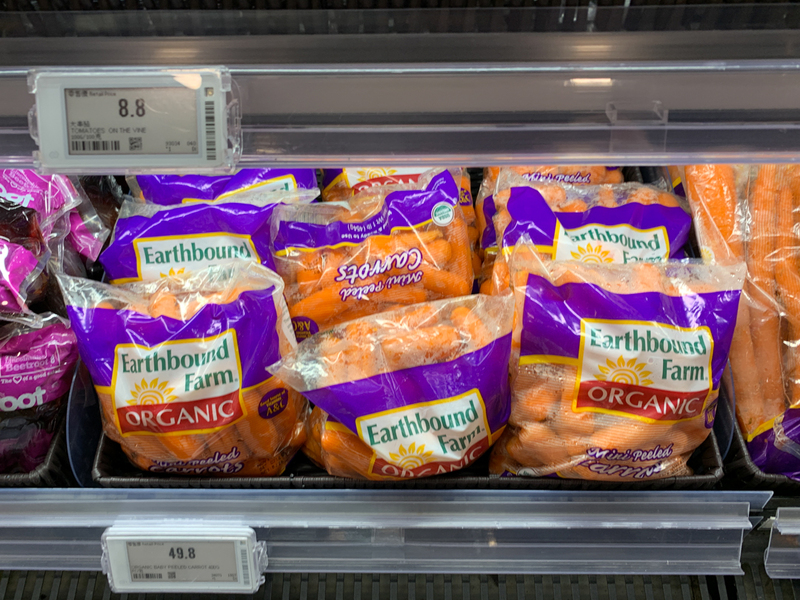 Organic carrots, Stefan’s fav veggie. 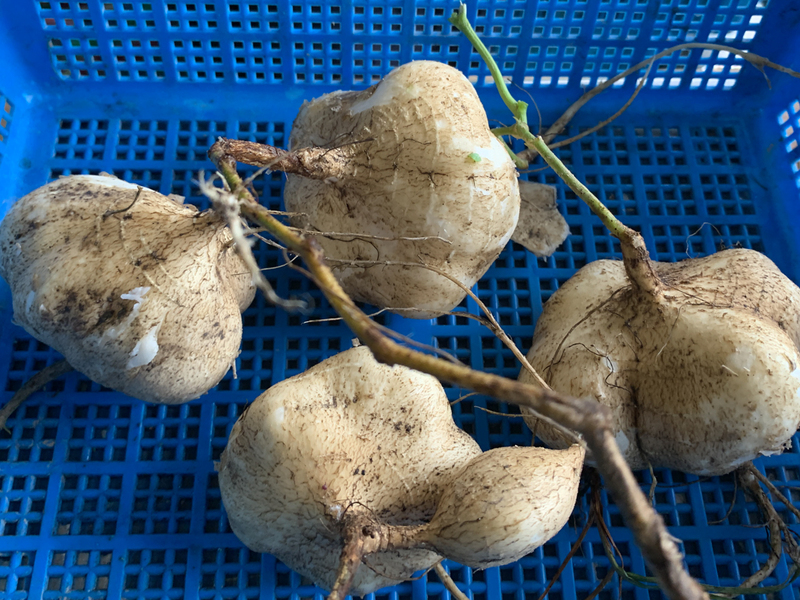 Organic jicama, we payed 48 HKD for these. 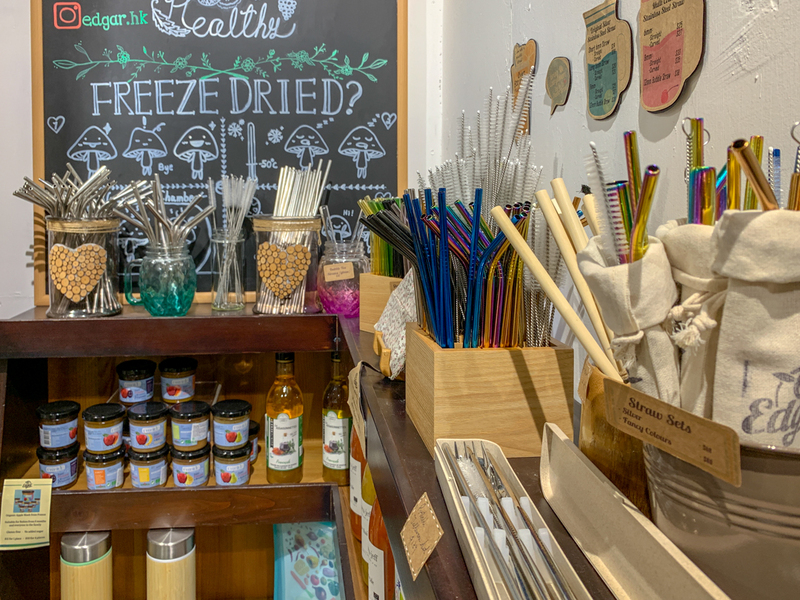 Colorful flowers as coloring for tea and desserts. 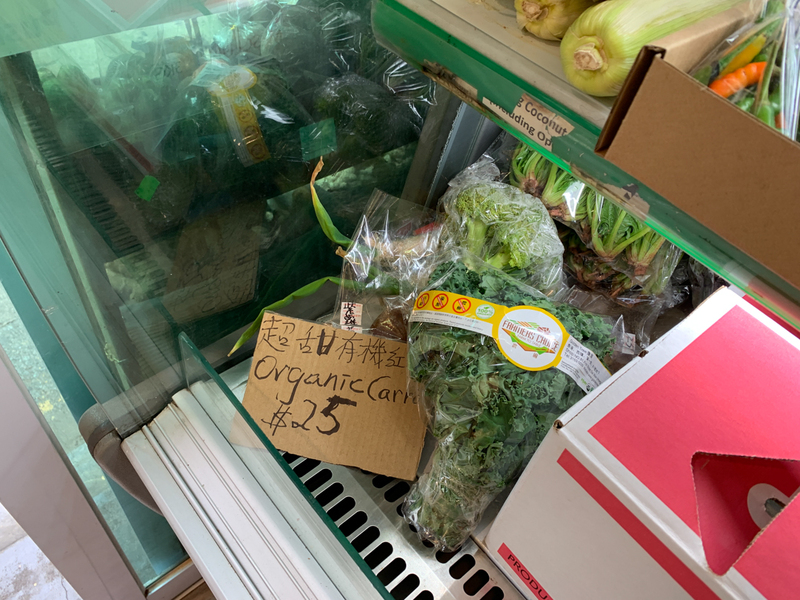 Organic kale, we payed 50 HKD for a pretty small bunch. 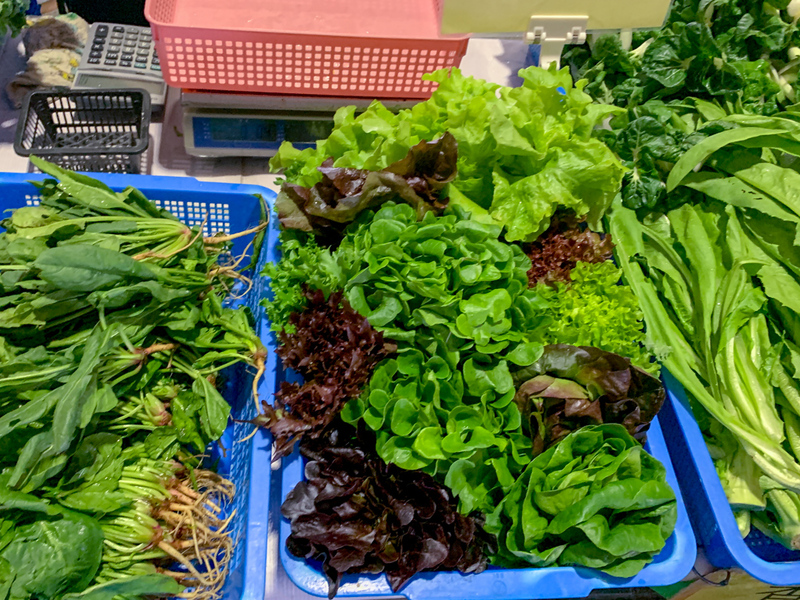 More organic greens, lettuce, radishes. 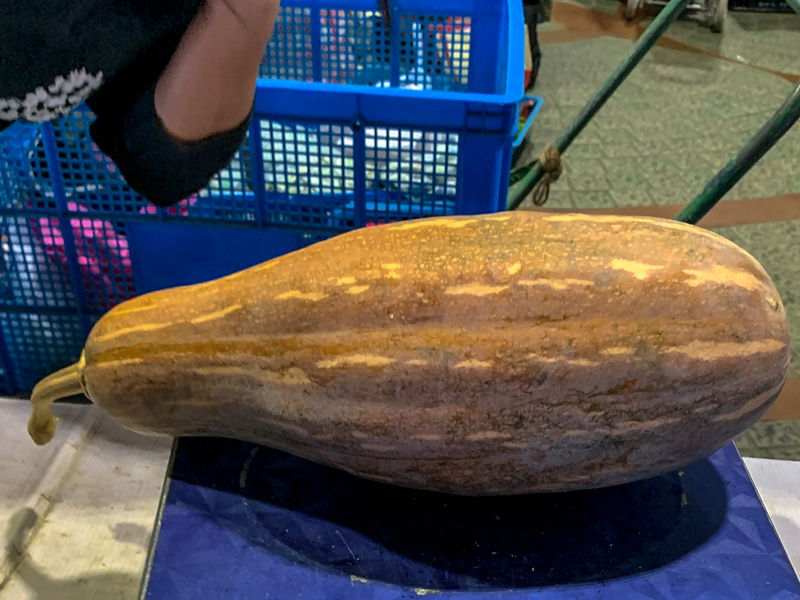 The pumpkin was 180 HKD, we didn’t get it. 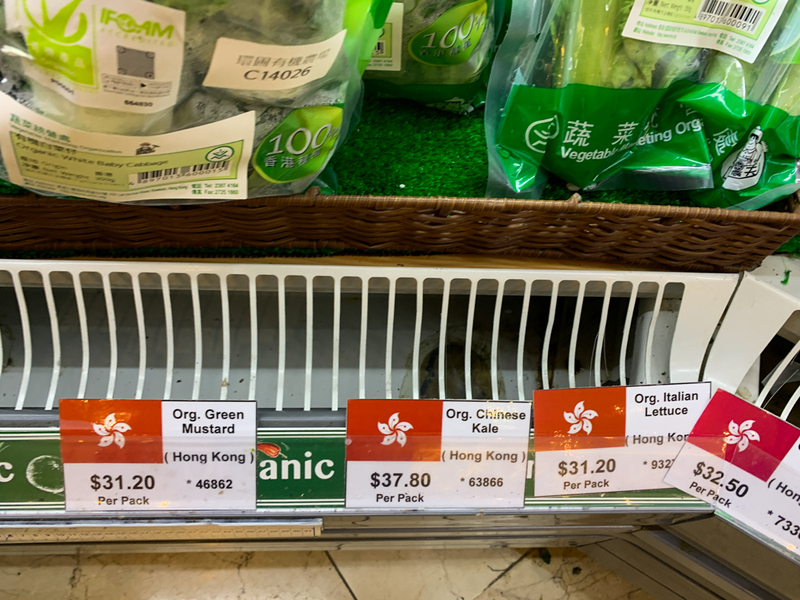 Kale (organic) on the left was 40 HKD, the organic cabbage 28 HKD. 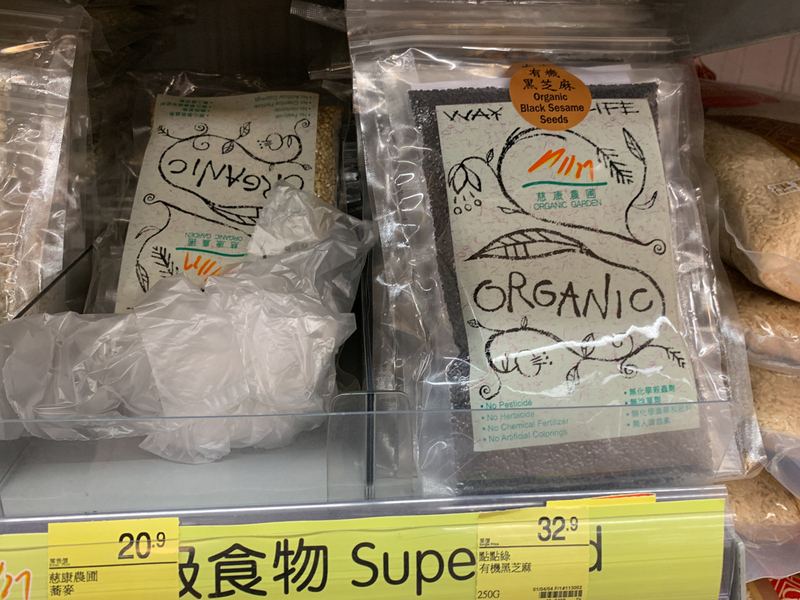 Organic bananas were 118 HKD. 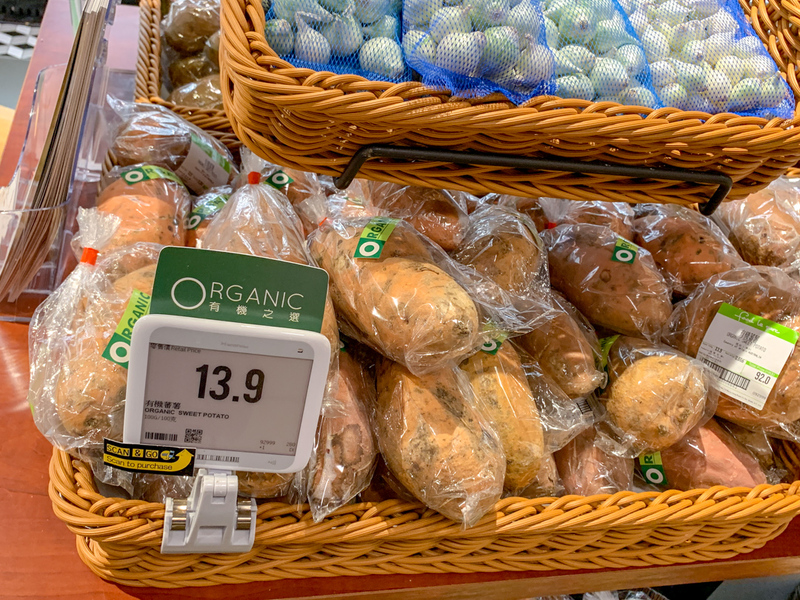 The organic sweet potatoes were 31 HKD. 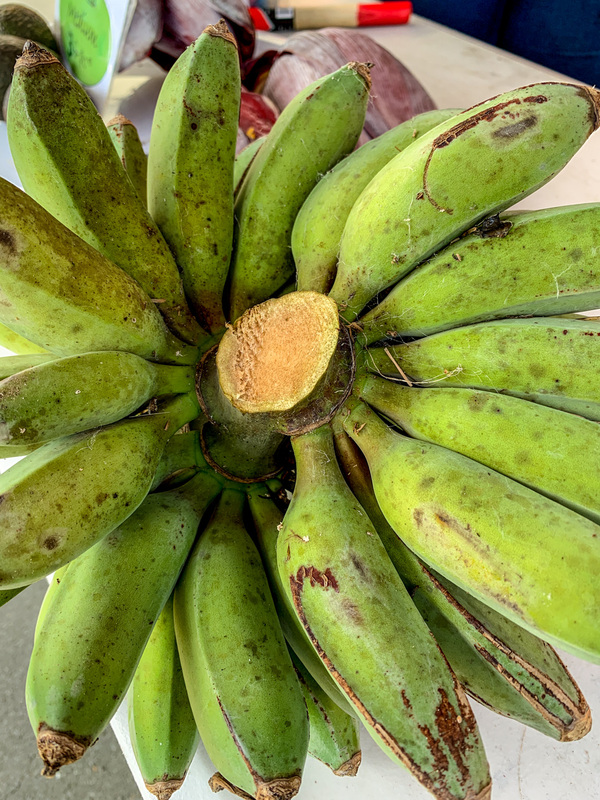 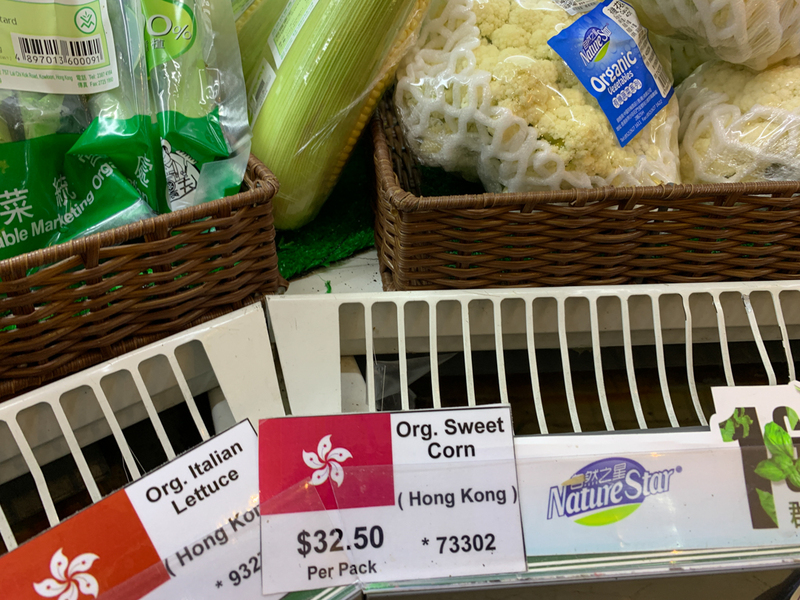 The organic green bananas were 53 HKD. 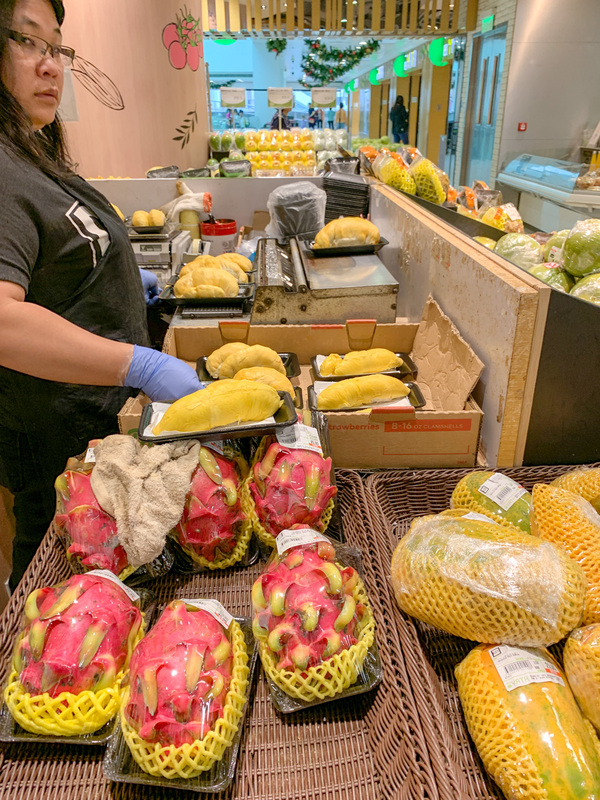 Organic dragon fruit was 158 HKD. 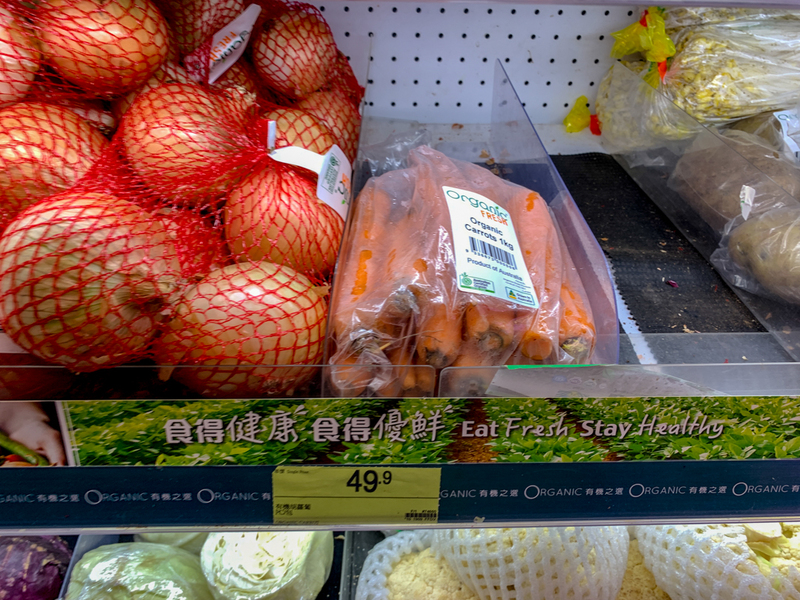 Definitely not the best place to look for organic produce, but they have some. 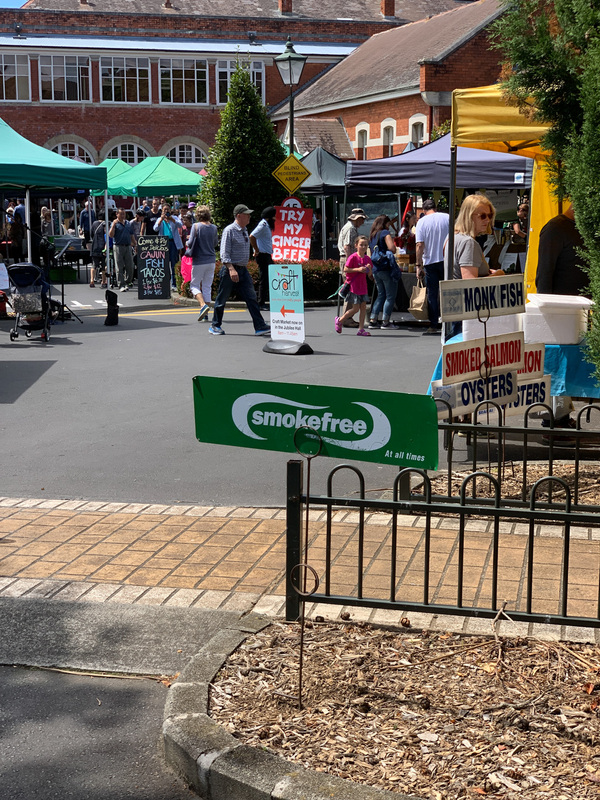 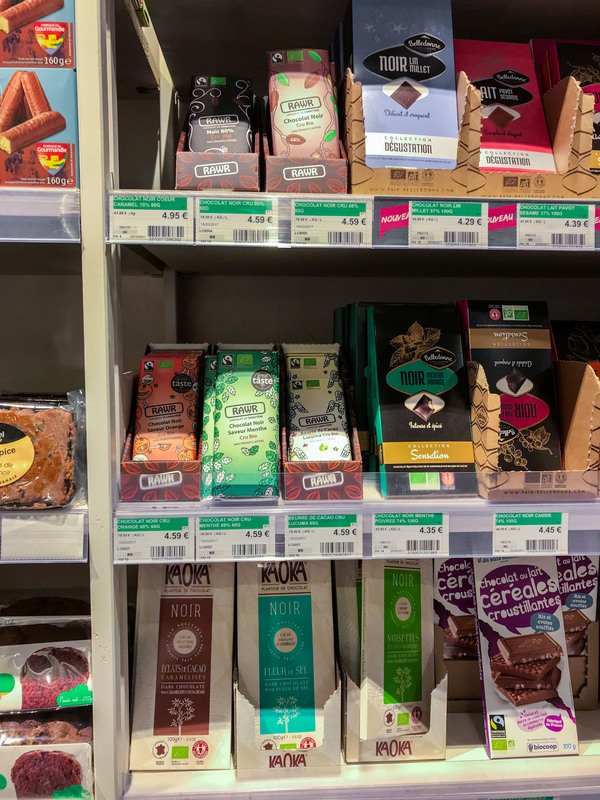 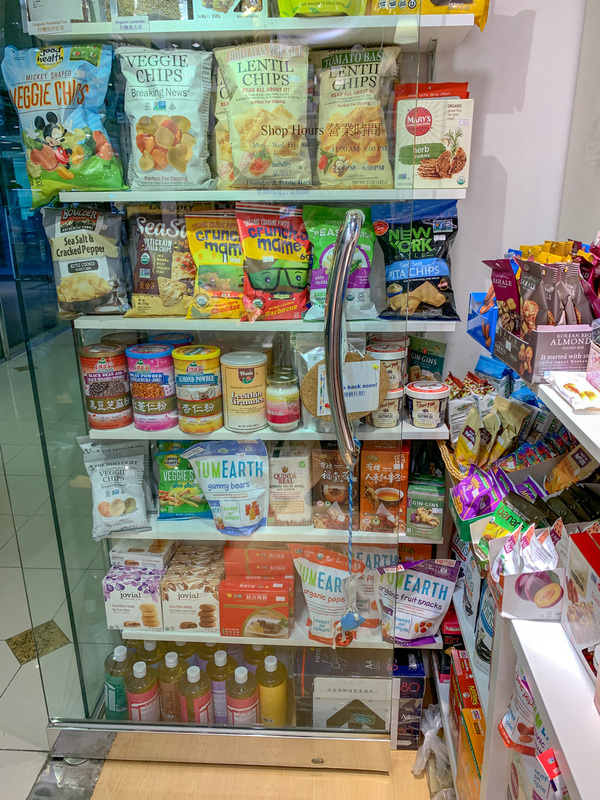 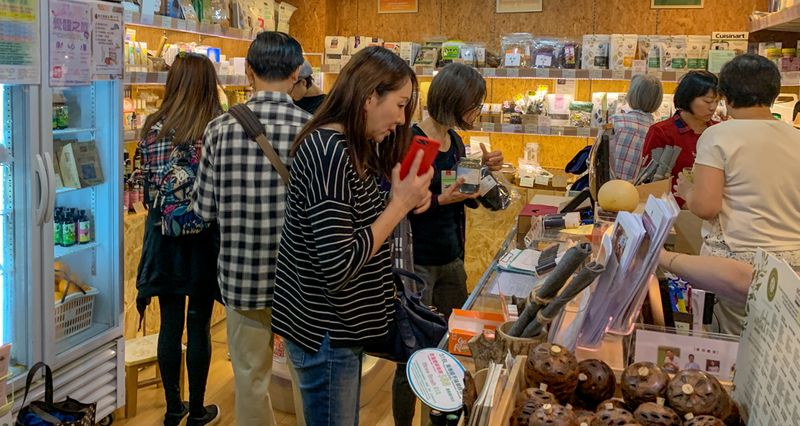 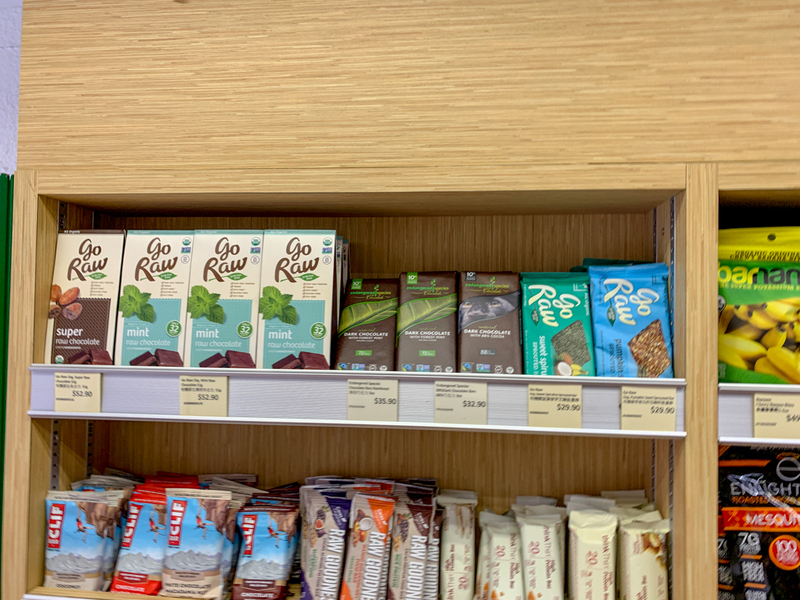 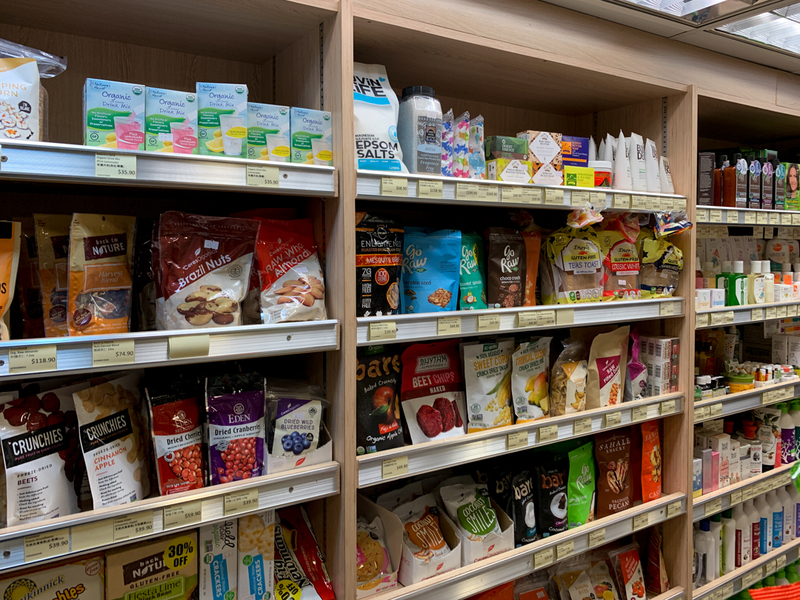 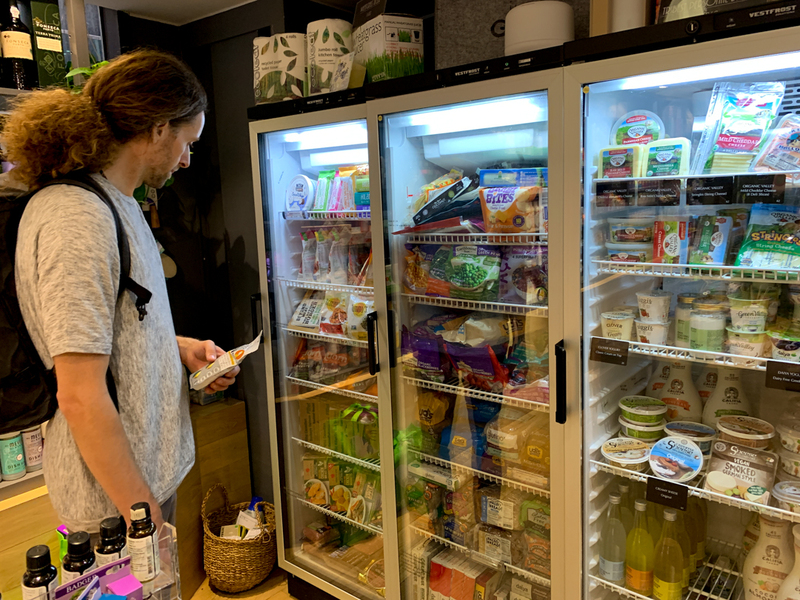 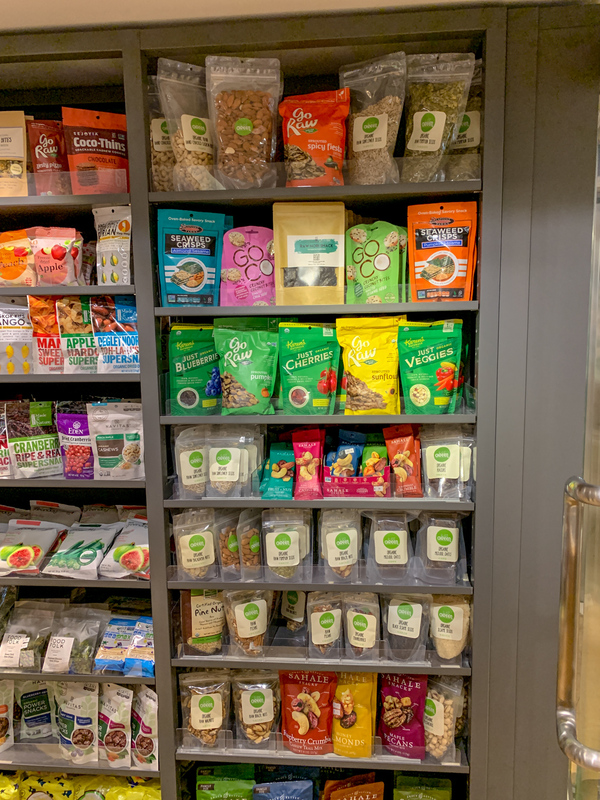 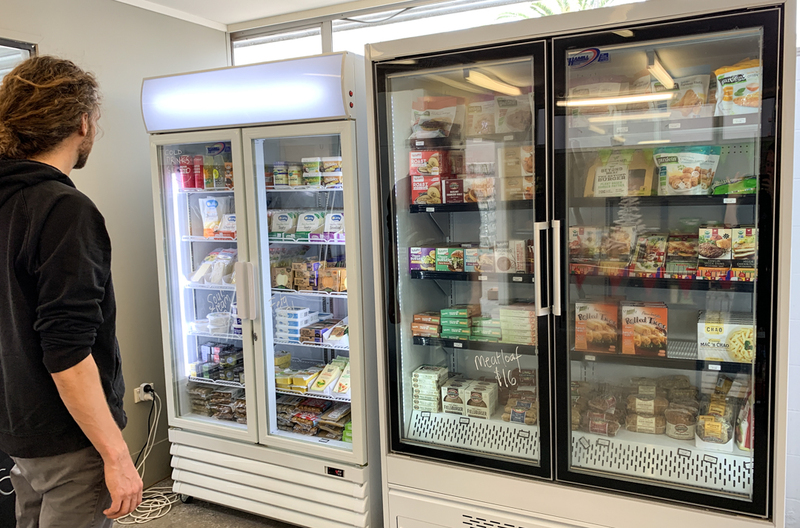 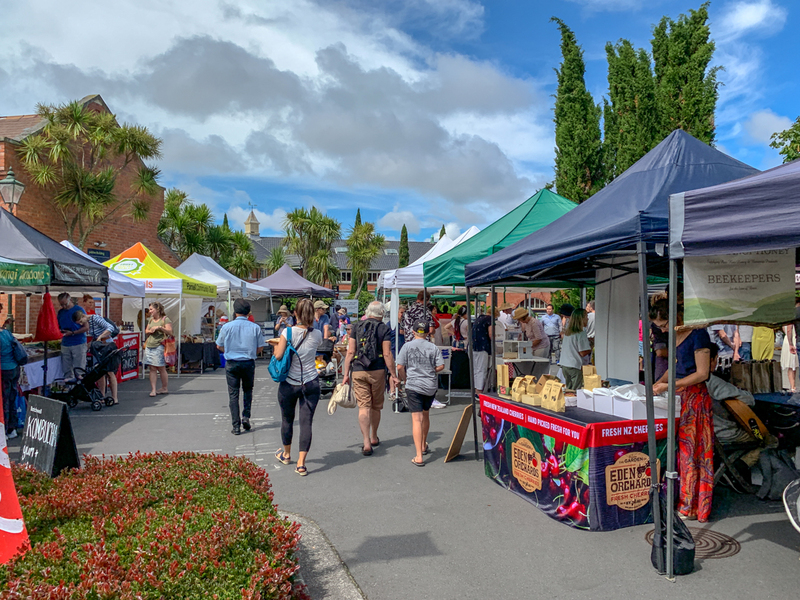 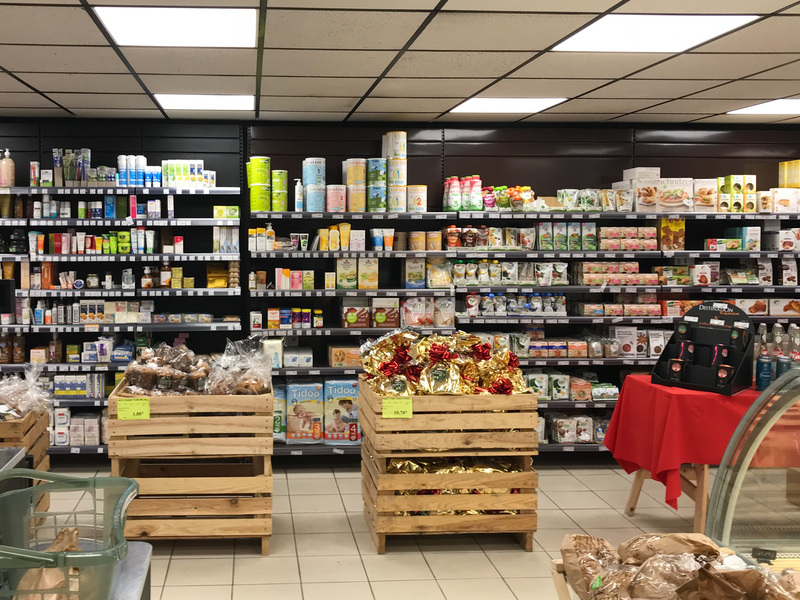 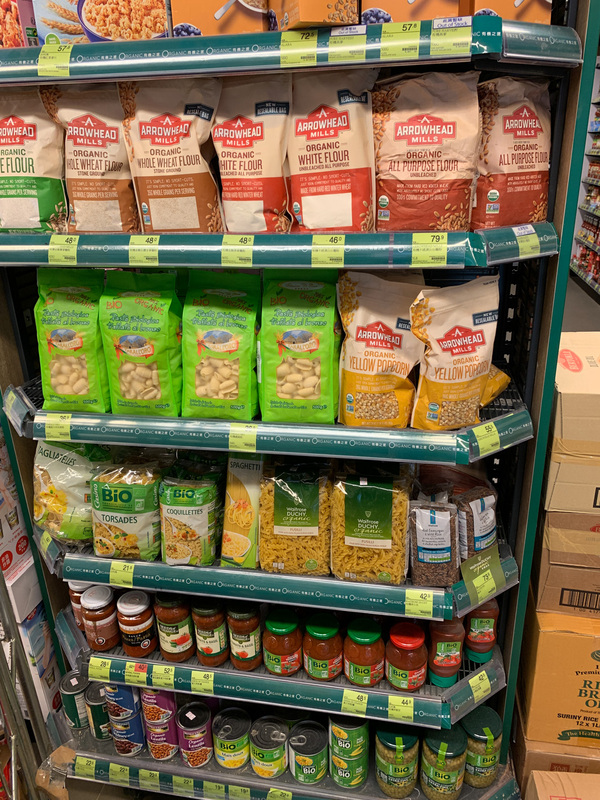 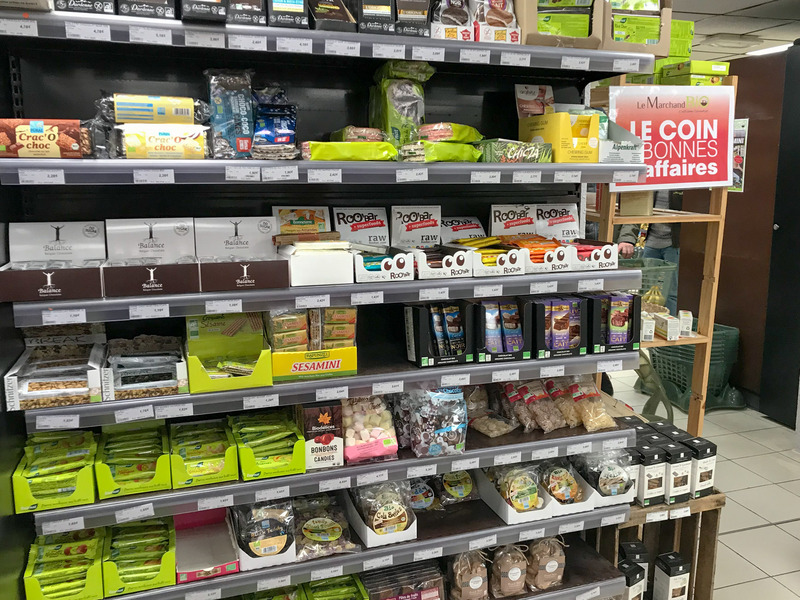 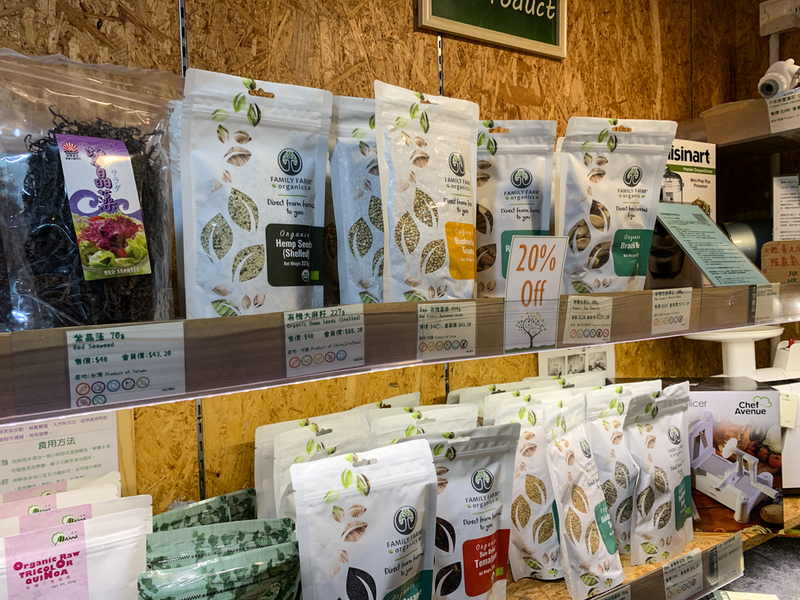 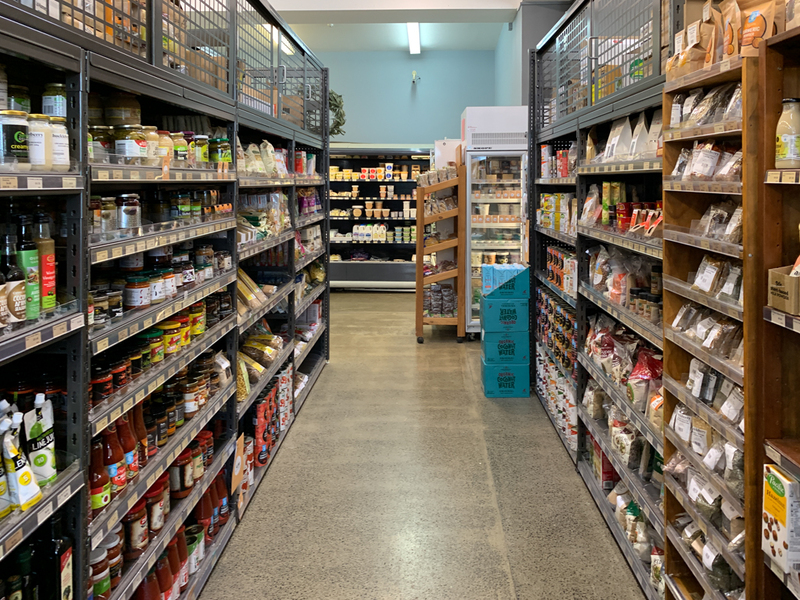 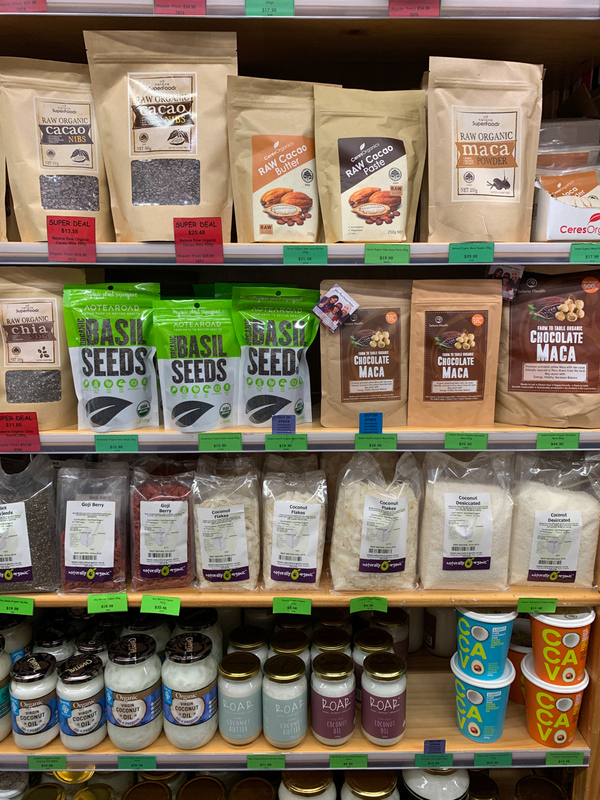 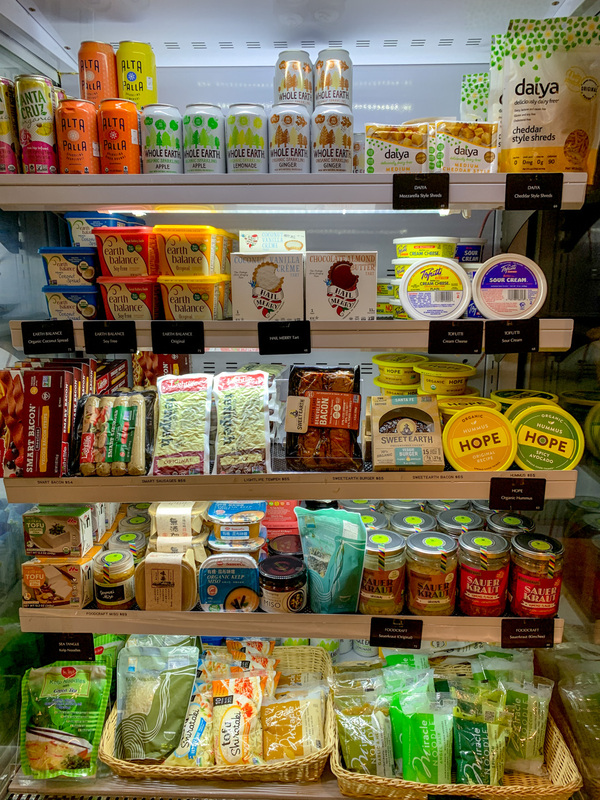 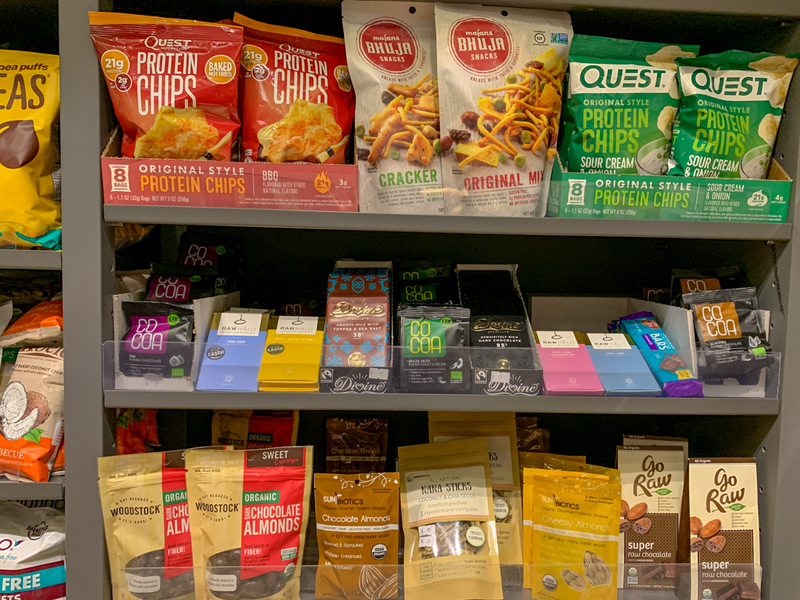 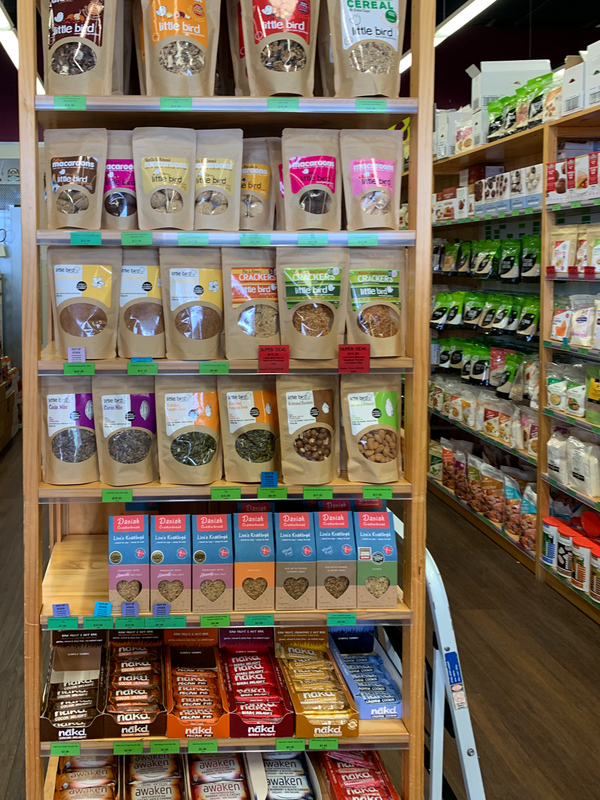 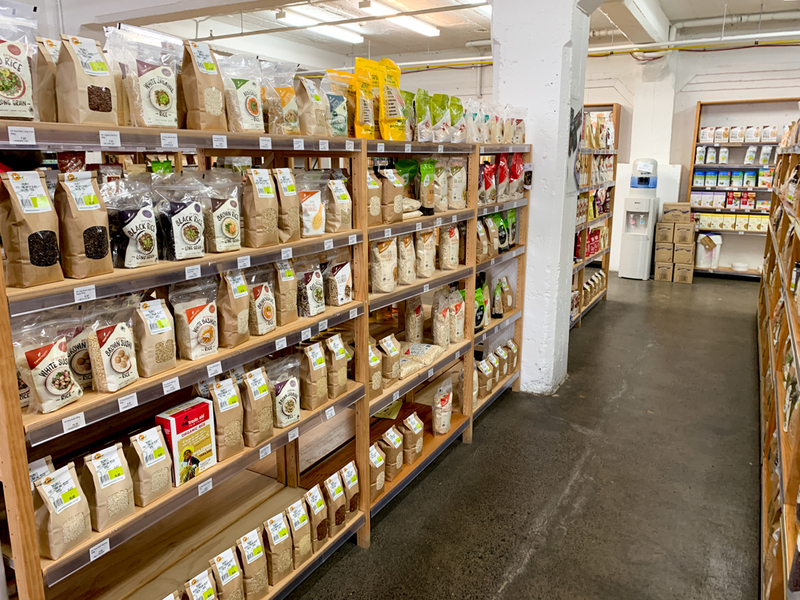 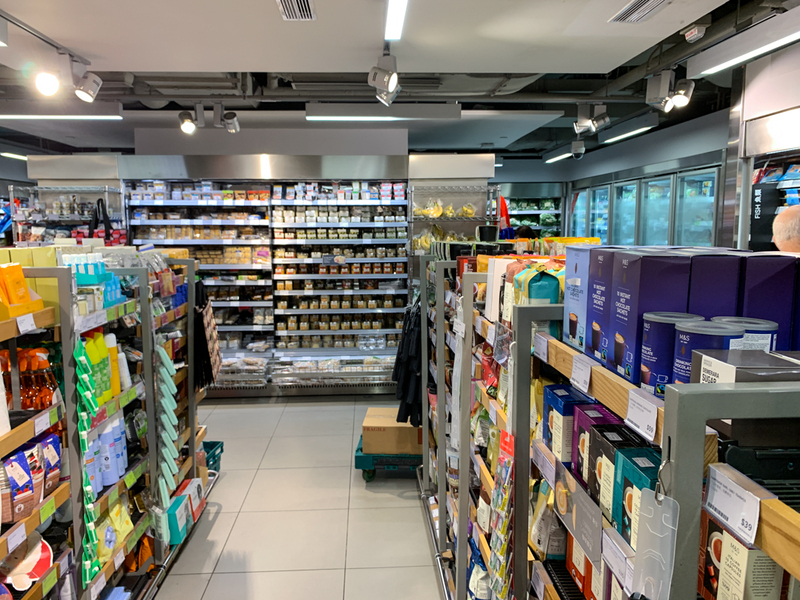 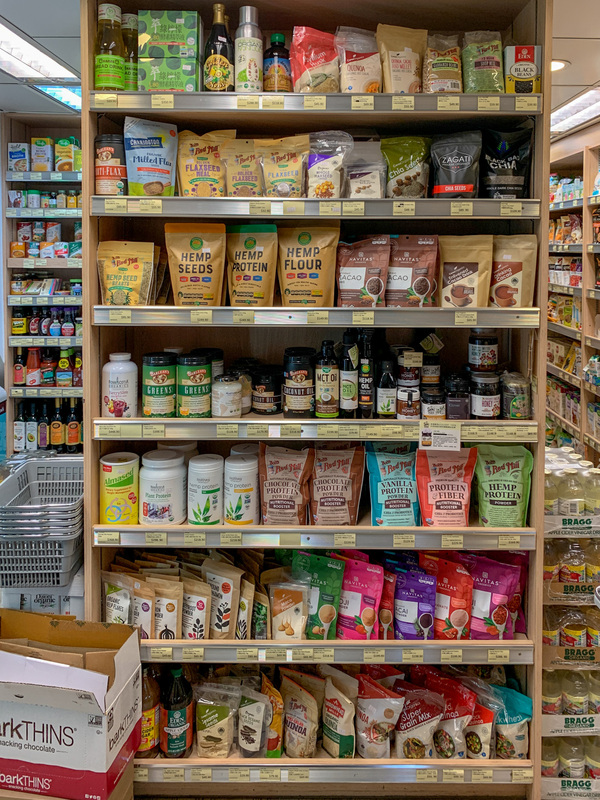 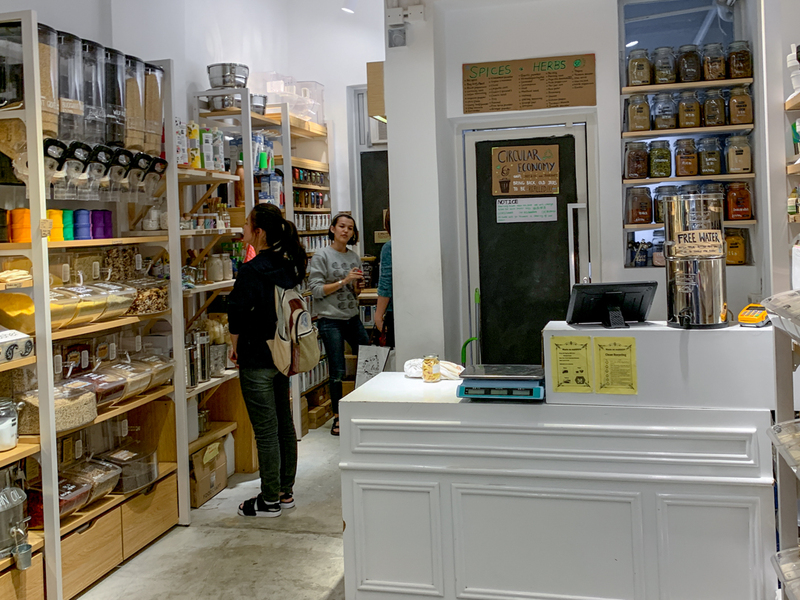 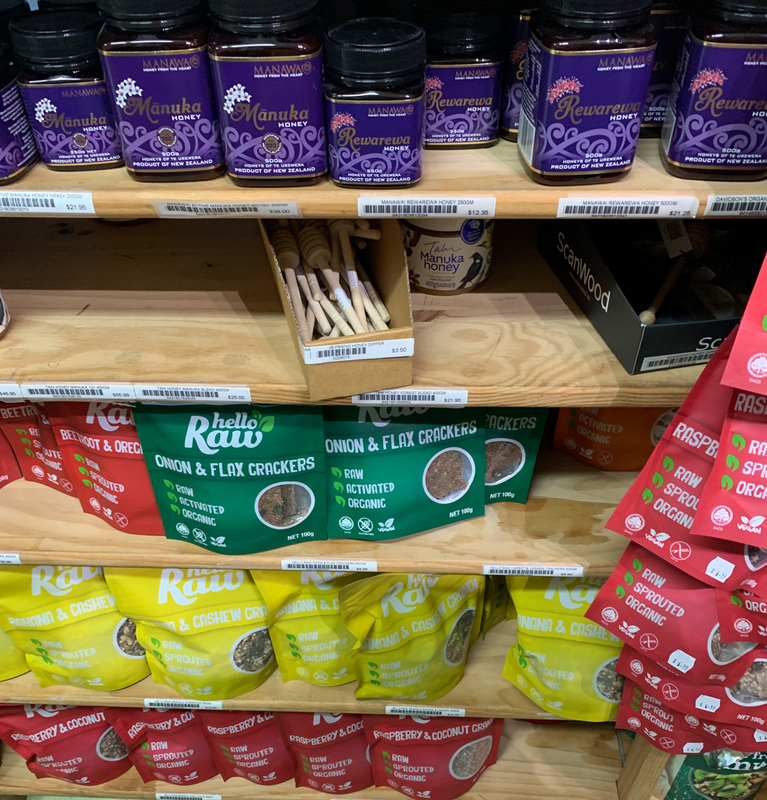 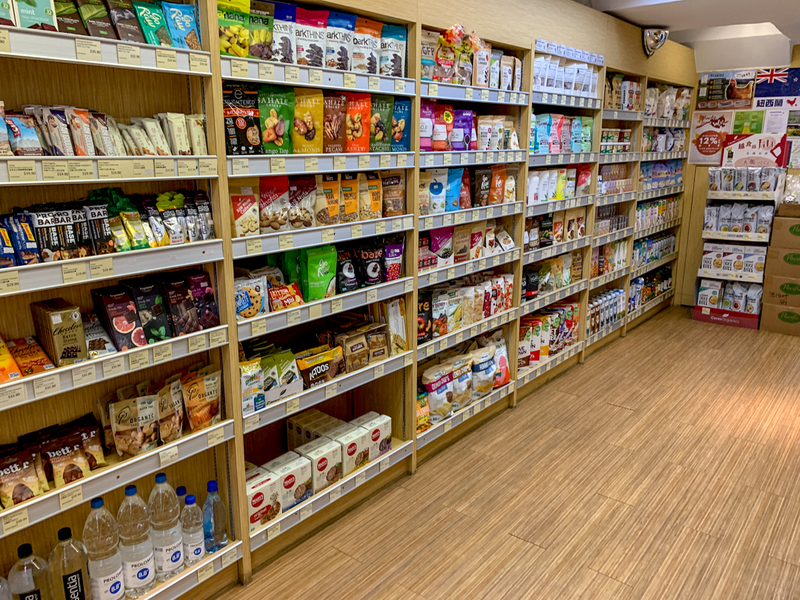 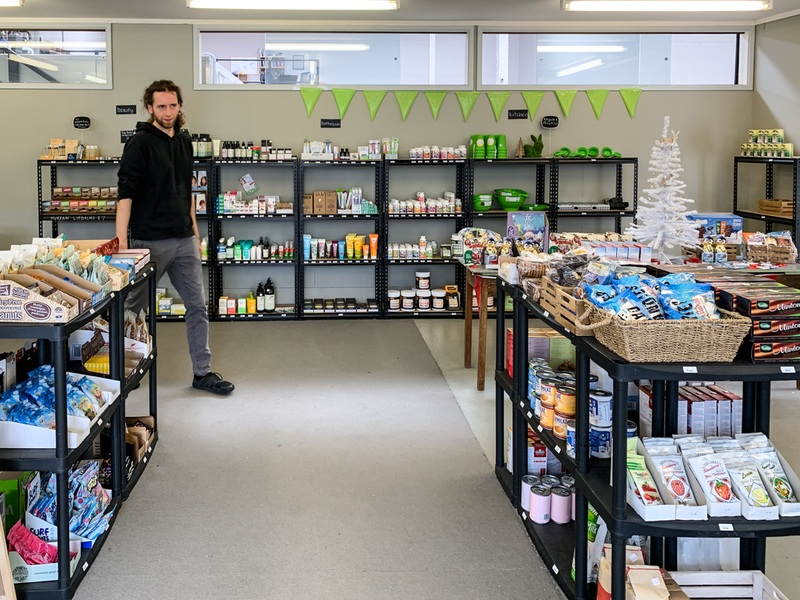 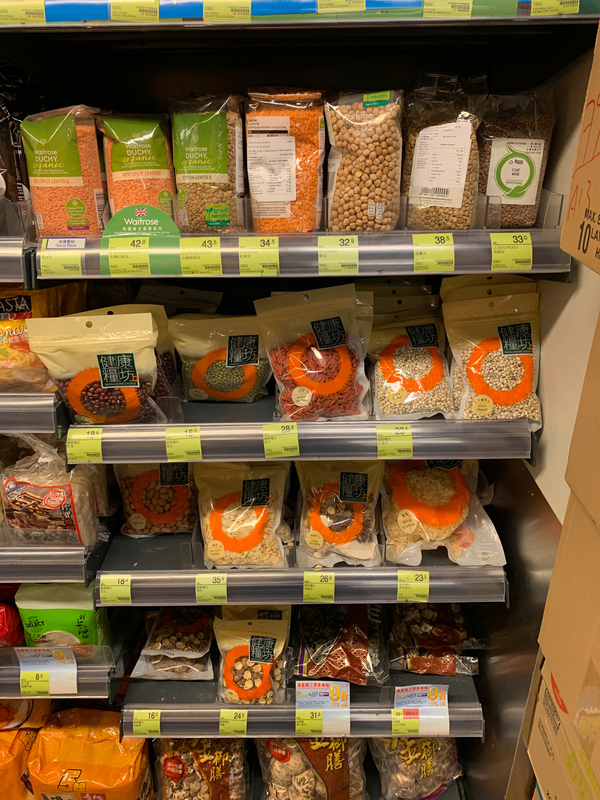 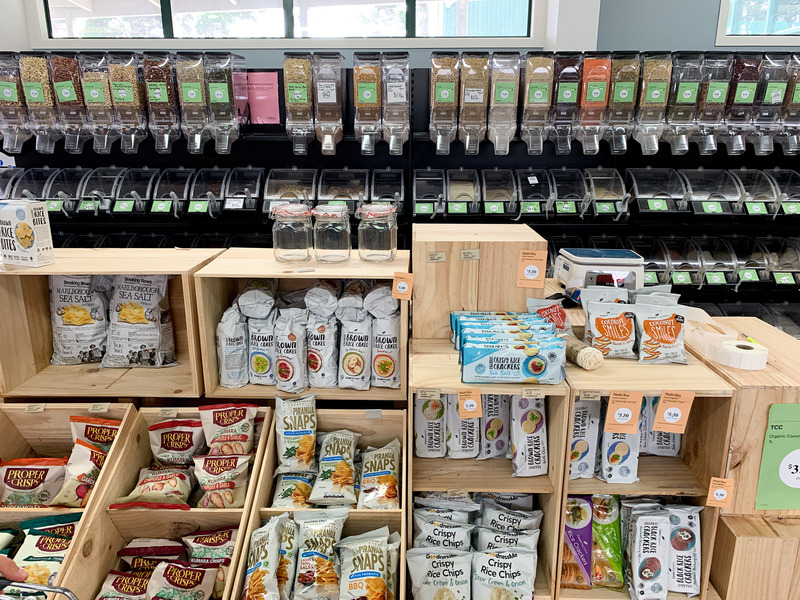 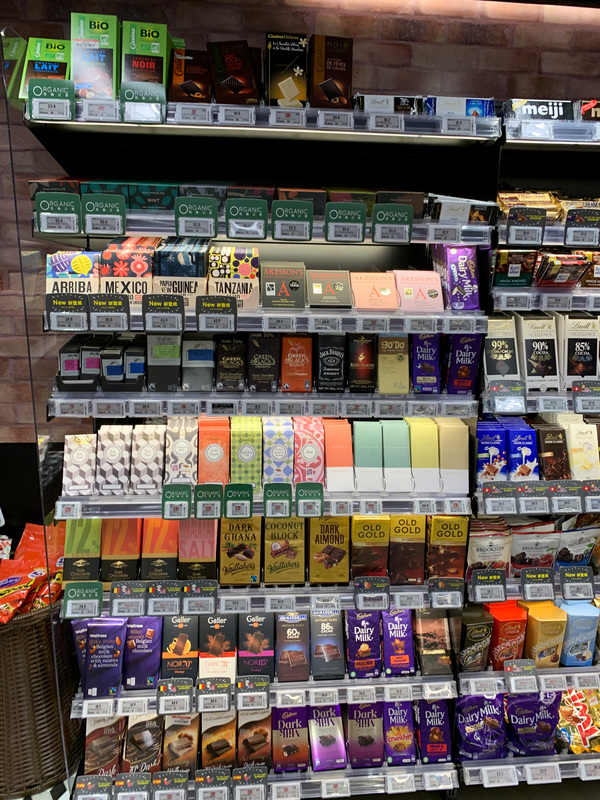 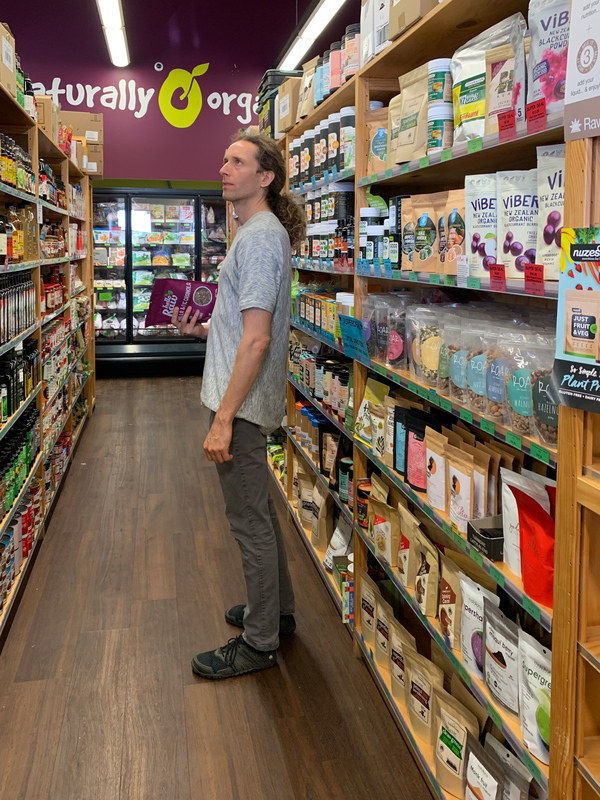 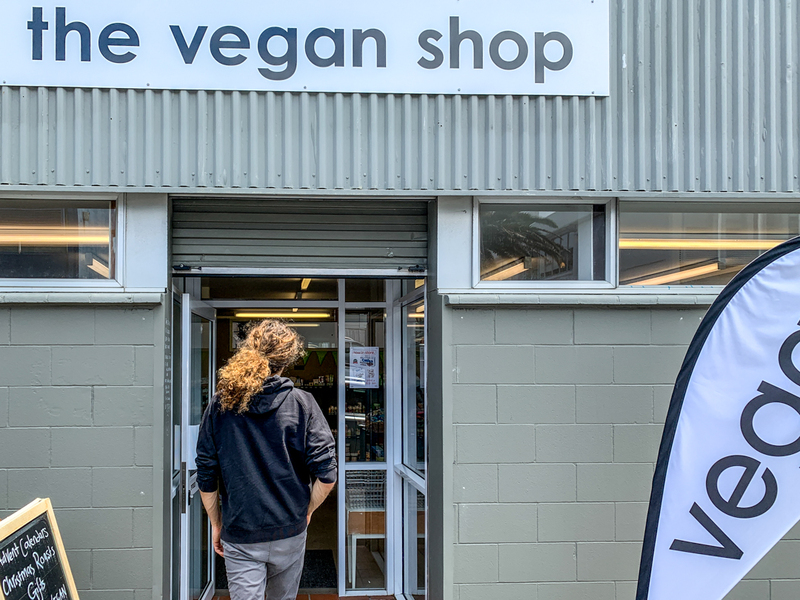 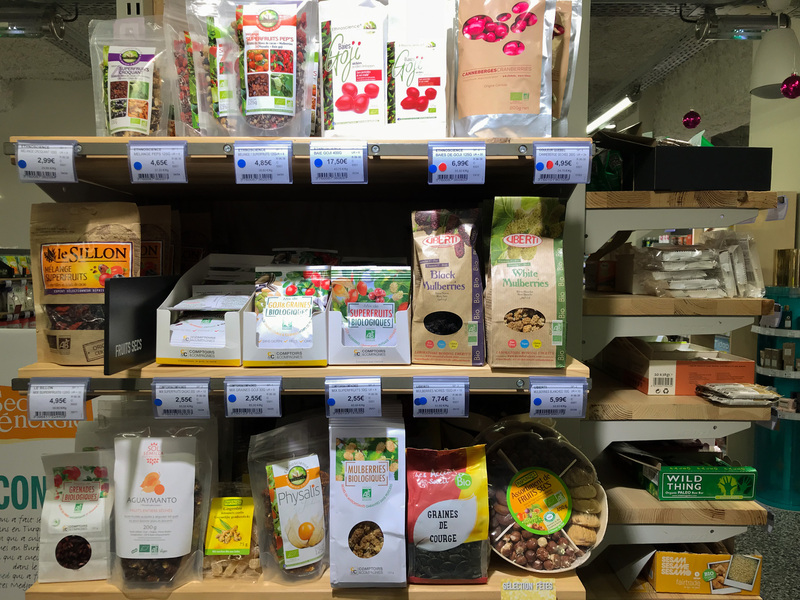 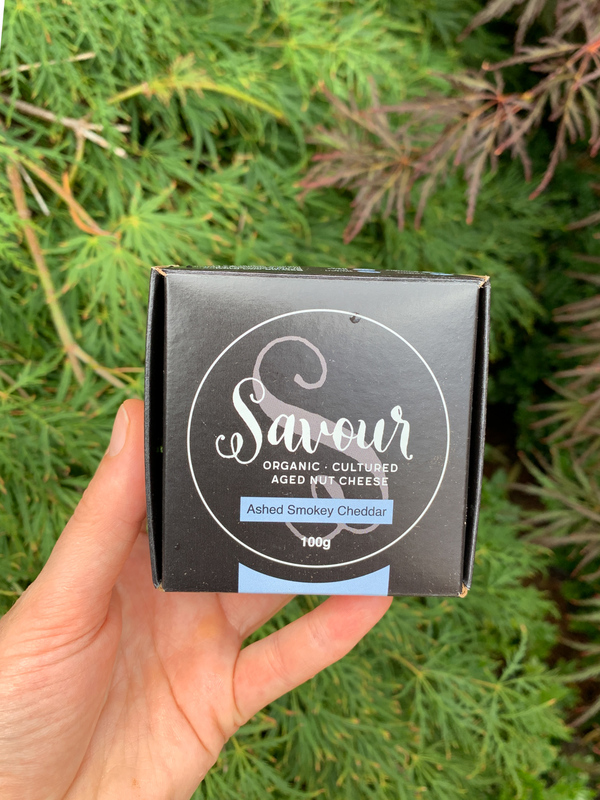 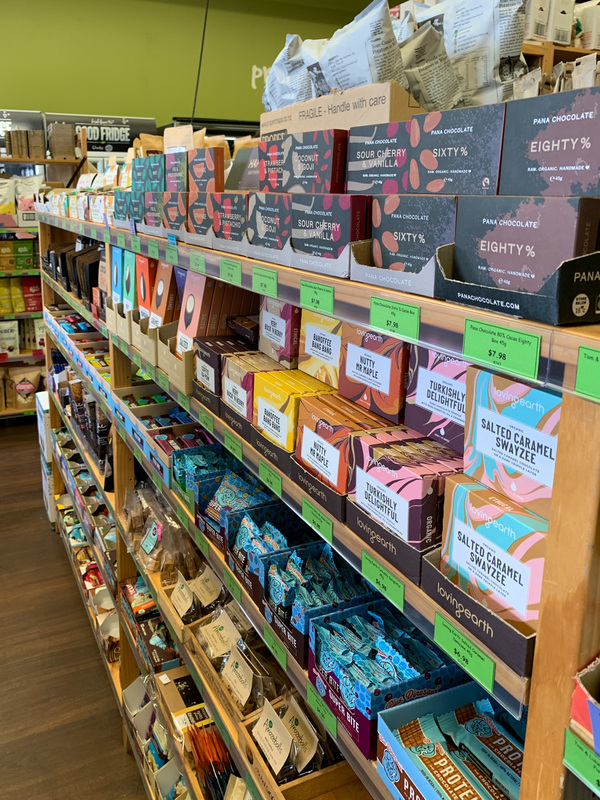 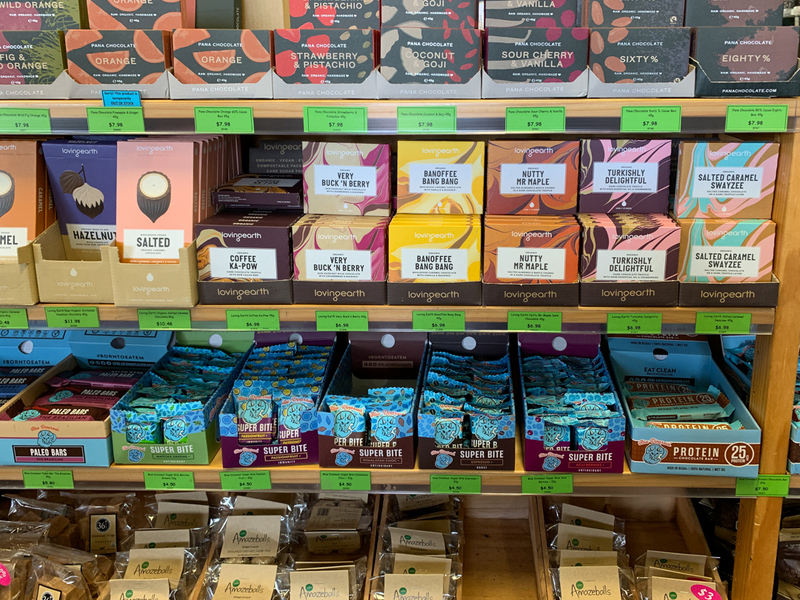 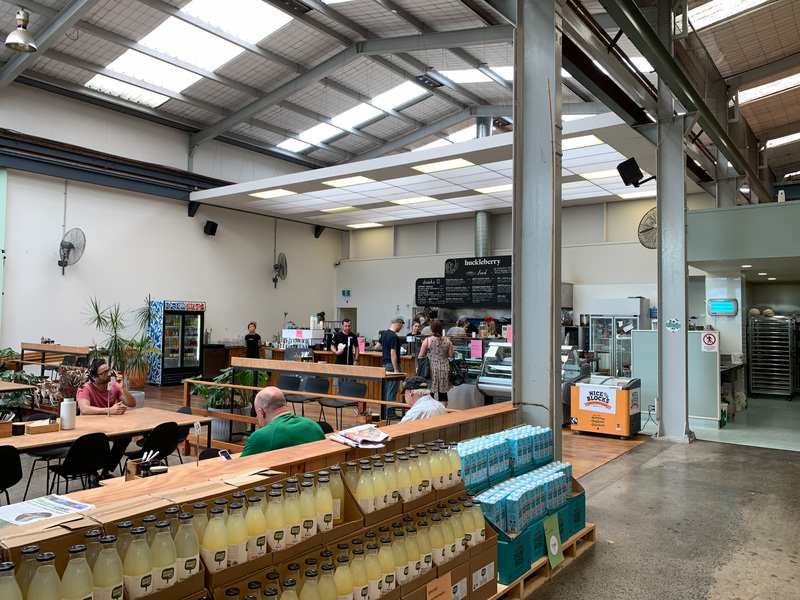 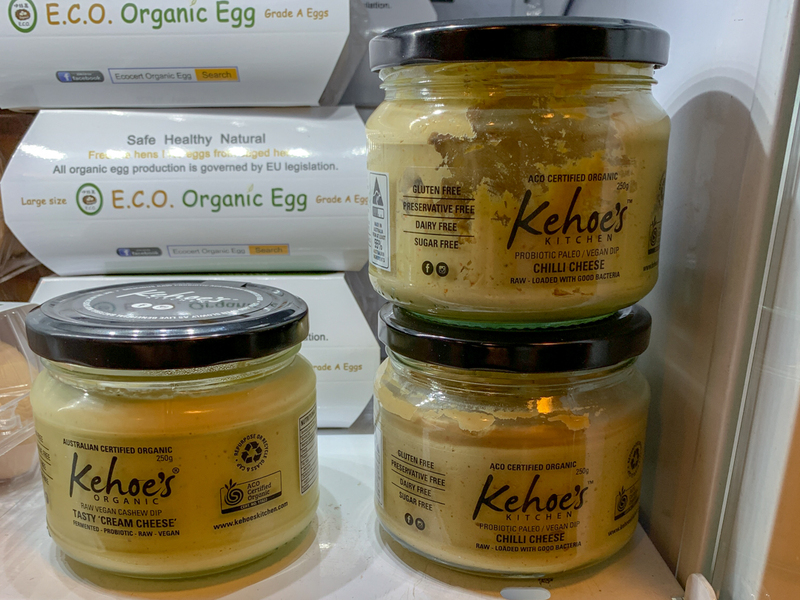 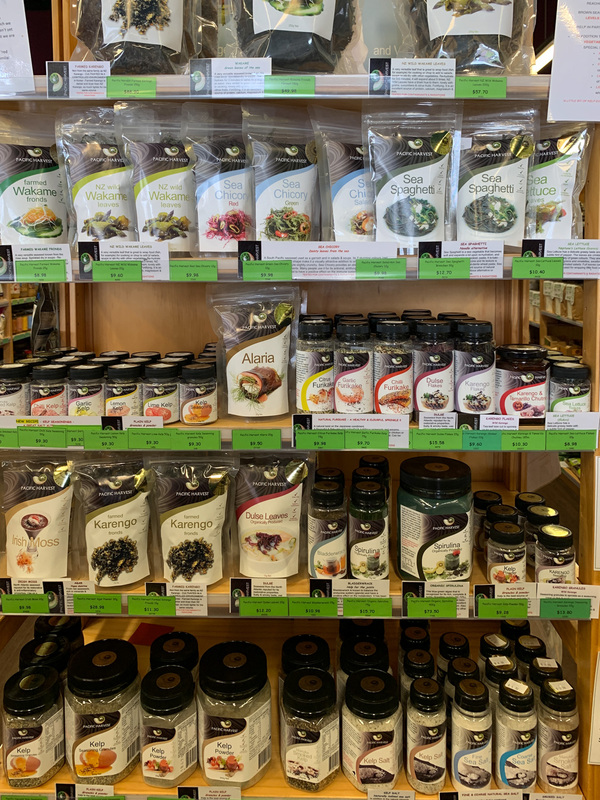 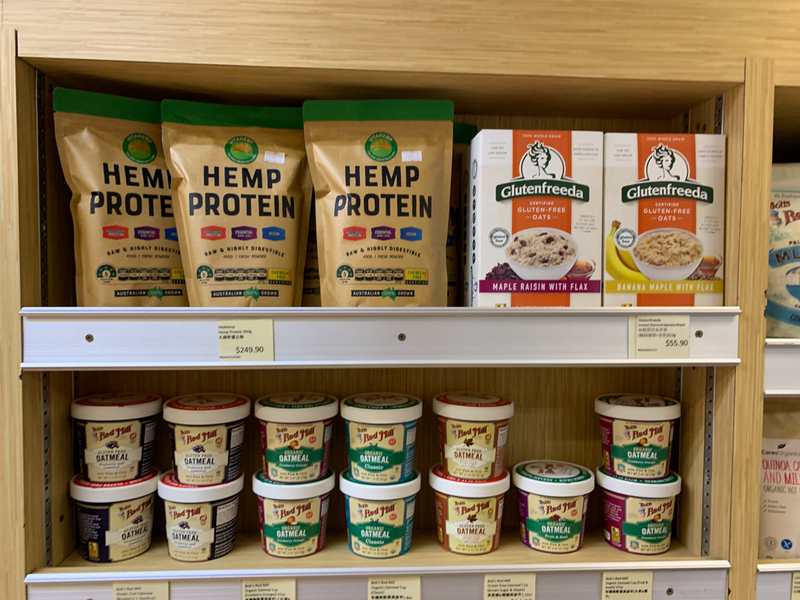 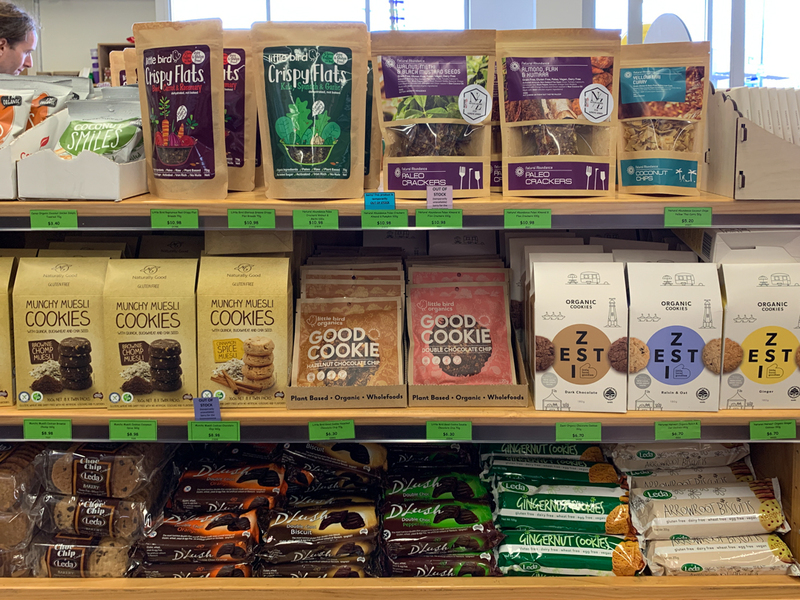 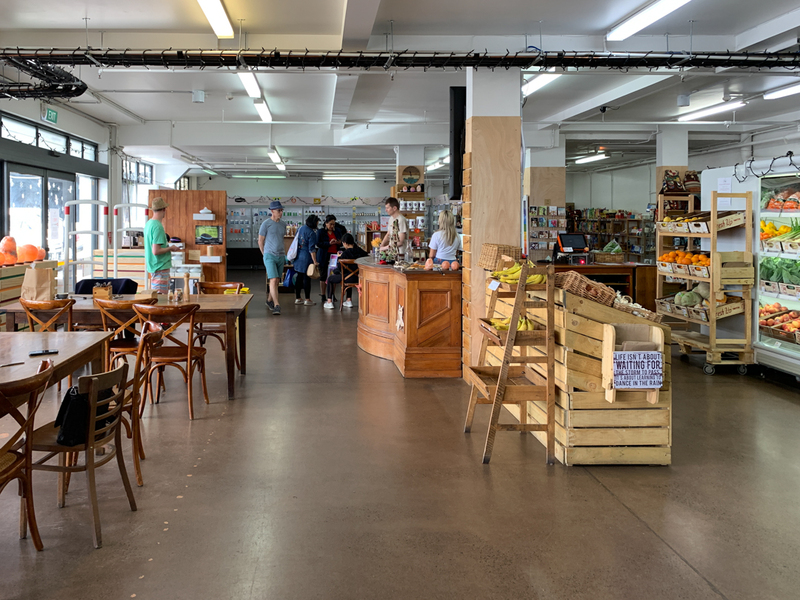 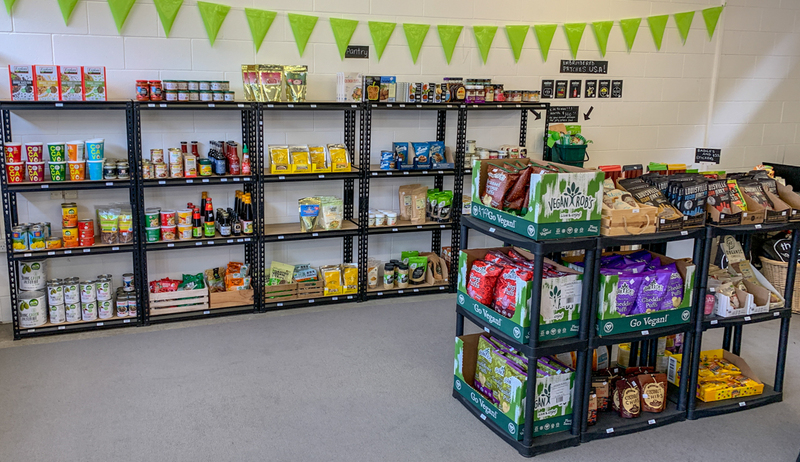 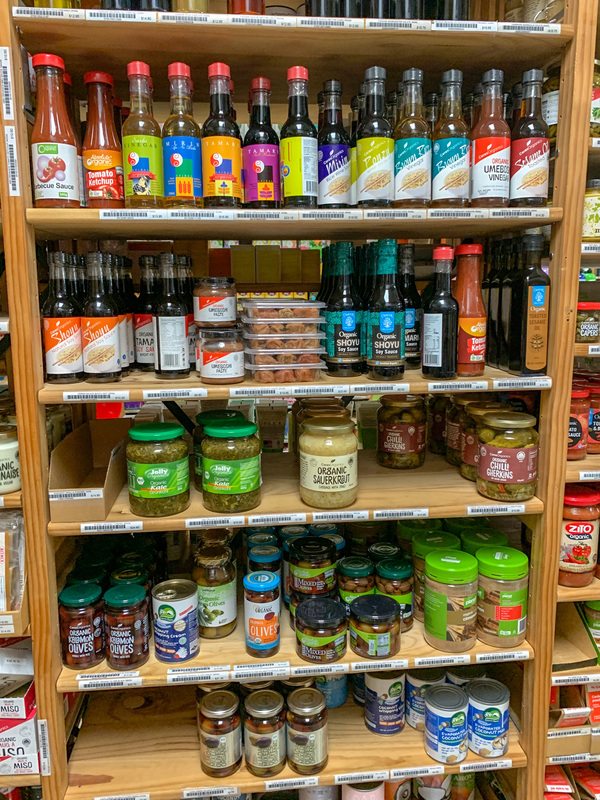 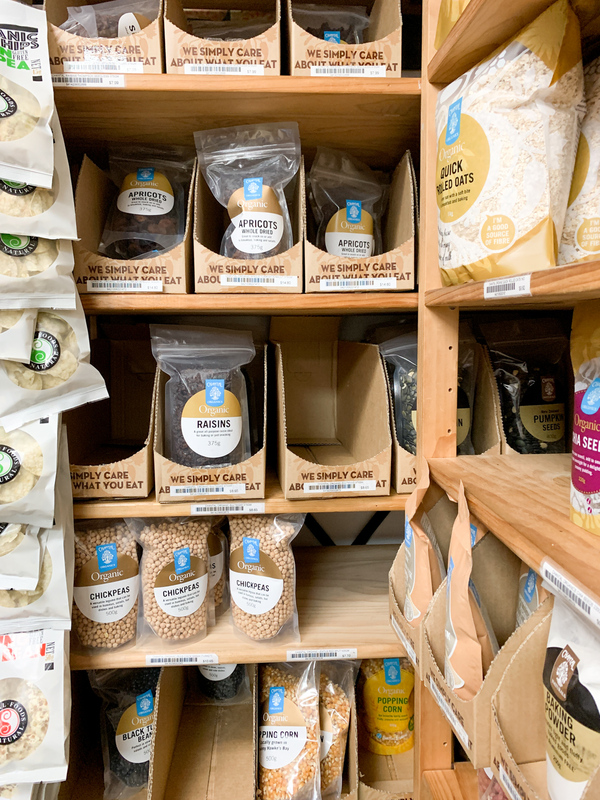 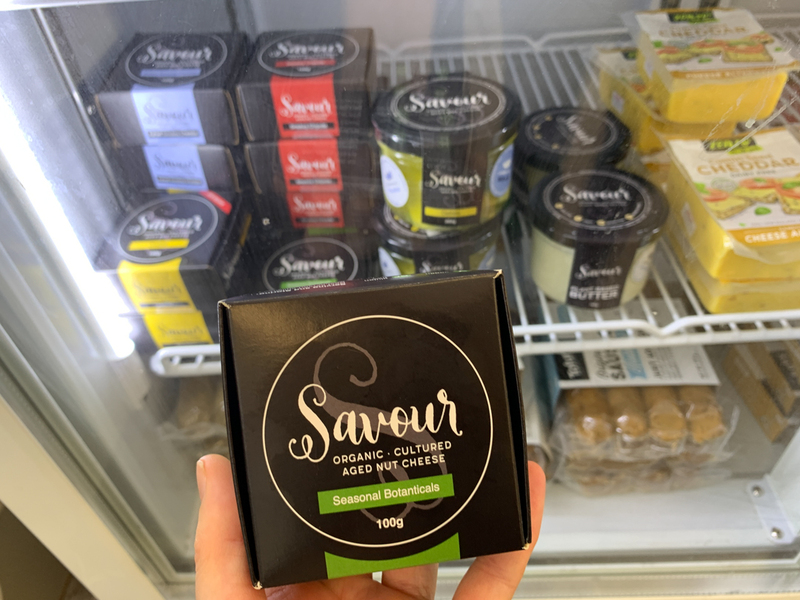 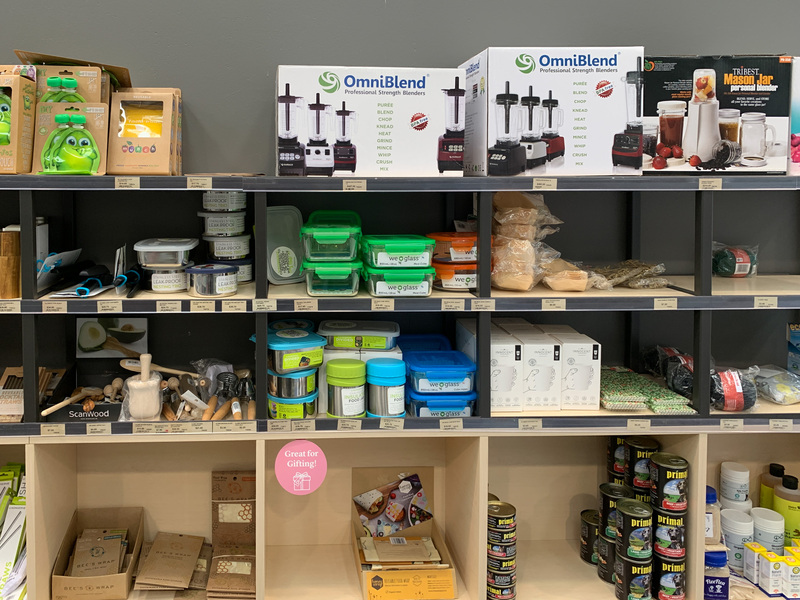 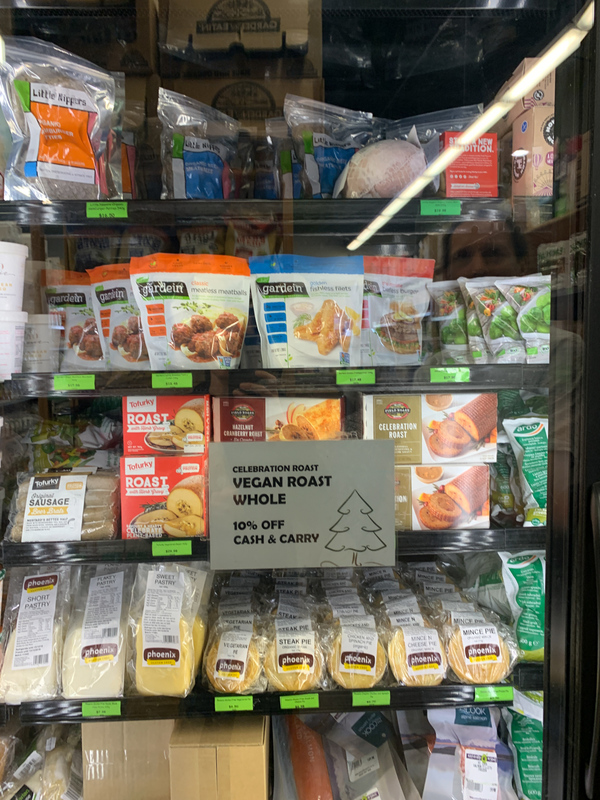 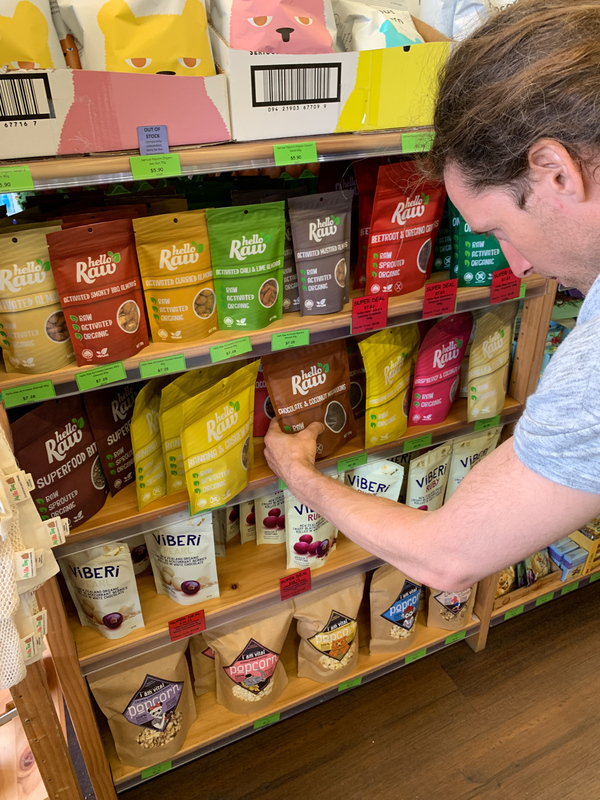 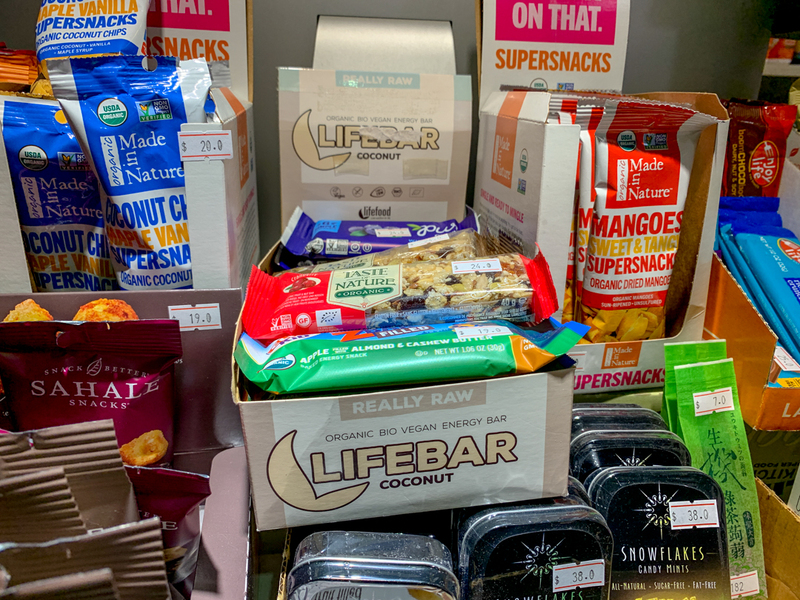 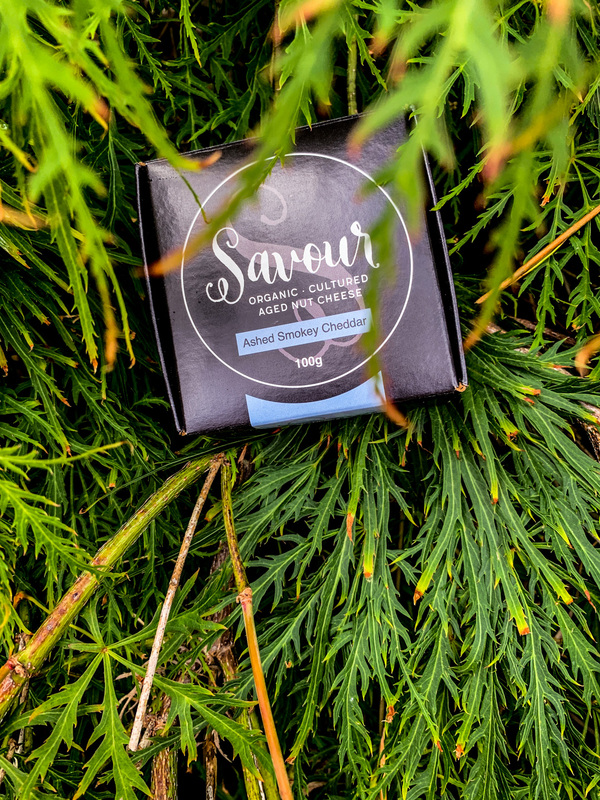 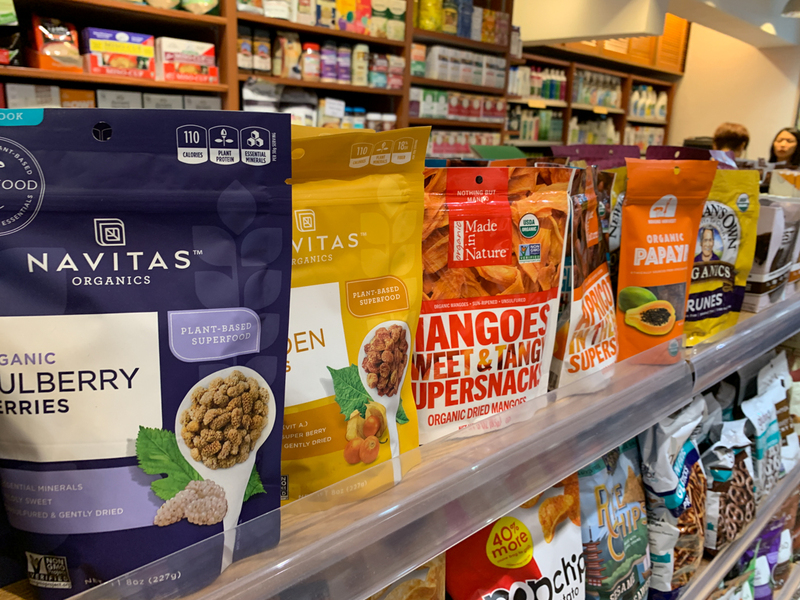 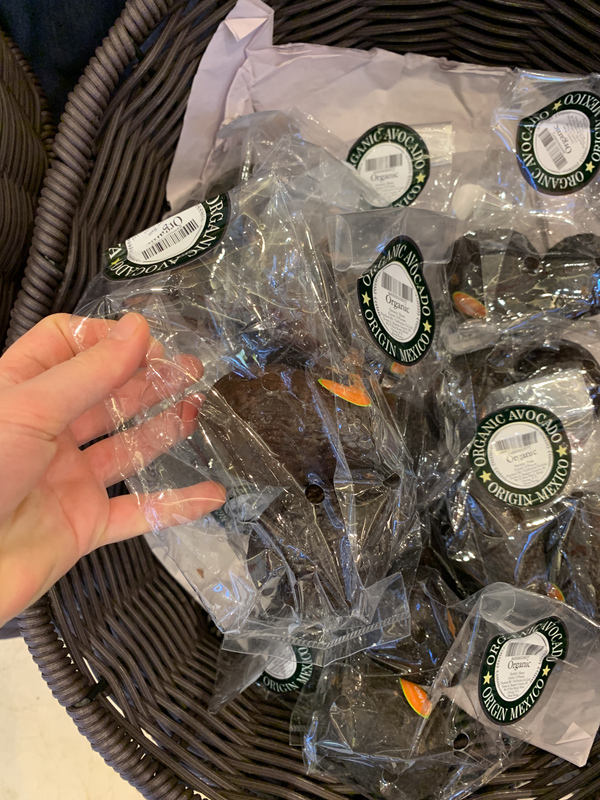 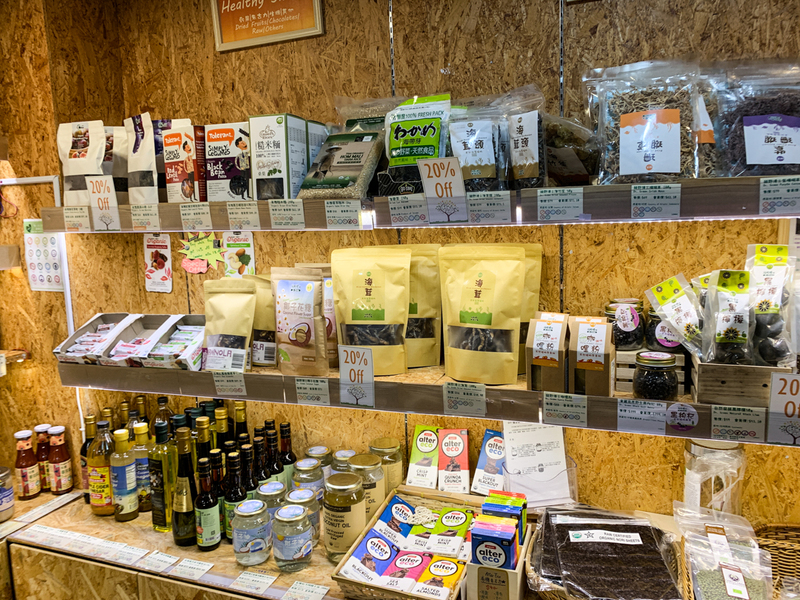 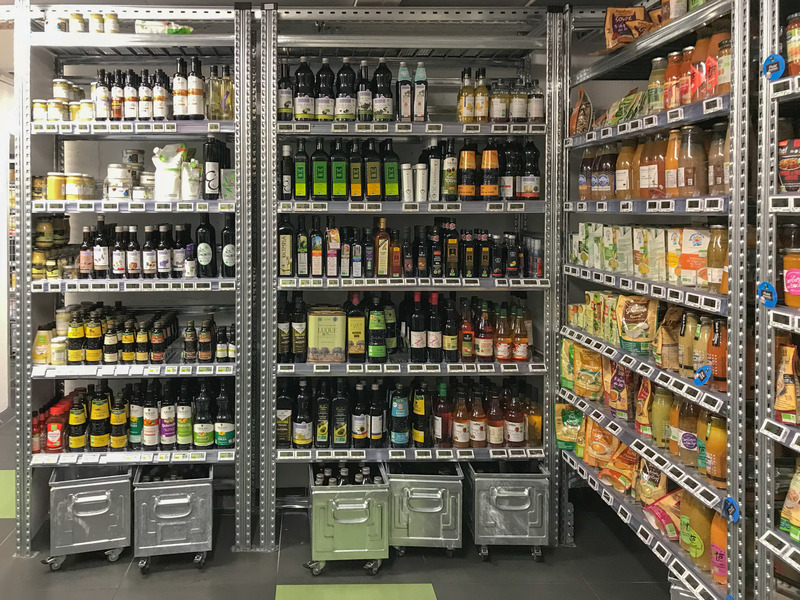 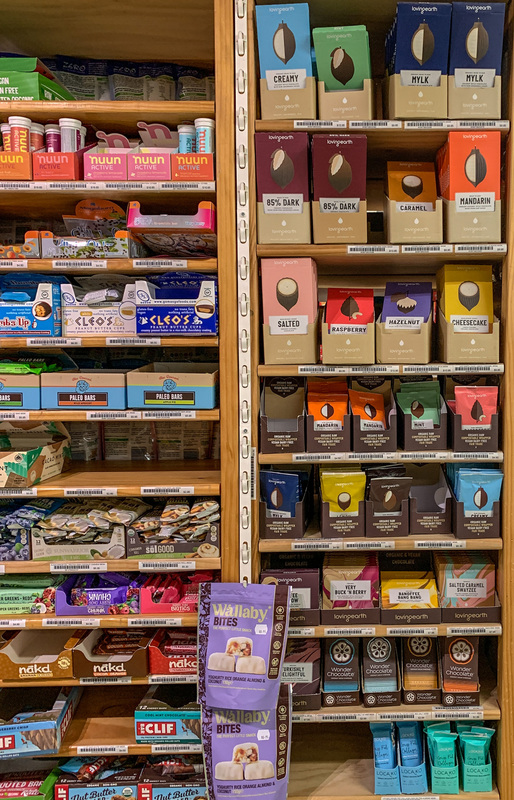 They have lots of packaged organic products, some raw chocolate and a great selection of meat alternatives and vegan cheese. 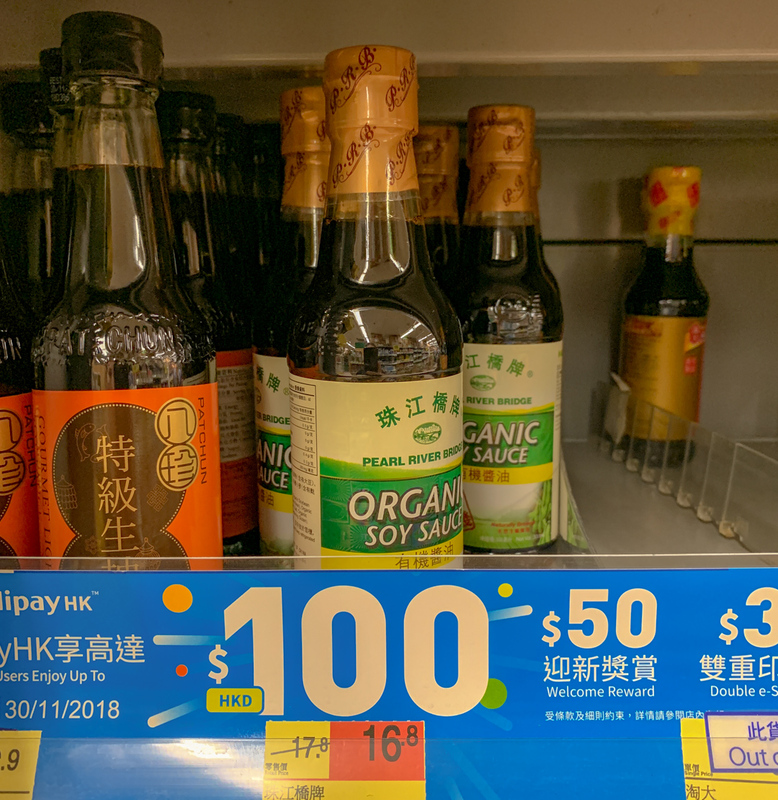 One is around 100 HKD (~10€/$10) wow! 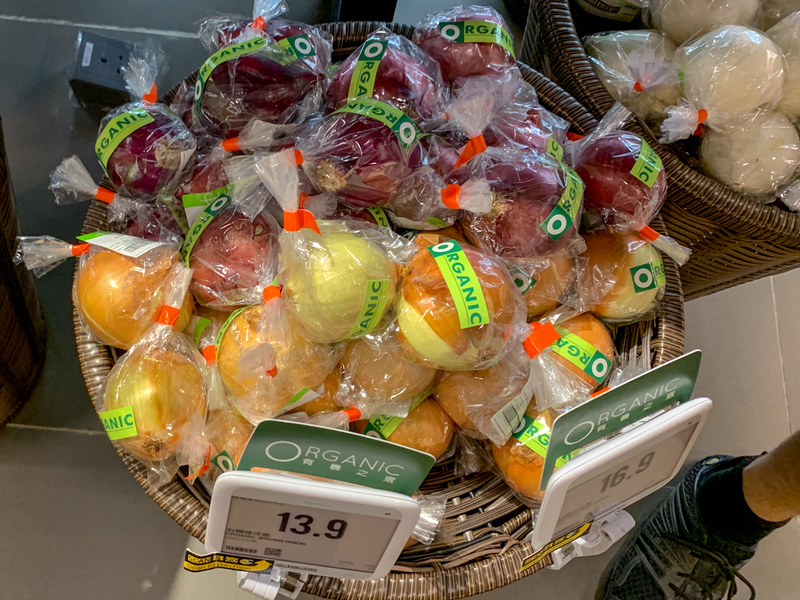 Organic onion. 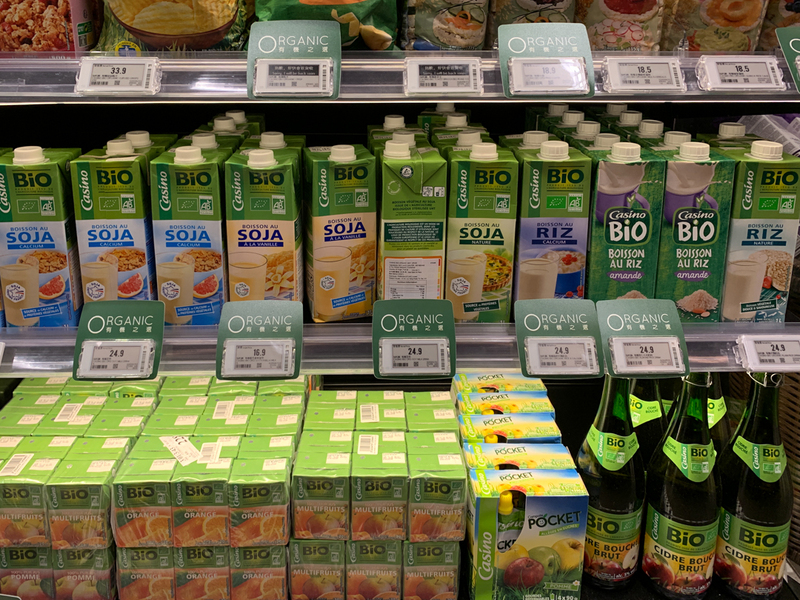 The price you see was also per 100 g.
Organic plant milks. 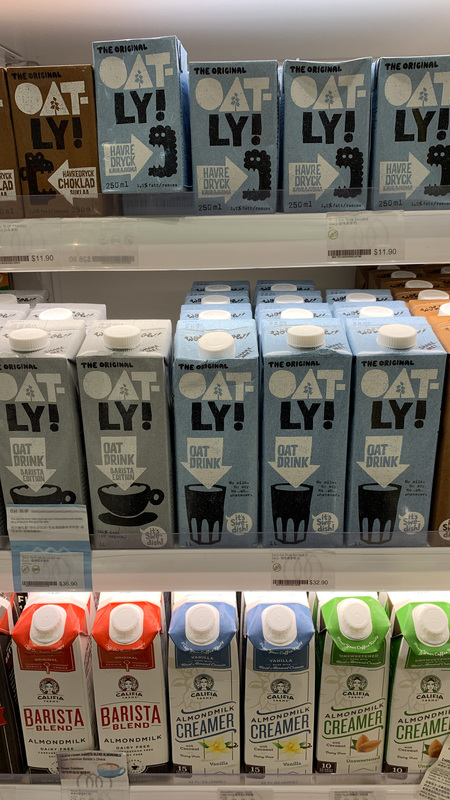 Oat milk oatly. 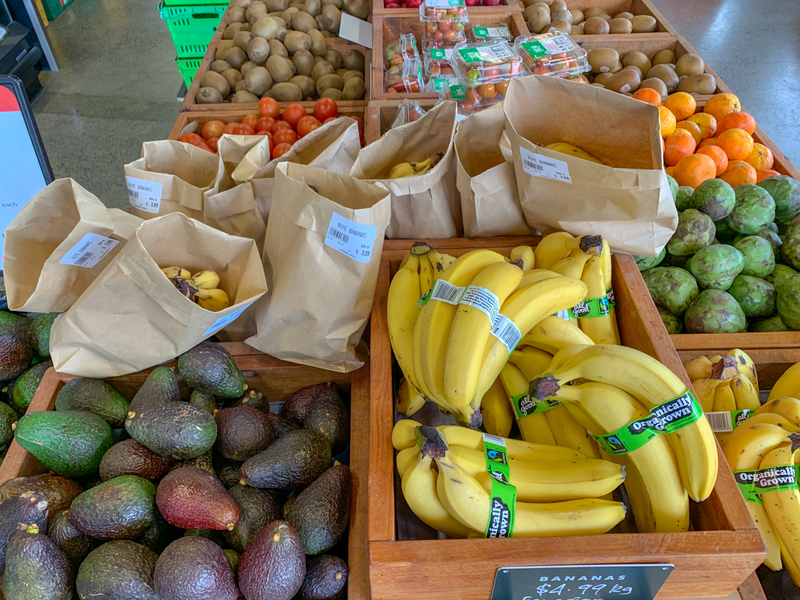 Organic mangos, organic figs, Organic nuts. 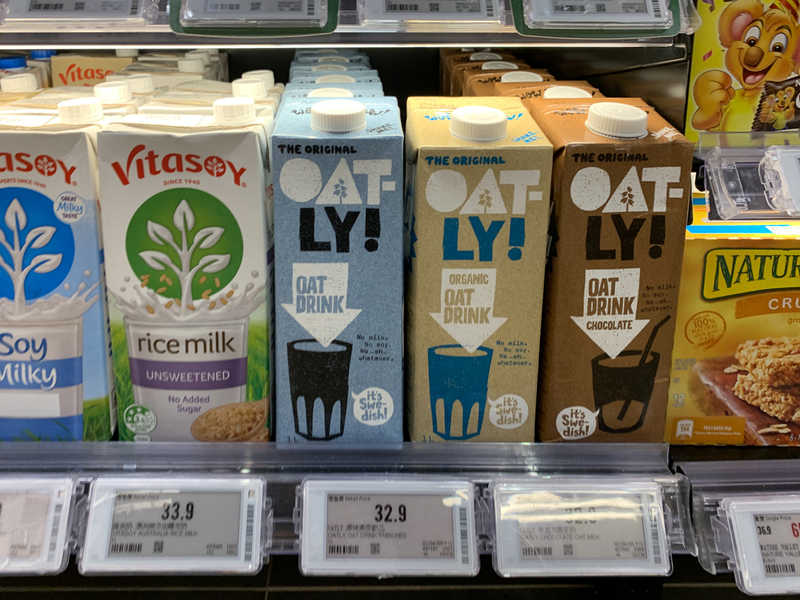 Organic milk alternatives. 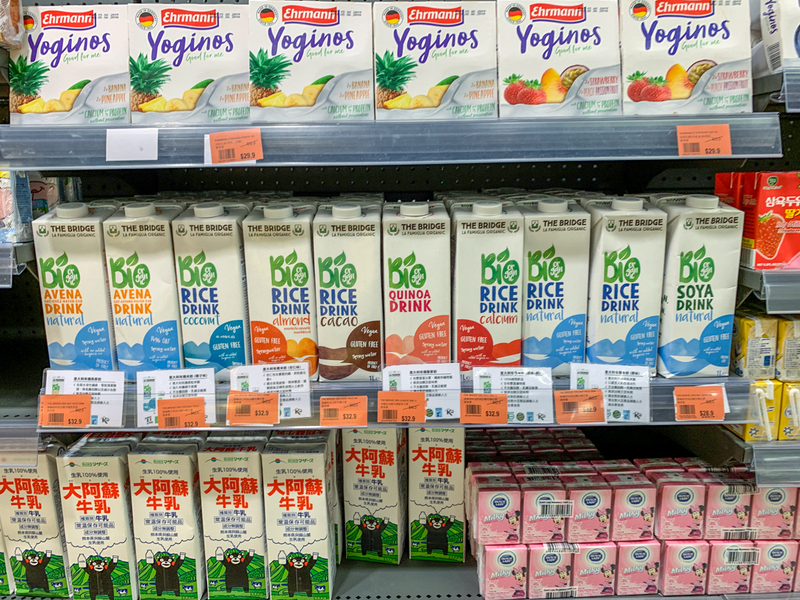 Vegan soy milk. 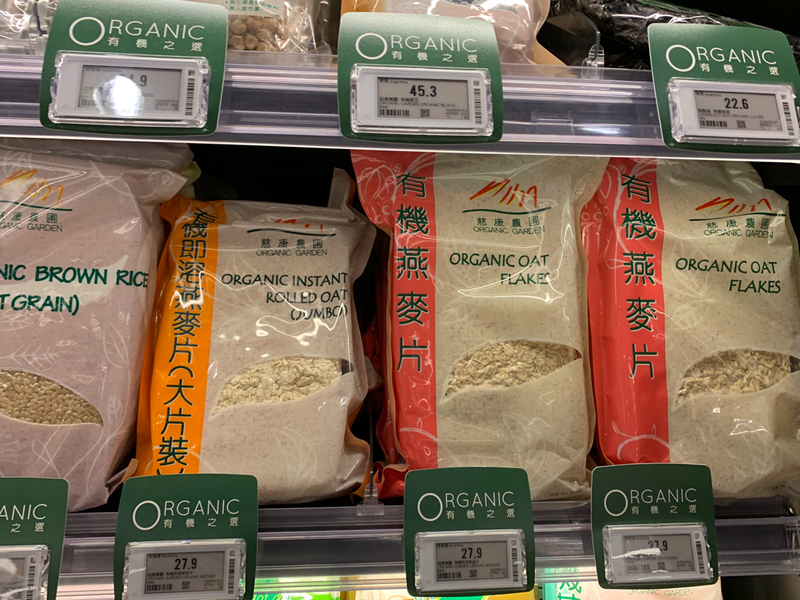 Organic rice milk. 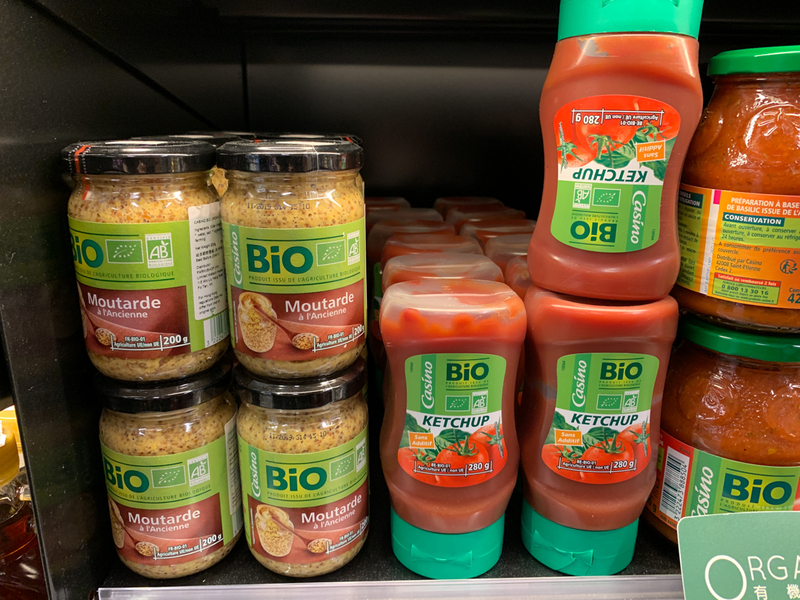 Organic peas, organic tomato sauce, organic ketchup. 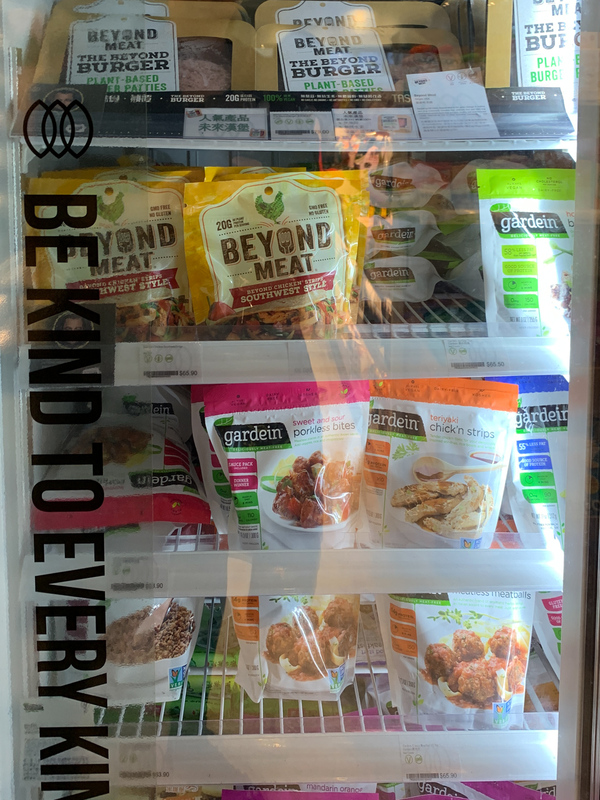 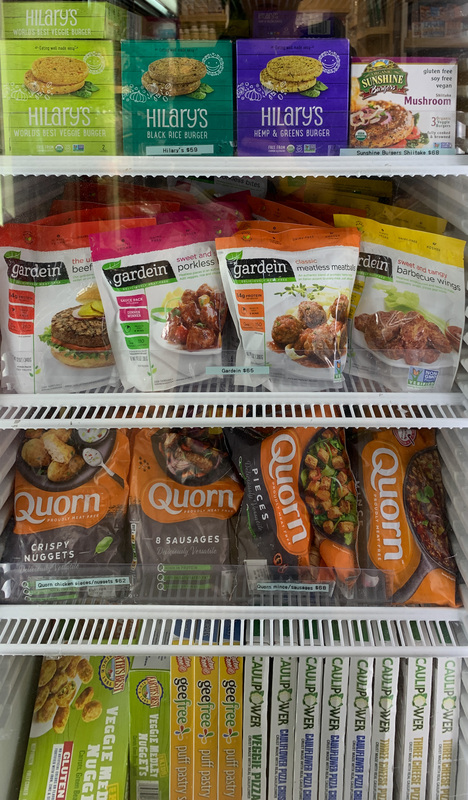 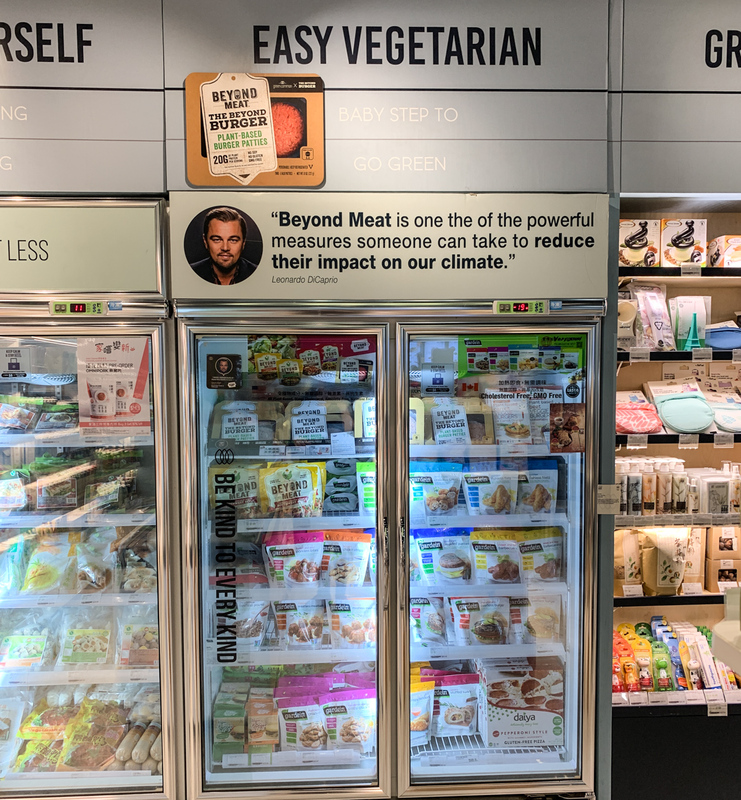 Great selection of vegan meat alternatives. 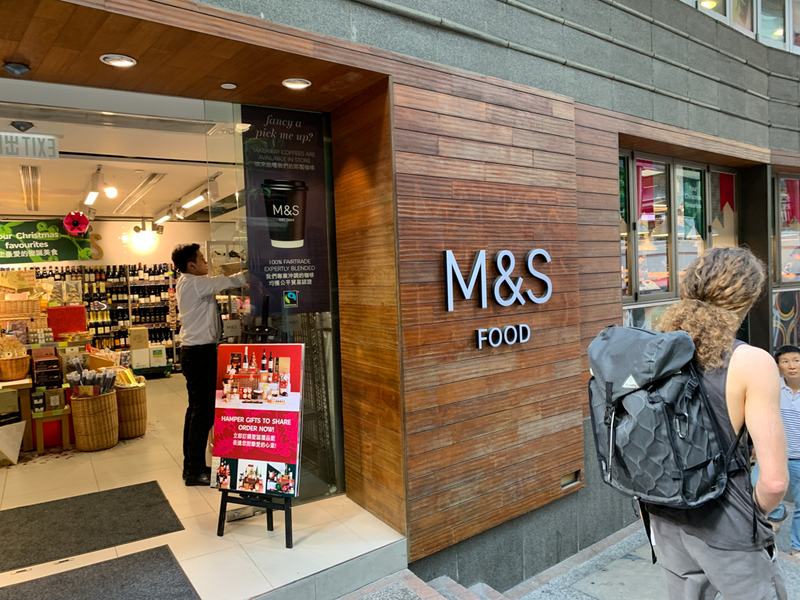 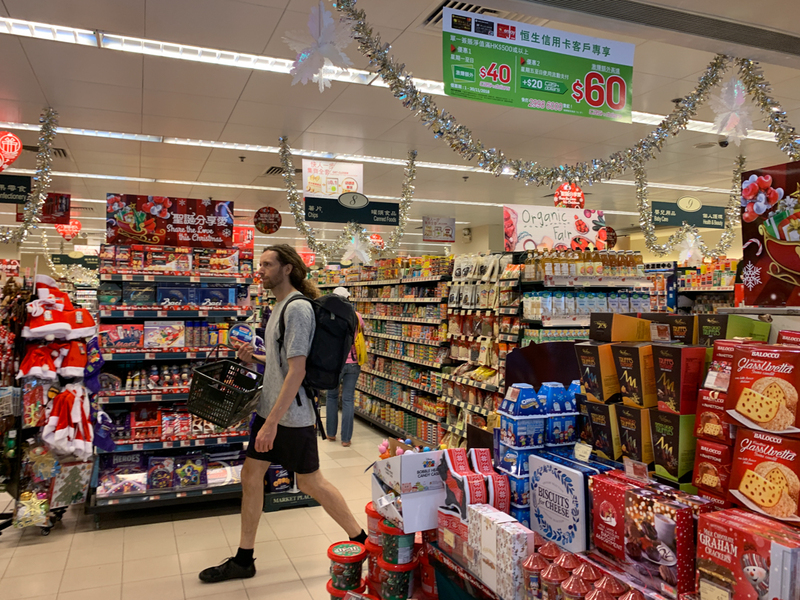 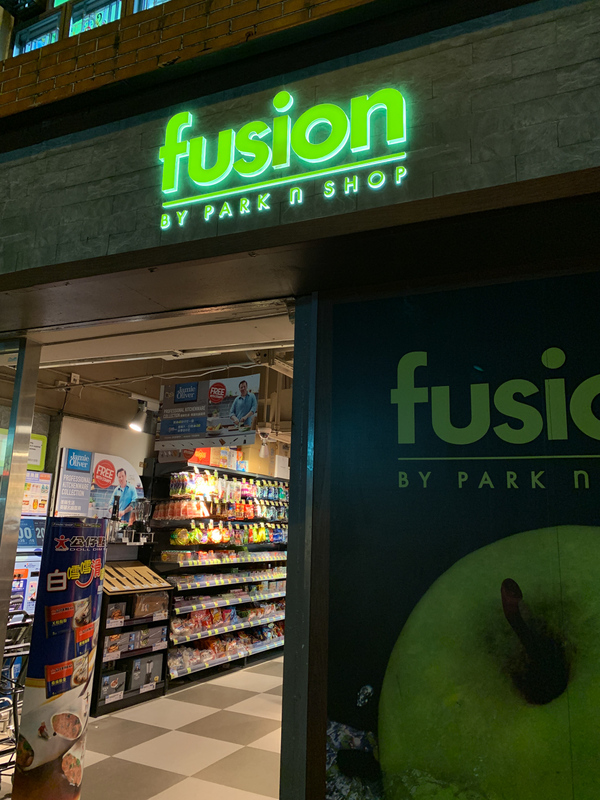 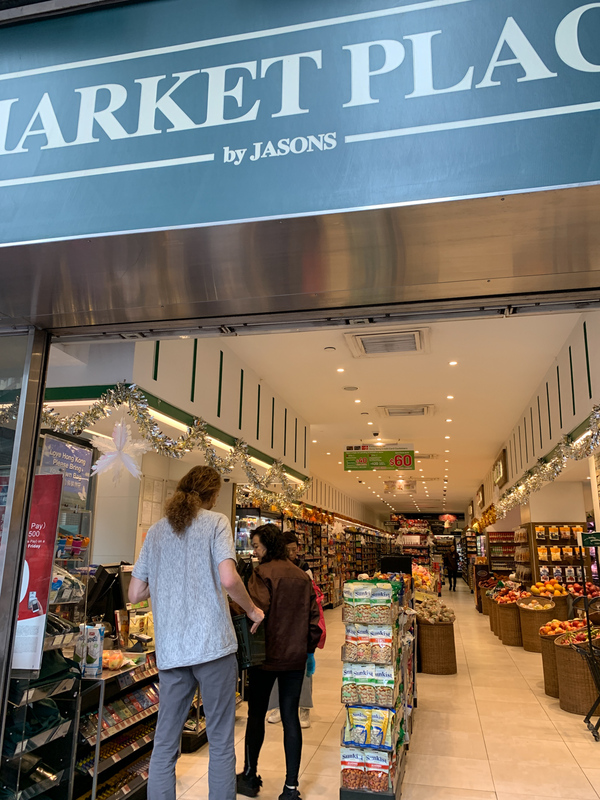 After going up the Victoria peak we needed some snacks and refreshment and this store was the nearest. 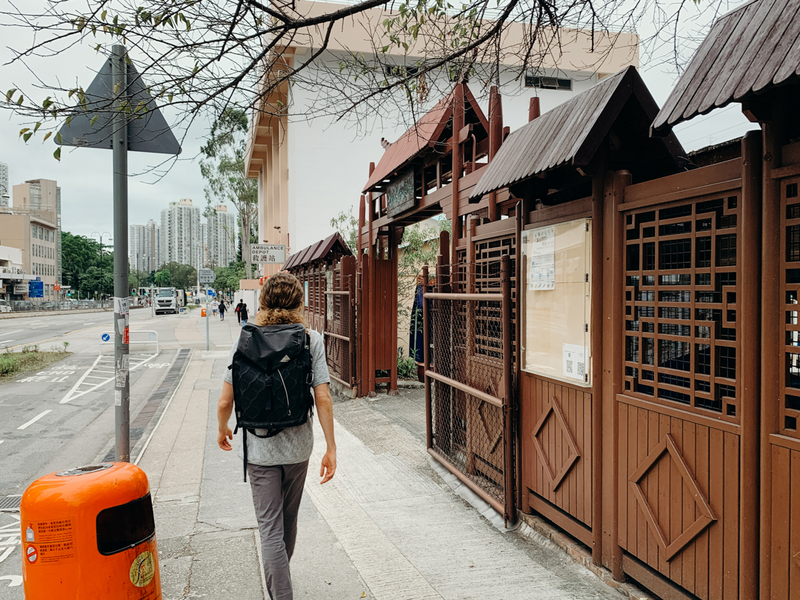 We had a long hike to the Victoria park garden ahead and took a good look around. 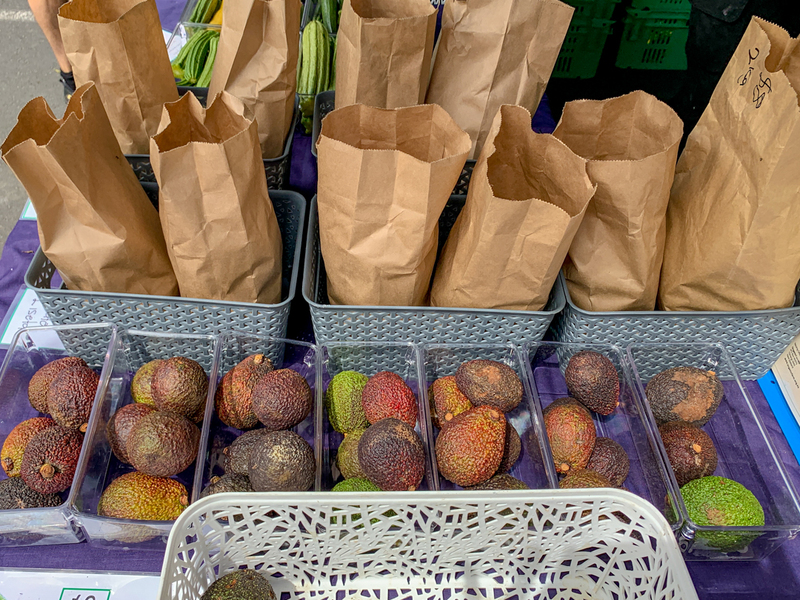 They had some good papaya and avocado here. 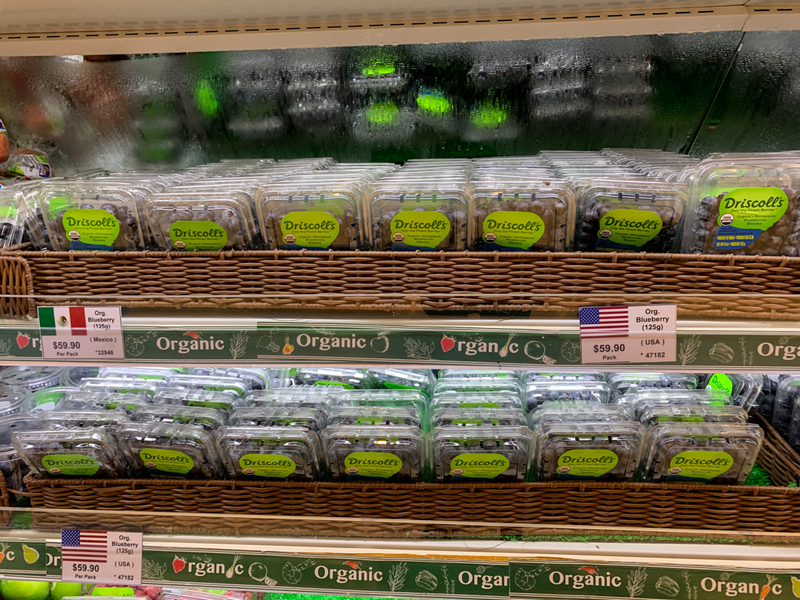 Also organic berries. 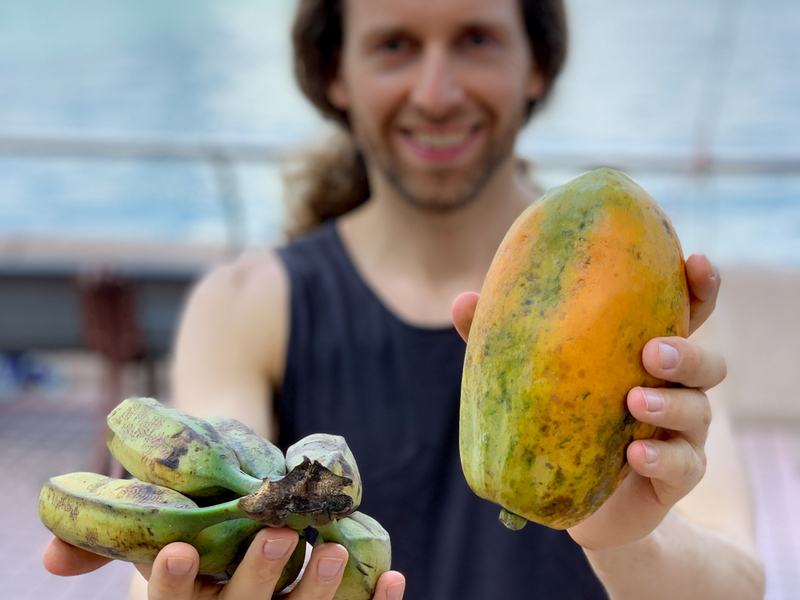 Organic papaya for 49 HKD each, we took the bigger one. 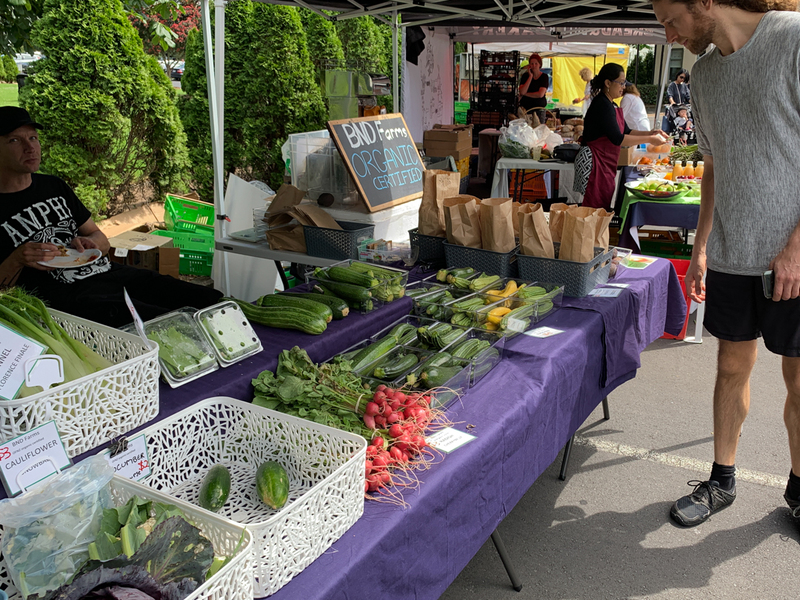 Organic corn, organic tomatoes, organic cucumbers. 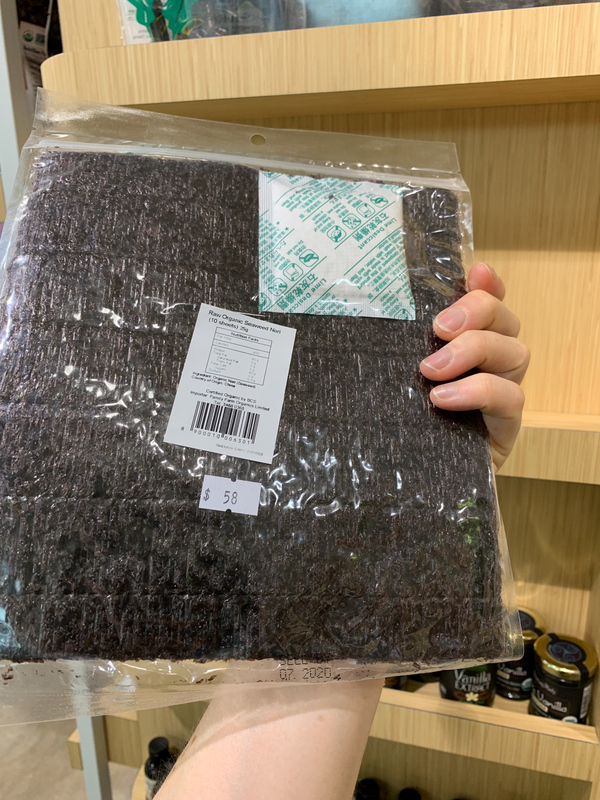 The purple corn is too starchy to eat it raw, we tried it. 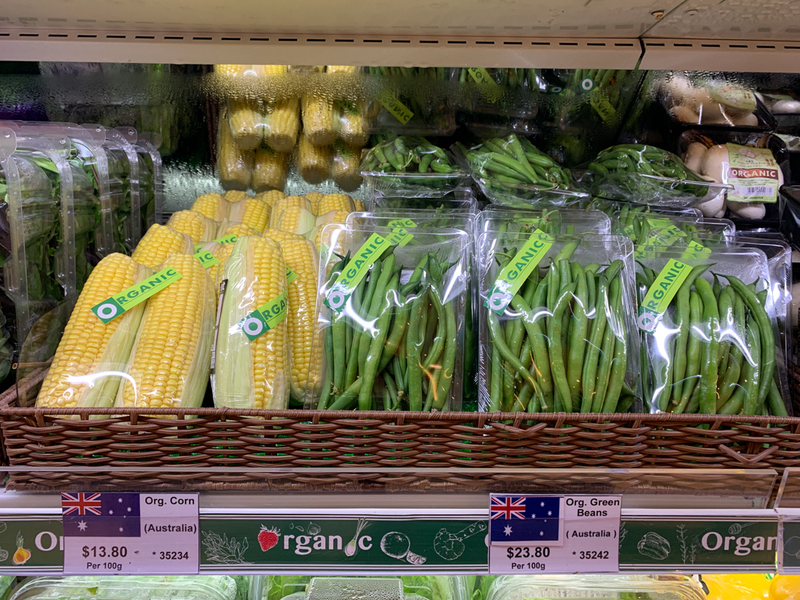 Organic carrots, organic sweet corn, organic mini cucumbers, organic beans. 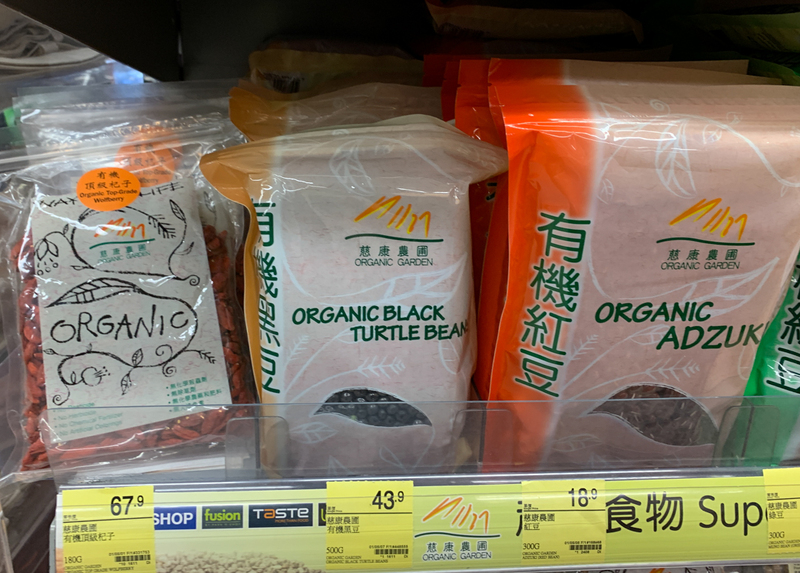 Organic greens, mushroom and beans. 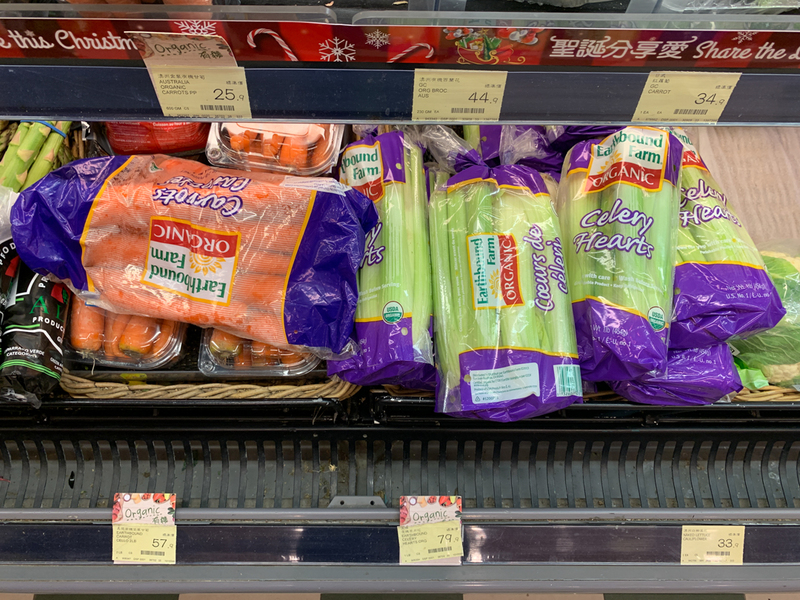 Organic celery and organic carrots. 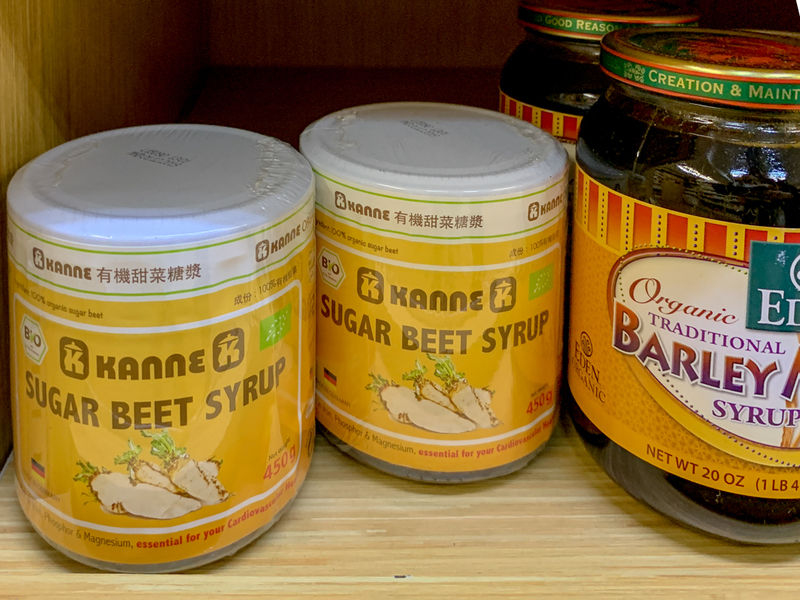 Organic sweeteners agave and maple syrup. 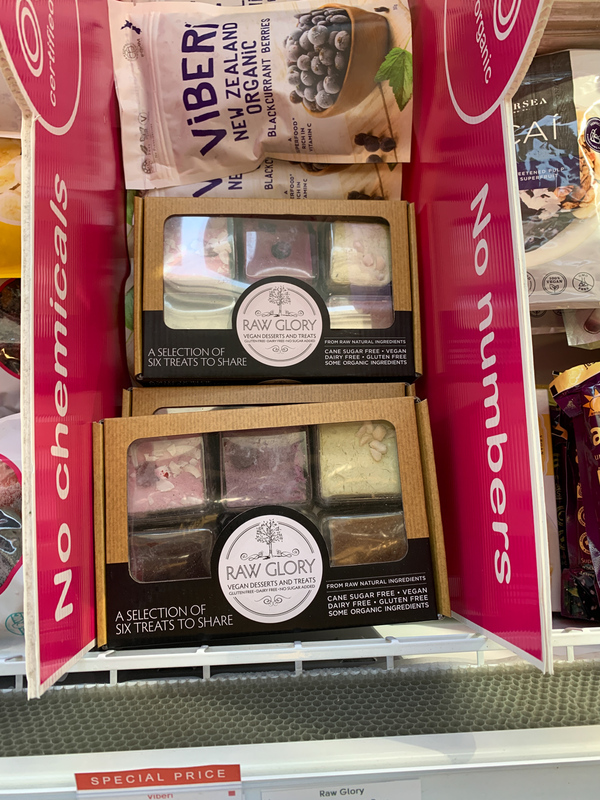 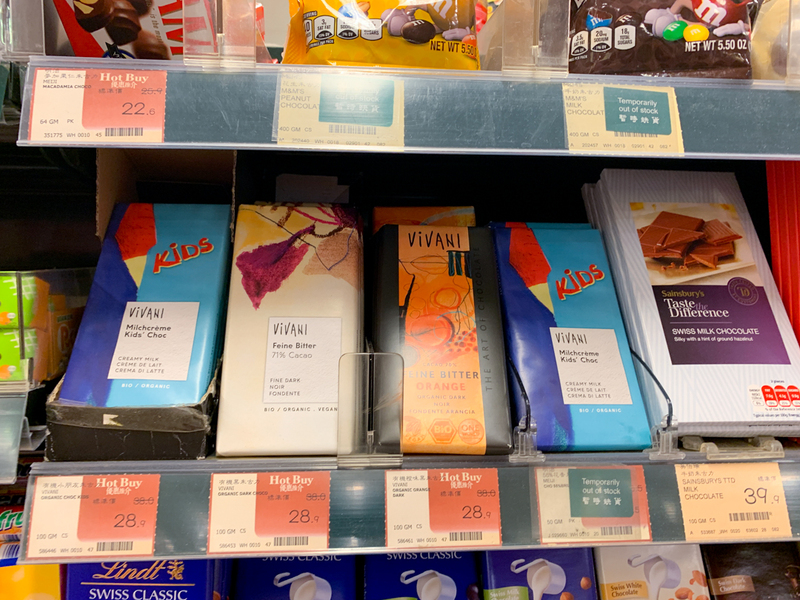 Organic chocolate, the white vivani one is vegan. 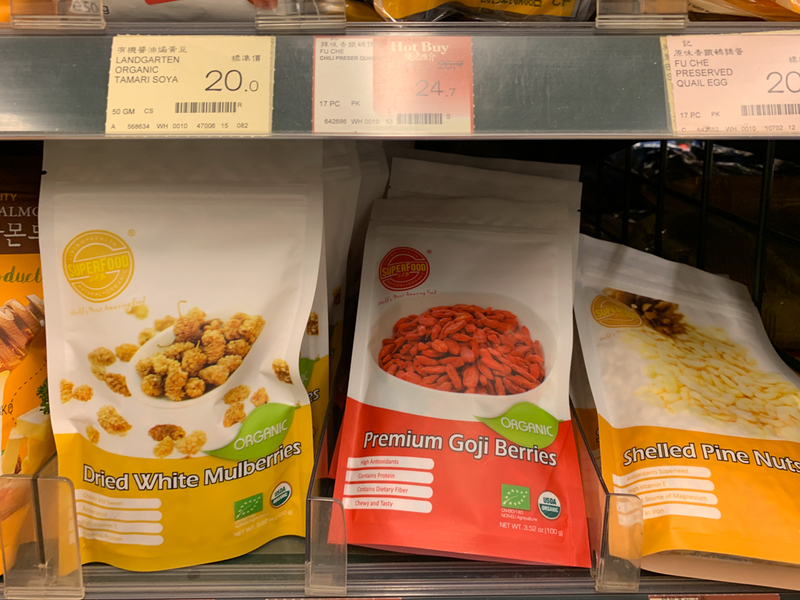 White organic mulberries, organic goji. 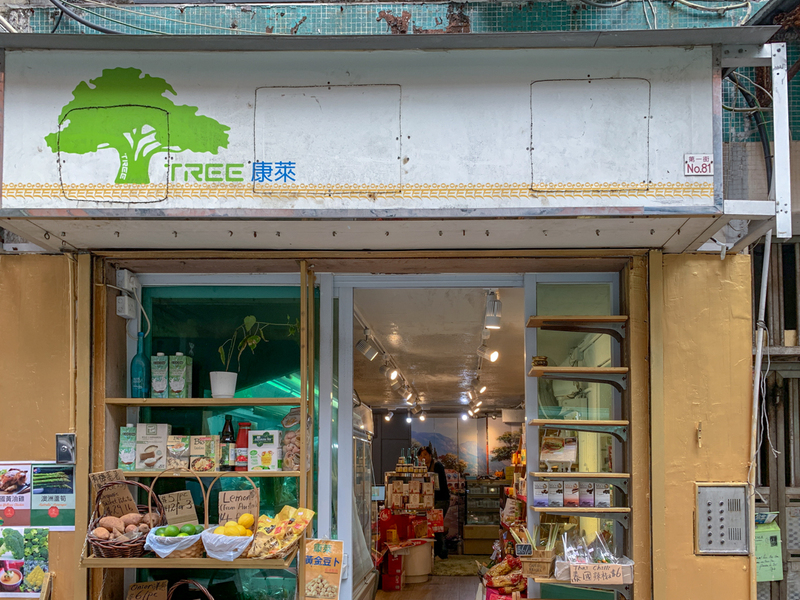 Small shop in Central. 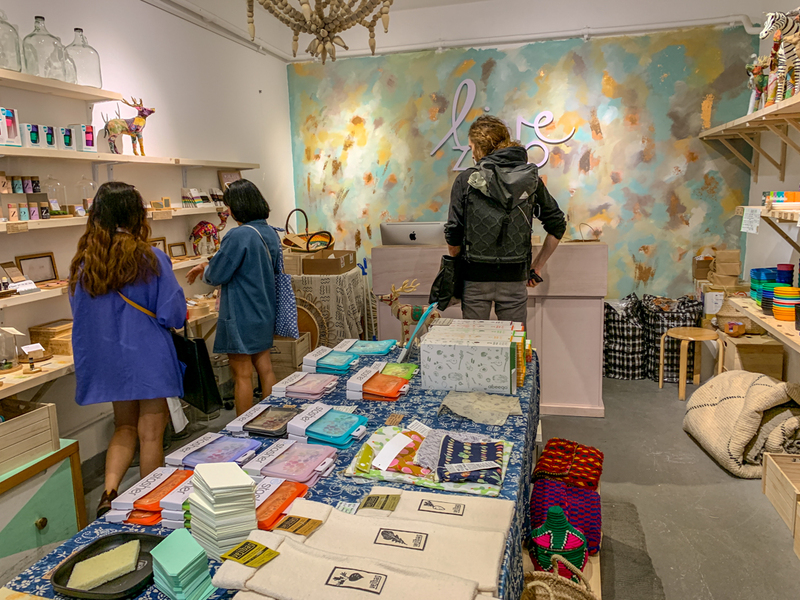 We live nearby at it was the first store we visited as we moved in this area. 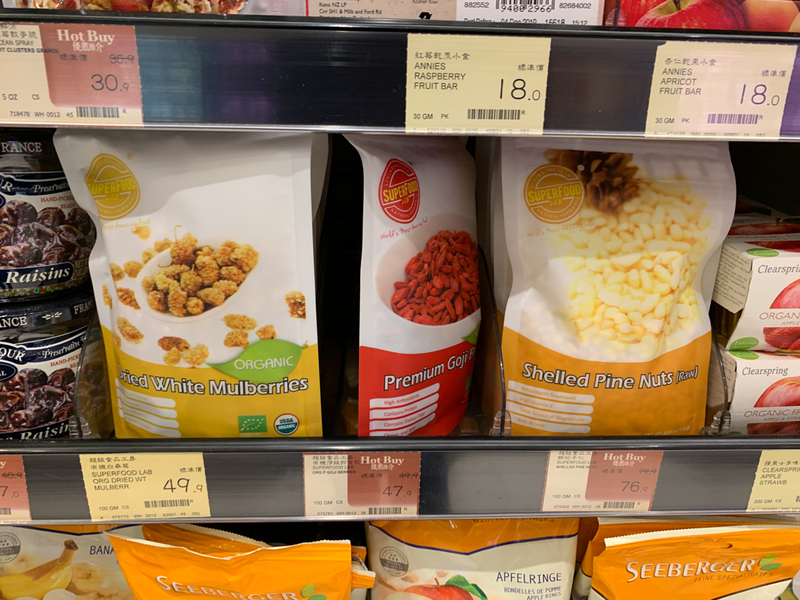 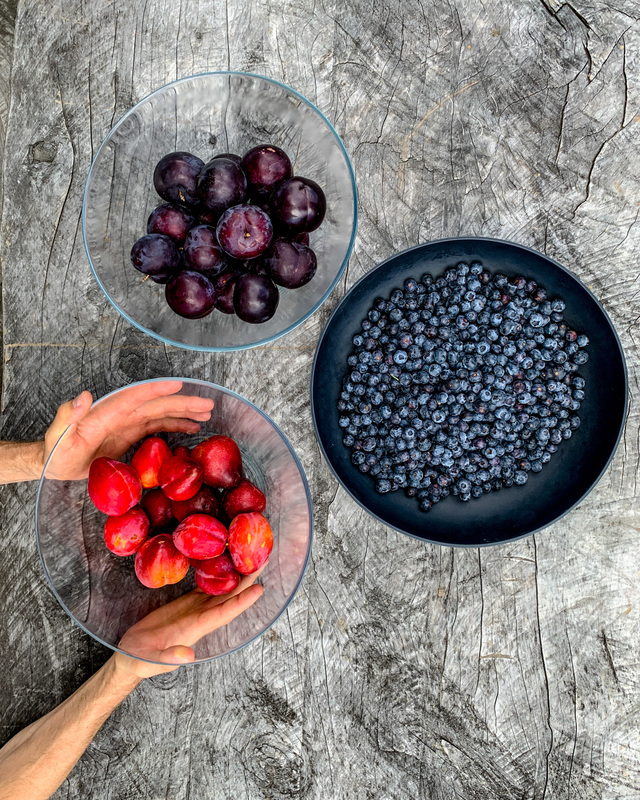 Organic muberries and organic goji. 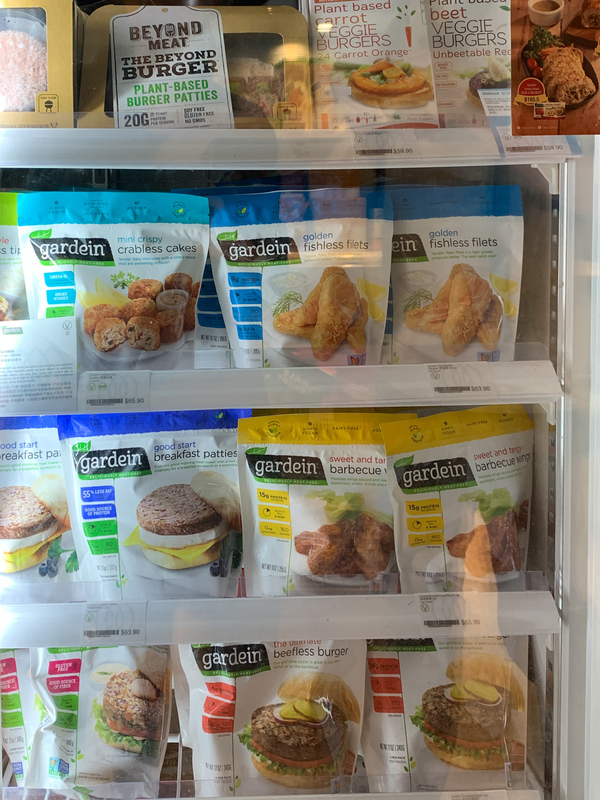 Frozen goods. 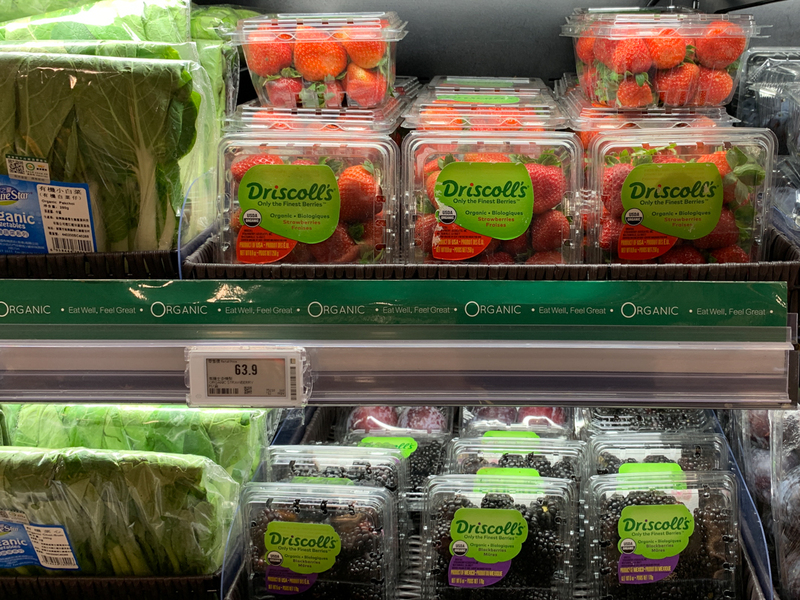 Organic broccoli, organic corn, organic blueberries. 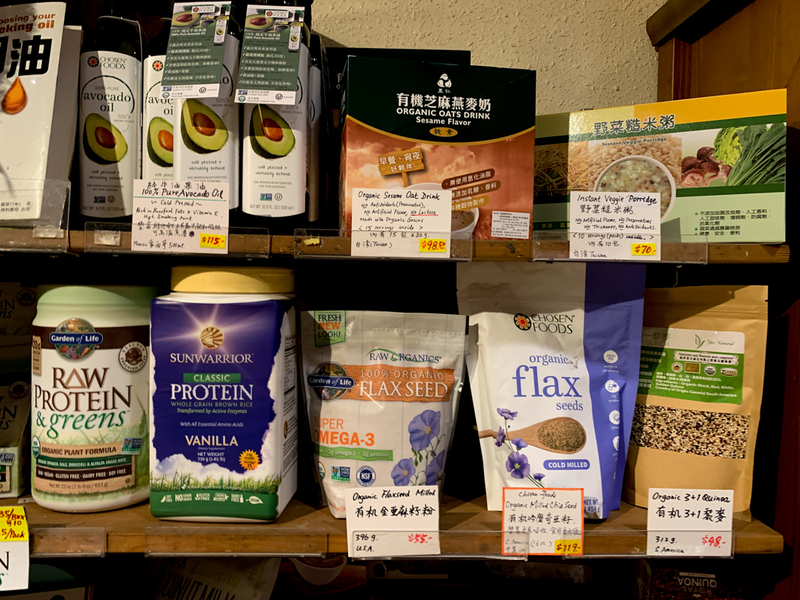 Organic nuts, flax, matcha, nutritional yeast. 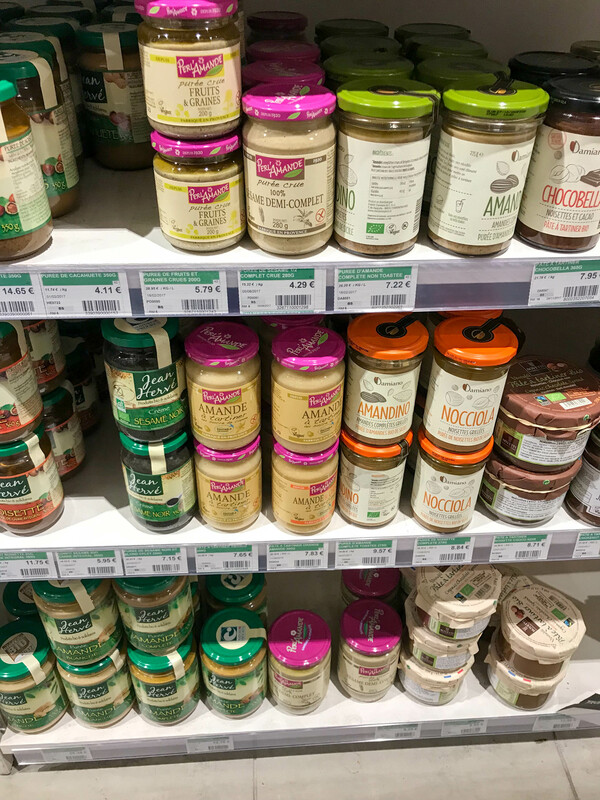 Vegan yogurt, pesto, hummus, miso, sauerkraut (not organic). 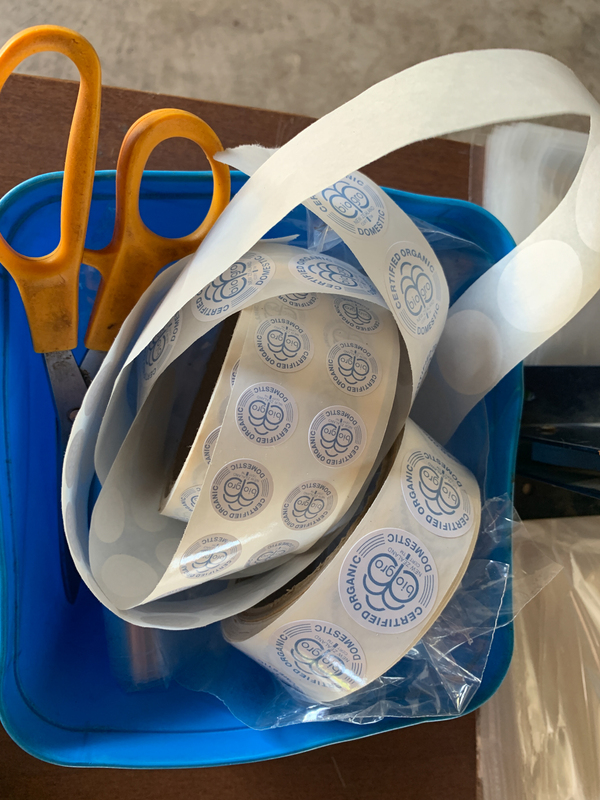 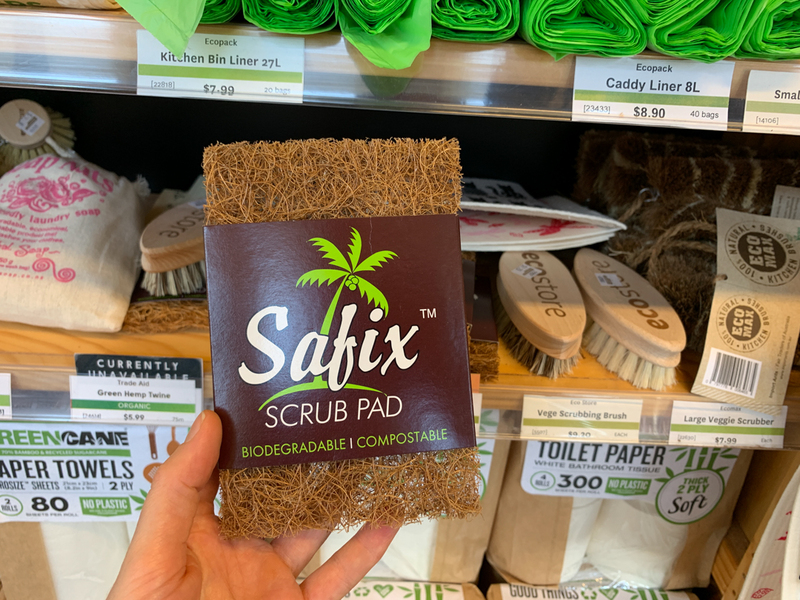 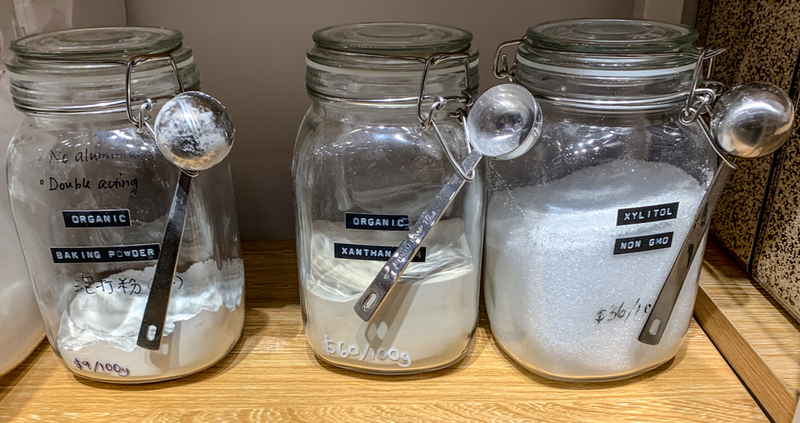 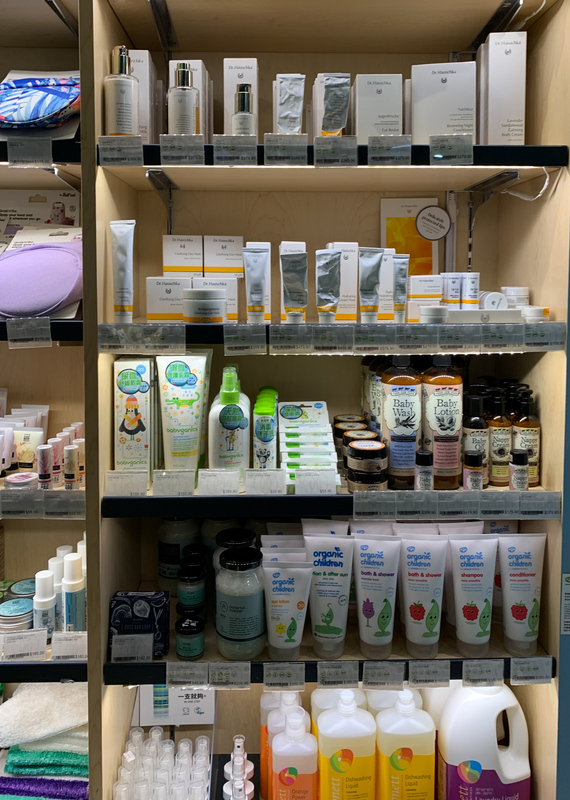 Zero waste bath and beauty products. 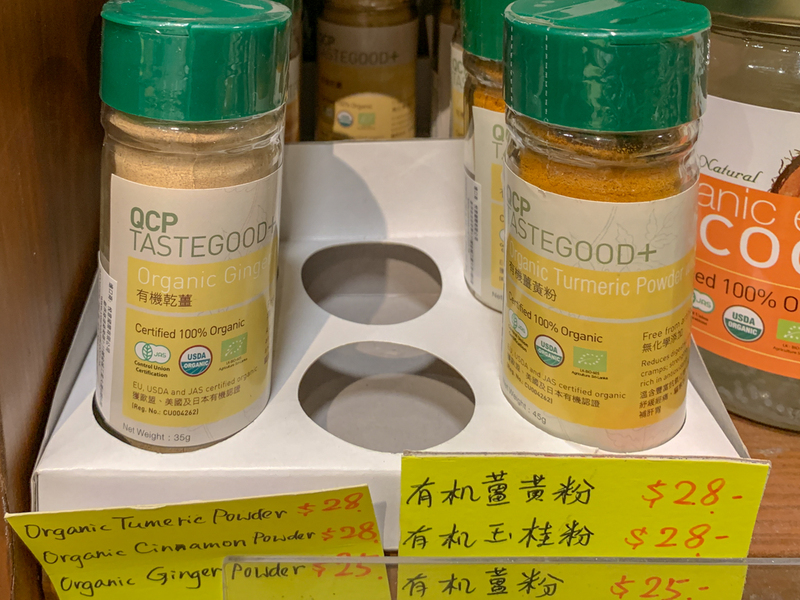 Ginger and organc tumeric powder. 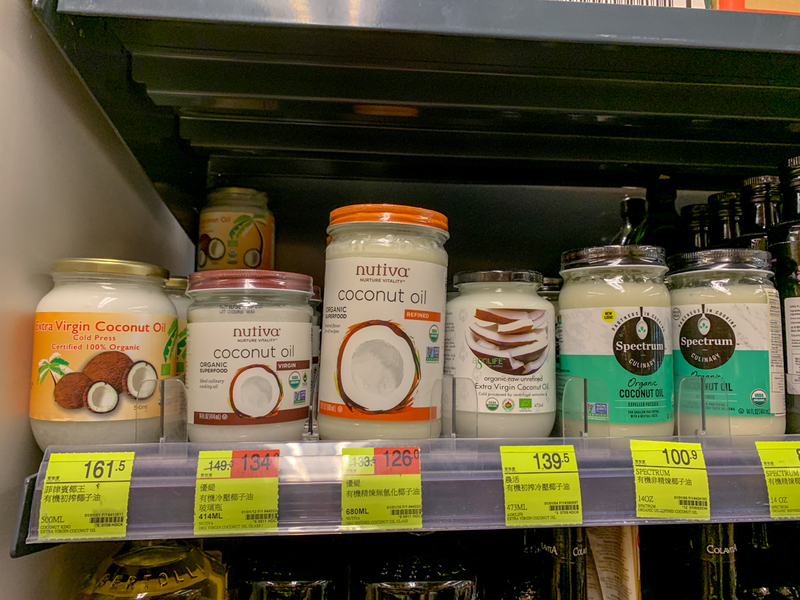 Organic coconut oil. 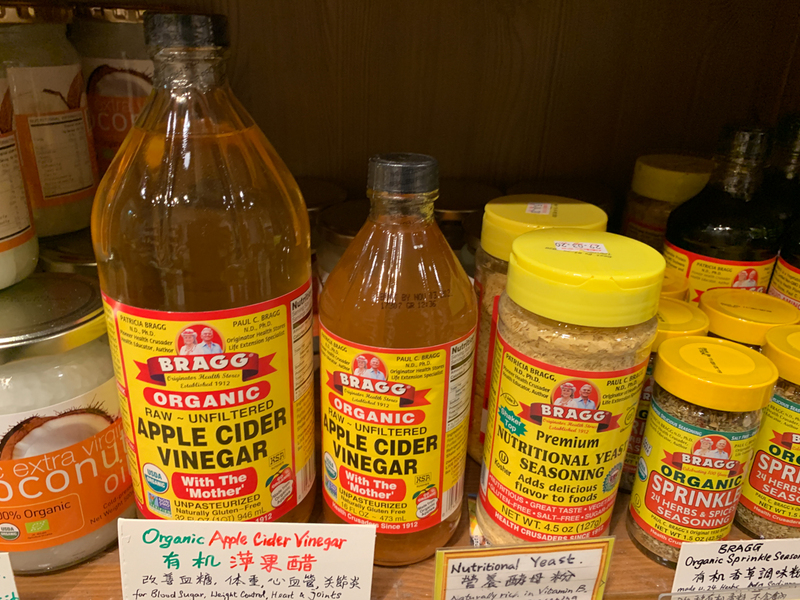 Organic apple cider vinegar. 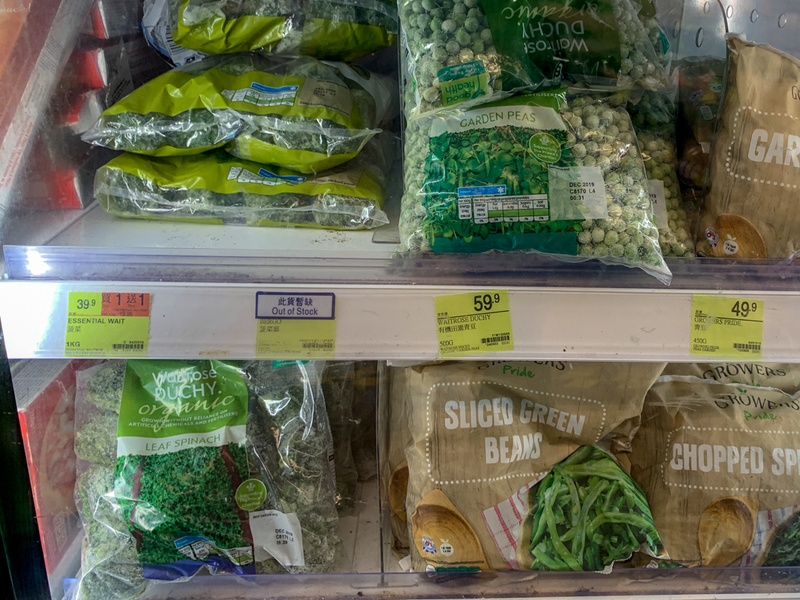 The fridge with some organic veggies and organic greens. 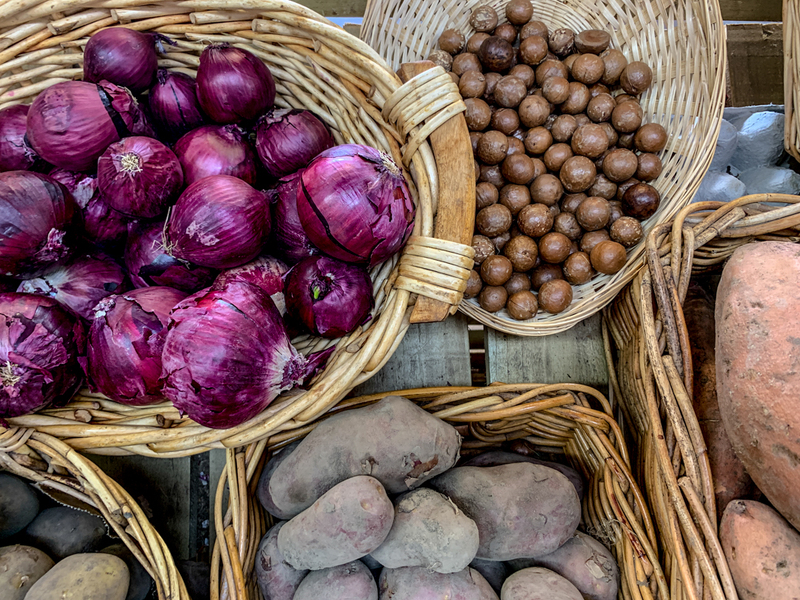 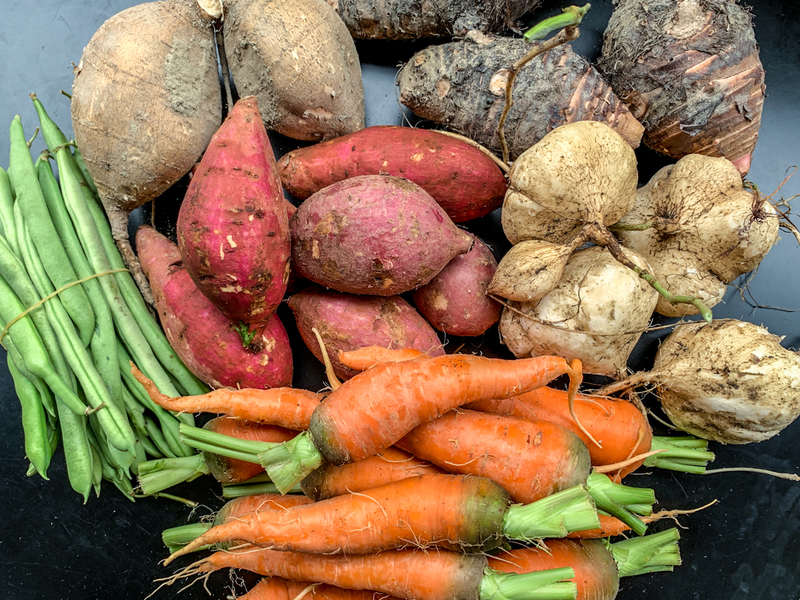 Organic potatoes and sweet potatoes. 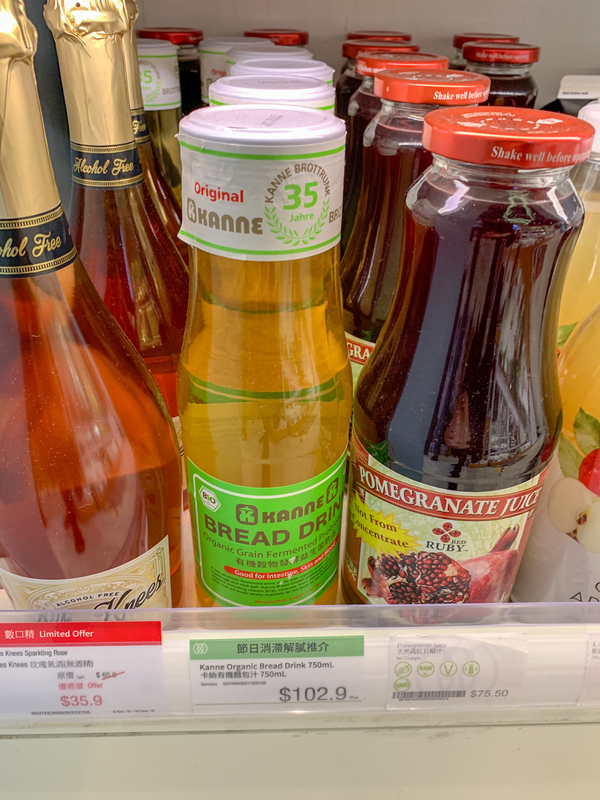 Organic bread drink, kind of like kombutcha, but not sweet. 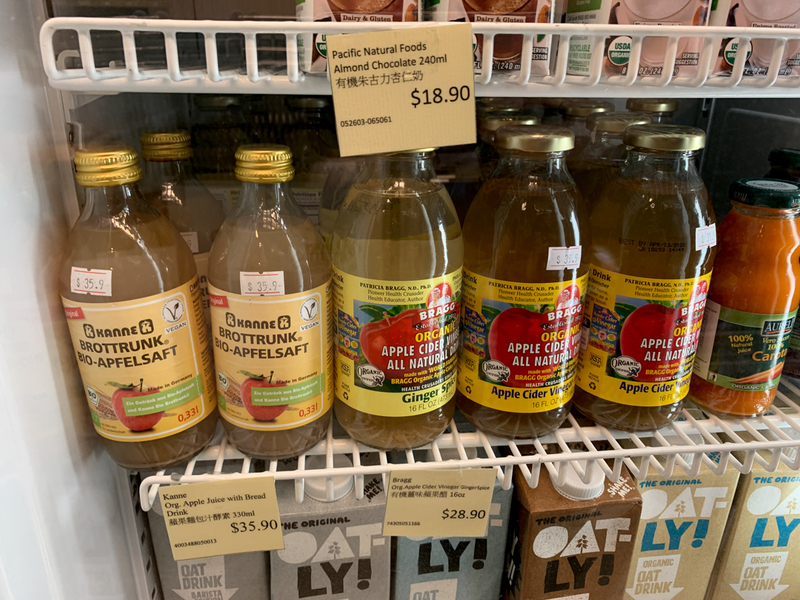 Organic apple bread drink and organic apple juice. 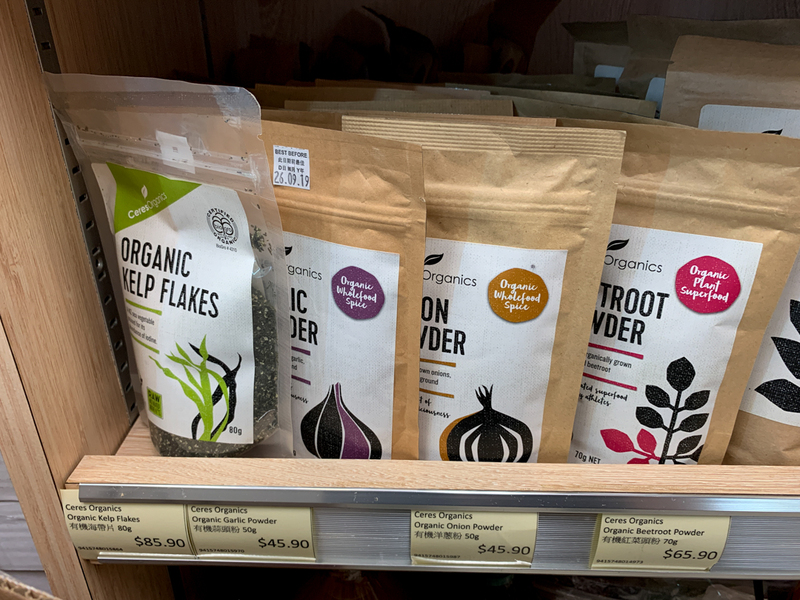 Kelp flakes, organic garlic and onion powder. 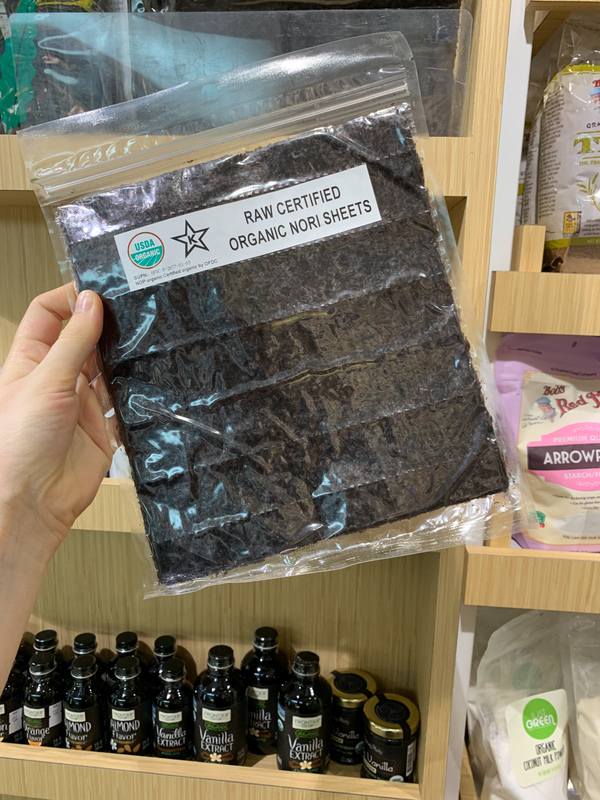 We got the organic aminos. 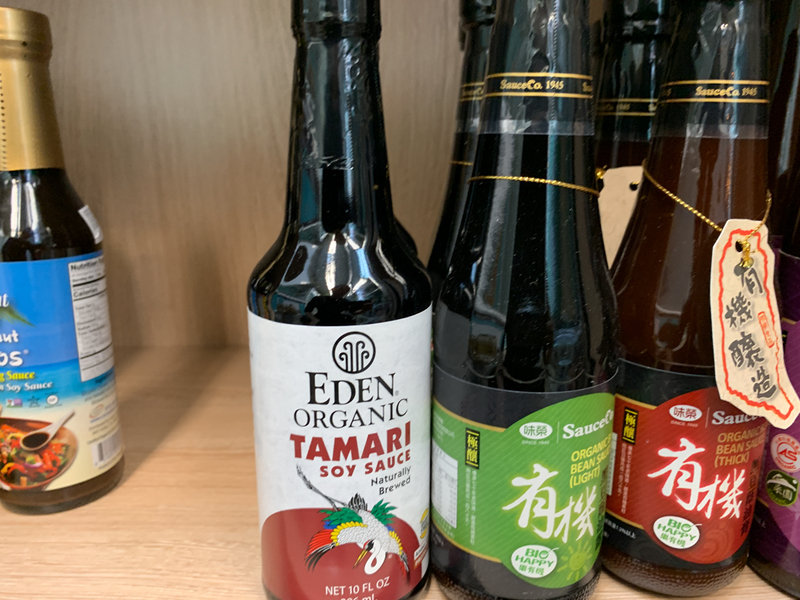 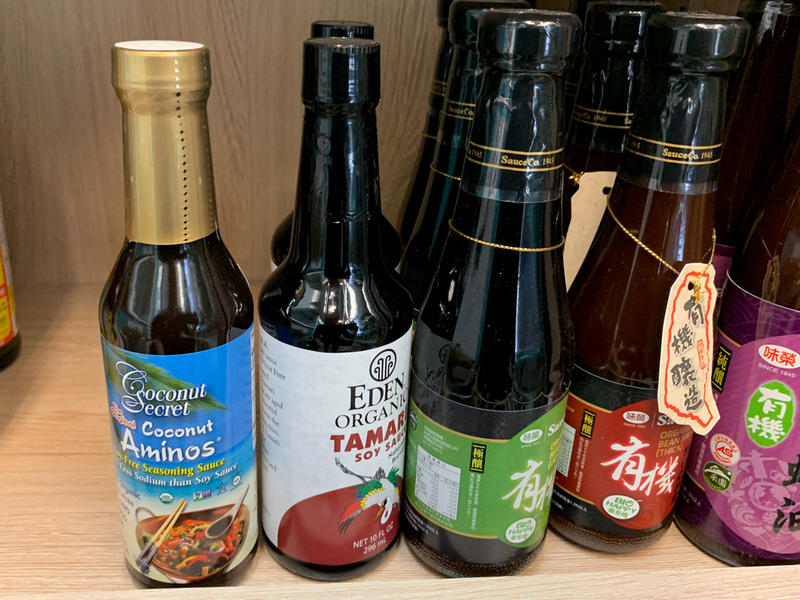 organic soy sauce, tamari, coconut aminos and teriyaki sauce. 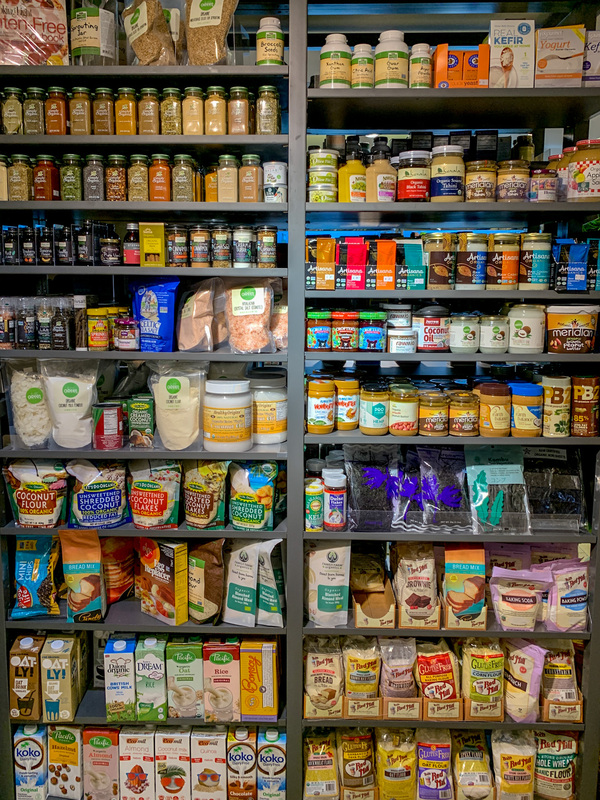 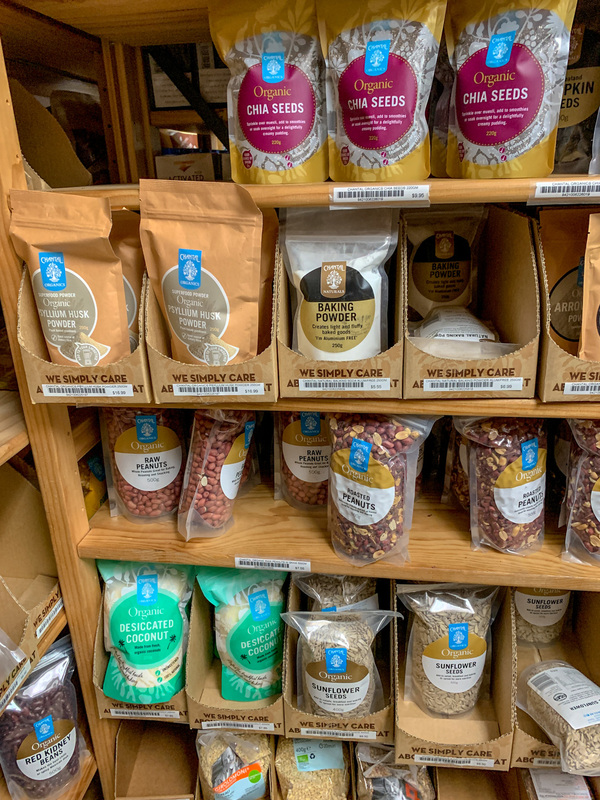 Organic spices, flour, sweeteners, and beans. 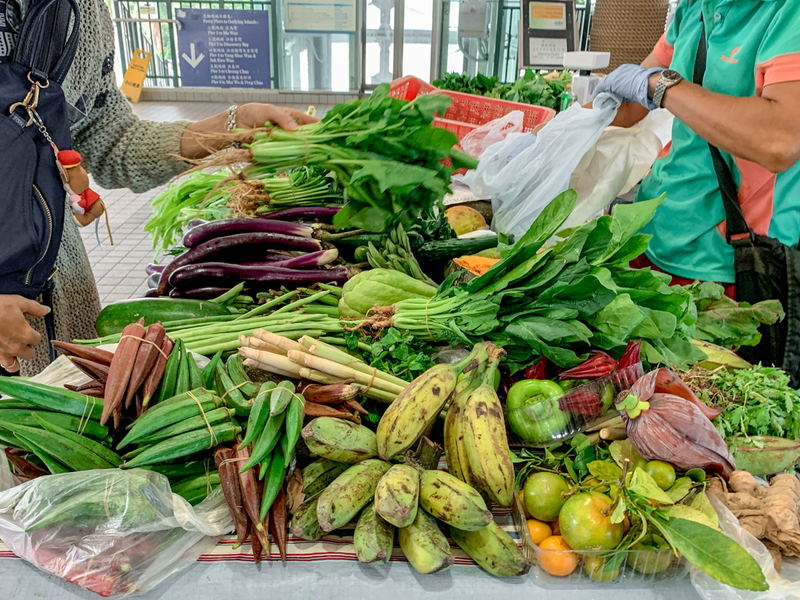 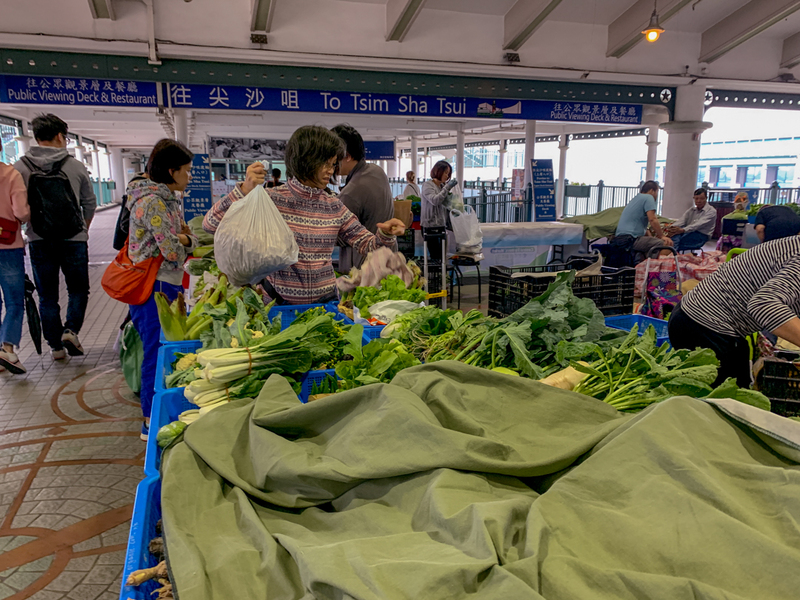 This small organic farmers’ market on the Central Star Ferry Pier No. 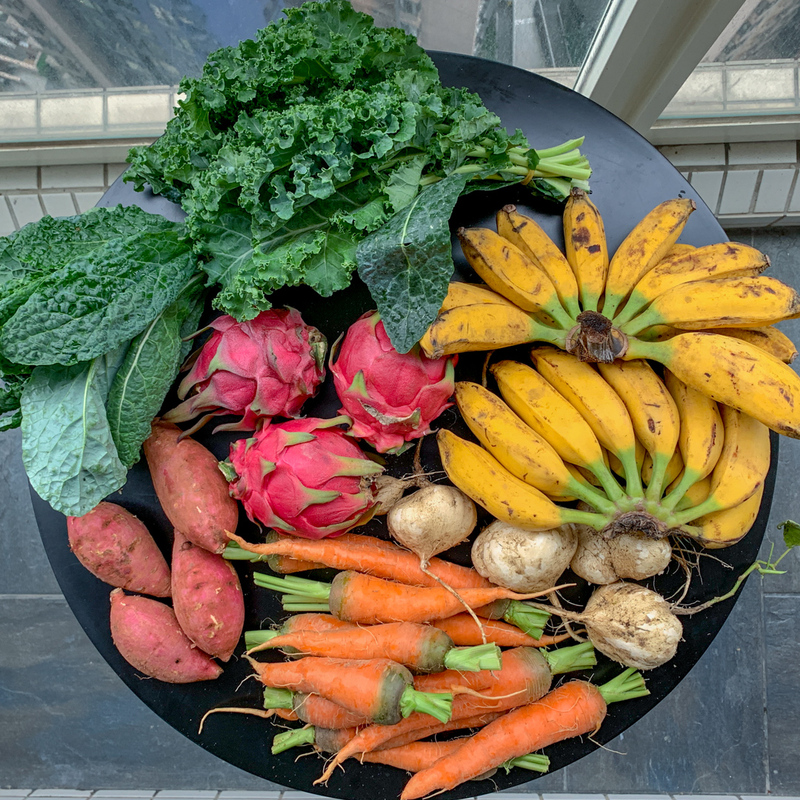 7 had everything amazing veggies, greens and fruit. 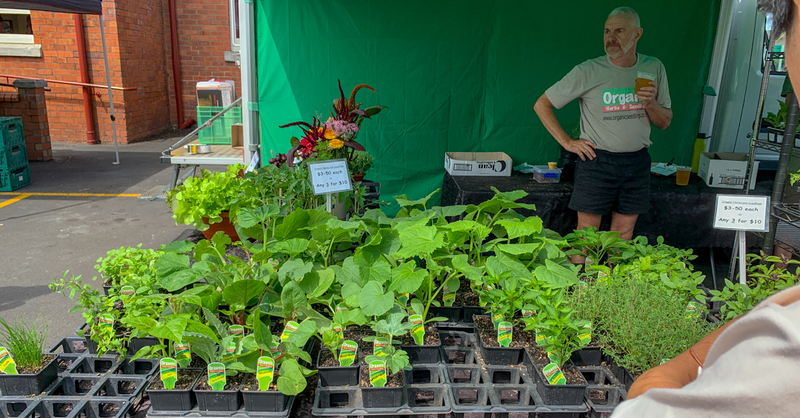 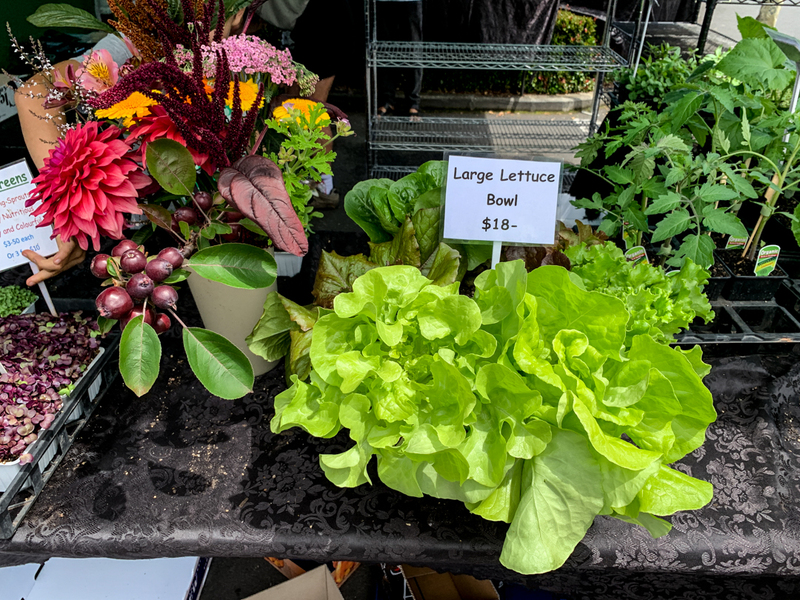 More info on the market here on the seed website . 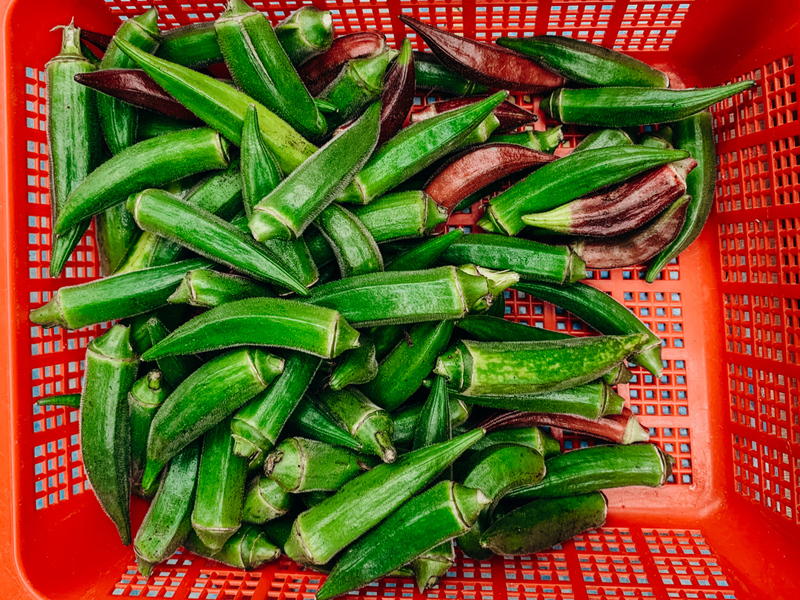 We love okra and eat it raw, we bought red and green okra here. 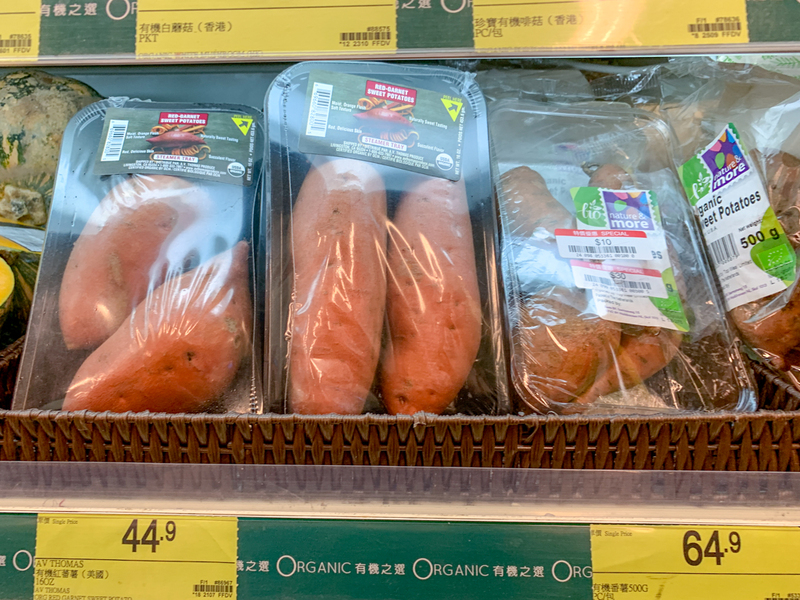 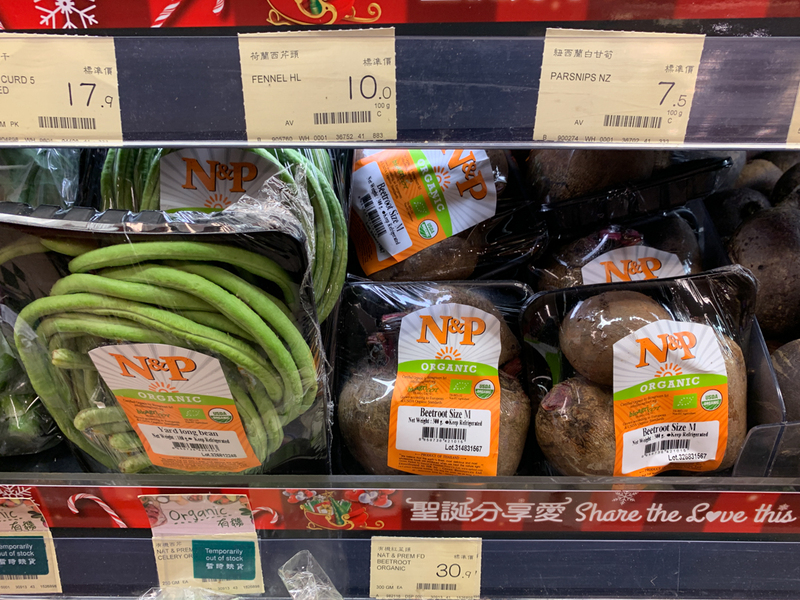 Sweet potatoes are 400 HKD for 600 g/little more than a lb. 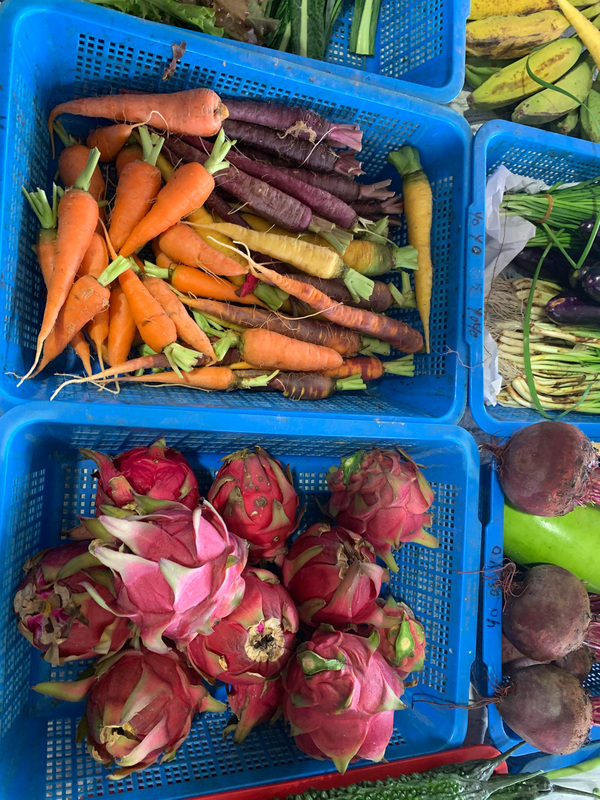 Organic beets, radishes, carrots, beans. 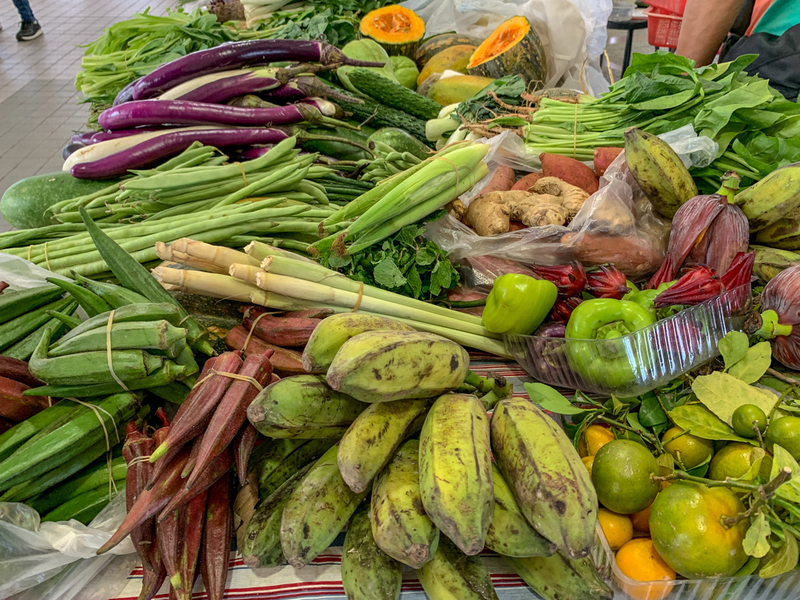 Our market haul. 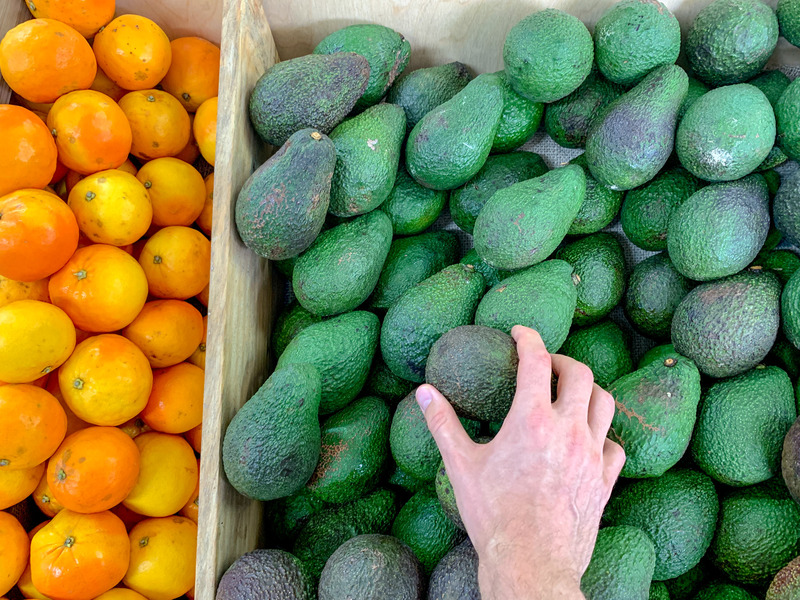 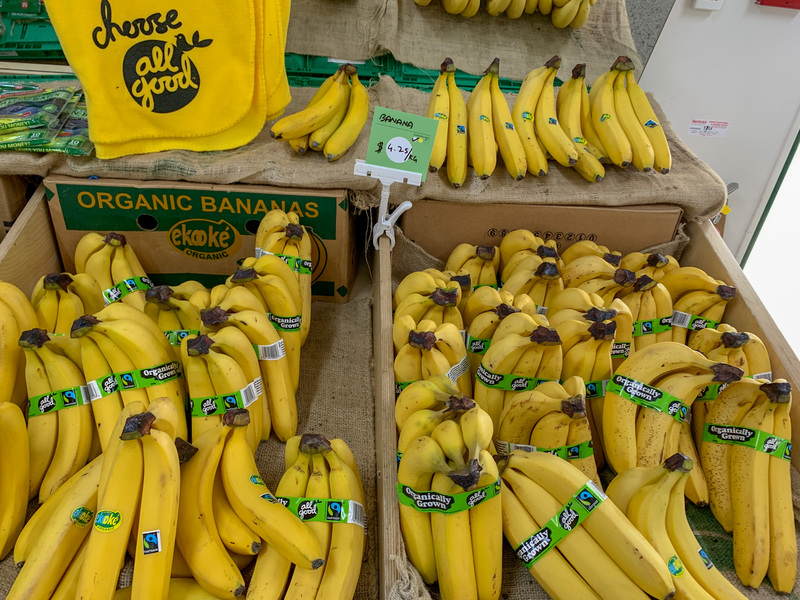 The regular organic bananas and organic avocado is from a supermarket. 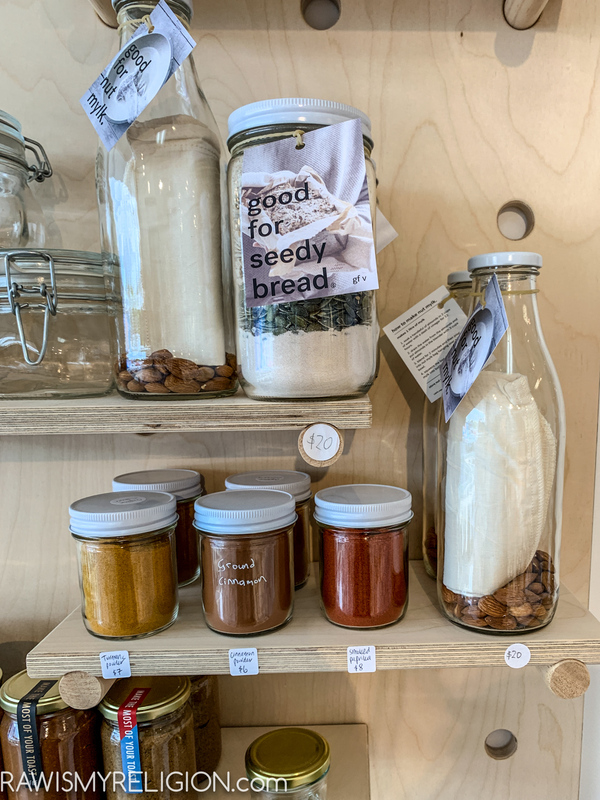 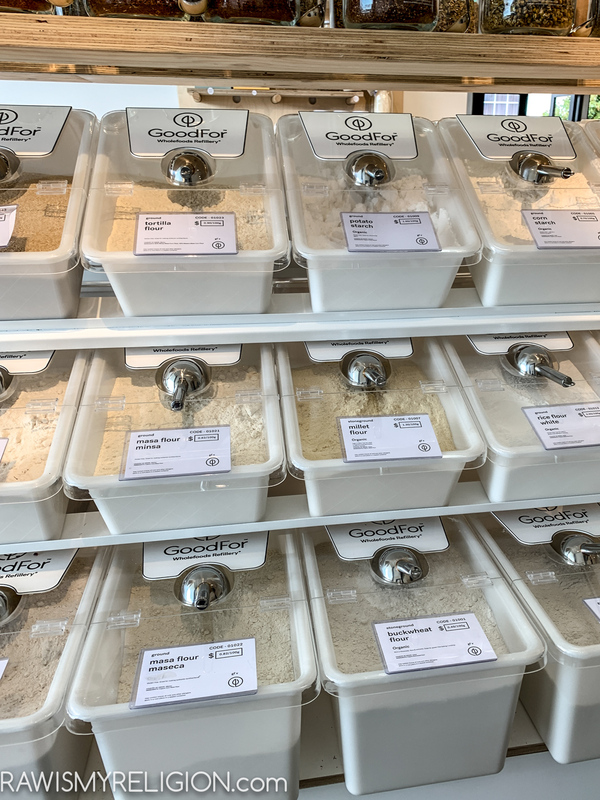 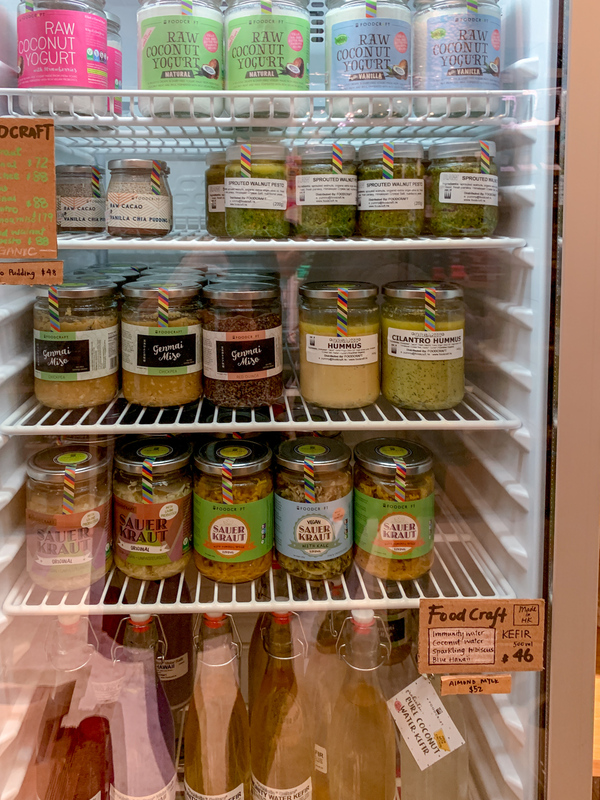 Super excited about this store and can’t wait to go back to Spice Box Organics to get the fermented cashew cheese tomorrow. 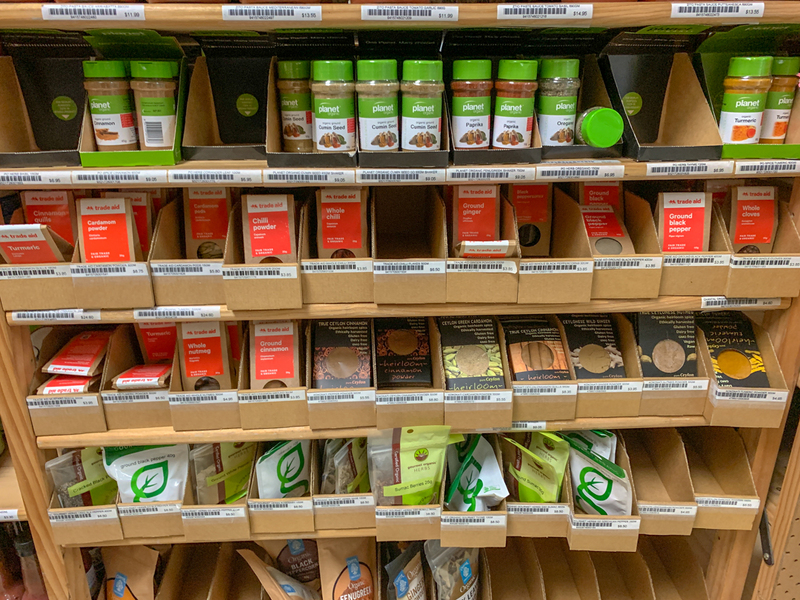 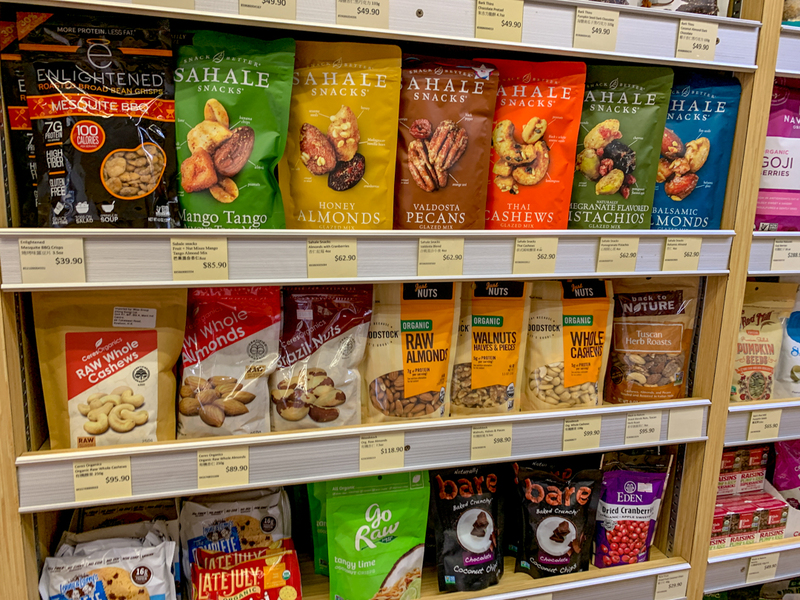 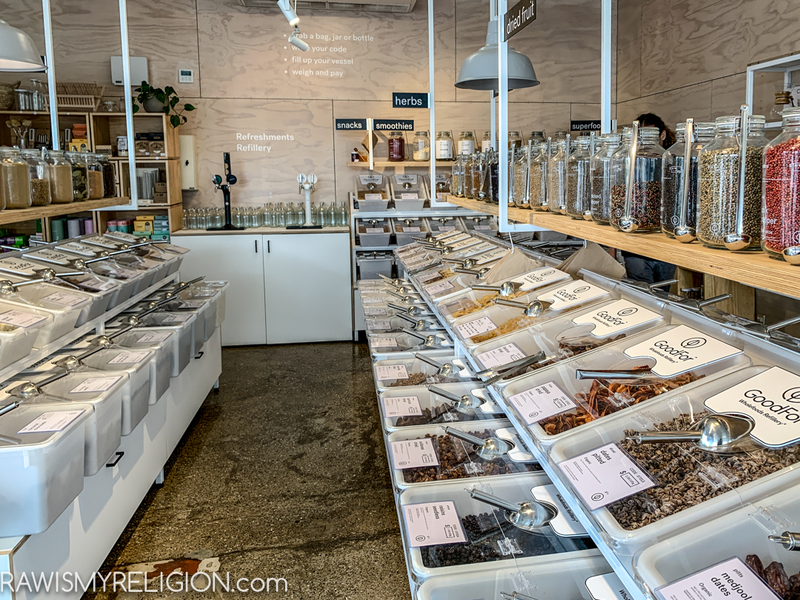 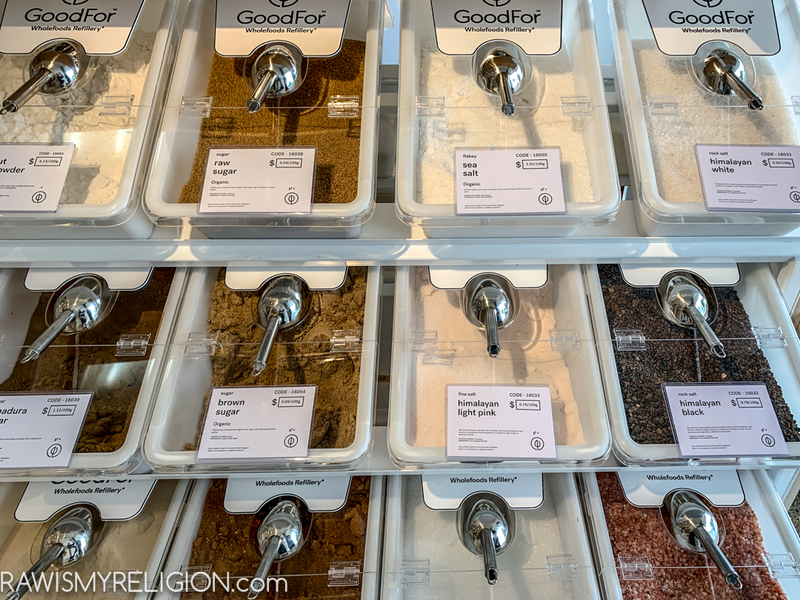 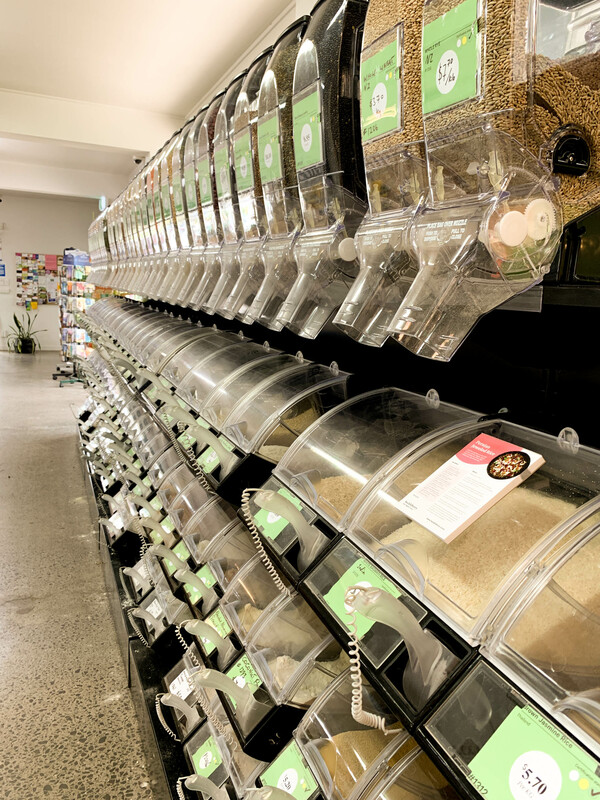 Spice box has a great selection of organic raw nuts. 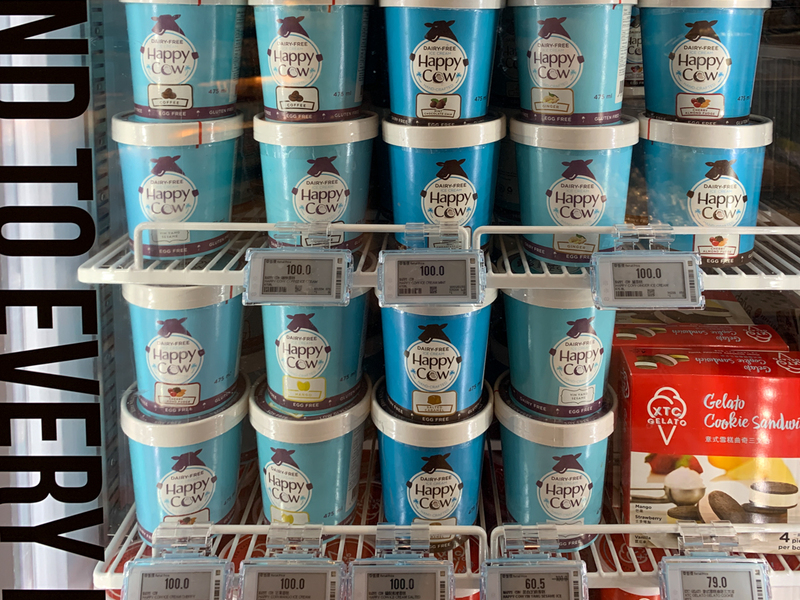 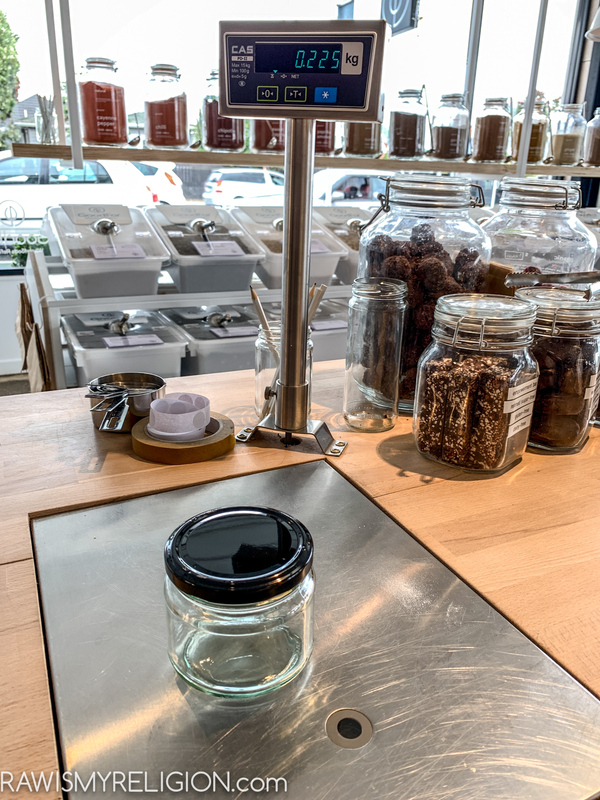 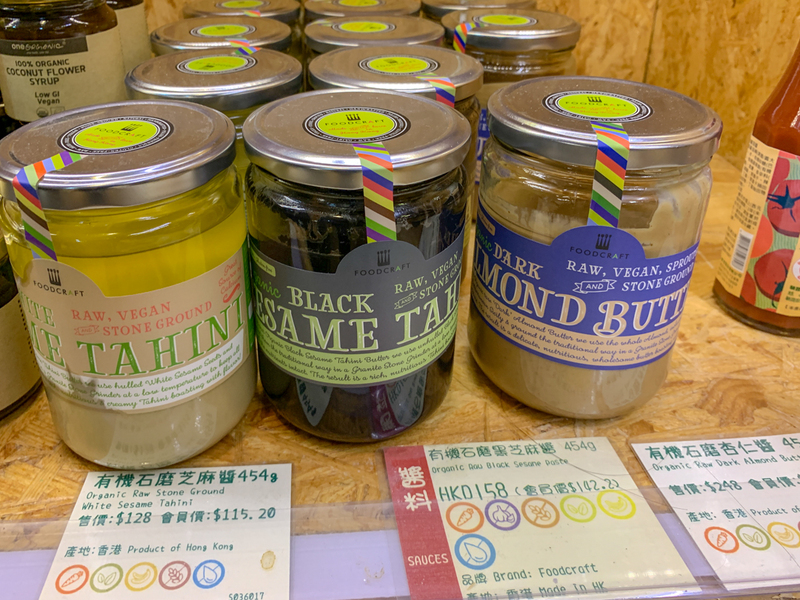 The cashew cheese is raw vegan and organic and was around 100 HKD a jar. 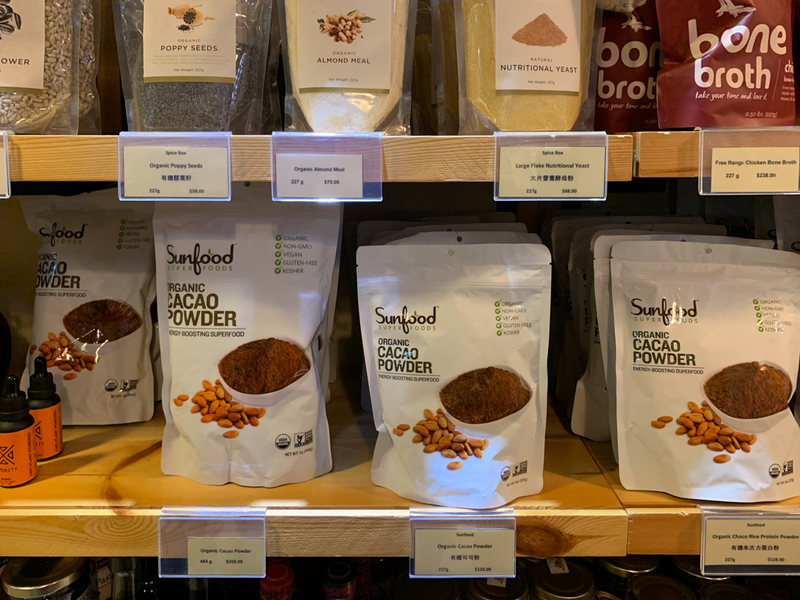 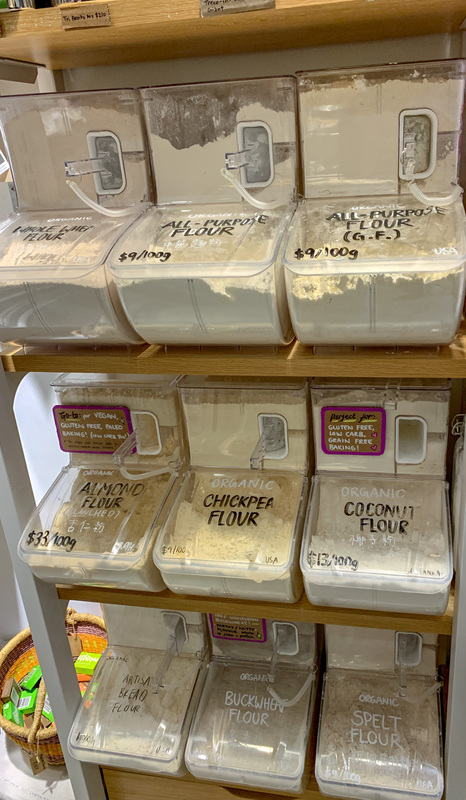 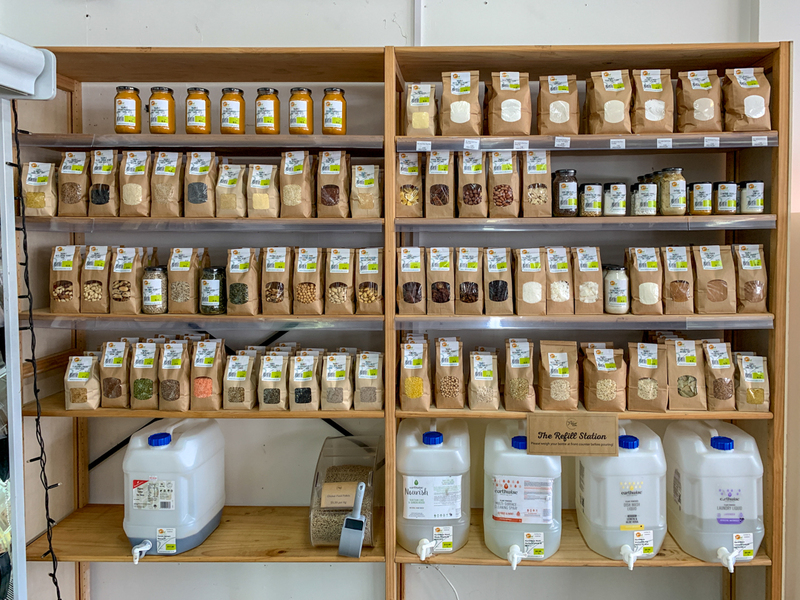 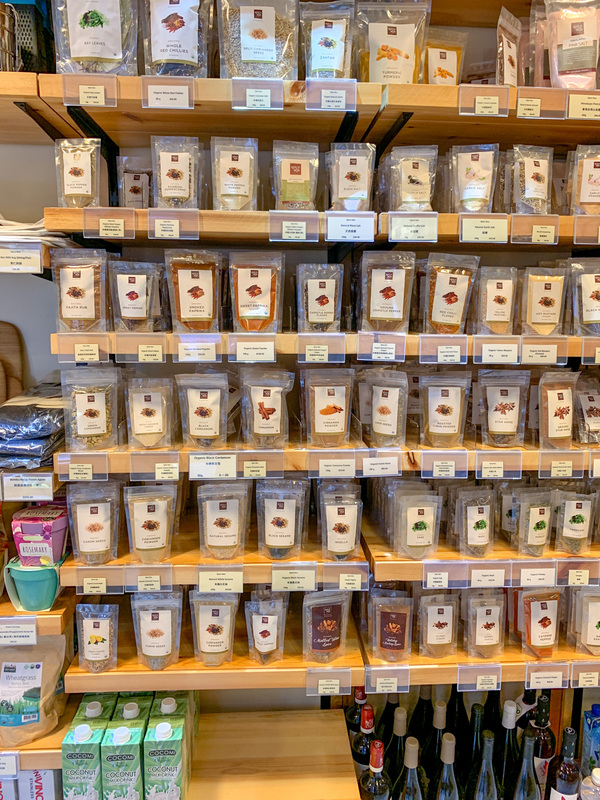 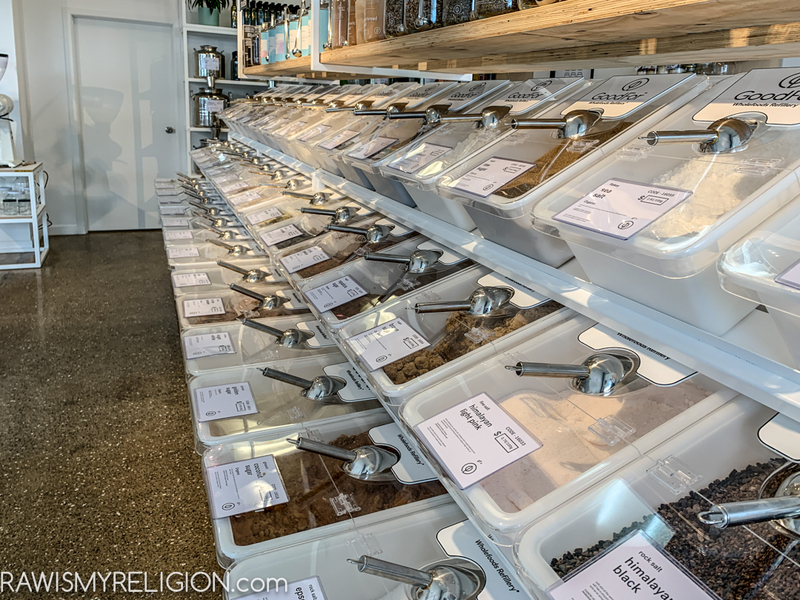 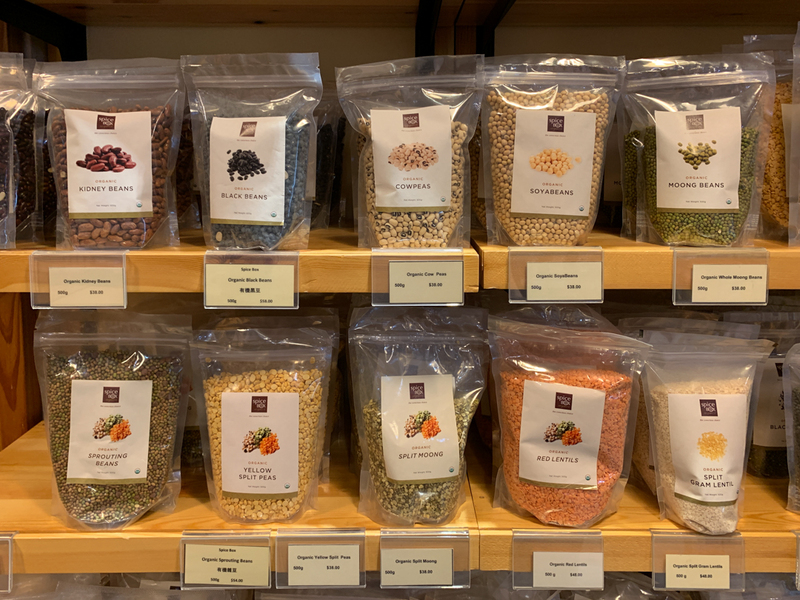 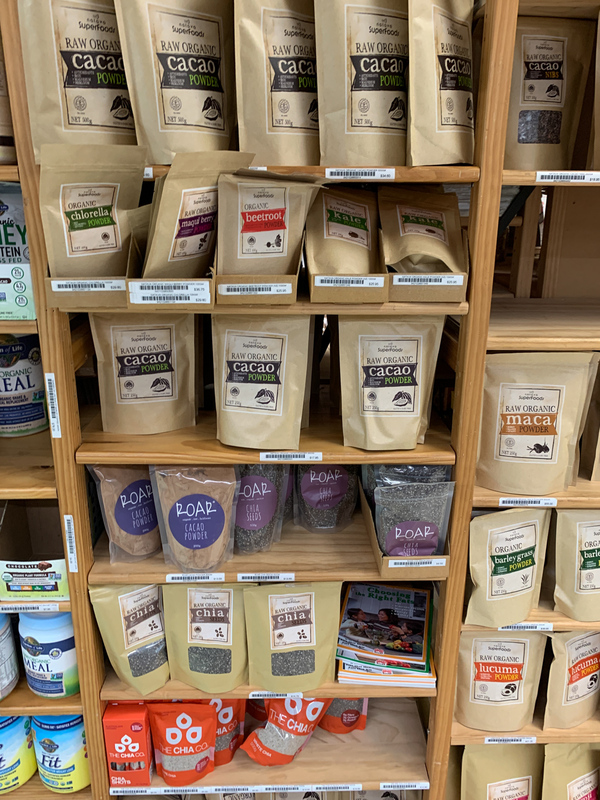 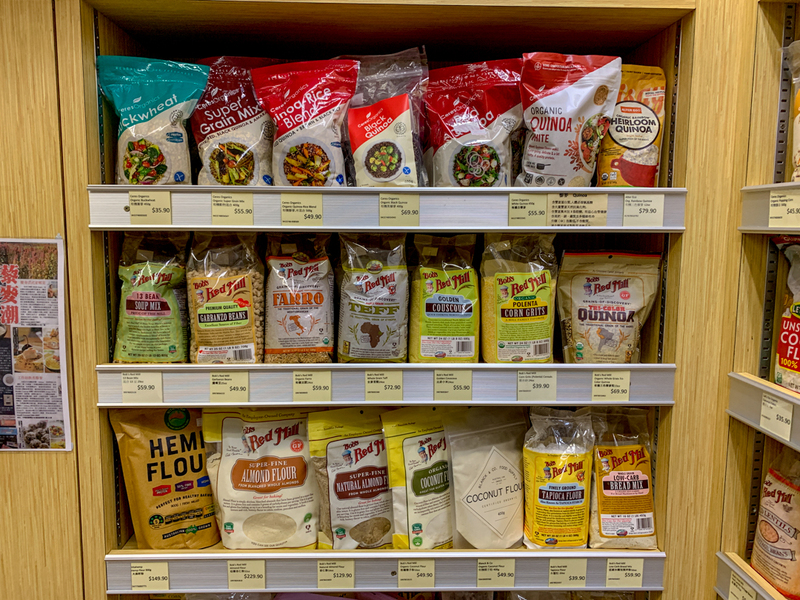 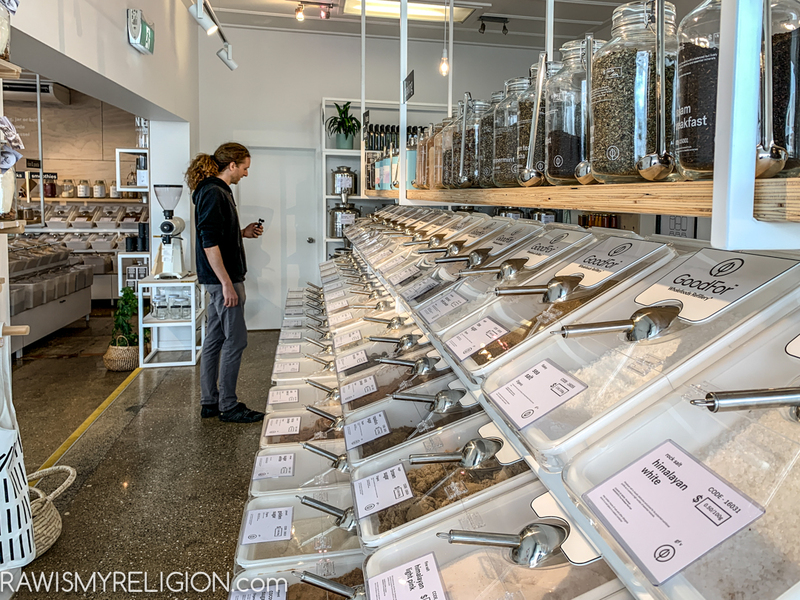 The organic spices section at Spice Box Organics is amazing. 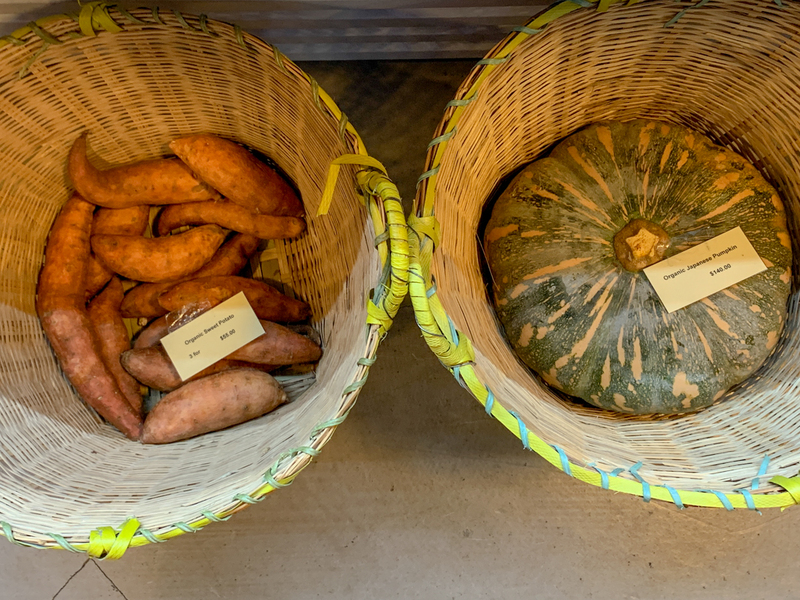 Organic sweet potatoes and pumpkin. 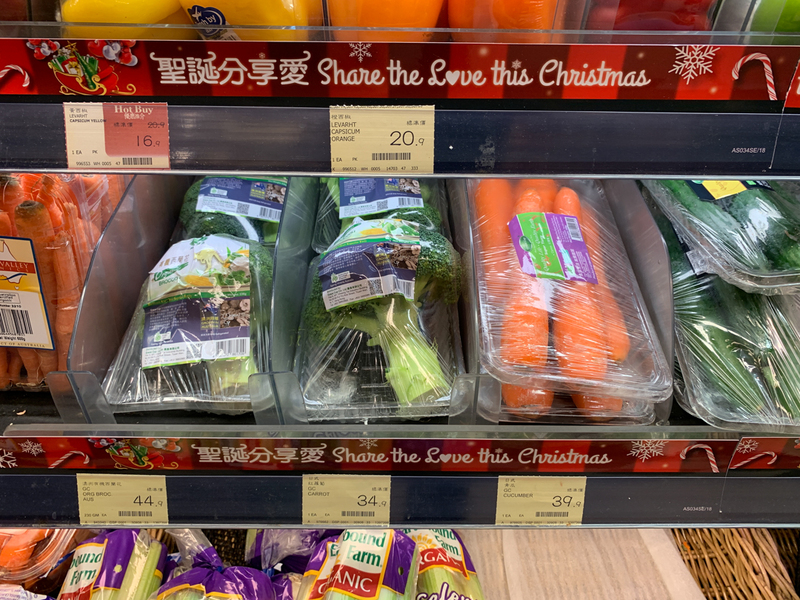 Medium sized carrots not in picture were around 10 HKD each. 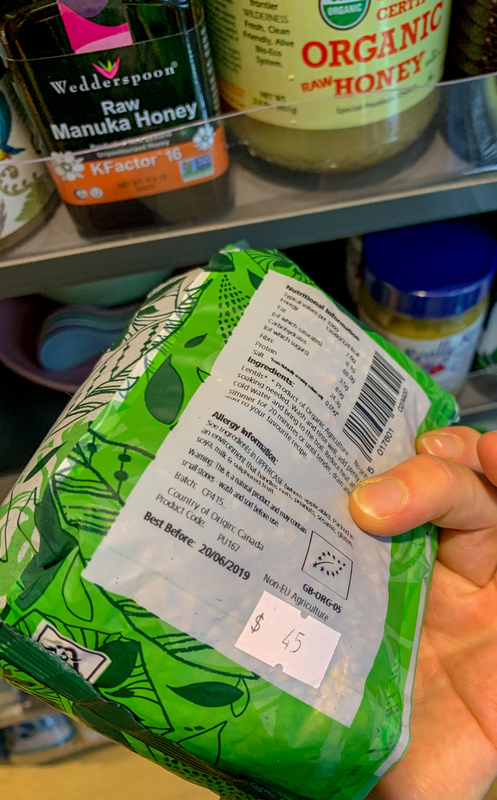 The sauerkraut was organic and pricy. 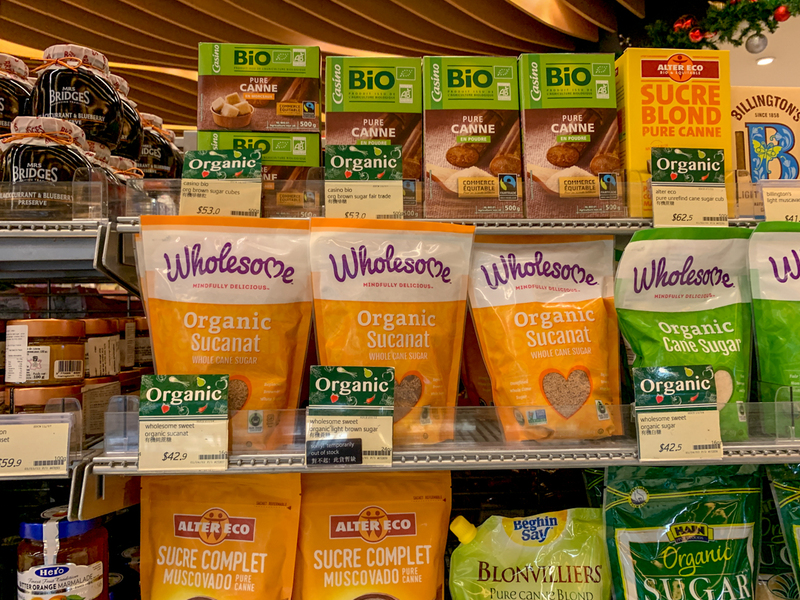 Organic cinnamon and cocoa powder. 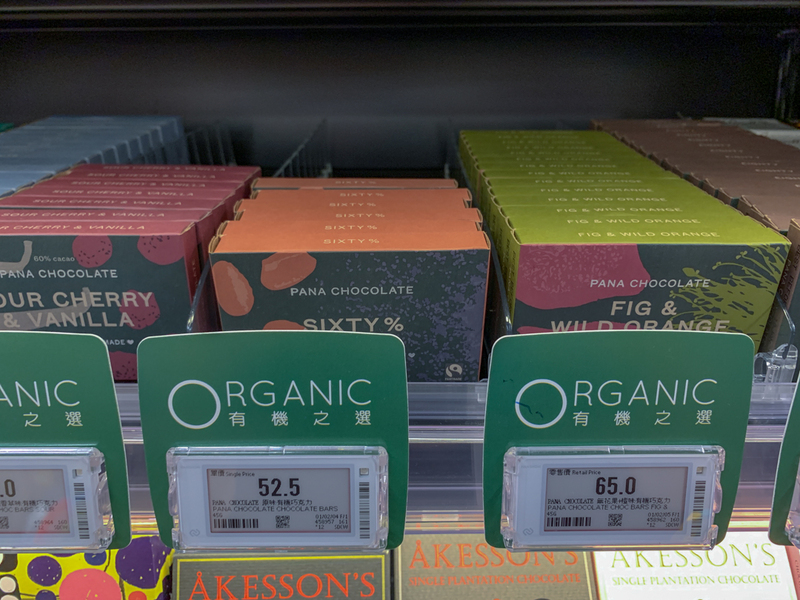 They also had organic cacao butter. 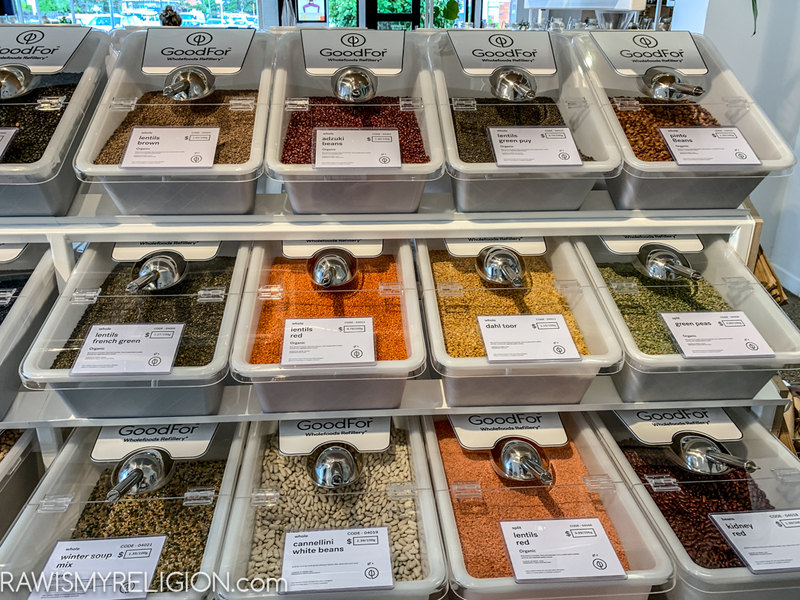 Organic beans, chickpeas, lentils at Spice Box Organics. 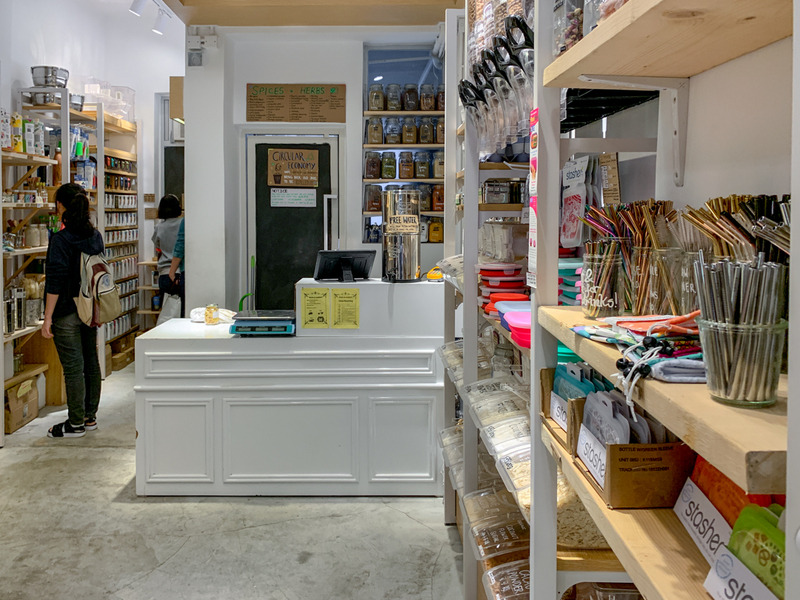 Well hidden in a small mall on the first floor is a small but packt with goodies shop. 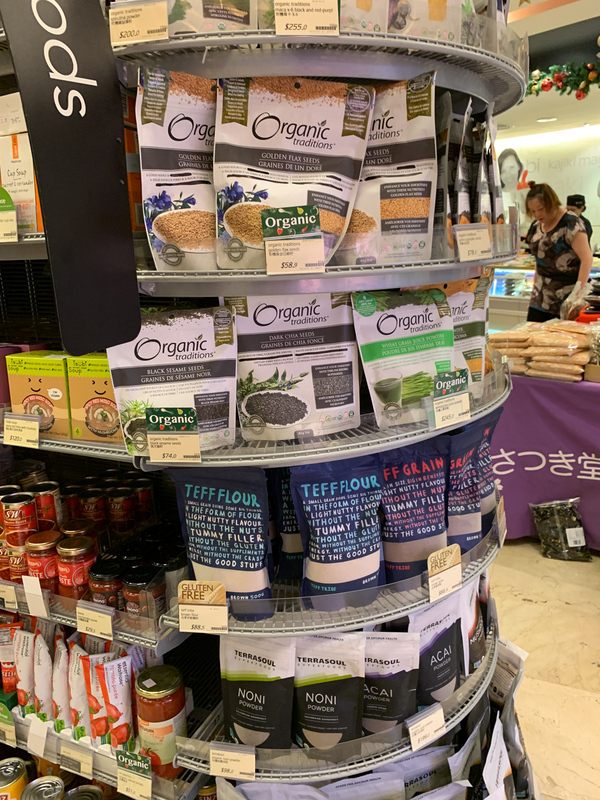 They have some amazing organic products we were looking fore everywhere. 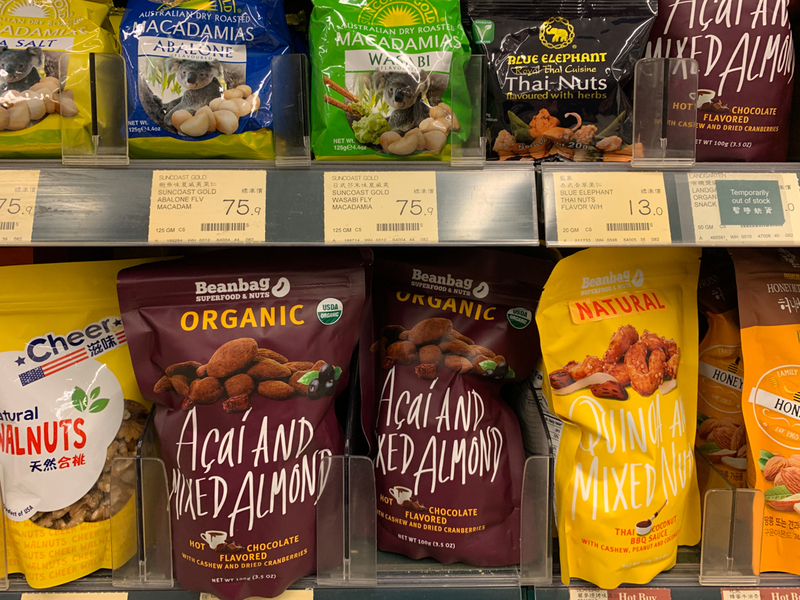 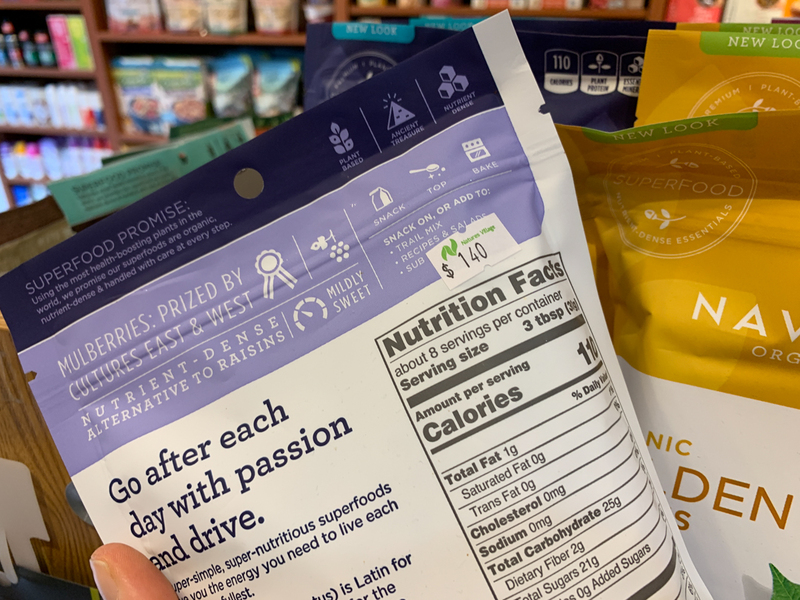 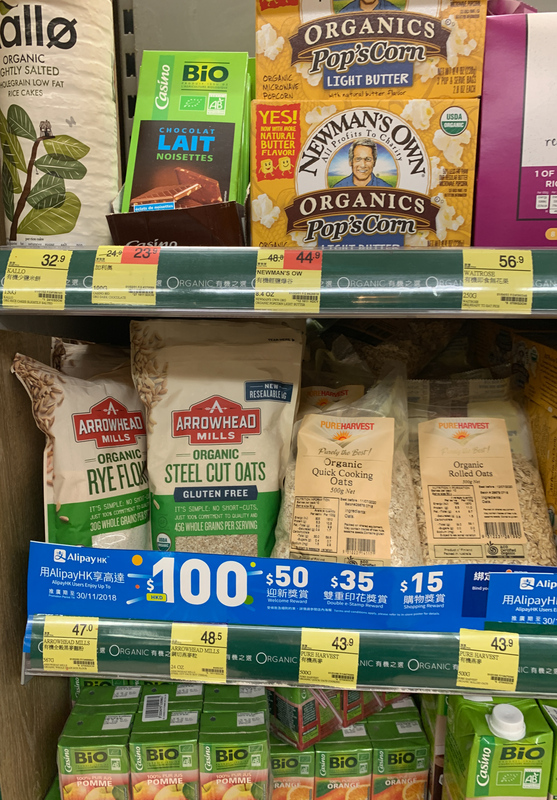 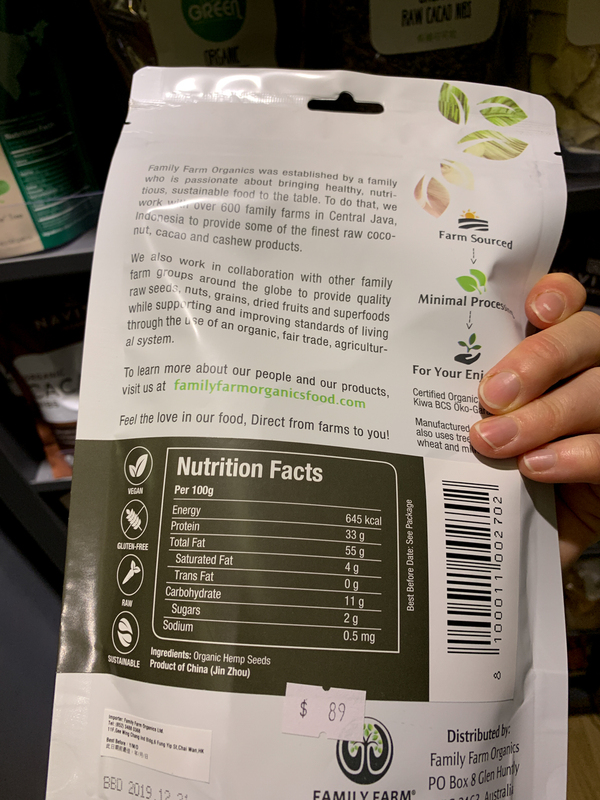 They also had Braggs Aminos, we never buy they as it’s not certified organic but they are salt-free if it’s something you where looking for you’re welcome! 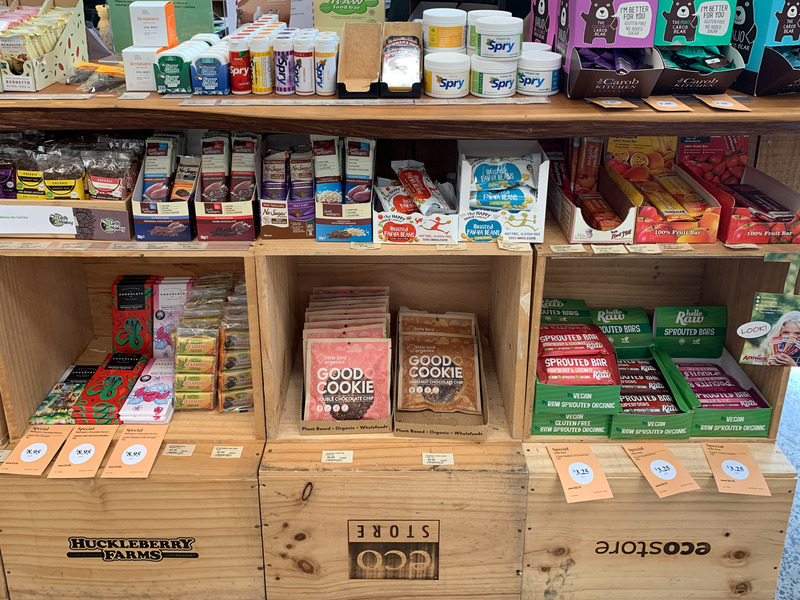 The is a box or life food raw bars, the bars were sold out but will be back in soon probably. 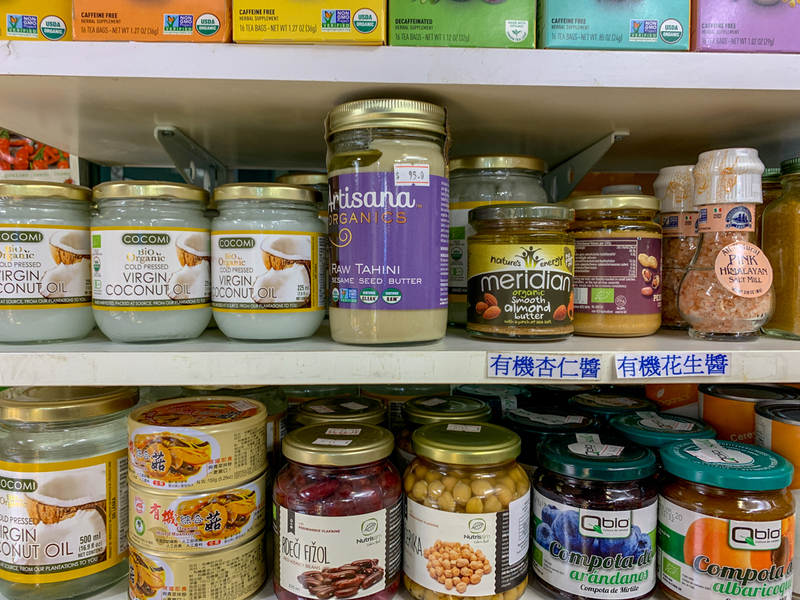 The raw organic tahini we were looking for everywhere. 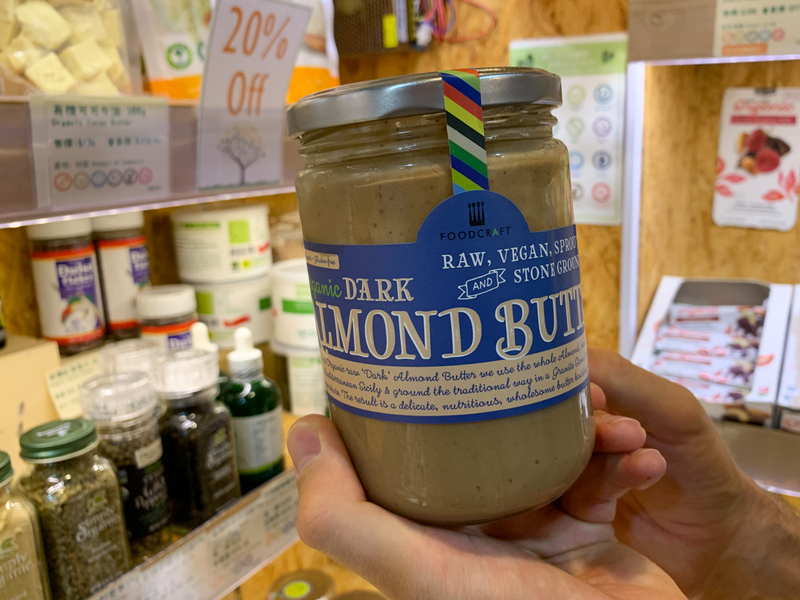 Raw organic tahini a little less than 100 HKD. 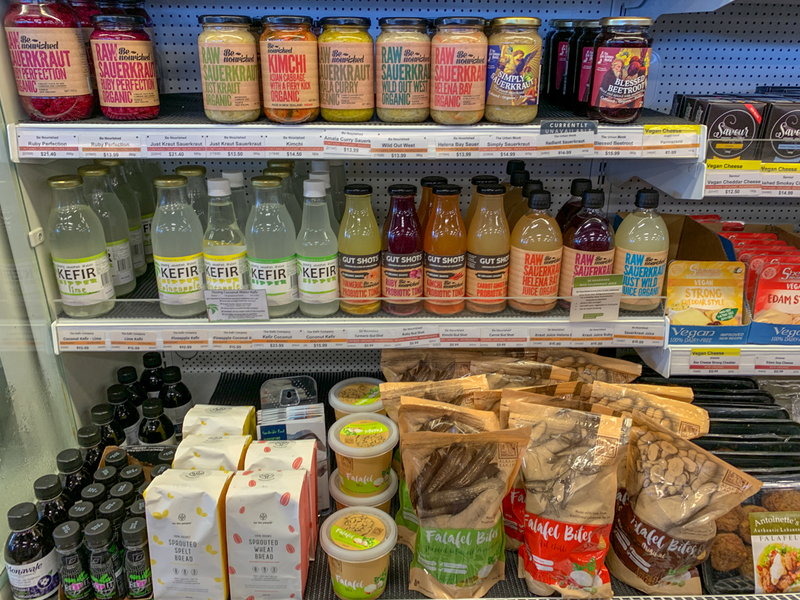 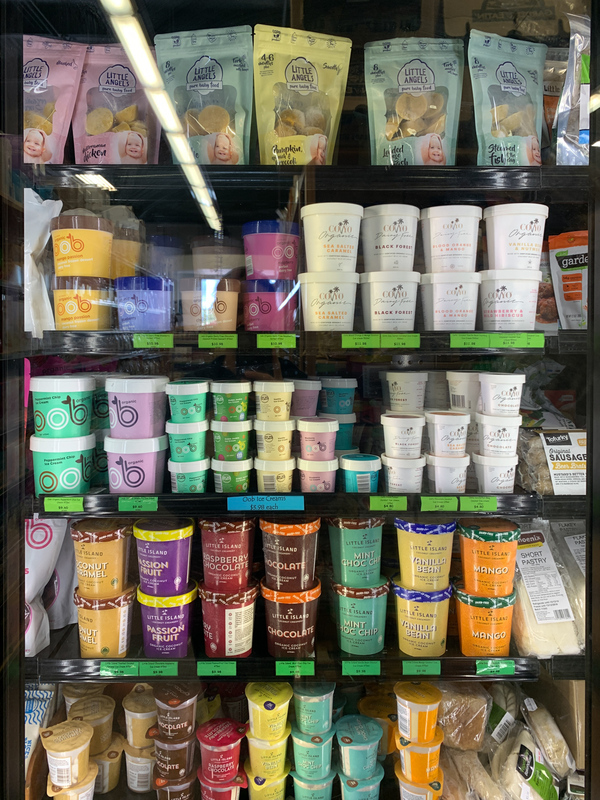 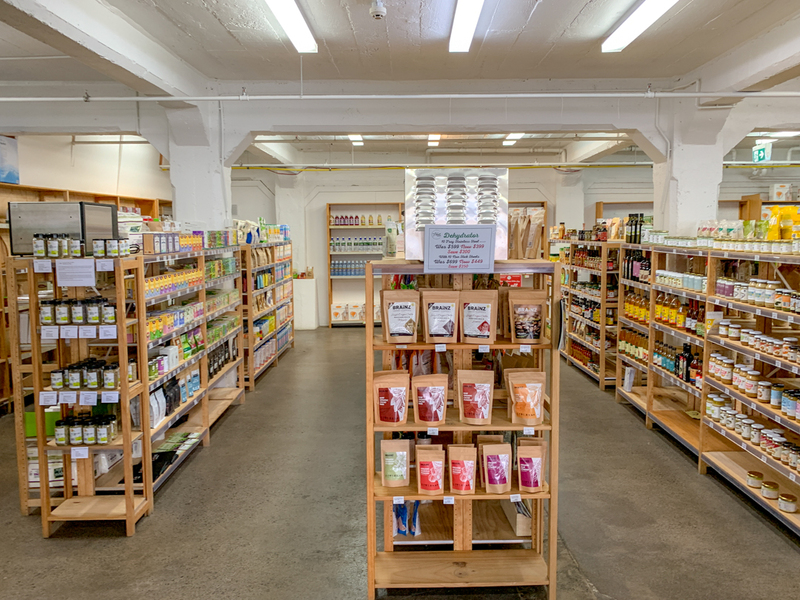 Organic snacks and Dr.Bronner Soaps. 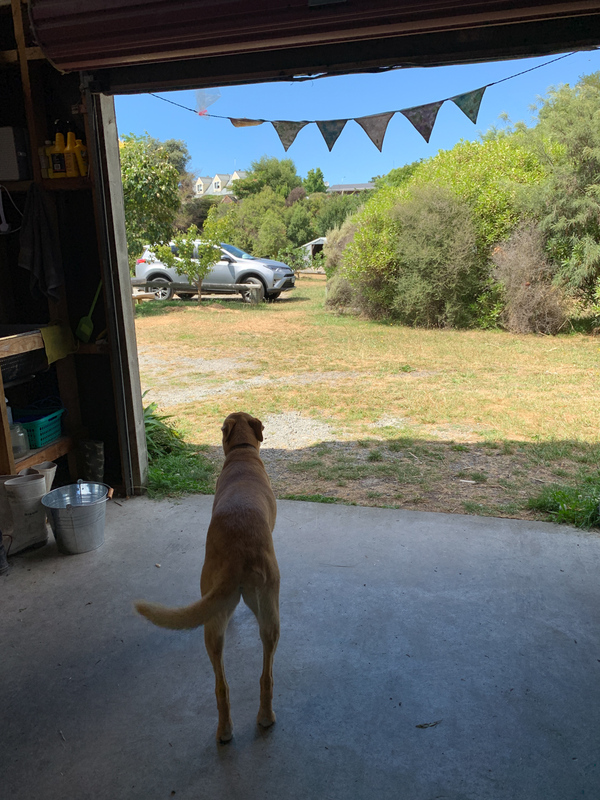 1/2 parts of the shop. 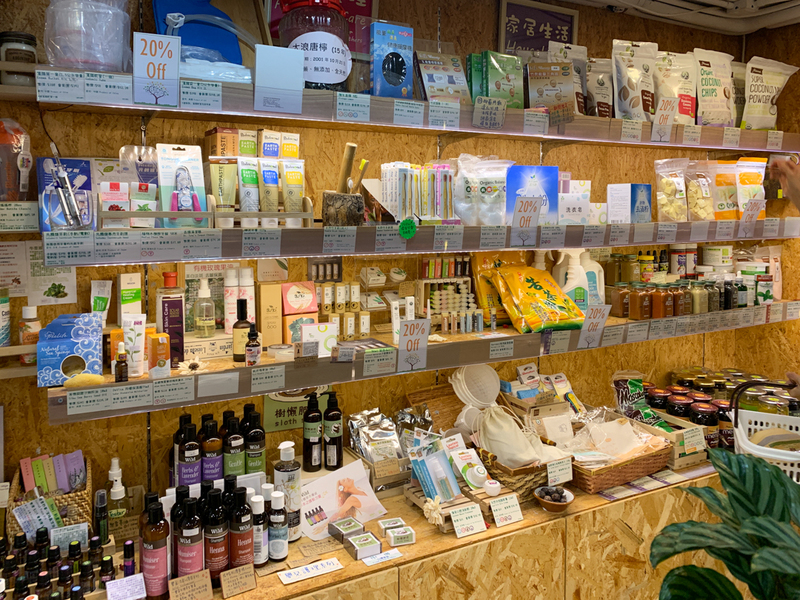 2/2 part of the shop. 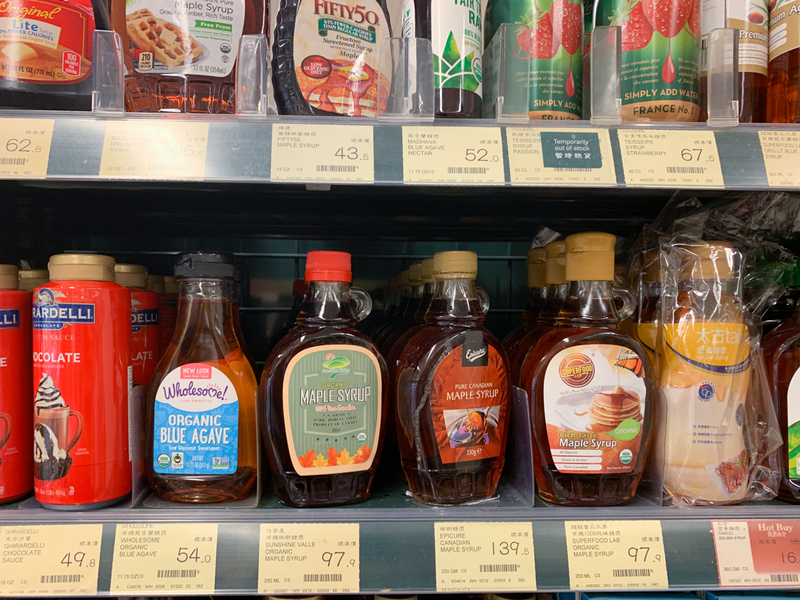 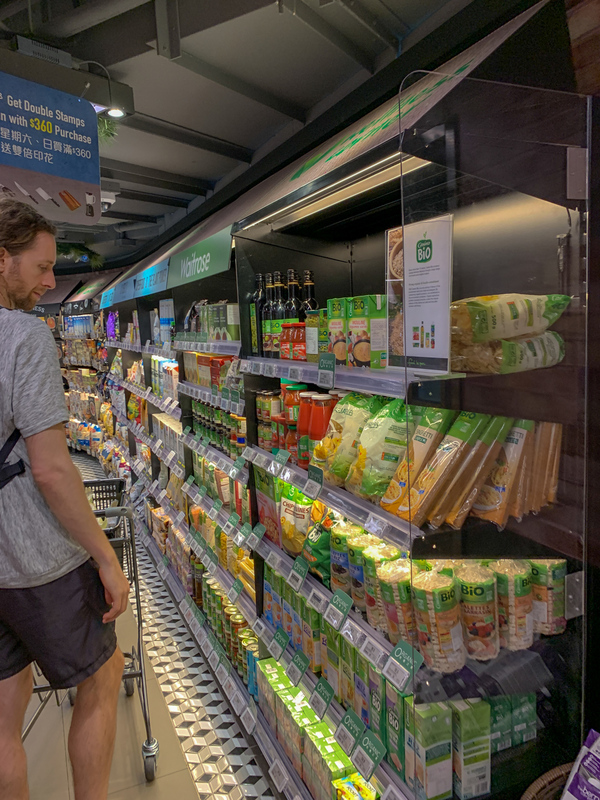 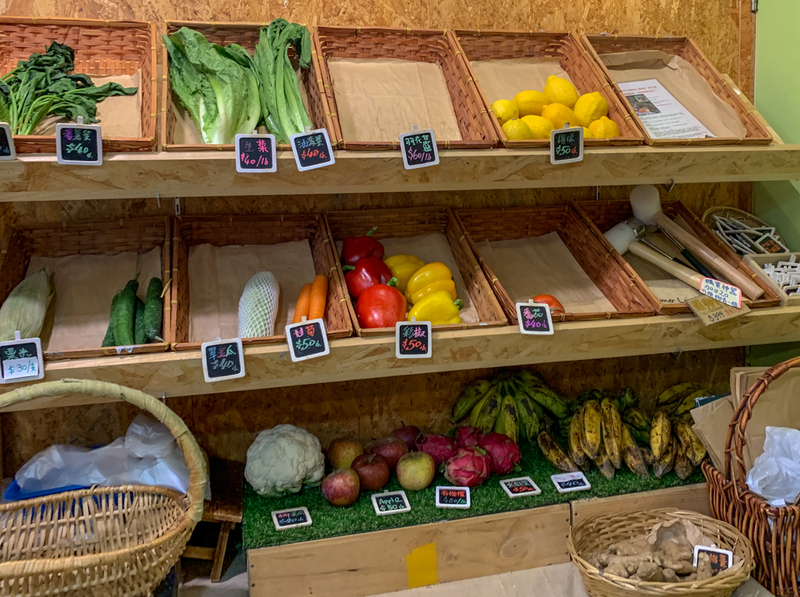 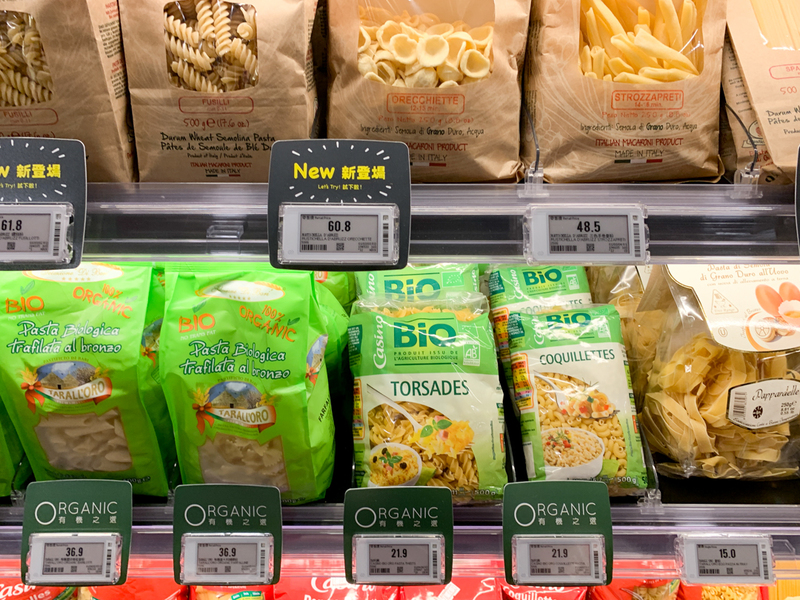 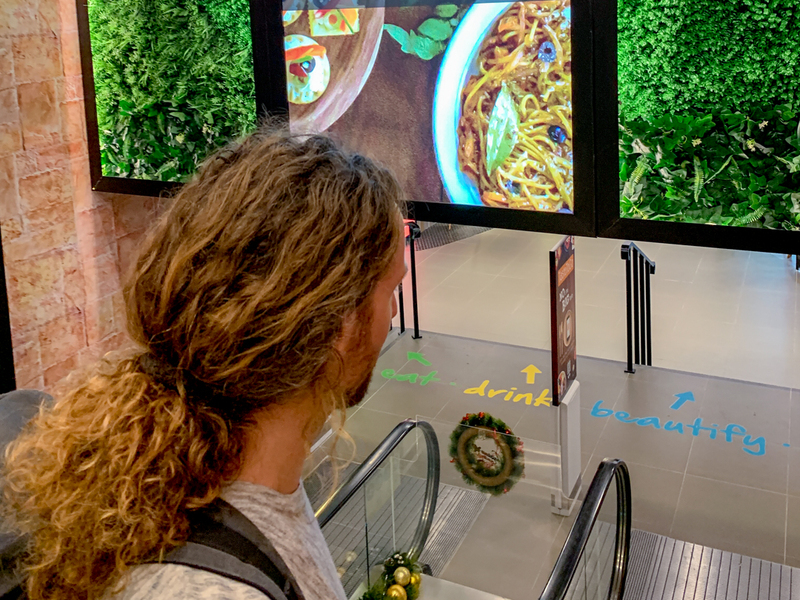 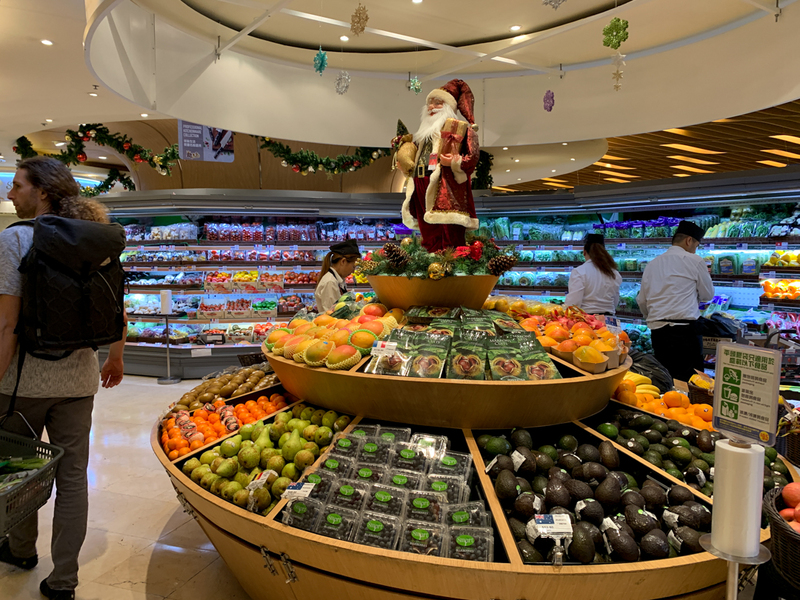 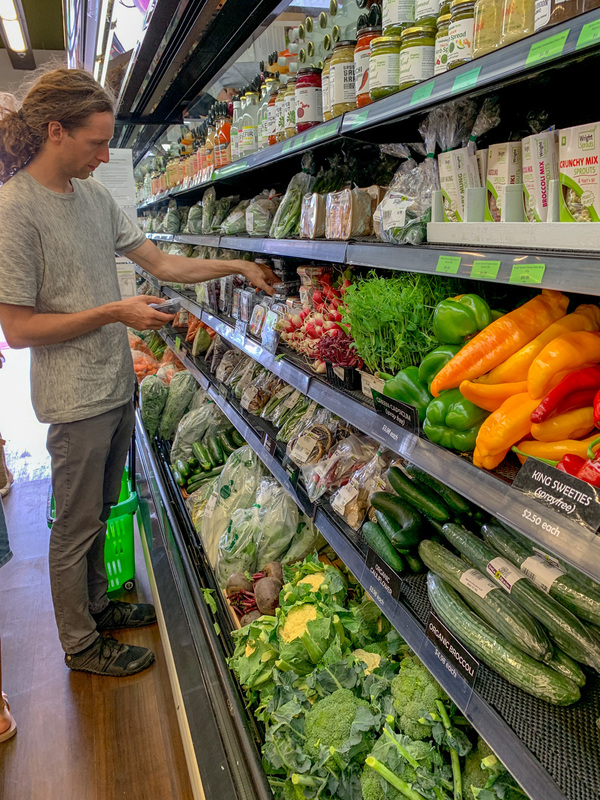 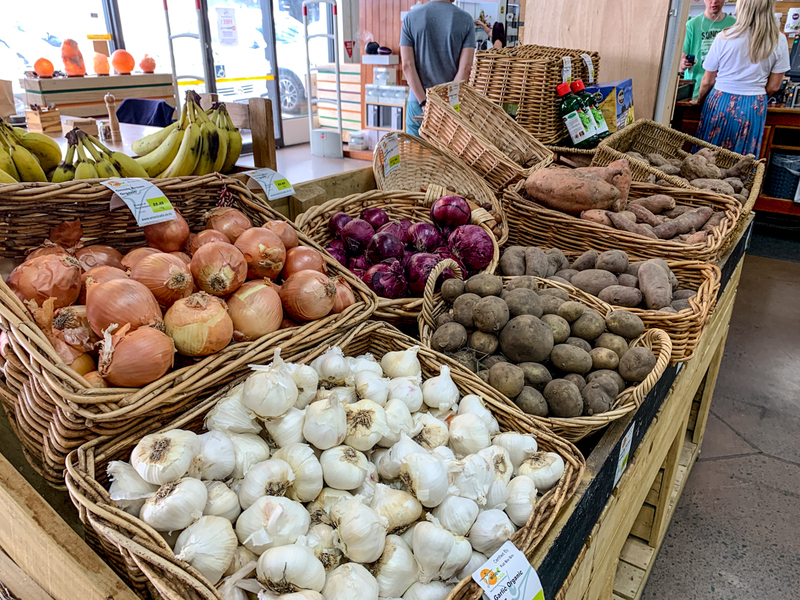 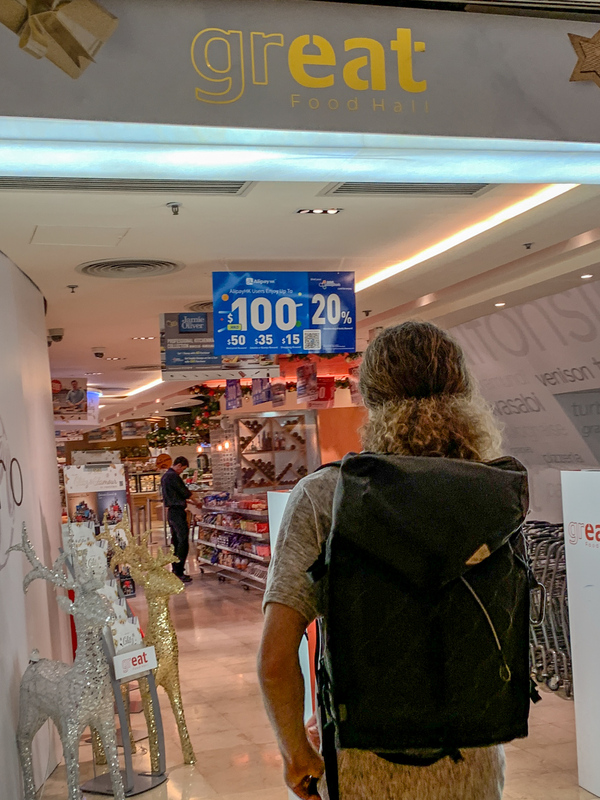 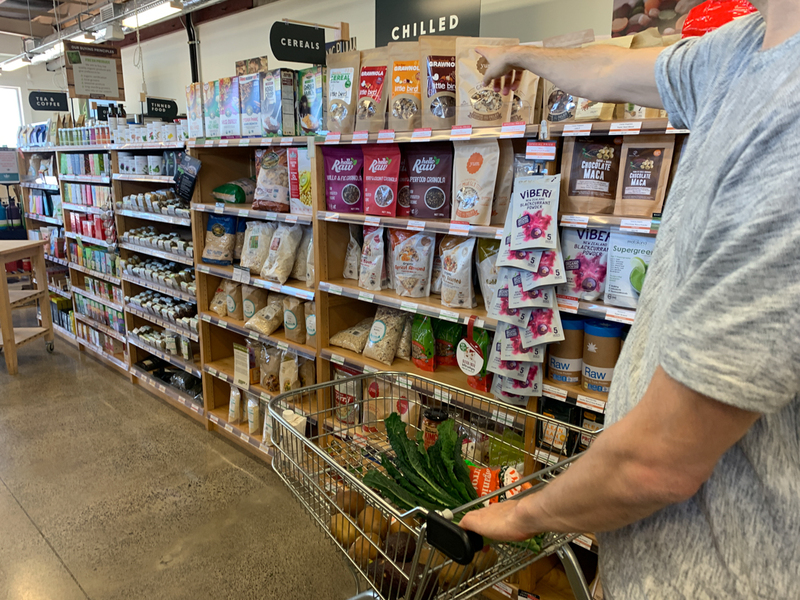 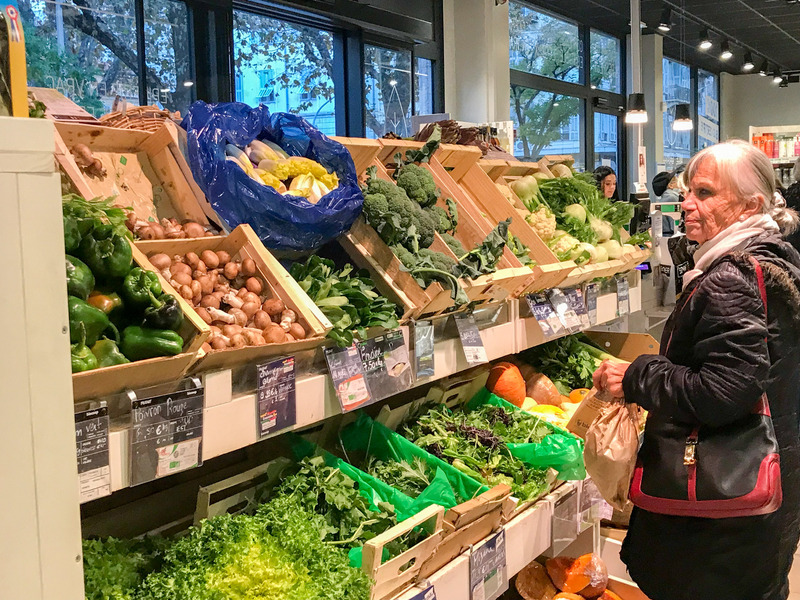 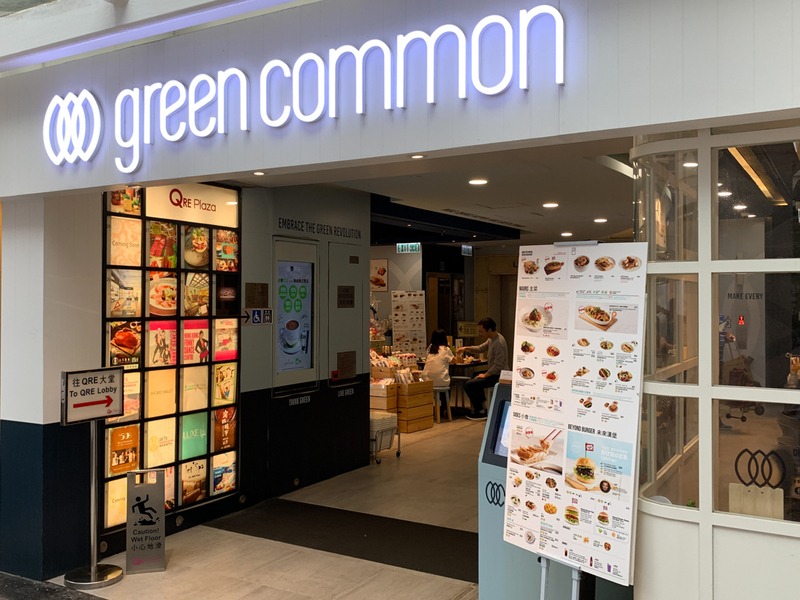 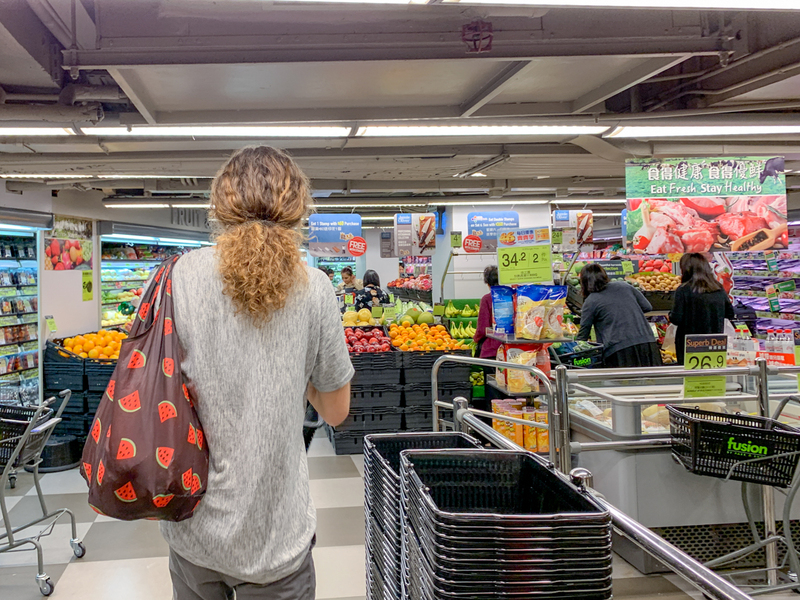 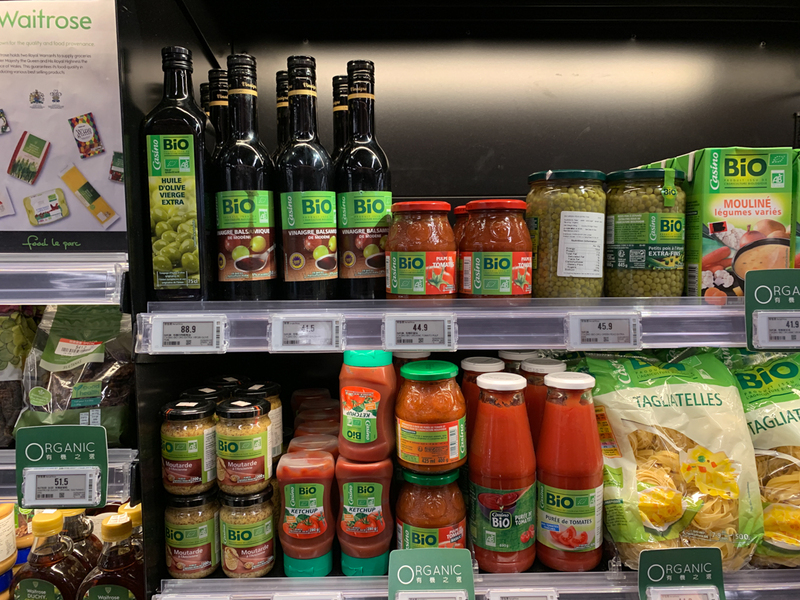 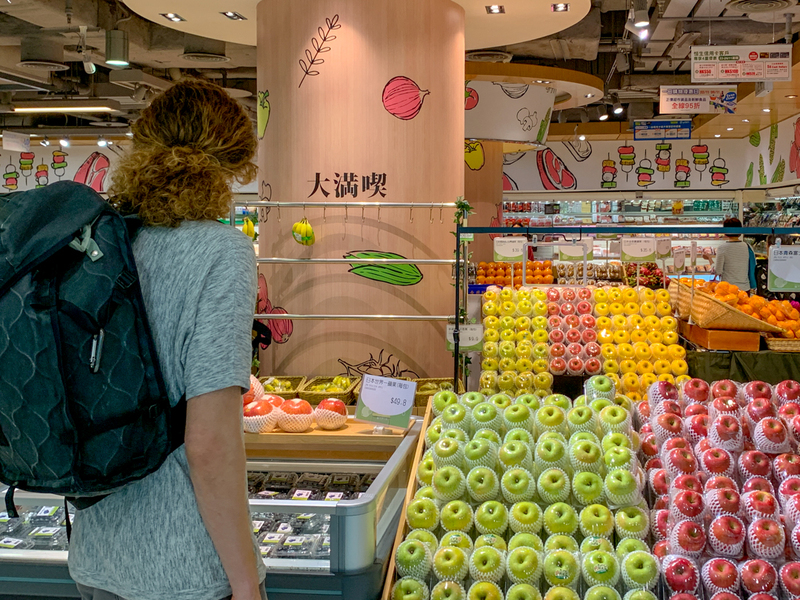 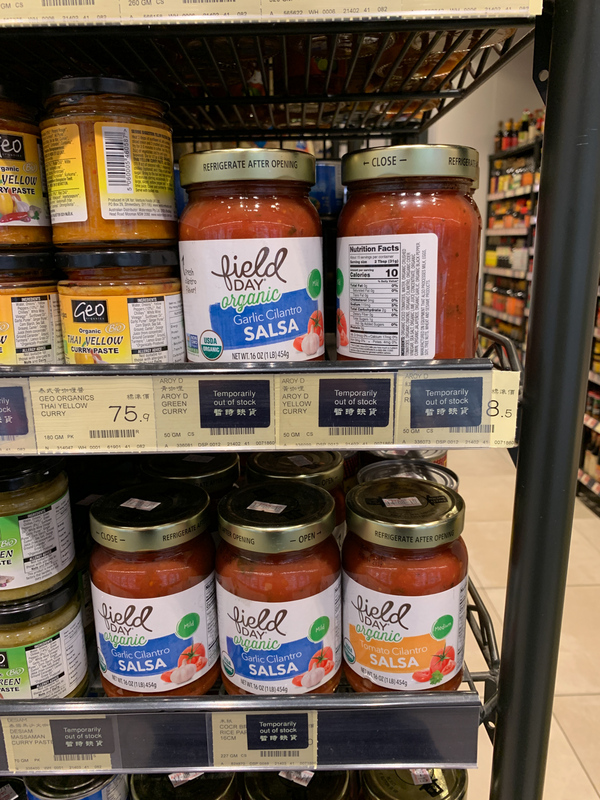 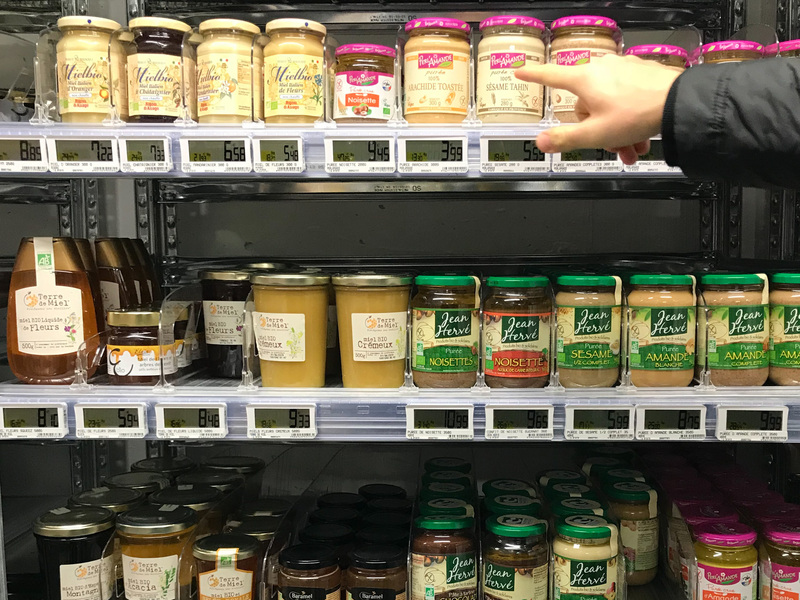 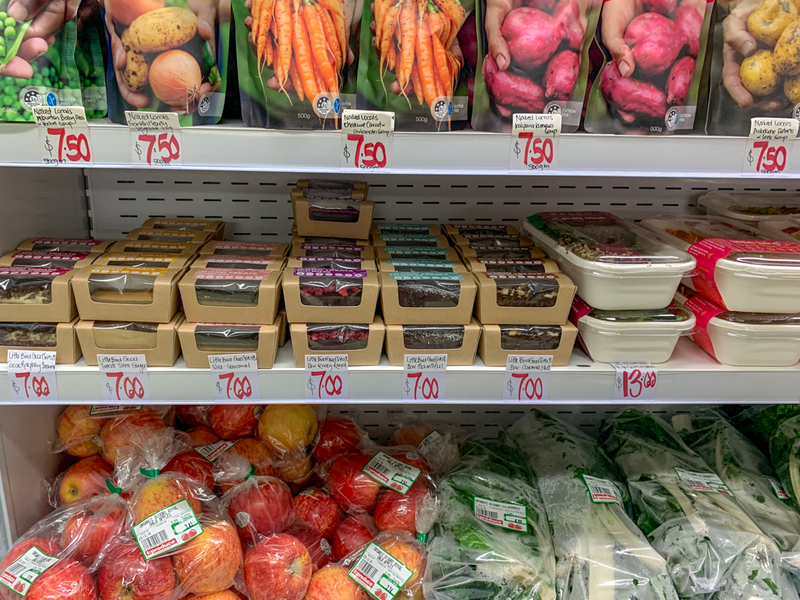 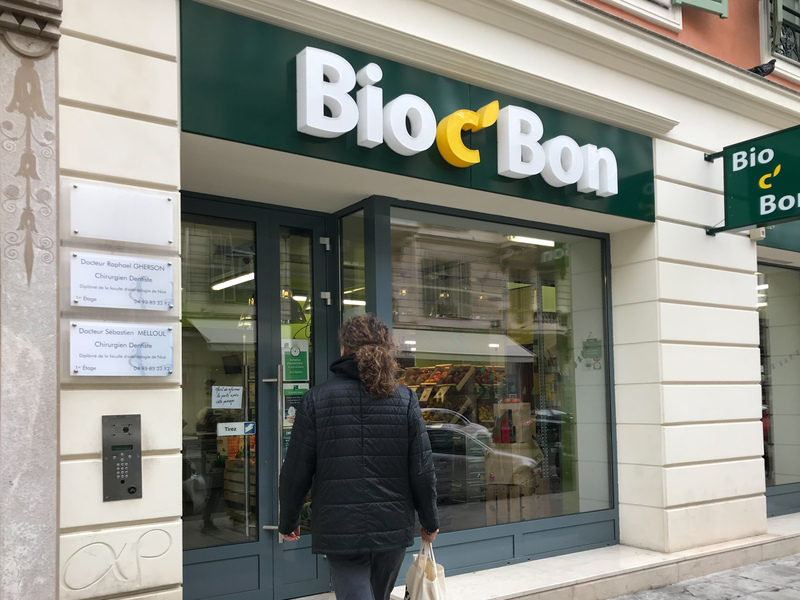 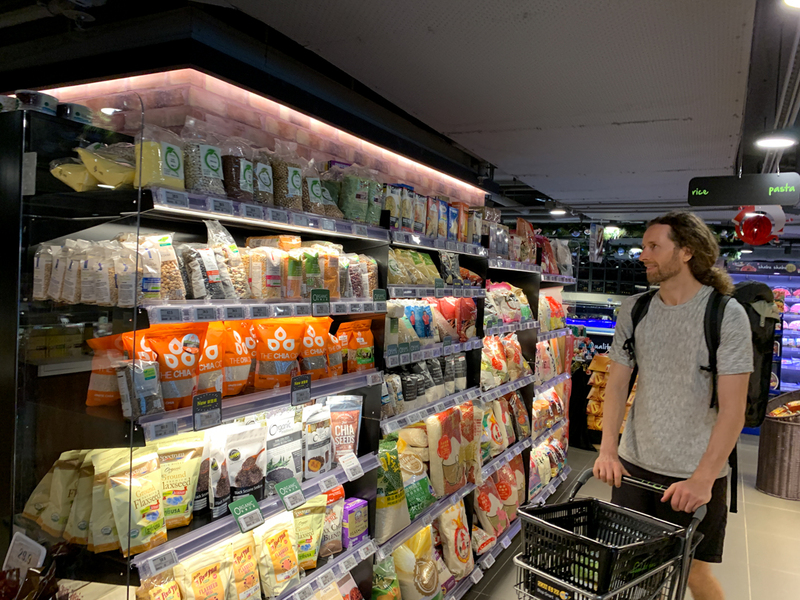 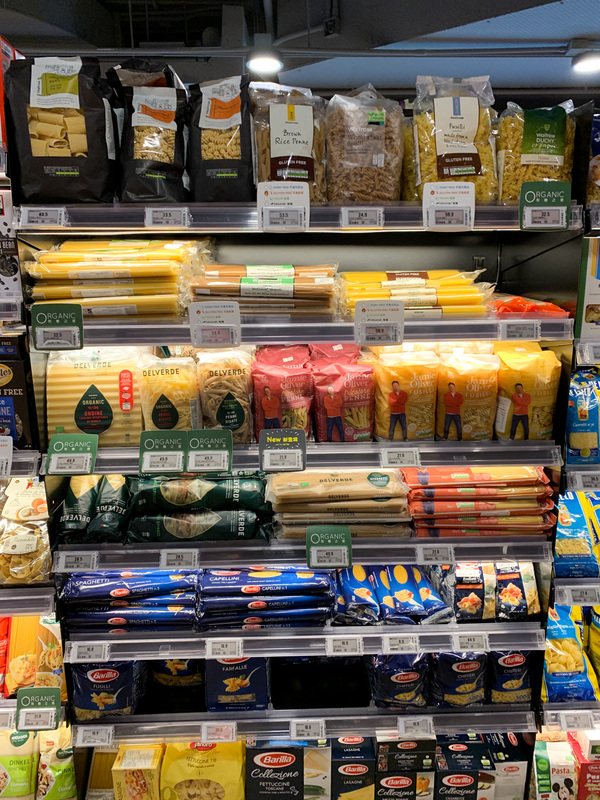 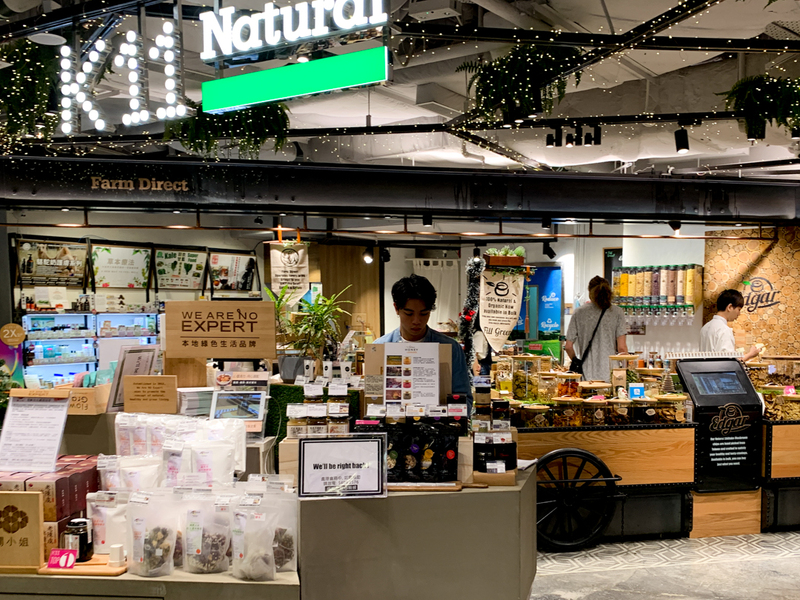 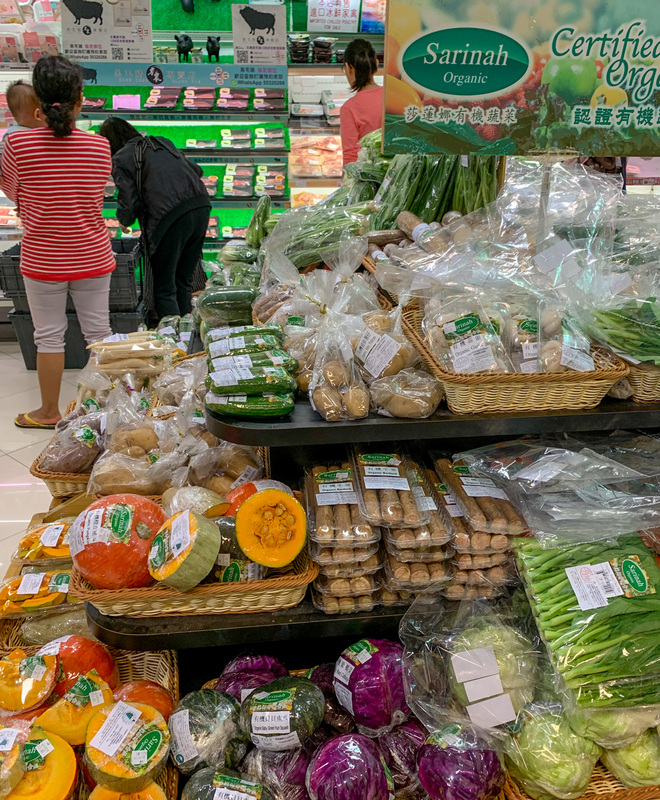 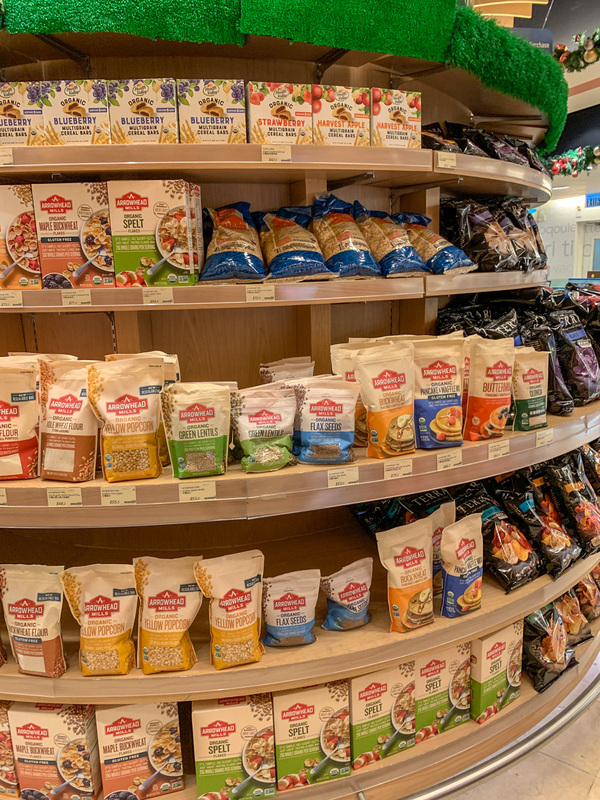 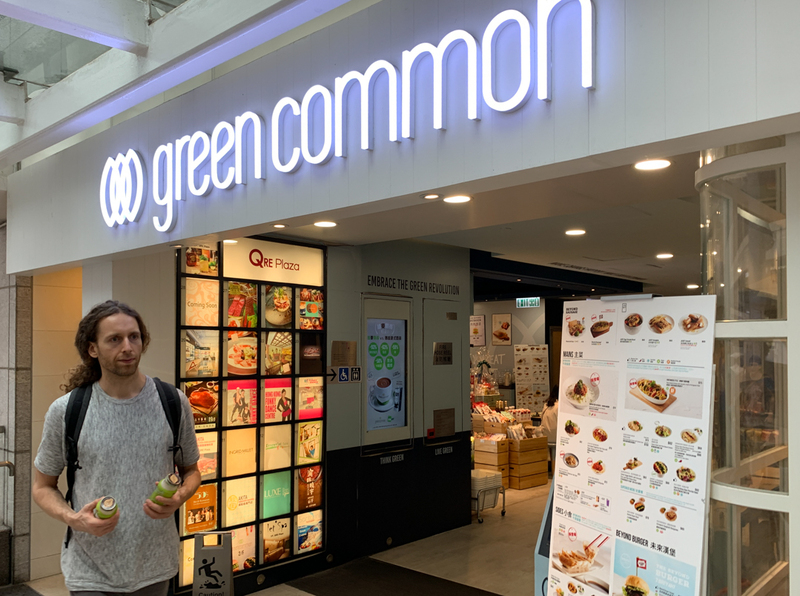 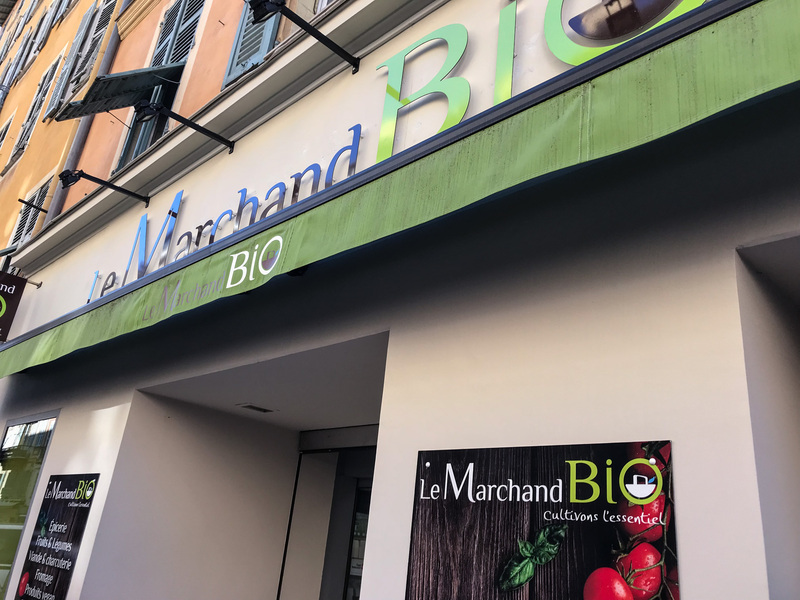 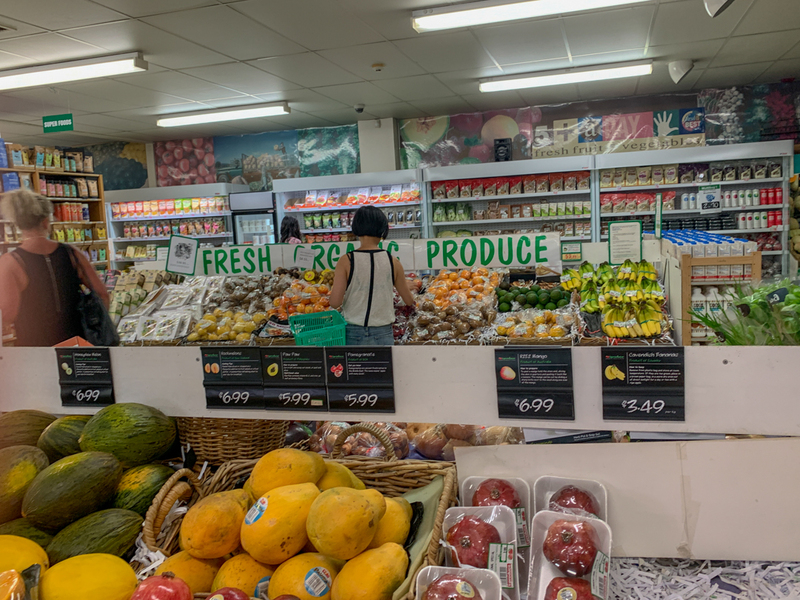 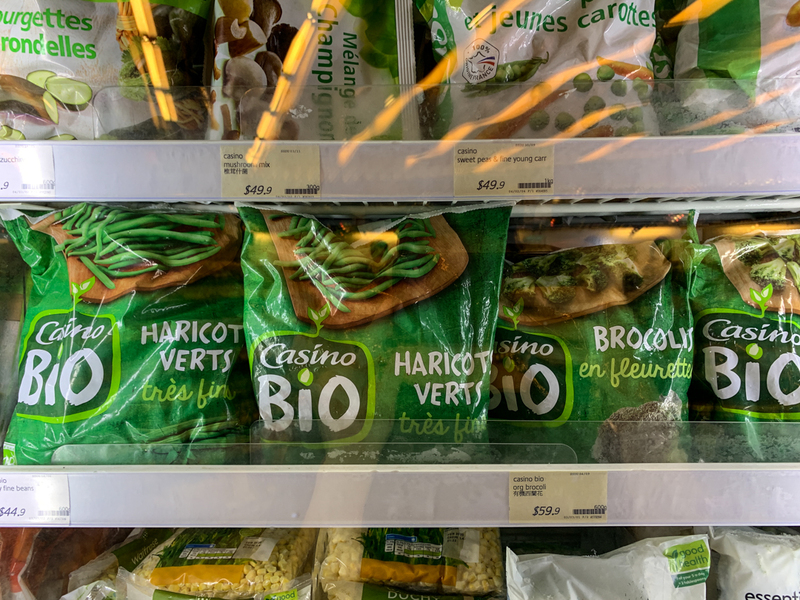 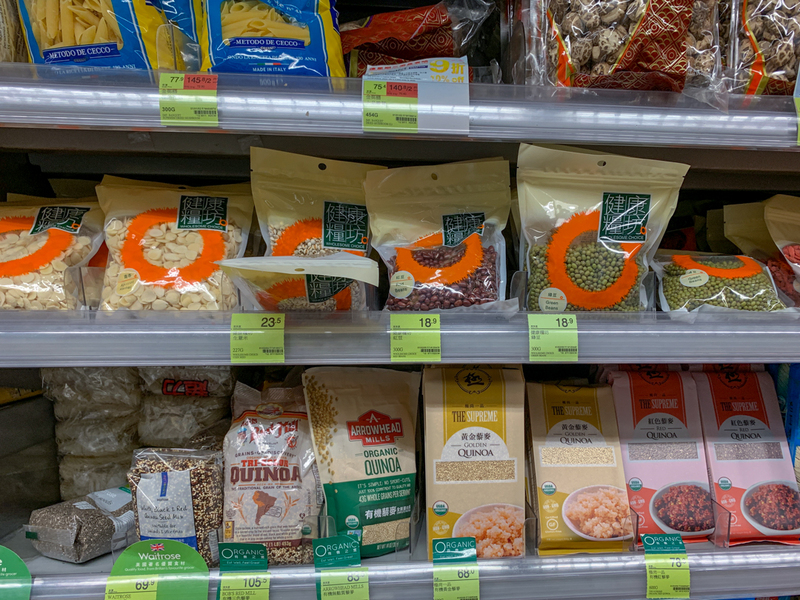 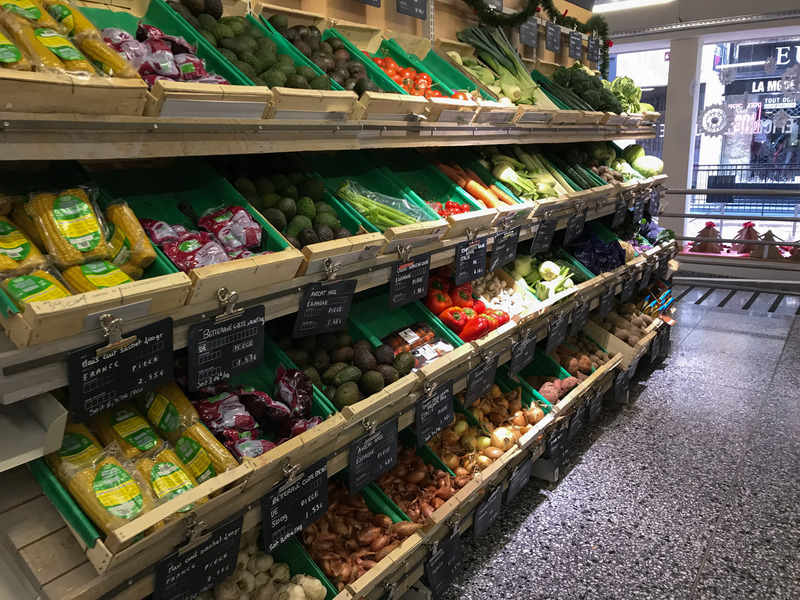 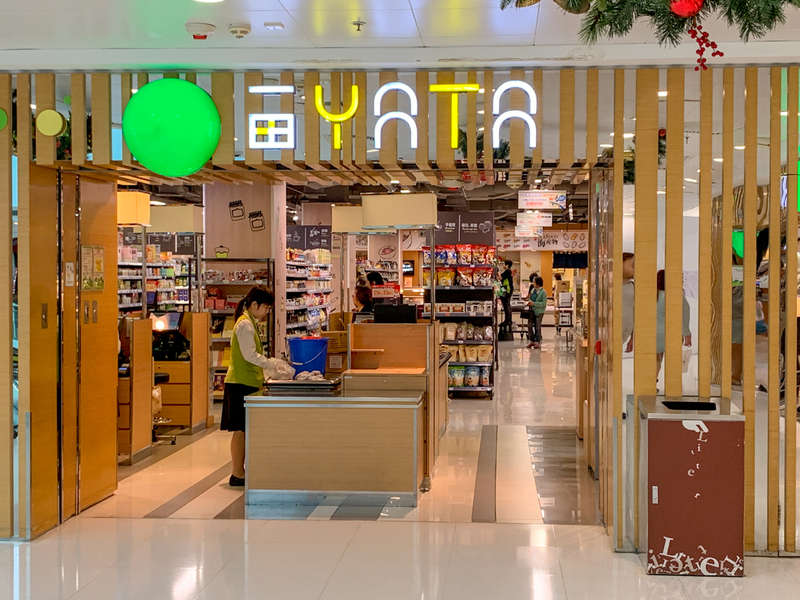 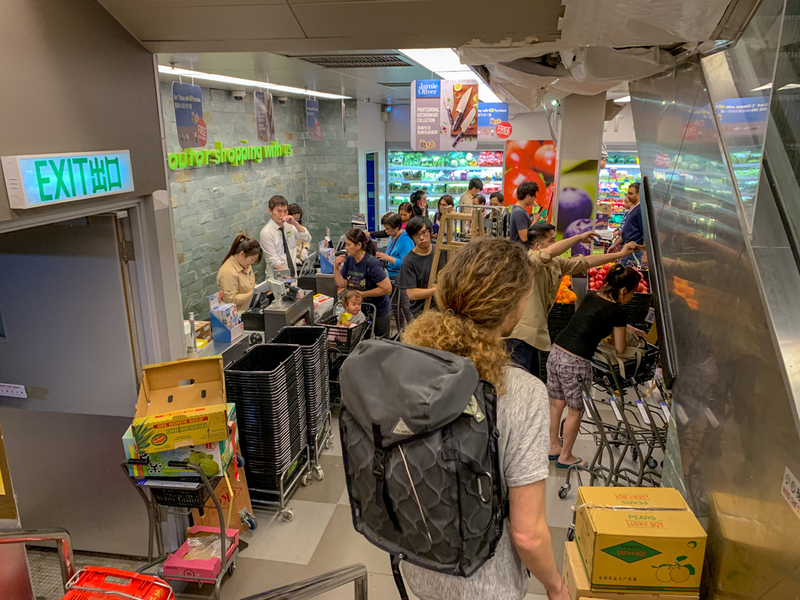 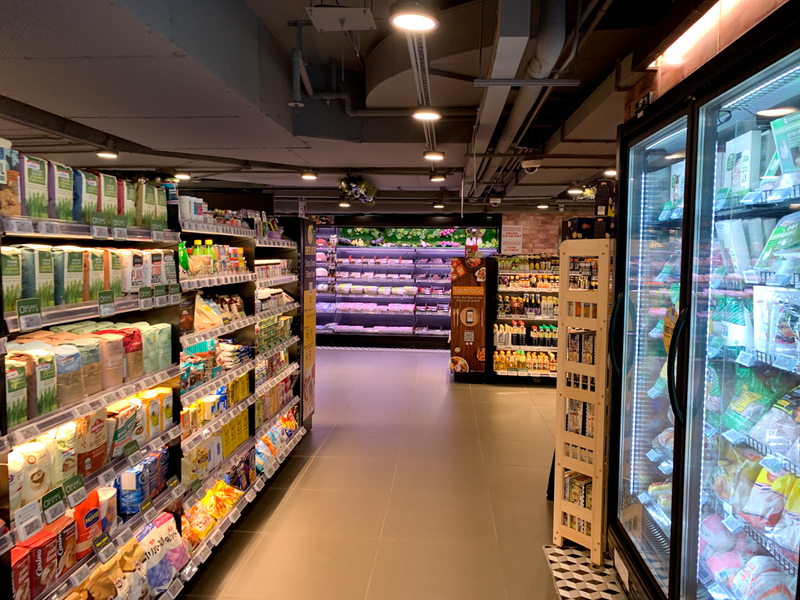 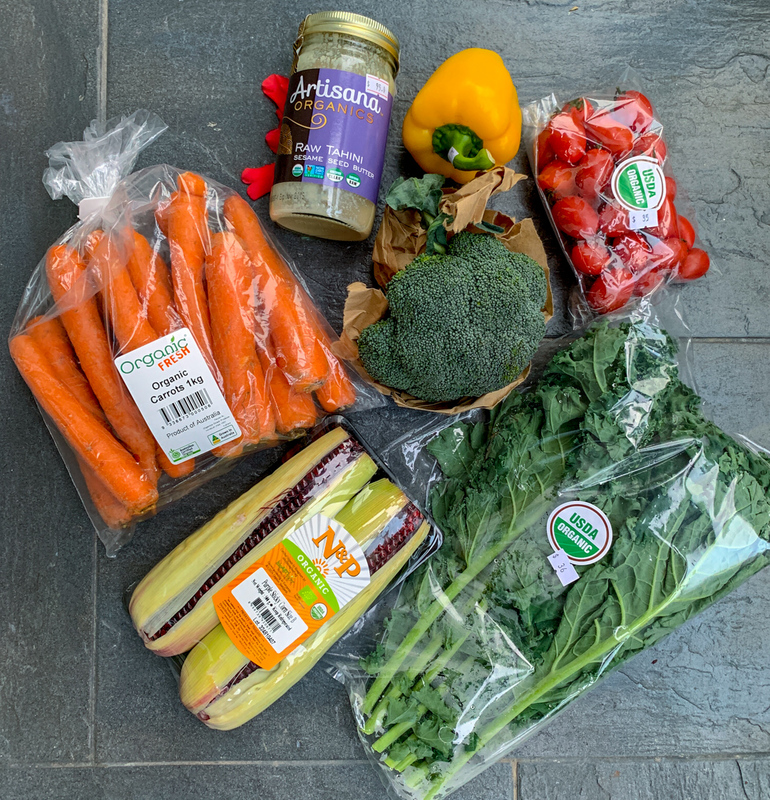 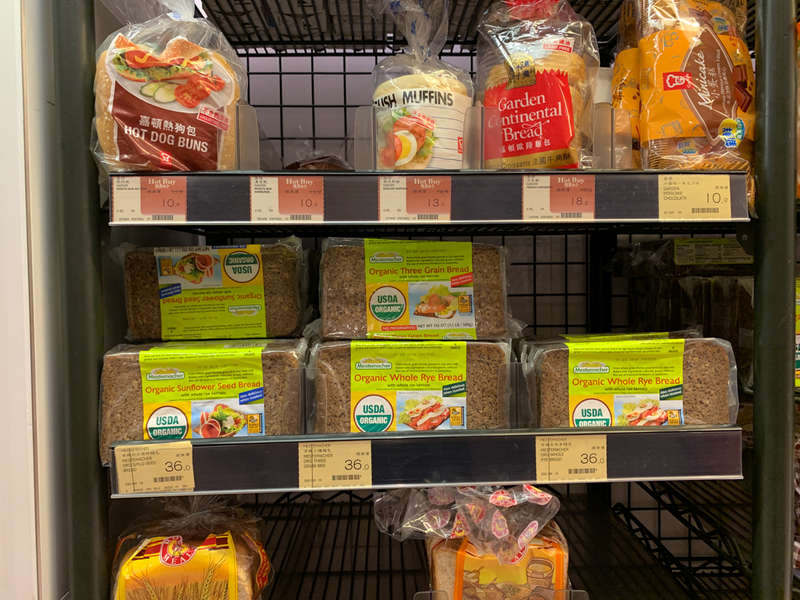 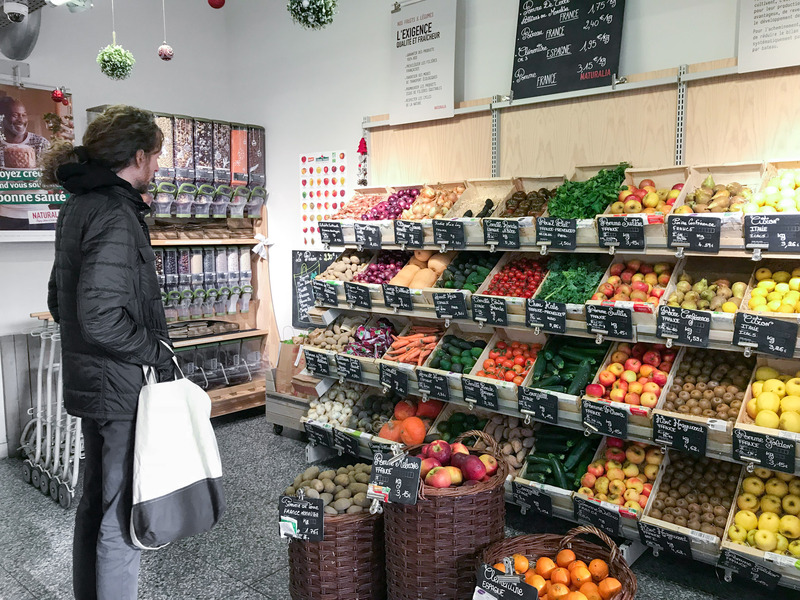 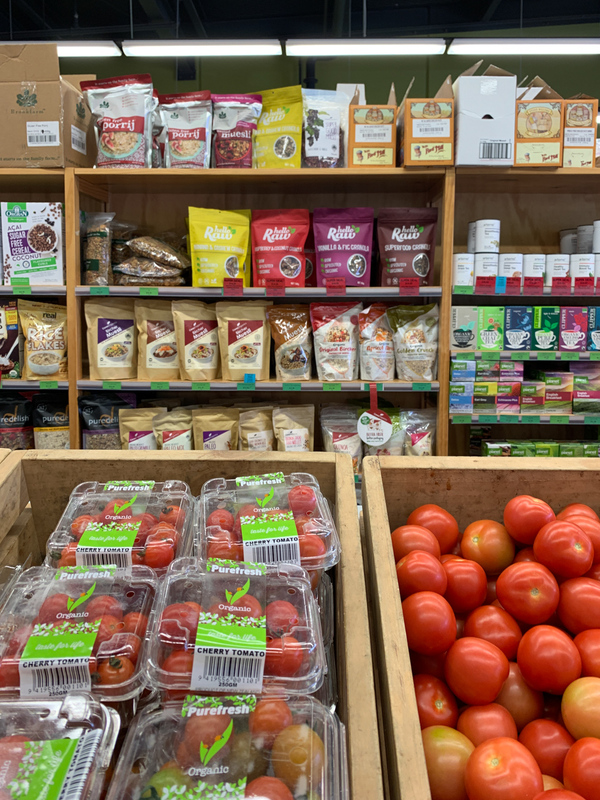 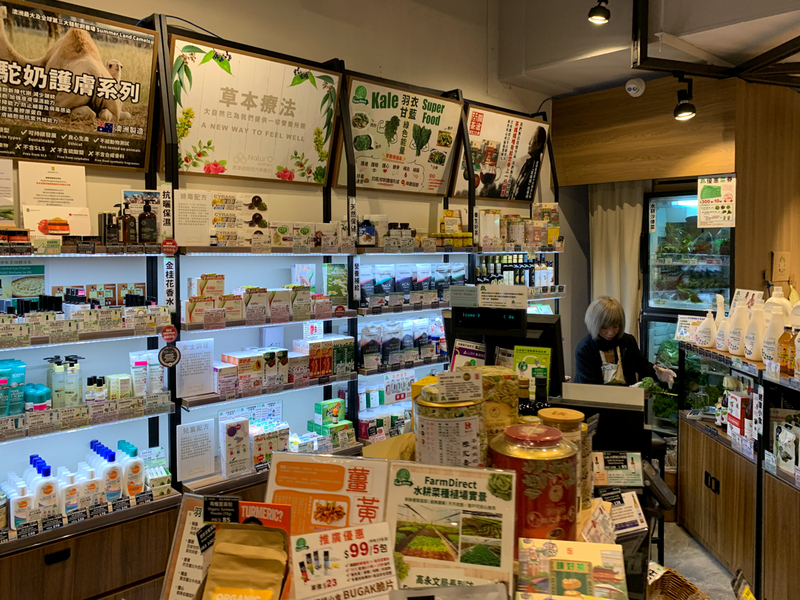 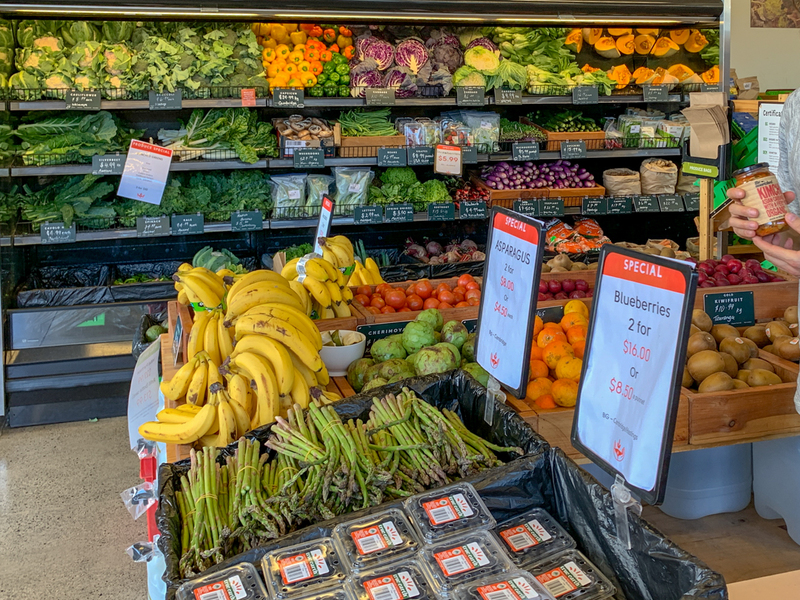 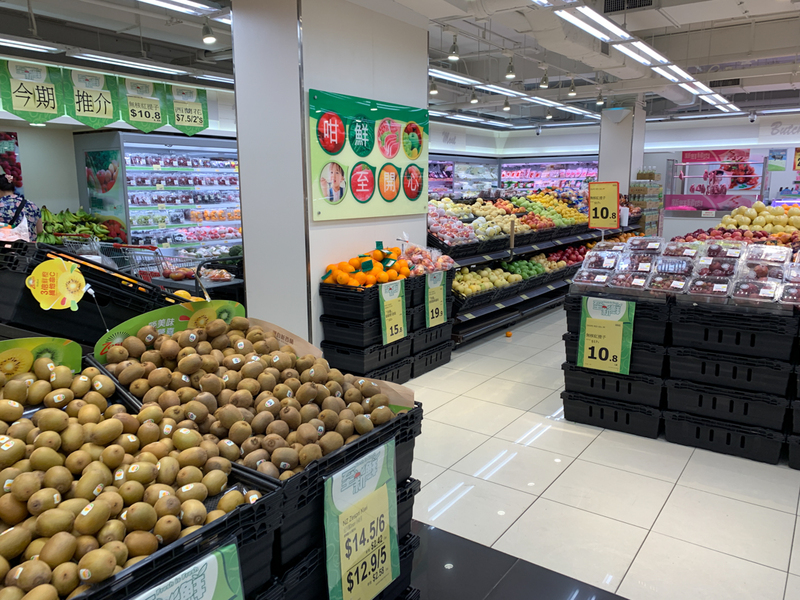 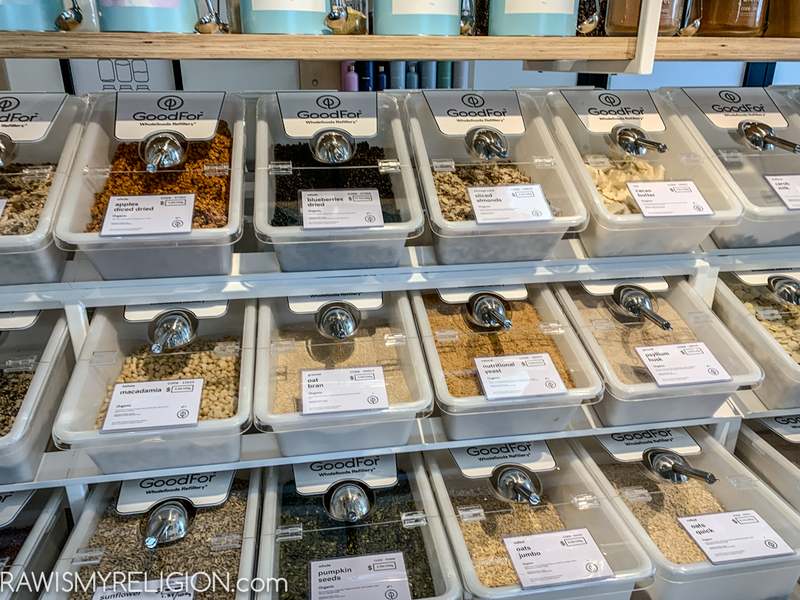 After going to the organic farmers market we passed through the mega mall on our way to the bus back home and discovered this large food supermarket and wanted to check out they organic options as we didn’t get everything we needed at the farmers’ market. 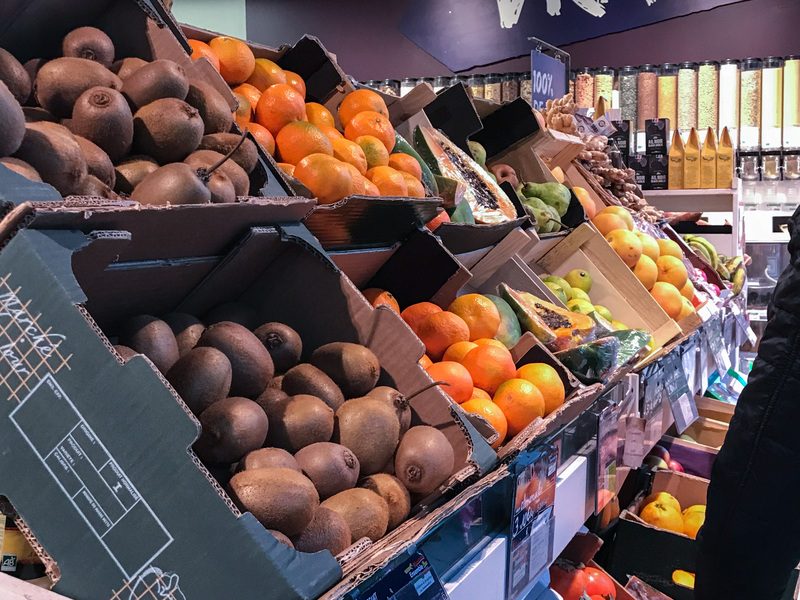 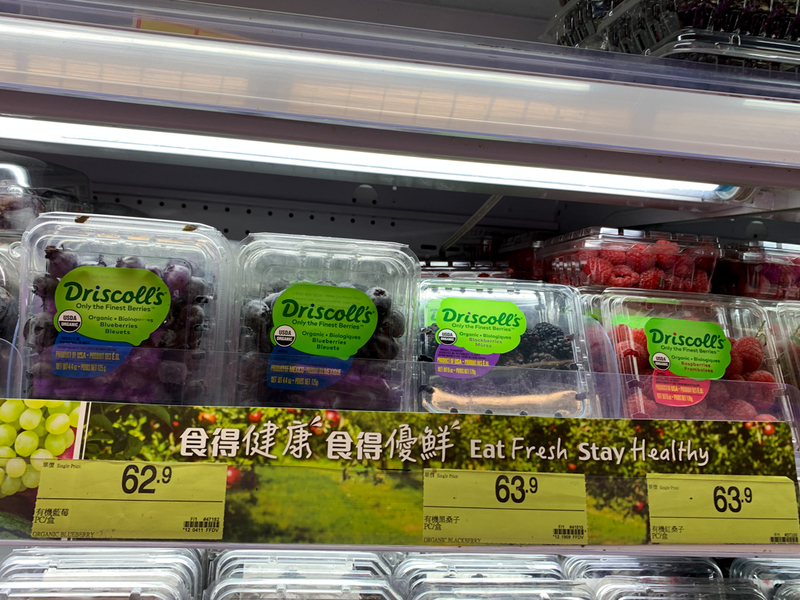 The fruit display is beautiful, but only a few fruits are actually certified organic, let’s see which ones are. 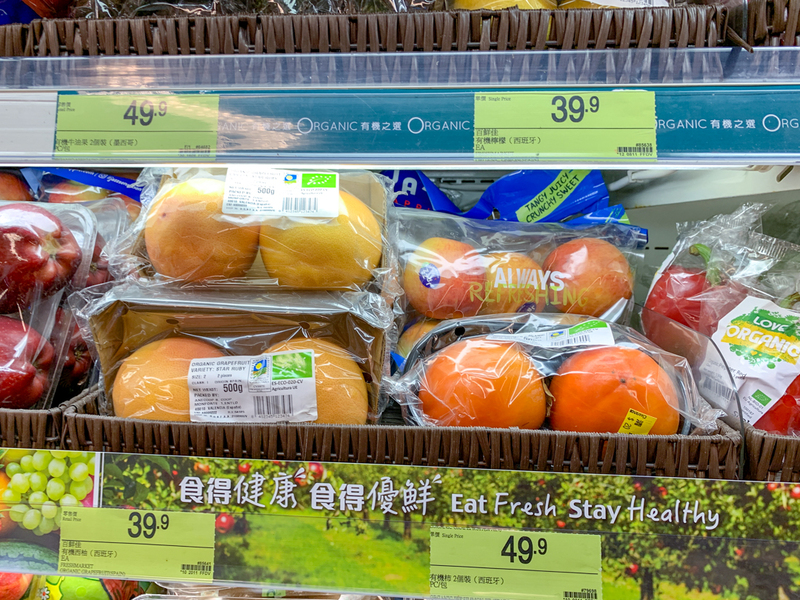 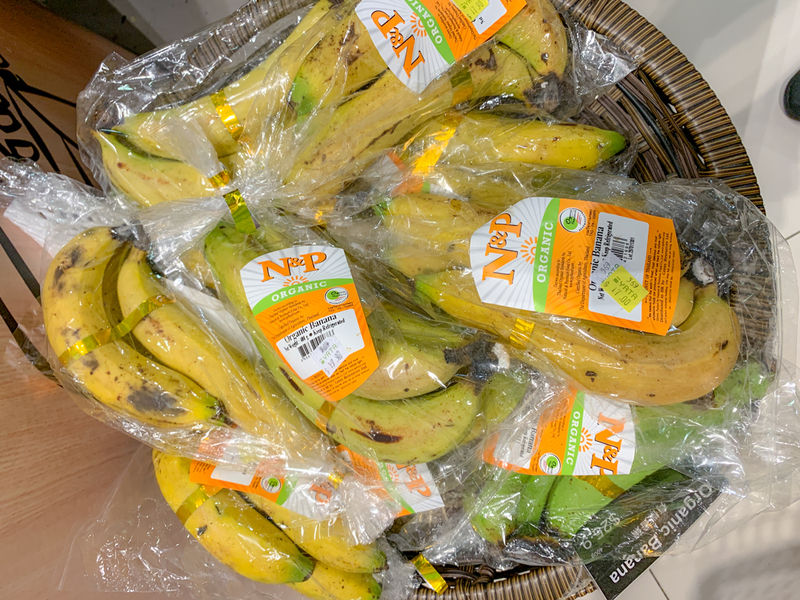 Banans are certified organic and 17 HKD (1.90€/$2.17) for 3 bananas. 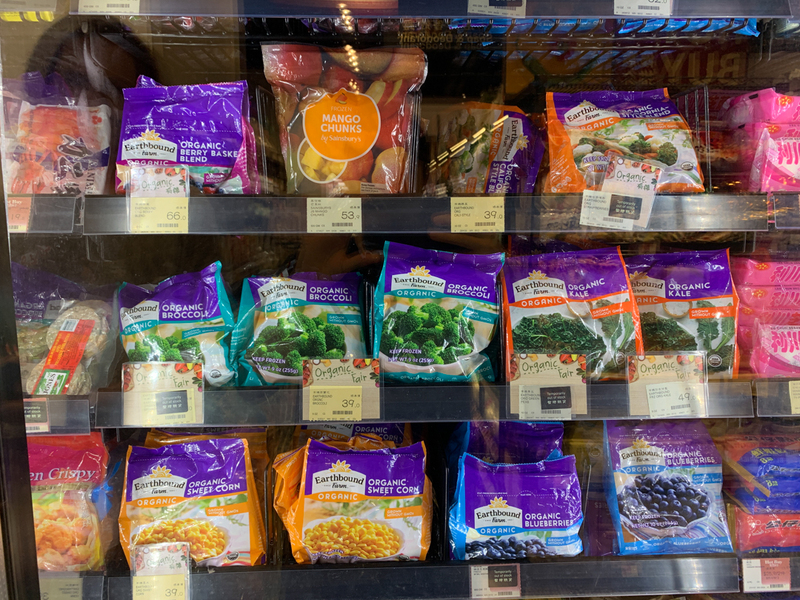 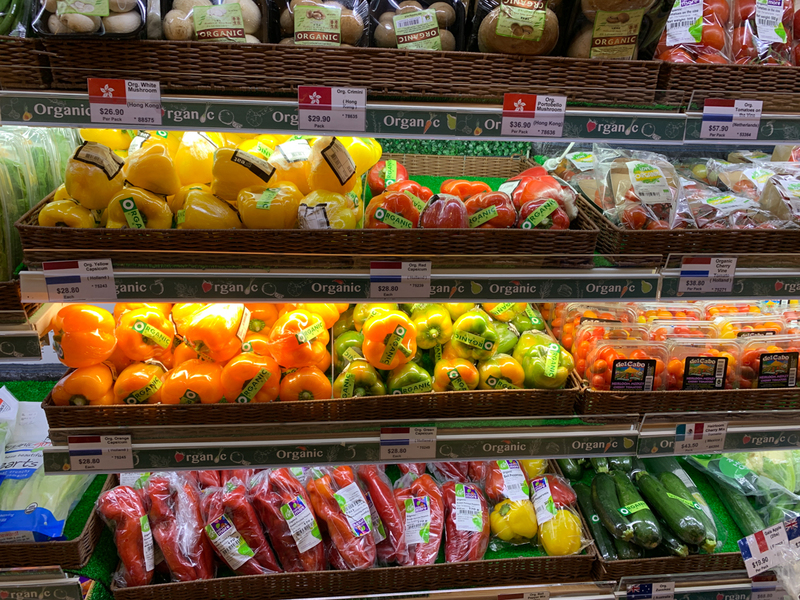 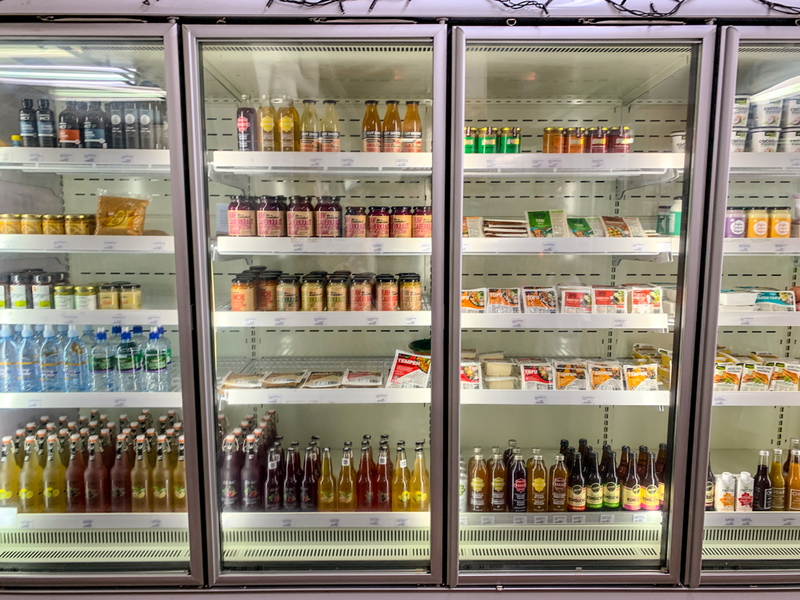 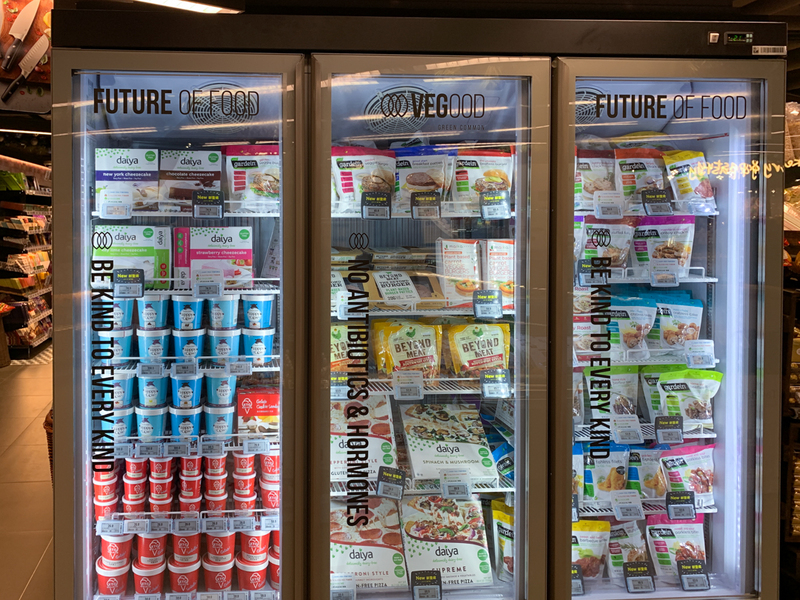 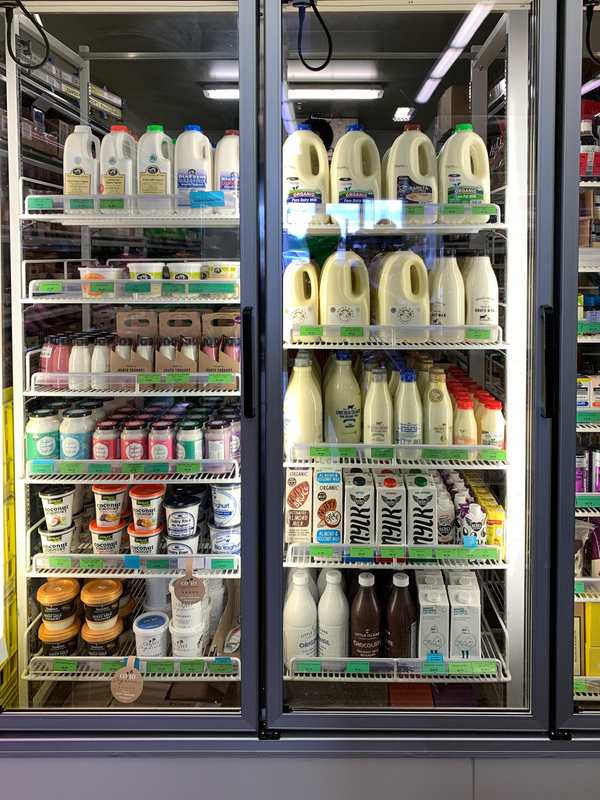 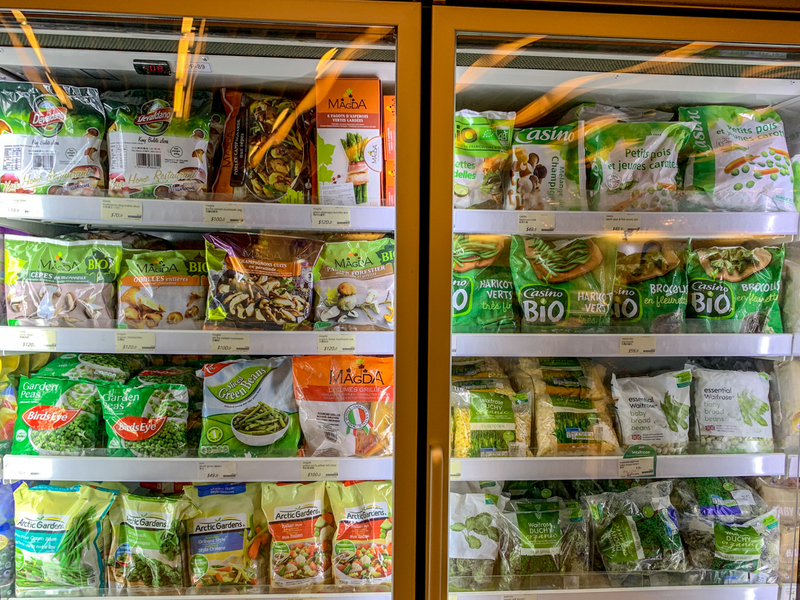 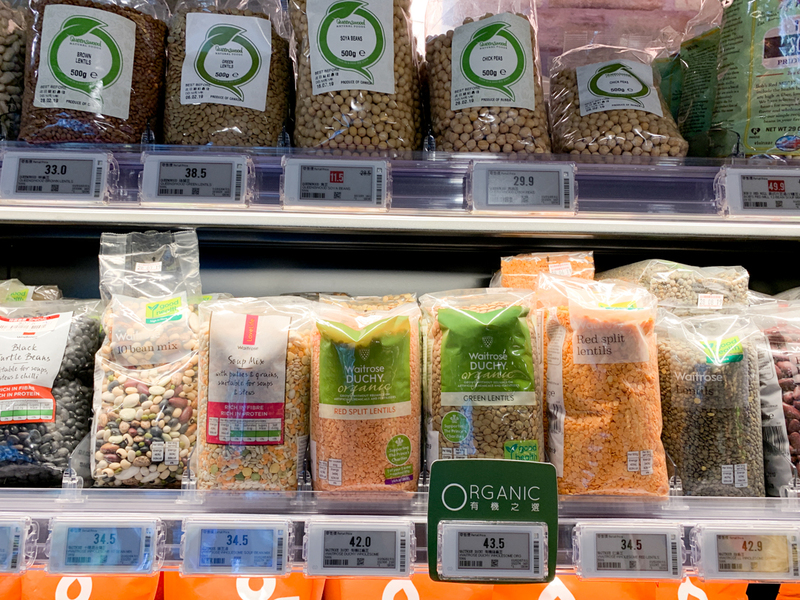 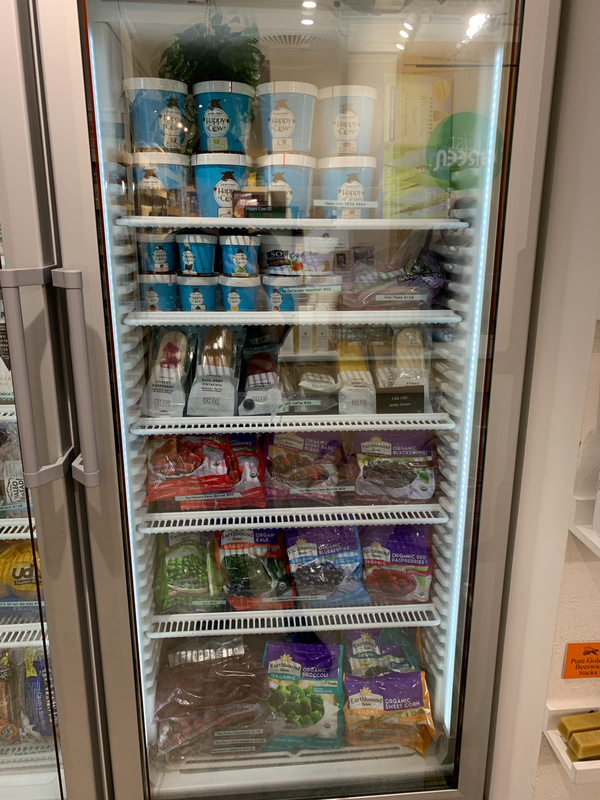 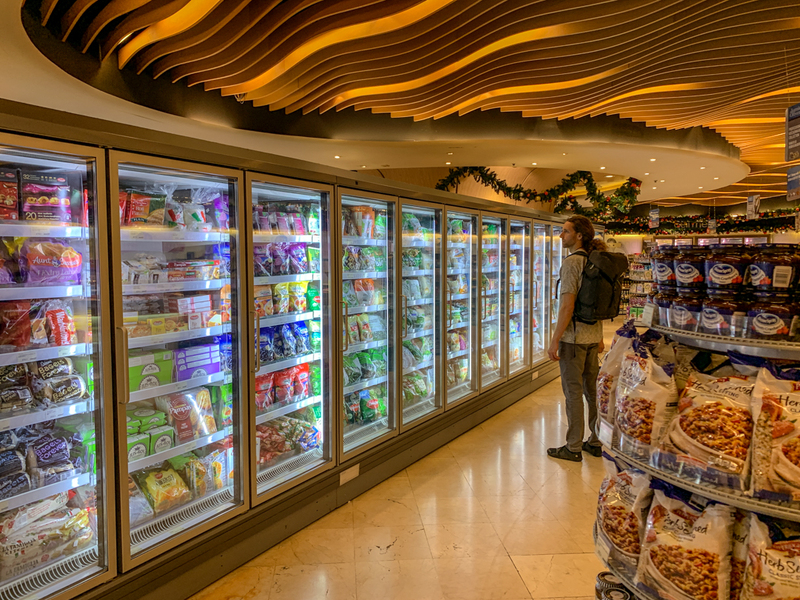 Here we have an overview of the biggest organic fridge in the store. 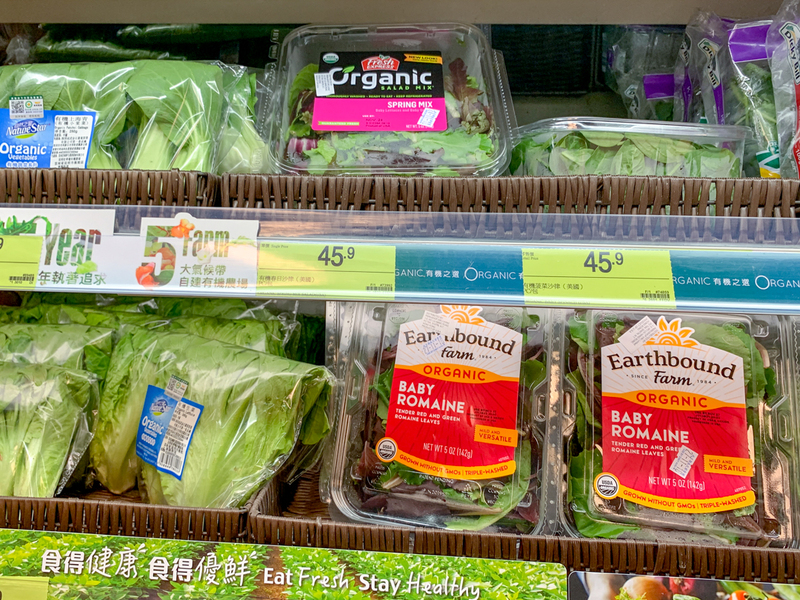 There are some organic fruit, but mainly organic greens and organic veggies. 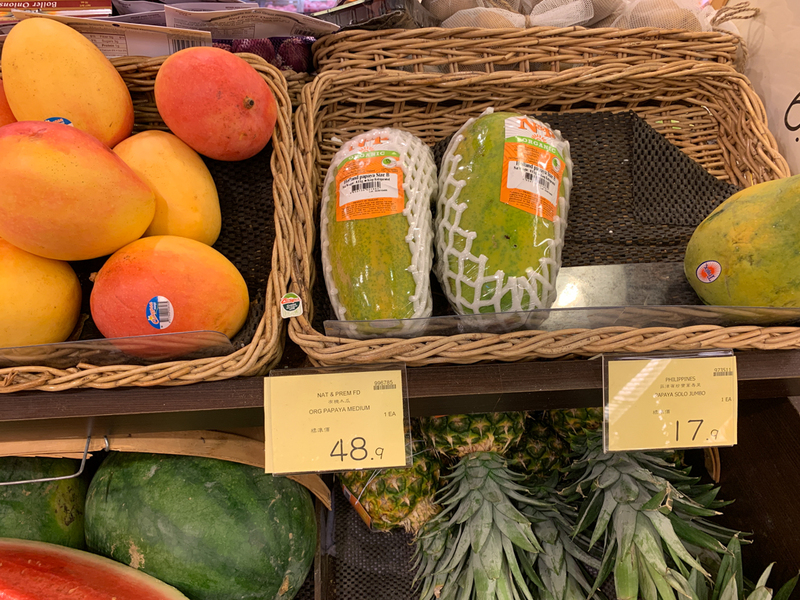 Organic papaya is around 50 HKD (5.60€/$6.38) for a kg, one fruit is about 1 kg. 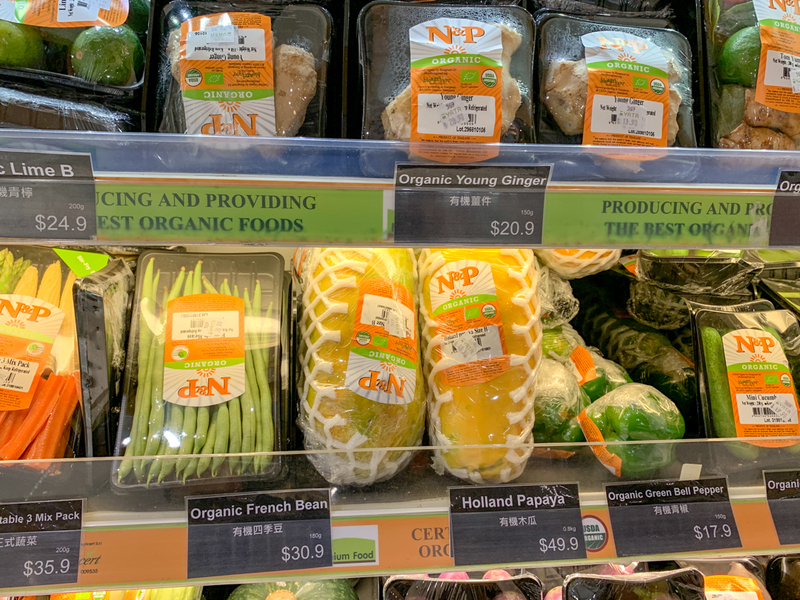 There are also organic limes, organic ginger, organic cucumbers, organic peas, organic baby corn and asparagus. 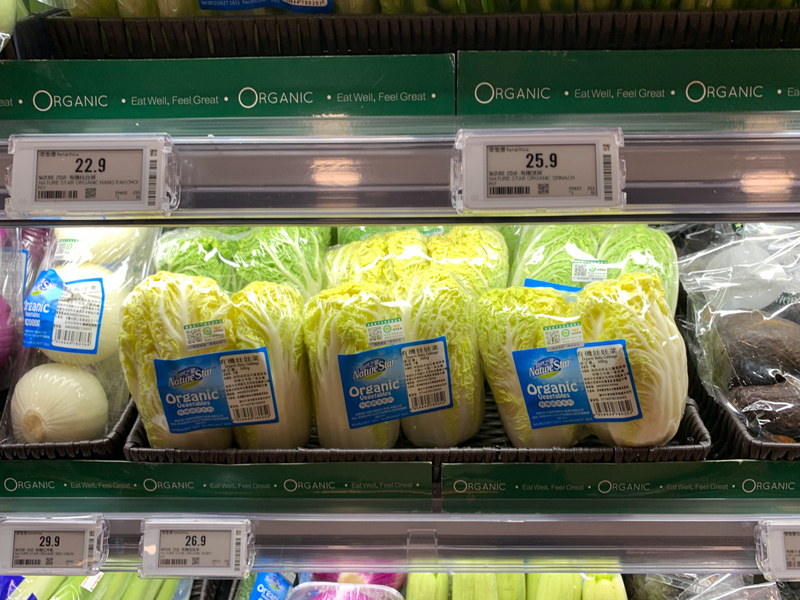 Here is the organic cabbage, bok choy, celery in the right corner and tomatoes on the left bottom. 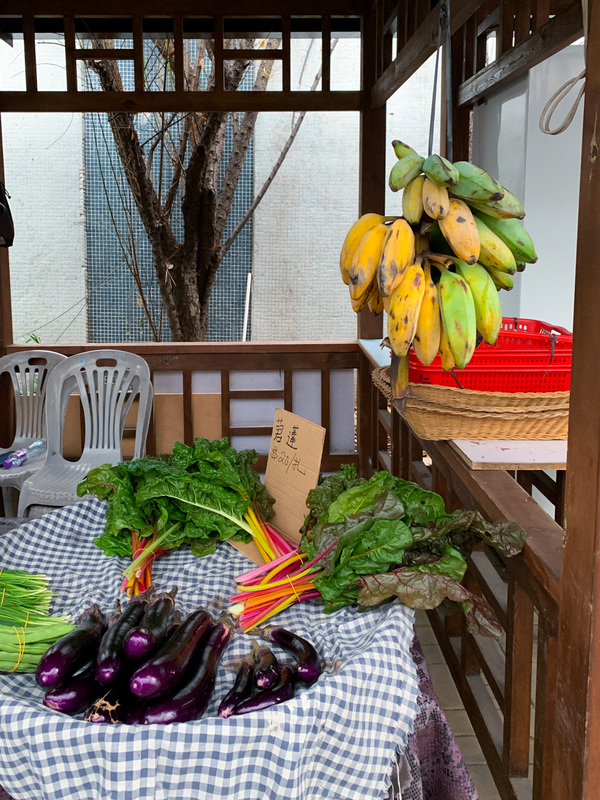 Everything around 30 HKD (~3€/$4). 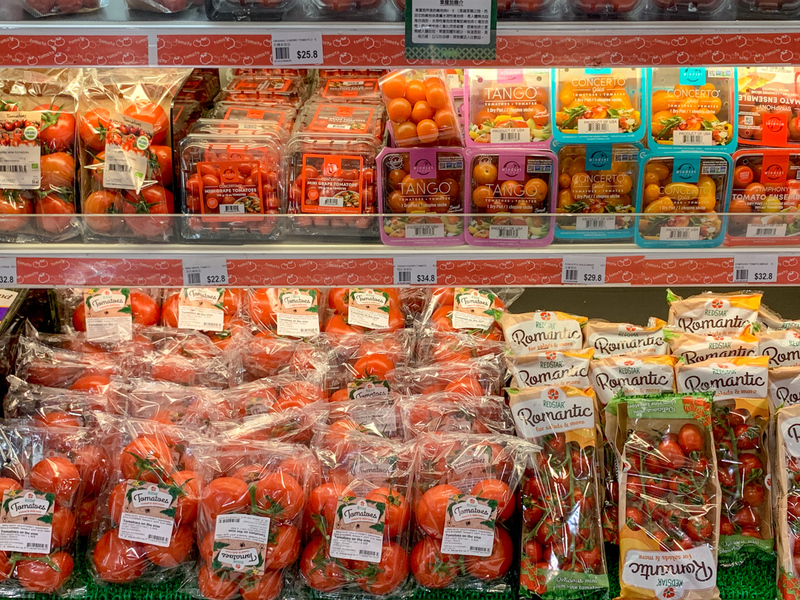 Here is a large tomato display. 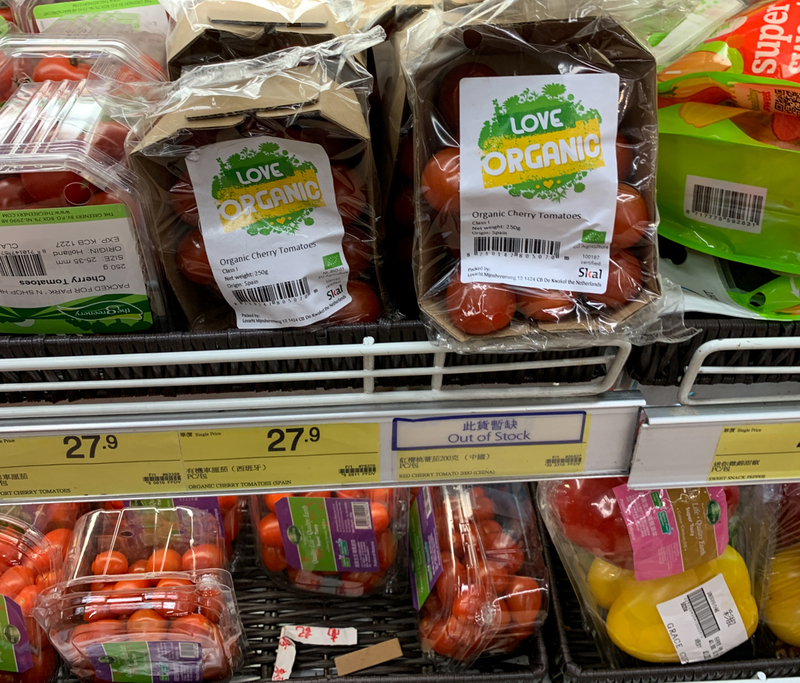 The only organic tomatoes here are on the top right. 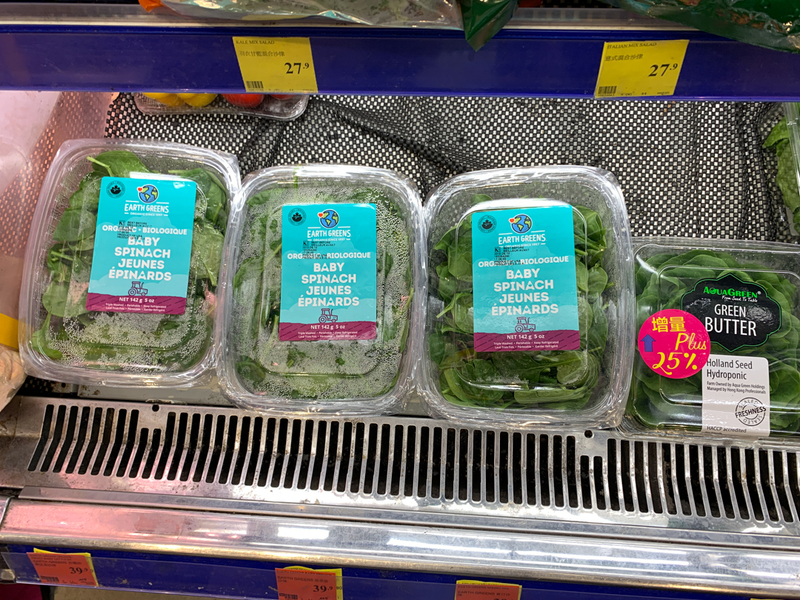 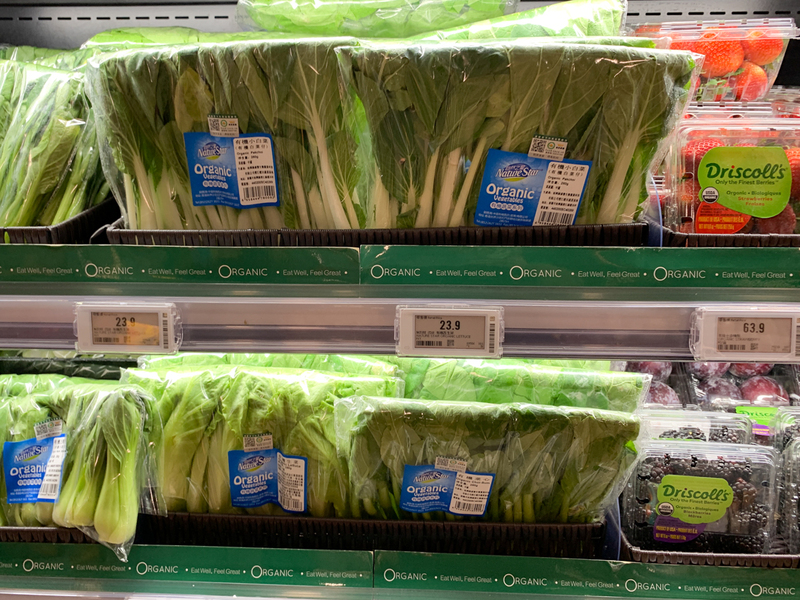 Organic greens and organic romaine hearts are around 60 HKD (~6€/$8). 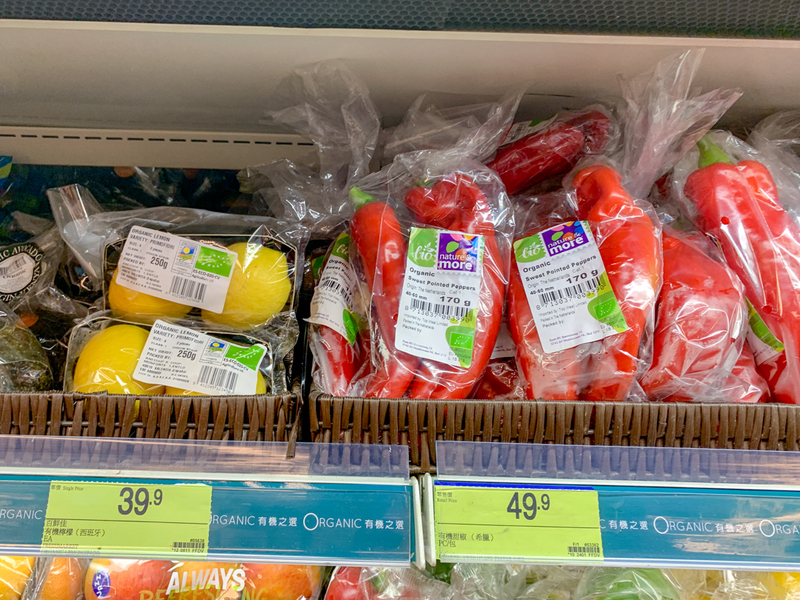 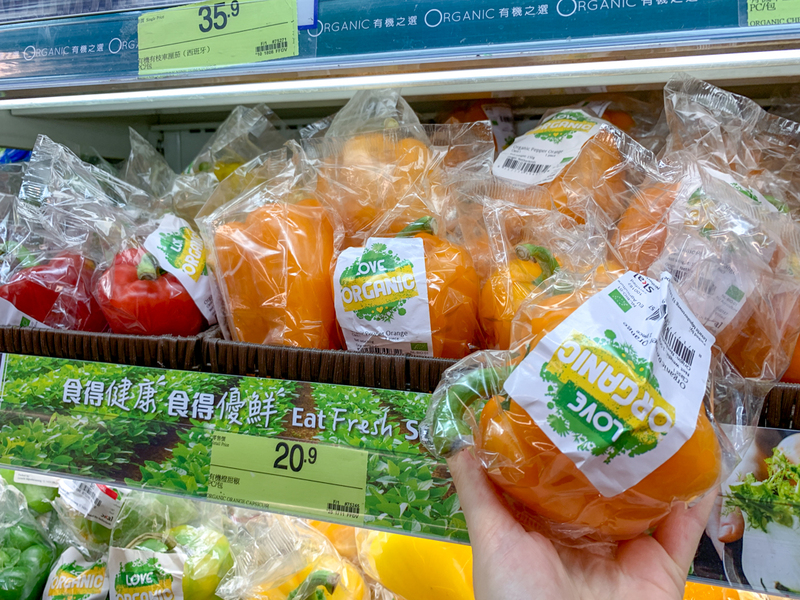 Organic bell peppers are around 30 HKD for 2 pieces (~3€/$4). 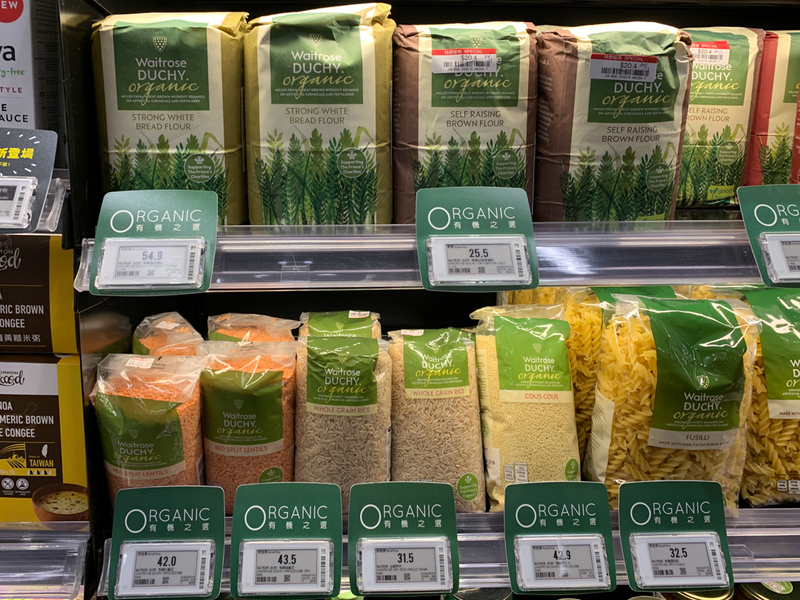 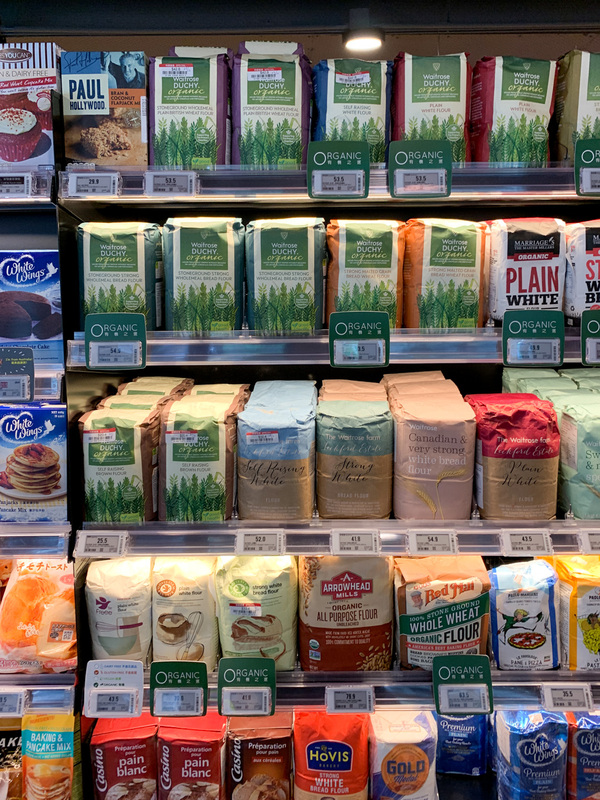 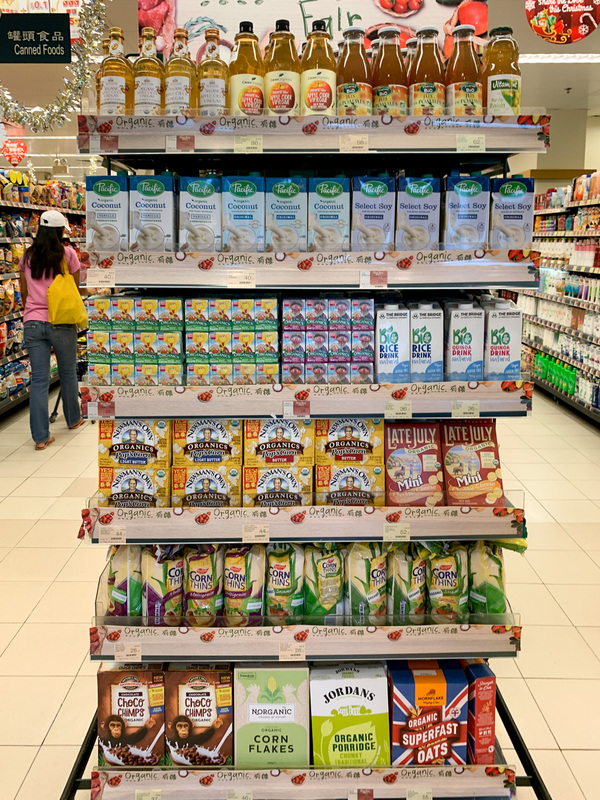 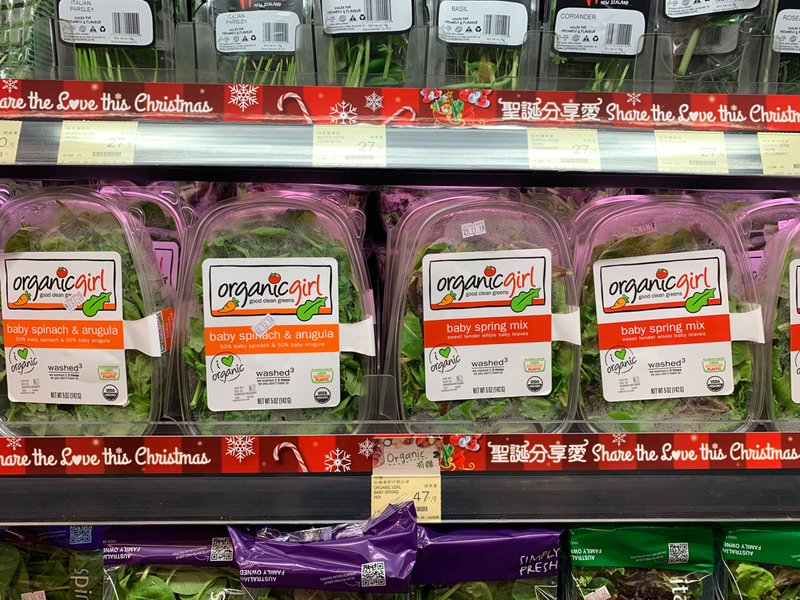 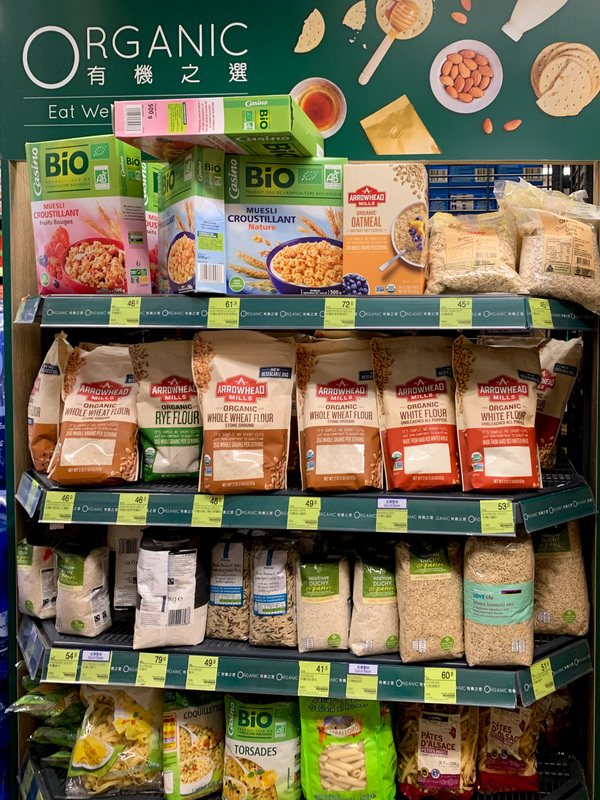 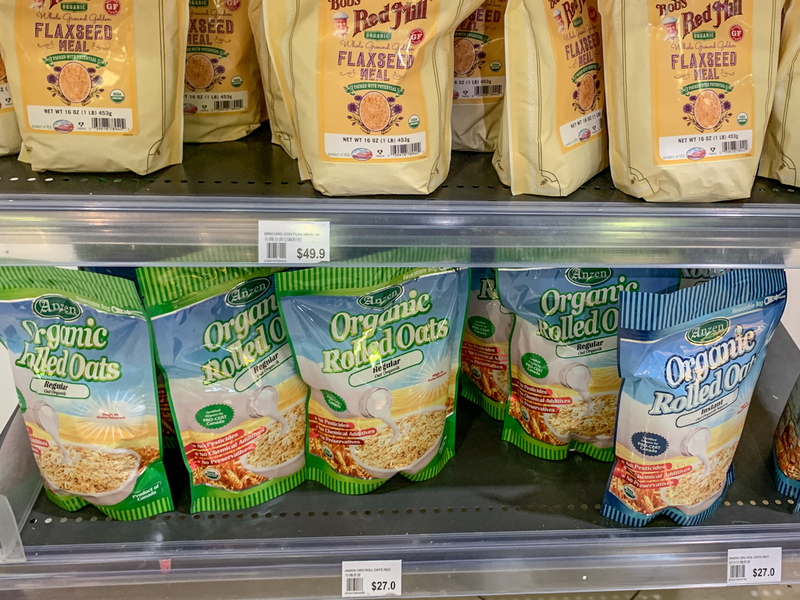 Here is another partially organic display in the middle of the store. 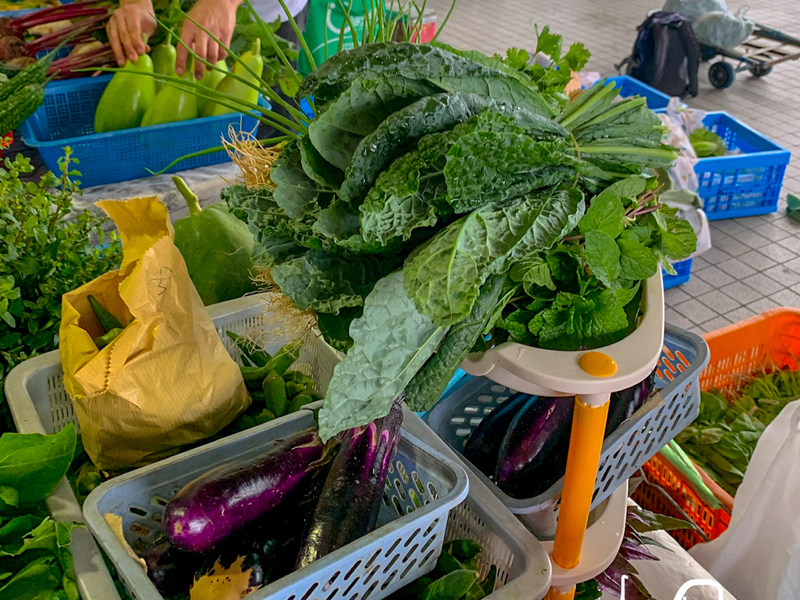 There is organic pumpkin, organic greens, organic red and white cabbage, and couple of other veggies I captured in following pics better. 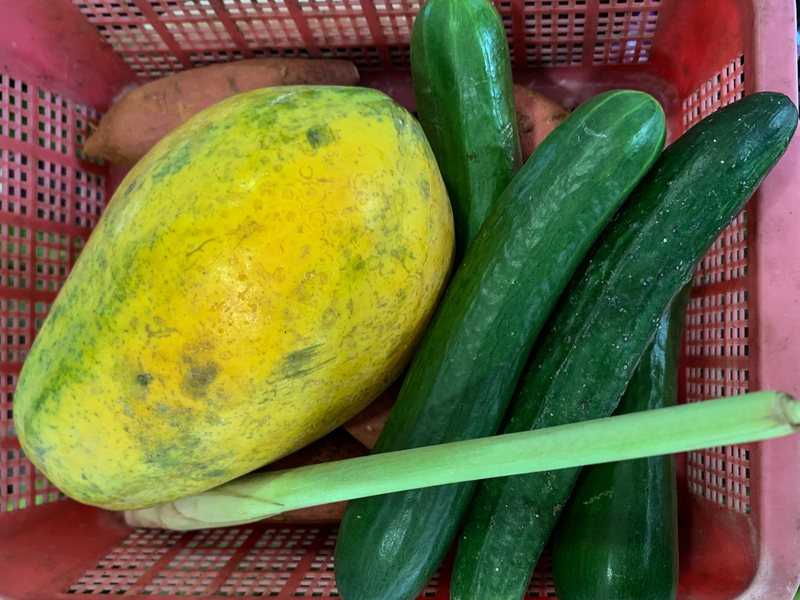 Organic reddish, egg plant, cucumbers and organic cherry tomatoes. 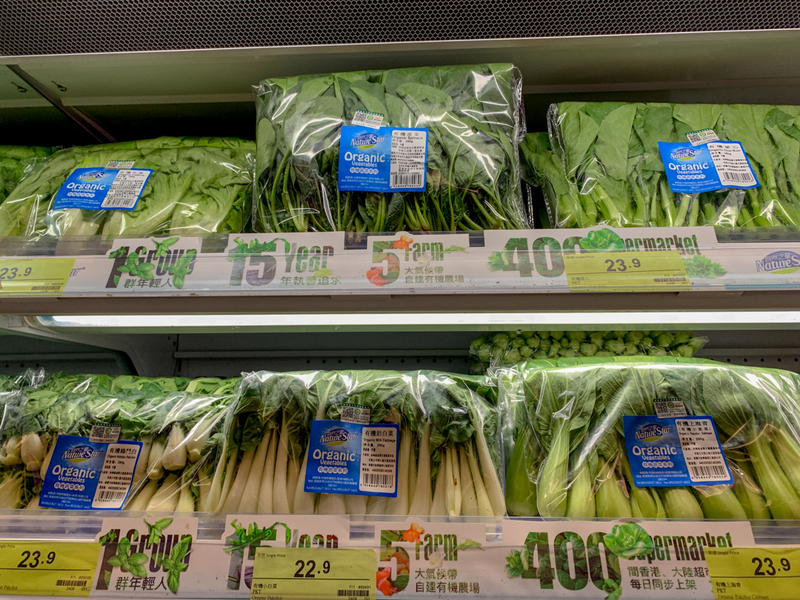 Organic broccoli is around 35 HKD depending on the weight. 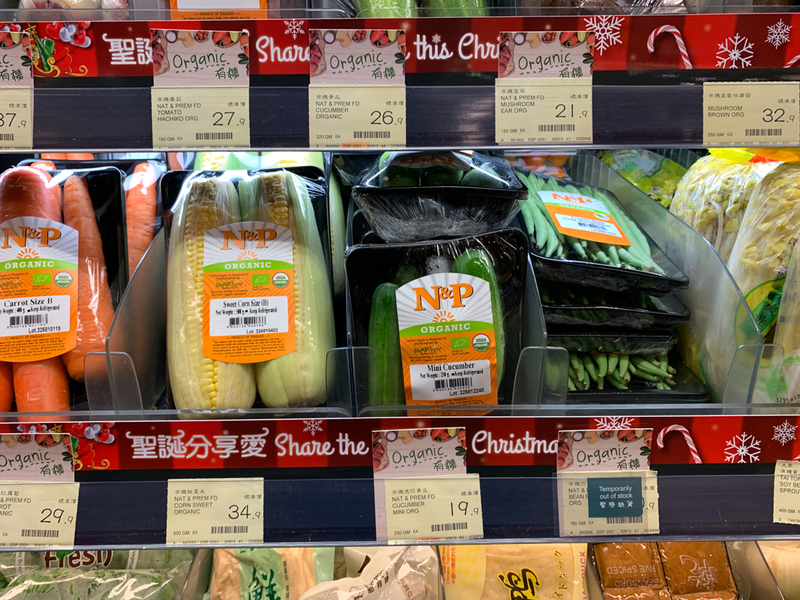 Orgnaic nappa cabbage is 25-35 HKD. 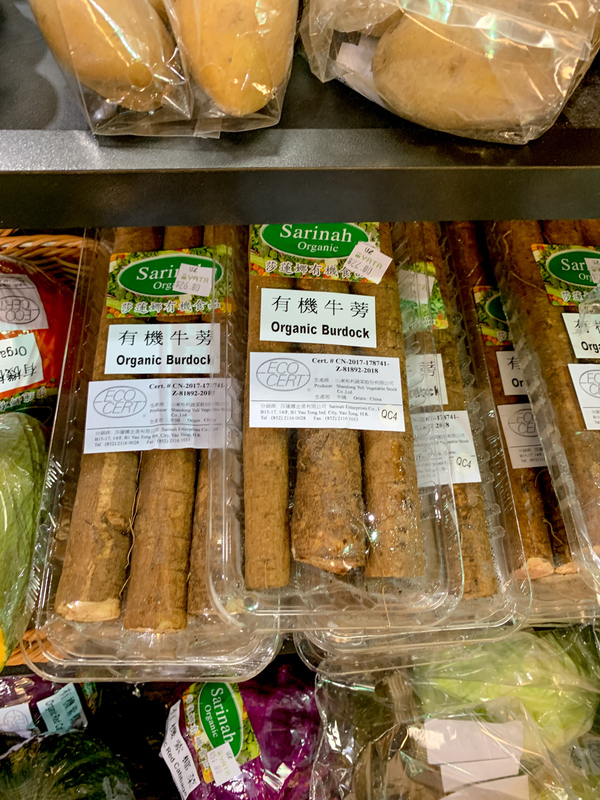 Organic burdock, whatever this is. 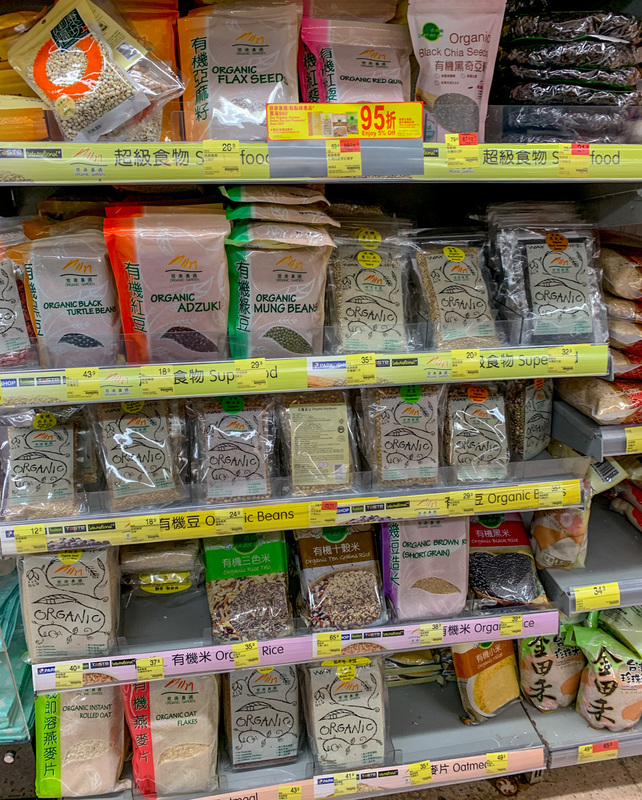 Let’s move on to the dried goods. 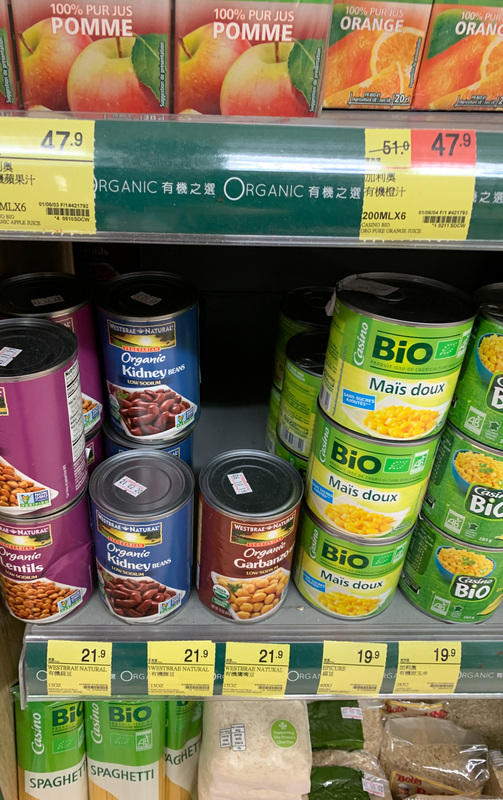 I couldn’t spot any canned goods such as organic beans, lentils, or tomatoes here. 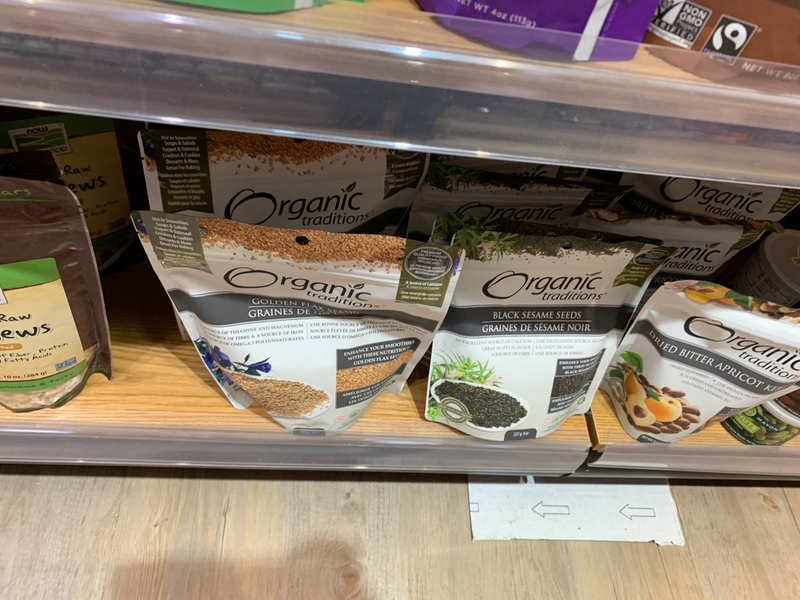 Here is some organic black rice and organic millet. 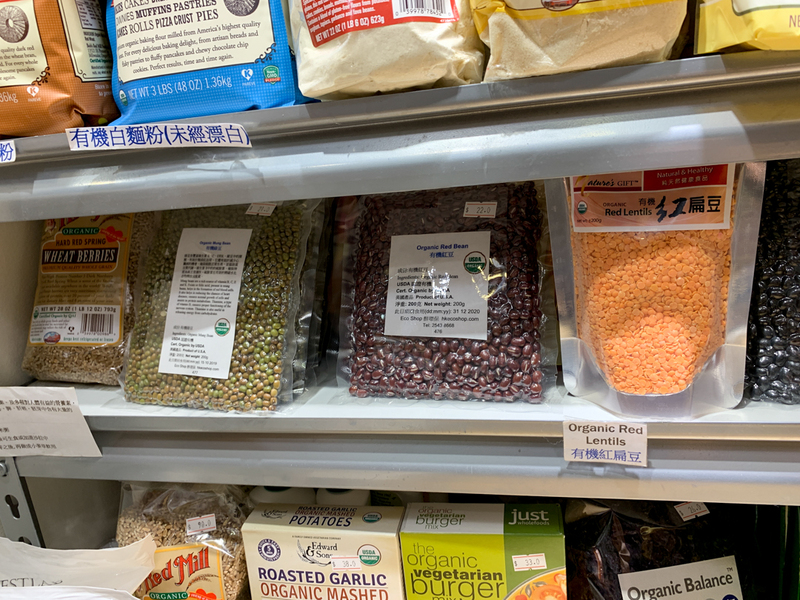 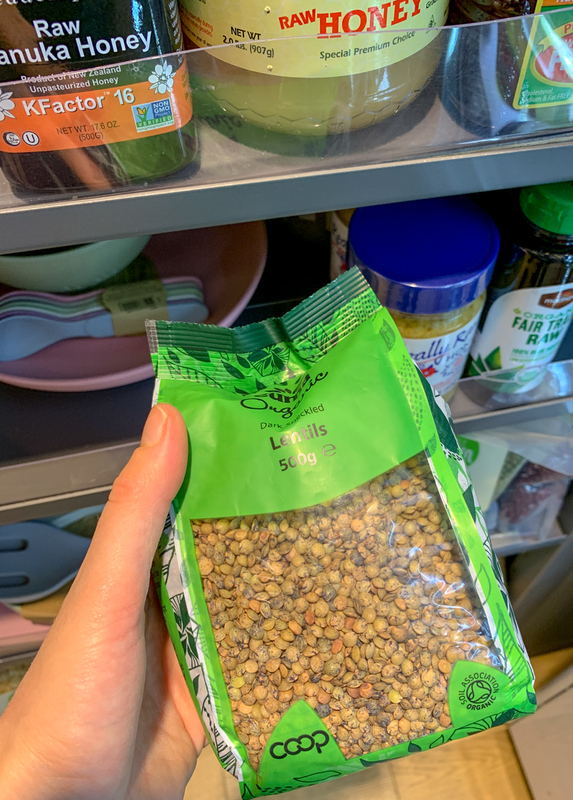 Organic lentils, organic millet, and organic sesame. 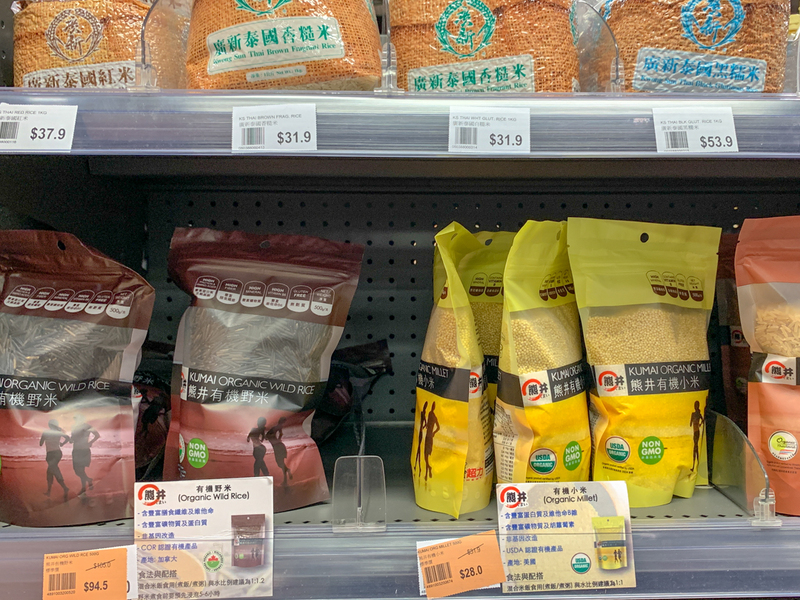 Different varieties of organic quinoa and organic buckwheat. 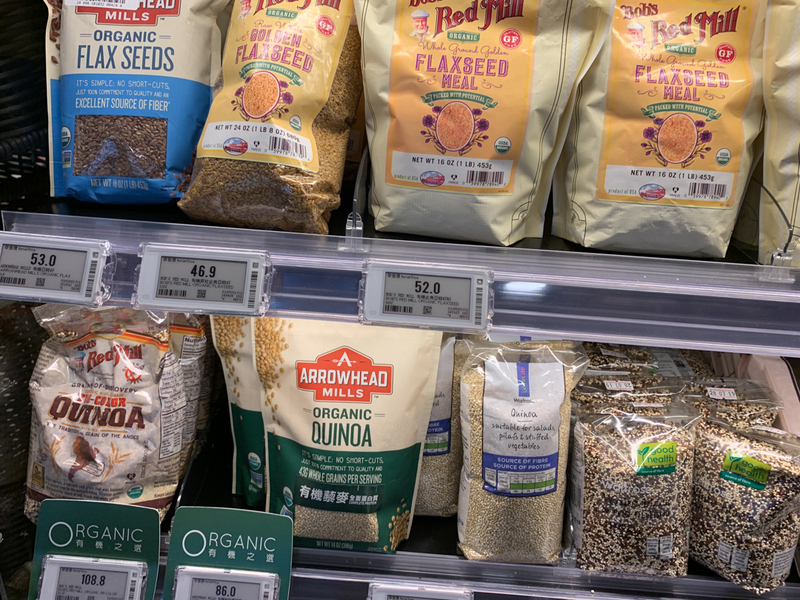 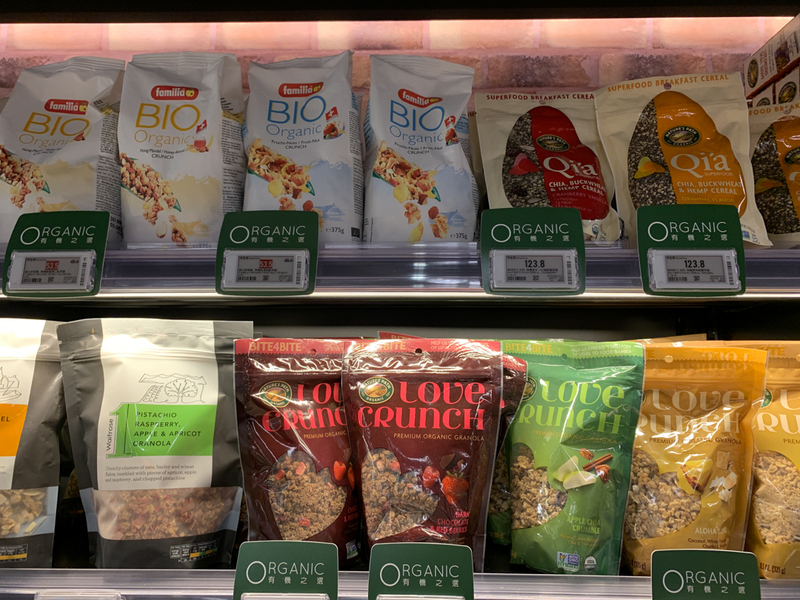 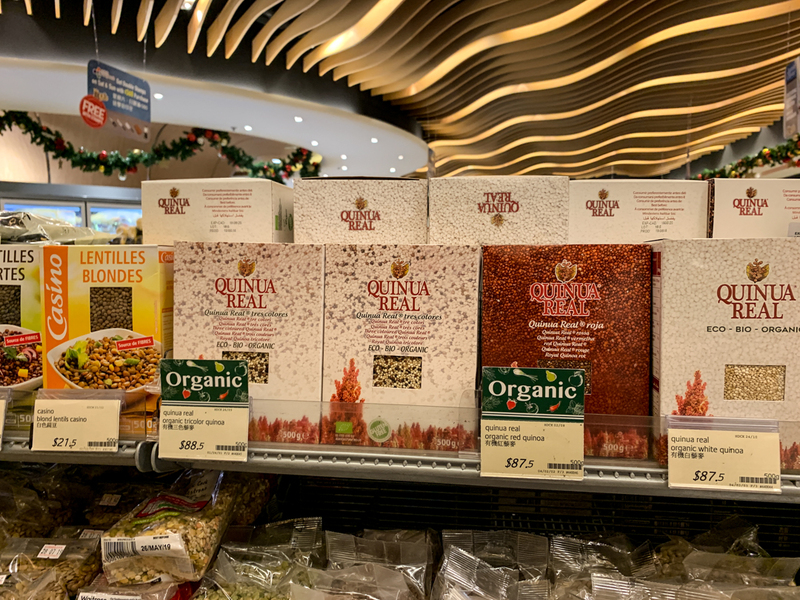 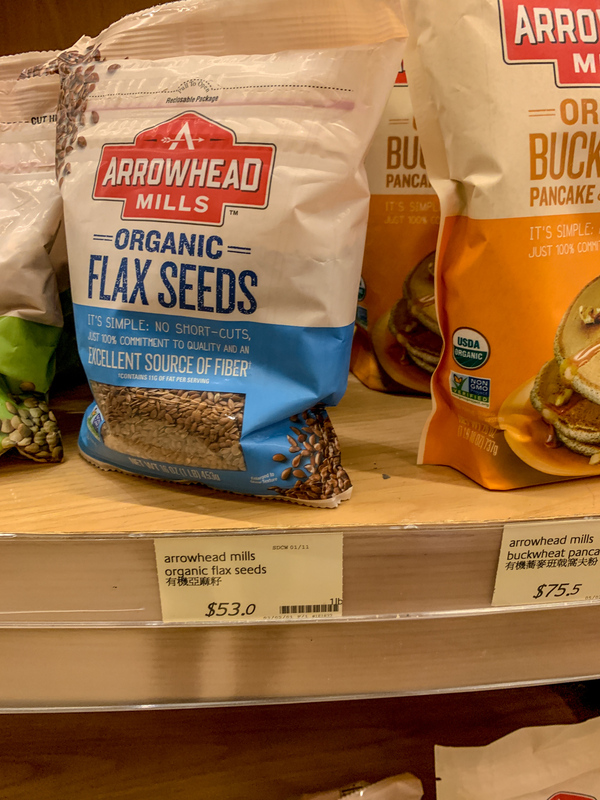 Organic chia seeds and organic quinoa on sale. 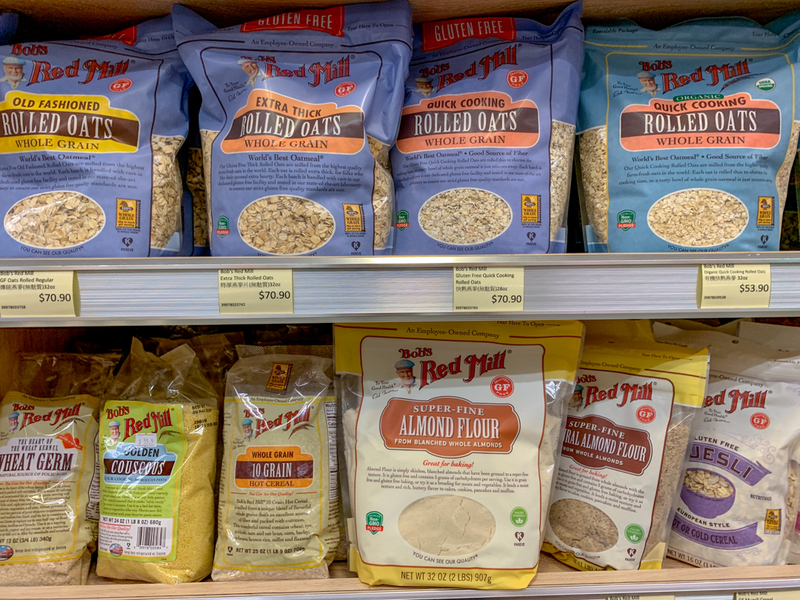 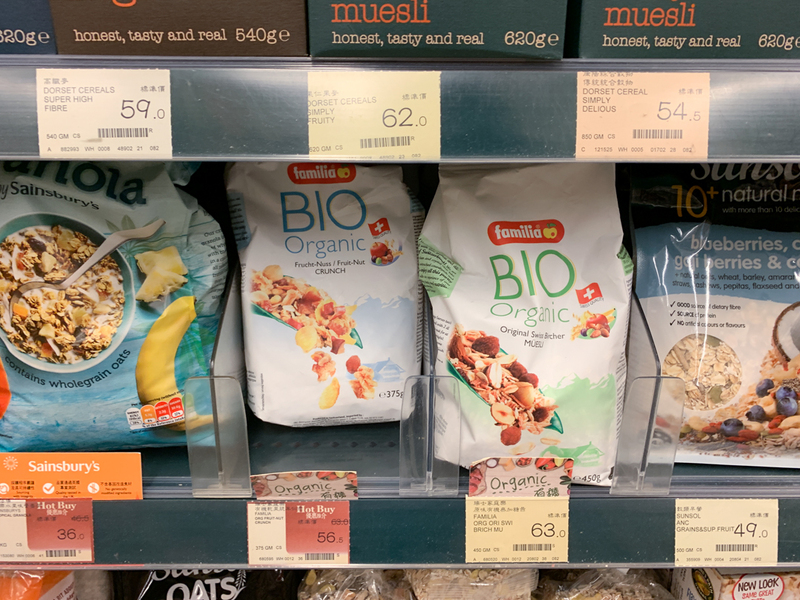 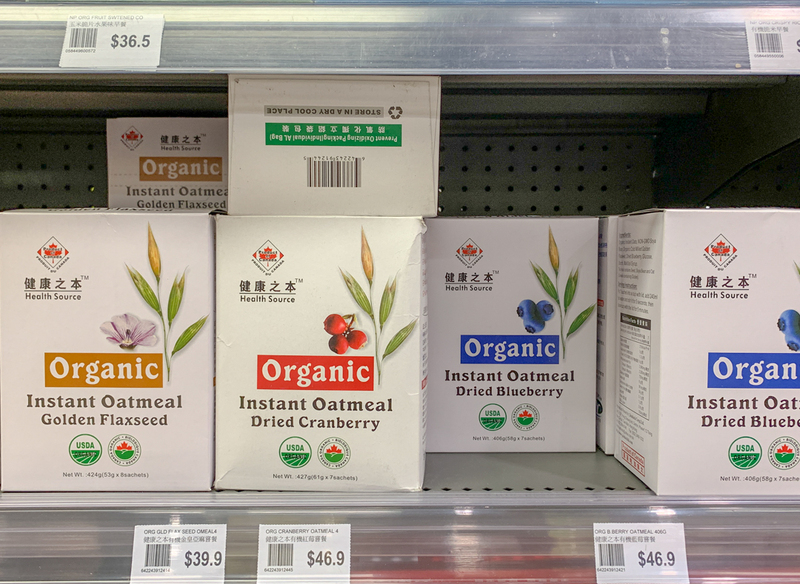 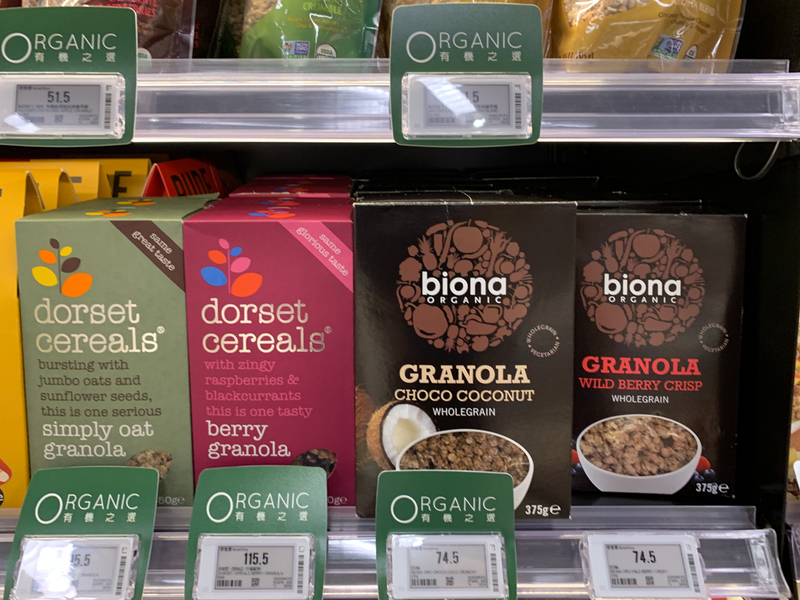 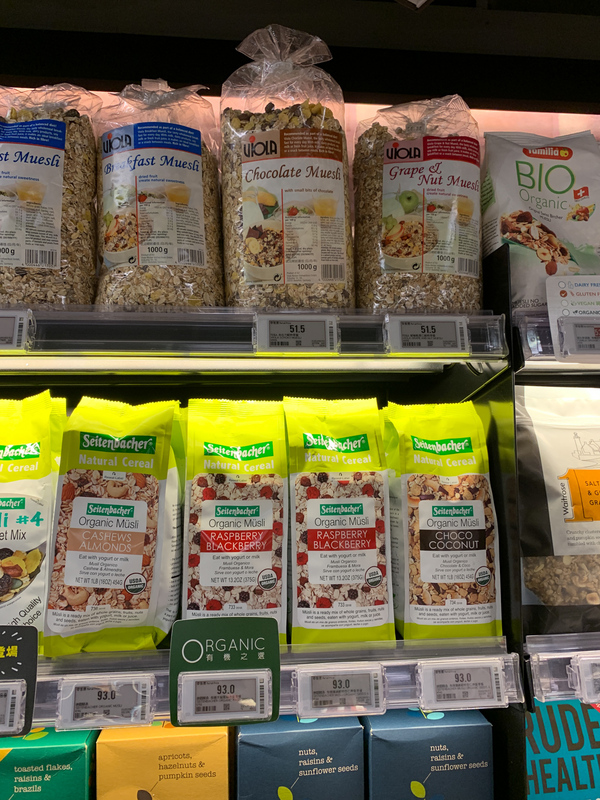 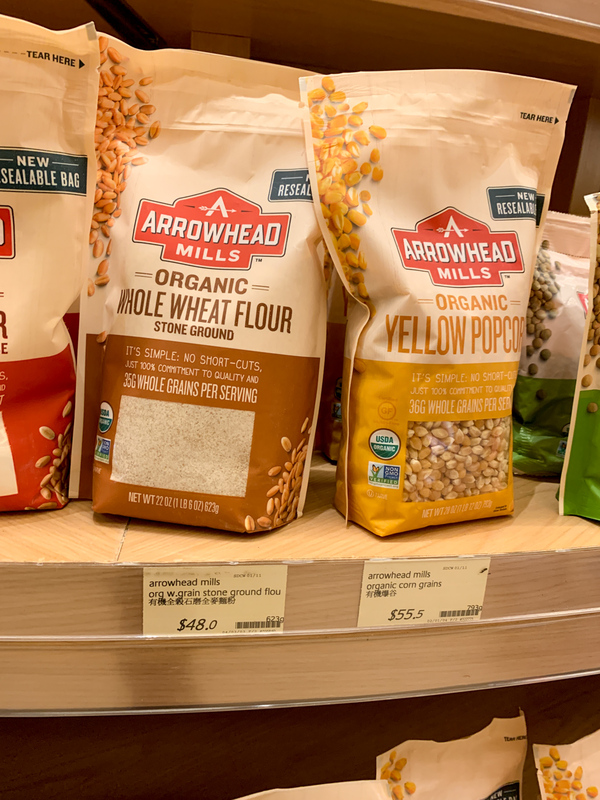 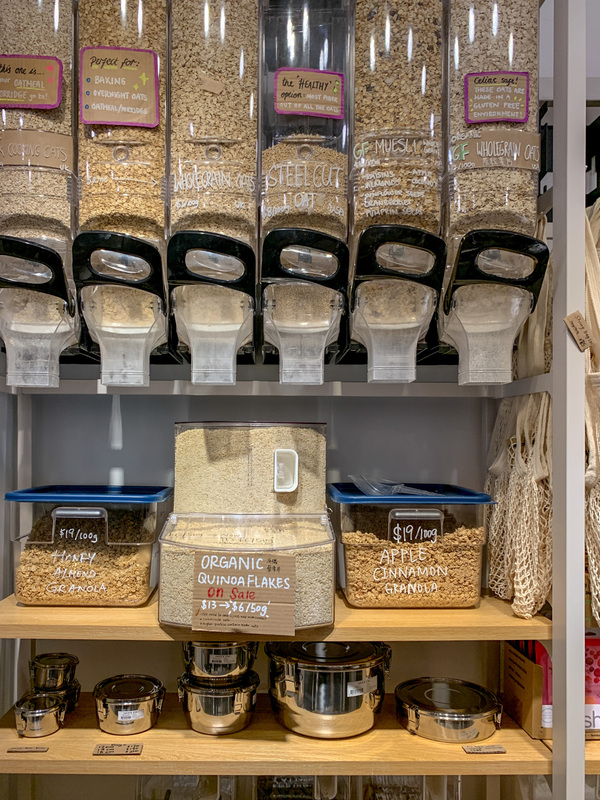 Different kinds of organic oatmeal. 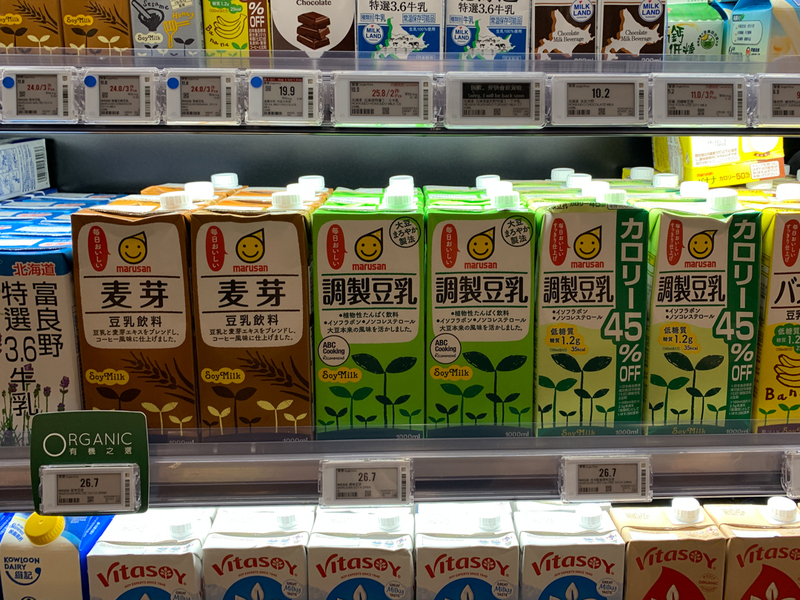 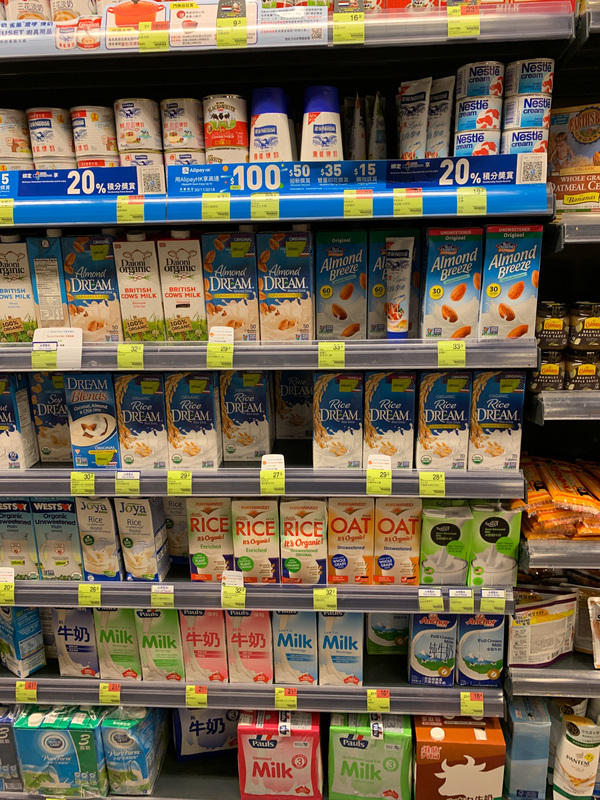 Organic rice milk and other plant milks, even rice chocolate milk. 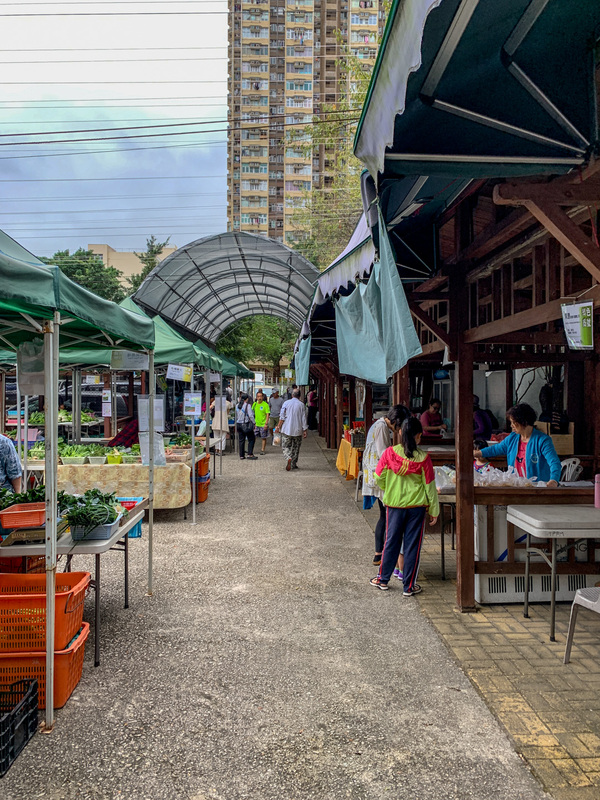 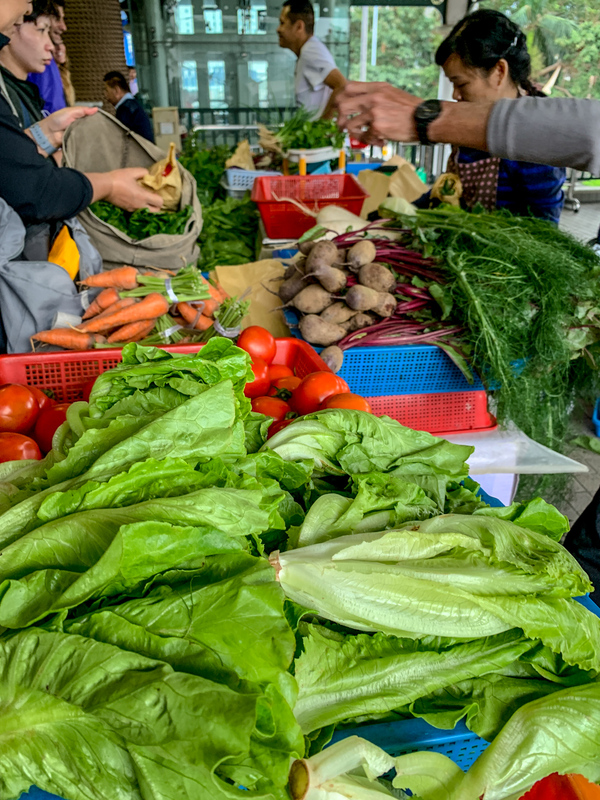 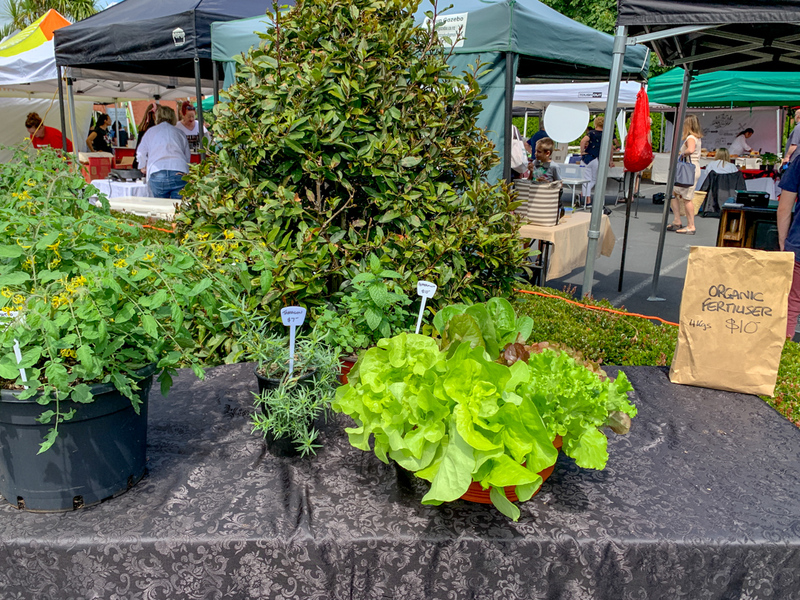 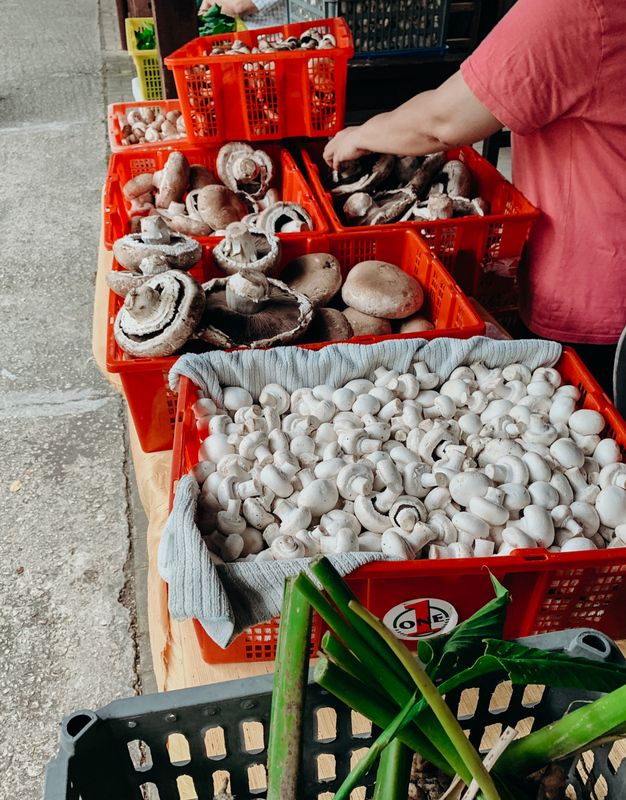 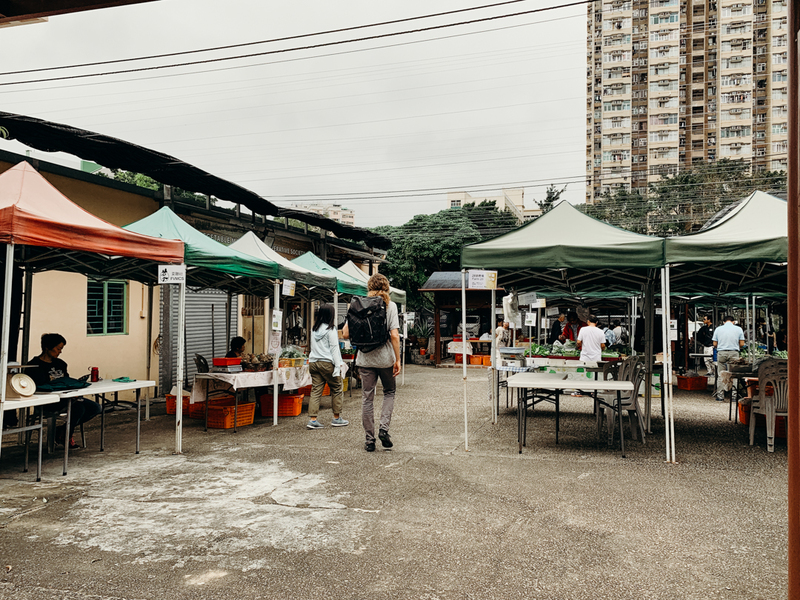 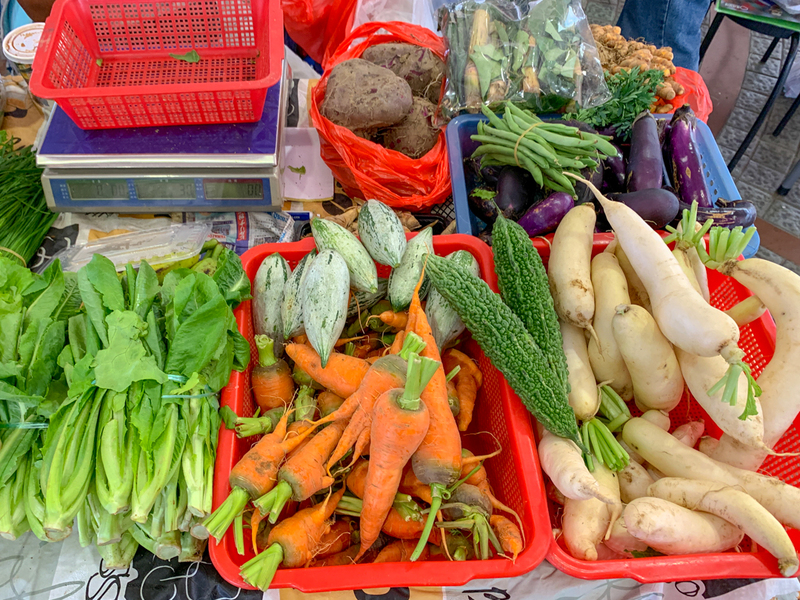 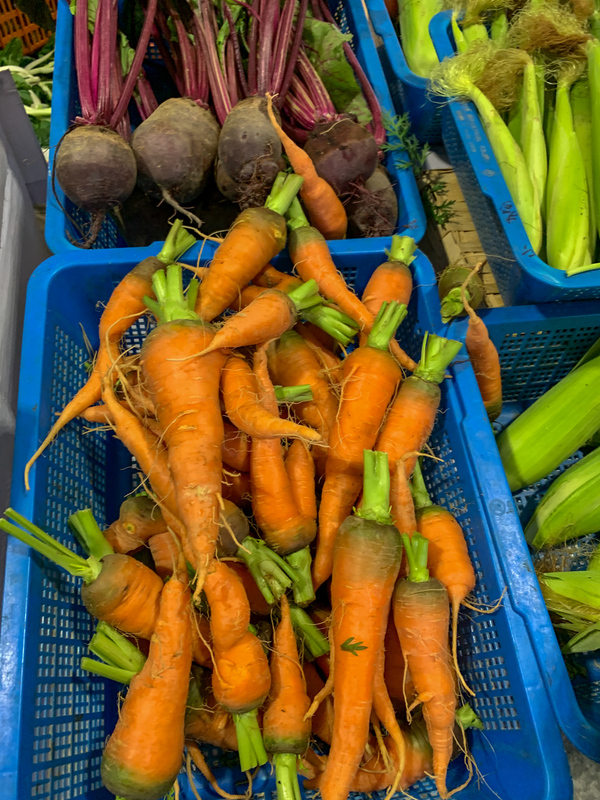 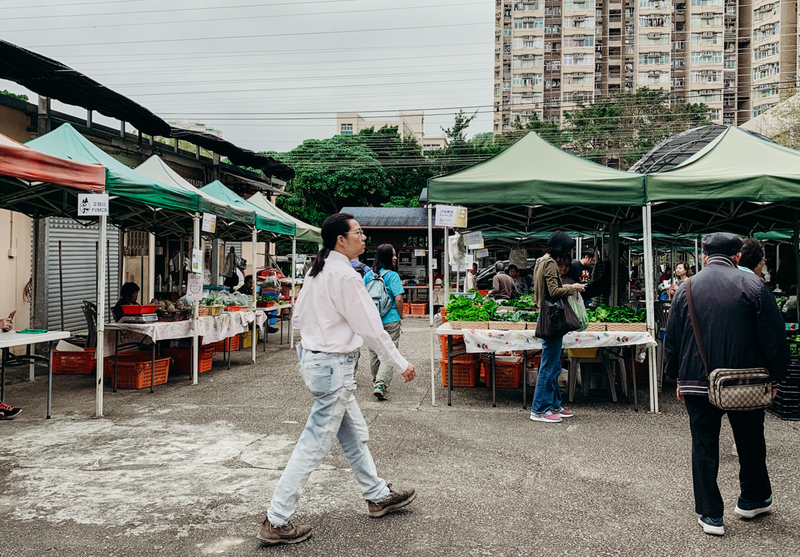 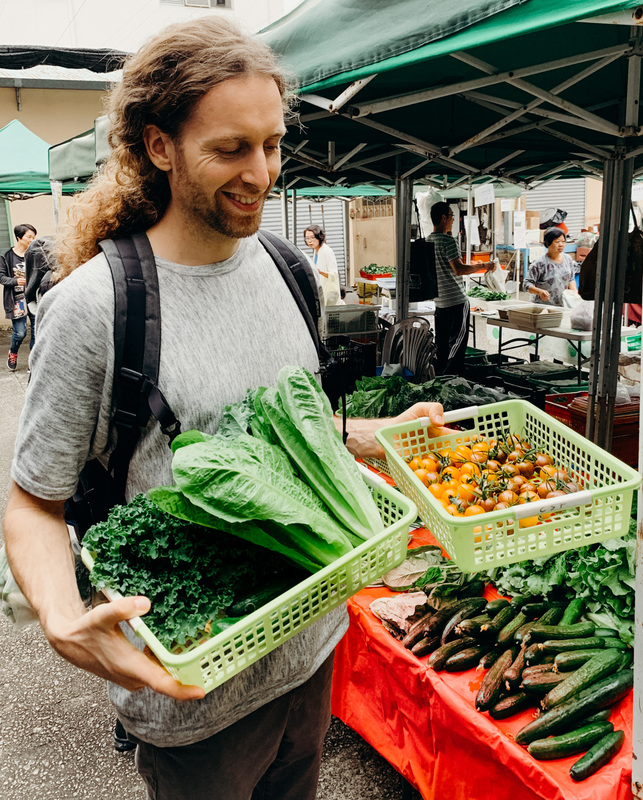 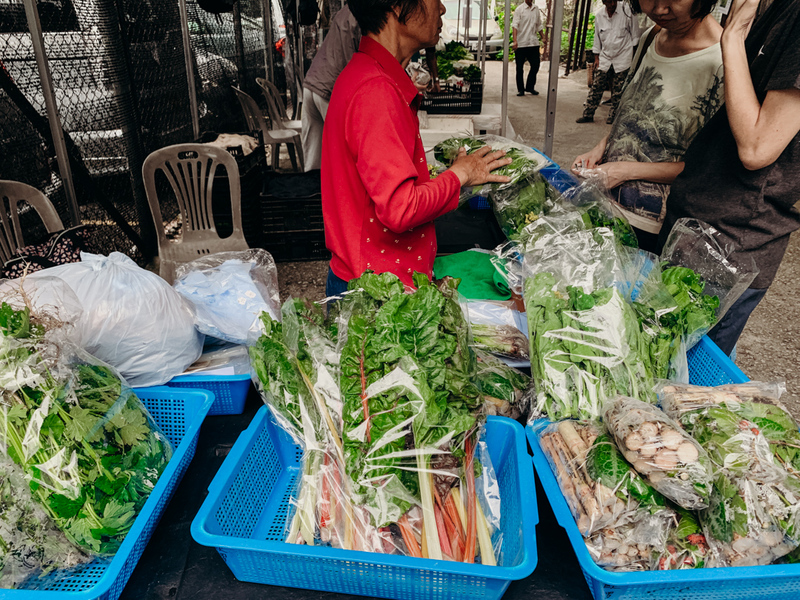 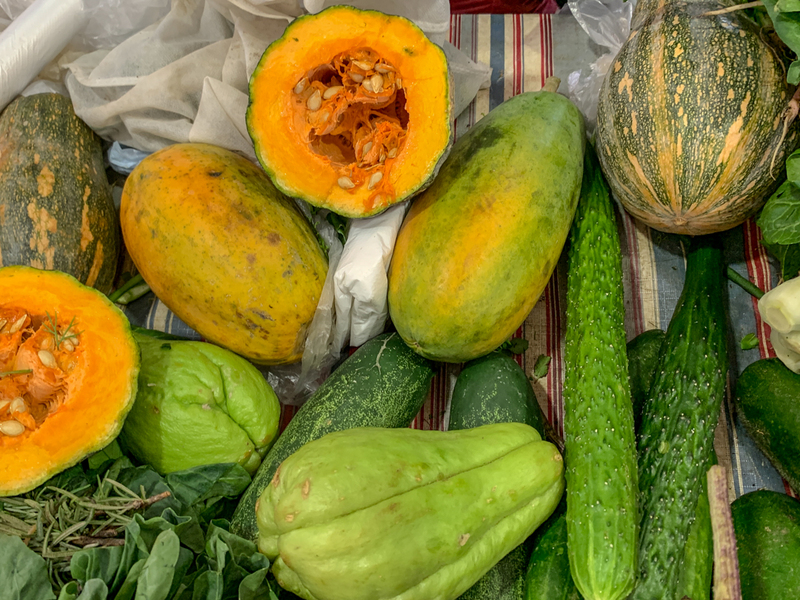 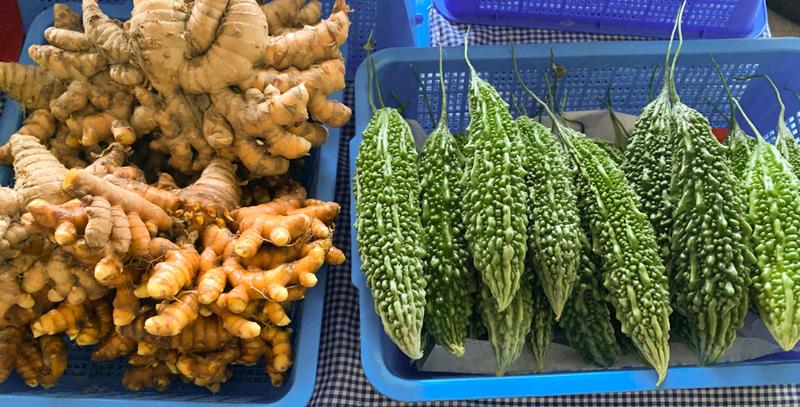 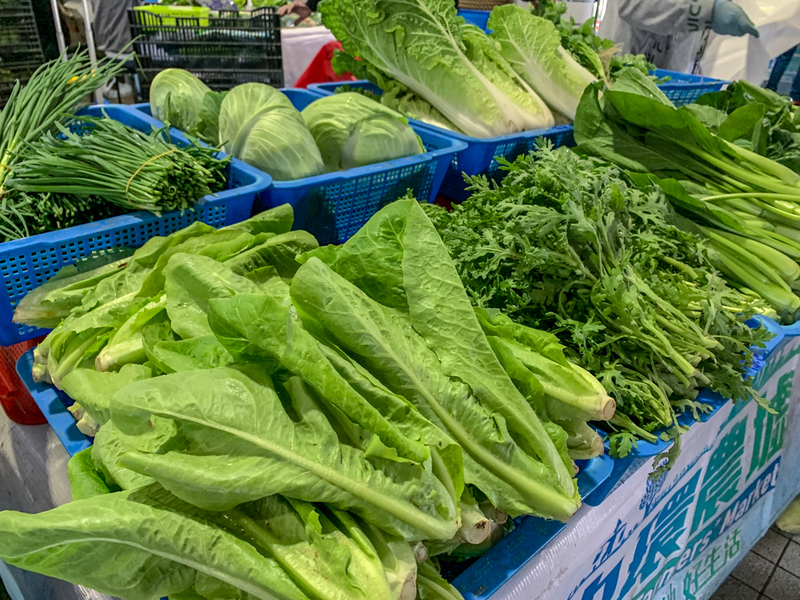 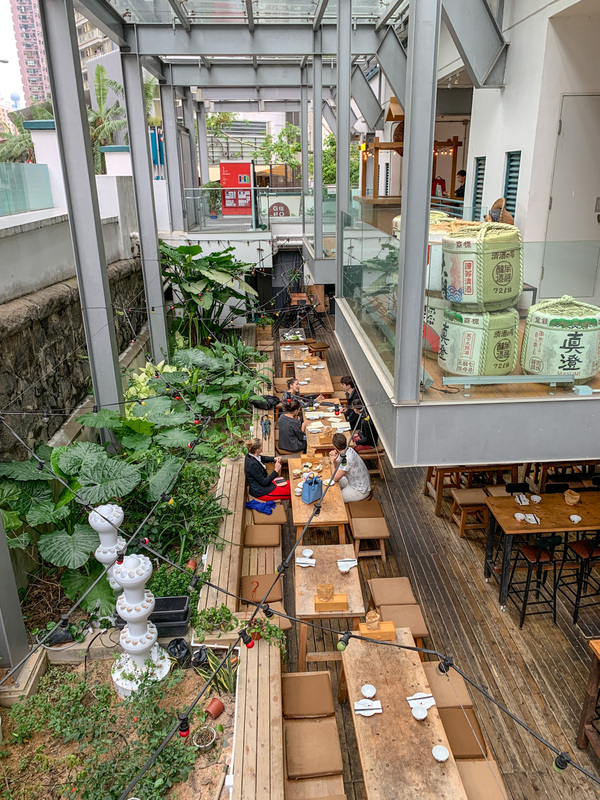 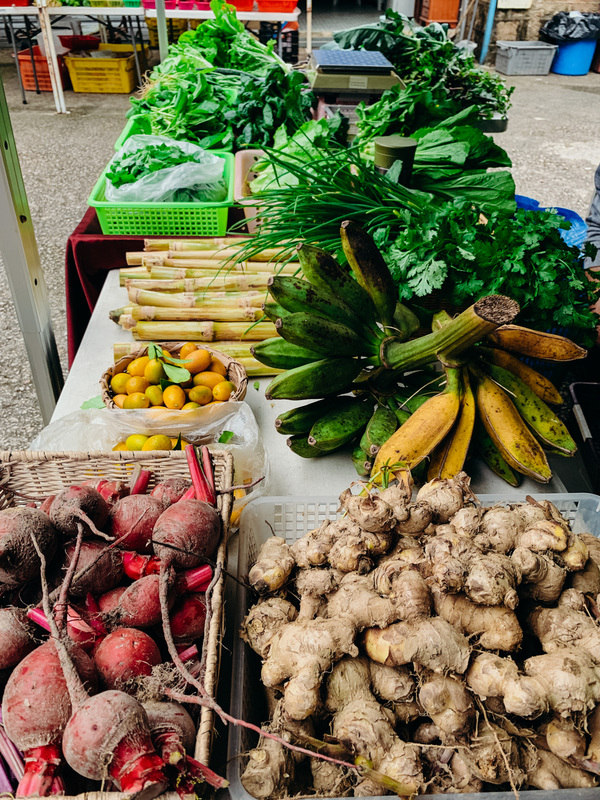 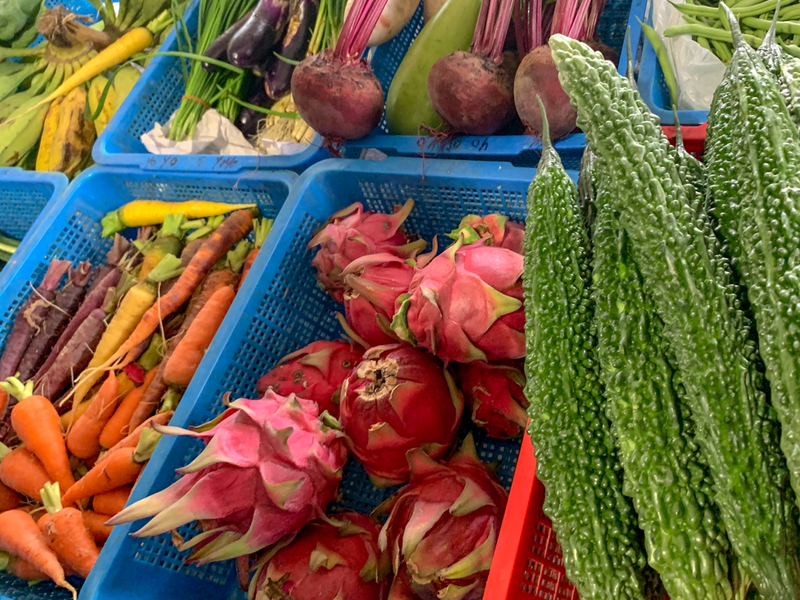 Tai Po Farmers’ Market is an all organic farmers’ market located far outside the city center with a great selection of veggies even during the winter time. 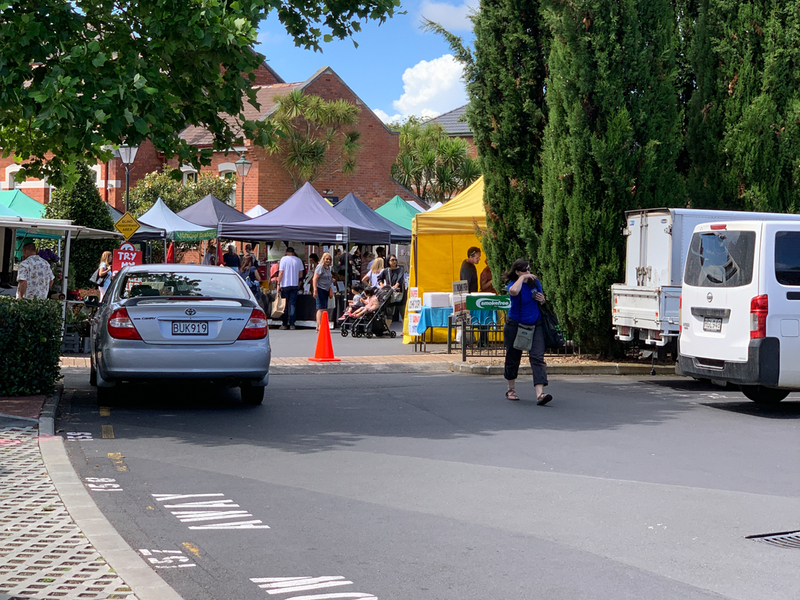 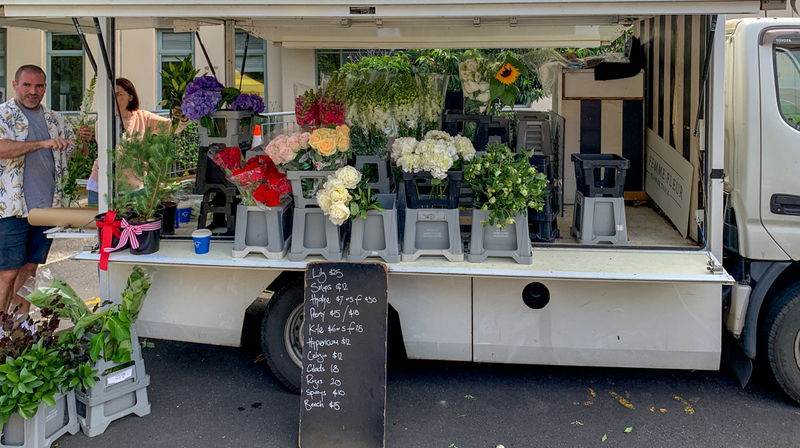 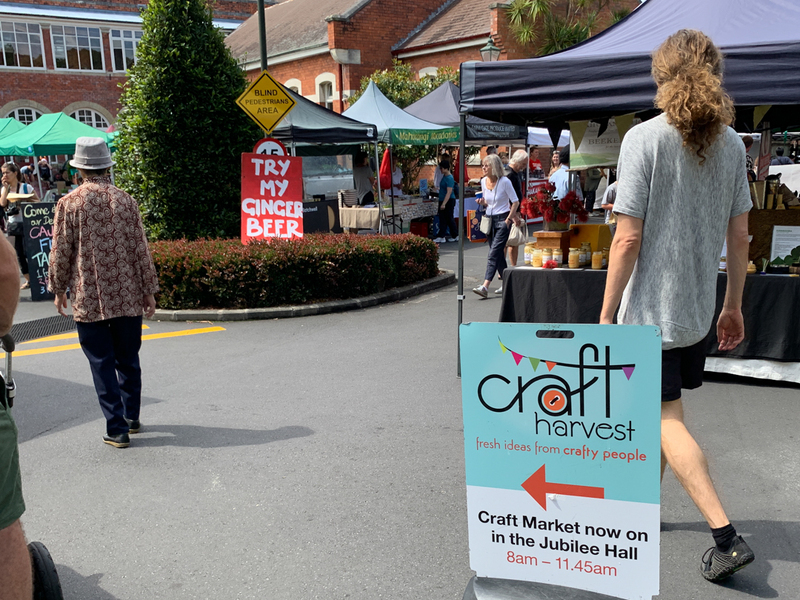 Held on Wednesdays 10AM-4PM and Sundays 9AM-5PM it’s a rather small farmers’ market, not because there are few farmers, but because they don’t have much produce and the produce is more or less the same, making the variety rather limited. 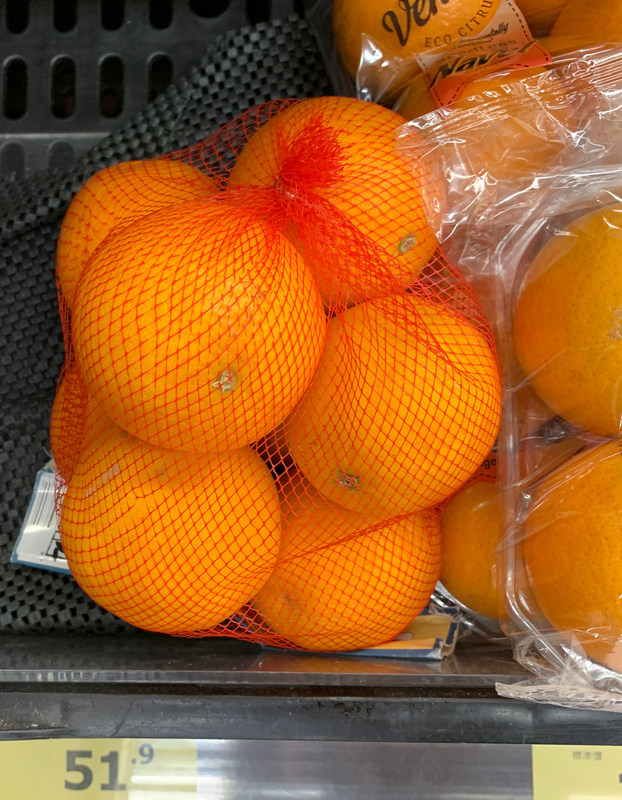 We were hoping for some fruit, but not expecting much. 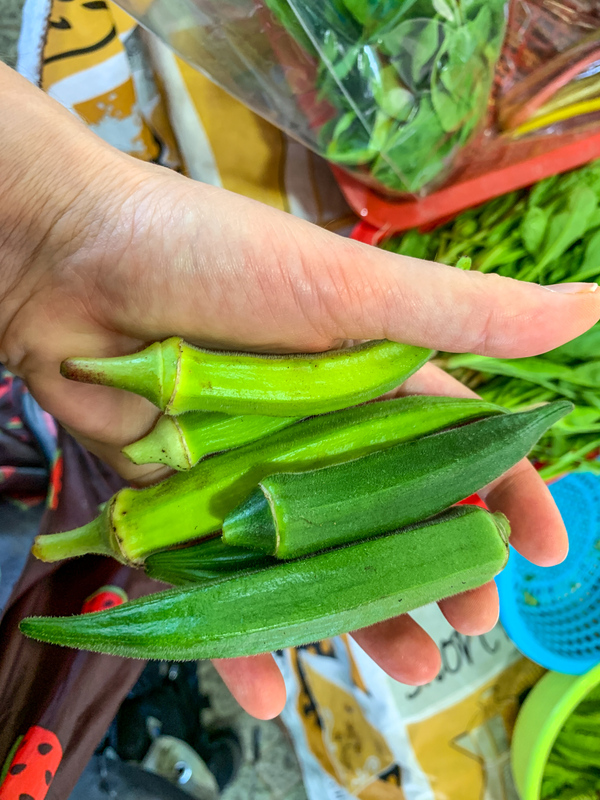 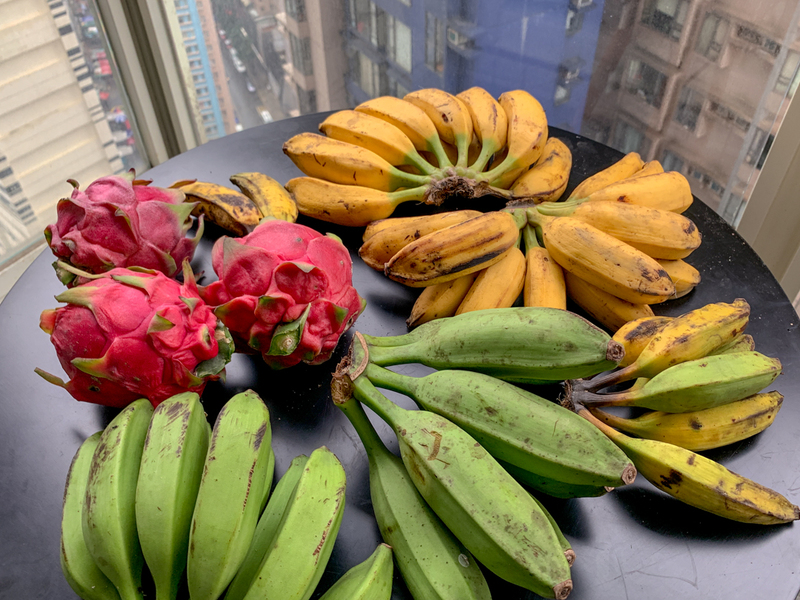 We found dragon fruit and some ripe bananas and bought kale, lettuce, tomatoes and okra. 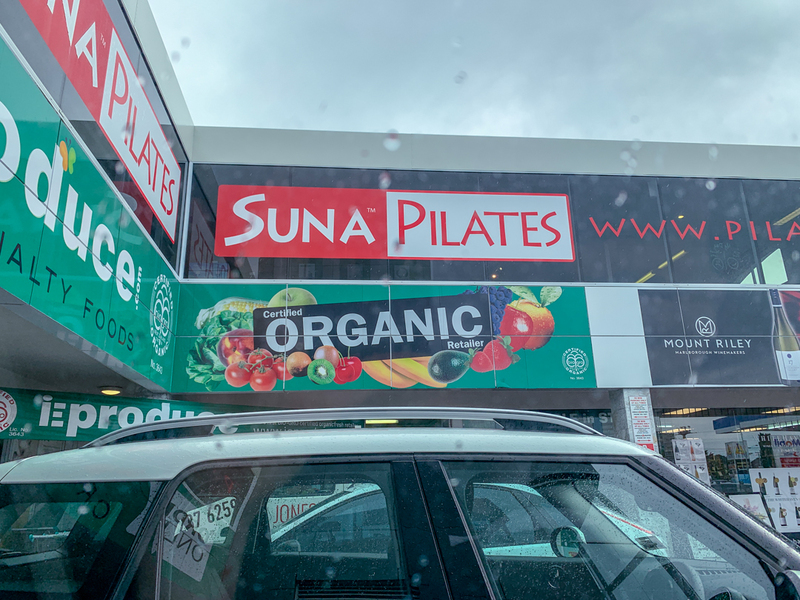 It’s next to the fire station. 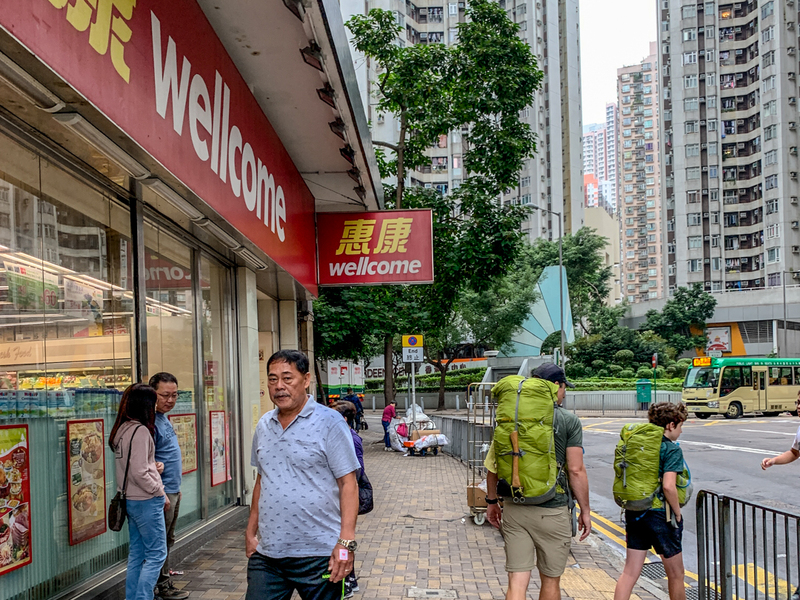 Pretty easy to find and to get to by train or bus. 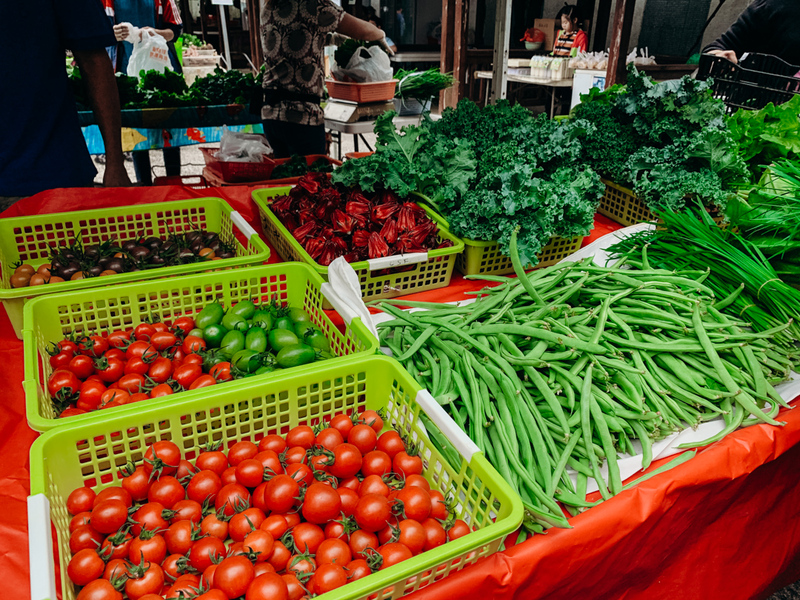 Kale and different kinds of cherry tomatoes at the Tai Po Farmers’ Market. 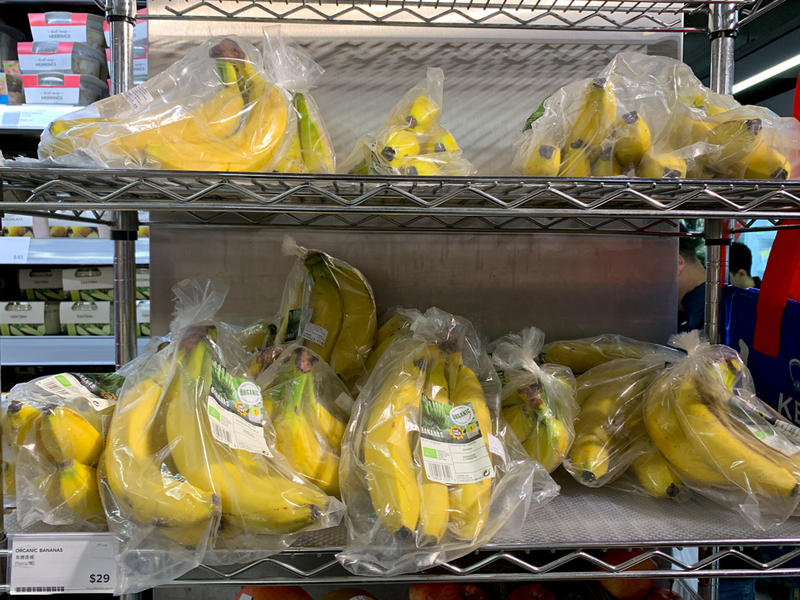 We bough all the yellow and dark ones on the left. 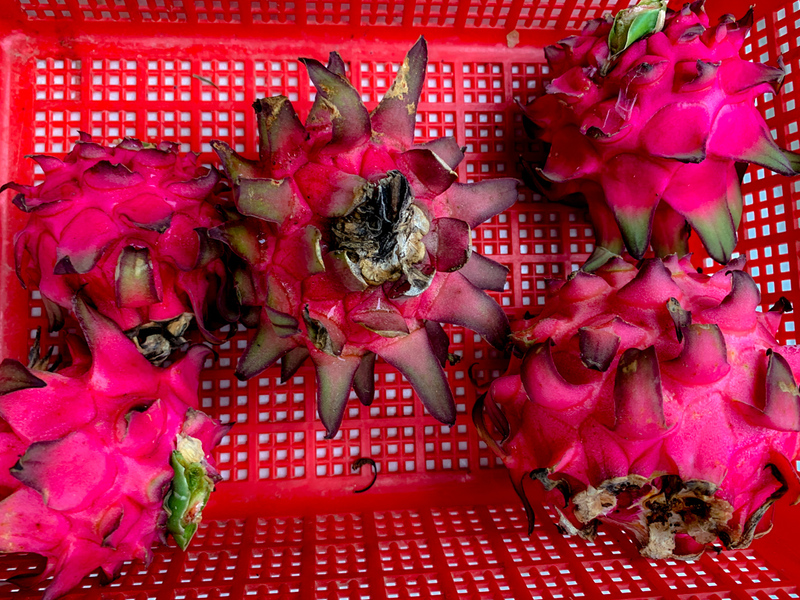 Dragon fruit at the Tai Po Farmers’ Market. 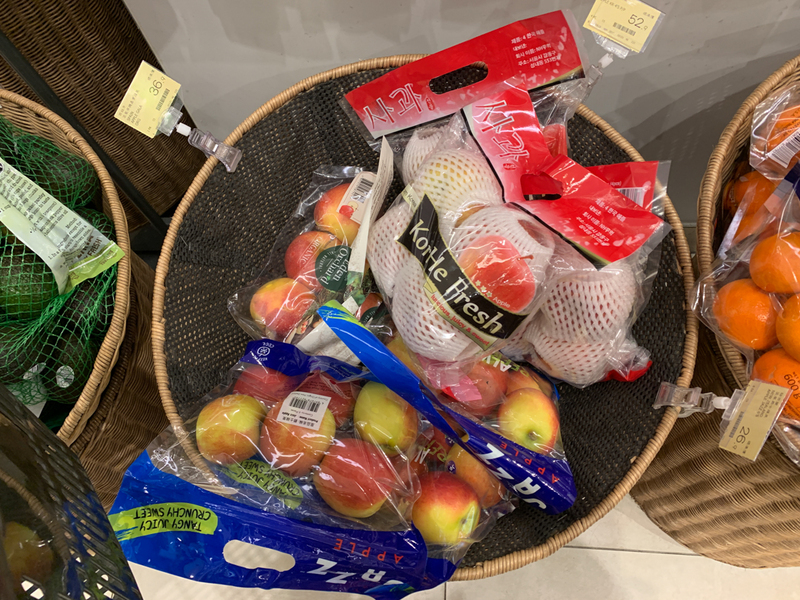 We bought 2 white ones and a pink one. 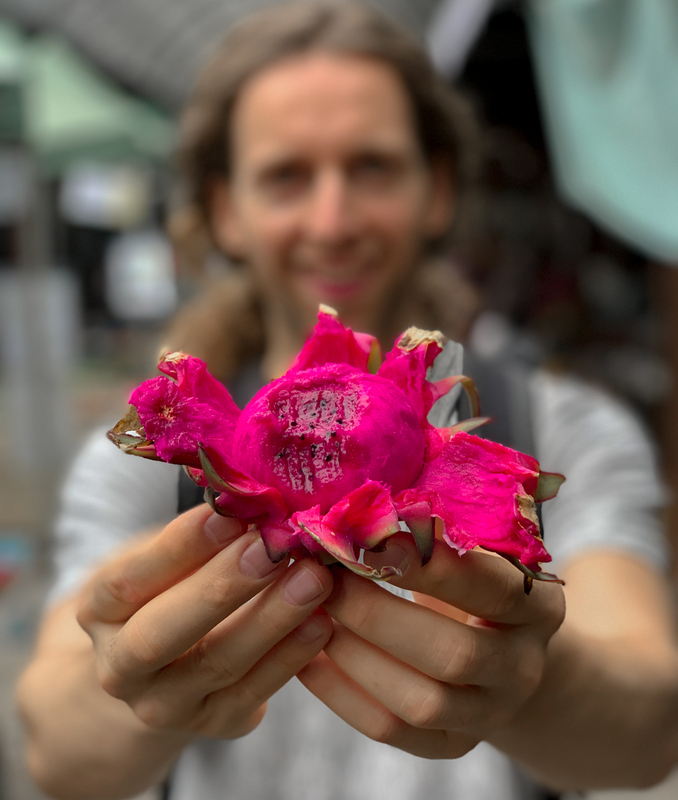 We ate the pink one at the market. 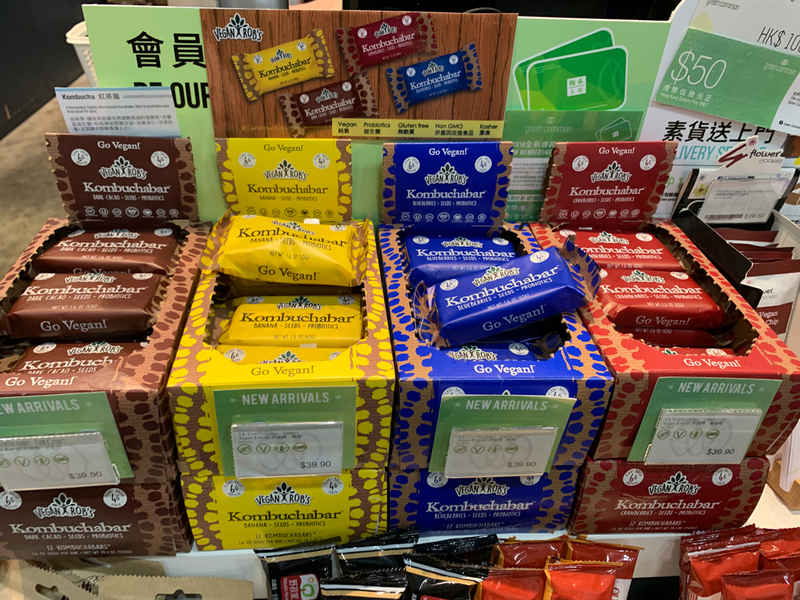 It was absolutely delicious and sweet. 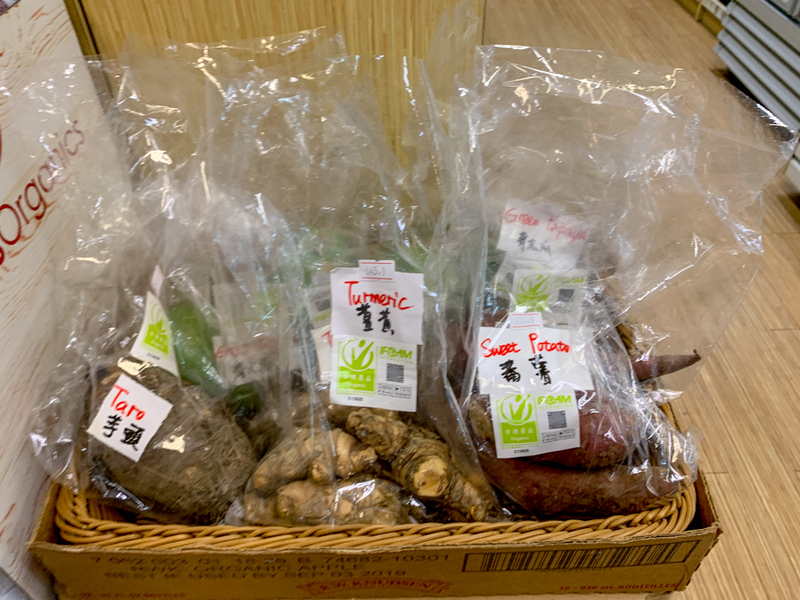 They were around 50 HKD each. 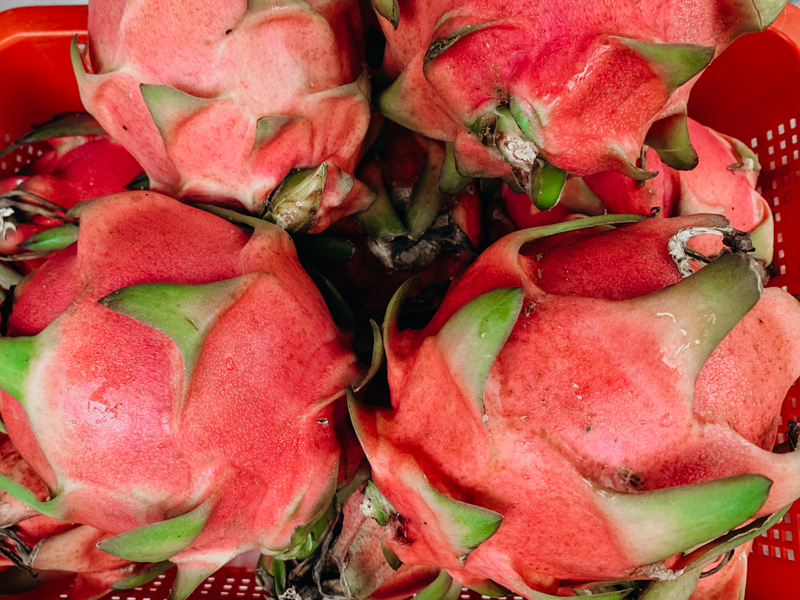 Organic dragon fruit at the Tai Po Farmers’ Market. 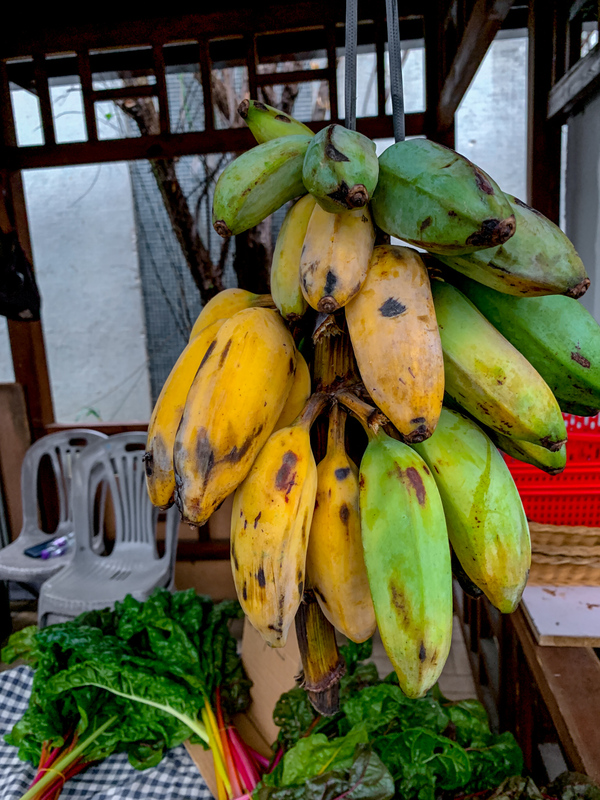 Bananas Tai Po Farmers’ Market Organic bananas. 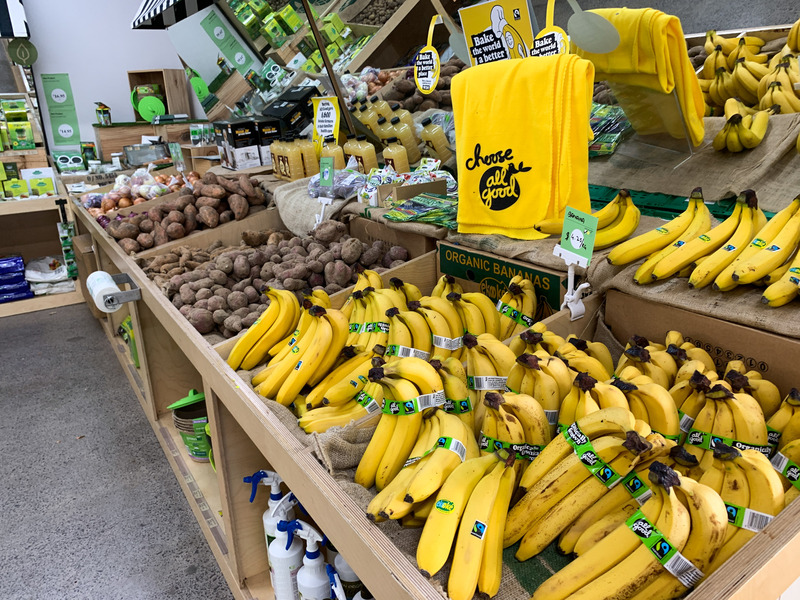 We bought all the yellow ones. 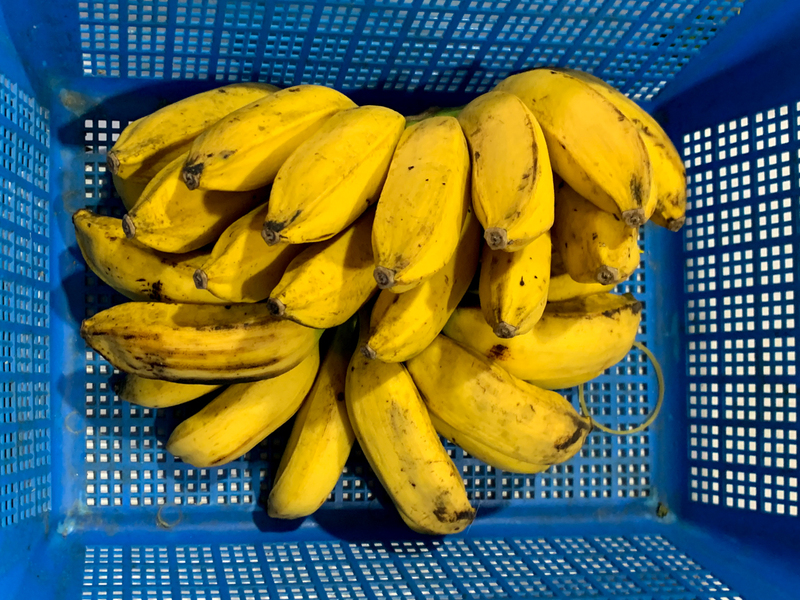 We payed around 50 Euro Cents for each banana. 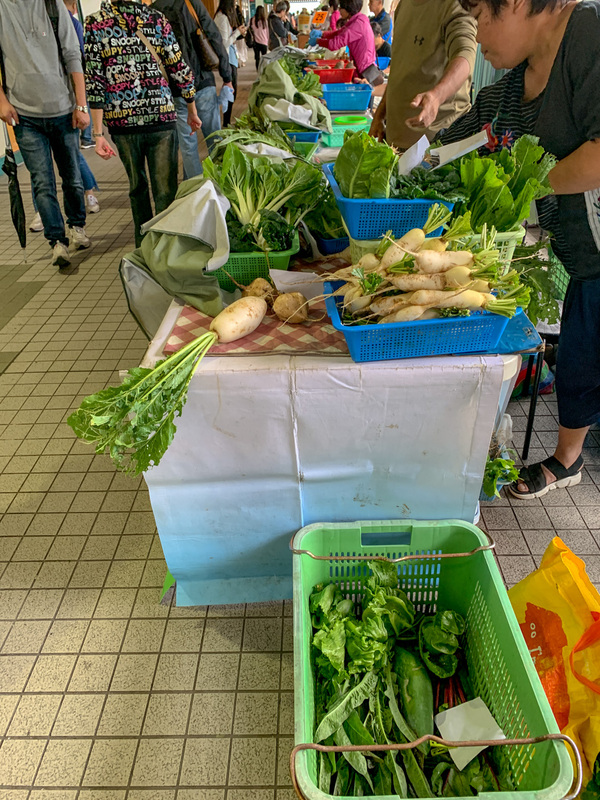 Organic greens and bananas, beets and fresh ginger roots at the Tai Po Farmers’ Market in Hongkong. 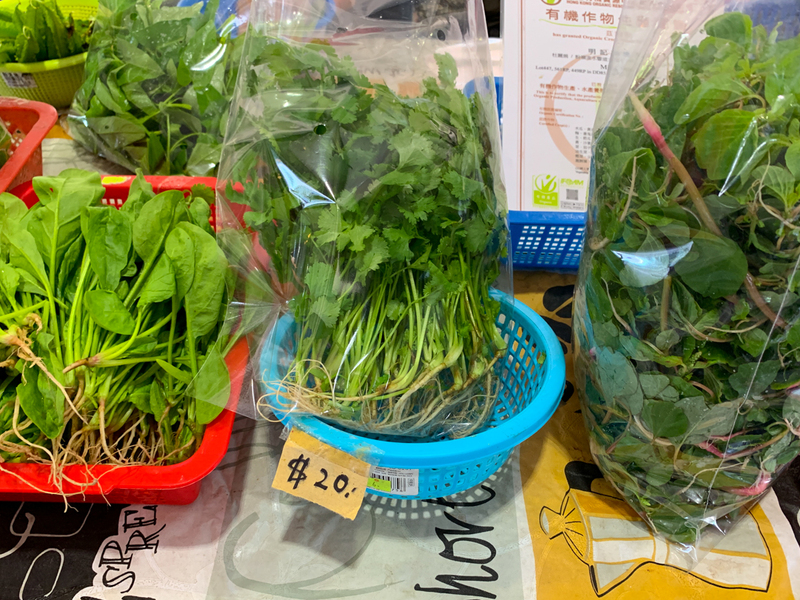 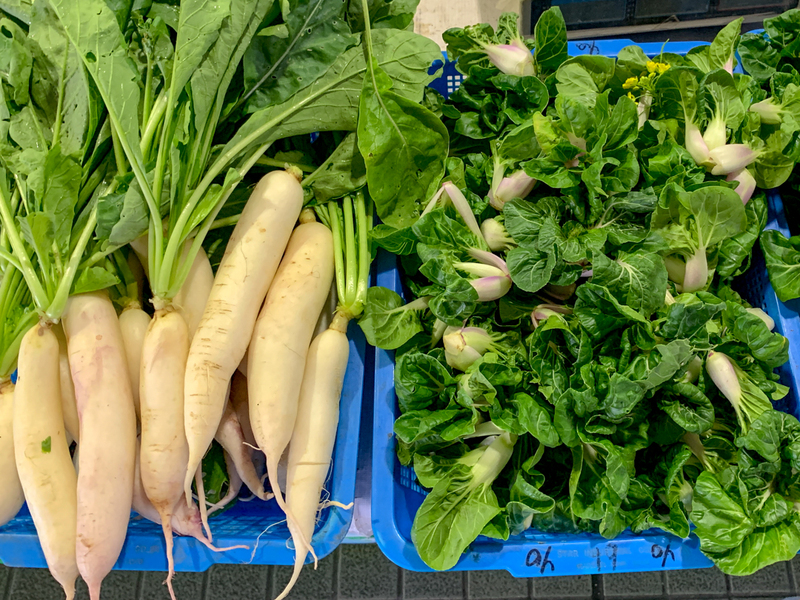 Organic greens and raddish at the Tai Po Farmers’ Market. 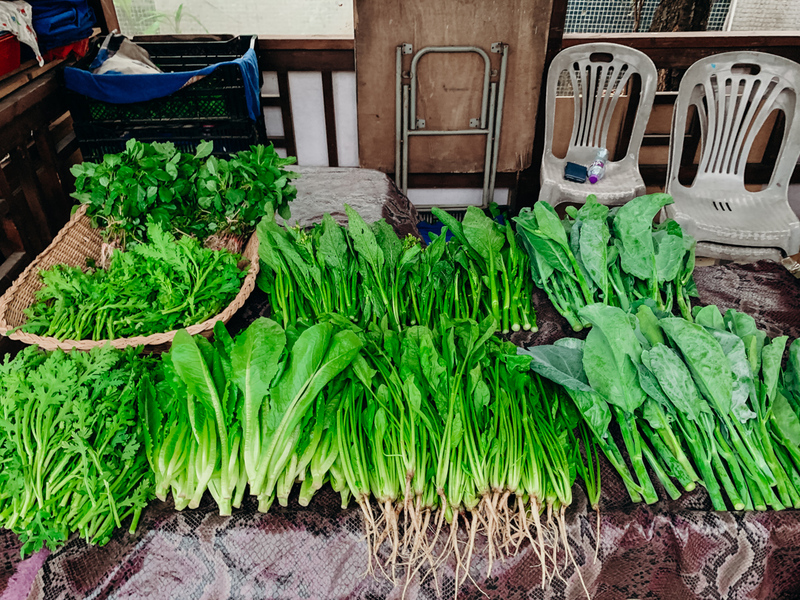 Chard and cilantro. 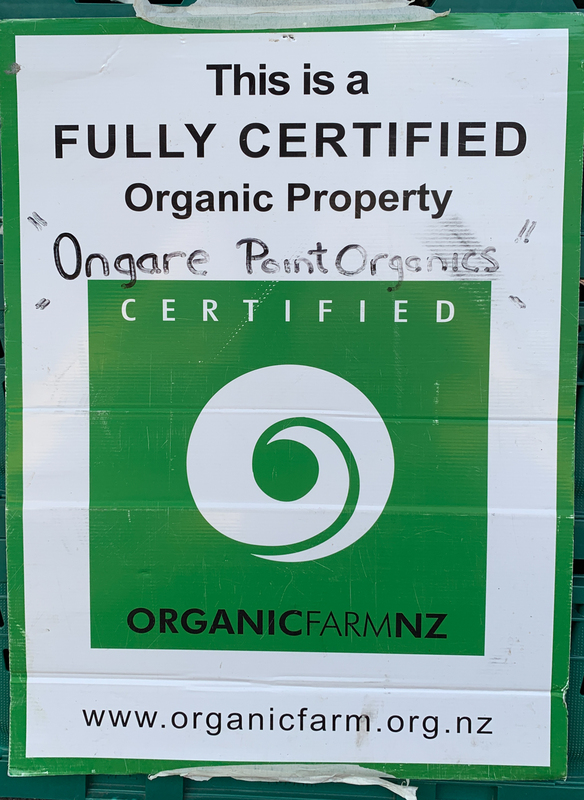 Organic sugar cane. 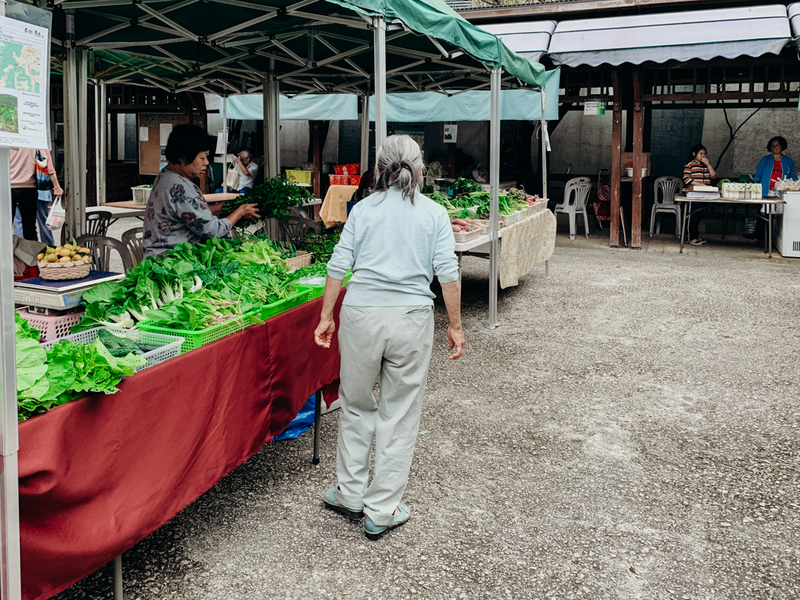 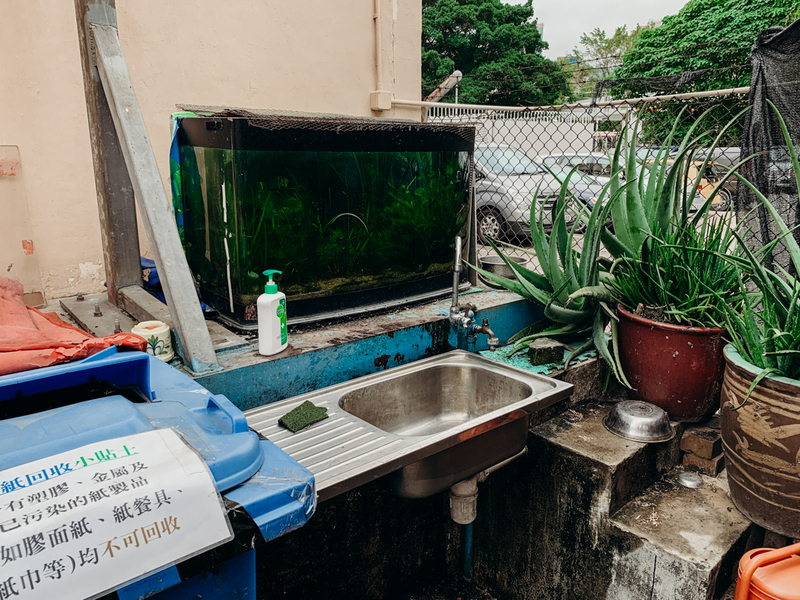 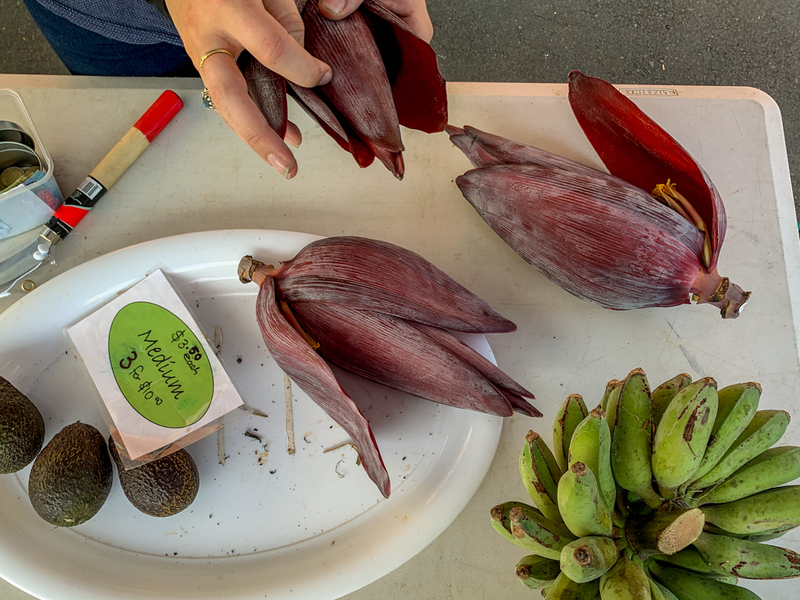 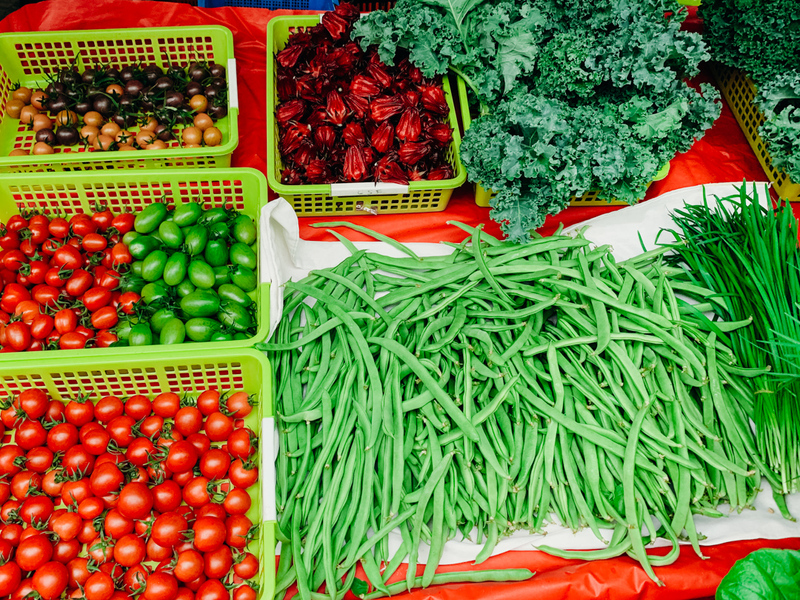 A nice perk at the Tai Po Farmers’ Market: Wash your hands and produce you wanna try. 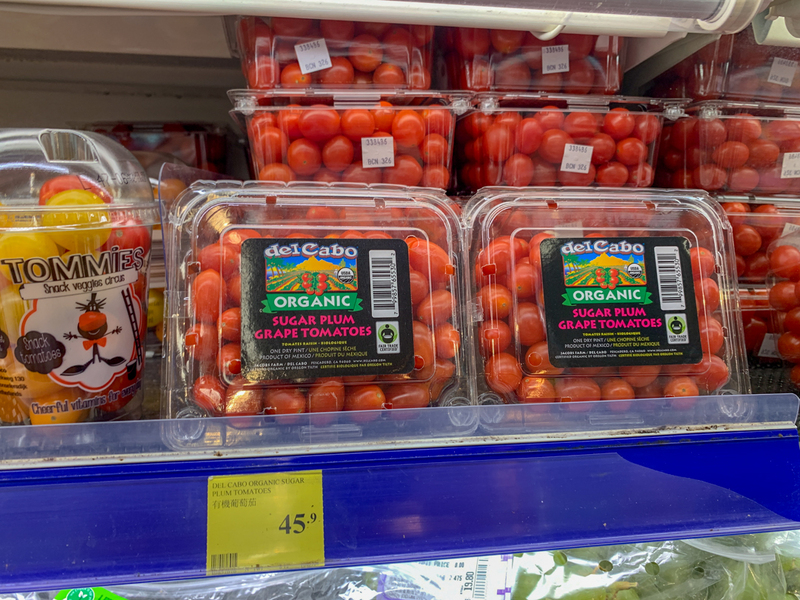 Totally recommend trying cherry tomatoes before buying, find the variety you like the most. 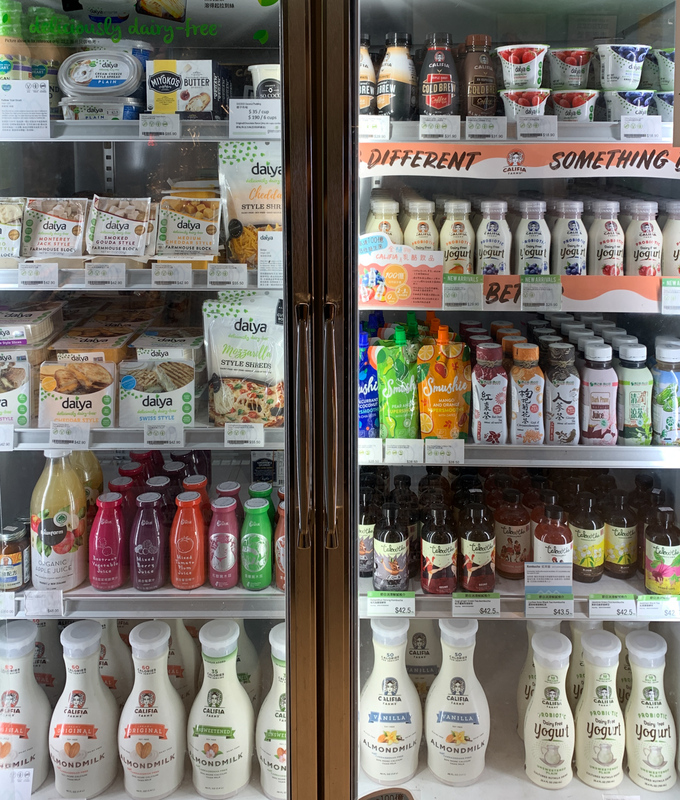 Vegan milks and organic apple sider vinegar. 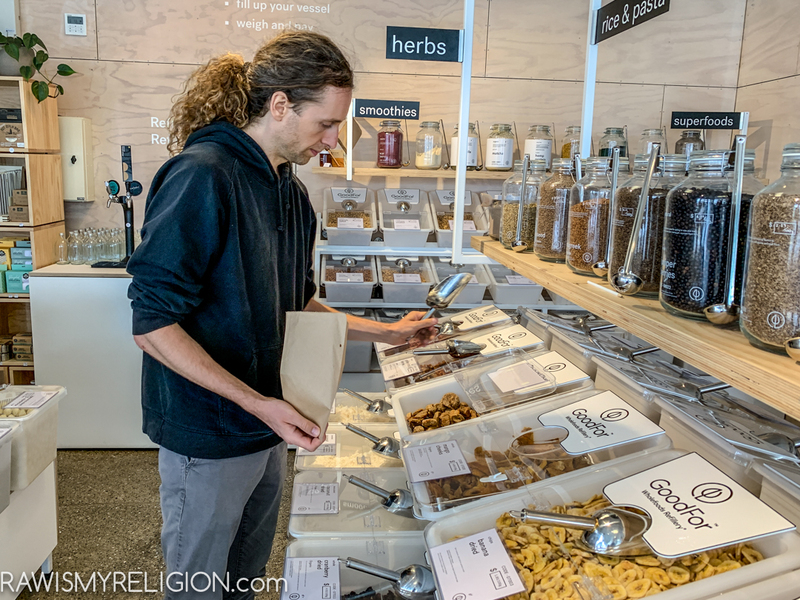 More vegan milks and cheeses. 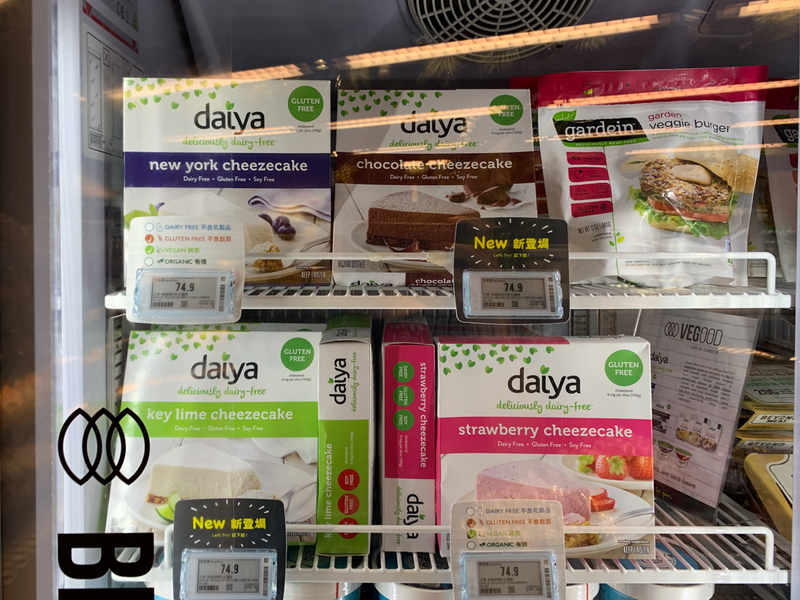 Deja cheese and yogurt. 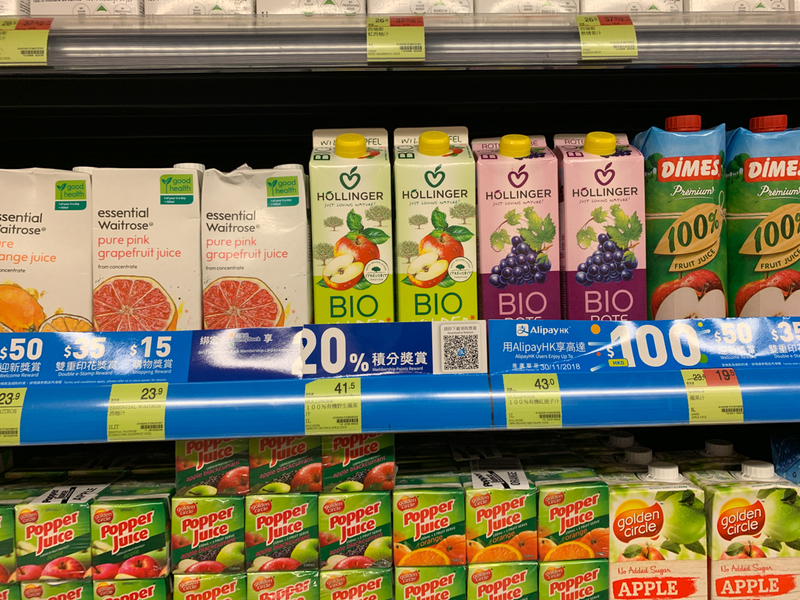 More plant milks and juices. 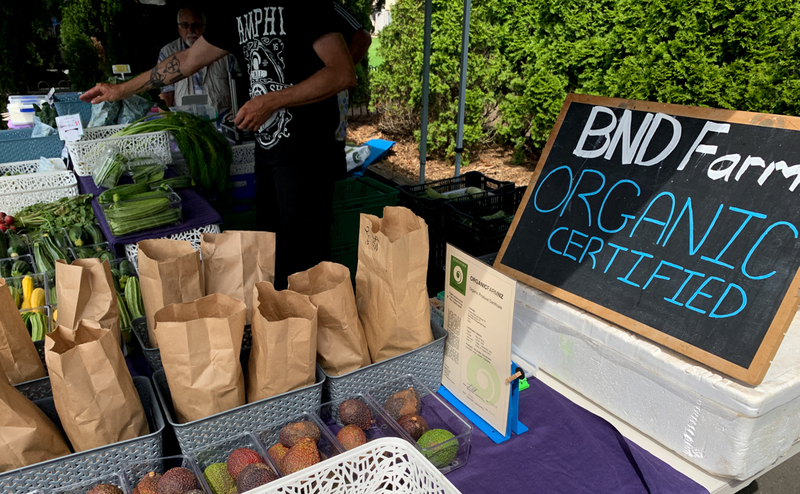 Organic Brottrunk. 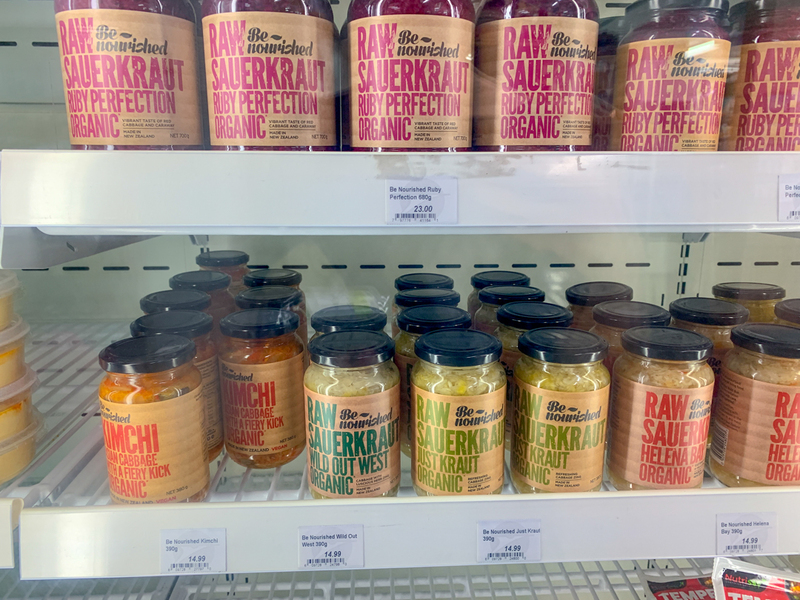 A salty and sugar free German verison of Kombucha. 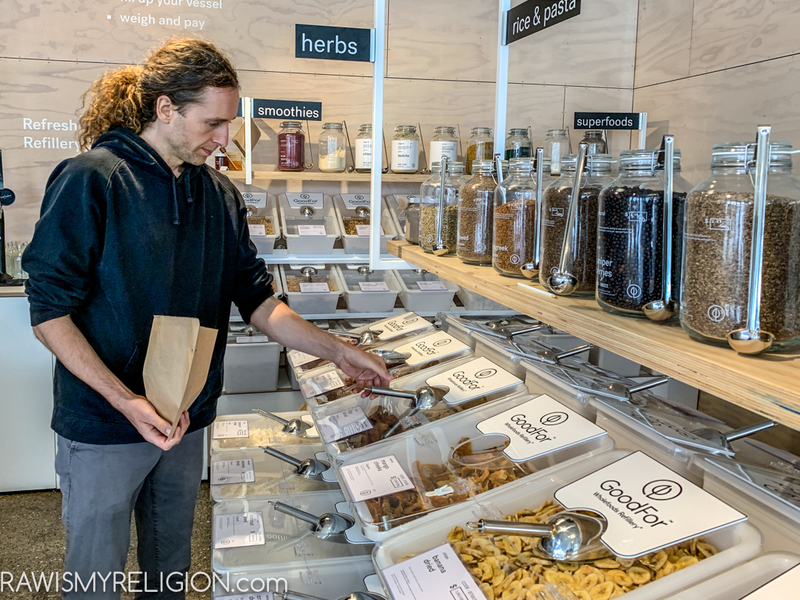 Kombucha Bar. 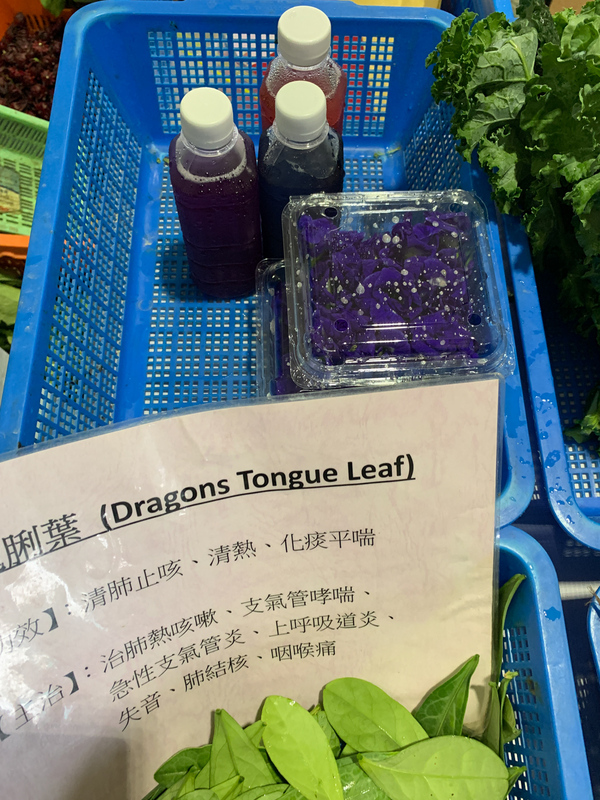 Never tried those. 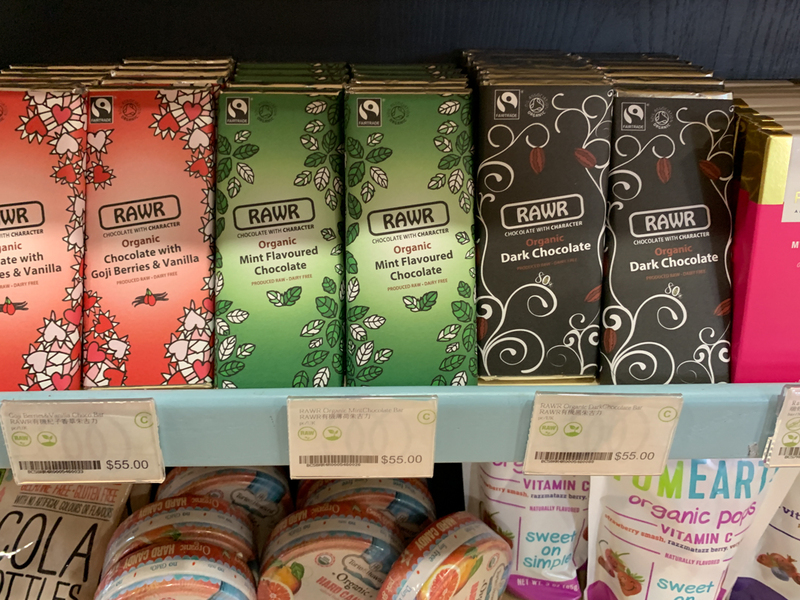 Raw Chocolate. 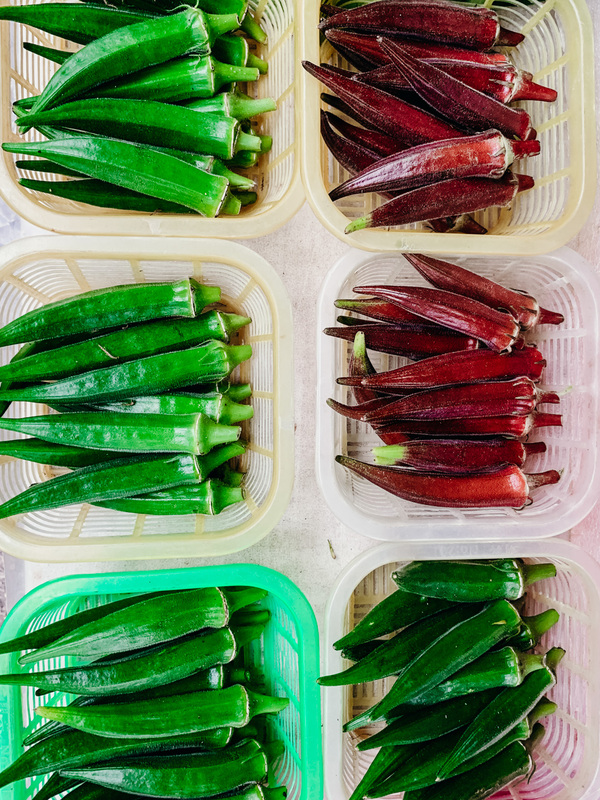 Out of those, I like the green one the most. 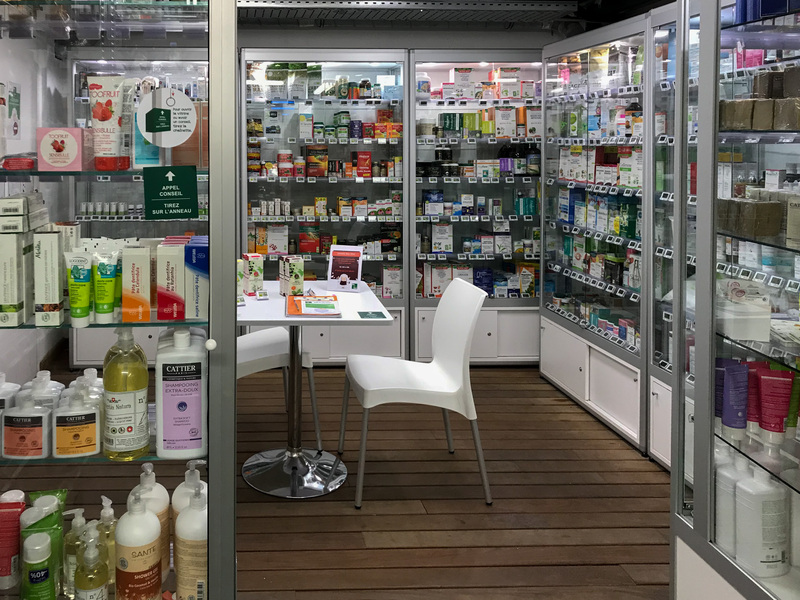 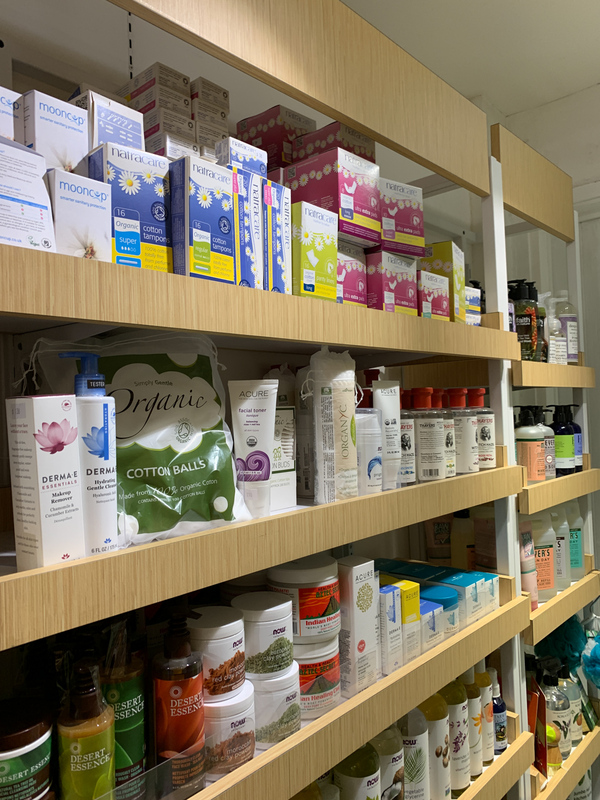 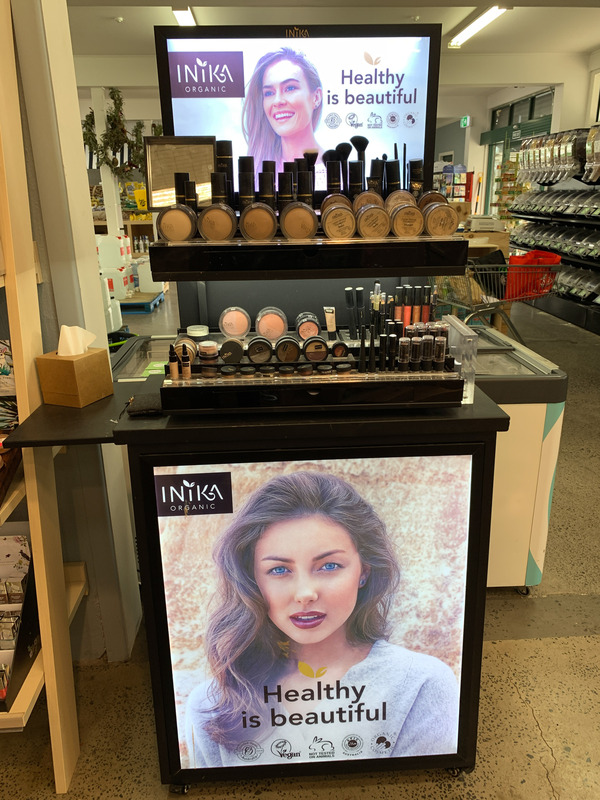 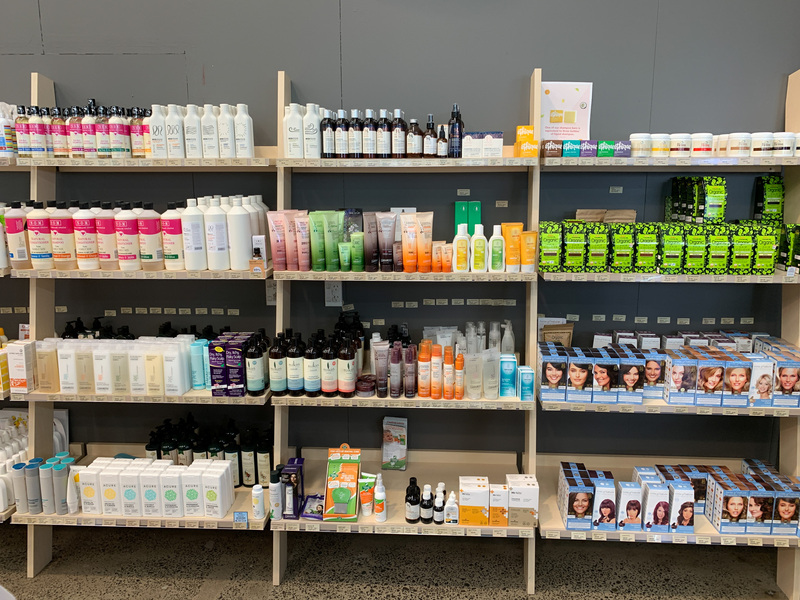 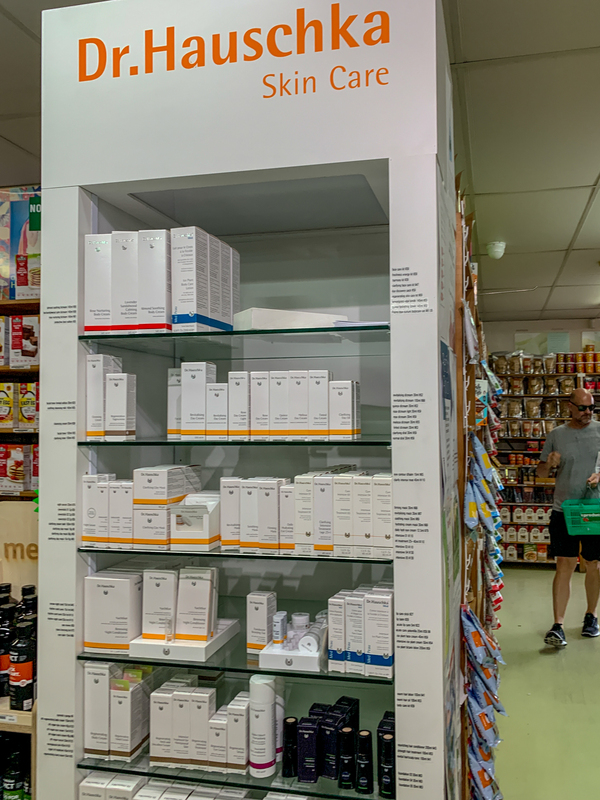 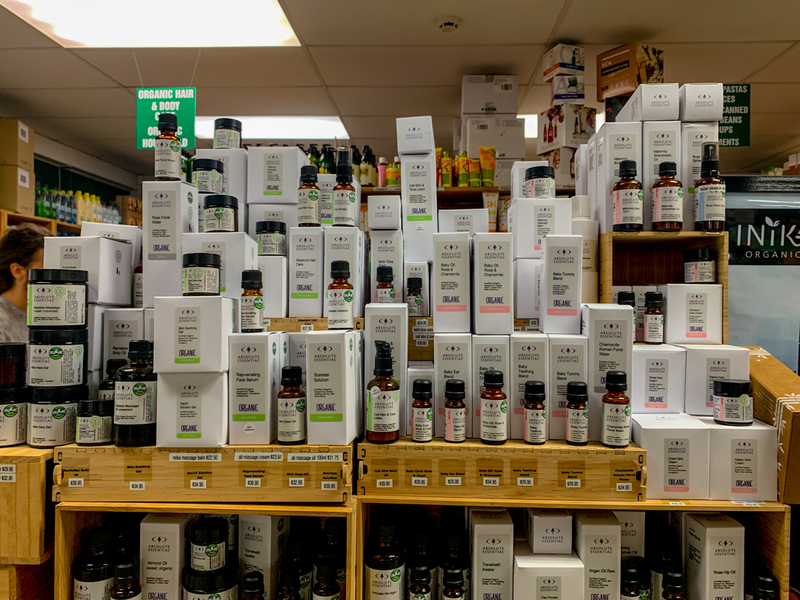 Natural beauty products, Dr. Hauschka (most products are non-vegan though) and many other brands. 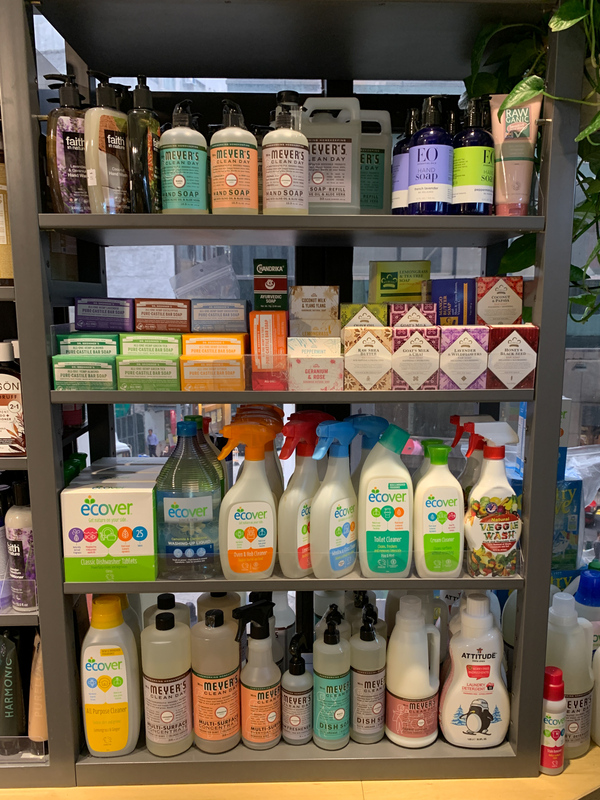 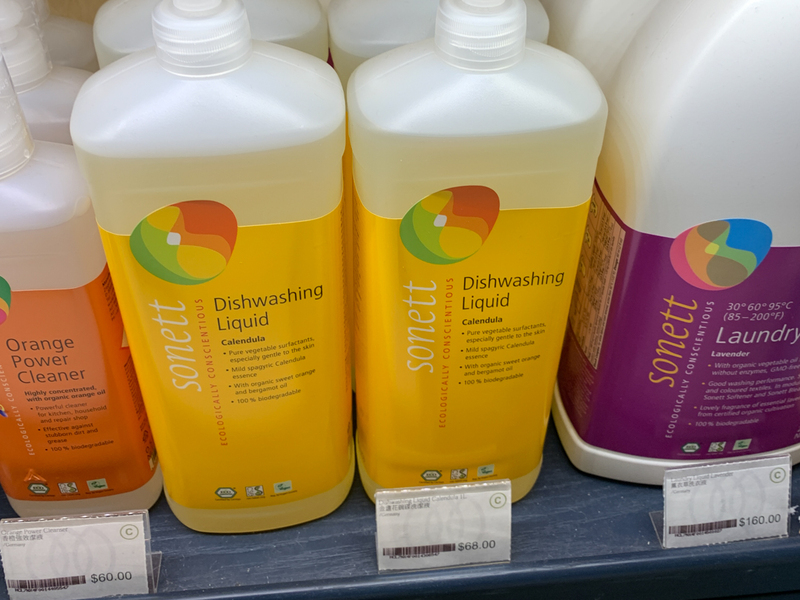 Natural vegan cleaning products, detergent and dishsoap. 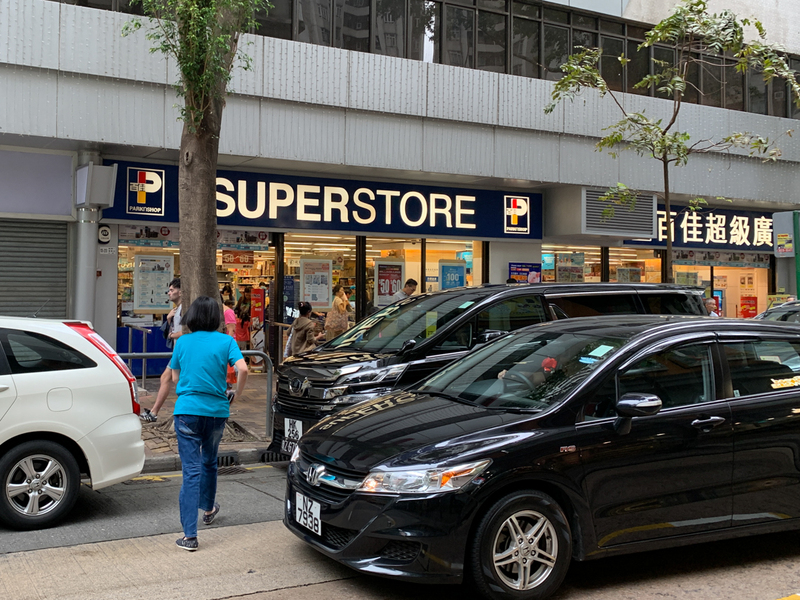 How to find the store. 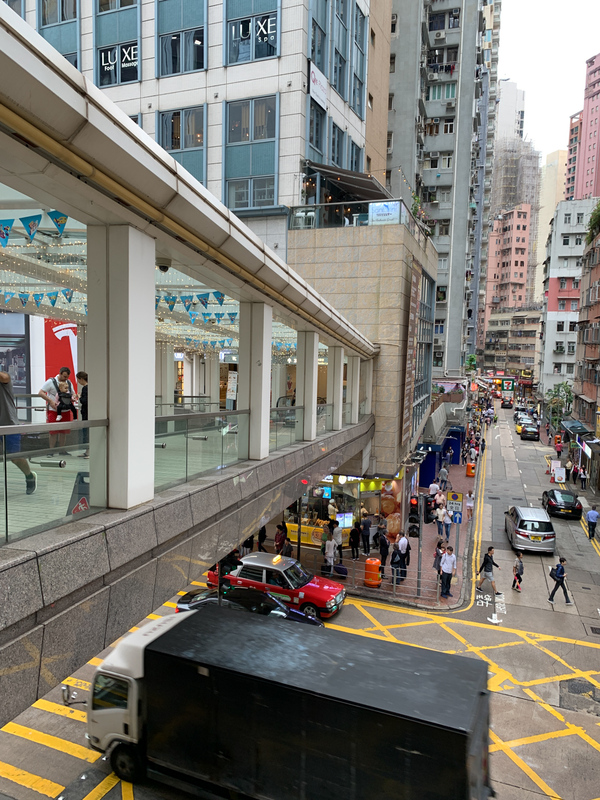 It’s a little hidden on the first floor above the Tesla store. 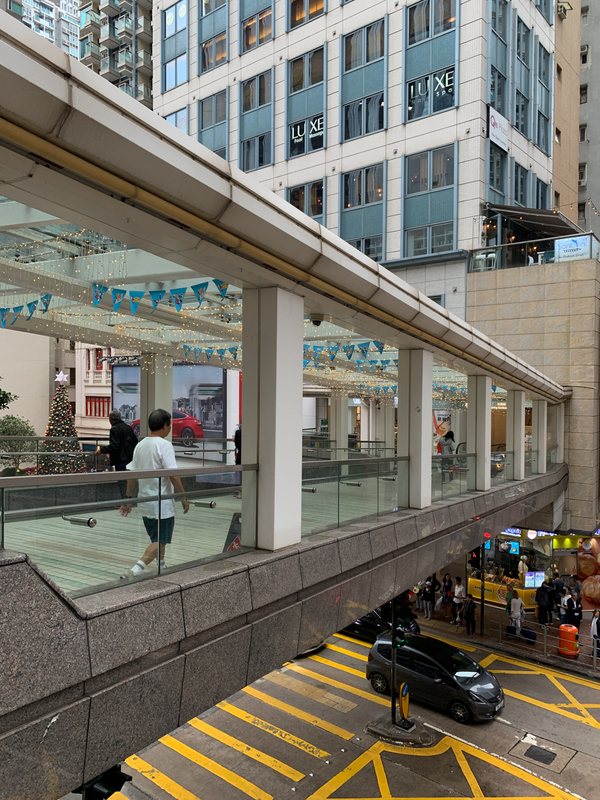 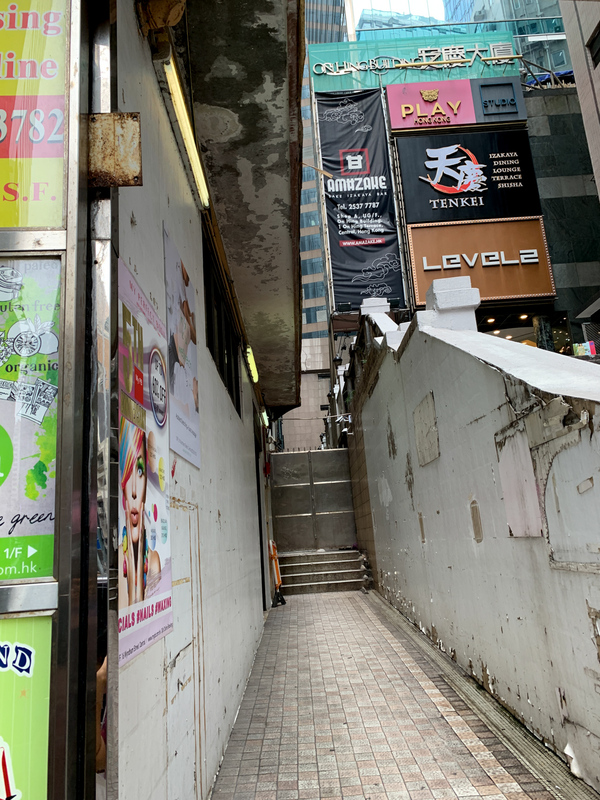 It’s the easiest to go up to the first floor in the building across the street (there is a Muji on the right in this one) and to cross the bridge in the first floor. 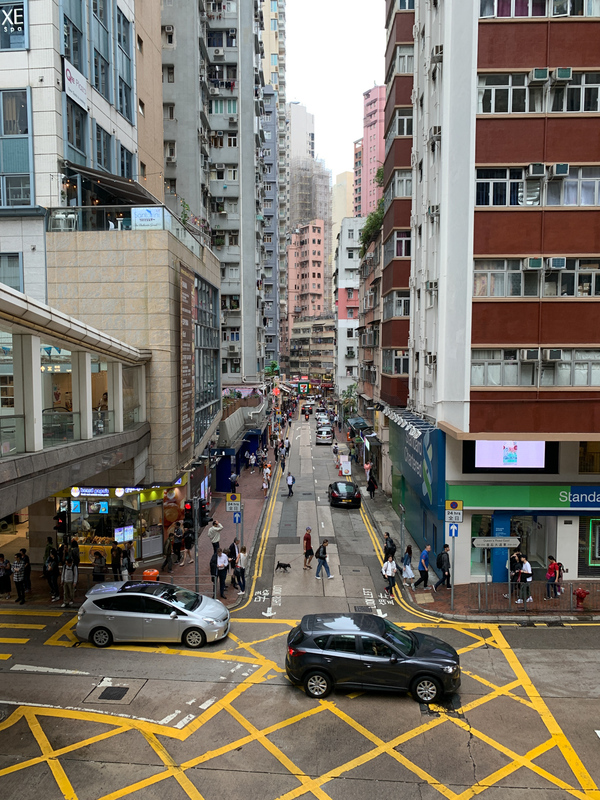 The bridge is on the left around the corner. 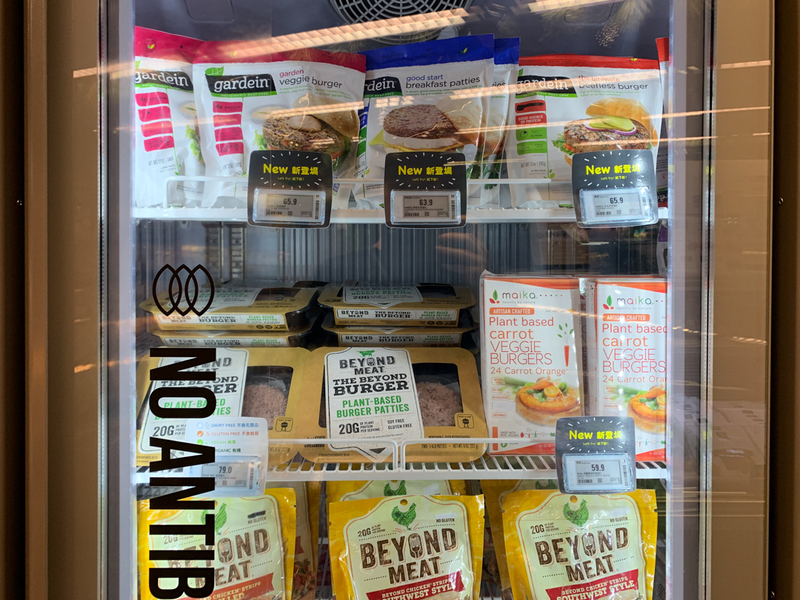 I love how they promote the vegan burger “beyond meat burger”. 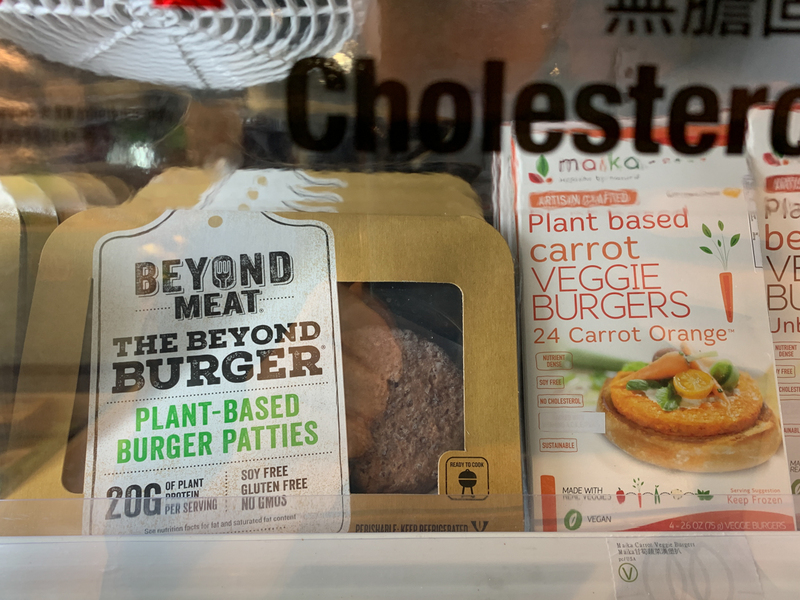 Even I don’t eat processed cooked foods myself, I would definitely recommend to any meat eater in my life to try this burger. 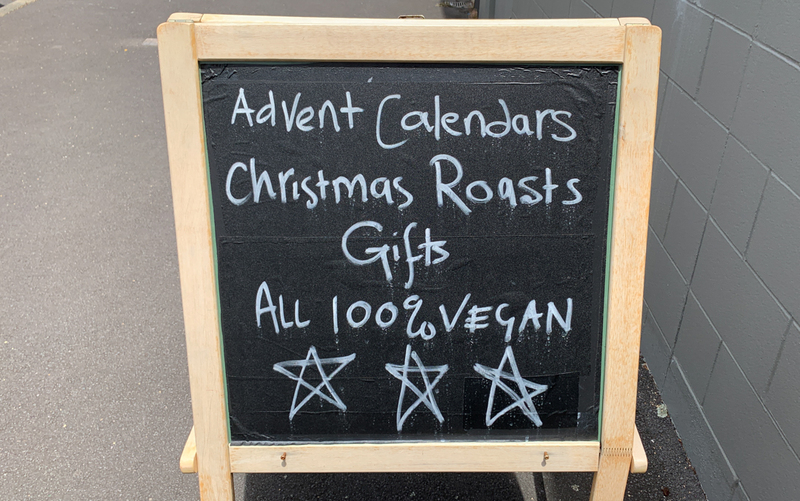 Maybe the most exciting first. 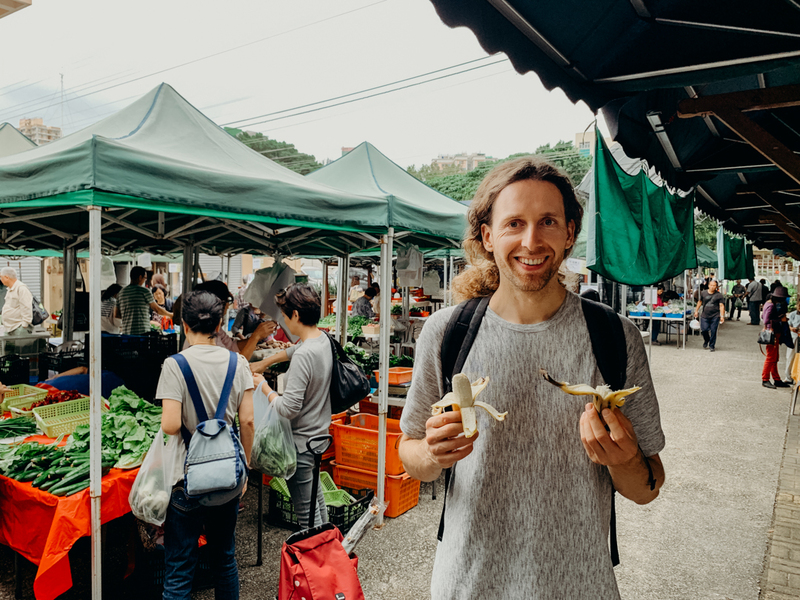 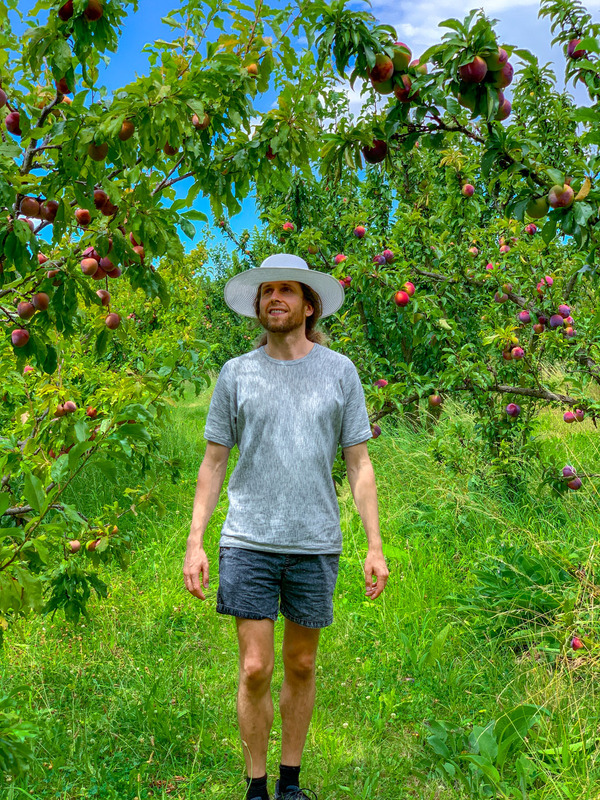 After couple of days here i Hong Kong I get actually really excited over apples and tomatoes. 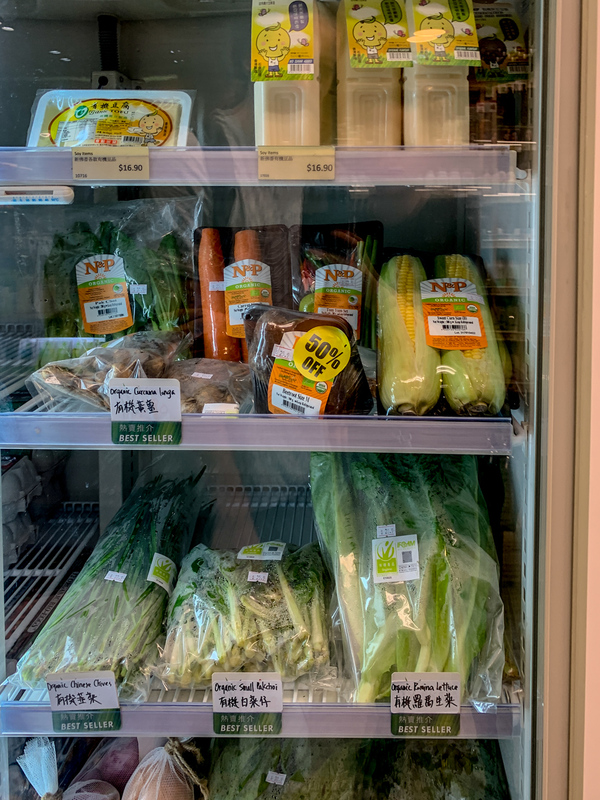 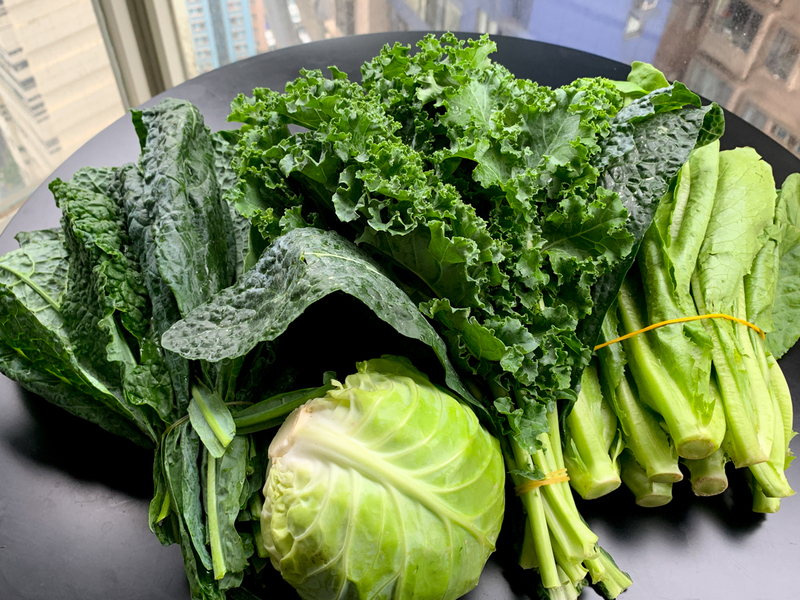 In the fridge, we discovered organic greens, organic tomatoes and organic cabbage. 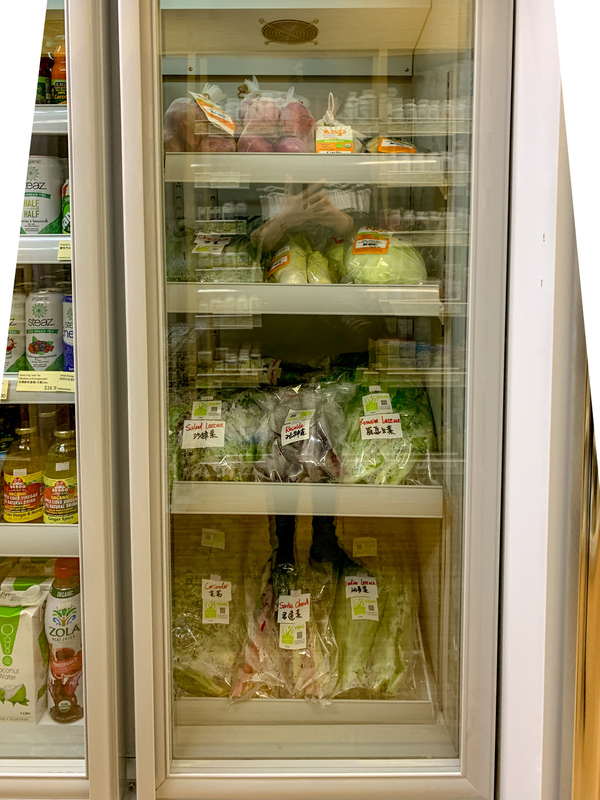 There is another fridge behind the apple isle. 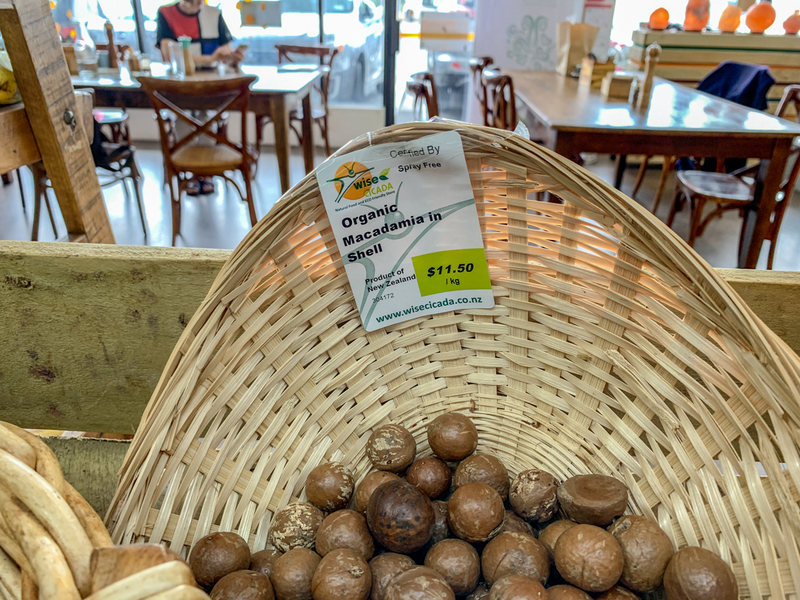 With organic mushrooms. 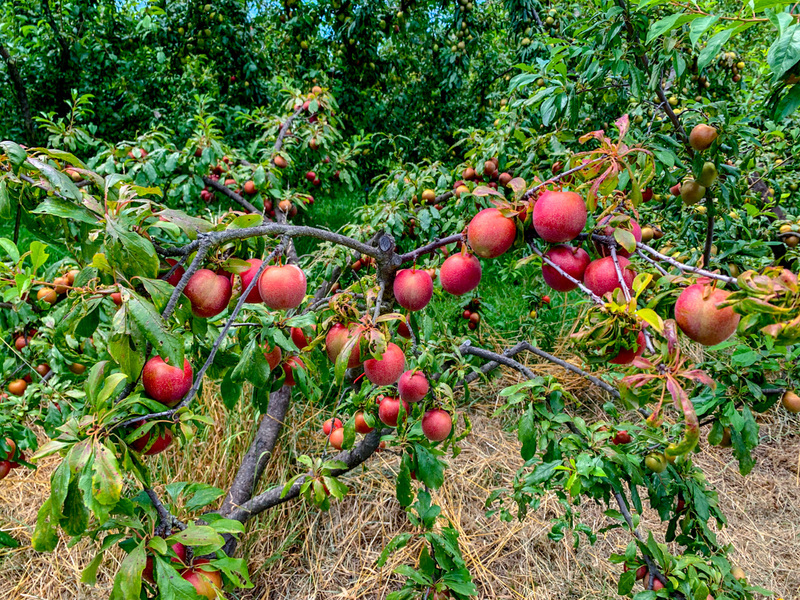 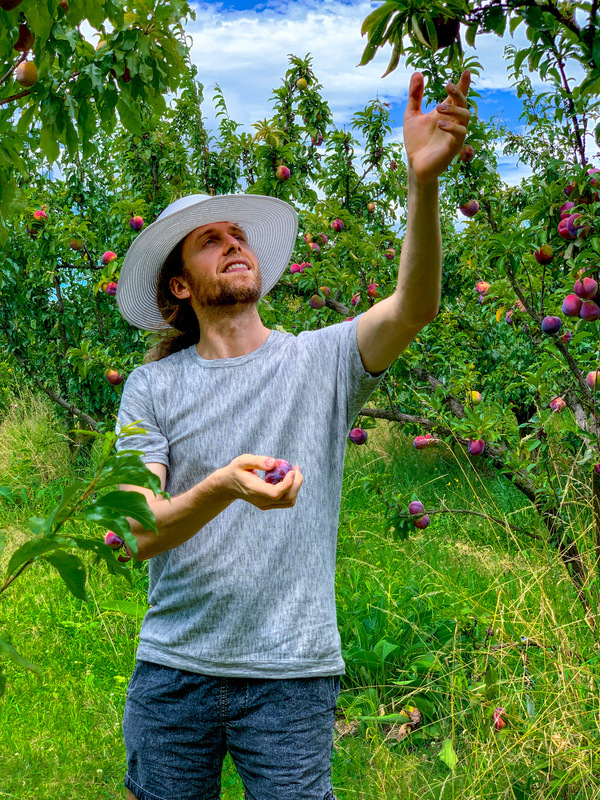 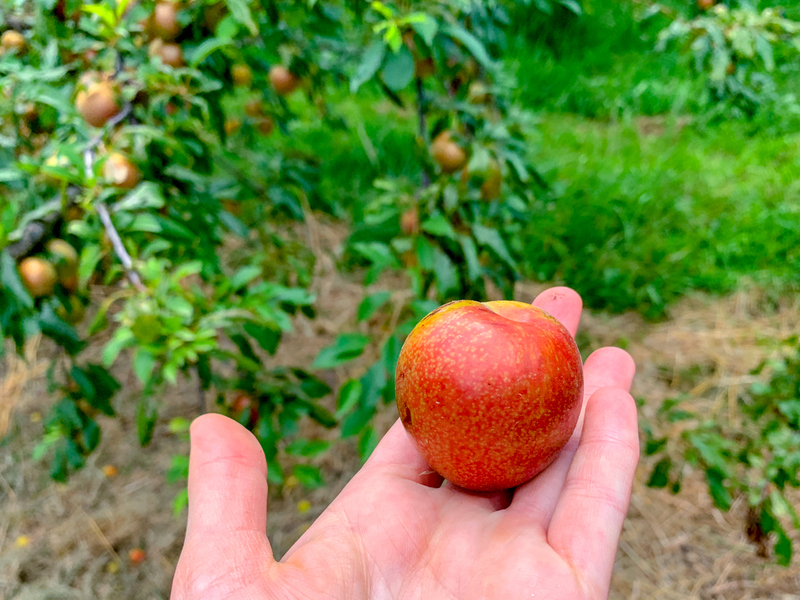 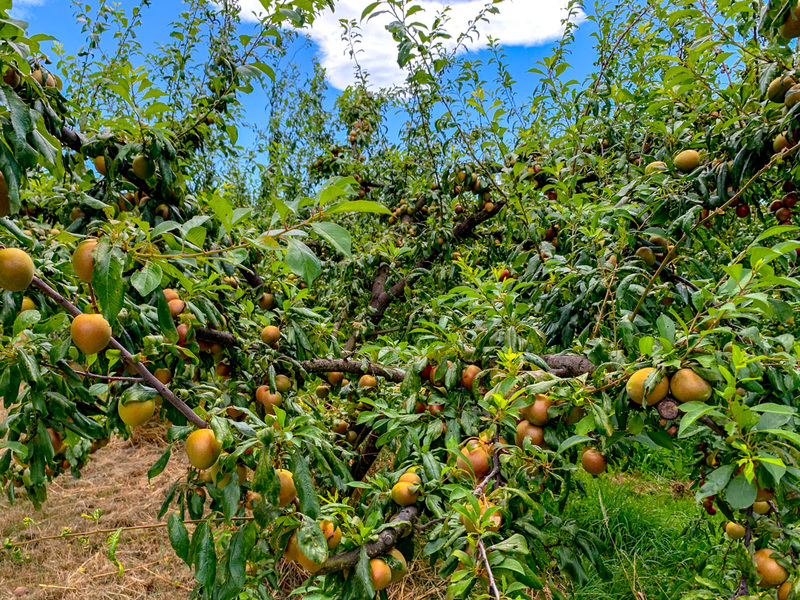 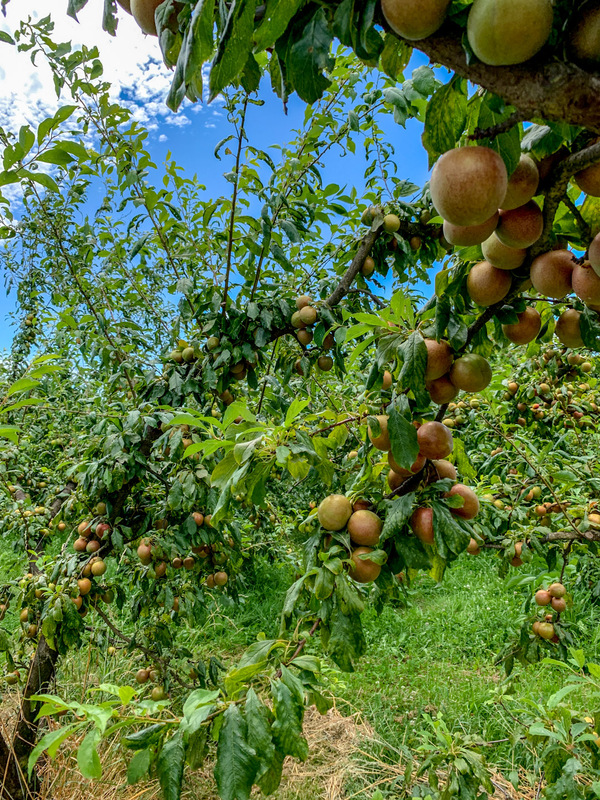 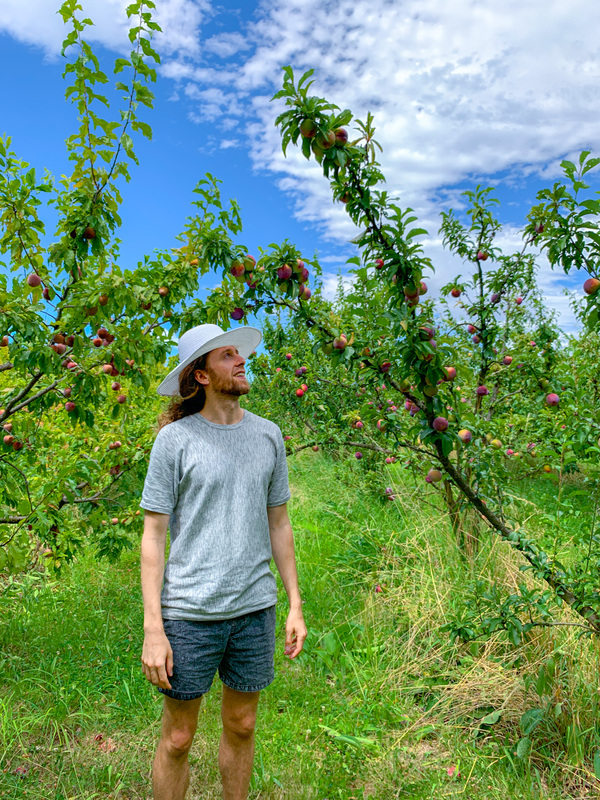 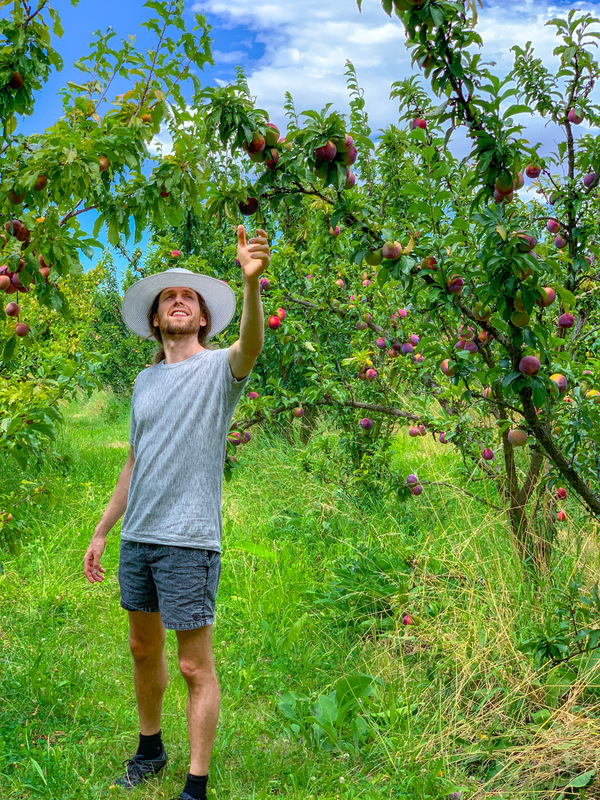 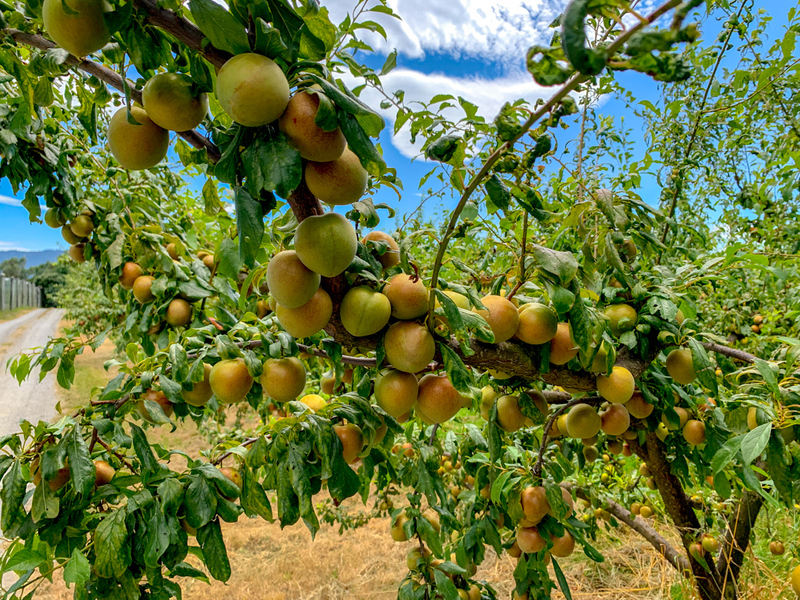 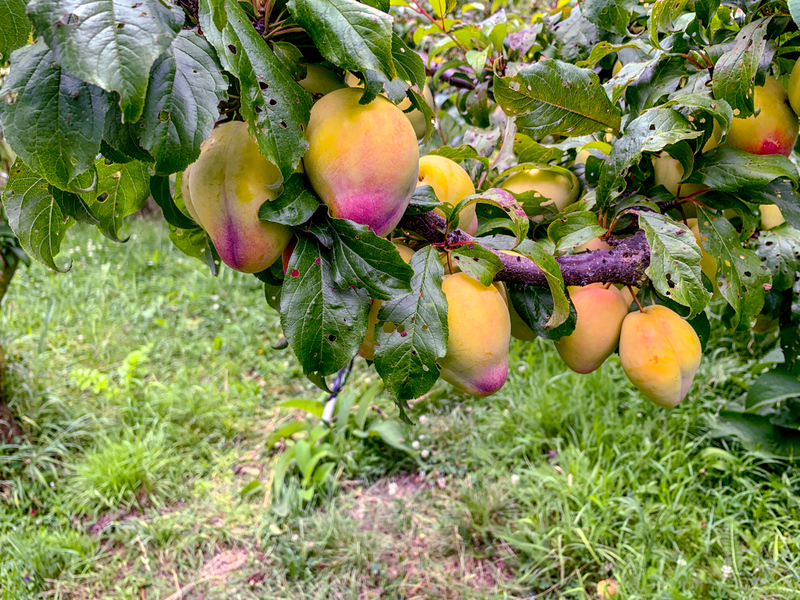 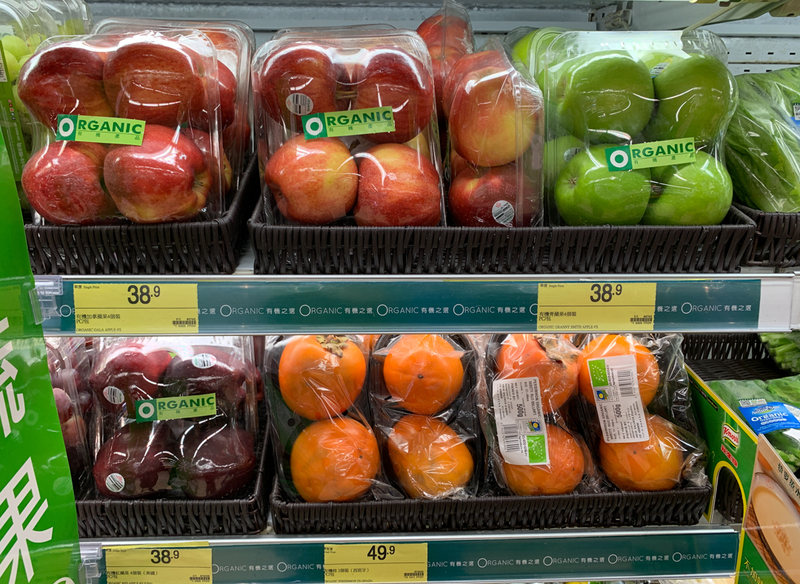 organic apples and organic persimmons. 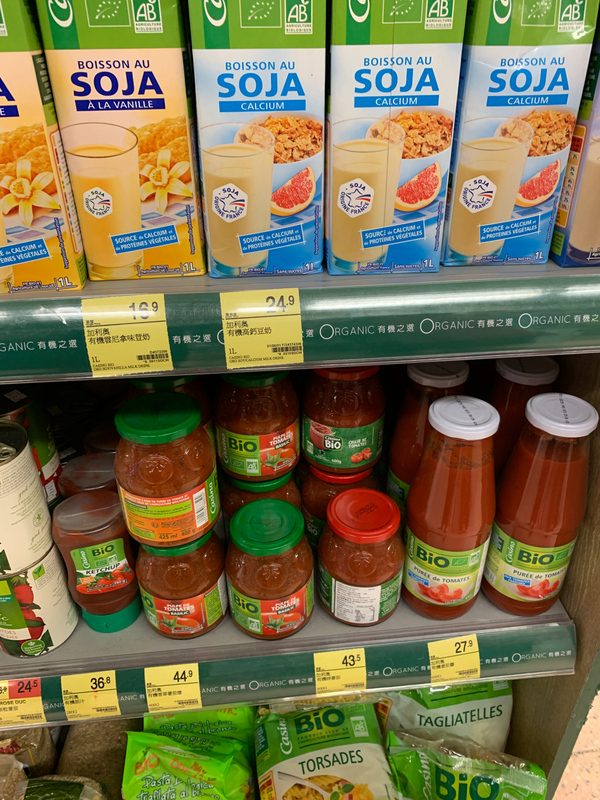 Can you spot the organic grapefruit and organic tenderness? 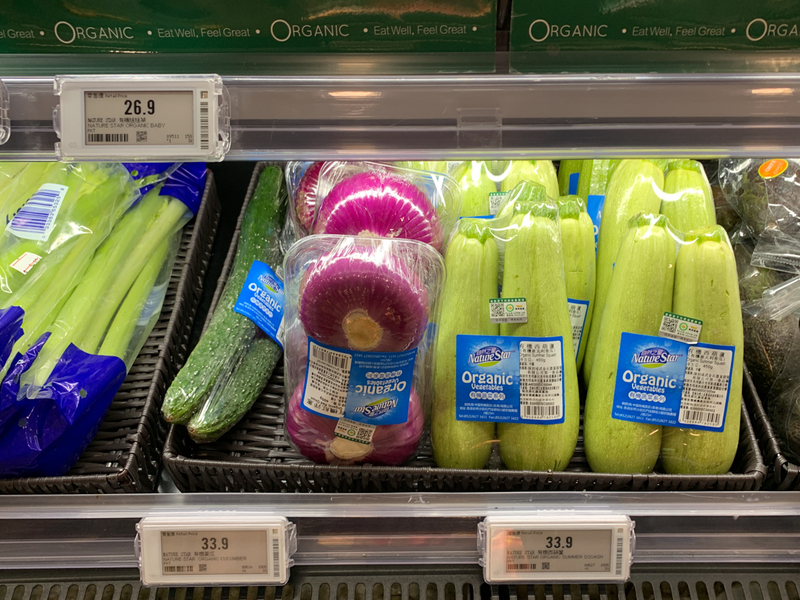 Also organic celery and more organic tomatoes. 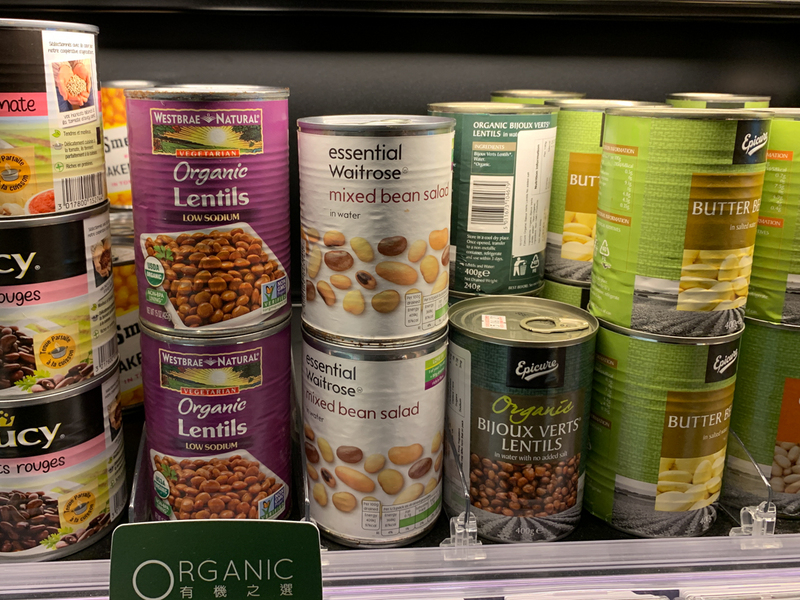 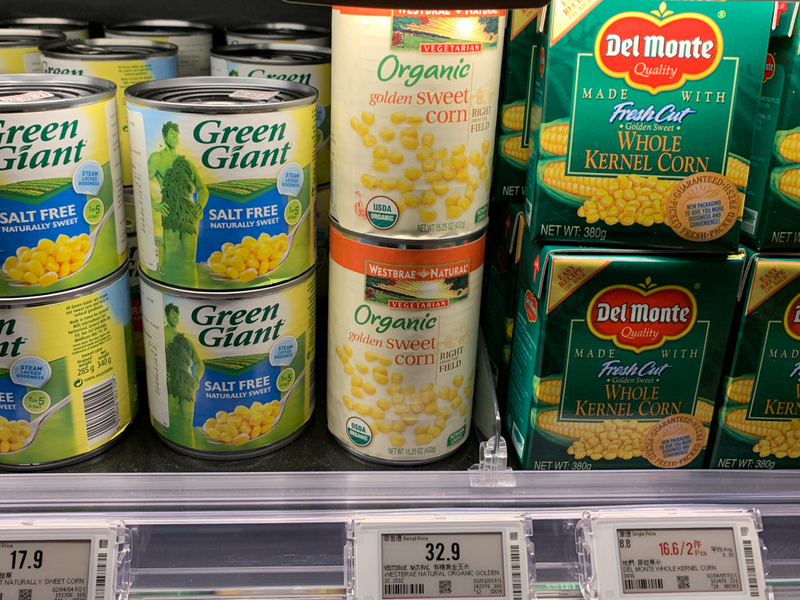 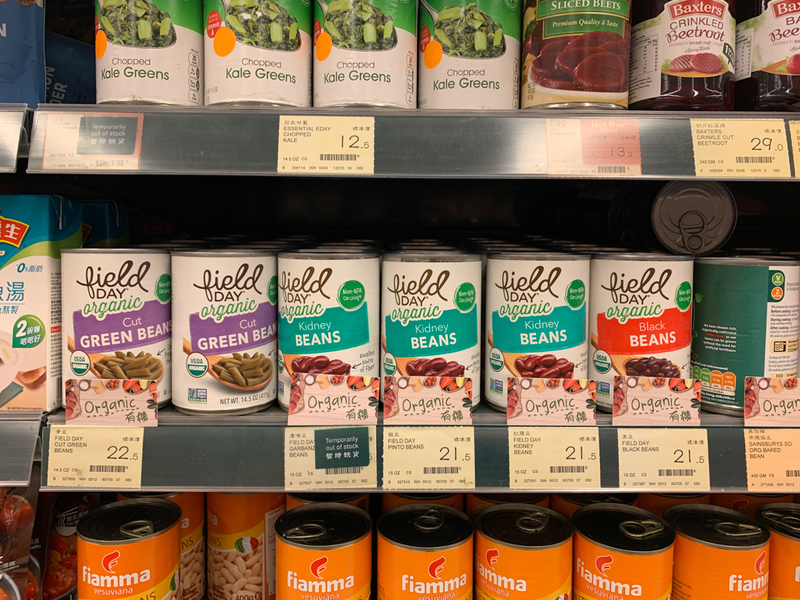 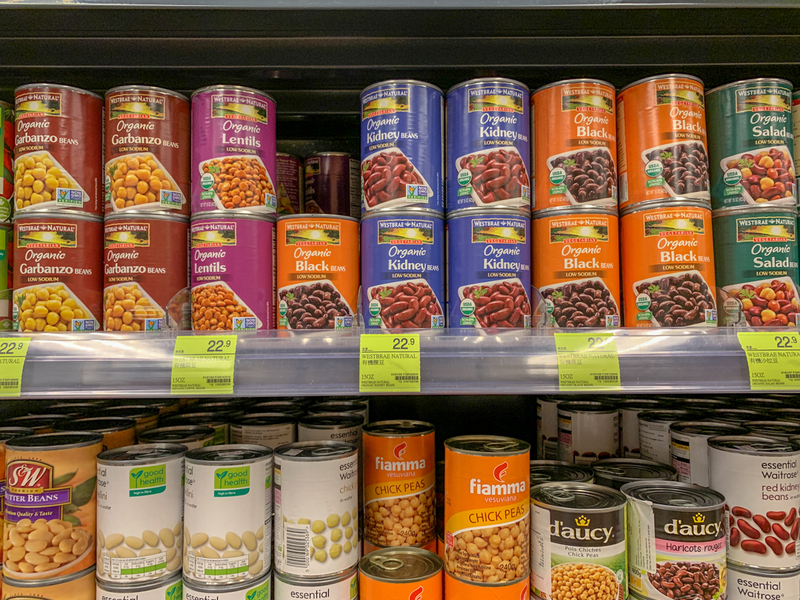 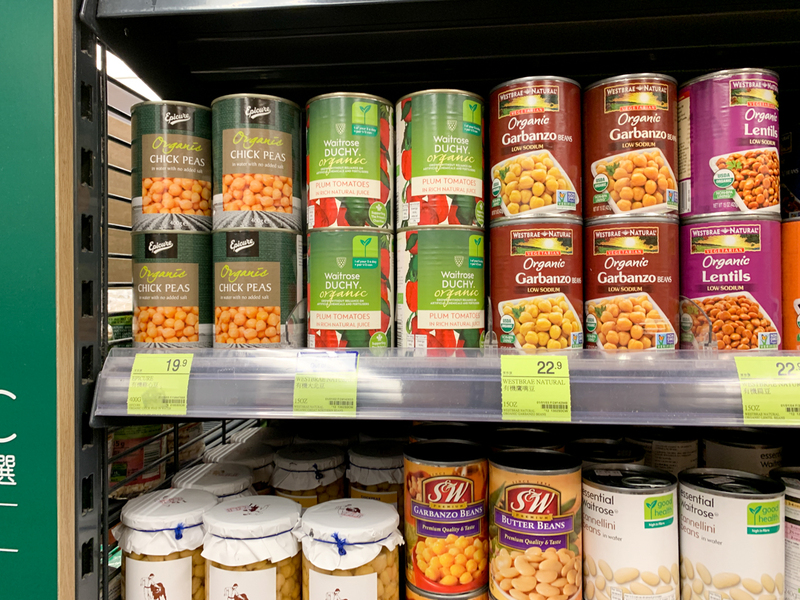 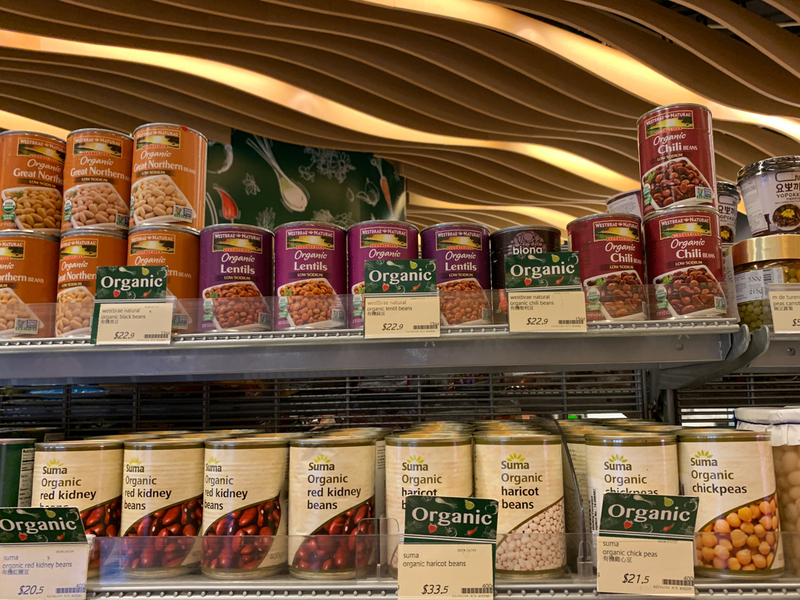 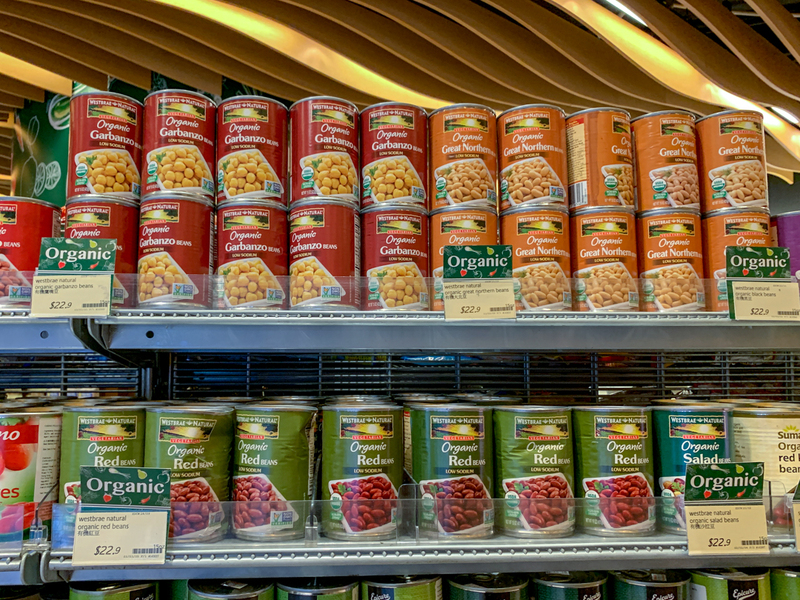 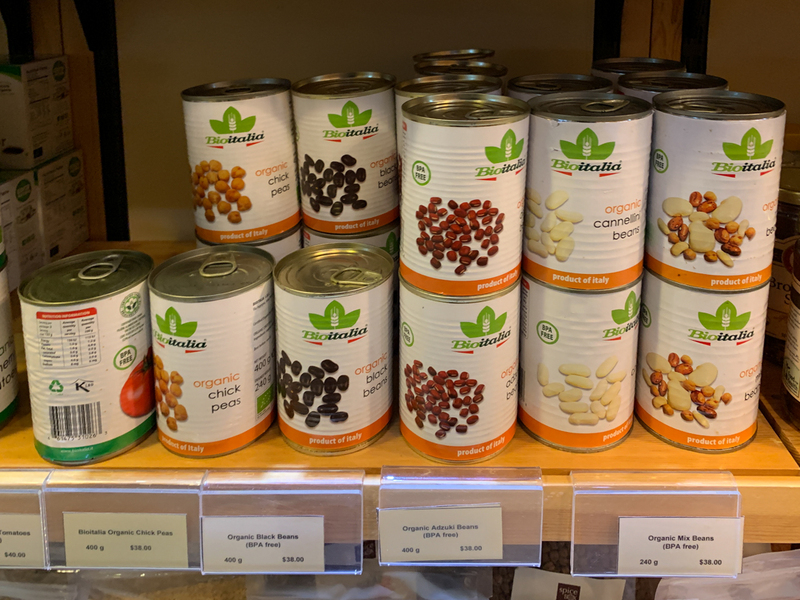 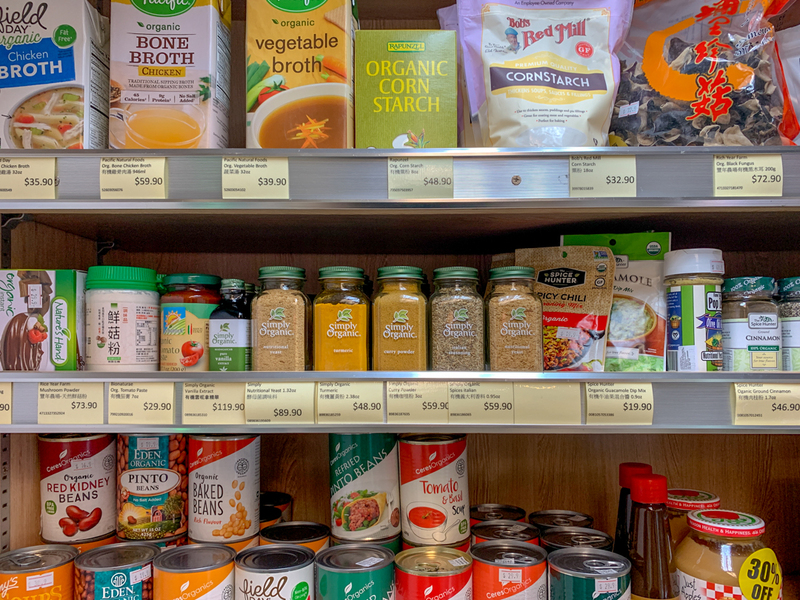 The canned stuff: organic corn, organic apple juice, organic chickpeas and beans. 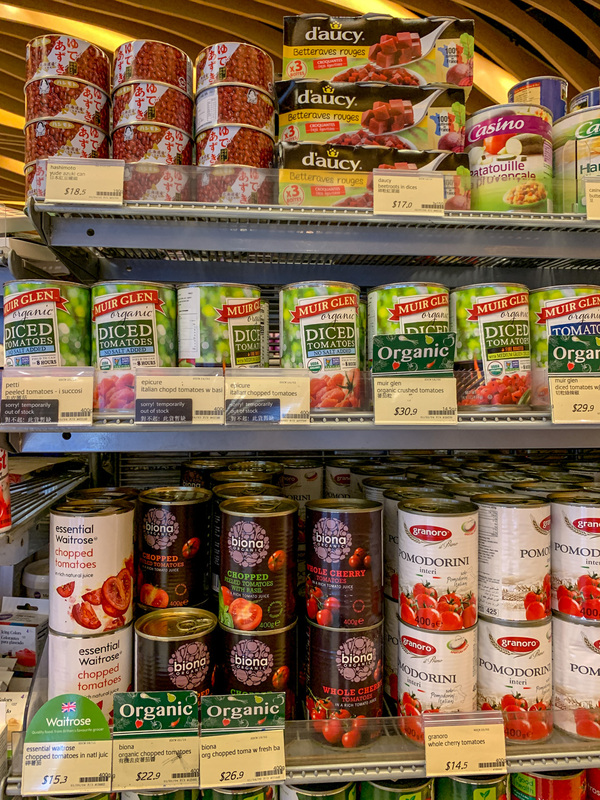 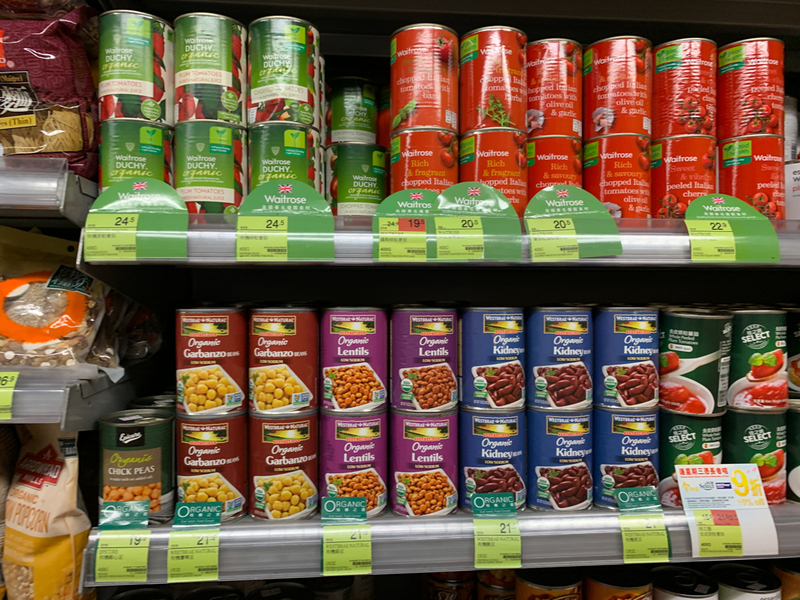 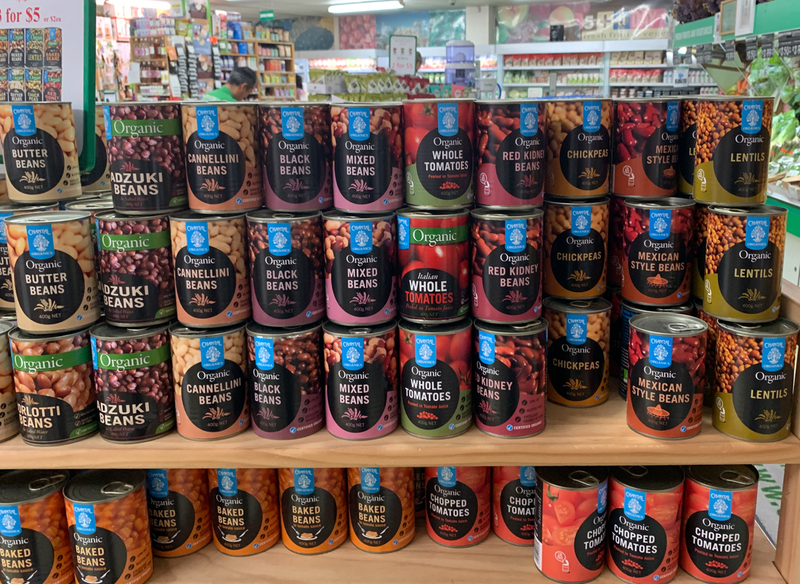 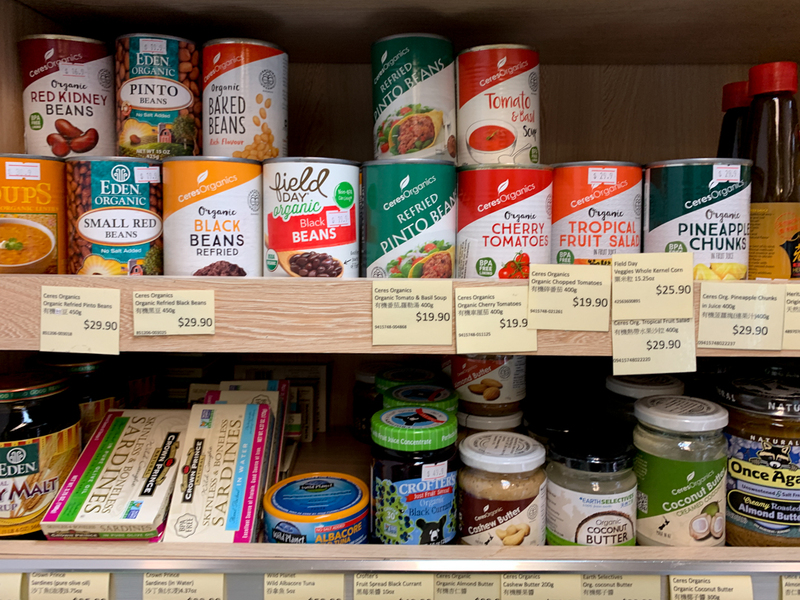 Canned organic tomatoes and more beans. 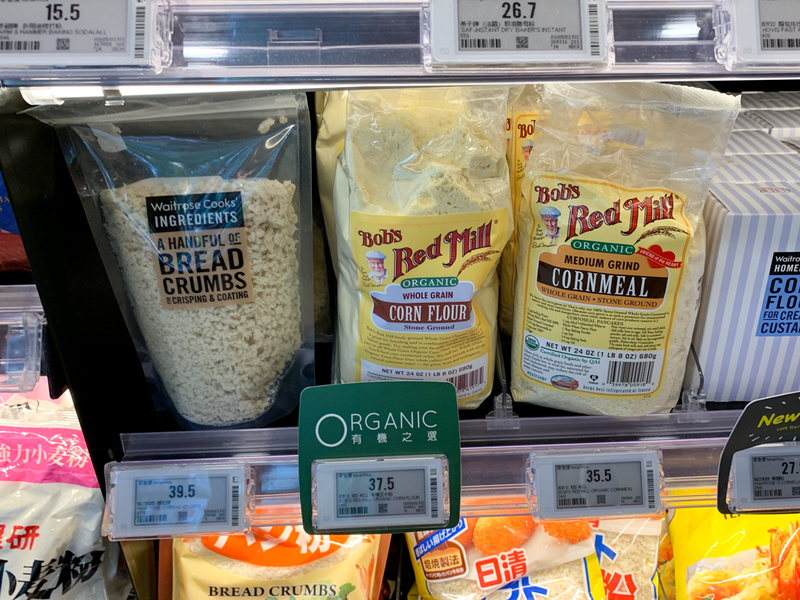 Organic flax and cous cous. 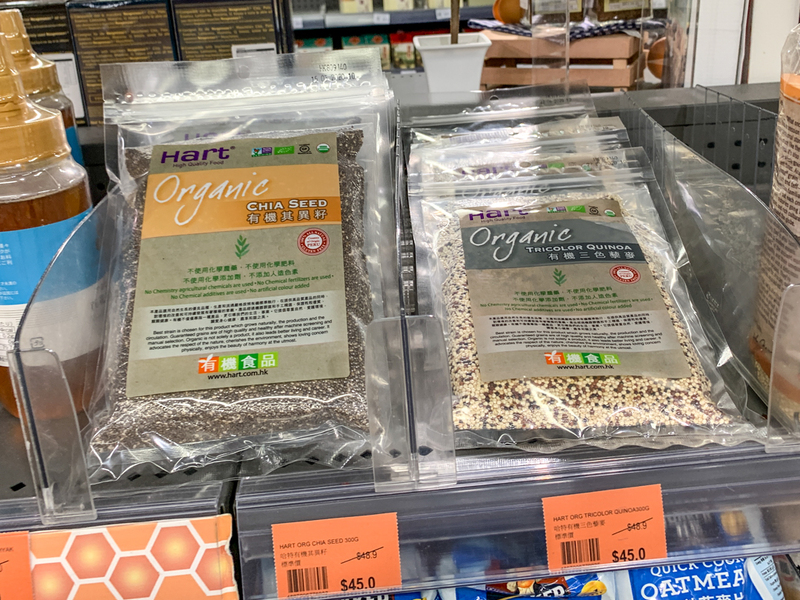 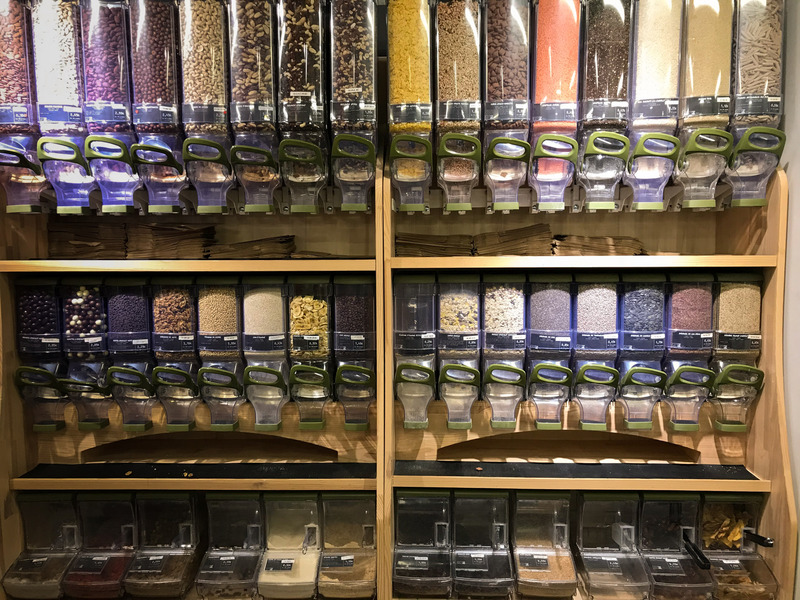 More organic seeds, chia, grains and organic rice. 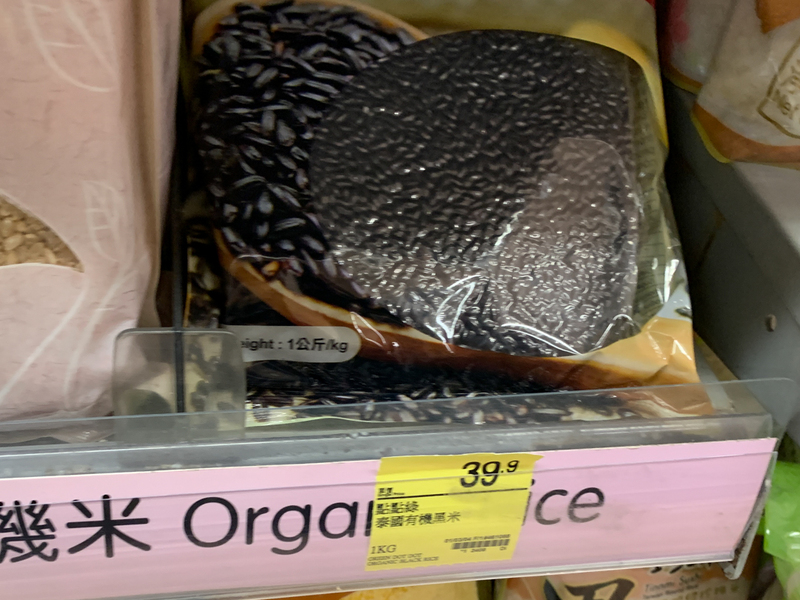 I think we had this kind of black organic rice at a raw vegan restaurant in LA. 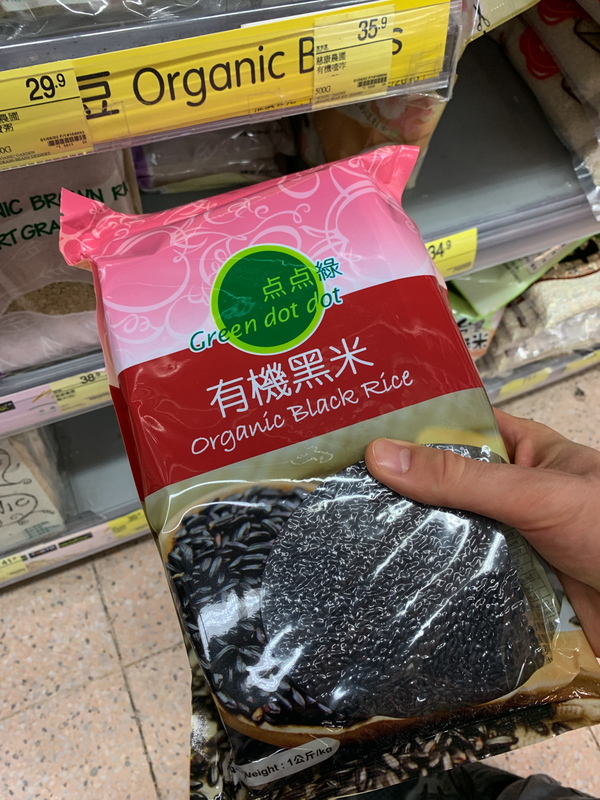 I was soaked and was pretty soft for an uncooked rice. 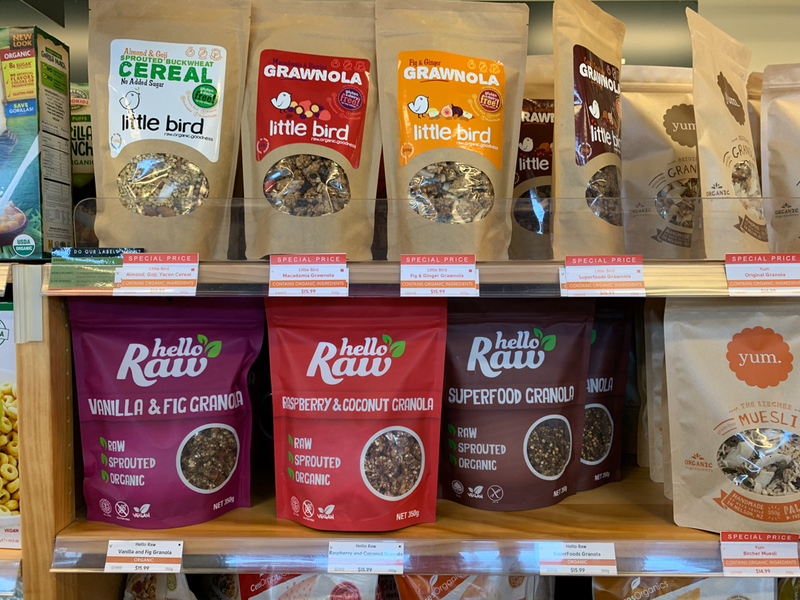 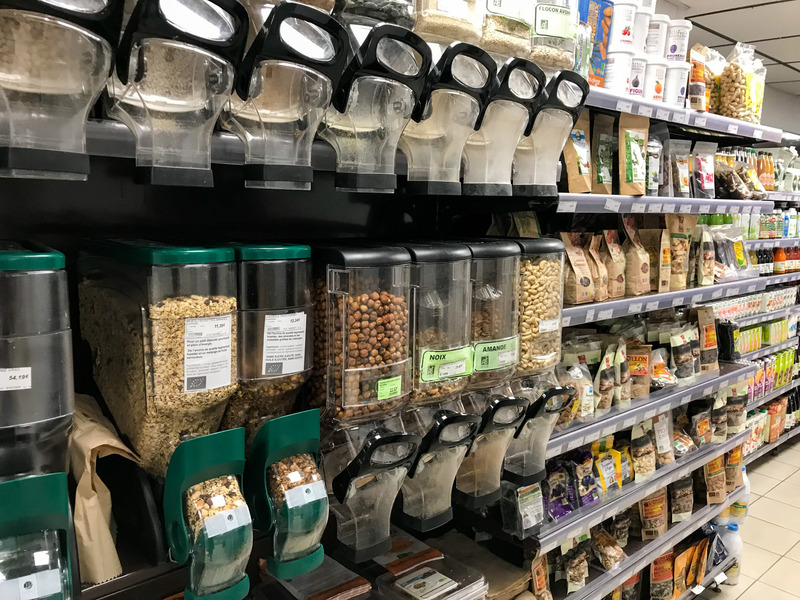 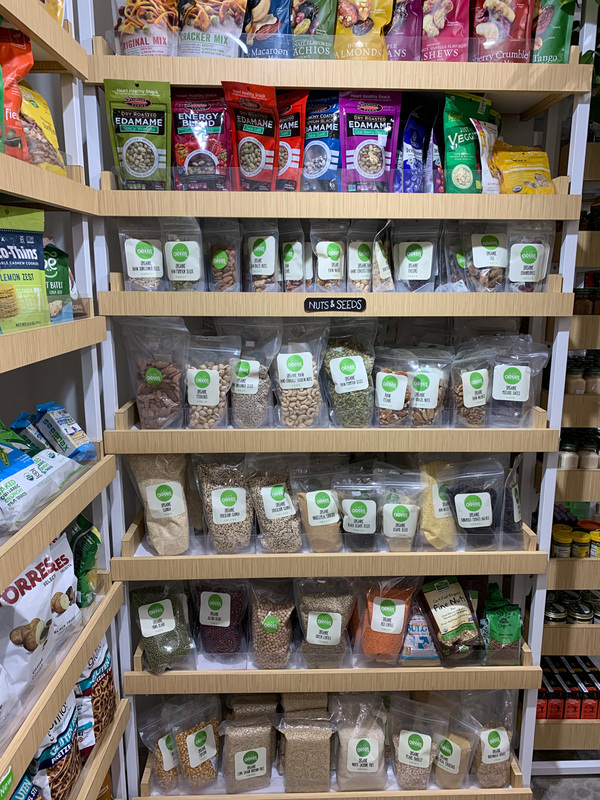 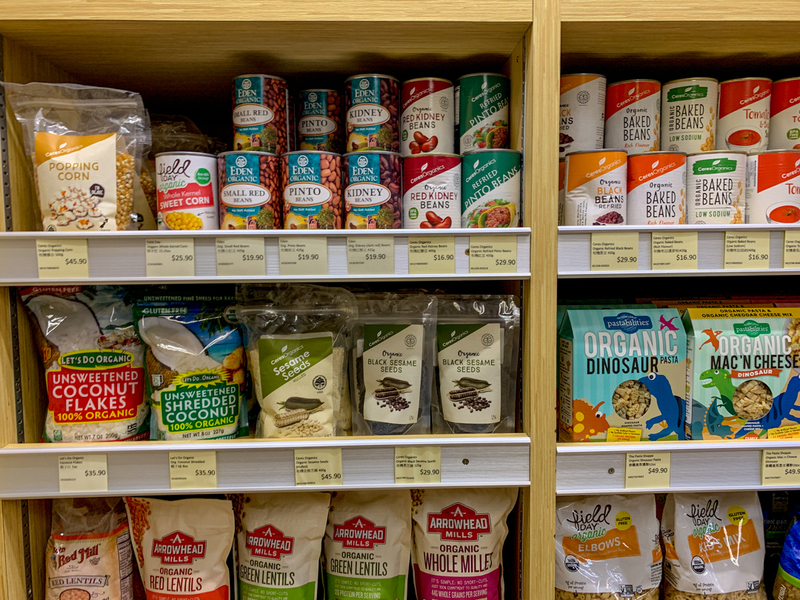 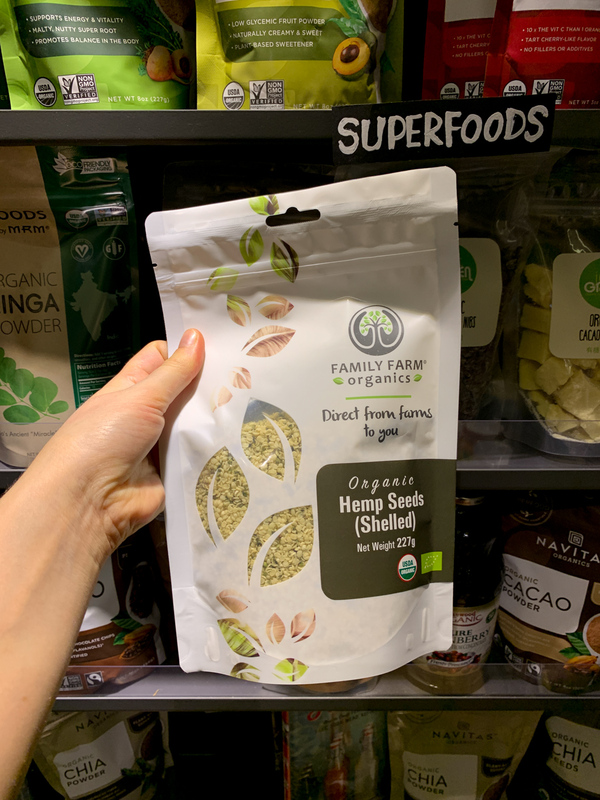 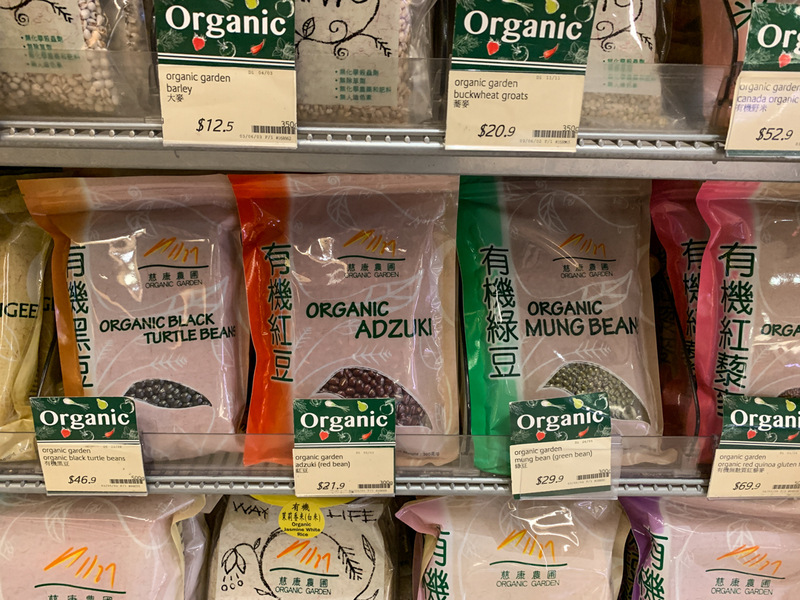 Organic sesame seeds, organic goji, and more organic beans. 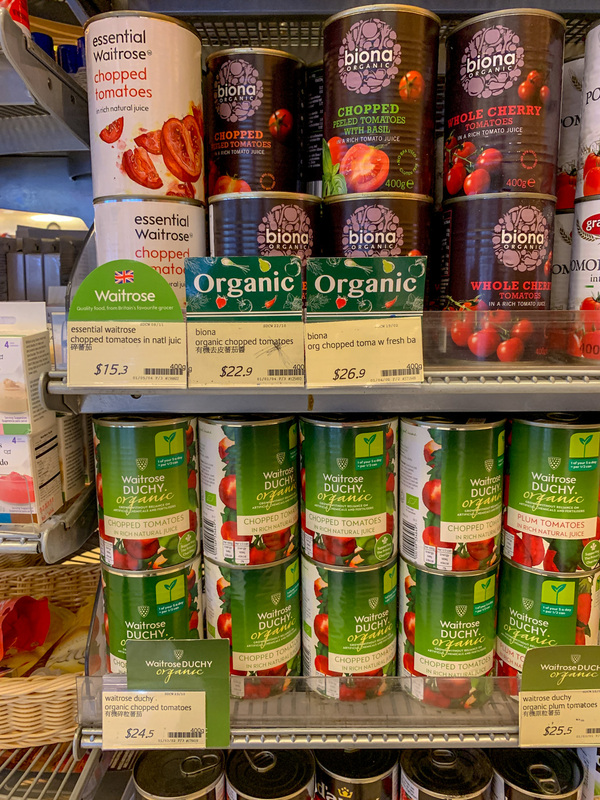 Organic tomatoes in glass jars. 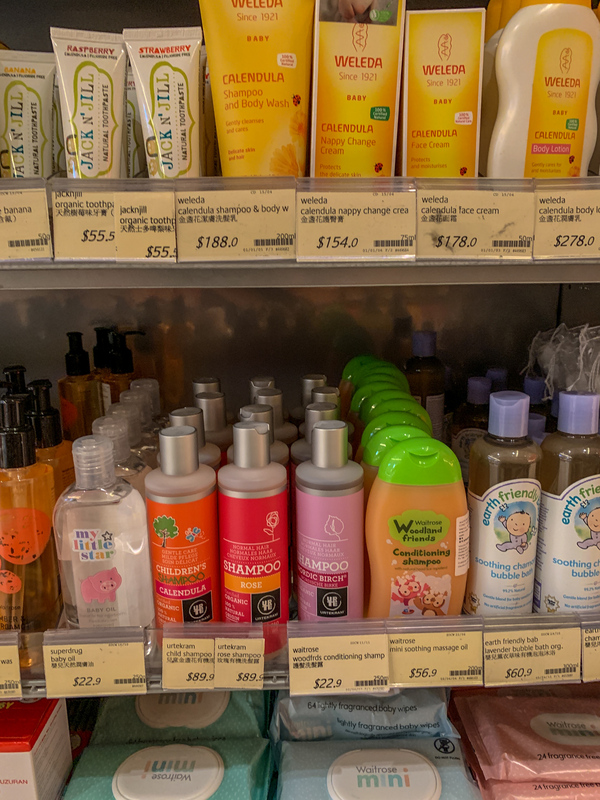 Found one more display with organic products. 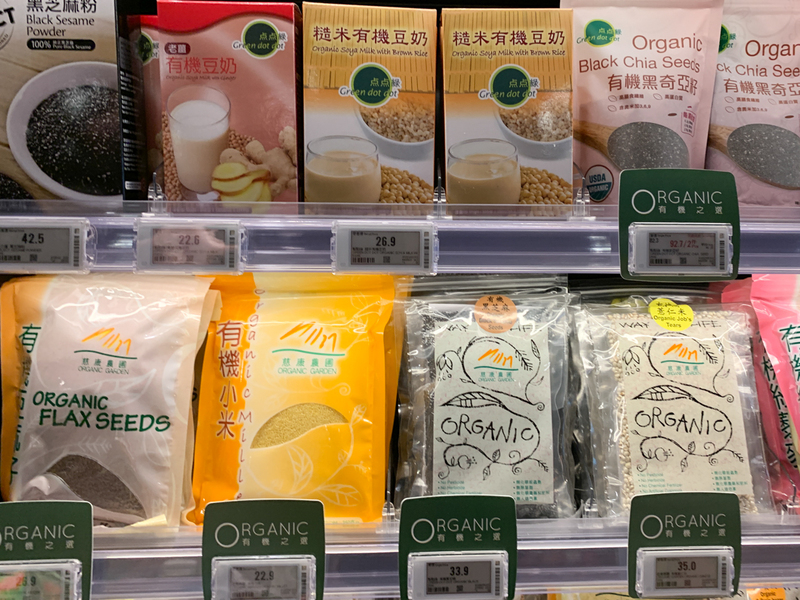 Plant milks, noodles, organic oatmeal. 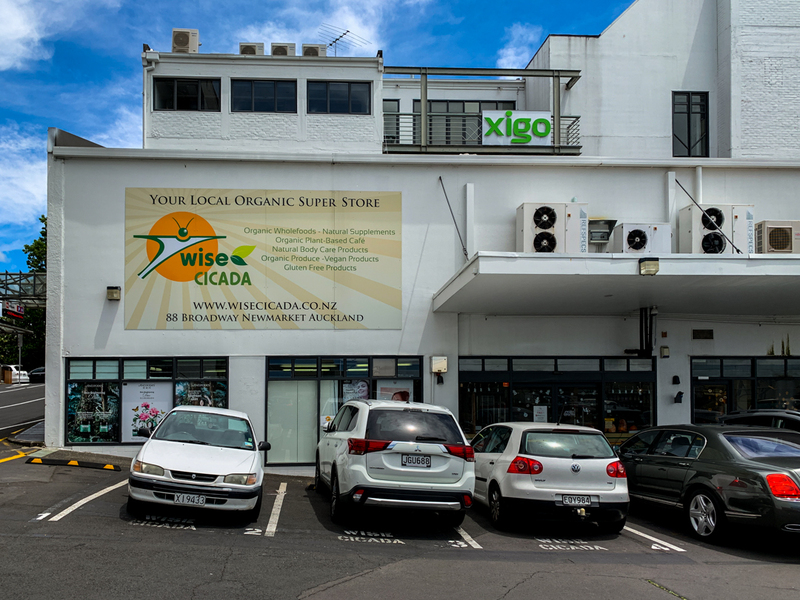 After moving, this one was the closest to our apartment and it had a great variety of organic products. 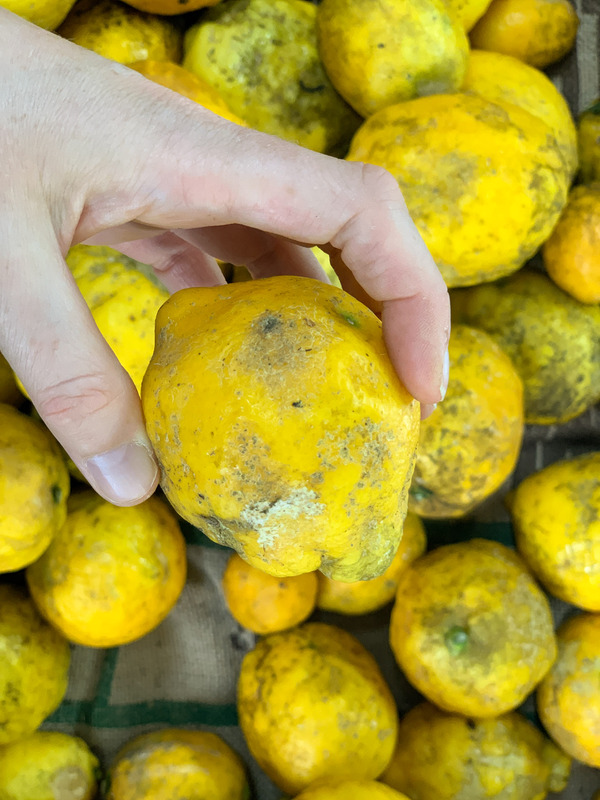 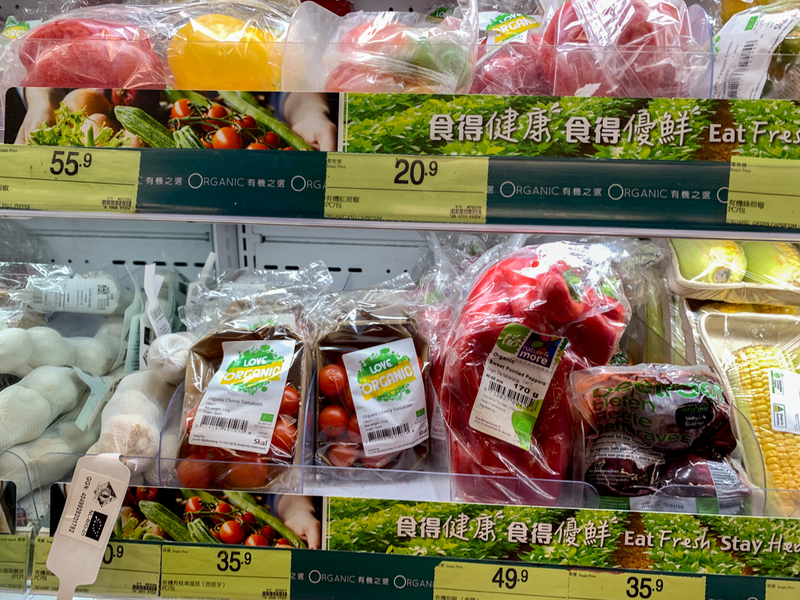 Apparently, people don’t buy organic produce so much here and many items were on sale,but mouldy, rotten. 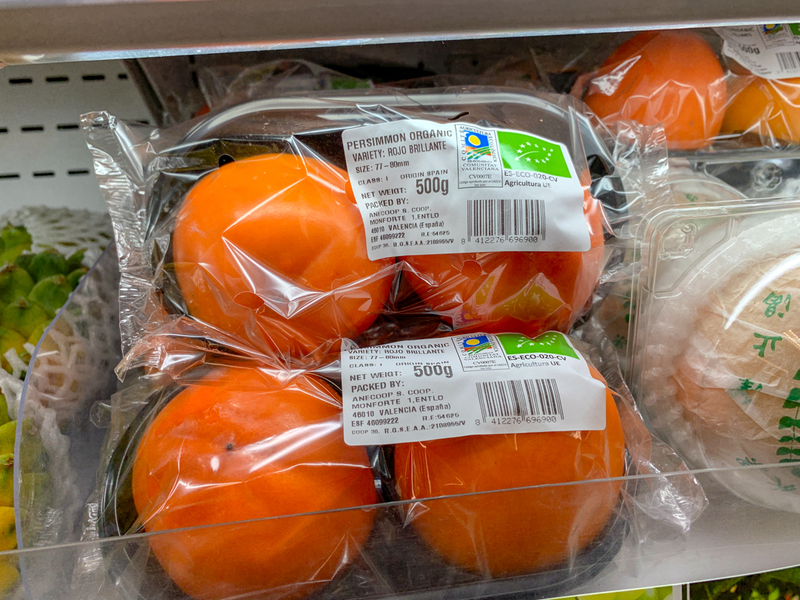 The best fruit to buy on sale is persimmon and bananas, they look rotten to people before they actually go bad. 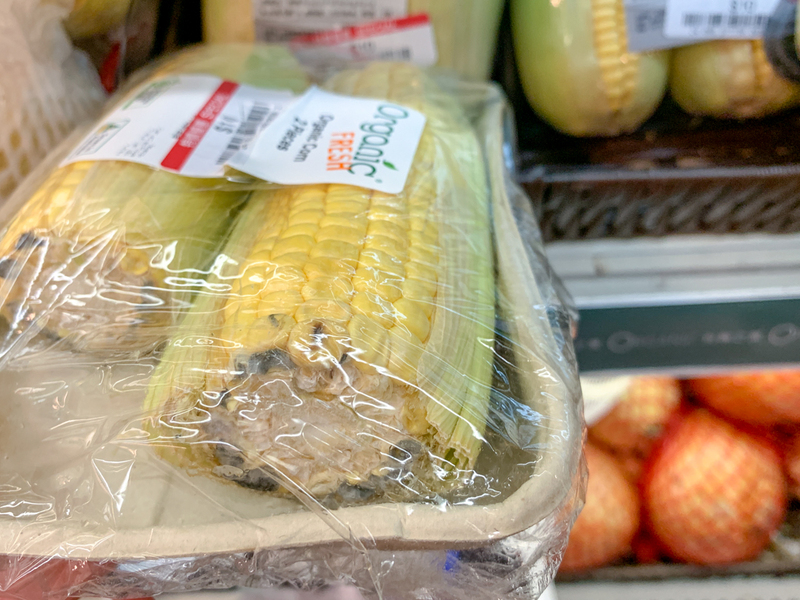 Be careful with corn, sweet potatoes and mushrooms, there was actual mould on them. 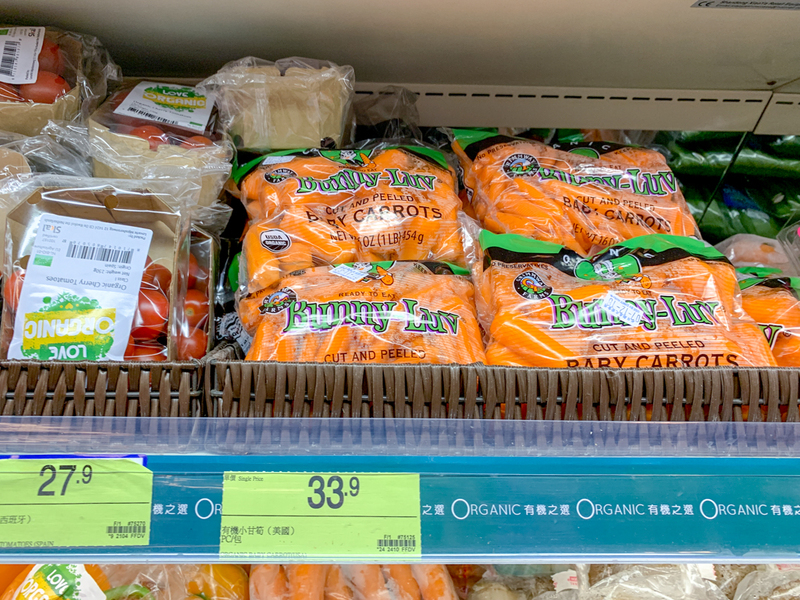 Organic carrots and baby carrots. 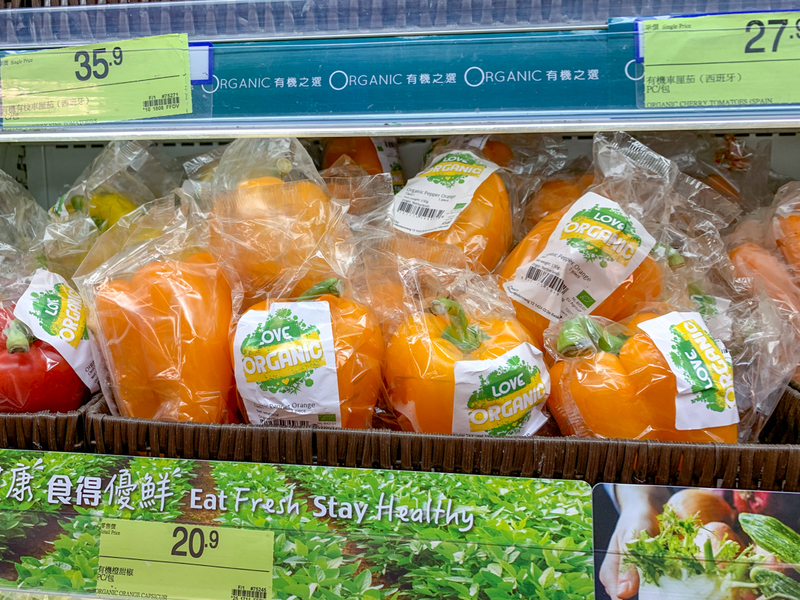 Persimmons are on sale. 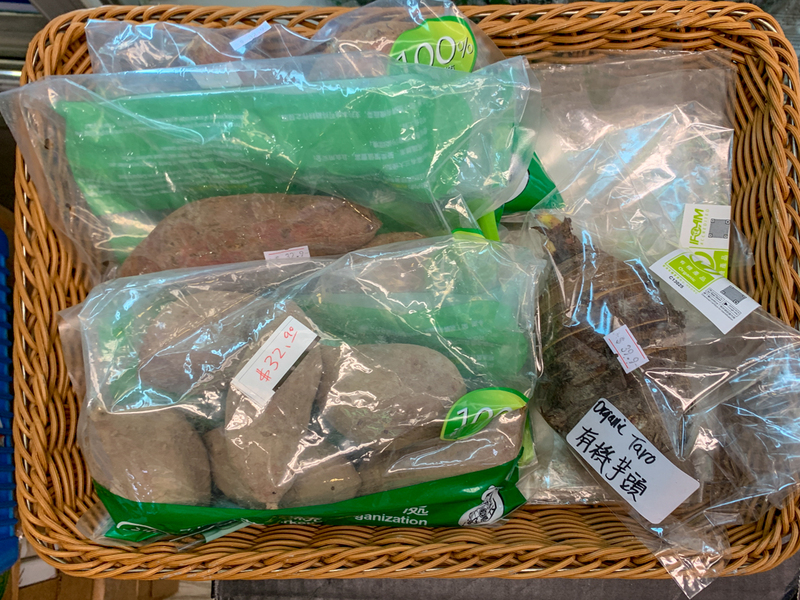 Sweet potatoes are mouldy. 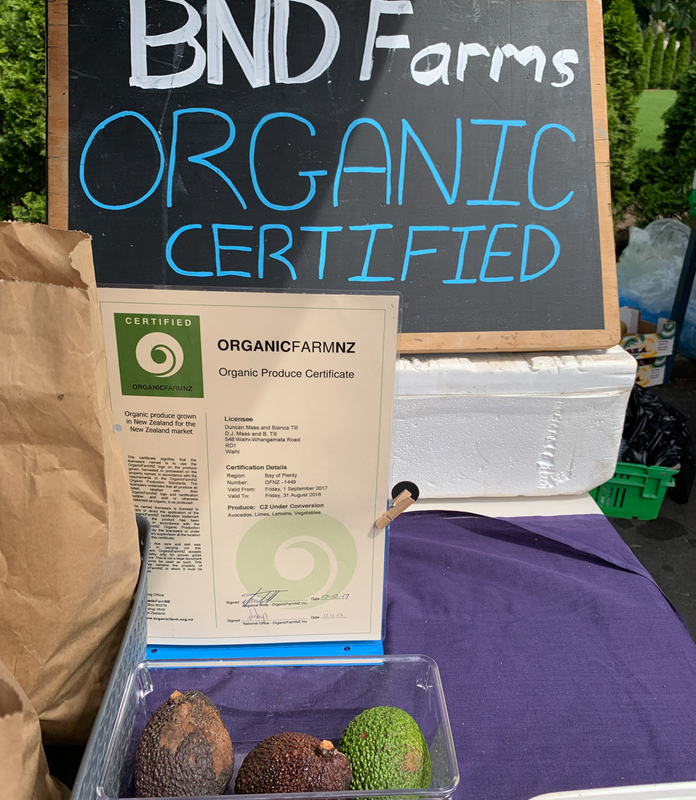 Organic avocados and organic greens. 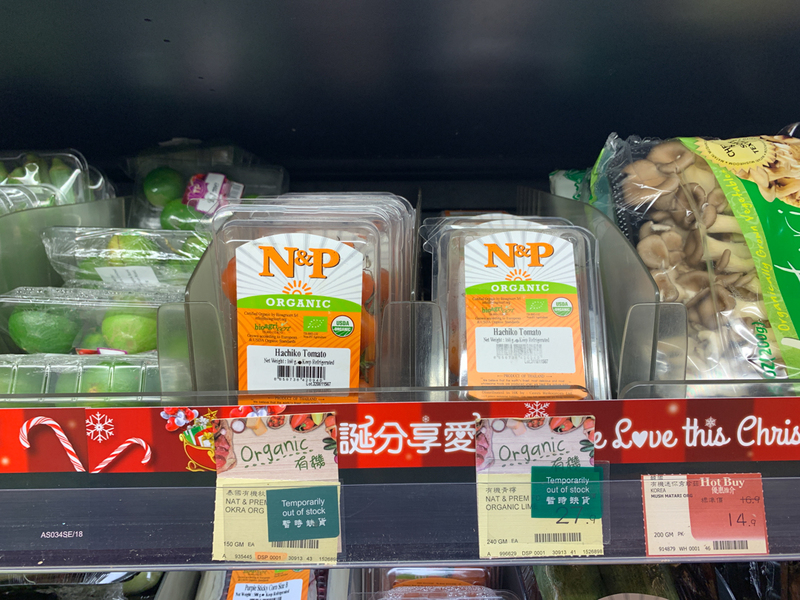 Organic bell peppers and mushrooms. 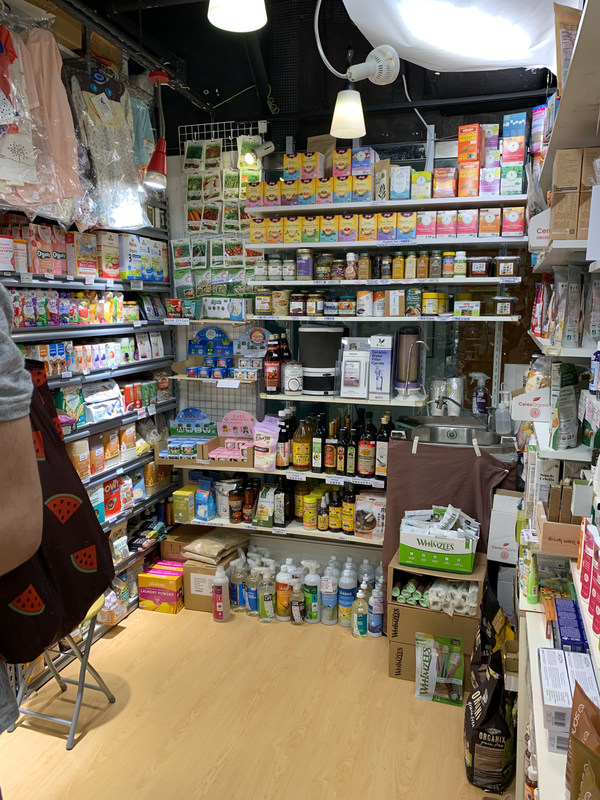 I don’t really like this store, it’s small and crapped, not a fun shopping experience. 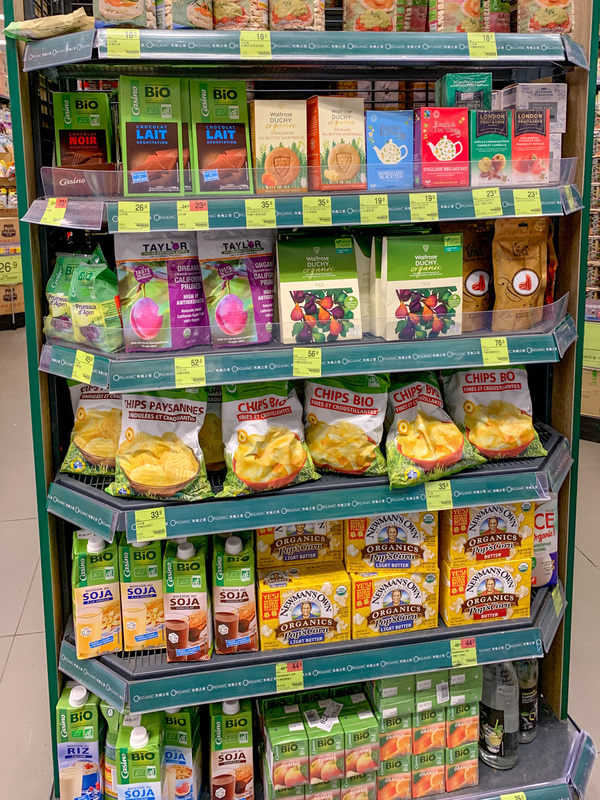 Organic chips and apple juice. 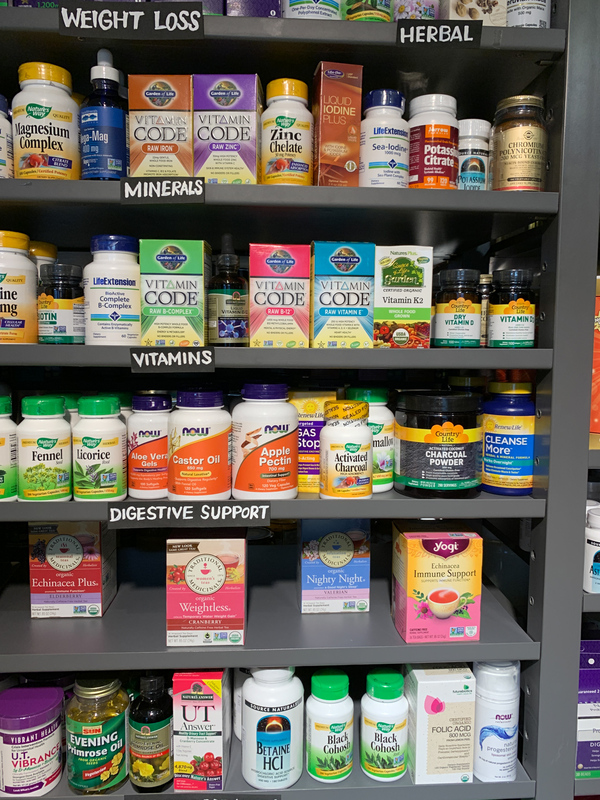 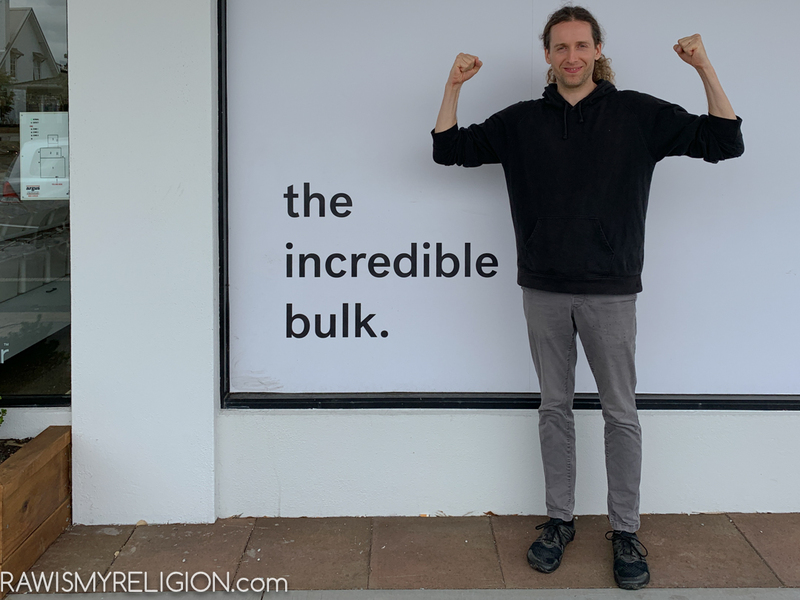 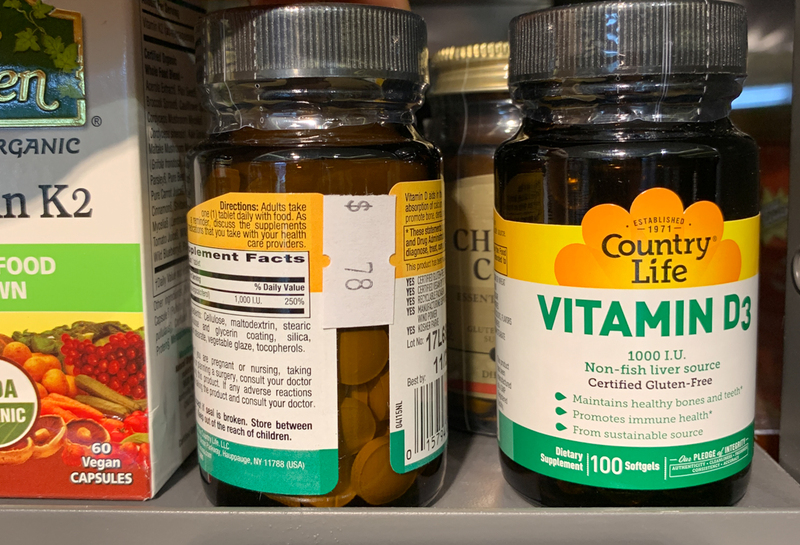 We stubbled across this supplements store while walking in the hood. 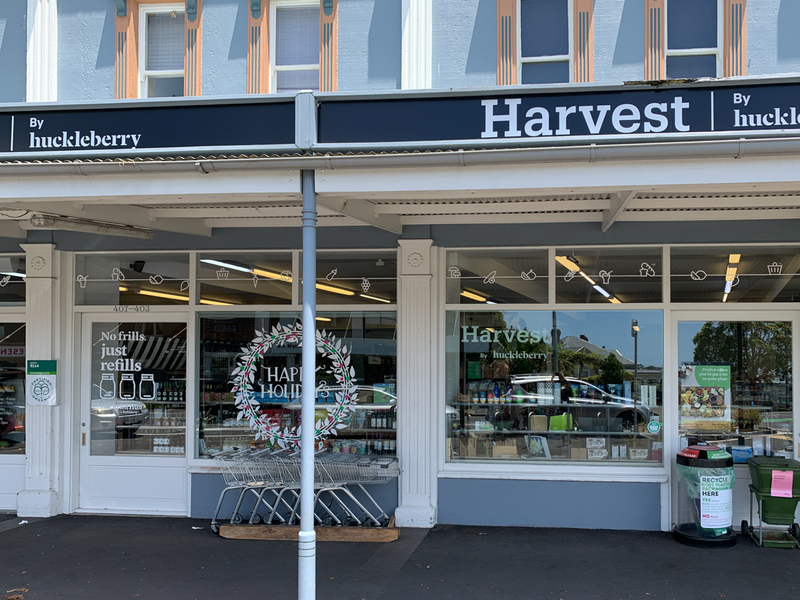 Not really worth checking out unless you are in the area anyway. 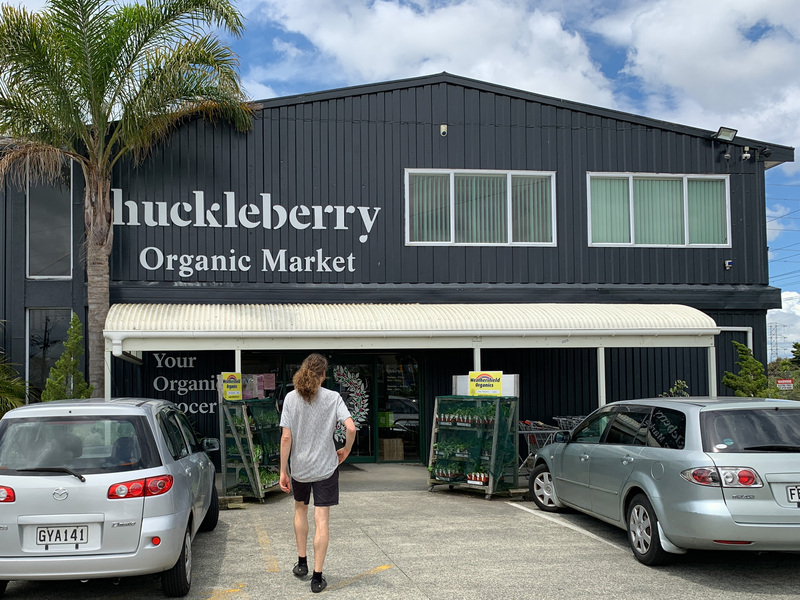 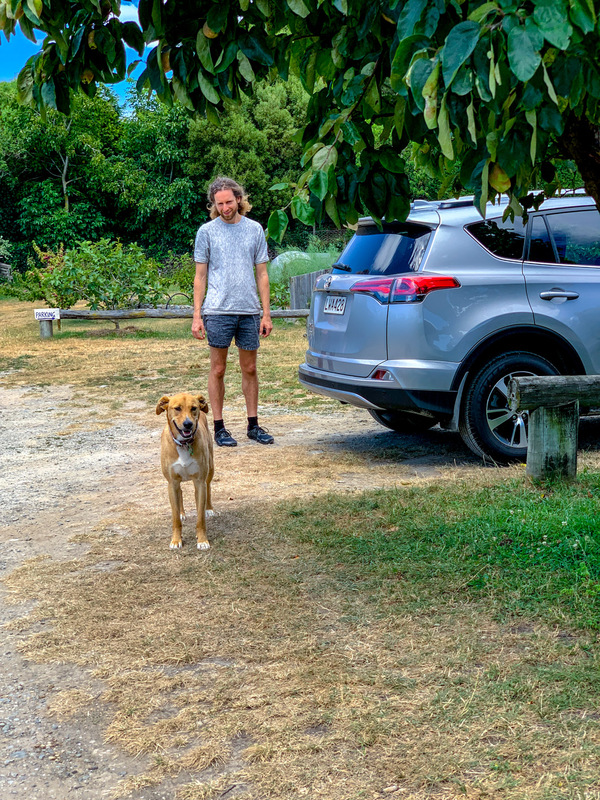 We went to one shop, it’s a chain, the other shops might have a better organic selection. 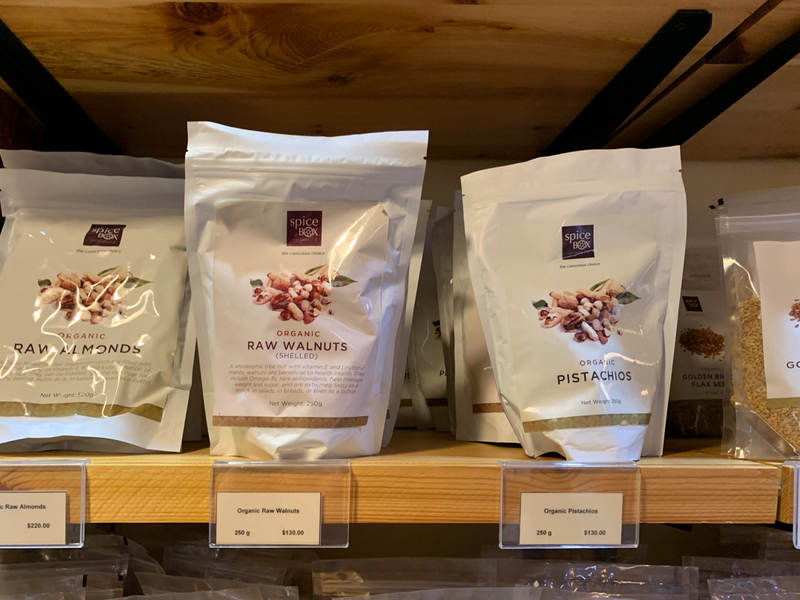 Organic dried mulberries, flax, sesame seeds. 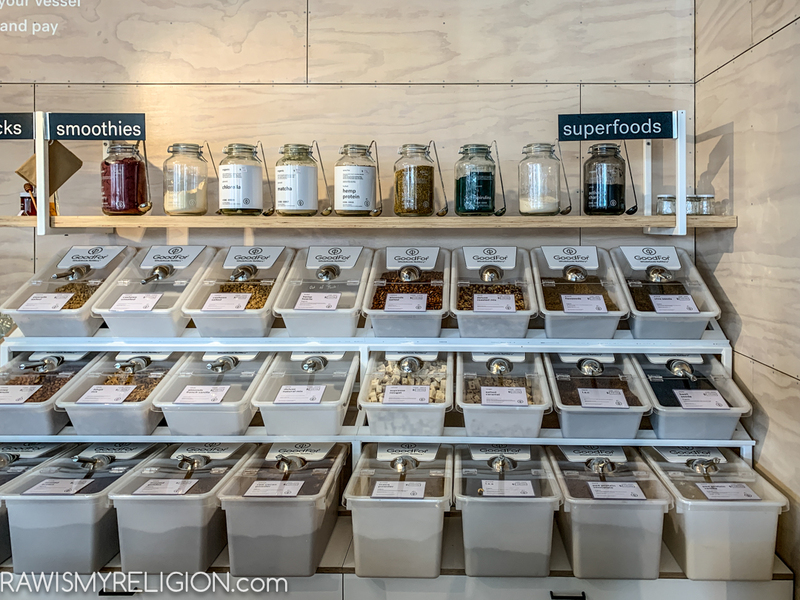 Berry powders and raw cacao. 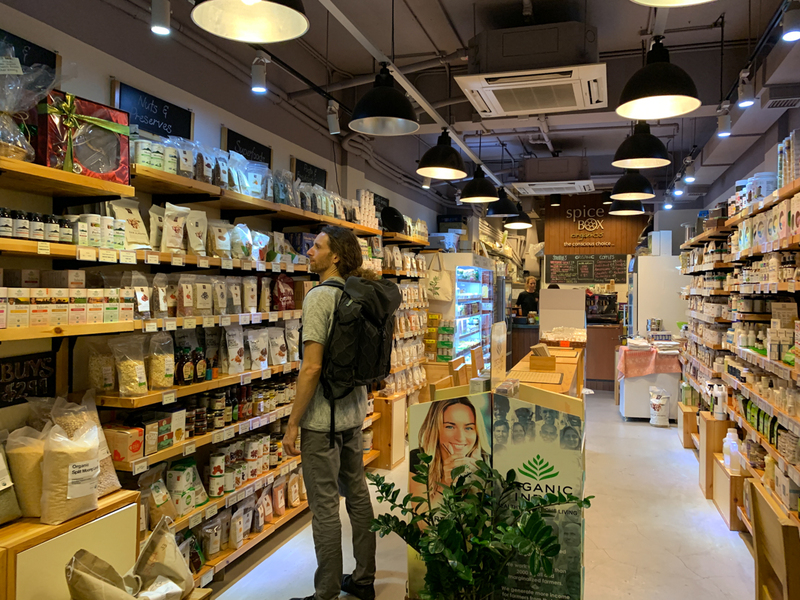 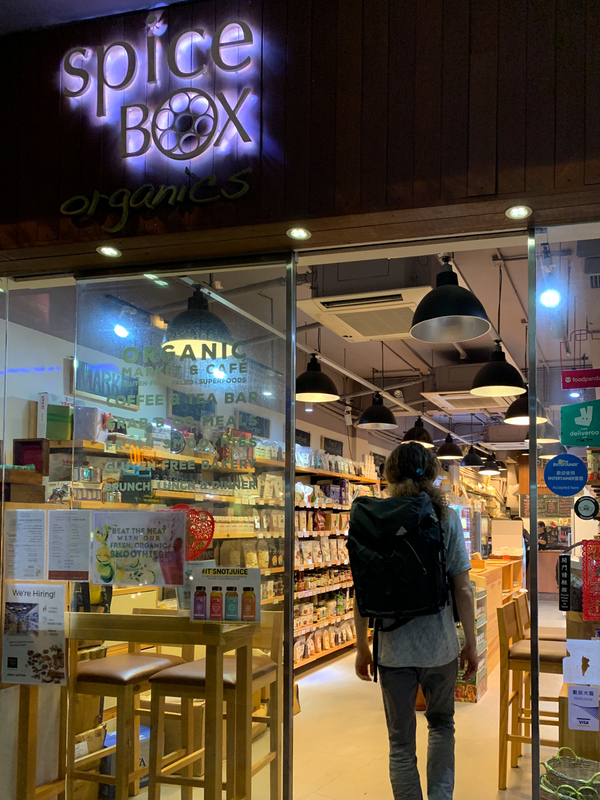 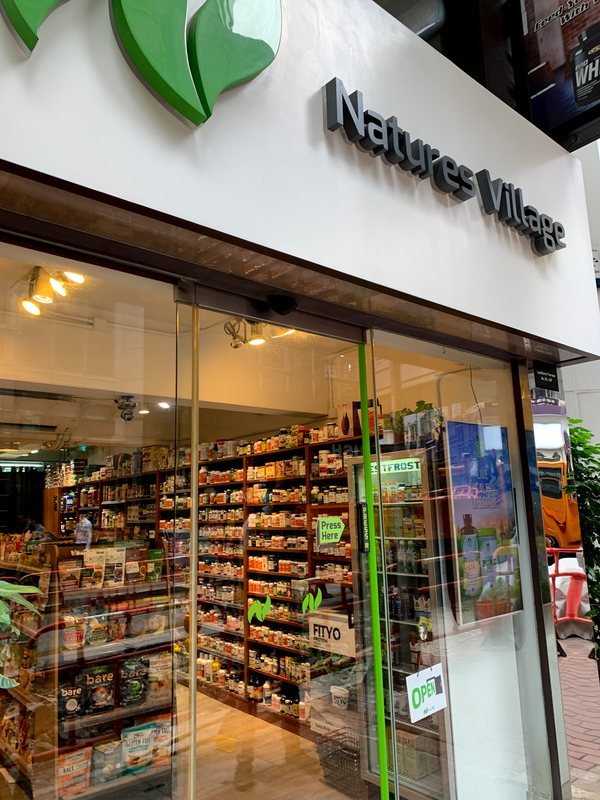 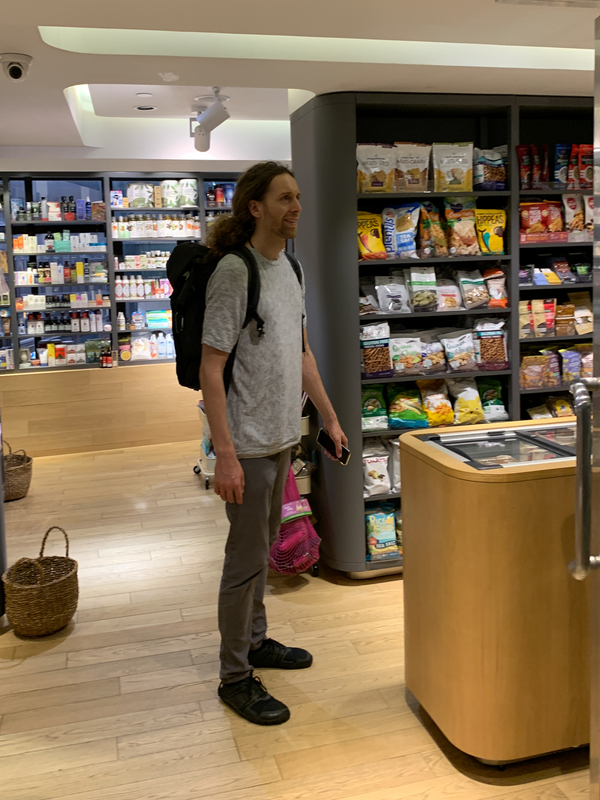 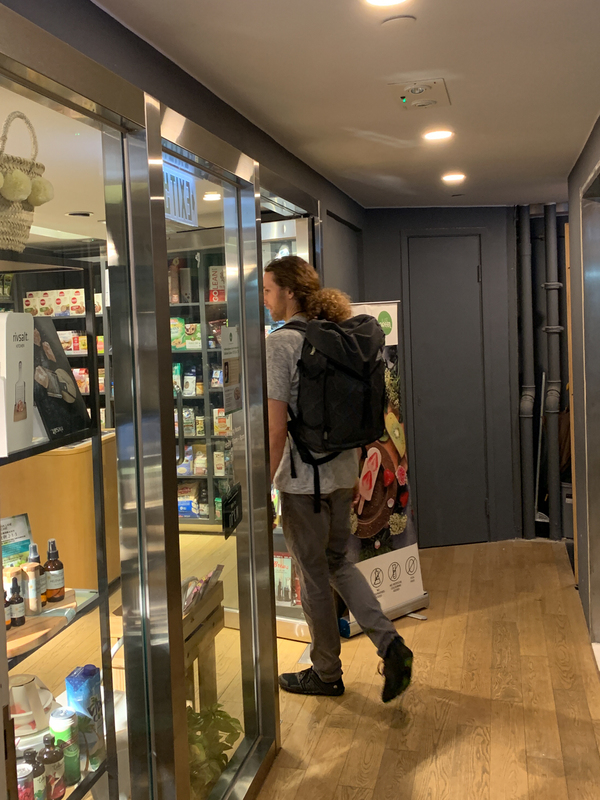 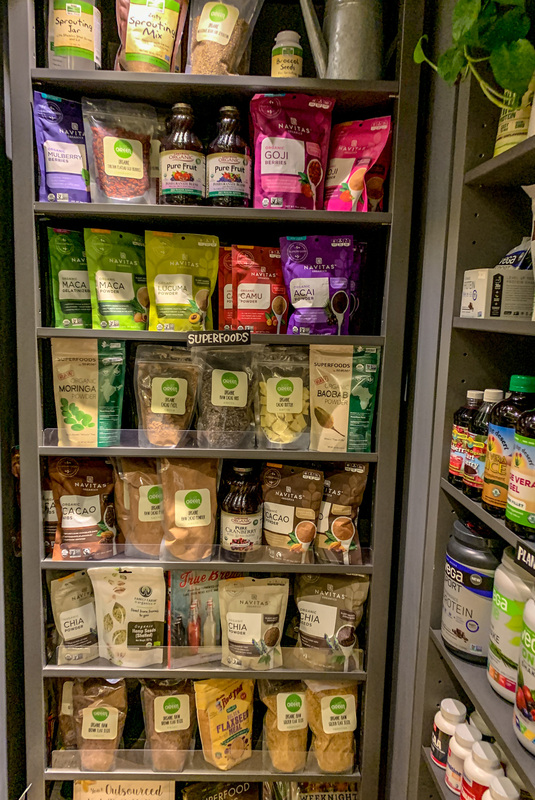 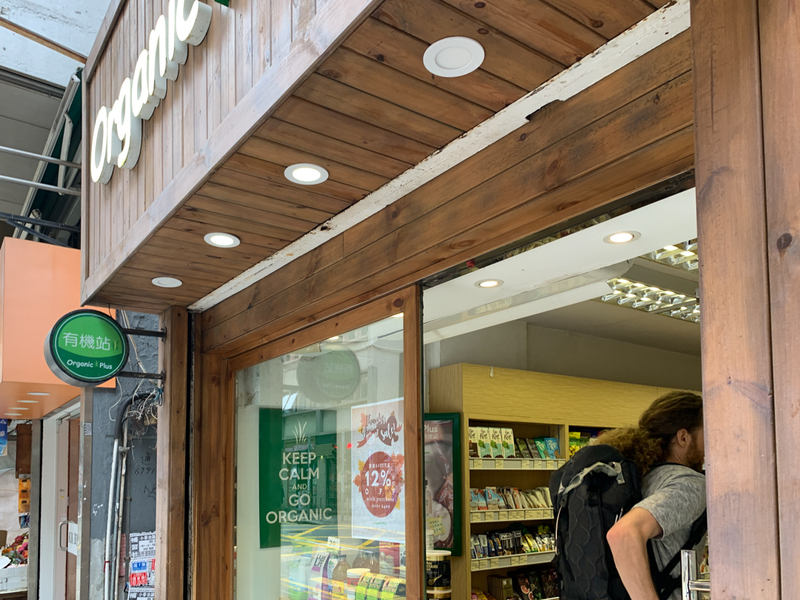 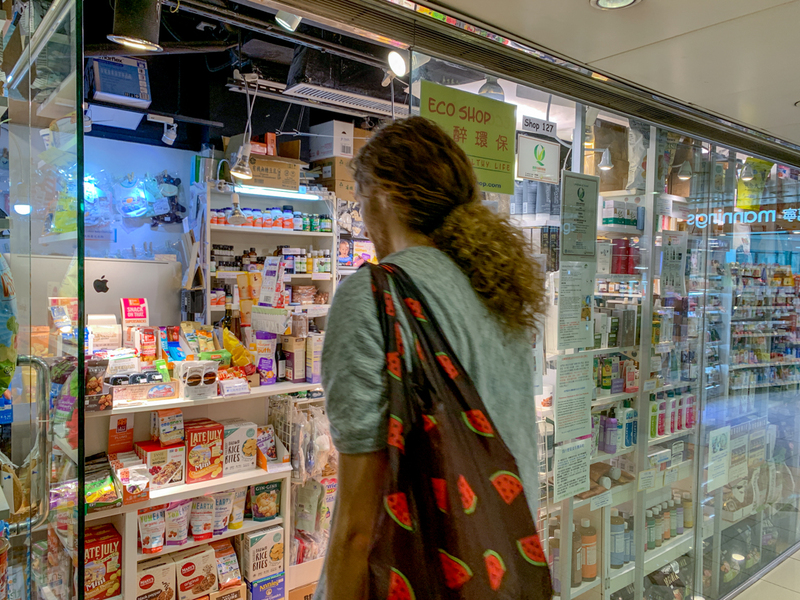 Stefan found a nice health food store chain in Hong Kong we wanted to check out. 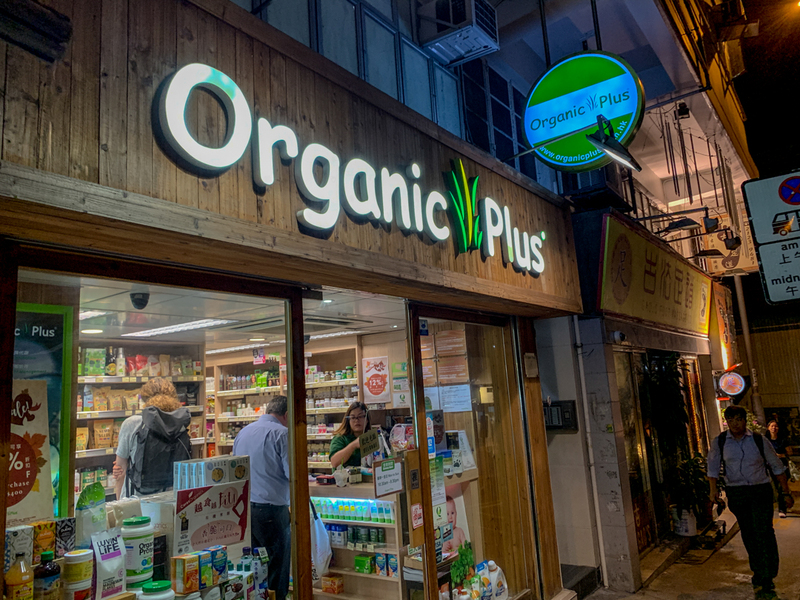 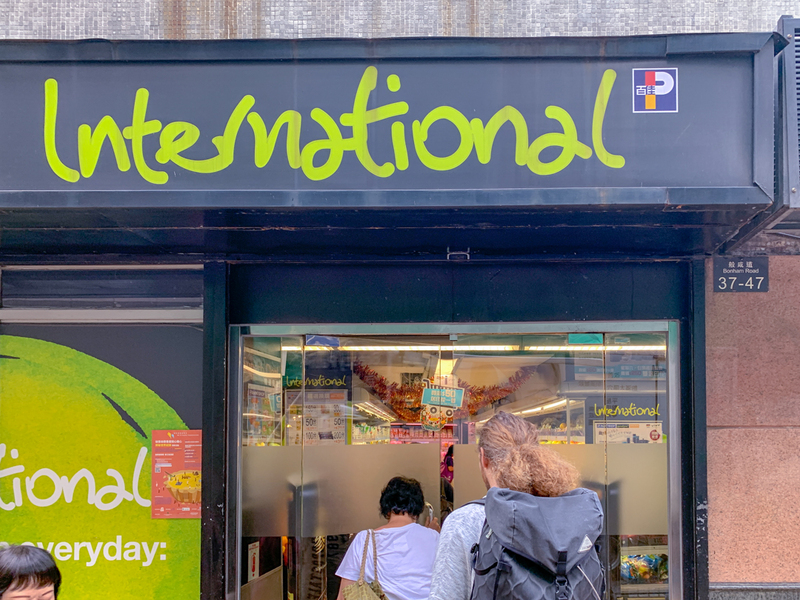 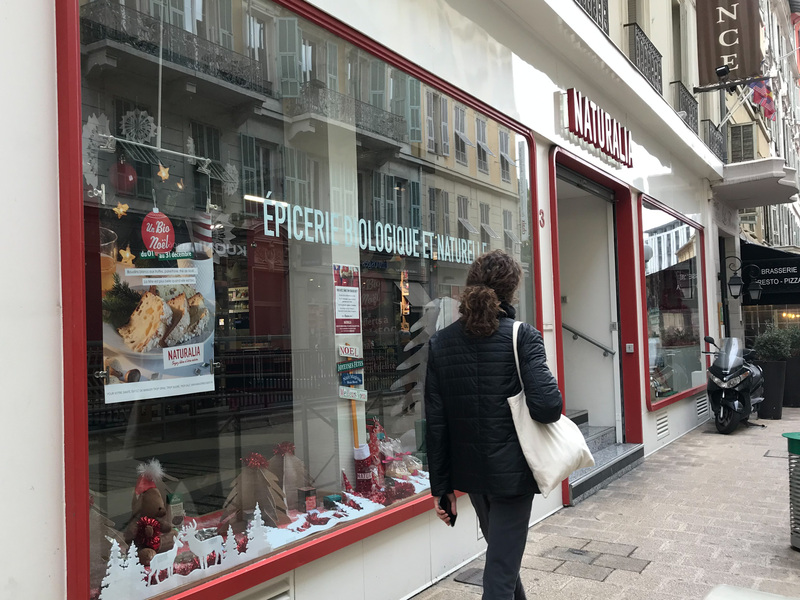 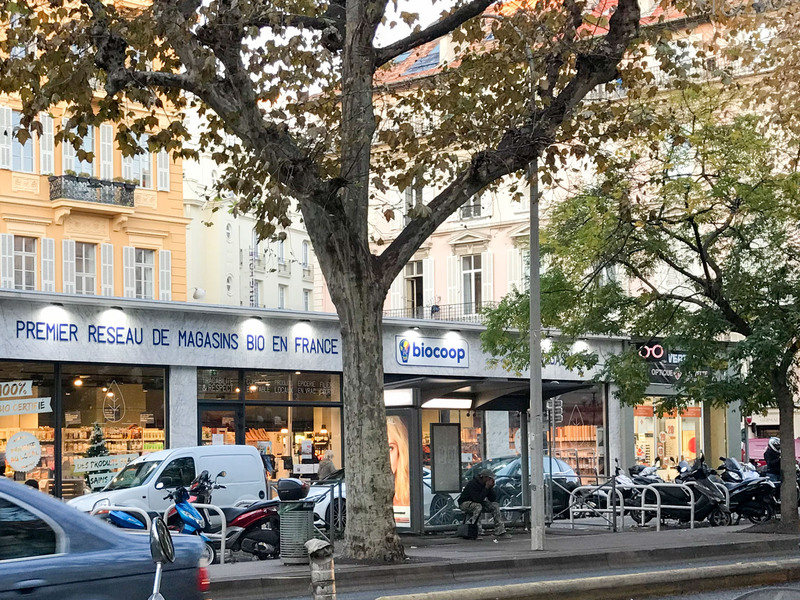 Even the first store was almost impossible to find, the selection of organic products was nit disappointing. 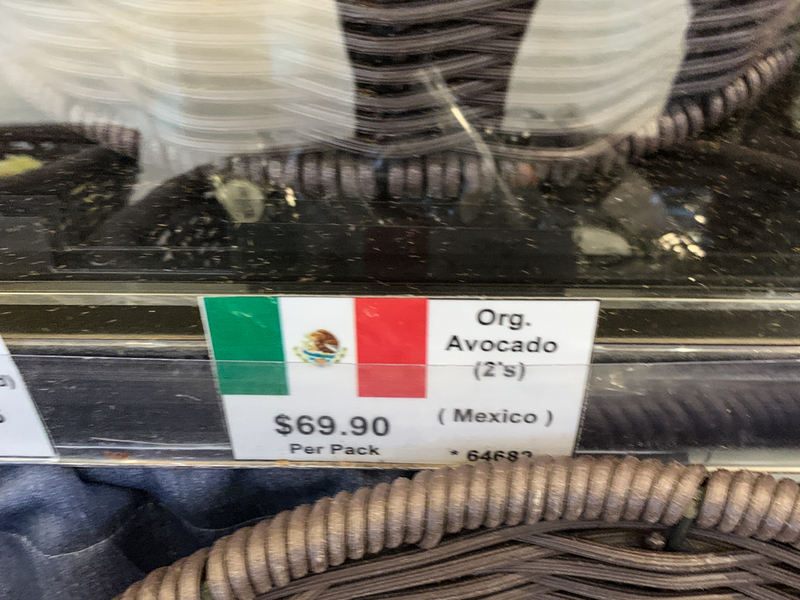 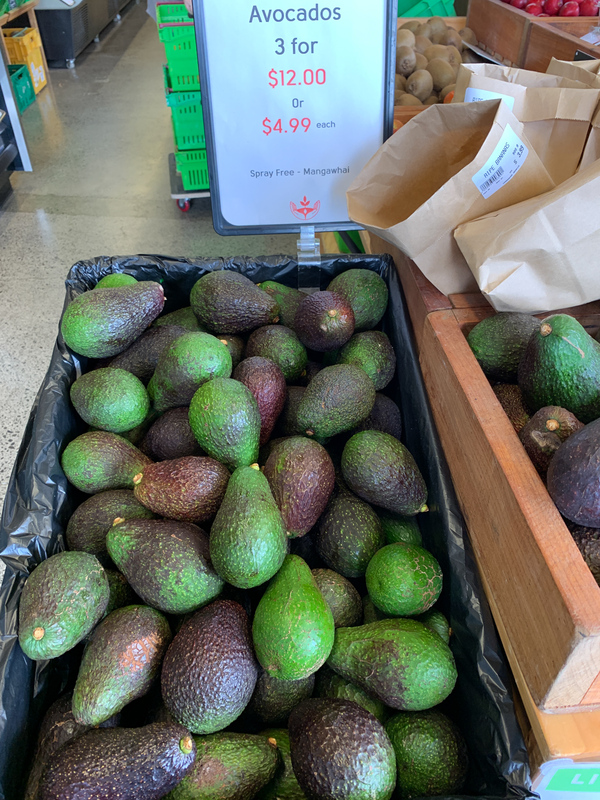 The produce is however very limited, they only had organic avocados. 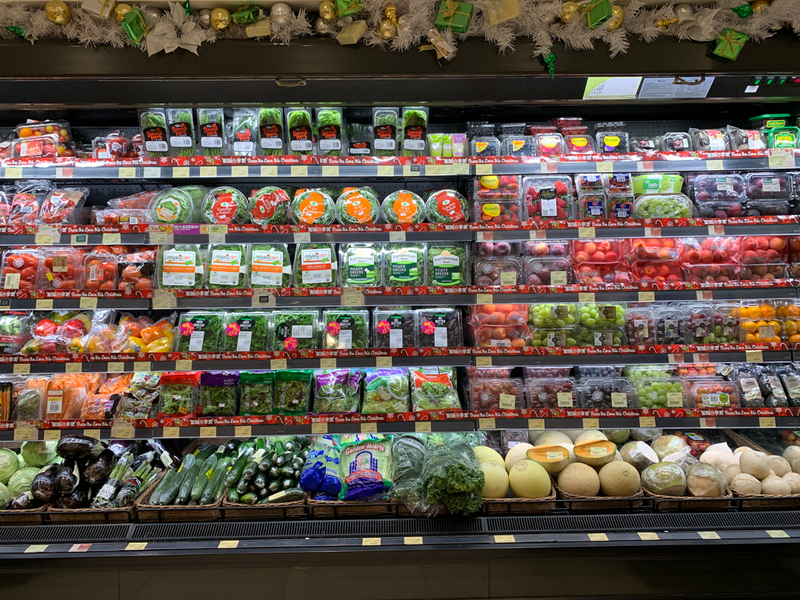 The produce is better on Mondays and Wednesdays we were told. 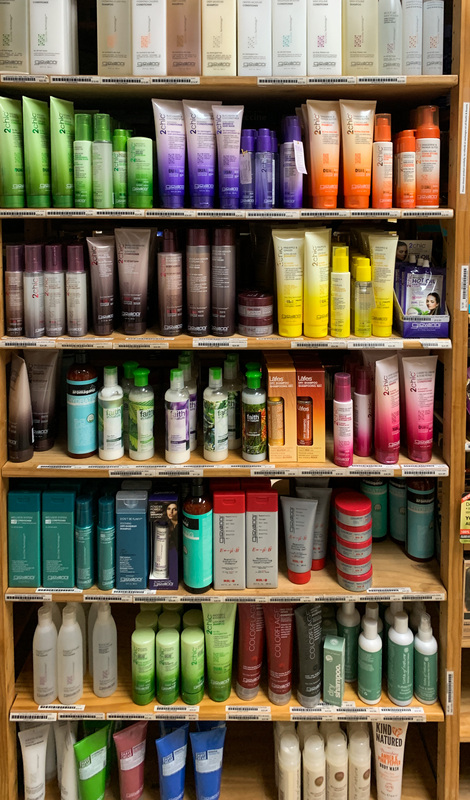 After showing you the products, I’ll show you how to find the shop. 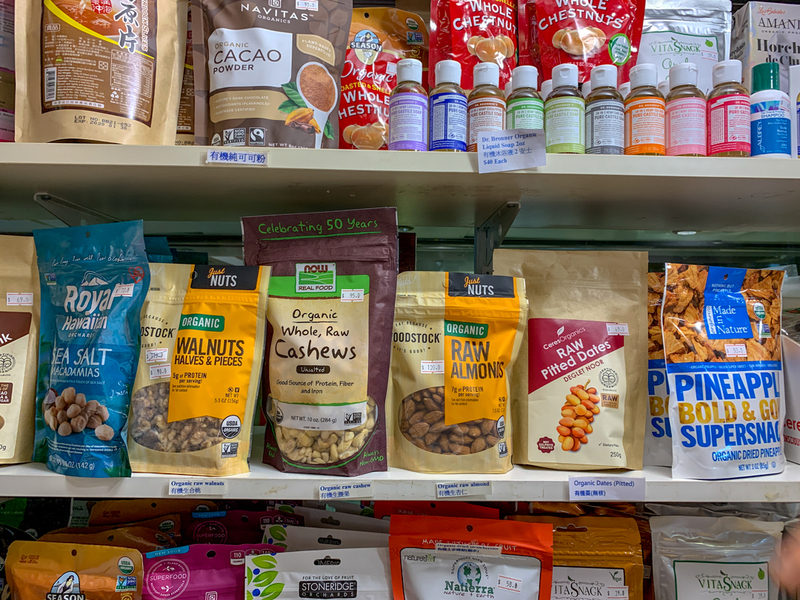 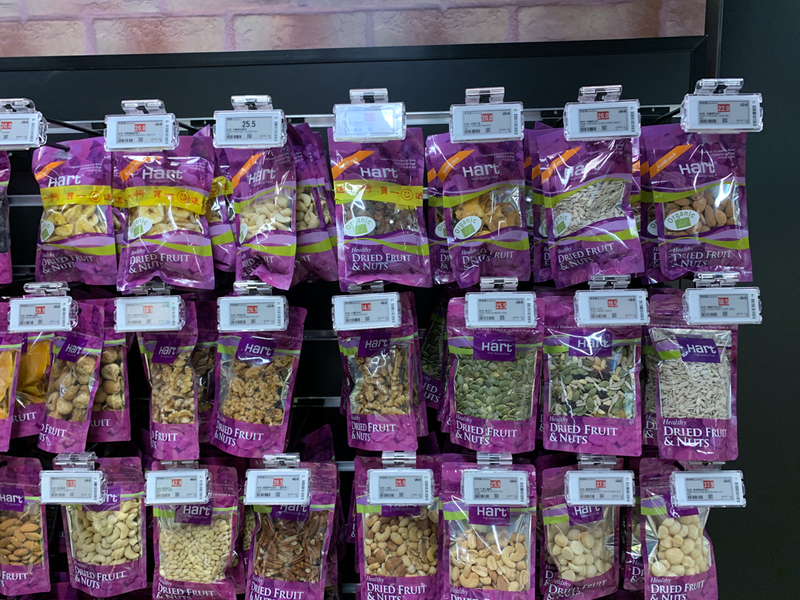 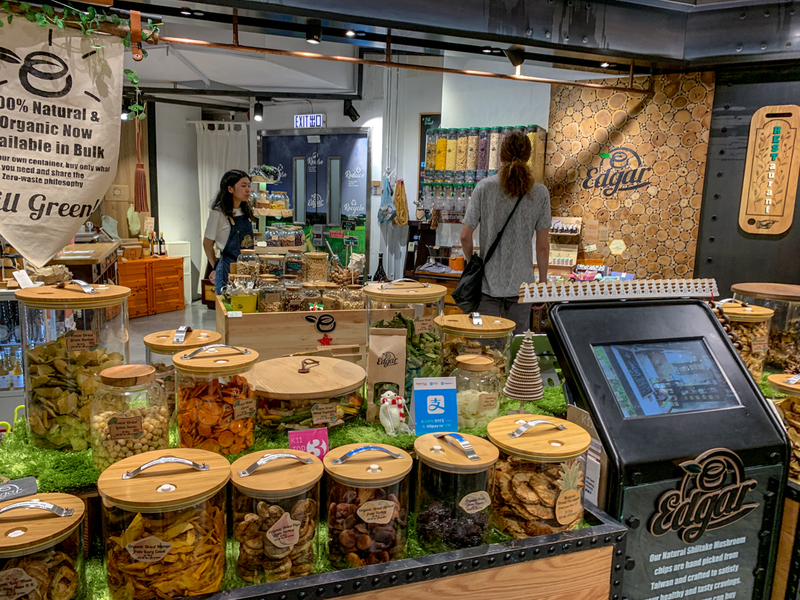 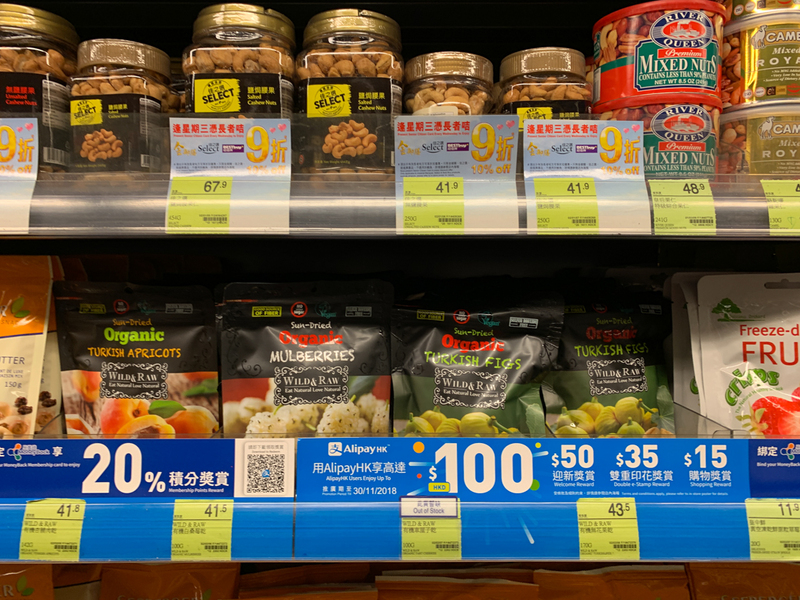 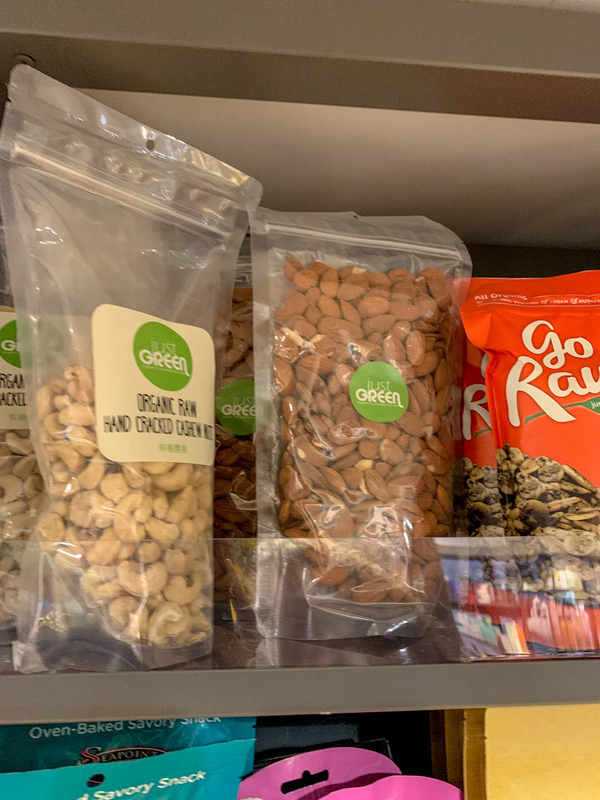 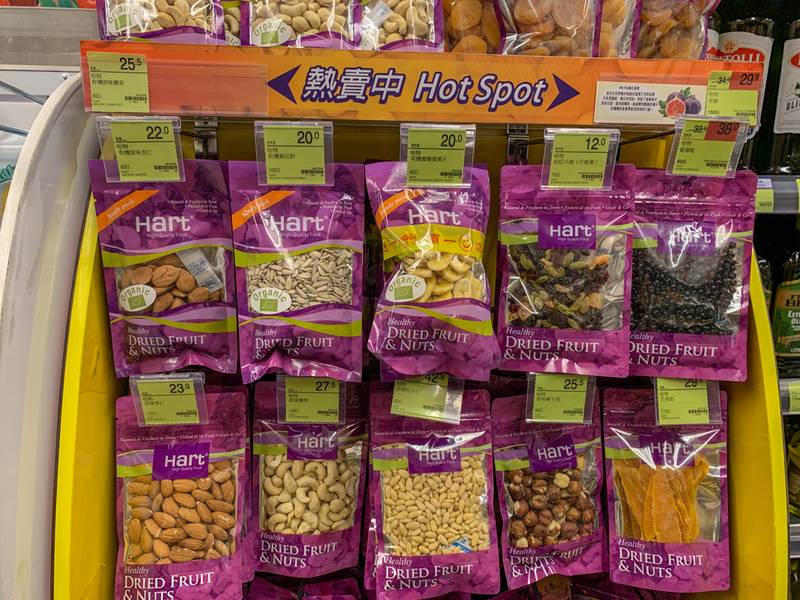 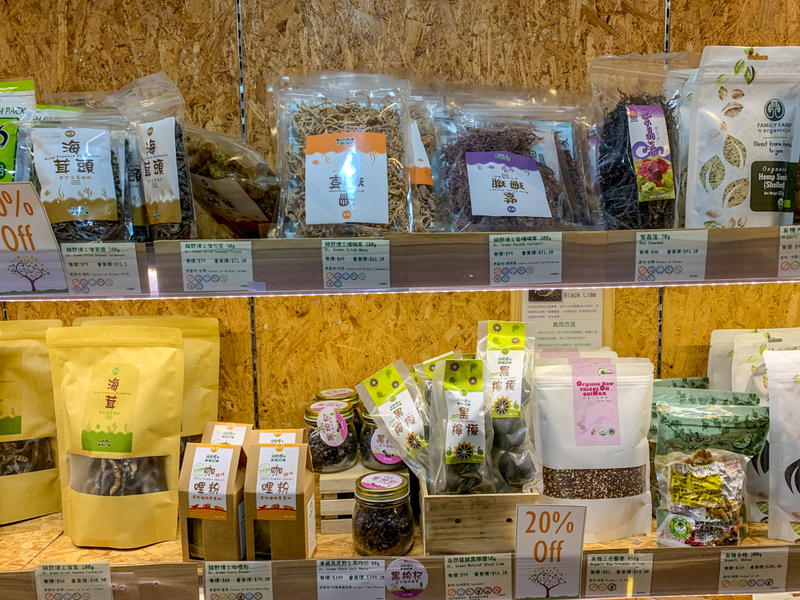 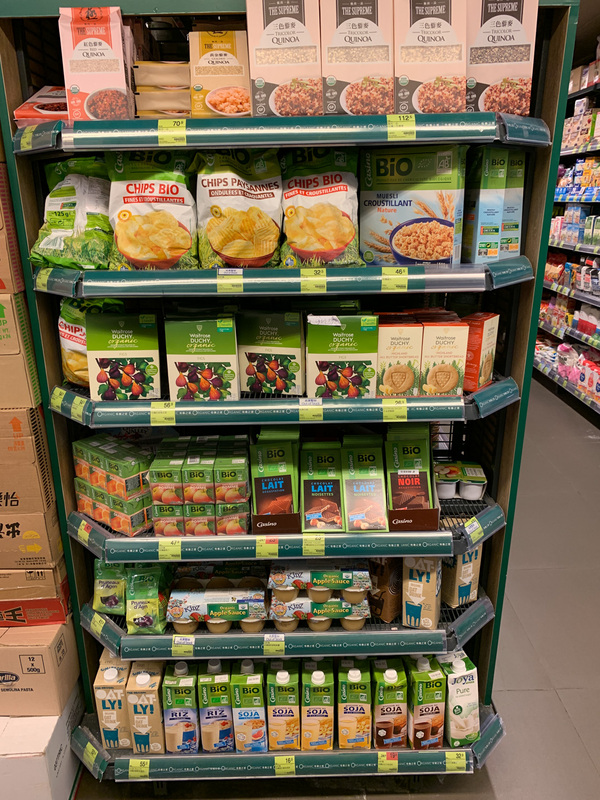 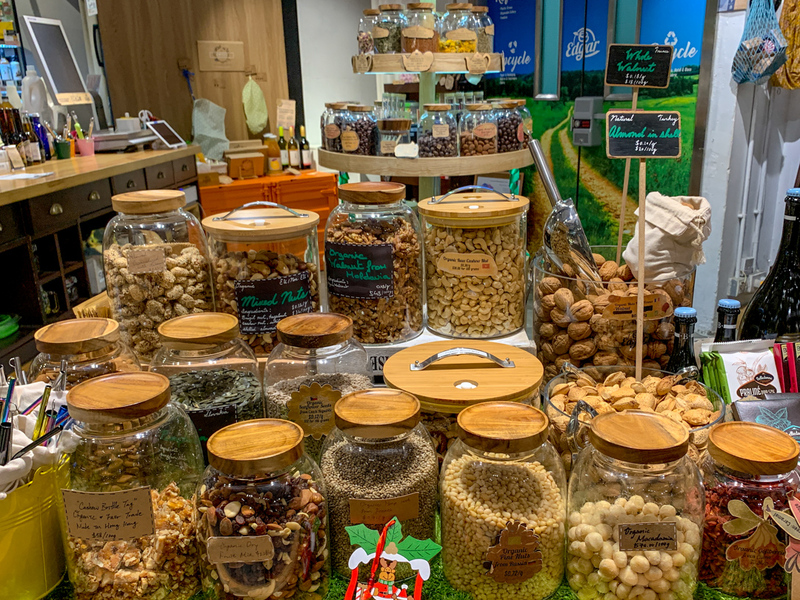 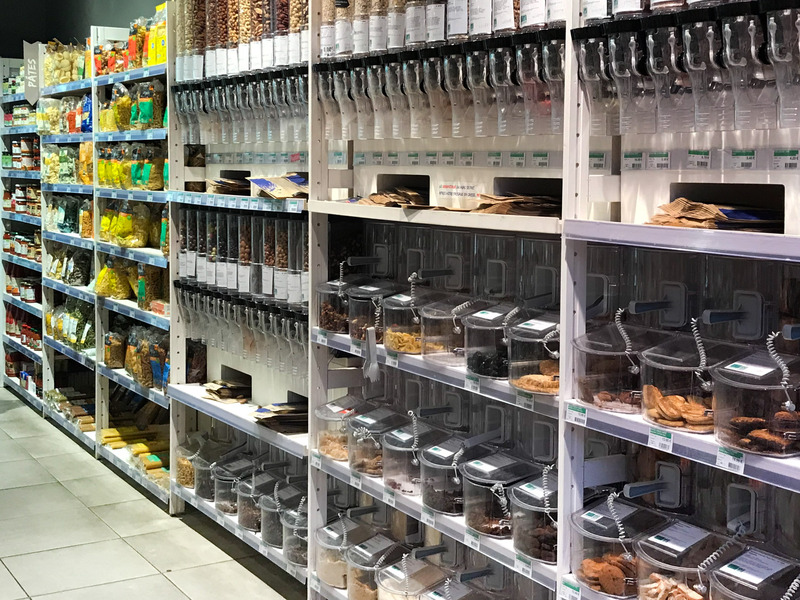 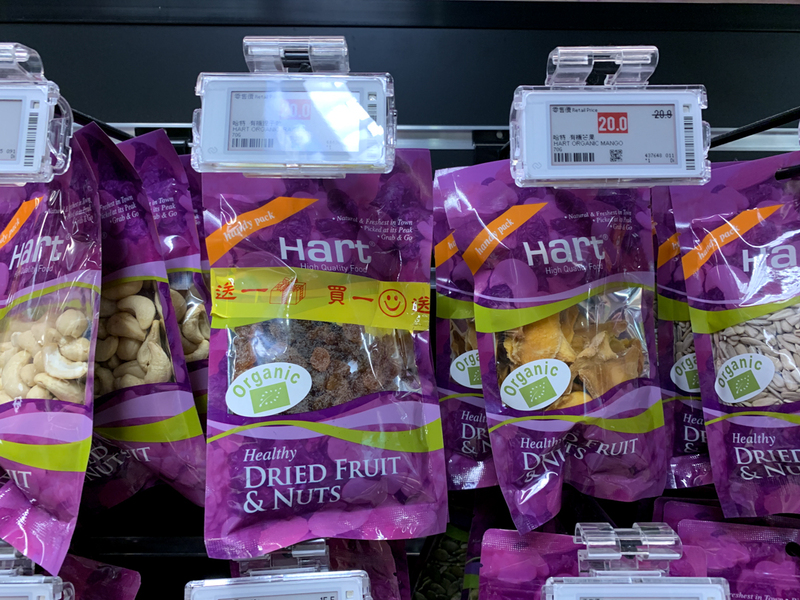 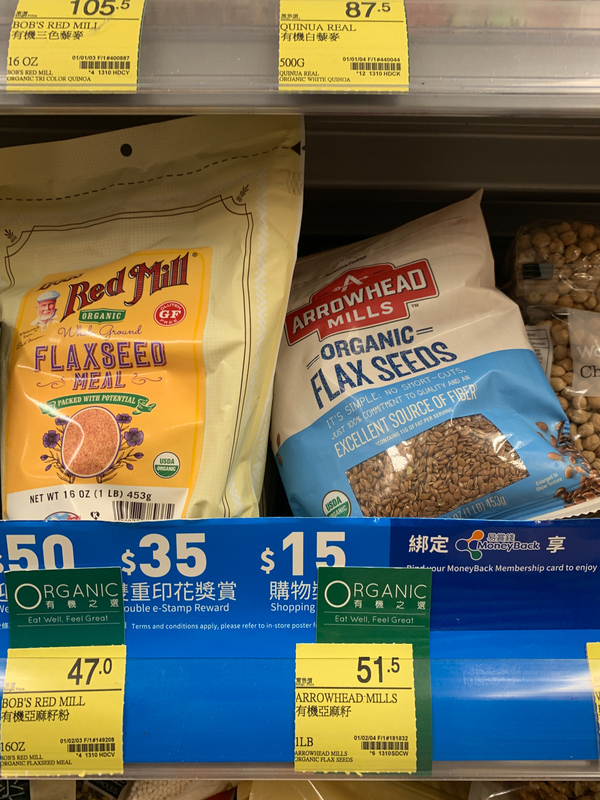 Great selection of organic nuts and seeds, probably the best in Hong Kong. 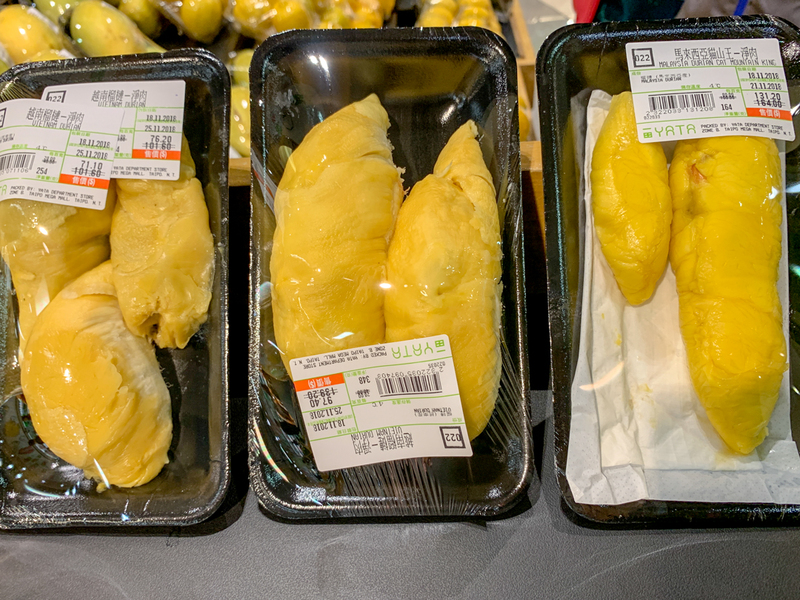 The durian is not certified organic, but we got it anyway. 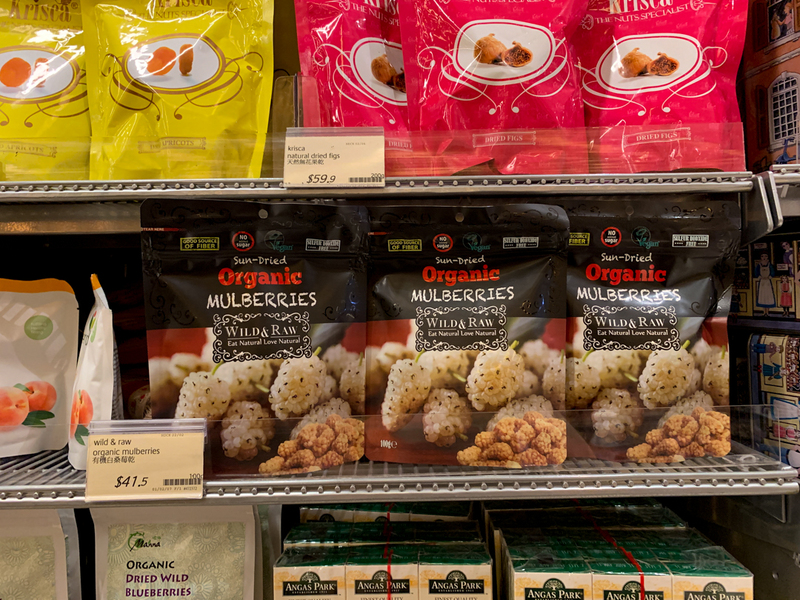 One of the few exceptions where I would buy non-organic knowingly. 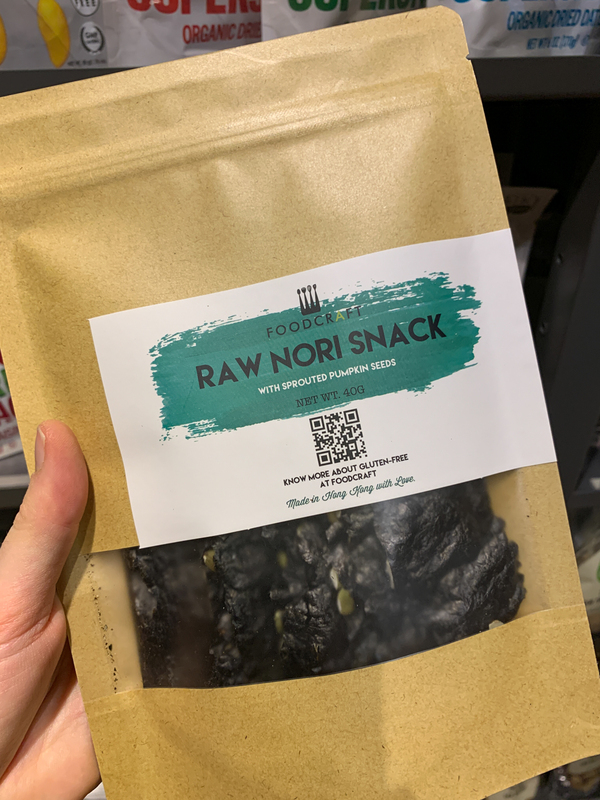 The nori snack was delicious, on the webpage the pumpkin seeds are labeled as organic. 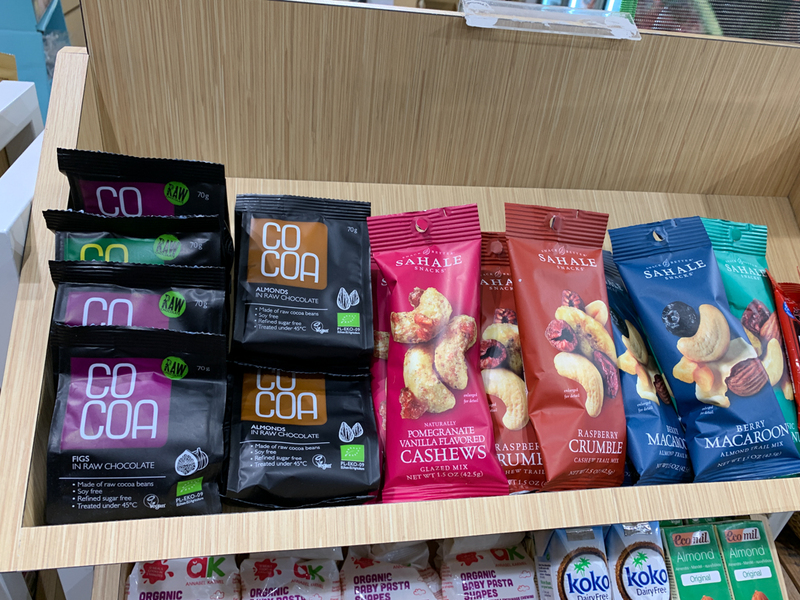 Co Coa Snacks, but not my fav kind. 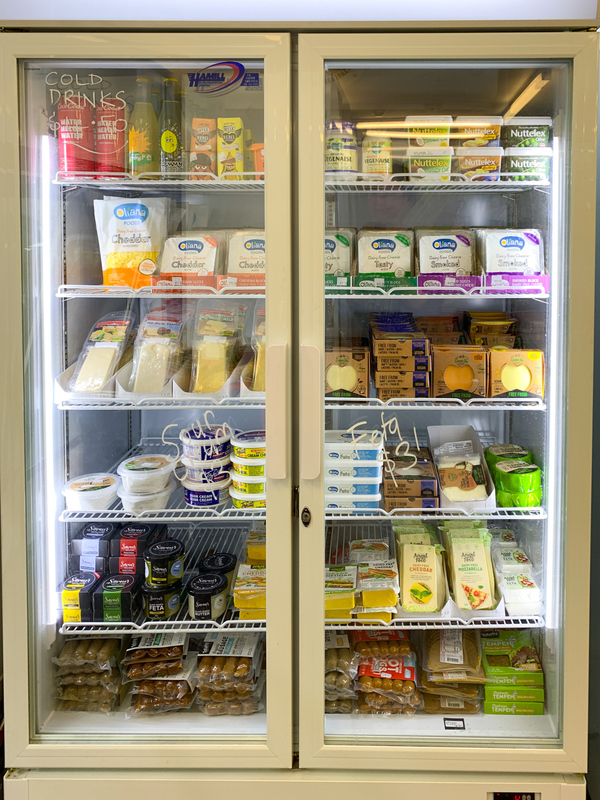 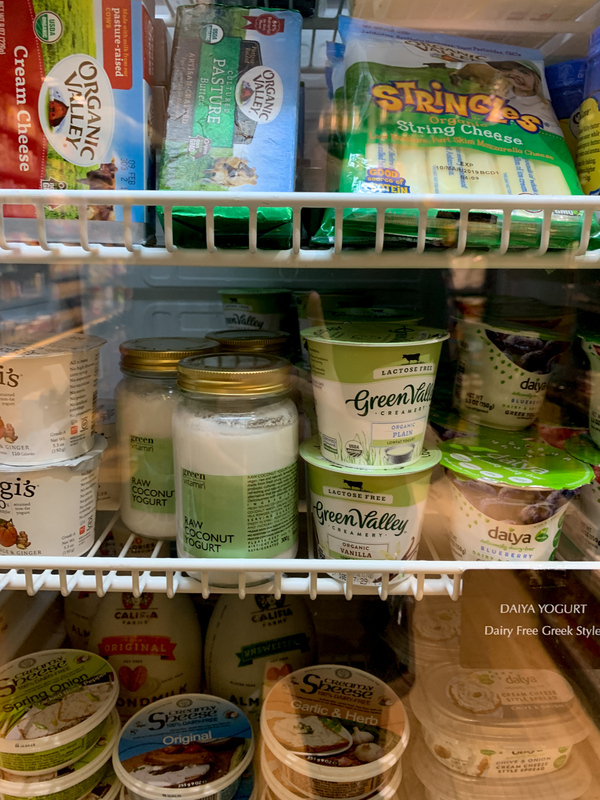 Vegan meats and cheeses, milks and yogurt. 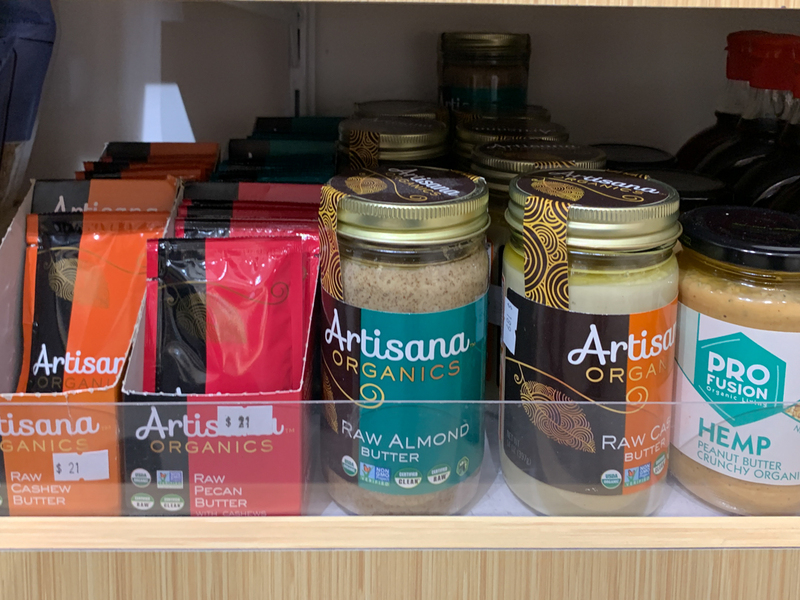 Vegan nut butters, organic spices and flour. 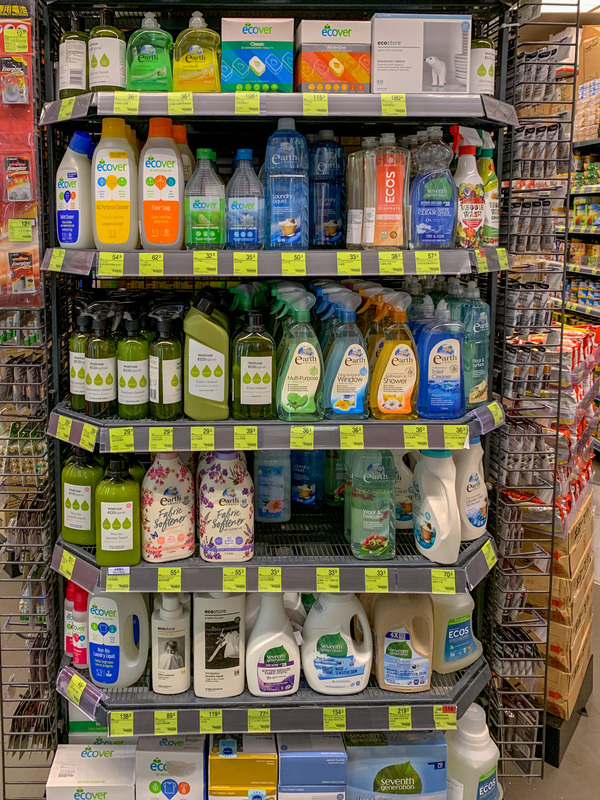 Natural cleaning supplies. 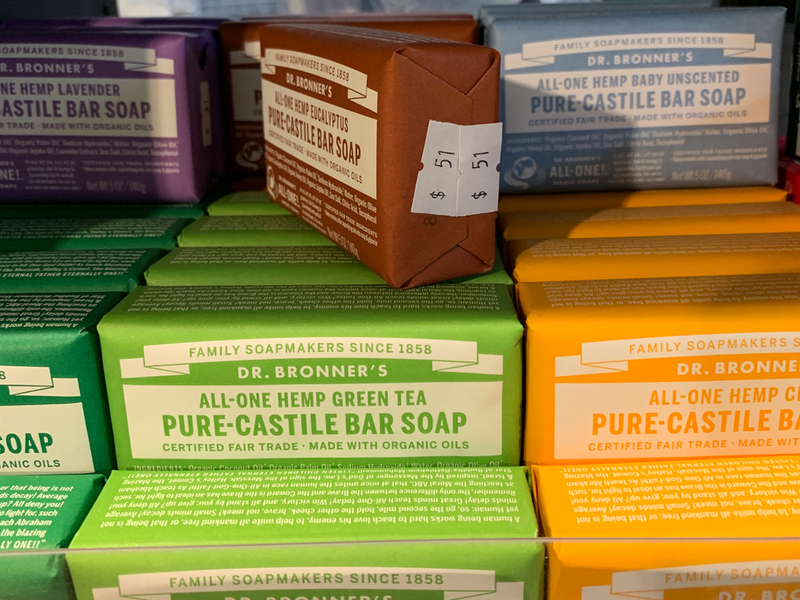 Dr. Bronner’s spoap. 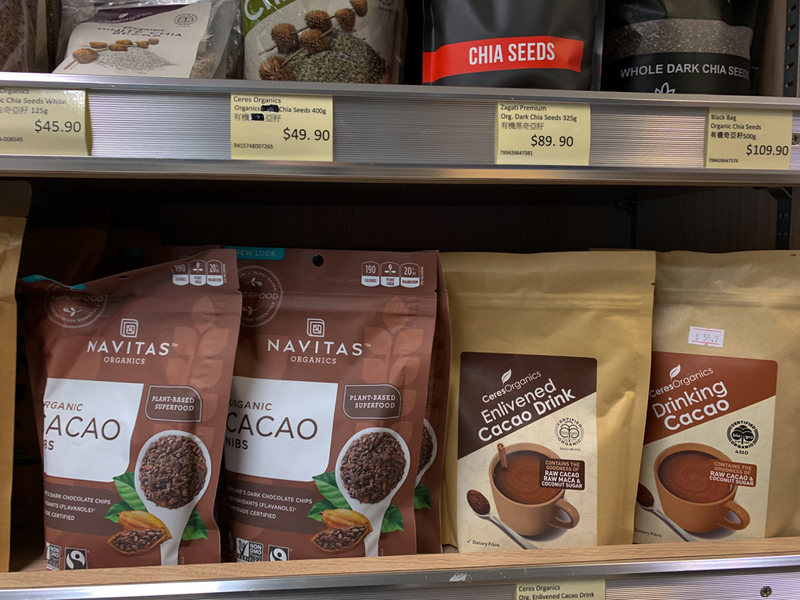 Organic cacao and berry powders. 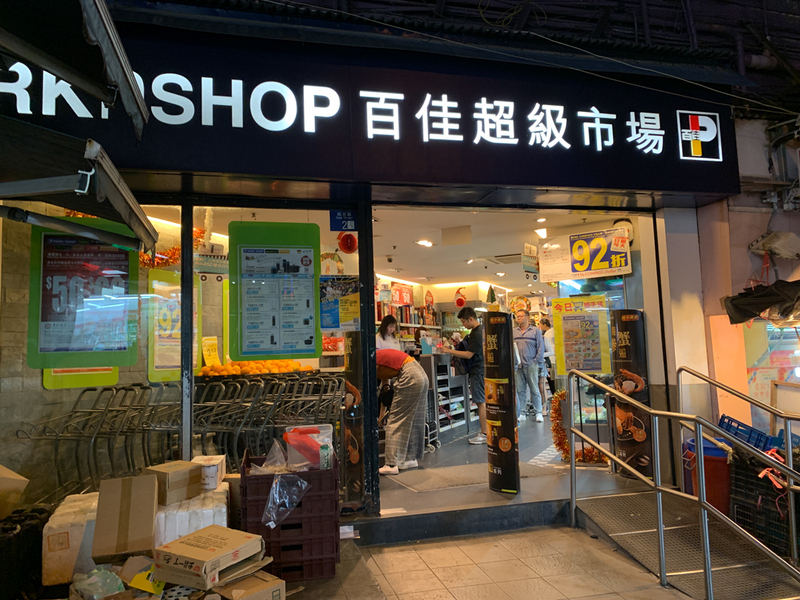 The shop entrance is on the right side. 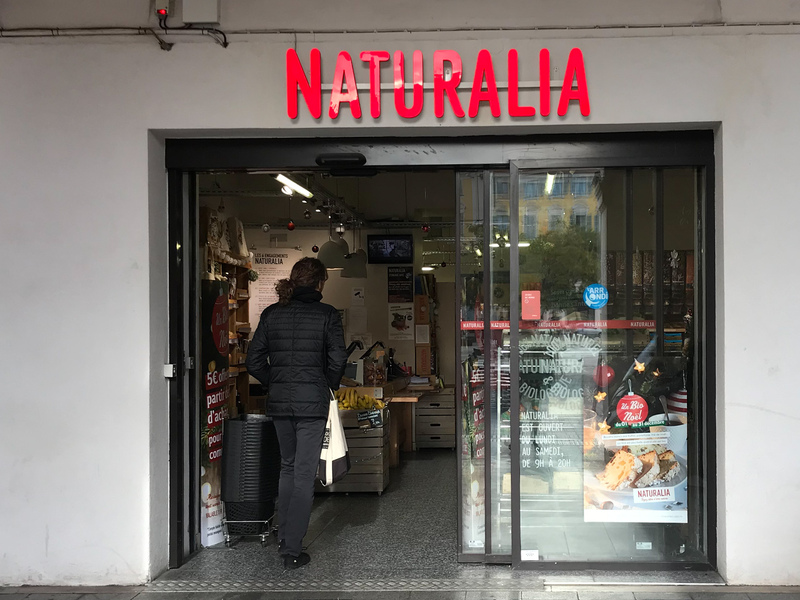 There is a door on the left. 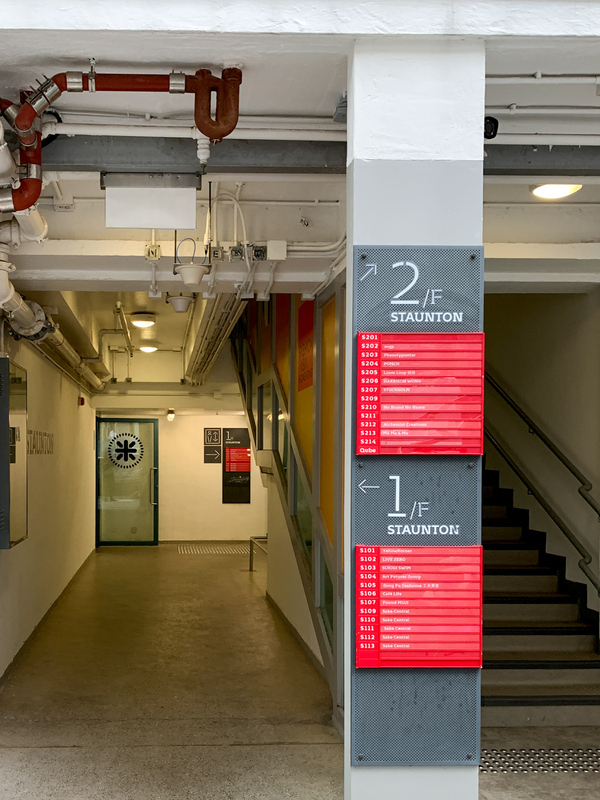 Walk up to the 1st floor. 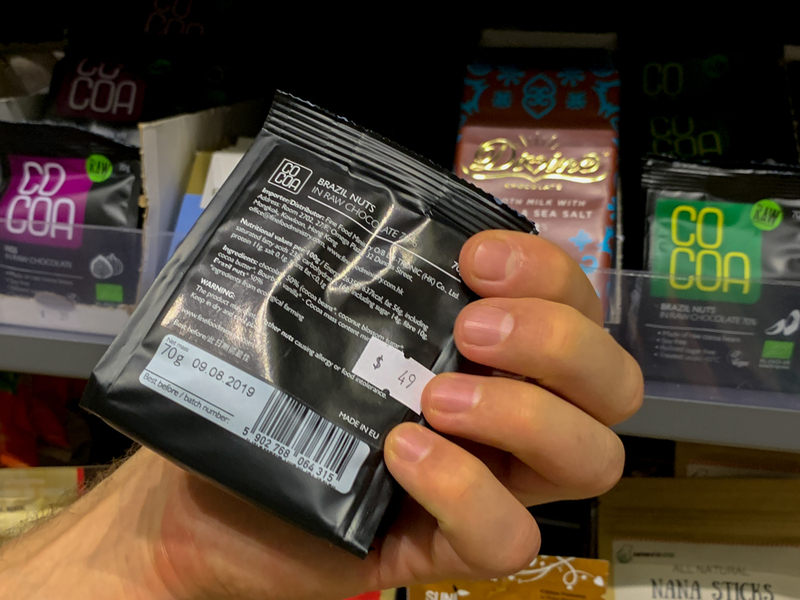 Here, they also had the Co Coa Chocolate. 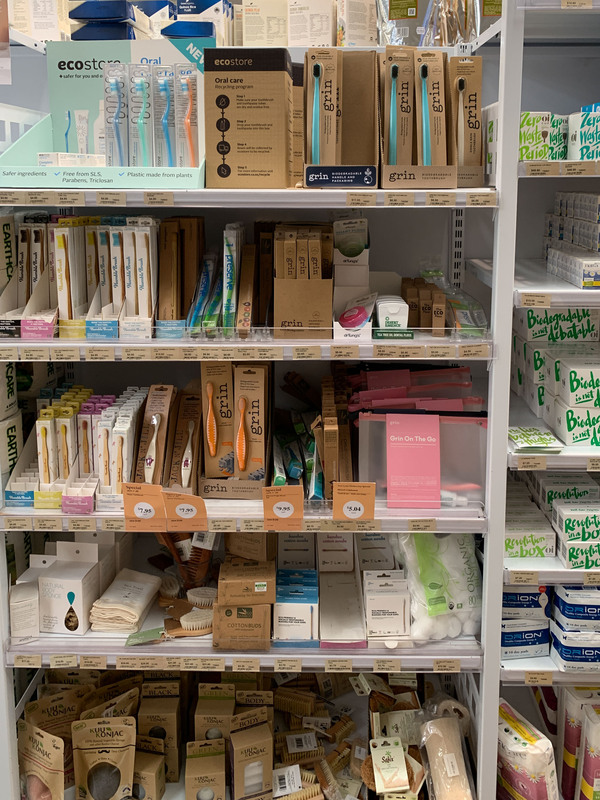 Organic female hygiene products such as organic cotton tampons and pads. 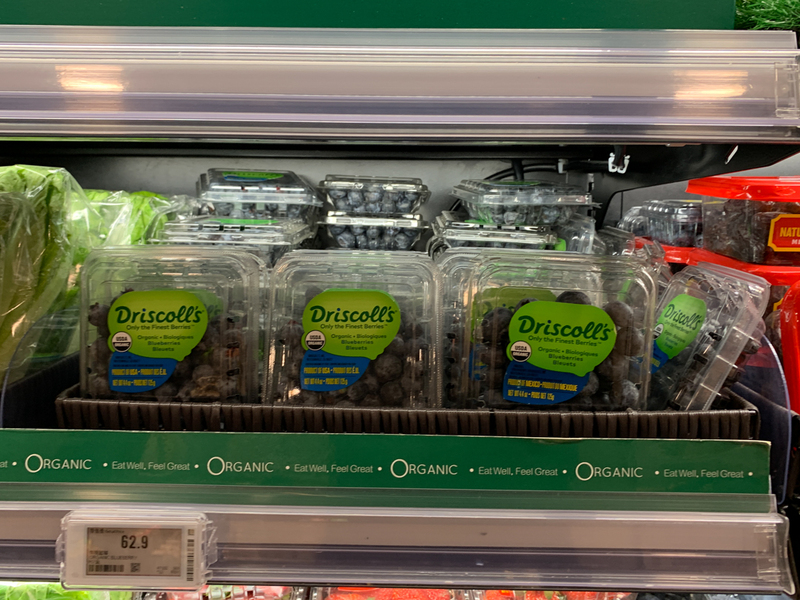 Dairy-free ice cream, organic frozen berries and fruit. 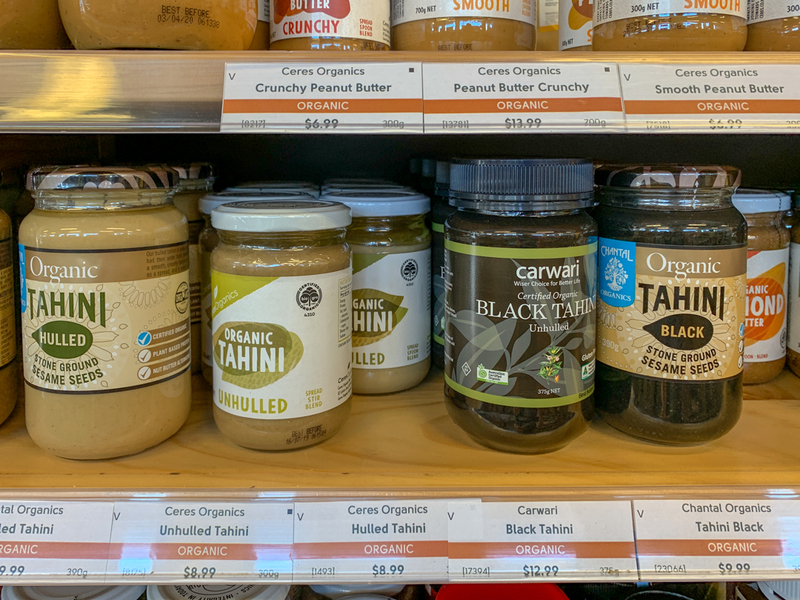 Organic nut butters, tahini, cashew butter, hemp butter, organic coconut oil below. 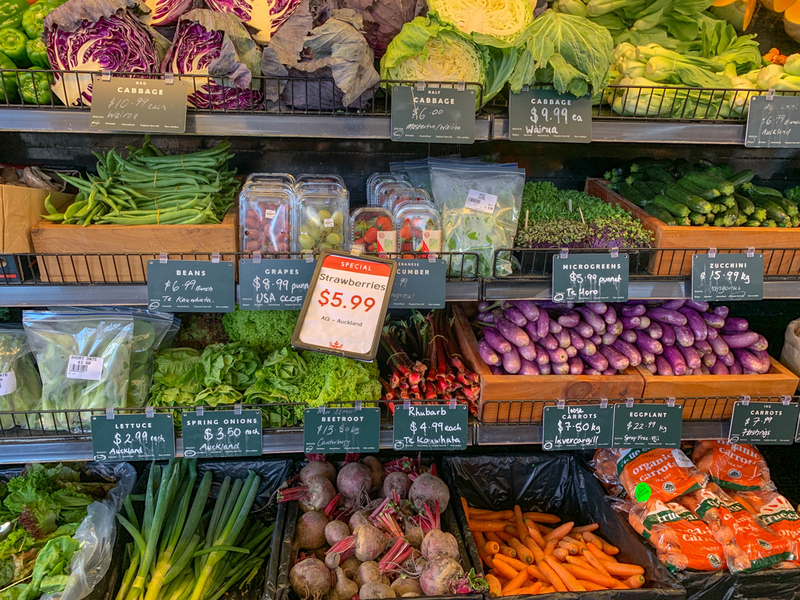 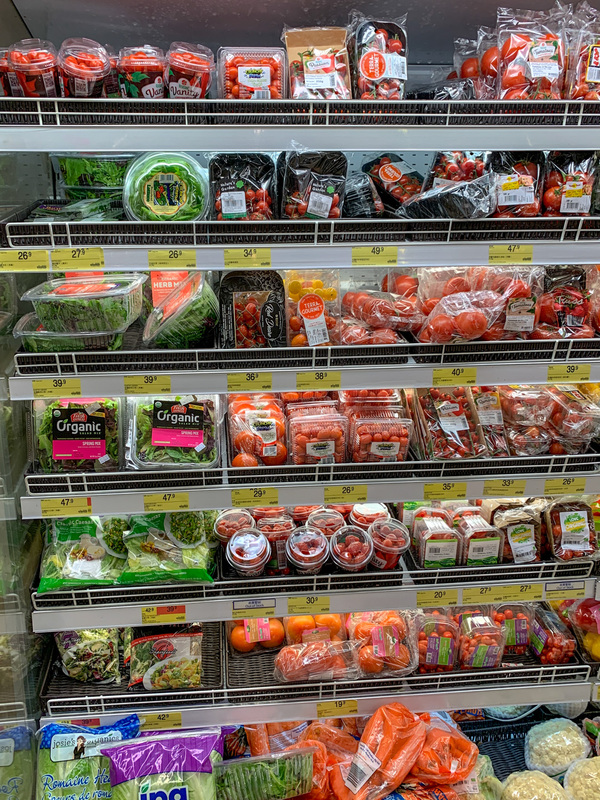 Here, the produce section is bigger. 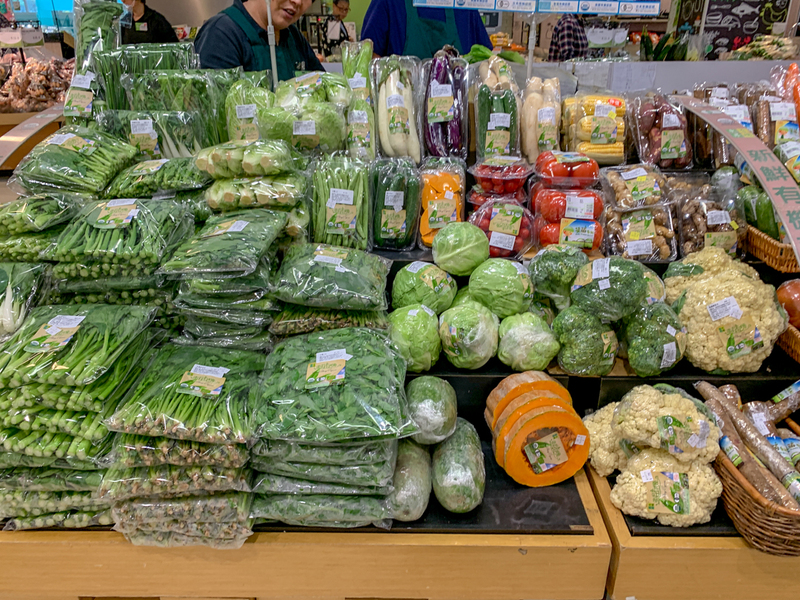 Apples, greens, mushrooms, and cabbage. 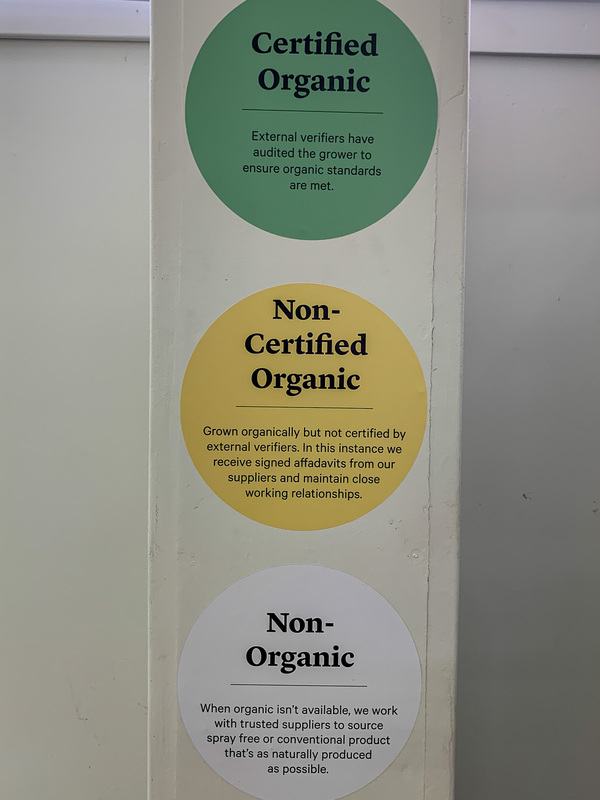 All certified organic. 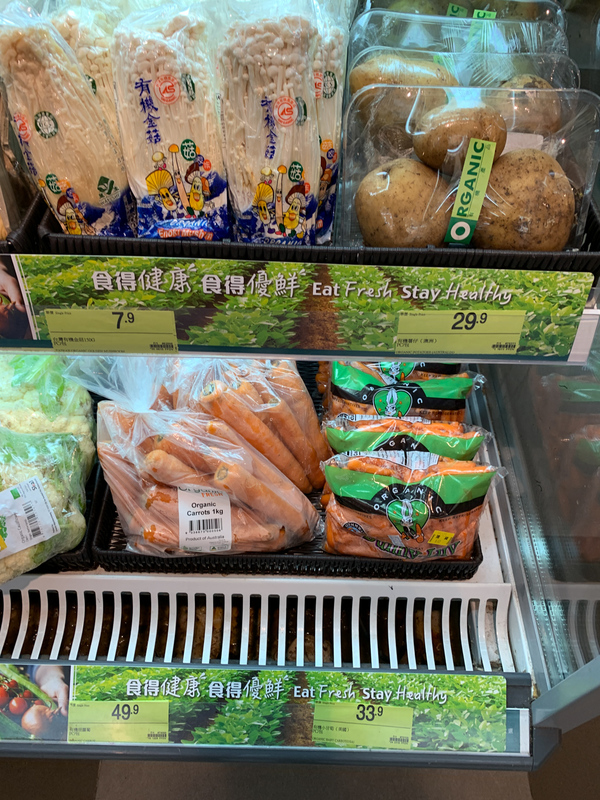 We got everything but the carrots and corn here. 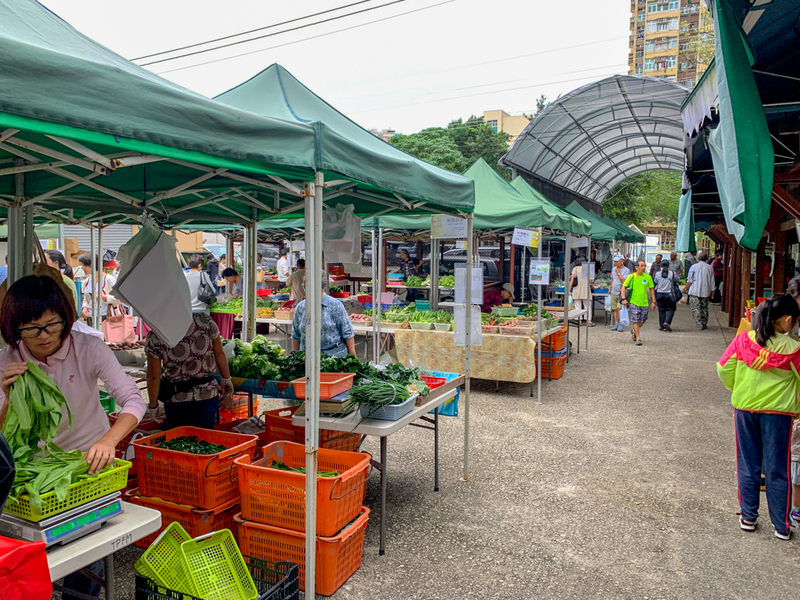 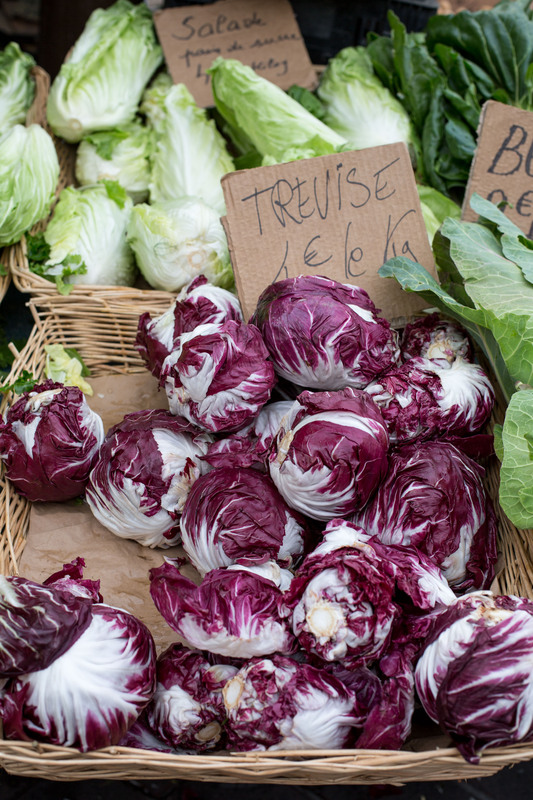 There are quite a few welcome markets all around Hong kong which make you hunt for organic produce so much easier. 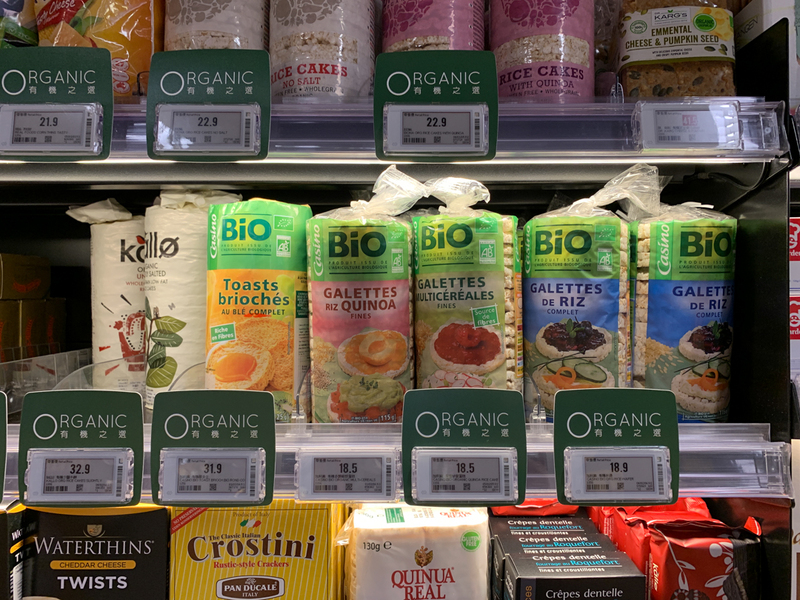 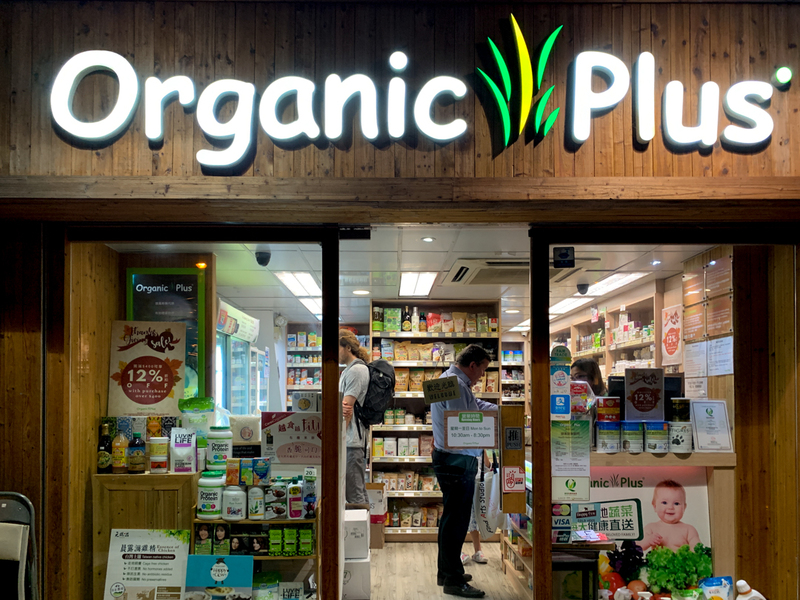 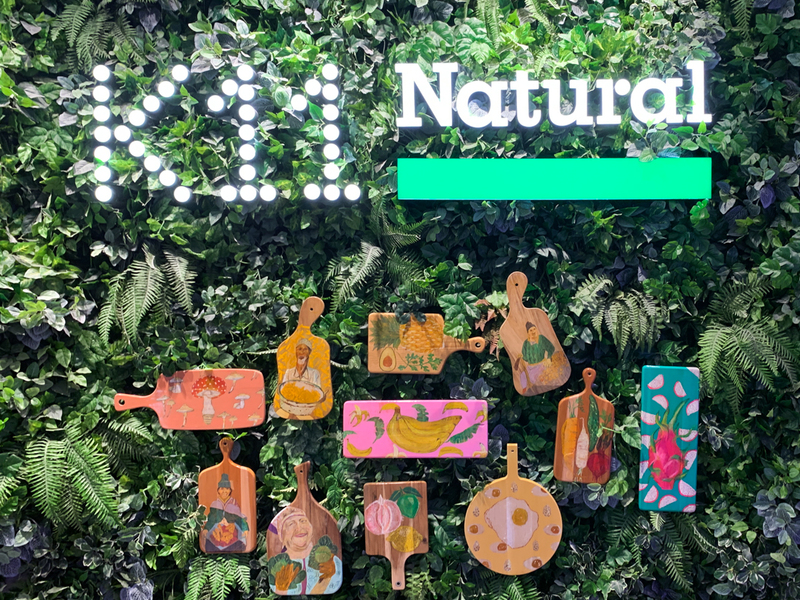 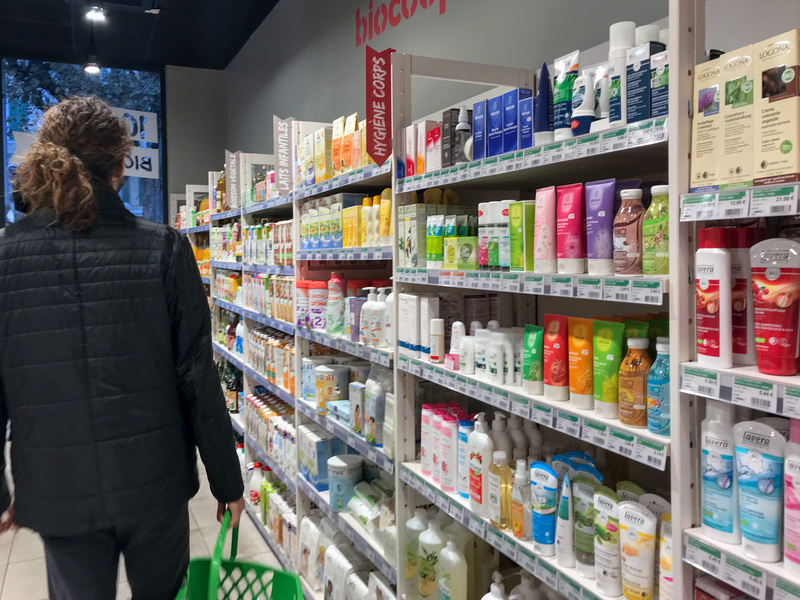 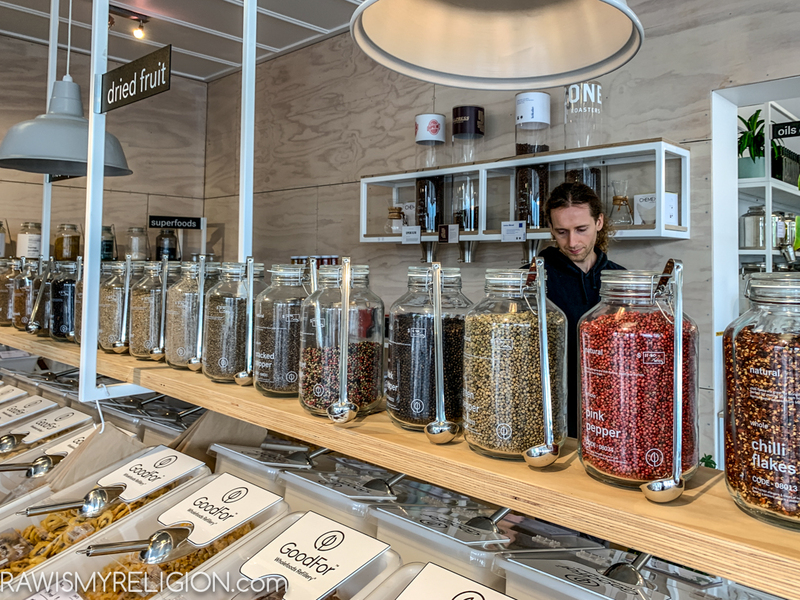 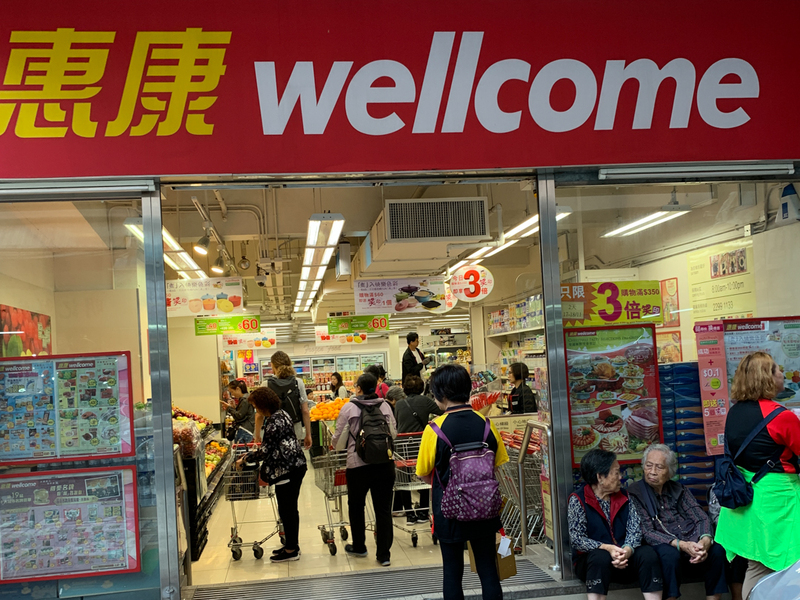 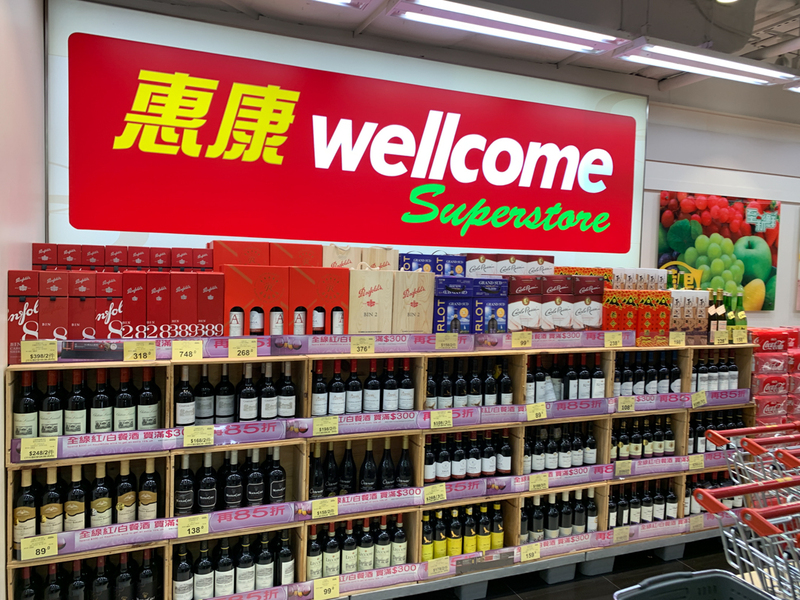 But keep in mind, not every single Wellcome Store will have organic products. 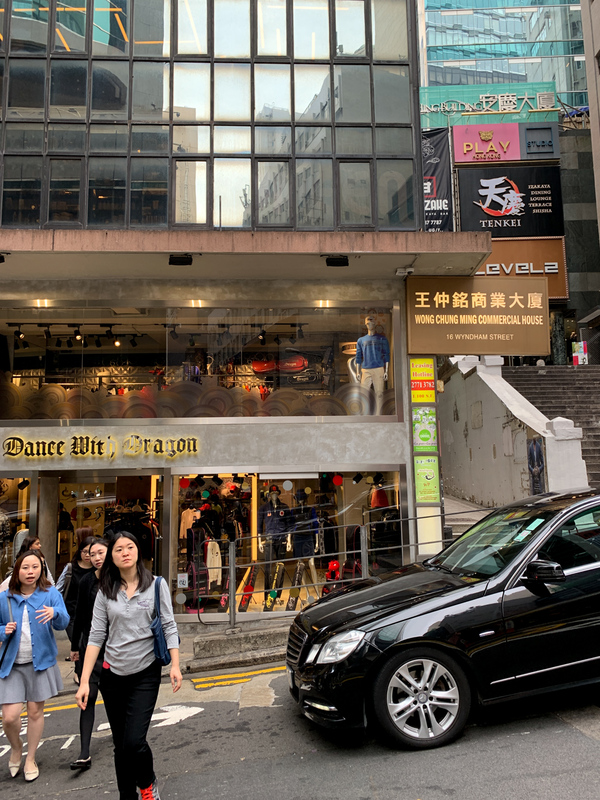 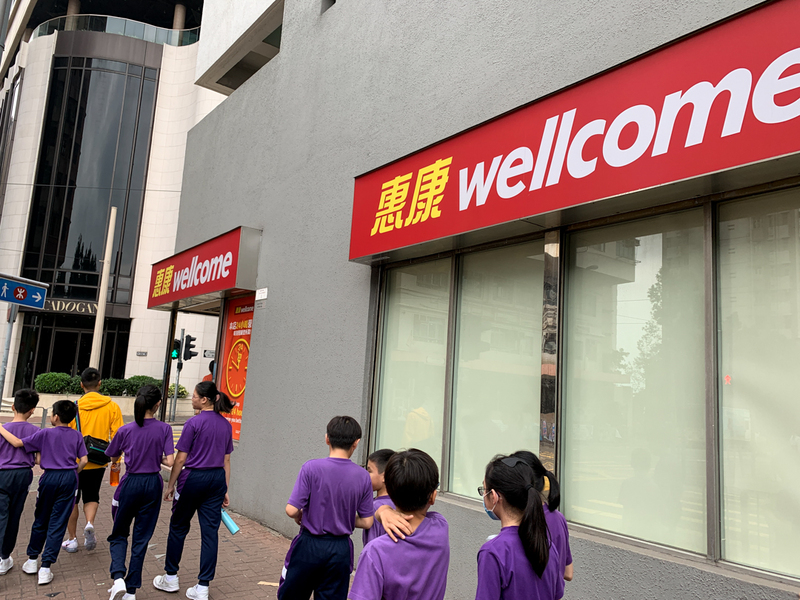 Today we went to this one near the Kennedy Town Train Station. 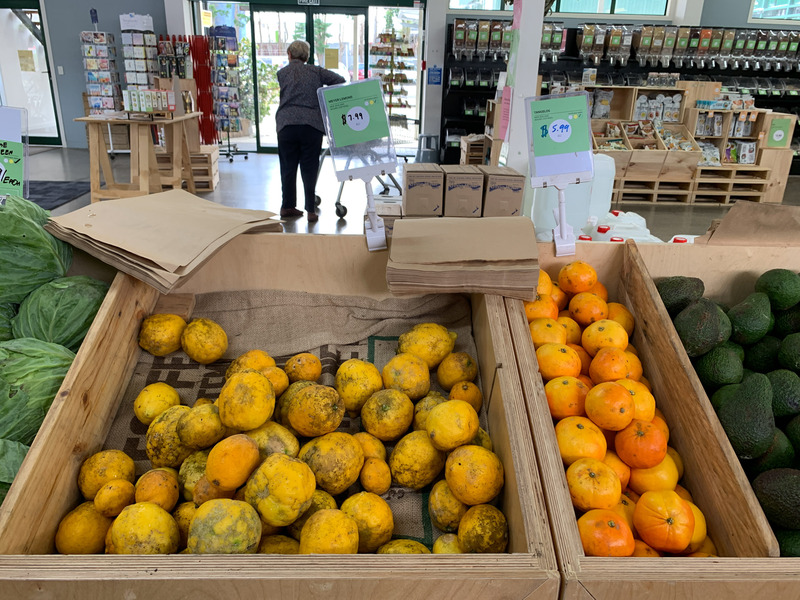 They have some organic greens, apples and oranges, dates. 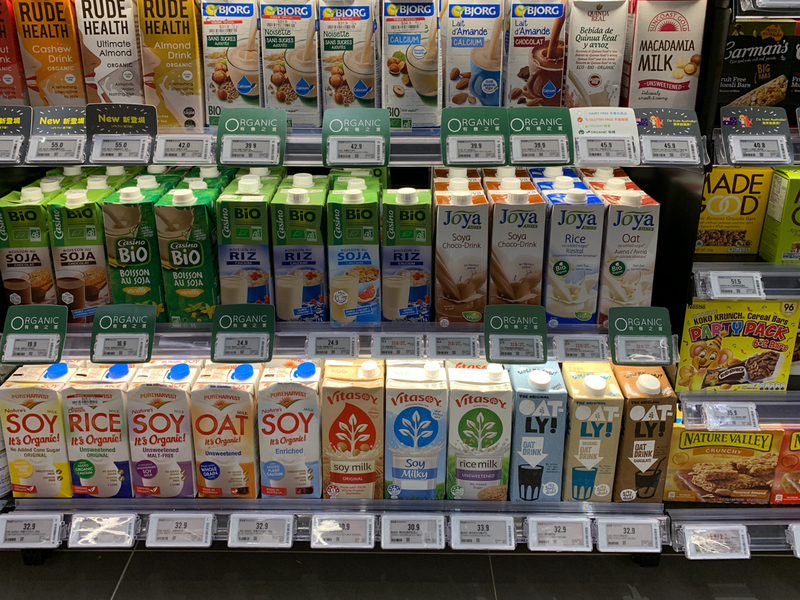 I also spotted vegan milks and organic coffee. 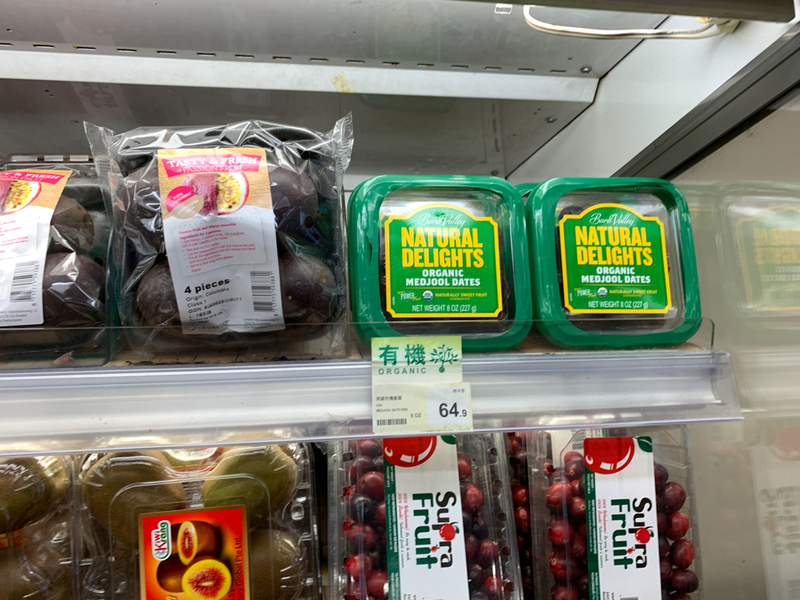 Nice juicy medjool dates. 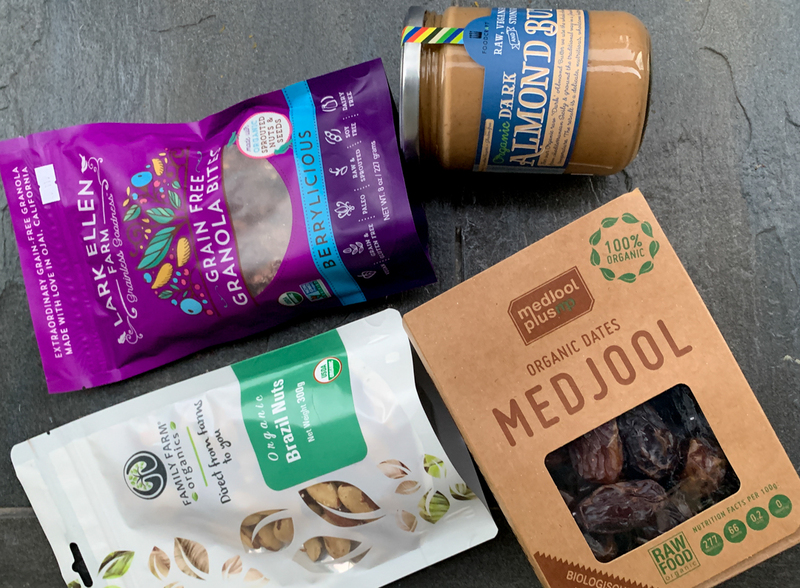 A perfect snack on the go. 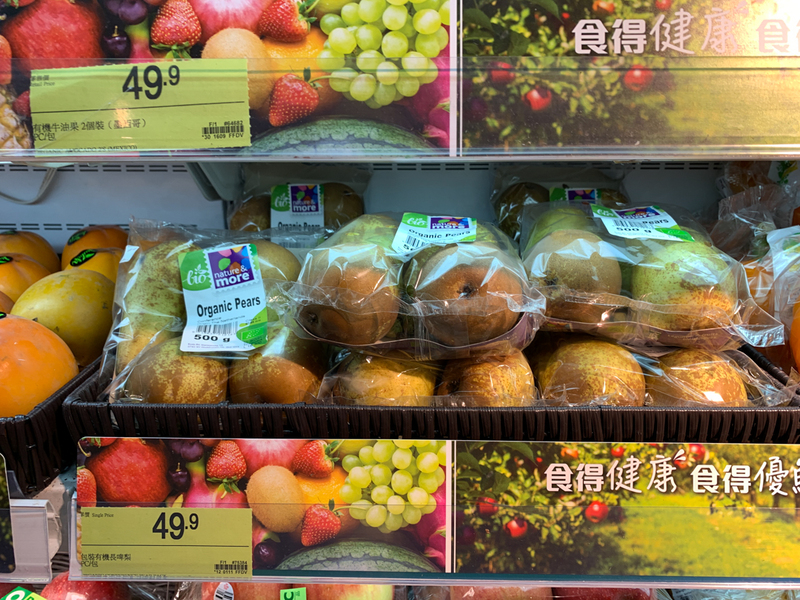 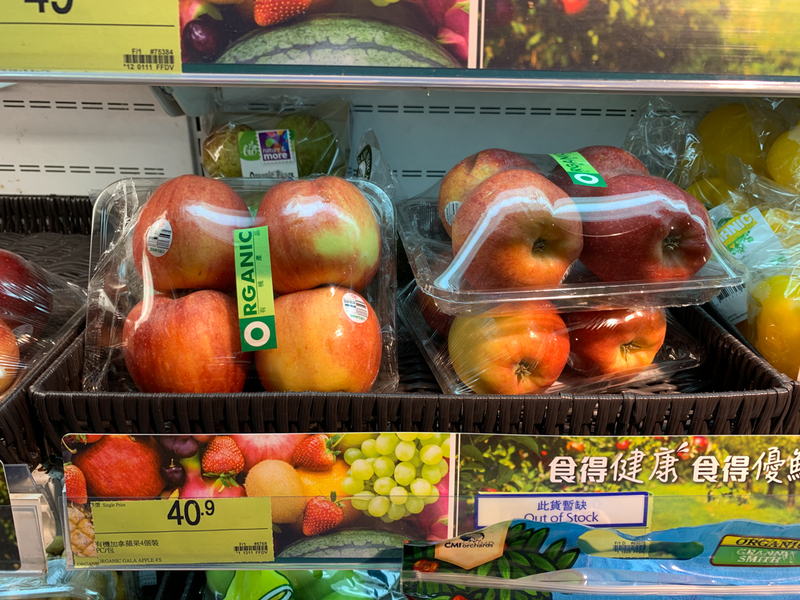 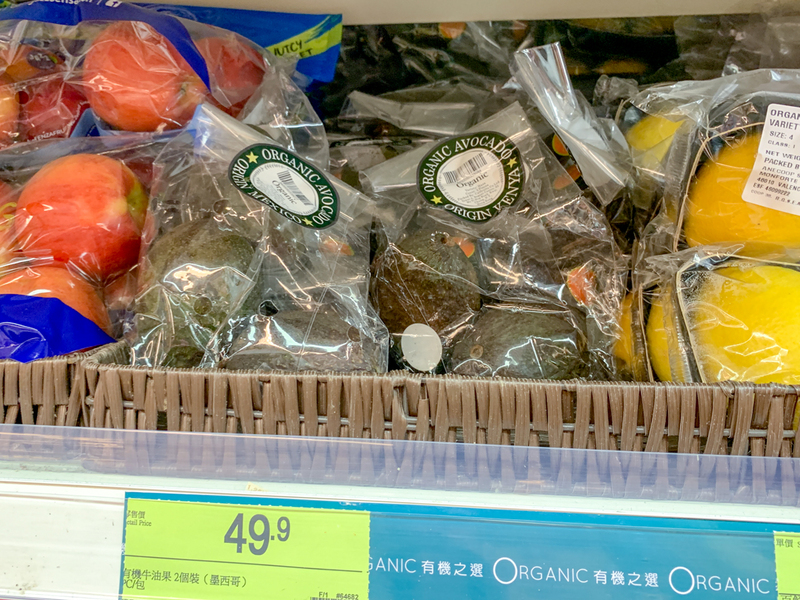 3 organic apples fo 37 HKD (4€/$5). 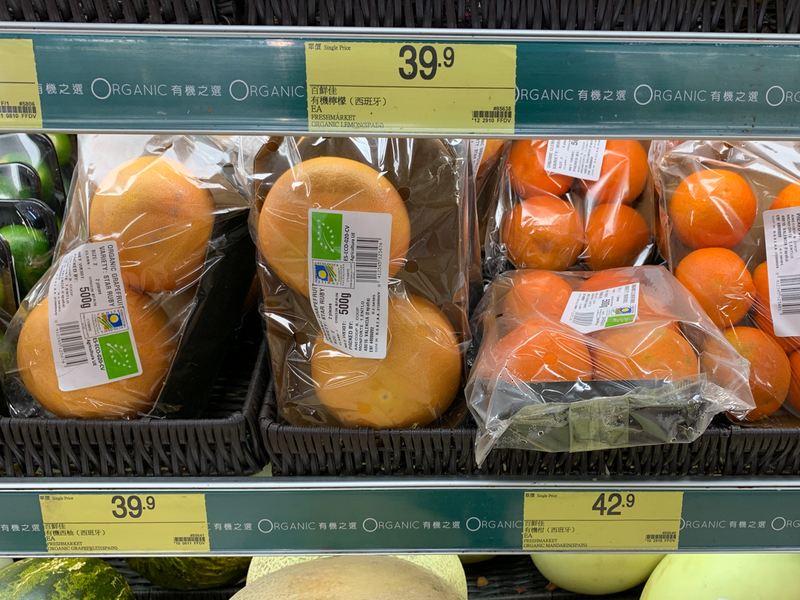 8 organic oranges for 52 HKD (5.8€/$6.6). 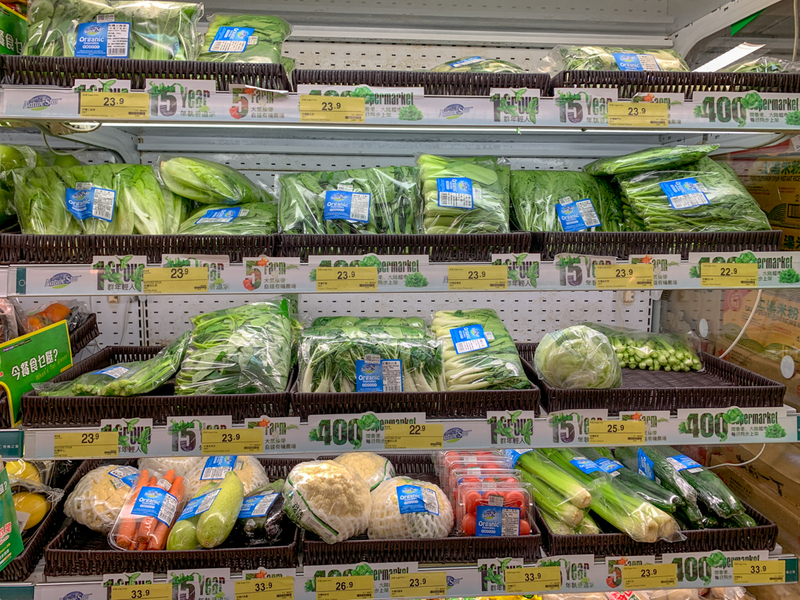 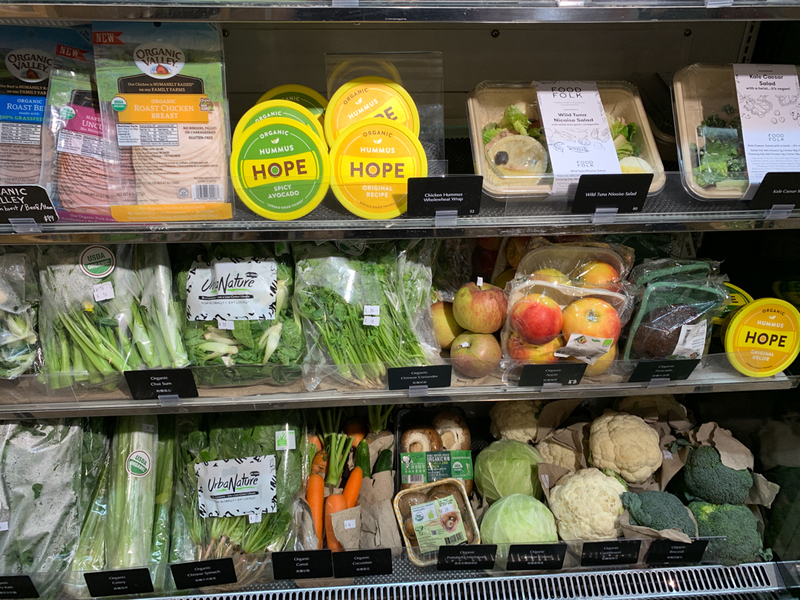 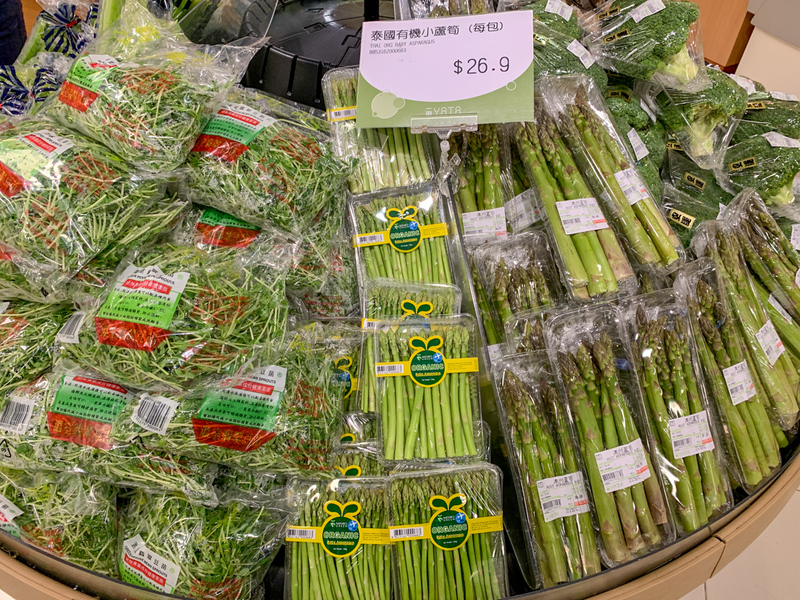 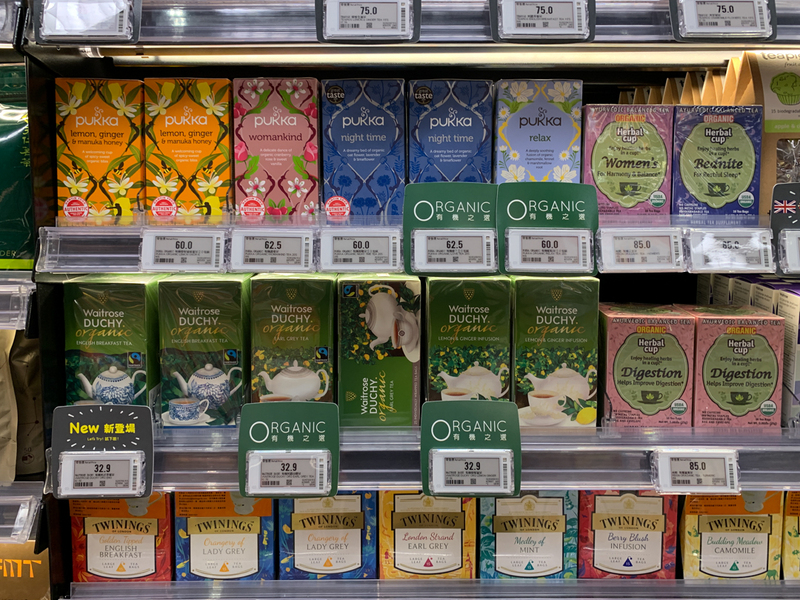 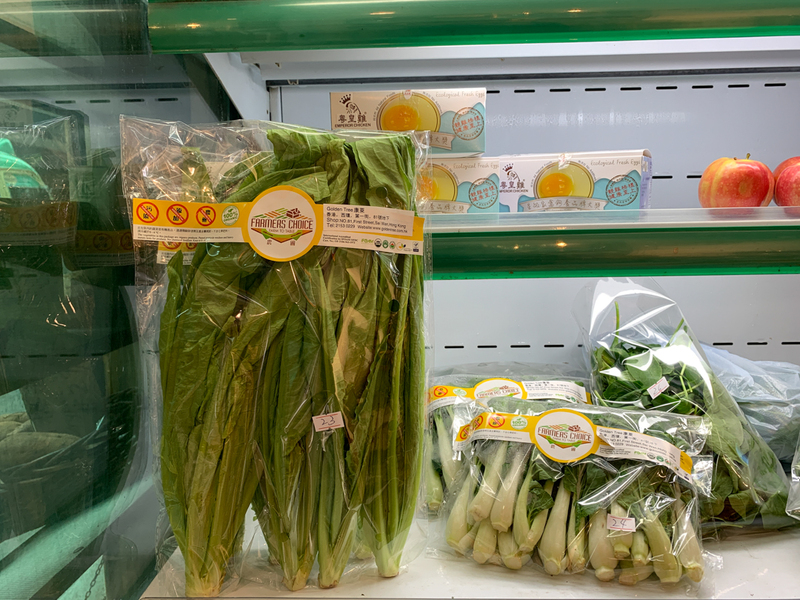 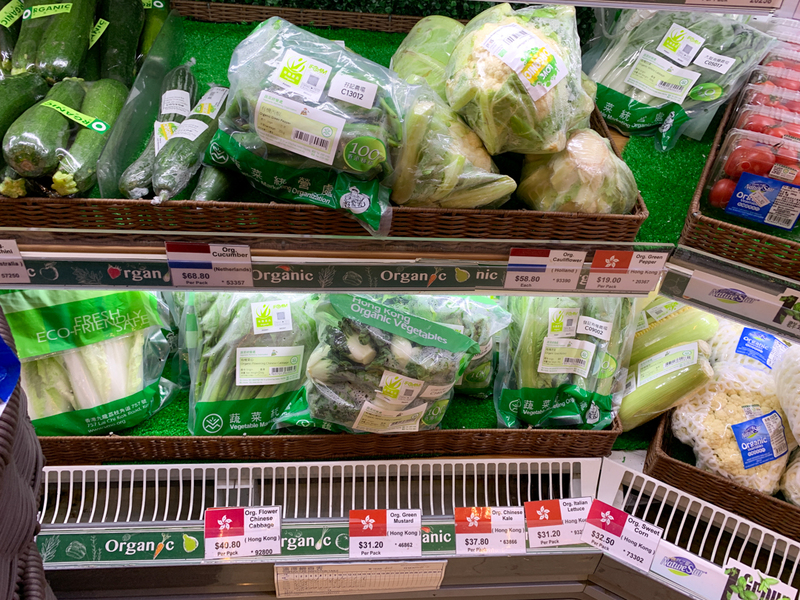 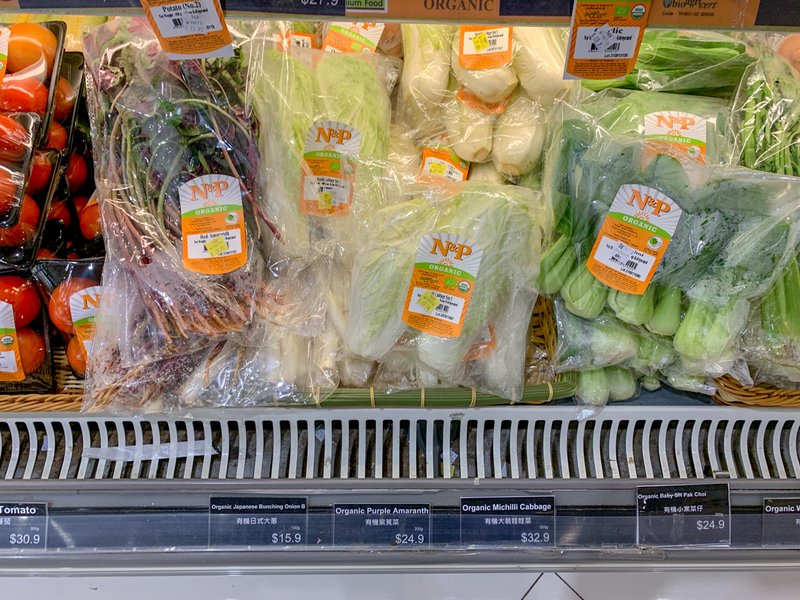 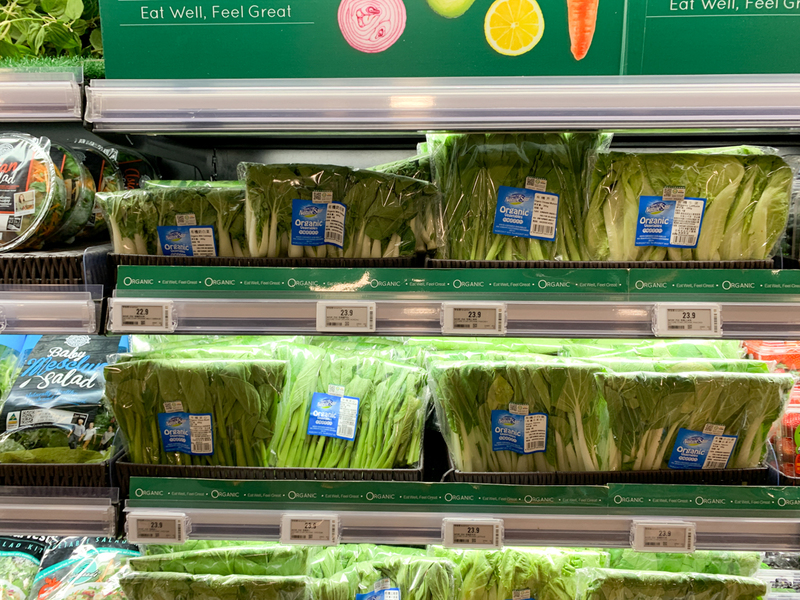 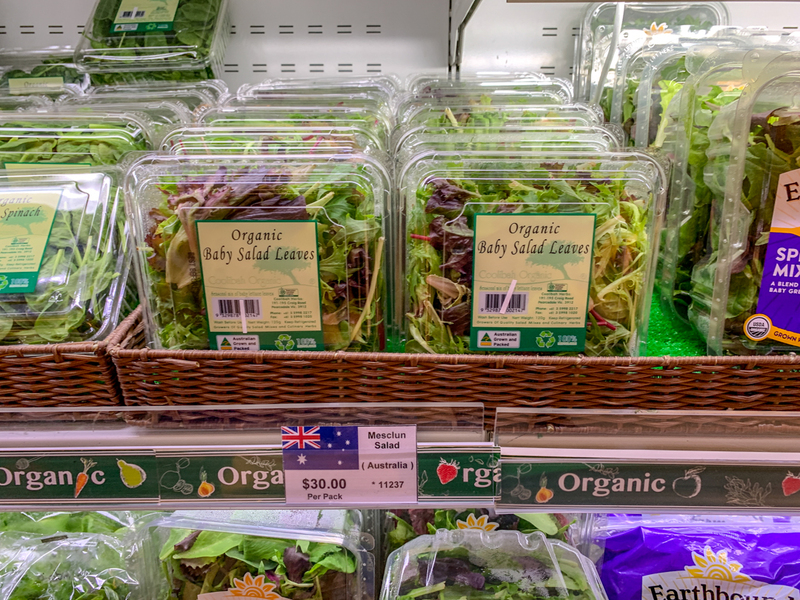 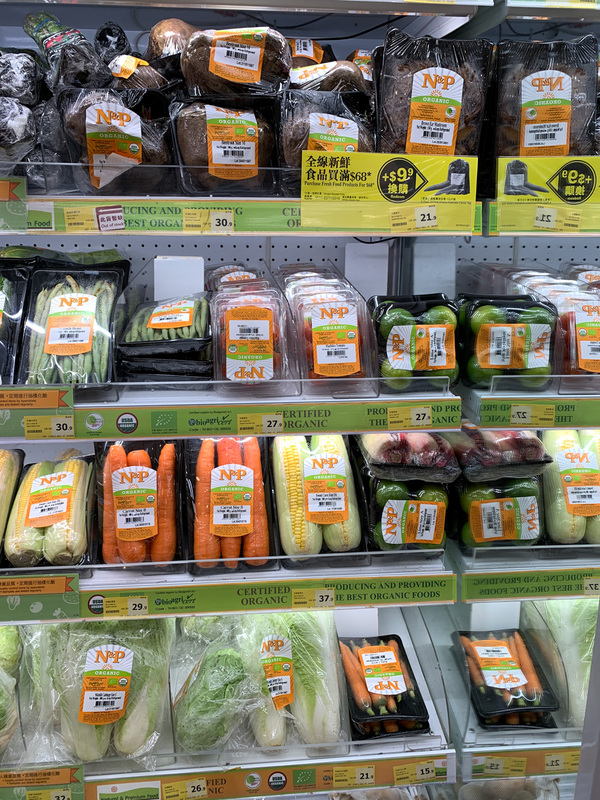 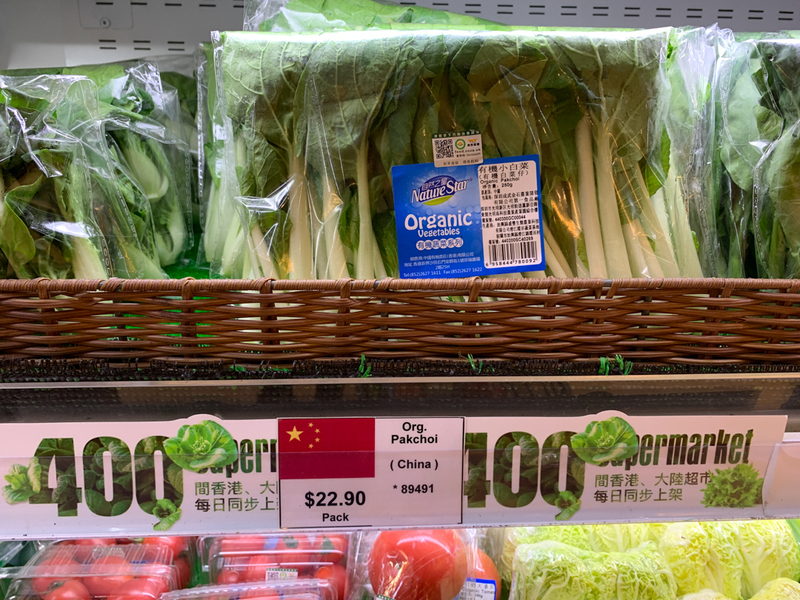 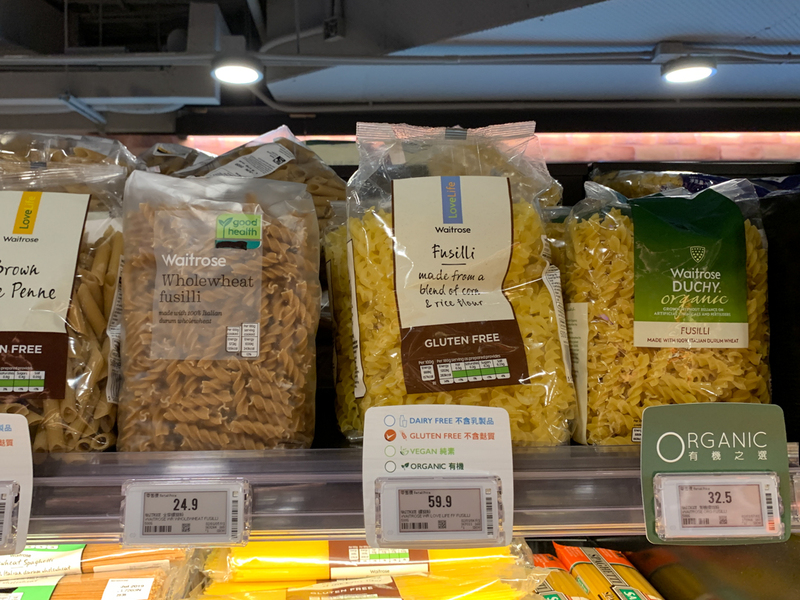 All the greens in the middle with the sticking out price tag are organic and around 30 HKD. 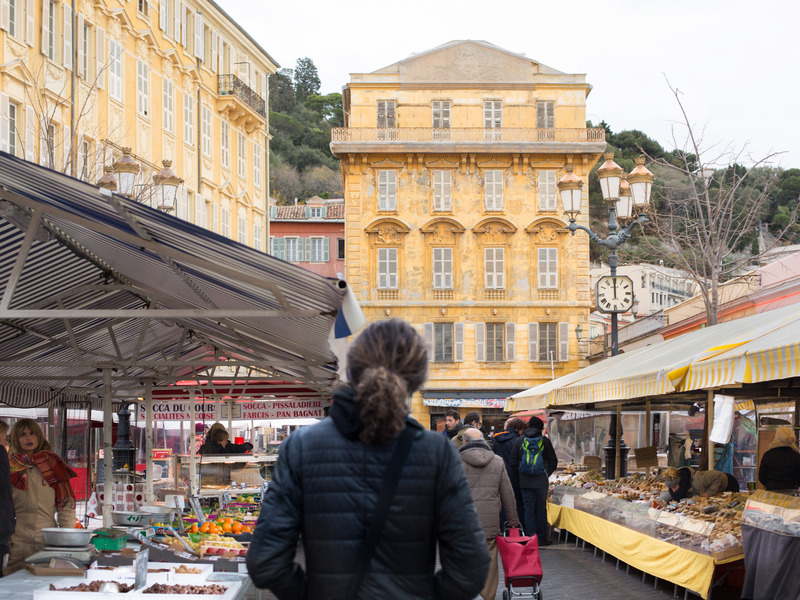 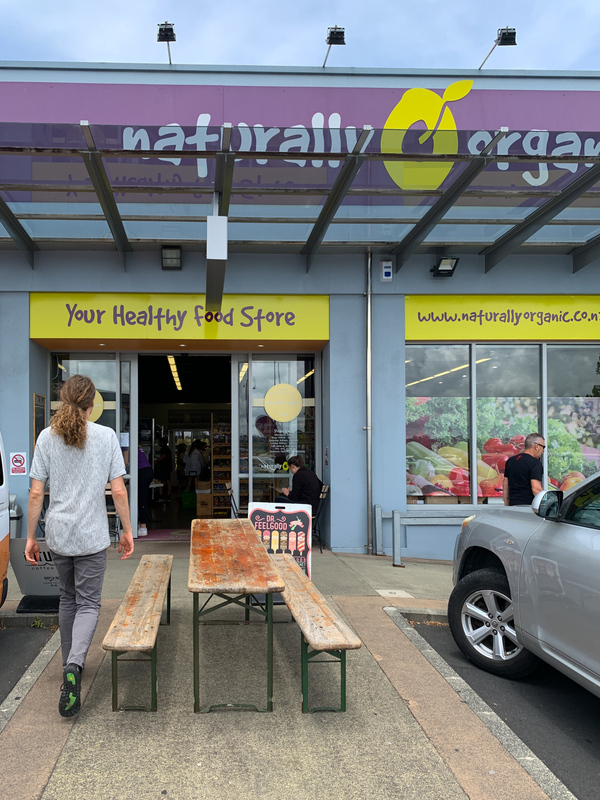 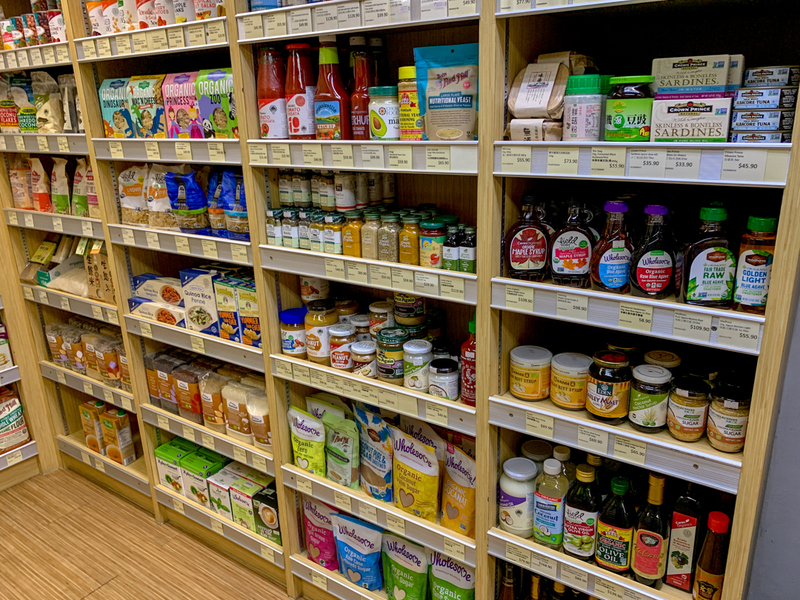 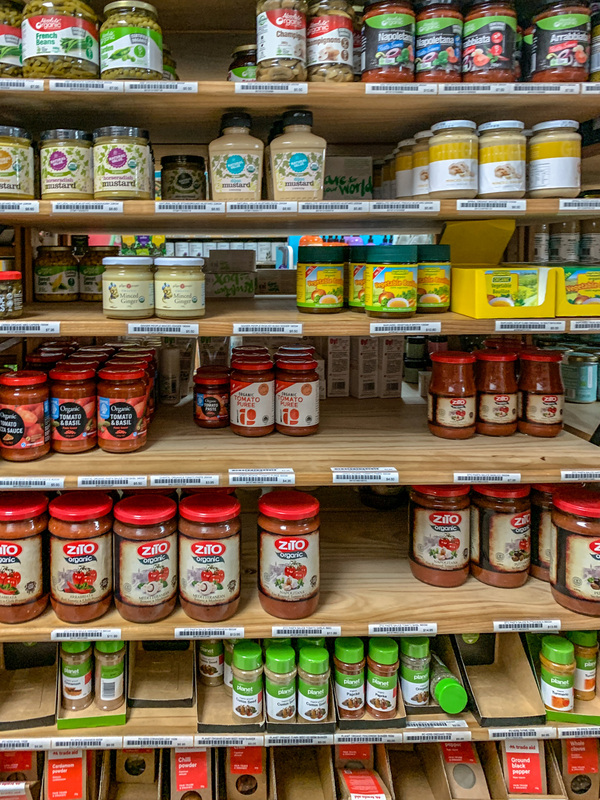 The stores with NO organic products. 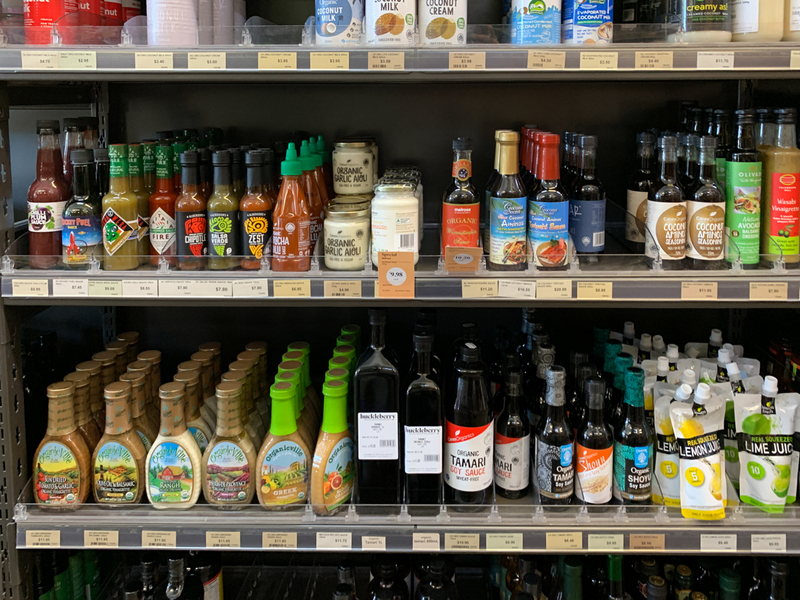 They have a little of almost everything. 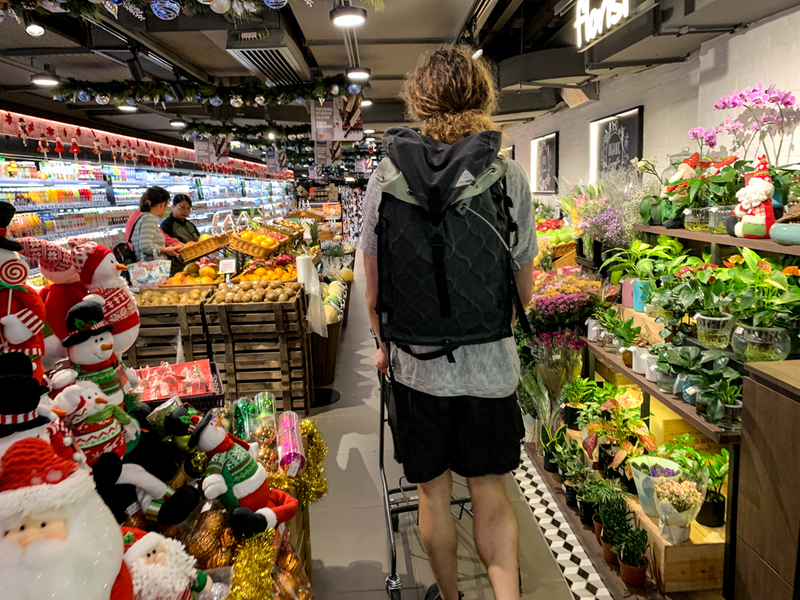 We went to the Great Food Hall with a bigger backpack as we new they might have the best organic produce in town besides the farmers’ markets which were not happening that day anyway. 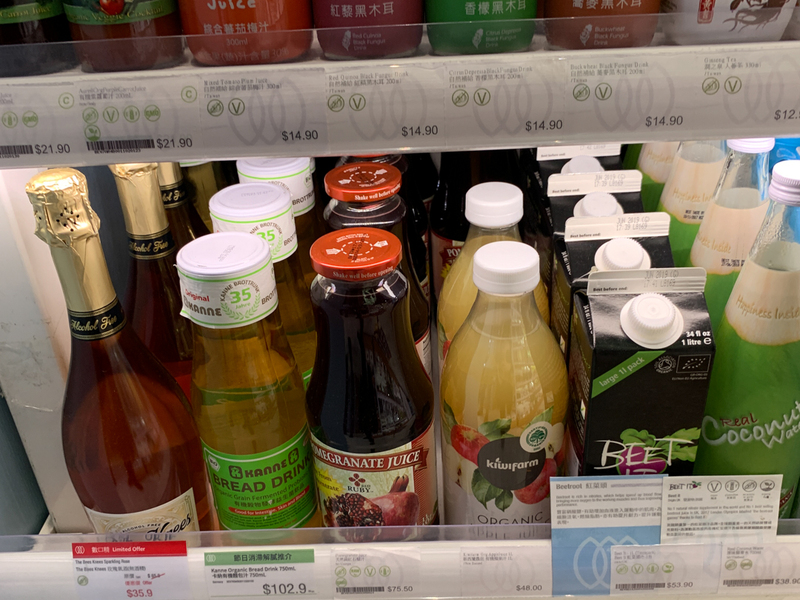 The prices are as expected for imported foods astronomical. 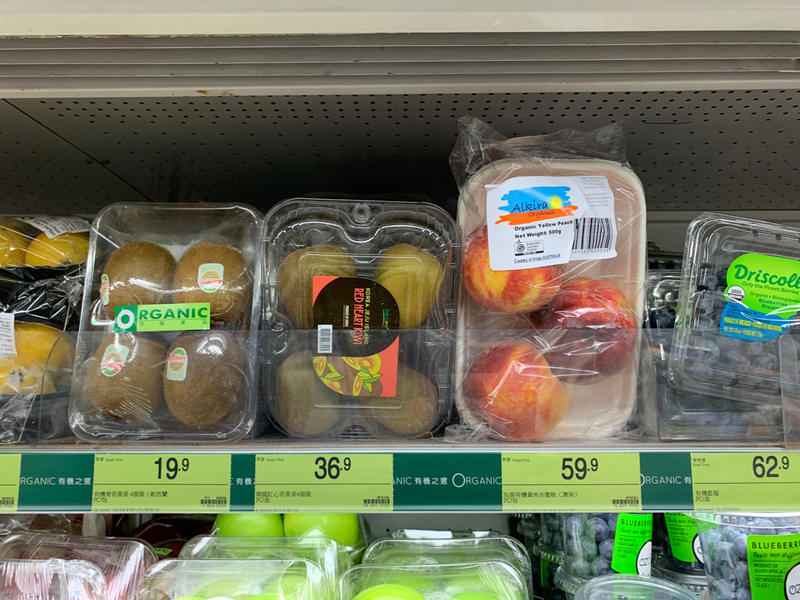 A little strange were the organic bananas for 110HKD (12€/$14) from Australia, don’t they get imported into Germany a well? 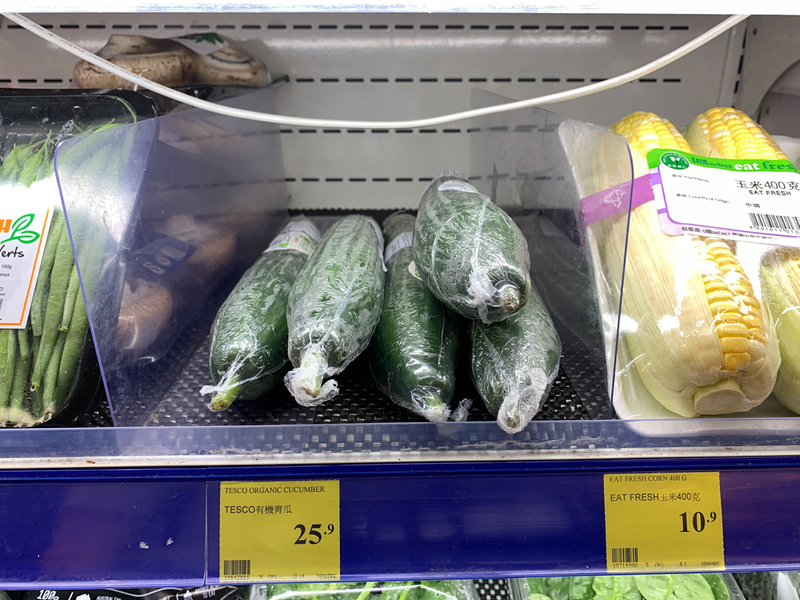 Why are they in Germany around 2€ then. 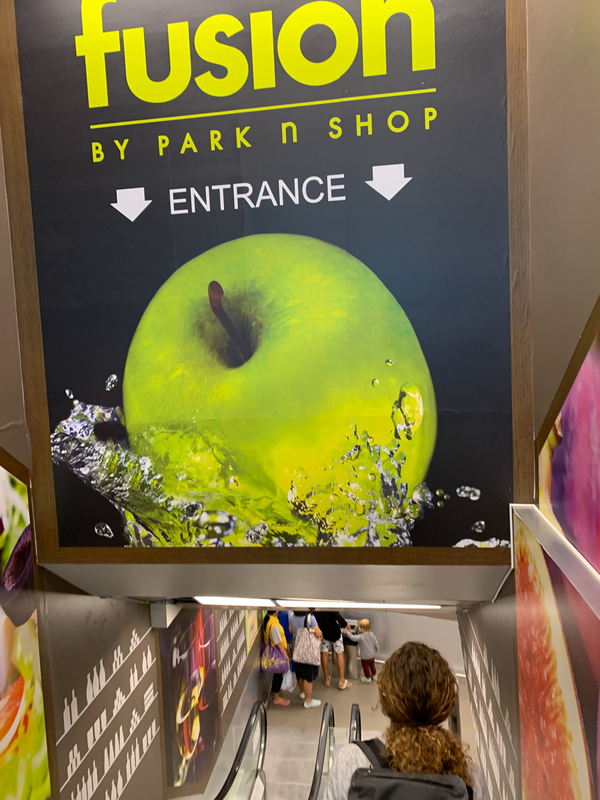 It’s hidden in the Malls basement, ask for directions if you feel lost or check out the map in the mall. 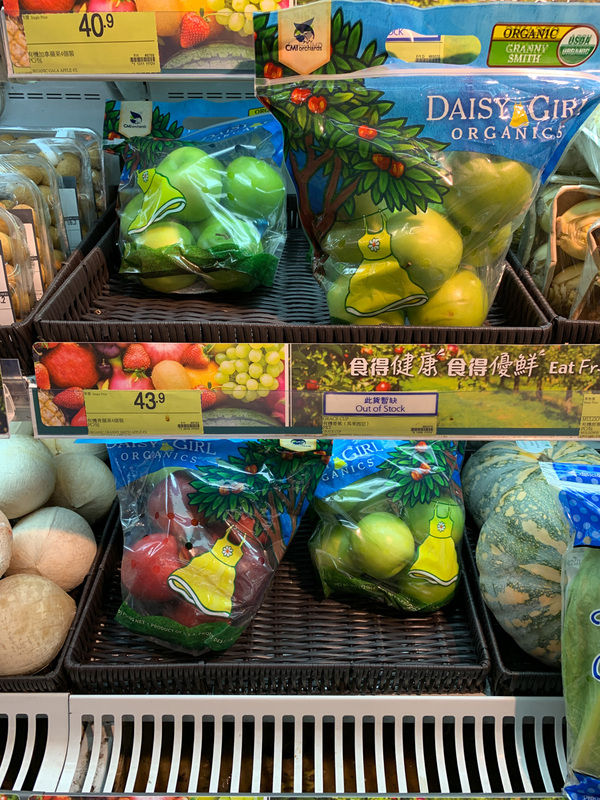 Here is the fruit display, unfortunately nothing organic in here. 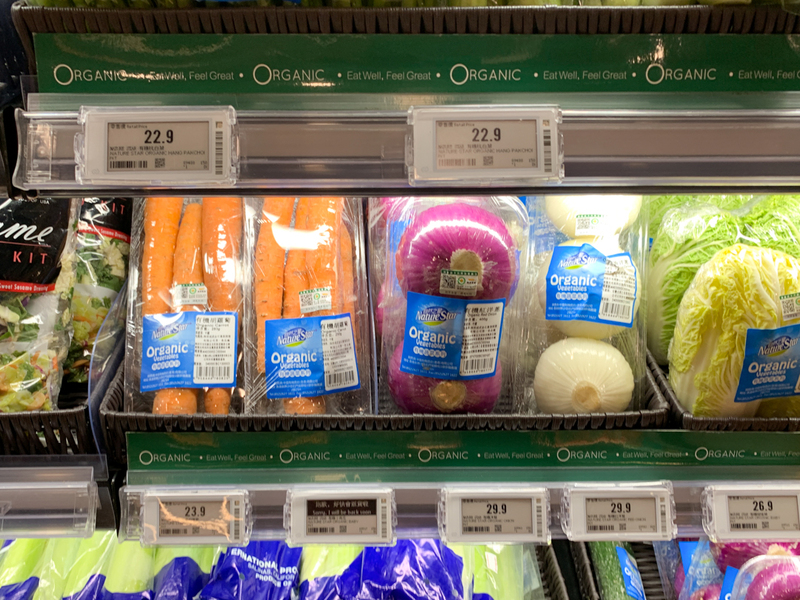 Most of the organic produce is actually in the fridge in the back. 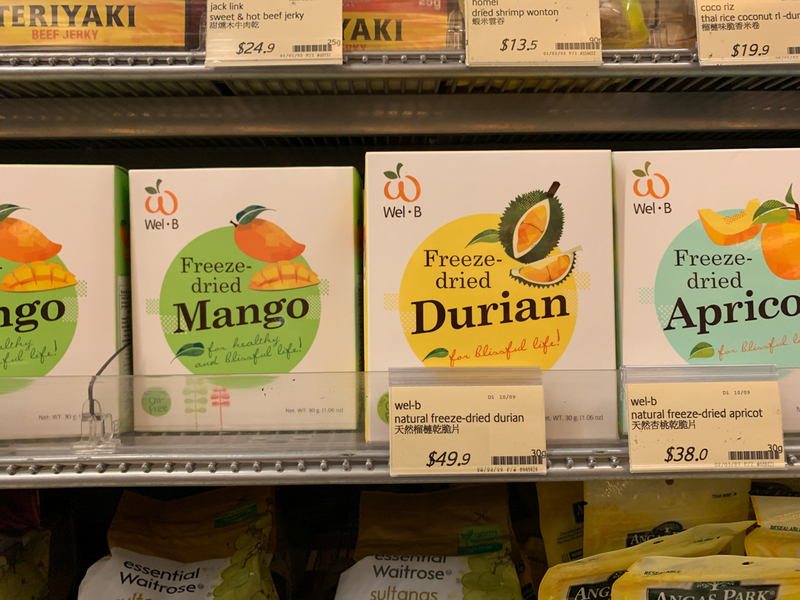 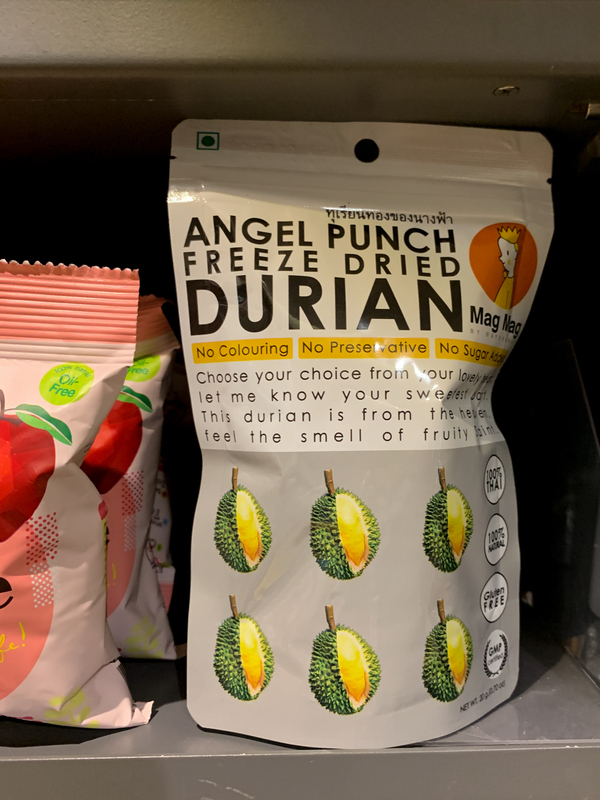 Here is also a conventional product that caught my eye, never seen a freeze-dried durian being certified organic, let me know if you have. 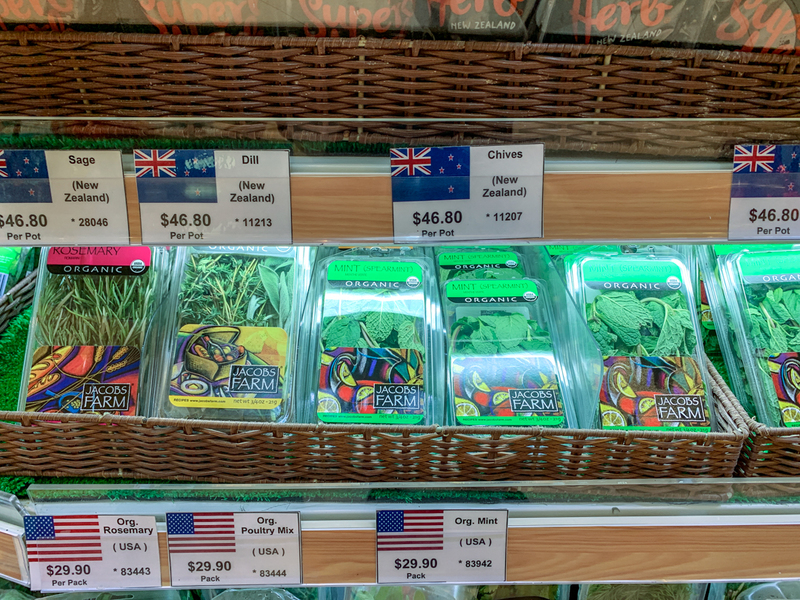 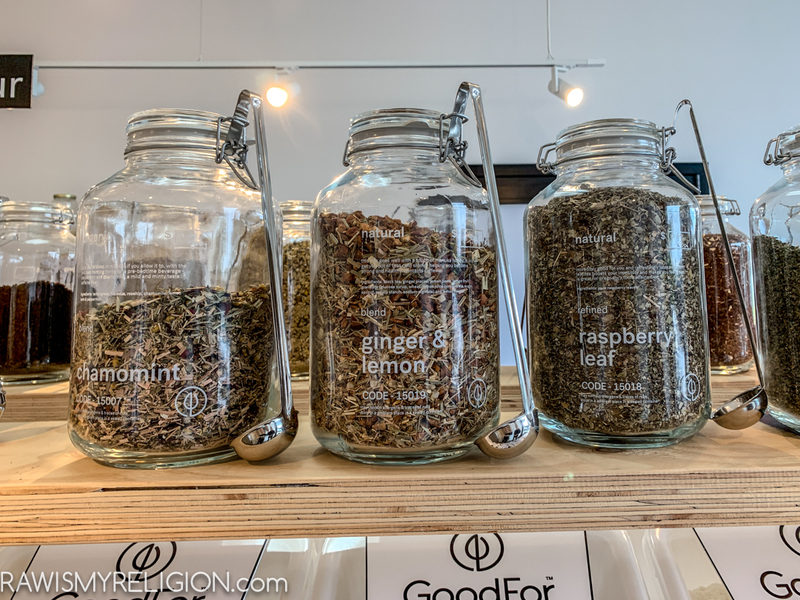 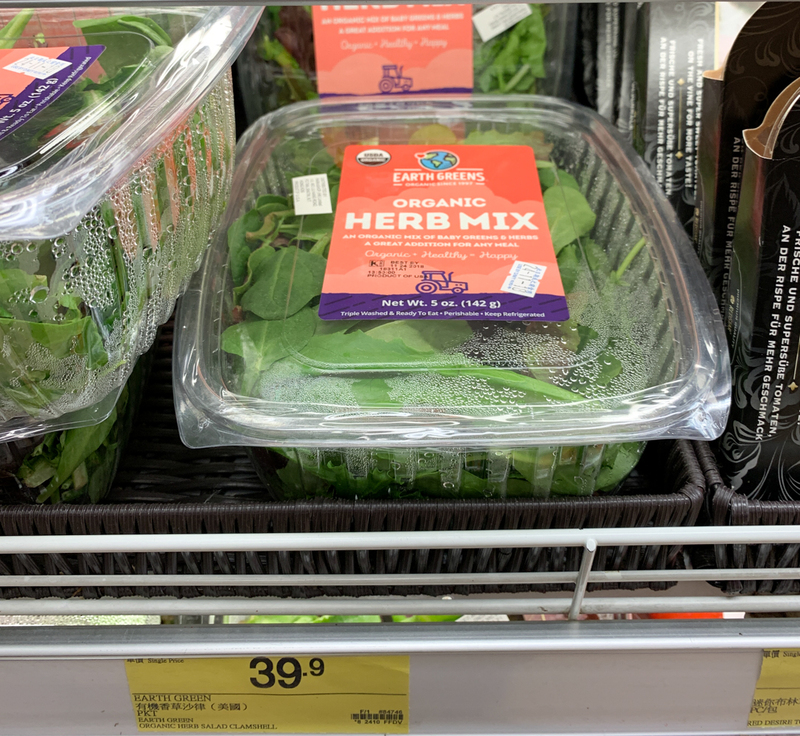 Some organic herbs, herbs are definitely worth buying organic as all greens. 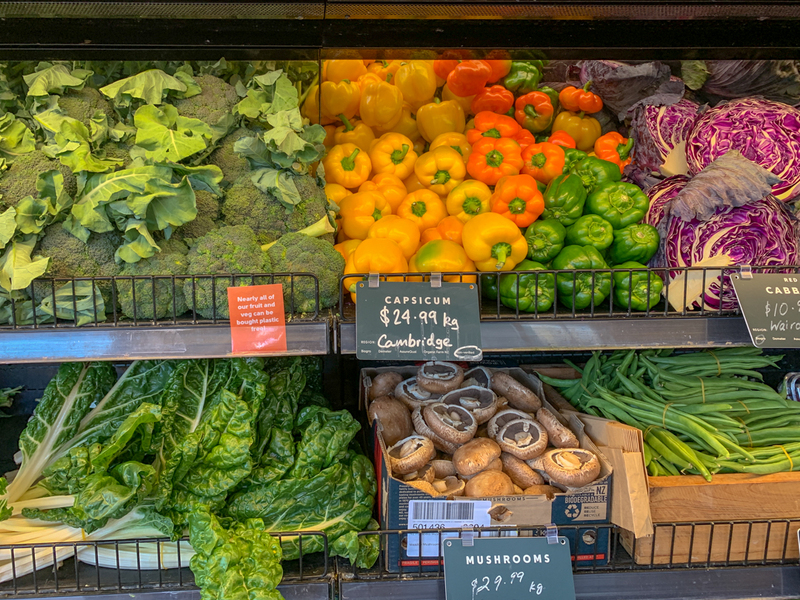 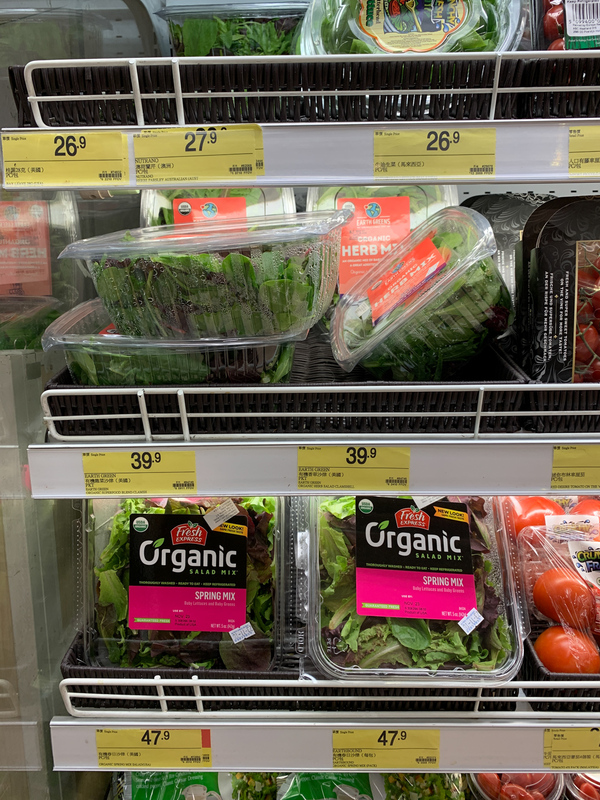 Here are the greens, I tried to catch the prices so you can see how much the produce is. 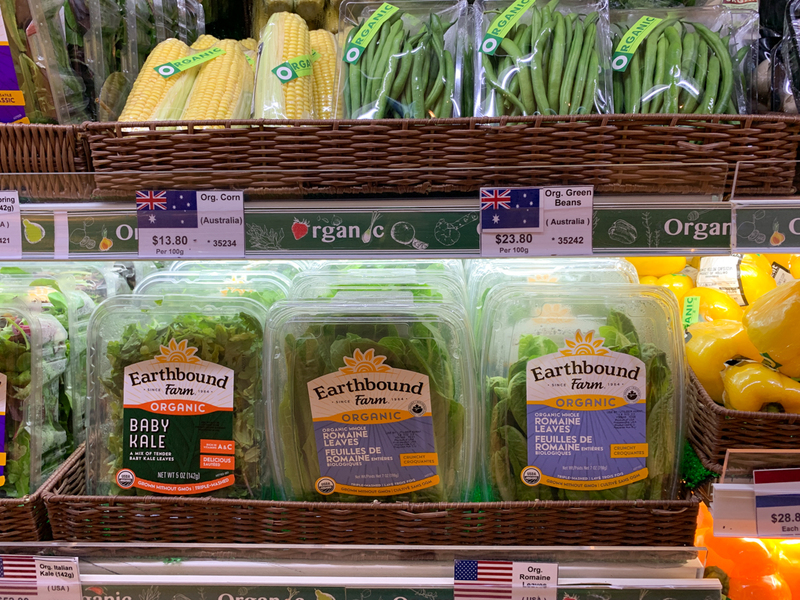 The Earthbound Farm greens were 52HKD. 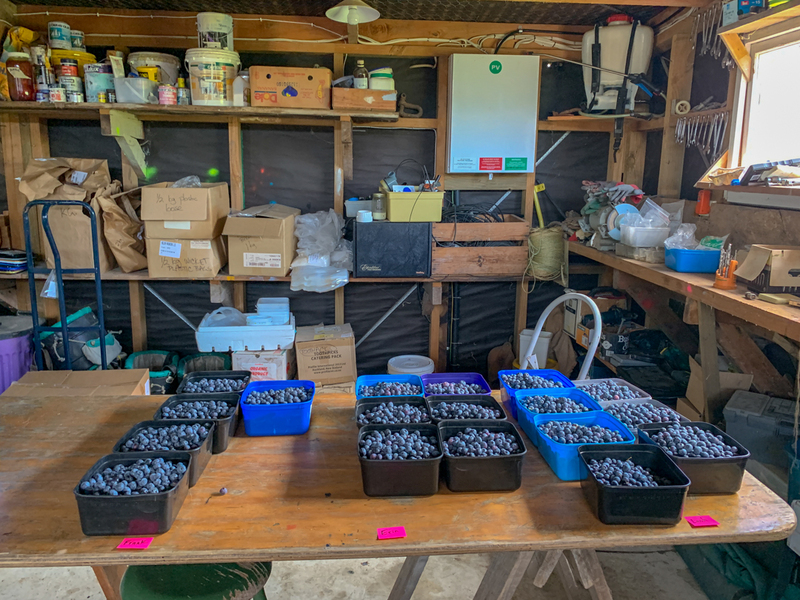 They had lots of blueberries. 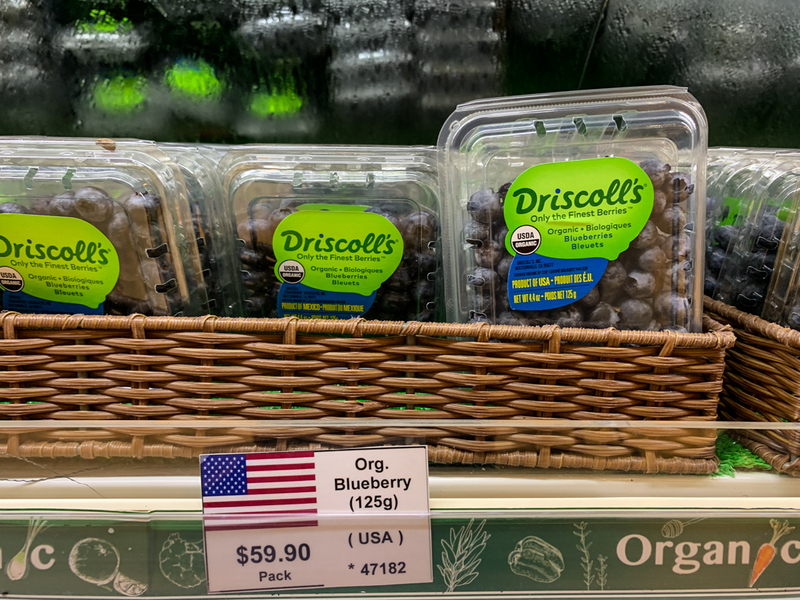 These giant non-organic berries were crazily huge, the organic once in the background were not small either. 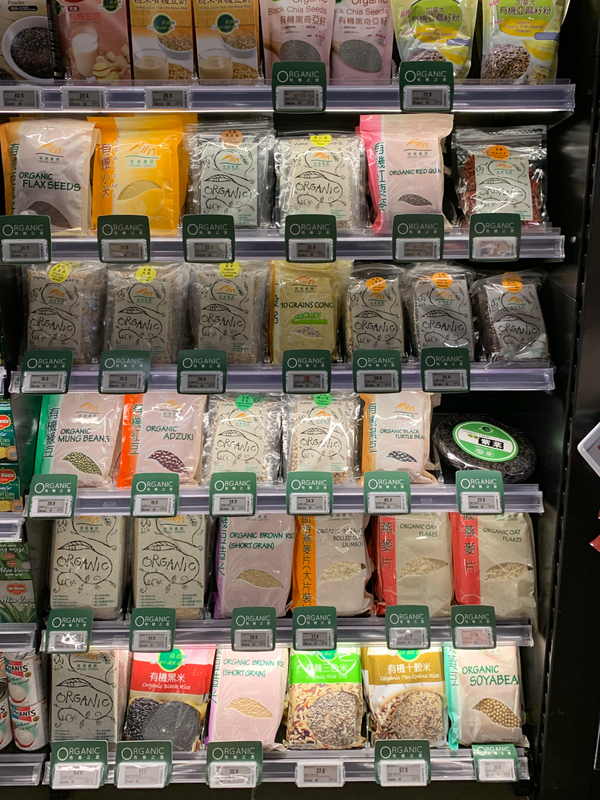 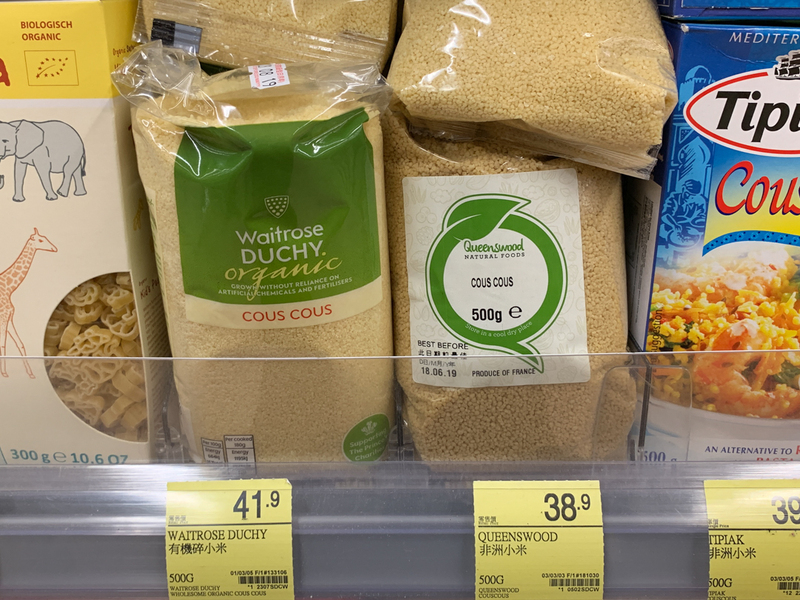 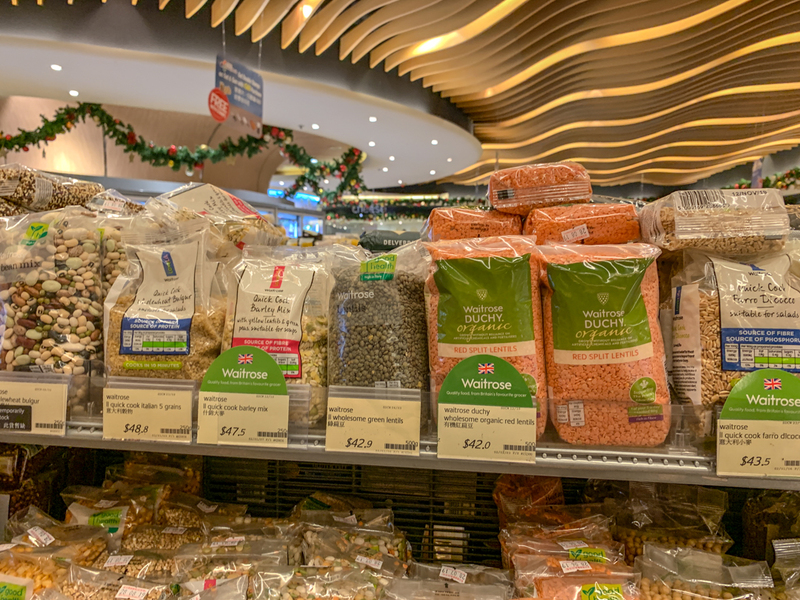 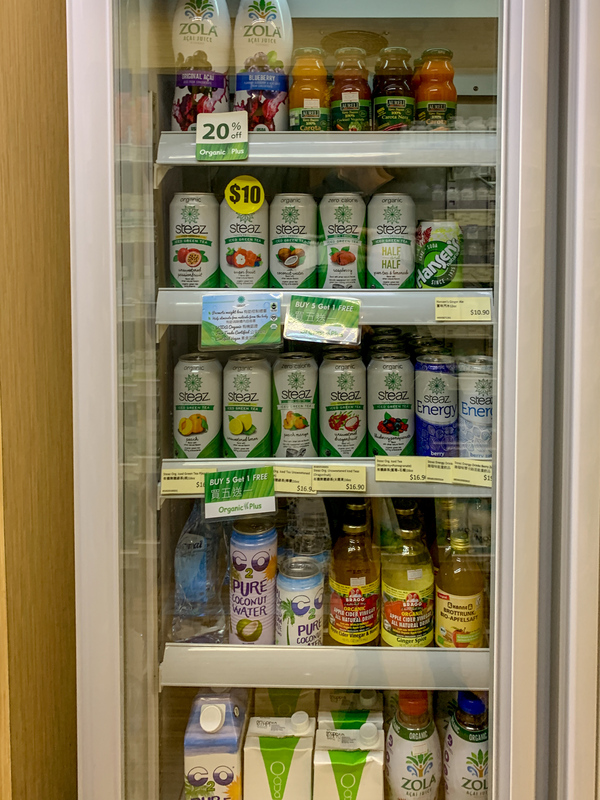 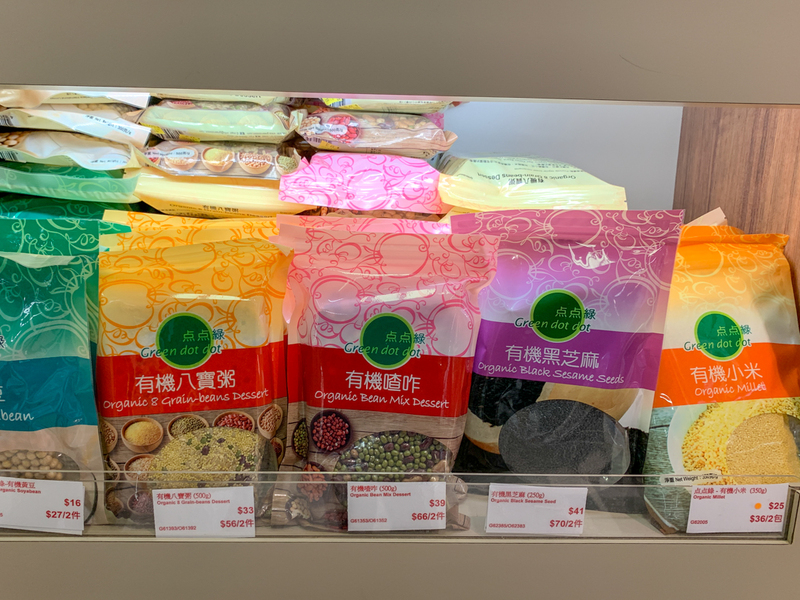 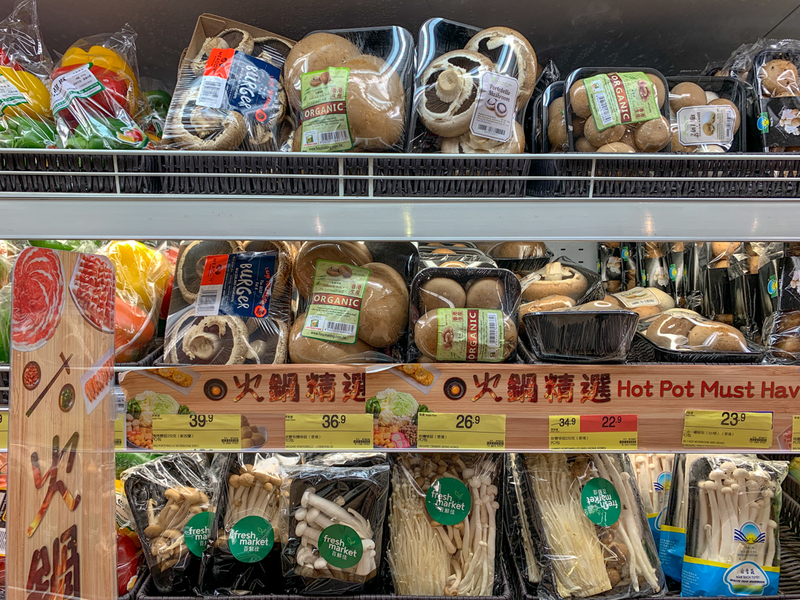 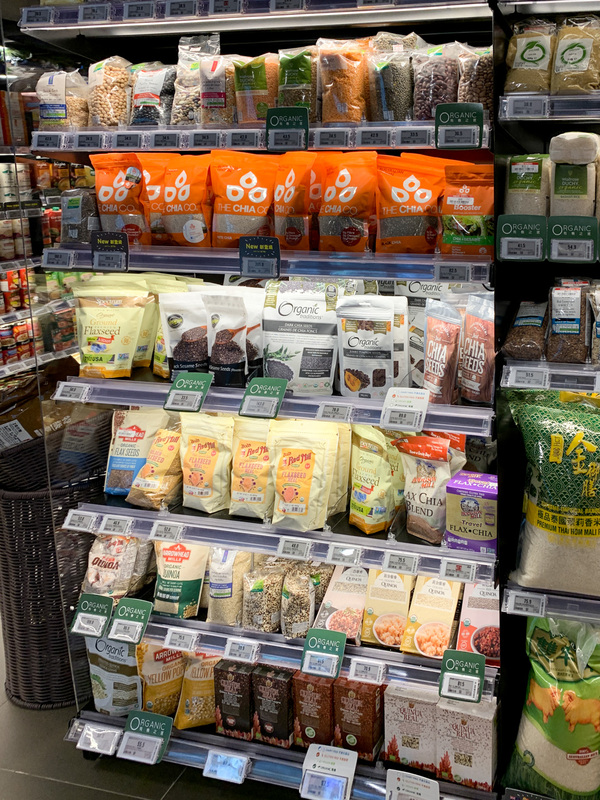 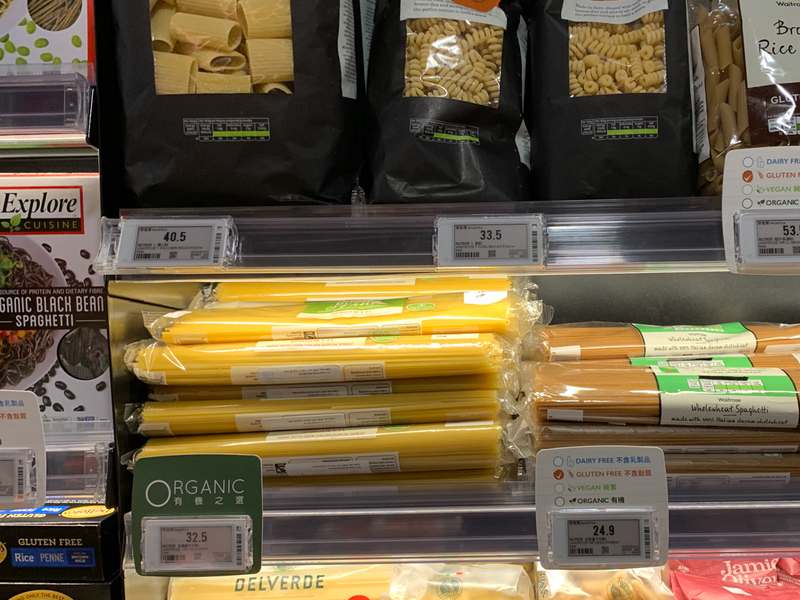 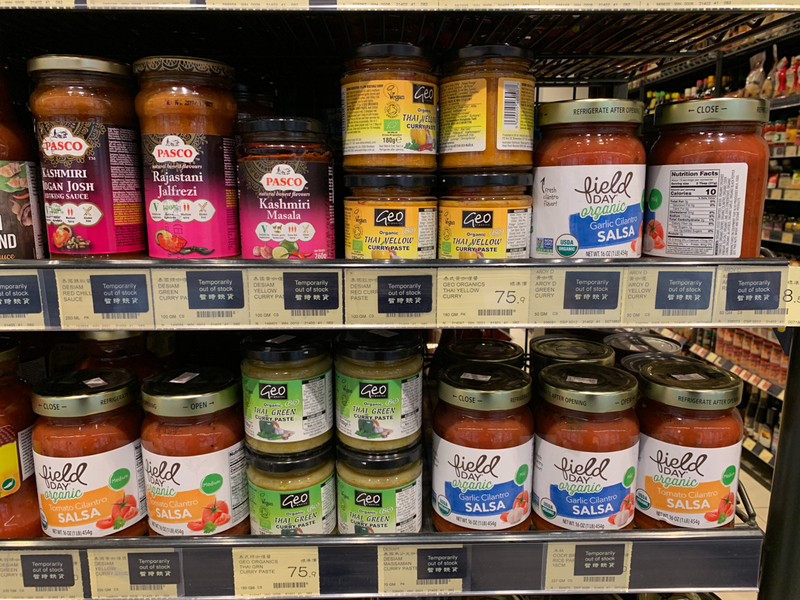 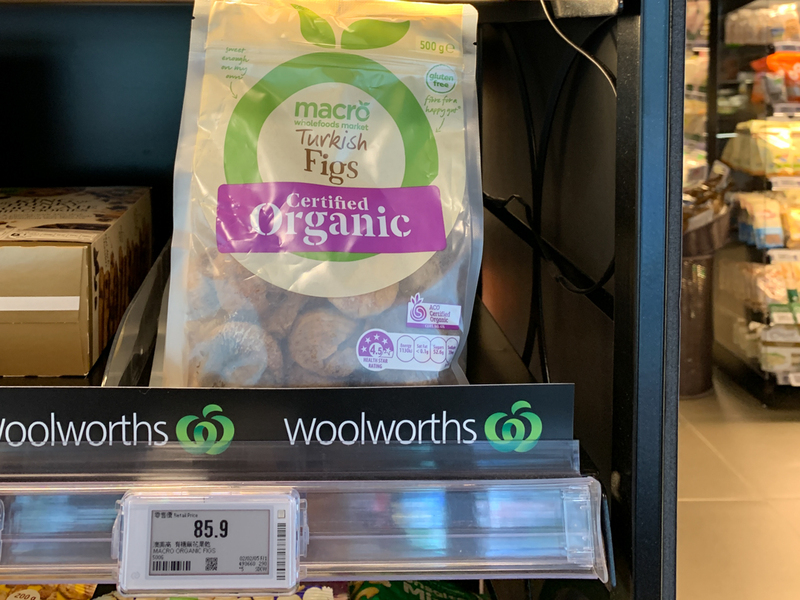 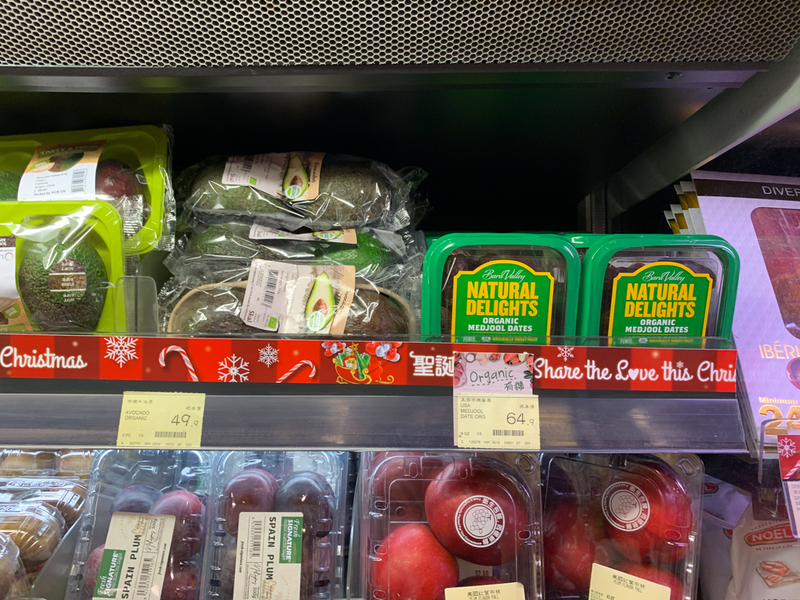 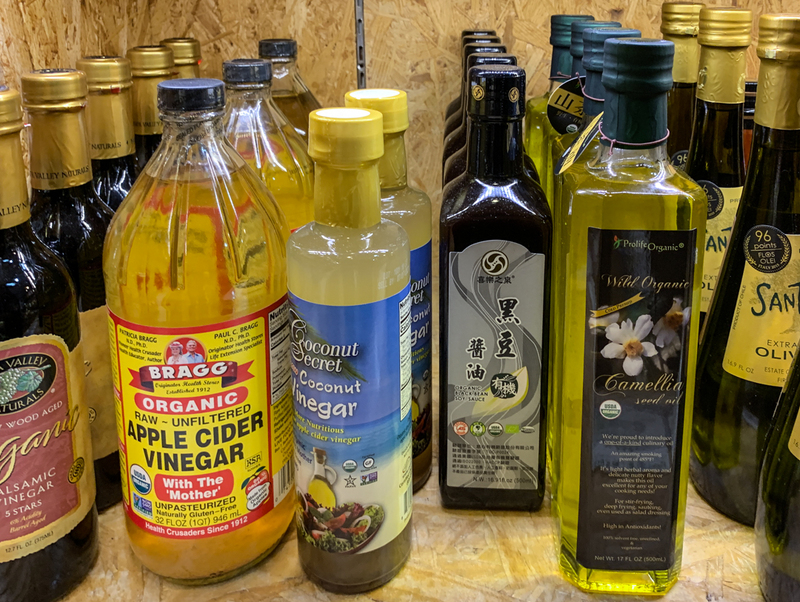 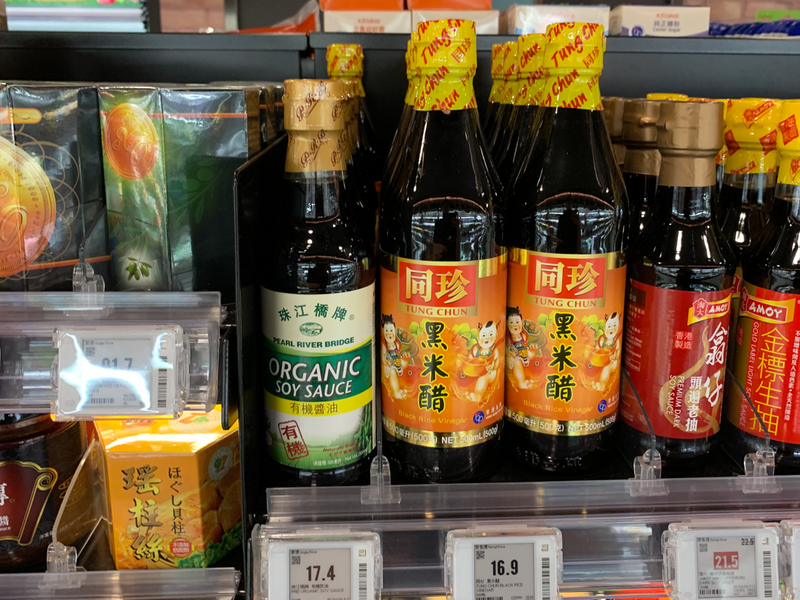 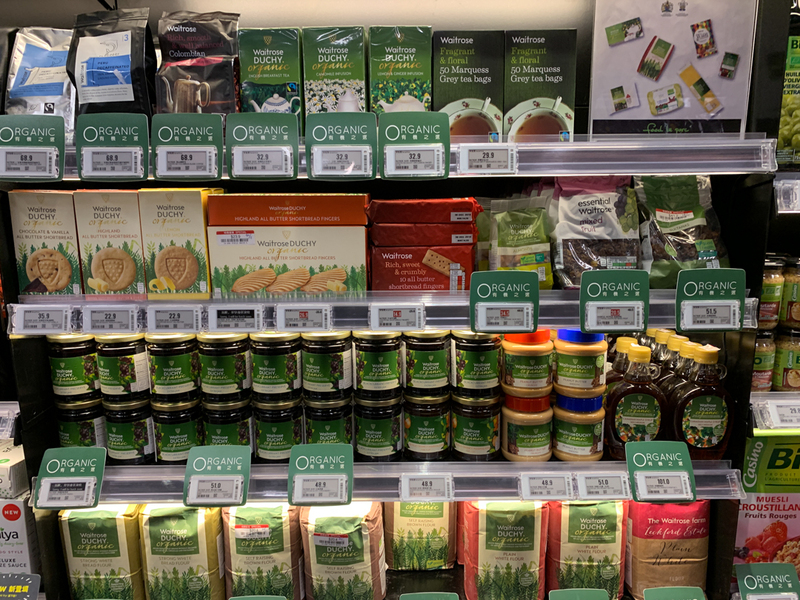 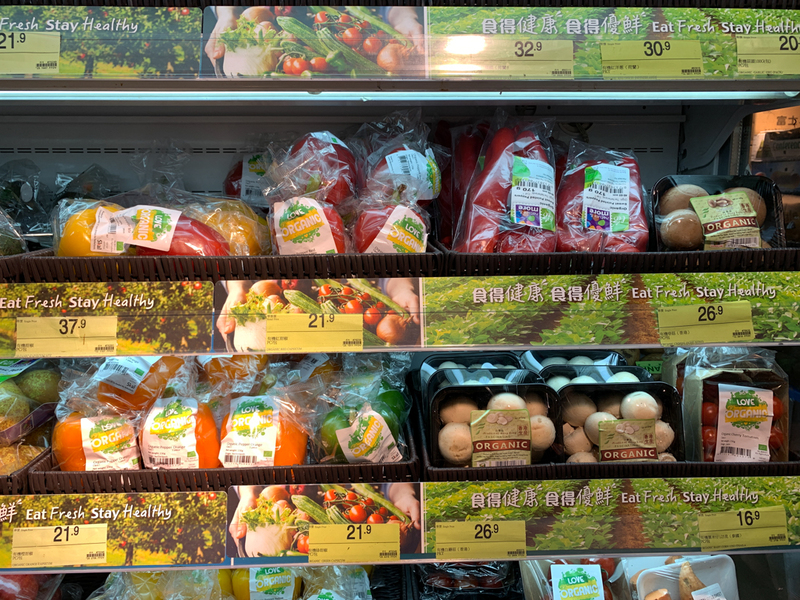 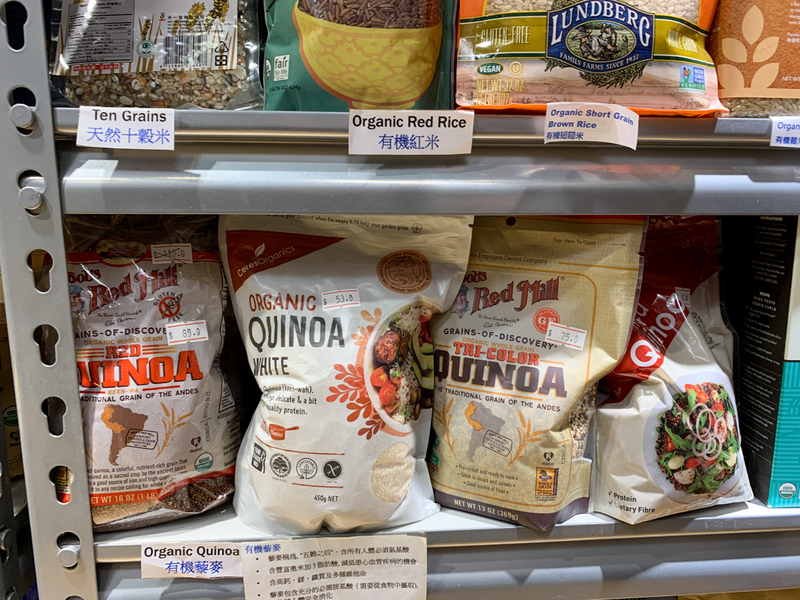 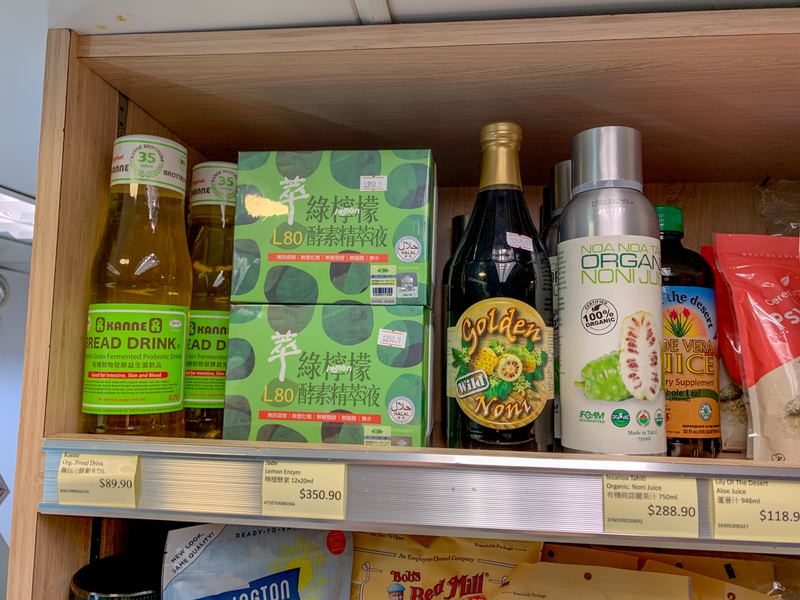 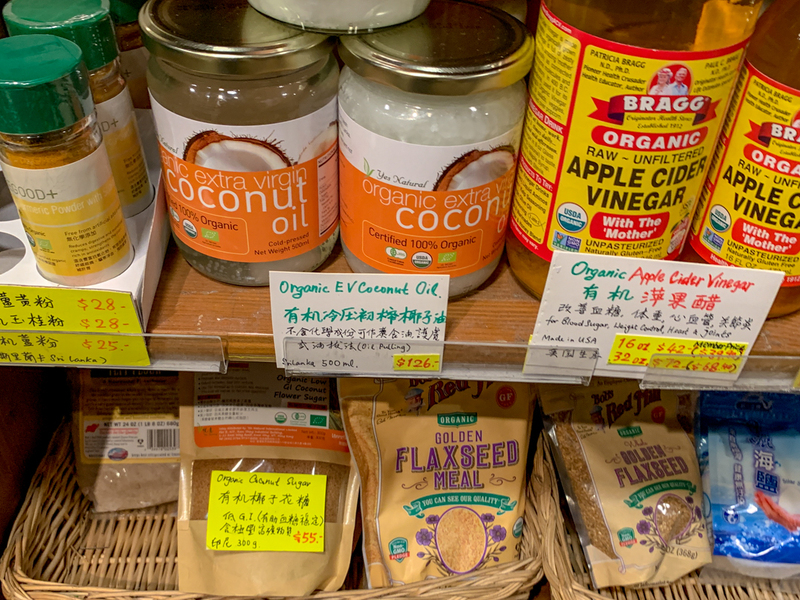 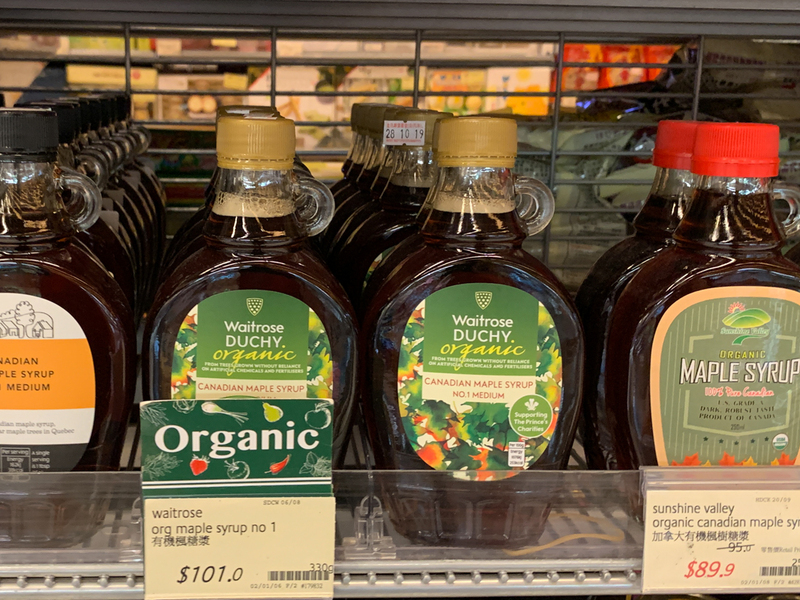 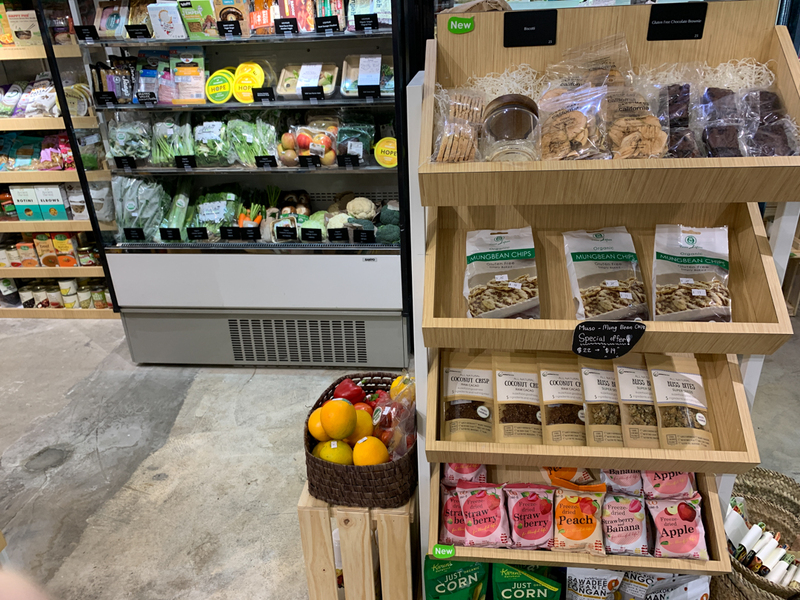 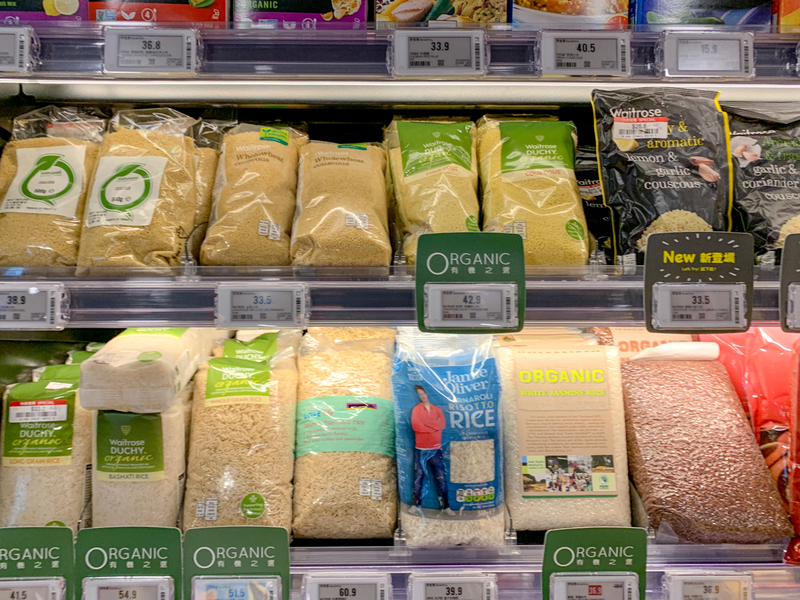 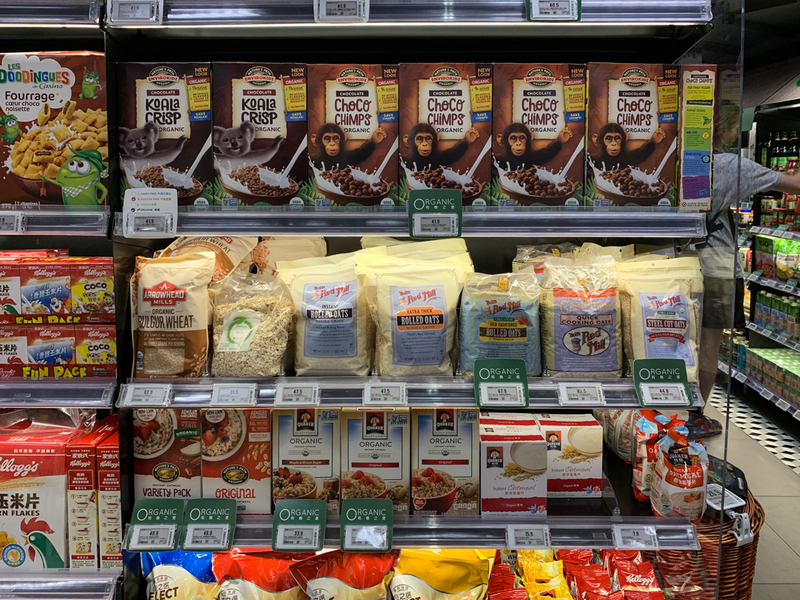 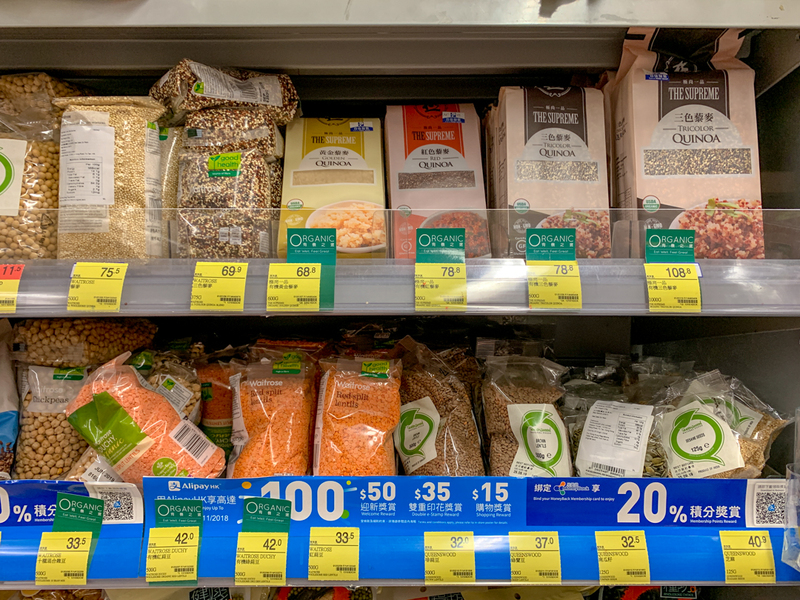 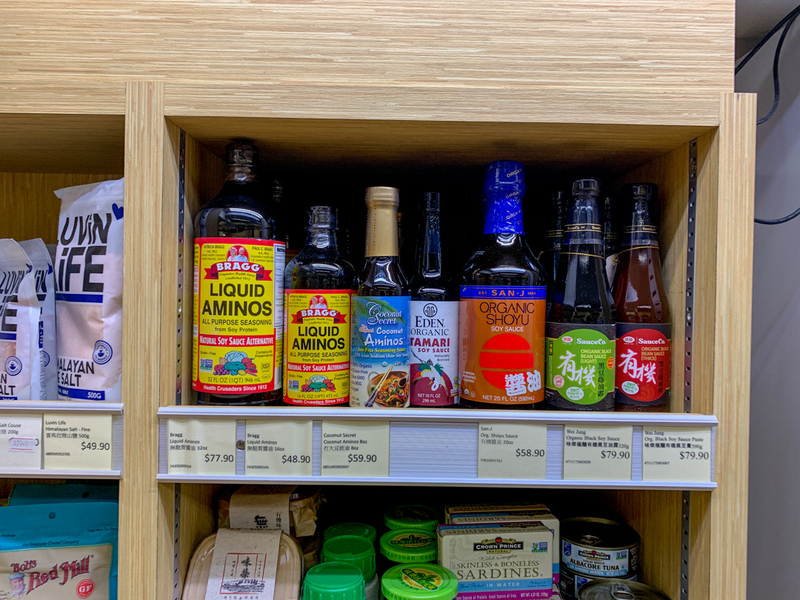 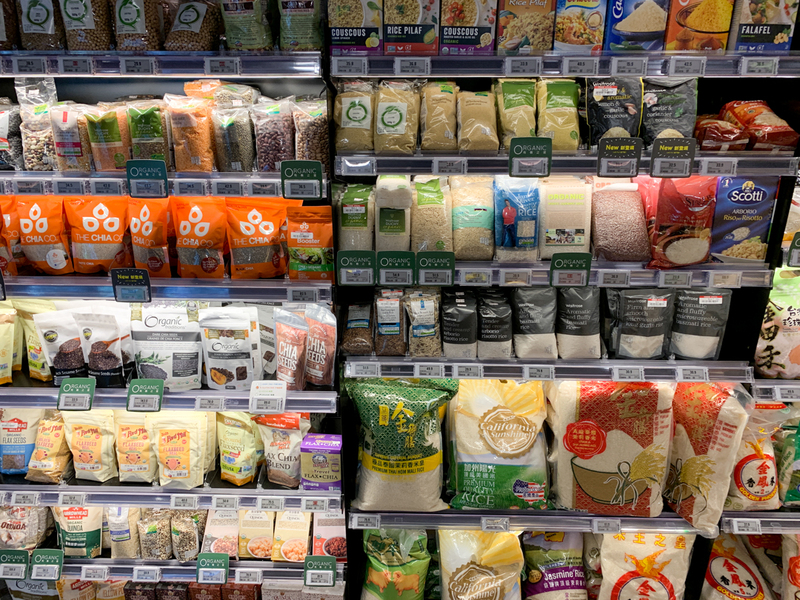 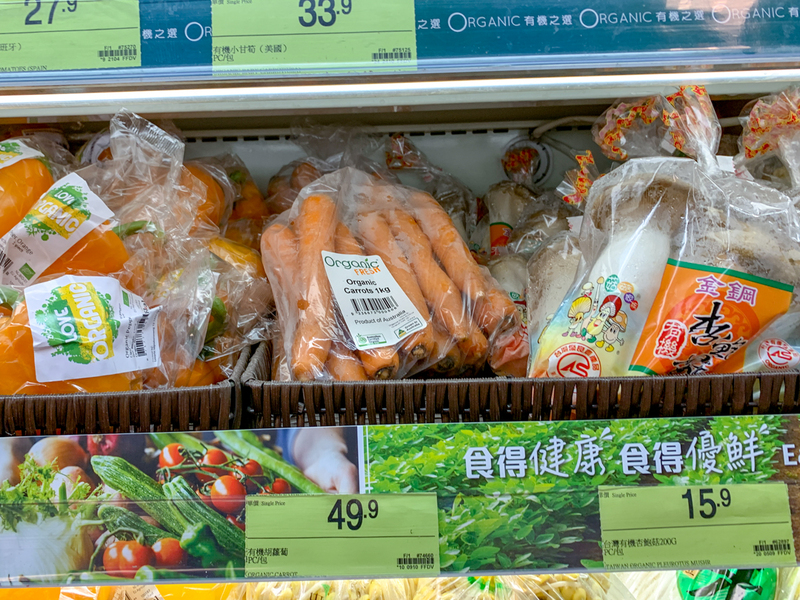 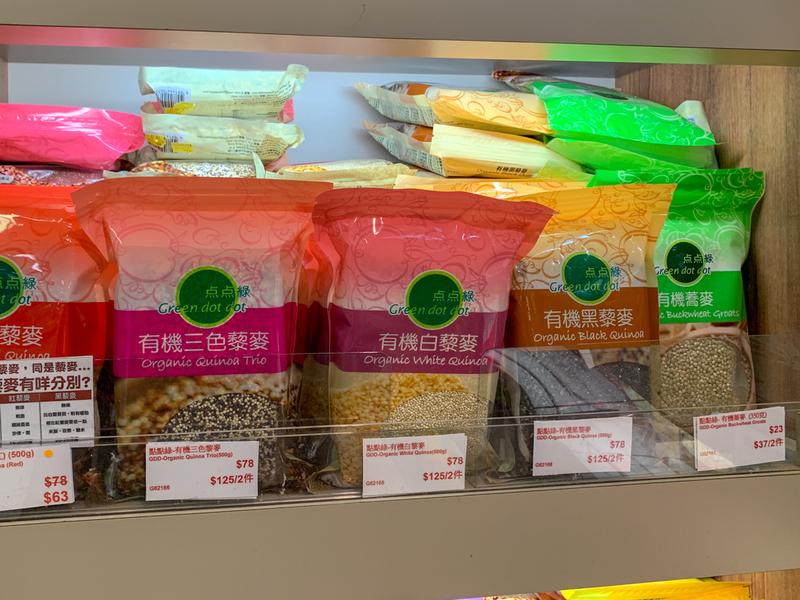 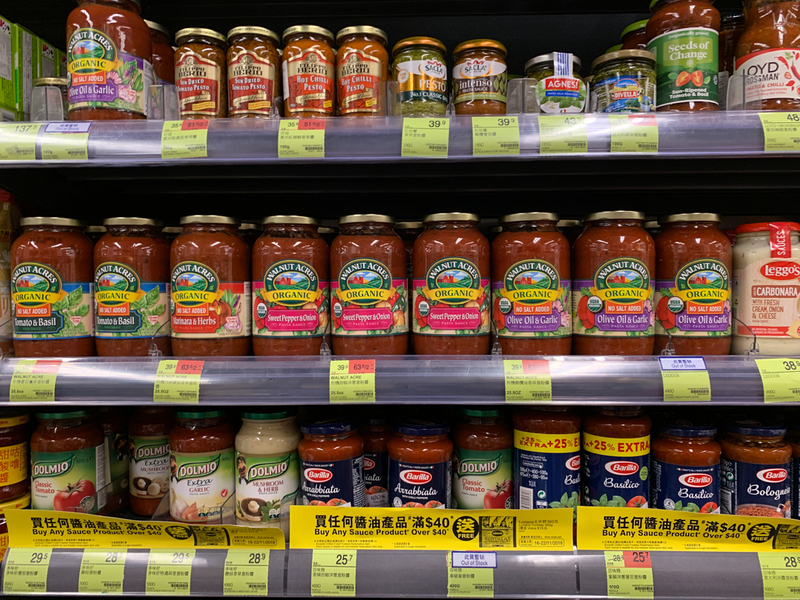 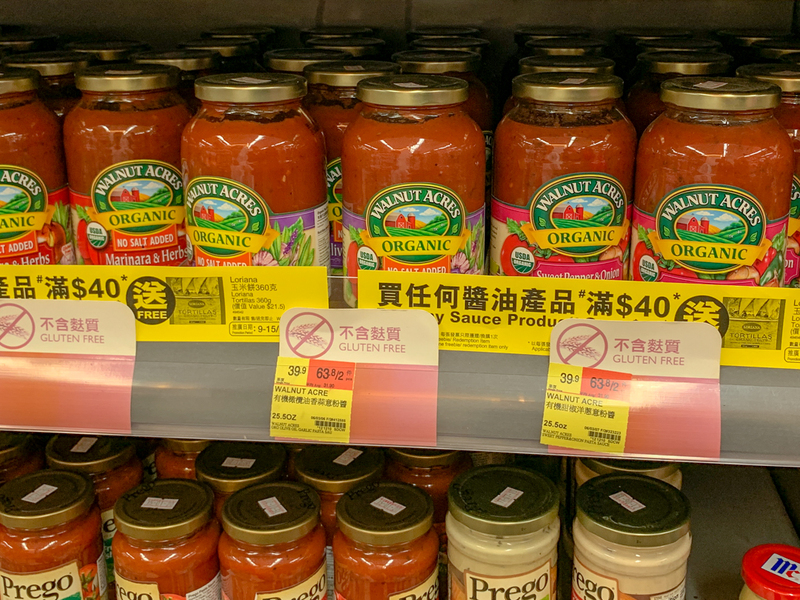 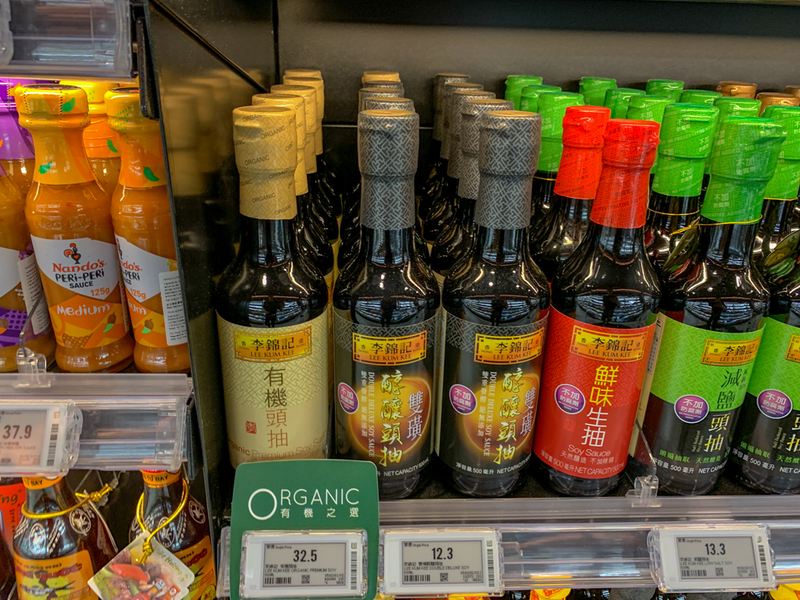 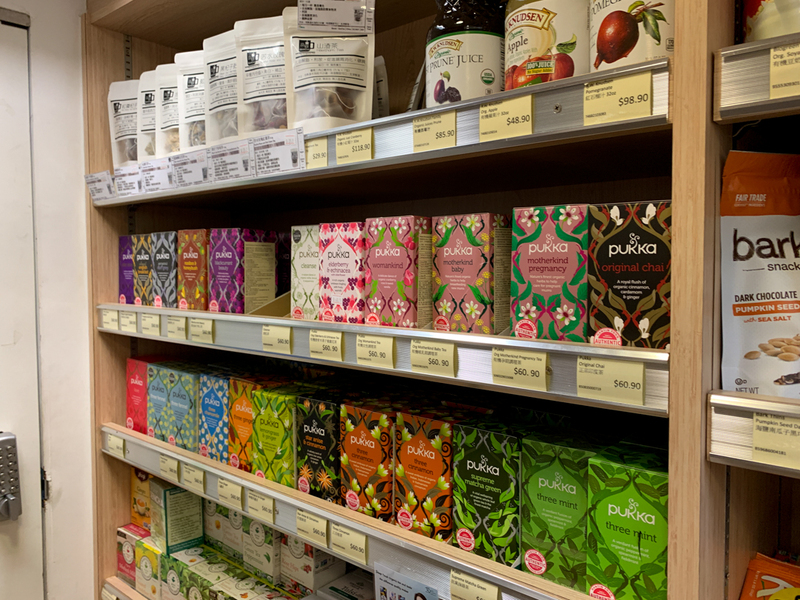 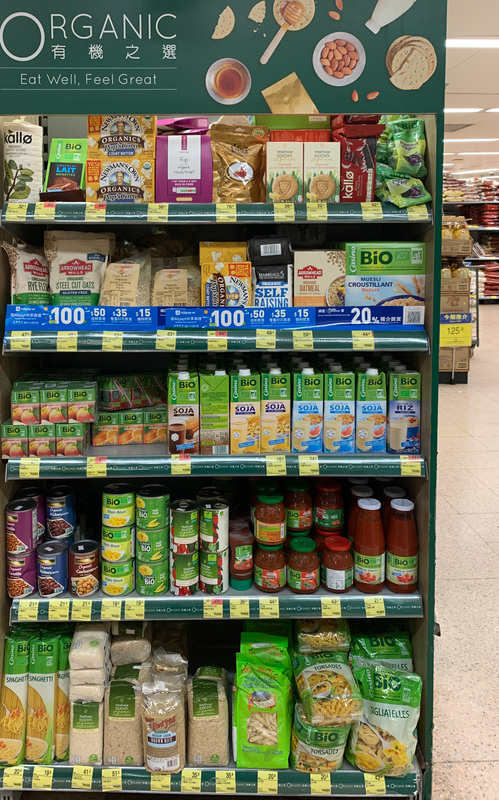 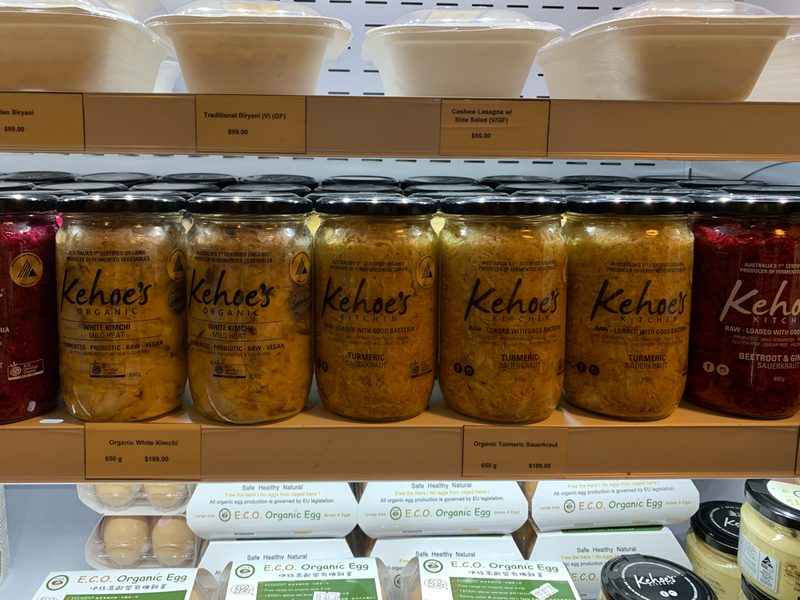 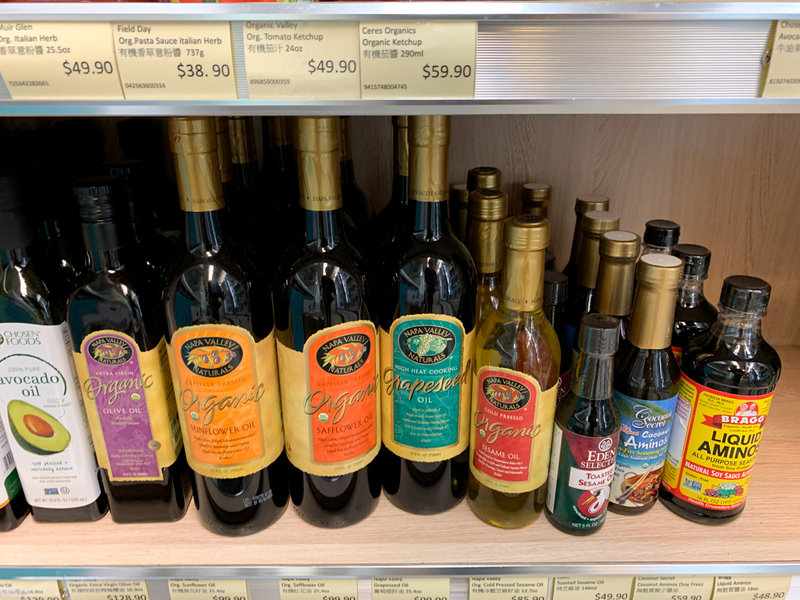 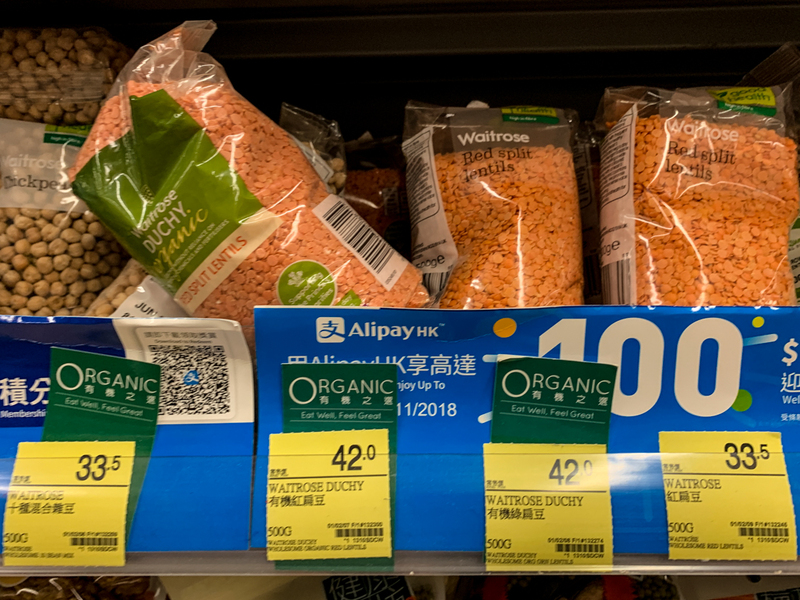 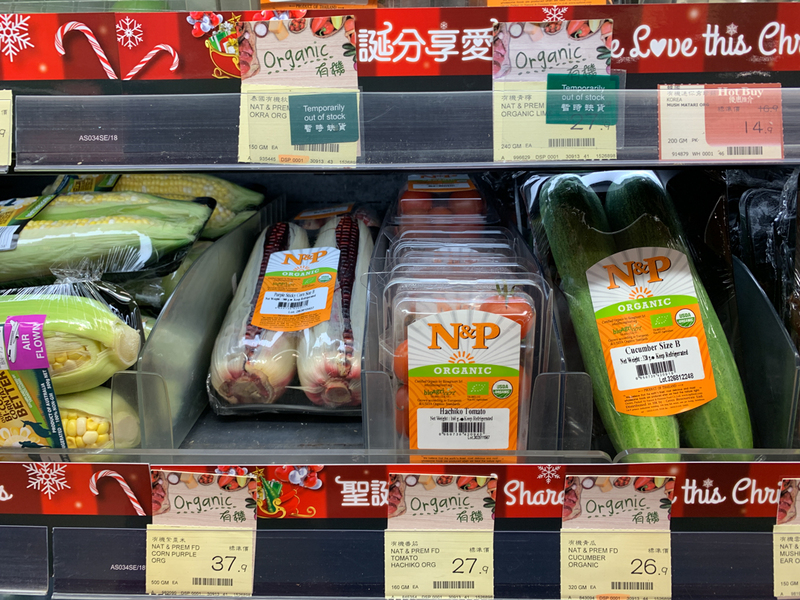 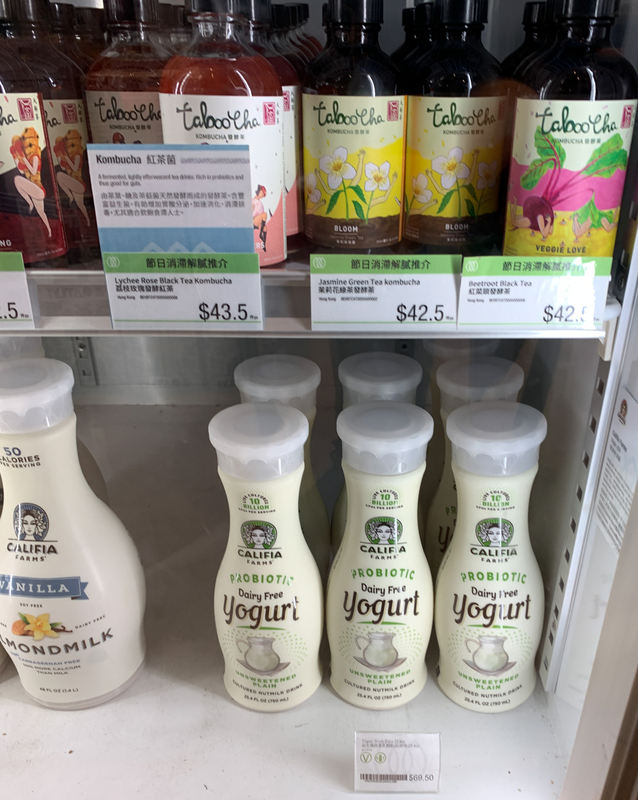 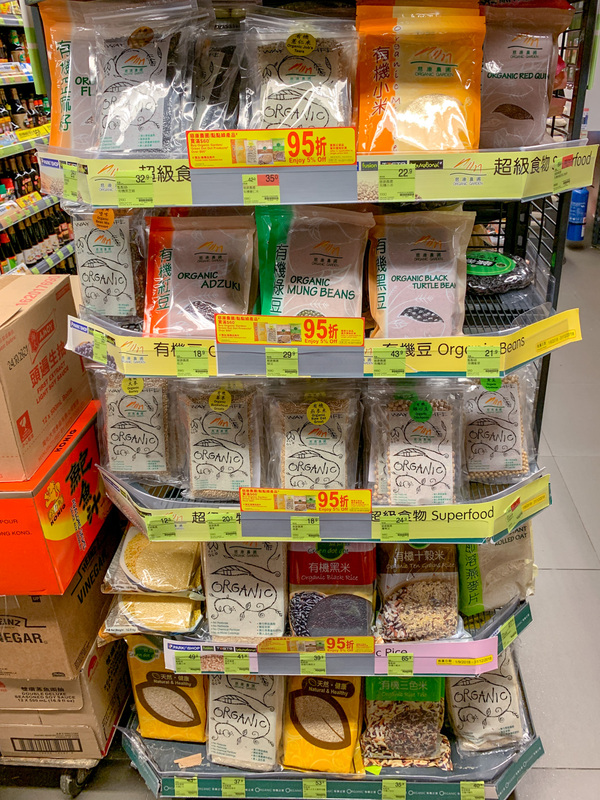 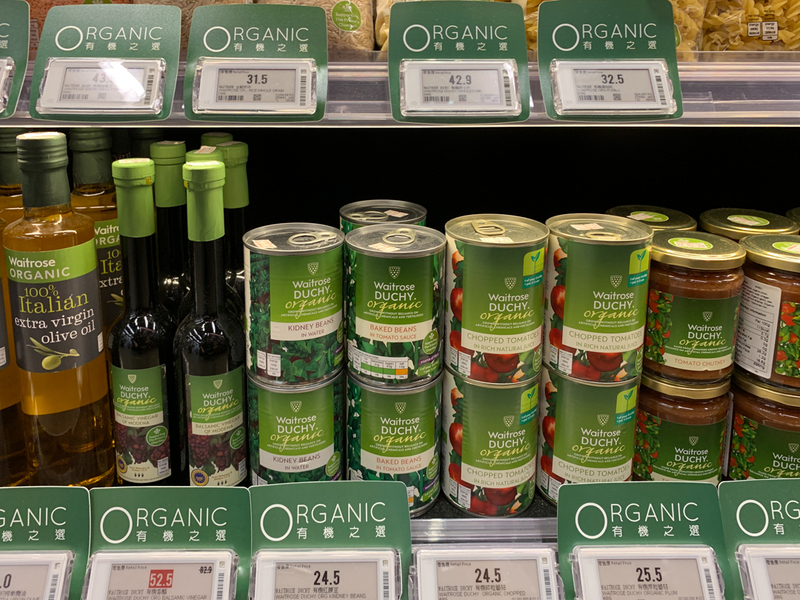 There is a section with local Hong Kong organic produce on the bottom shelf. 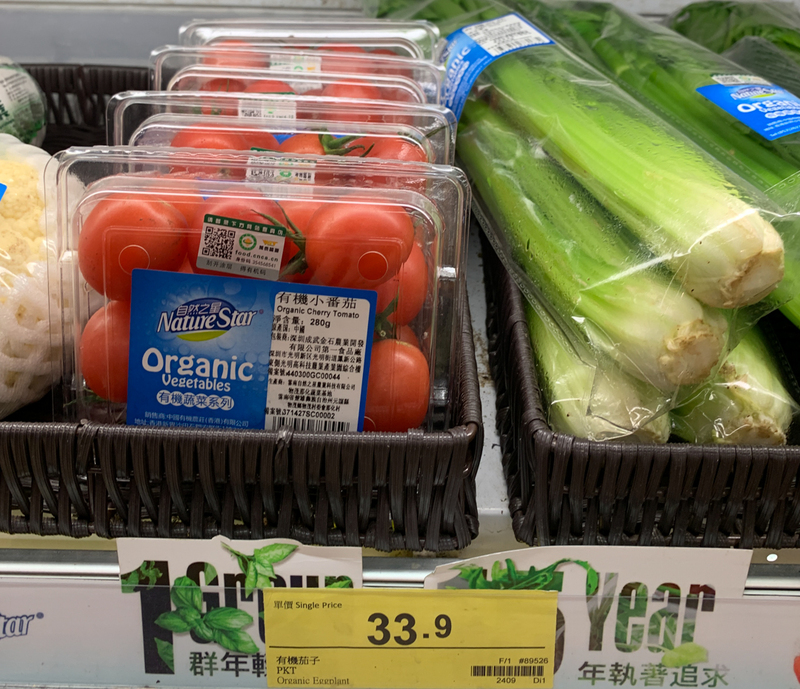 Everything is less expensive and around 30HKD. 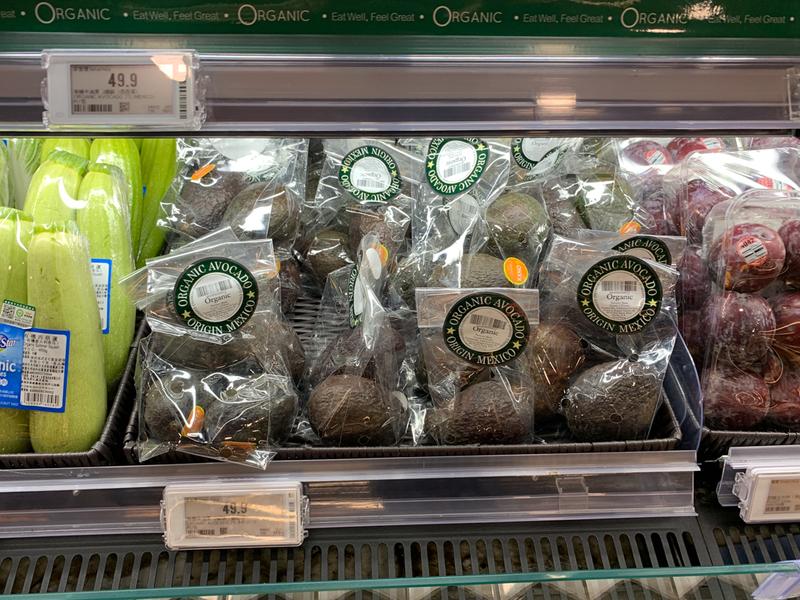 Here are avocados, wrapped in plastic so it’s hard to see them. 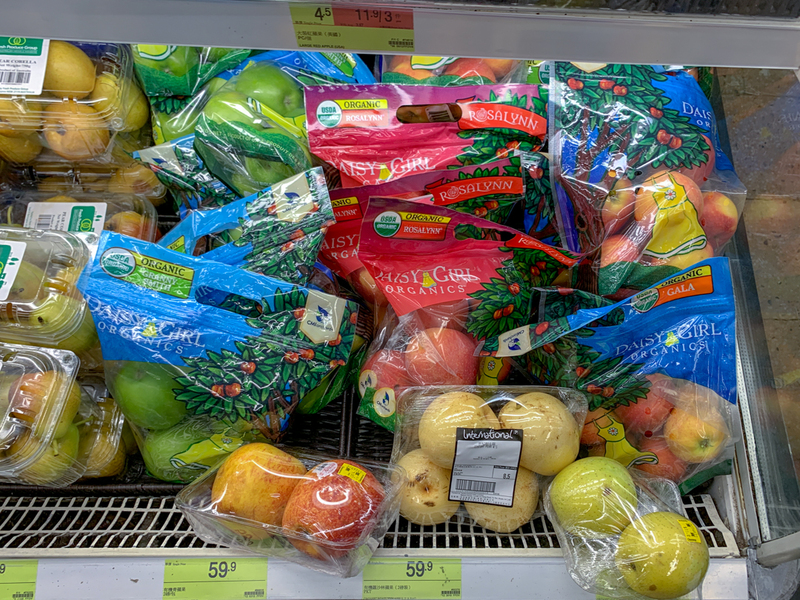 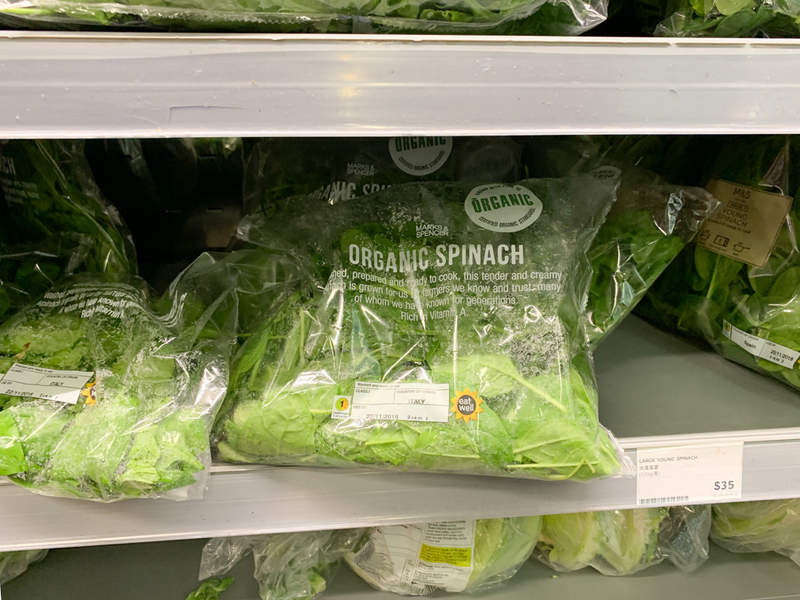 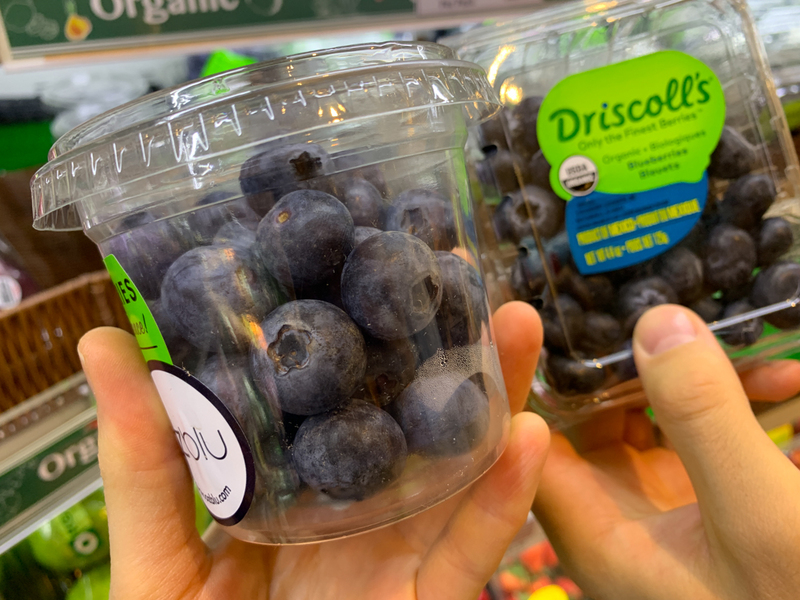 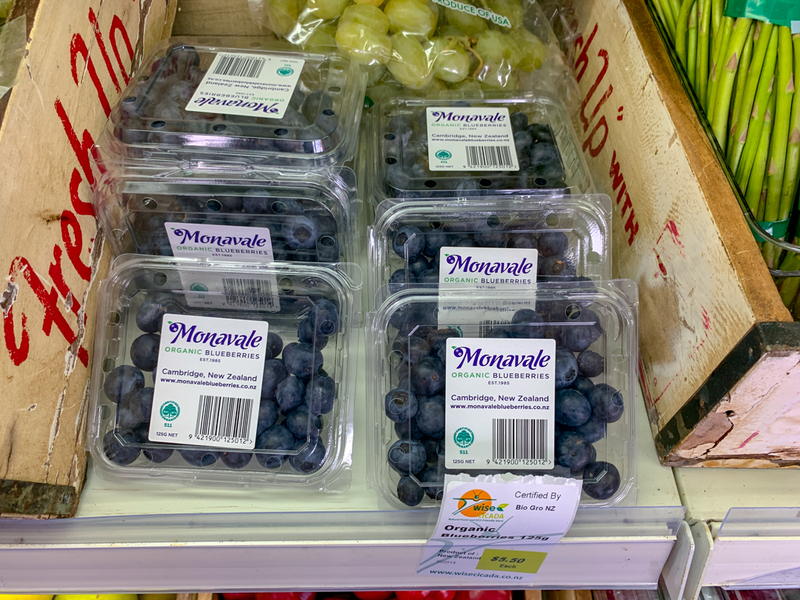 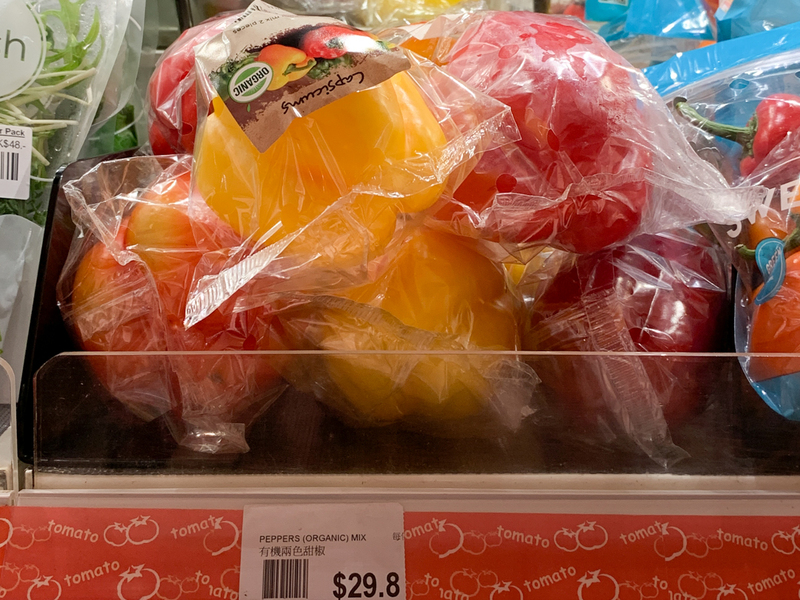 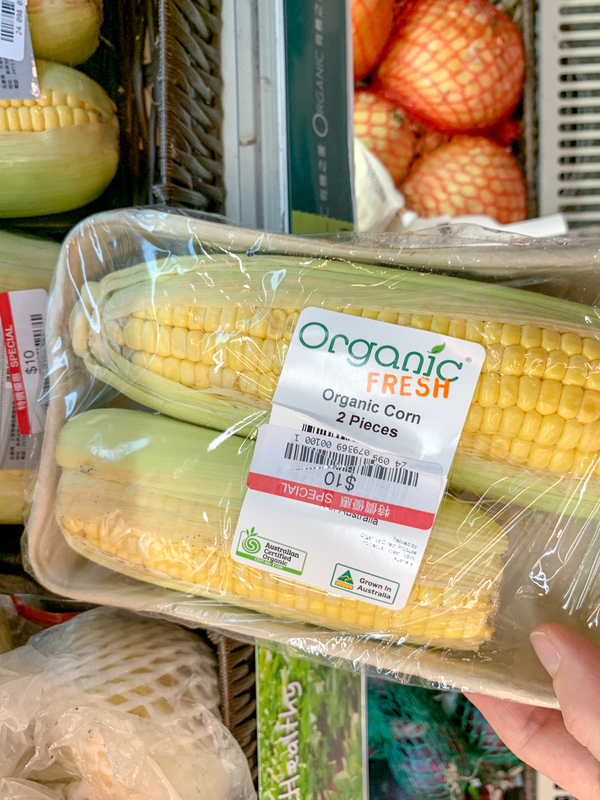 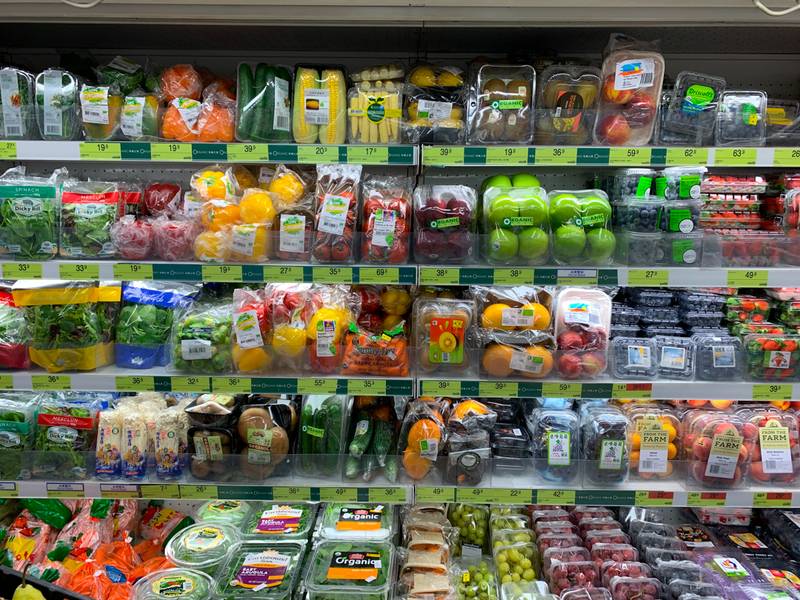 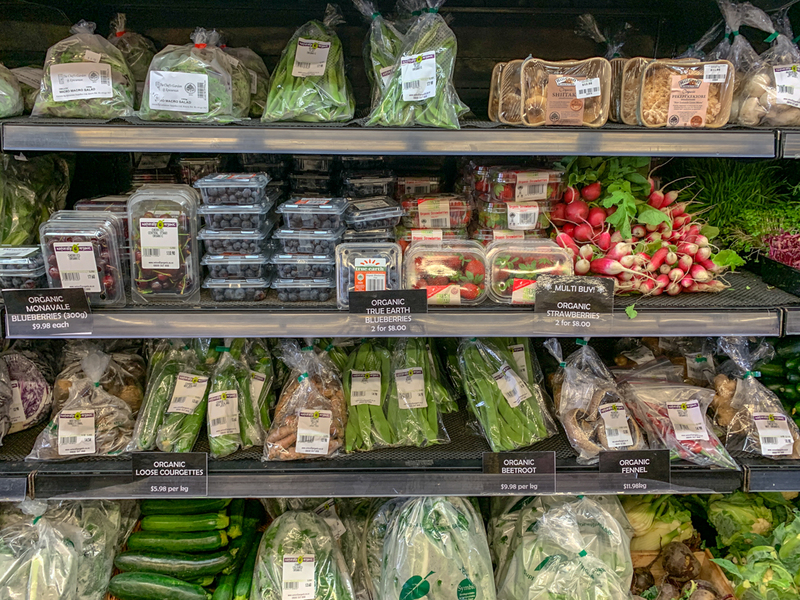 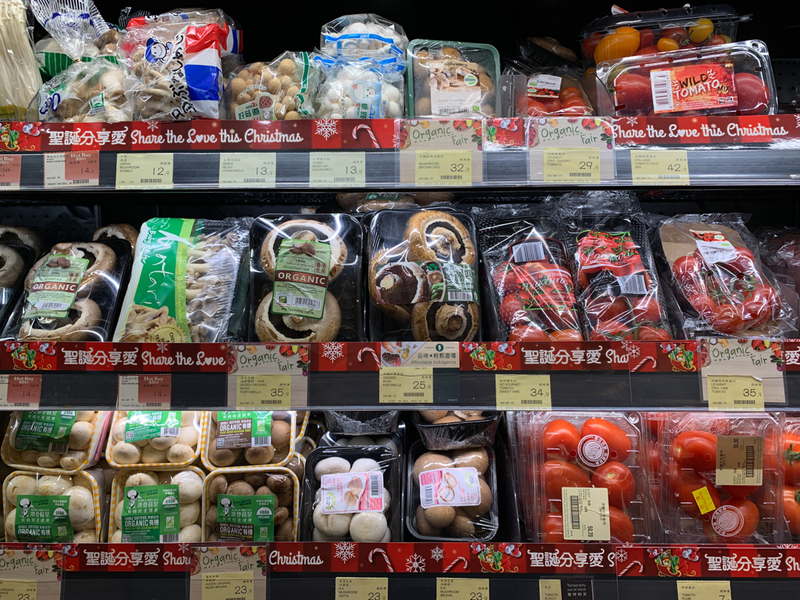 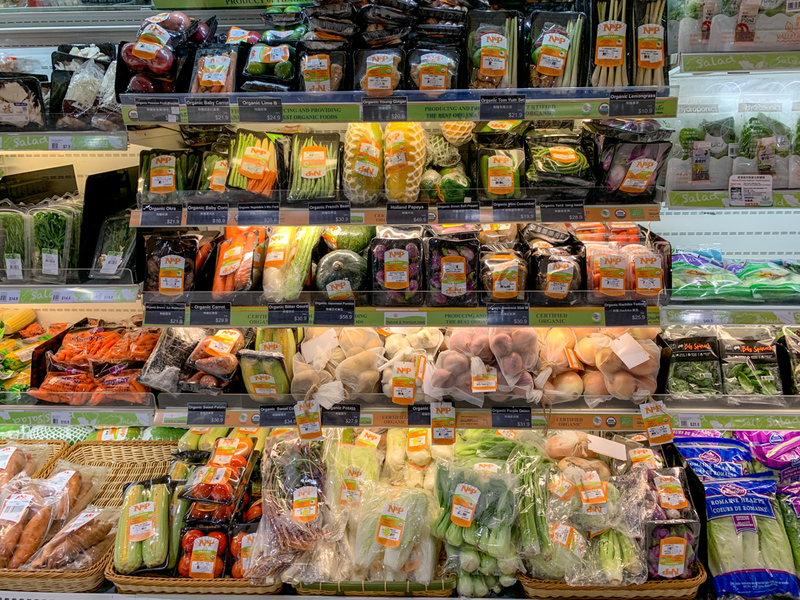 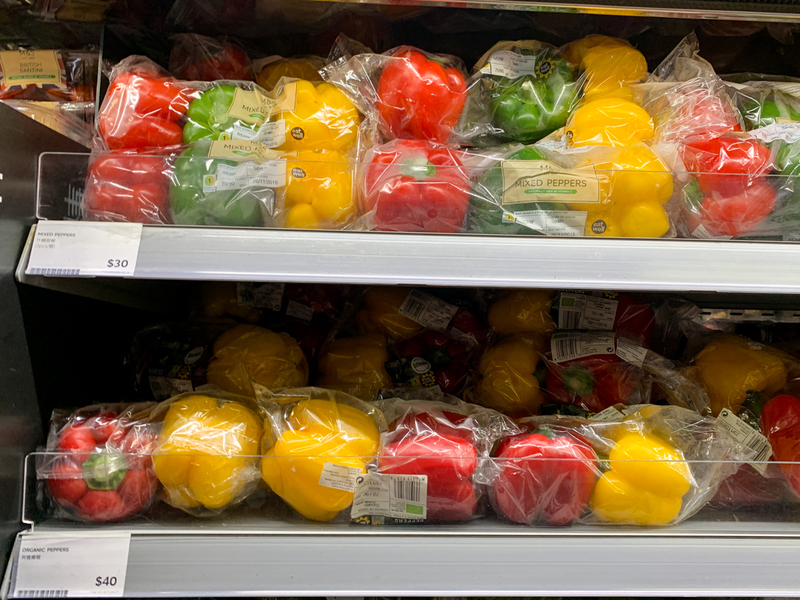 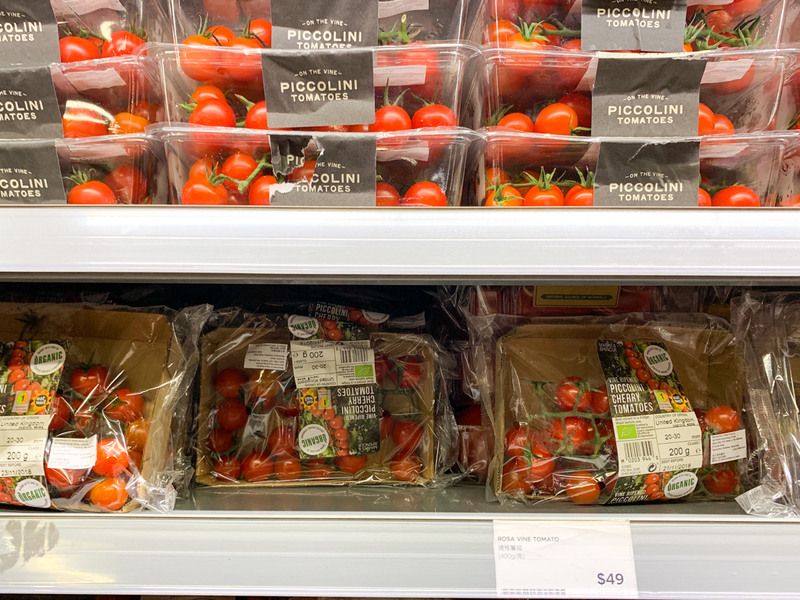 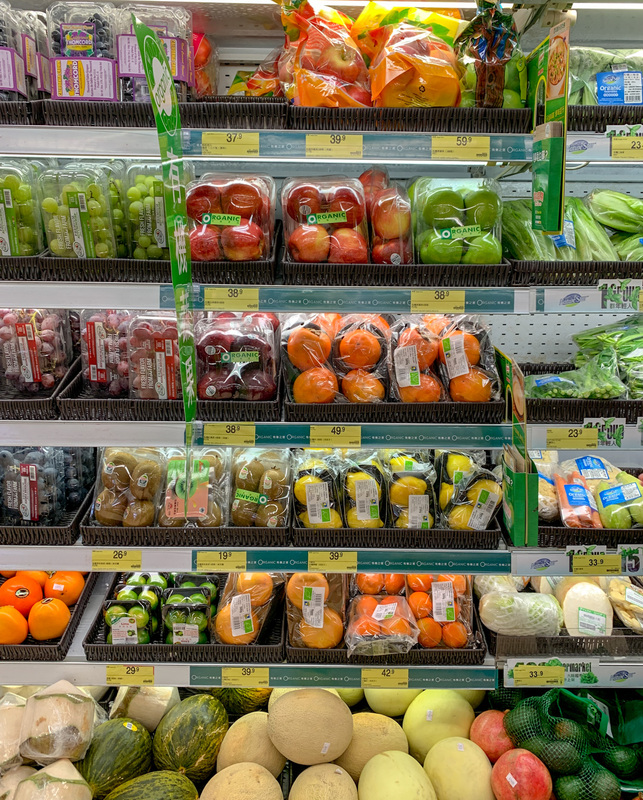 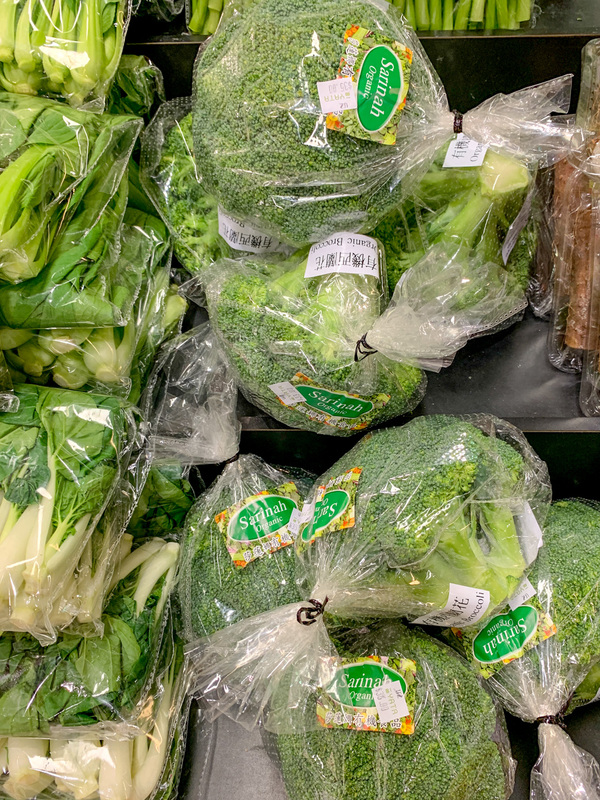 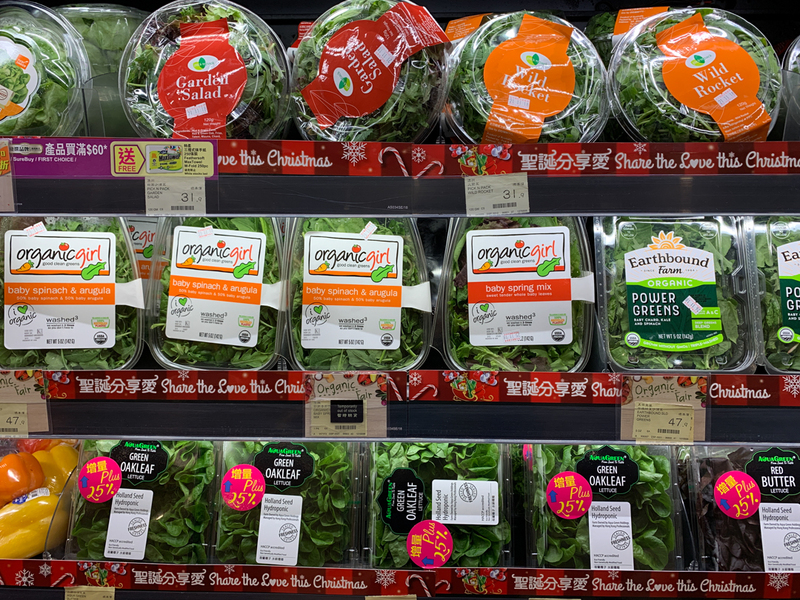 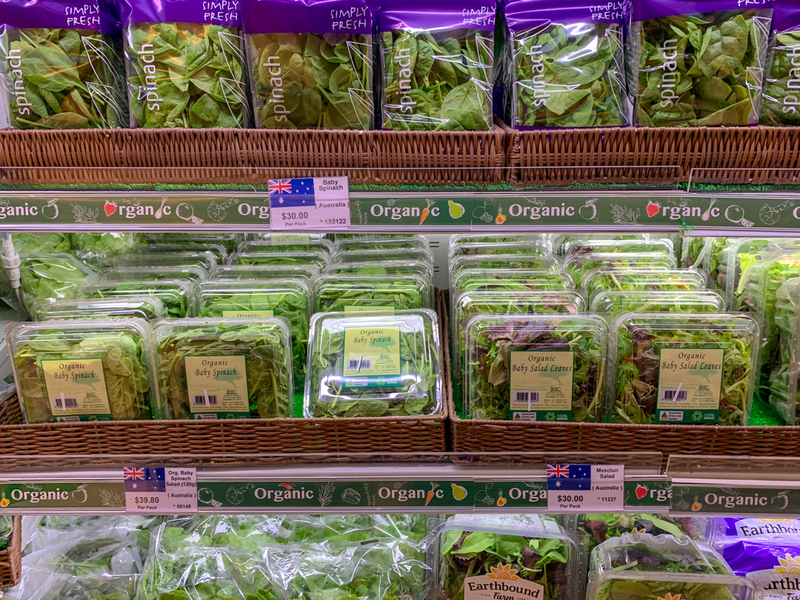 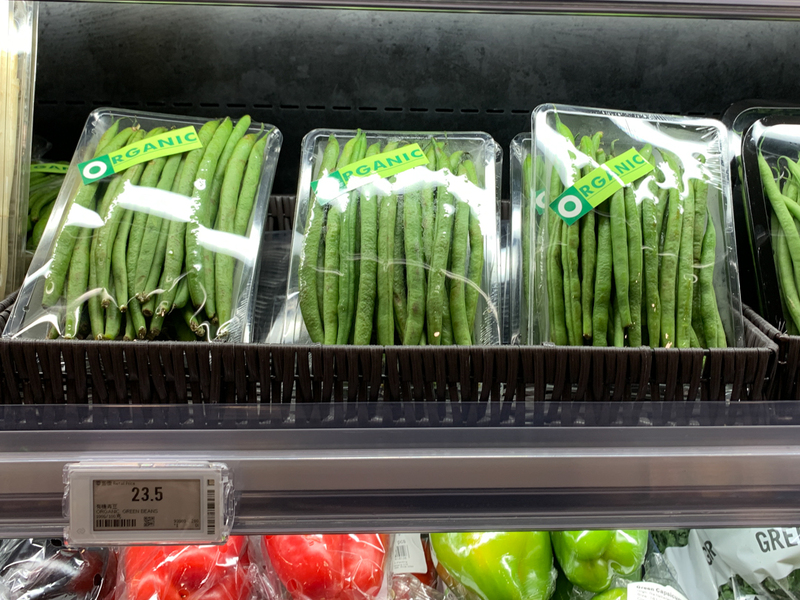 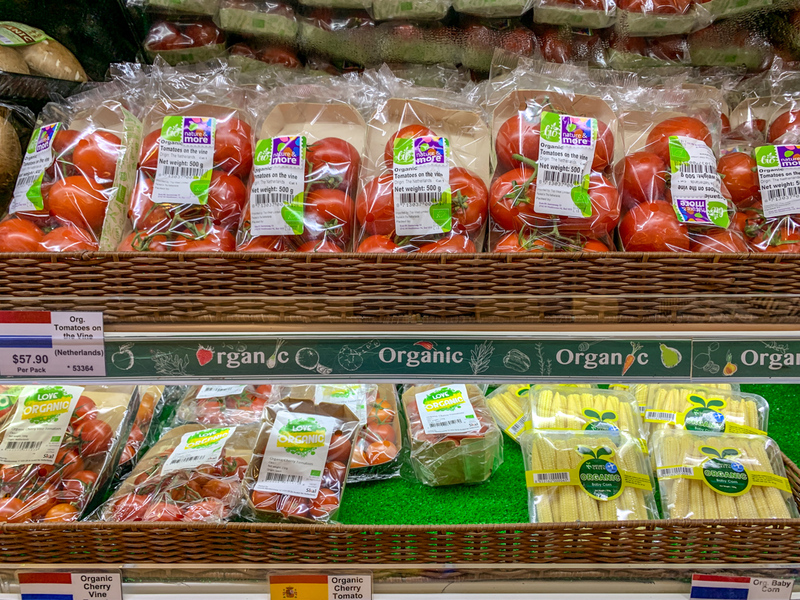 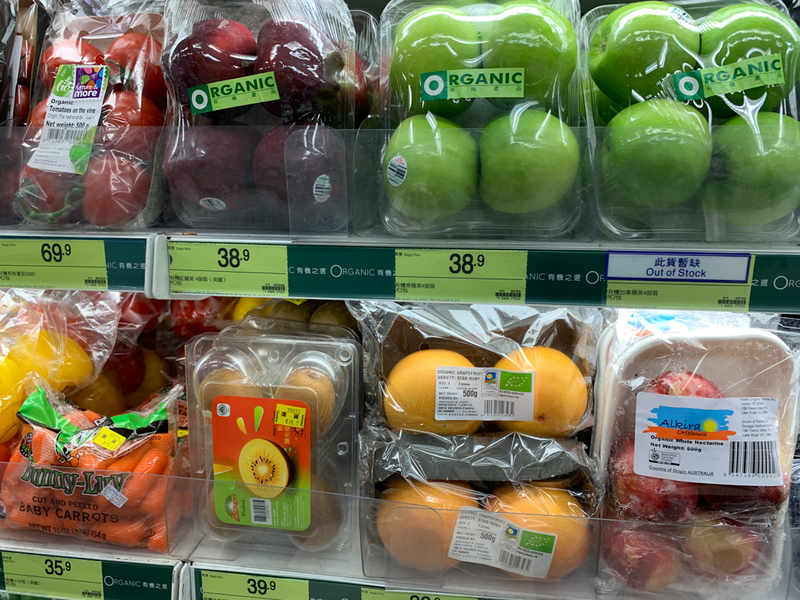 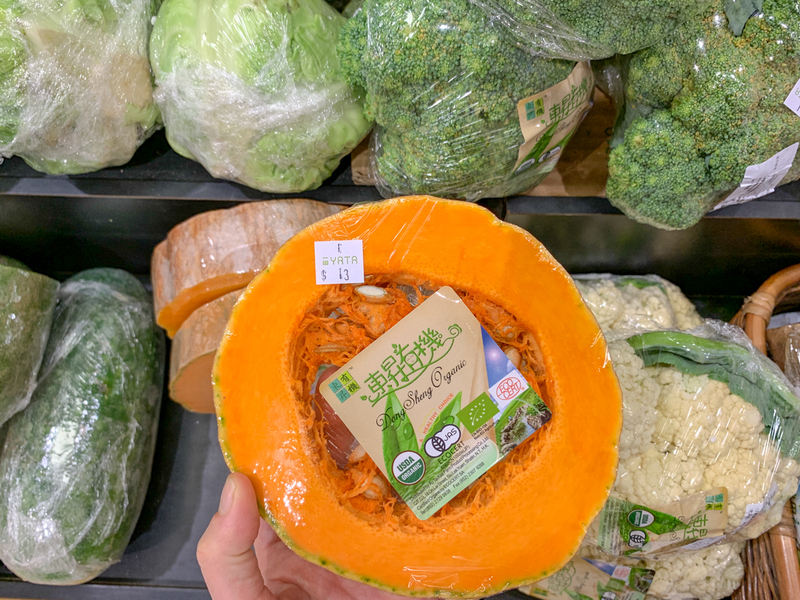 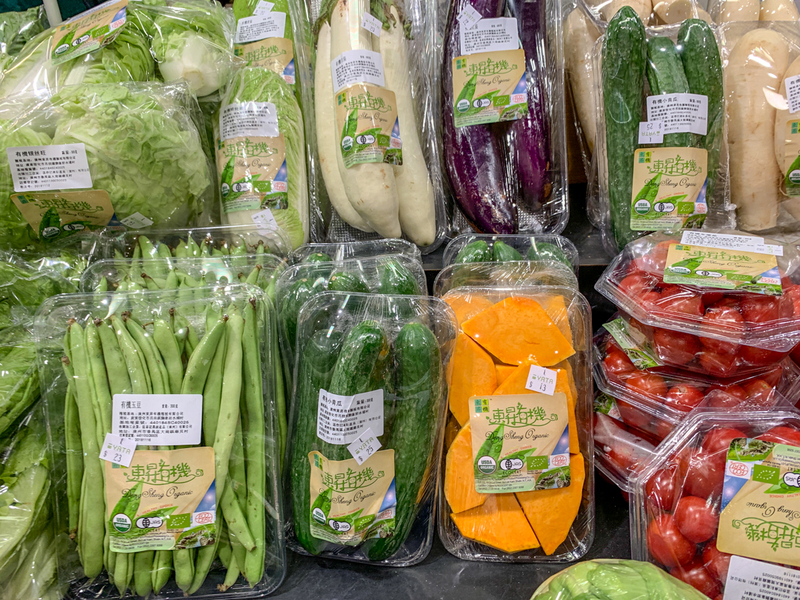 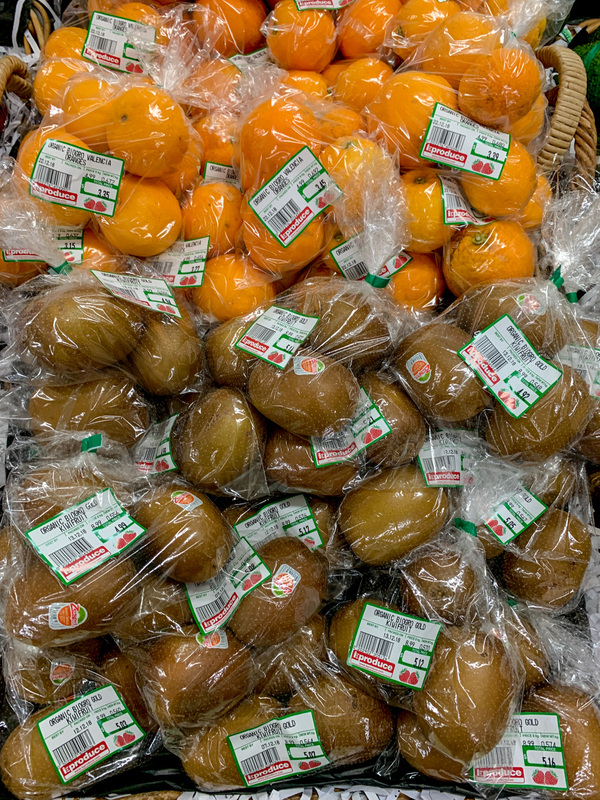 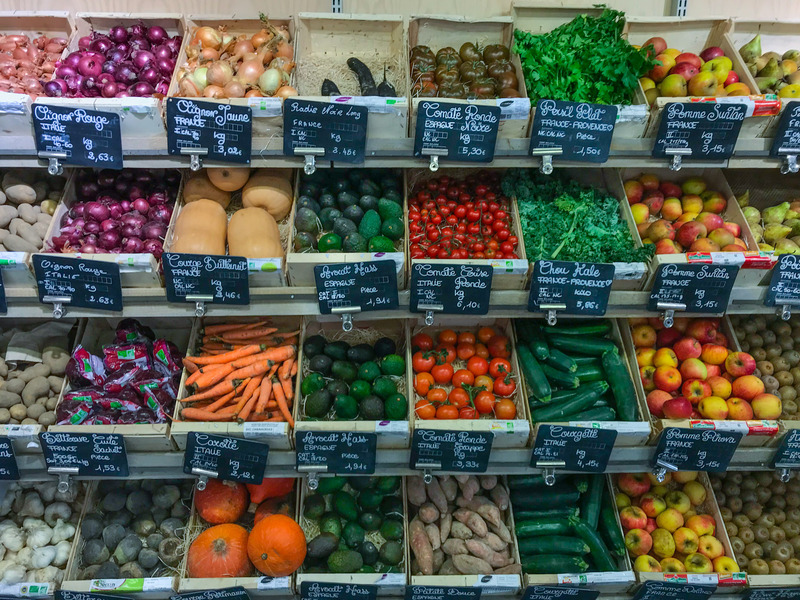 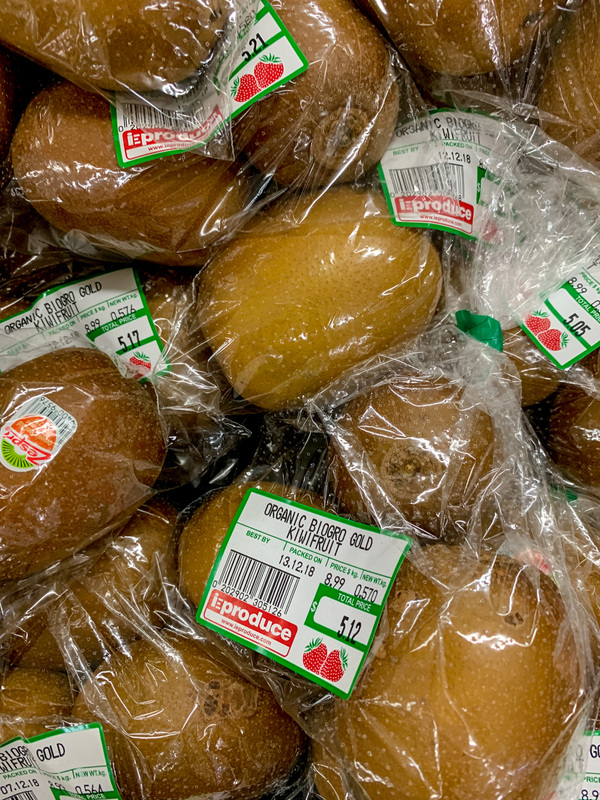 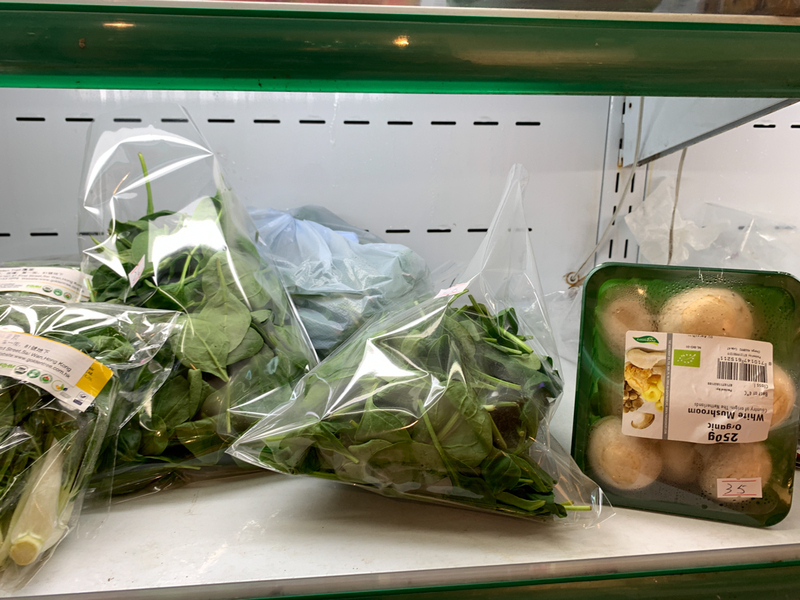 The amounts of plastic used to wrap the produce, organic and non-organic are heartbreaking here. 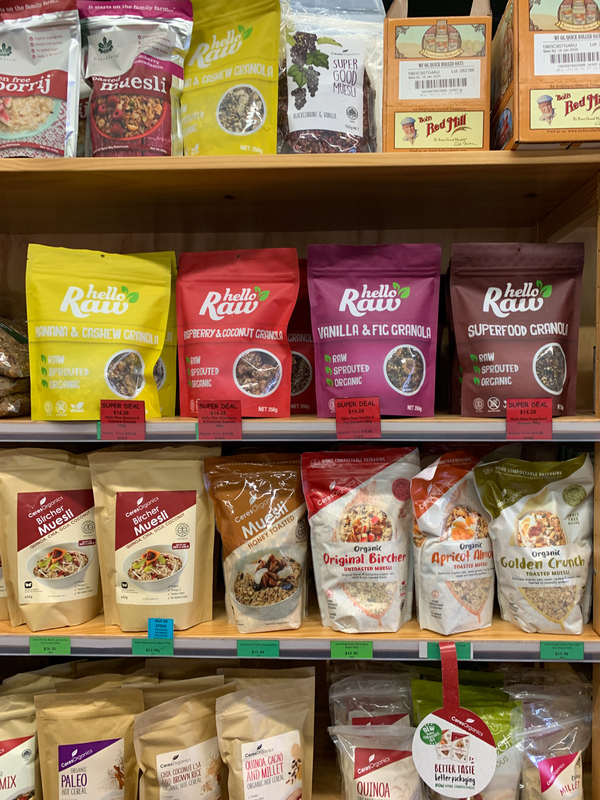 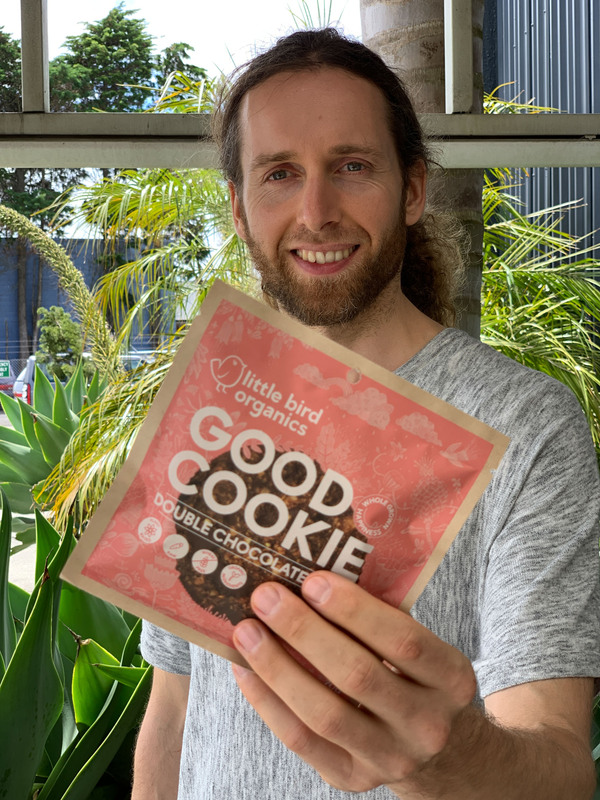 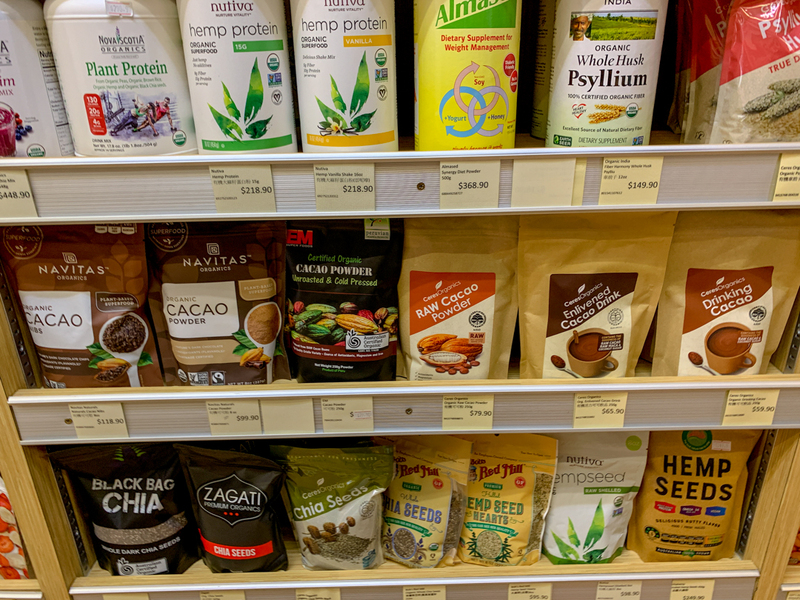 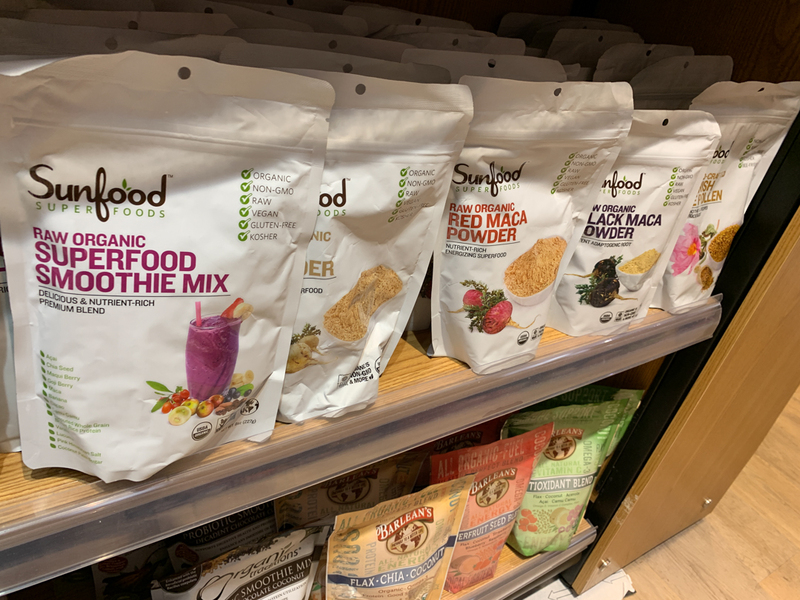 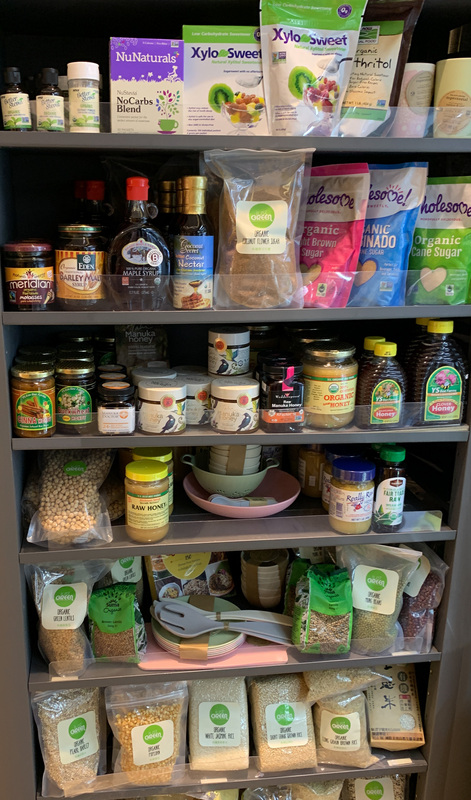 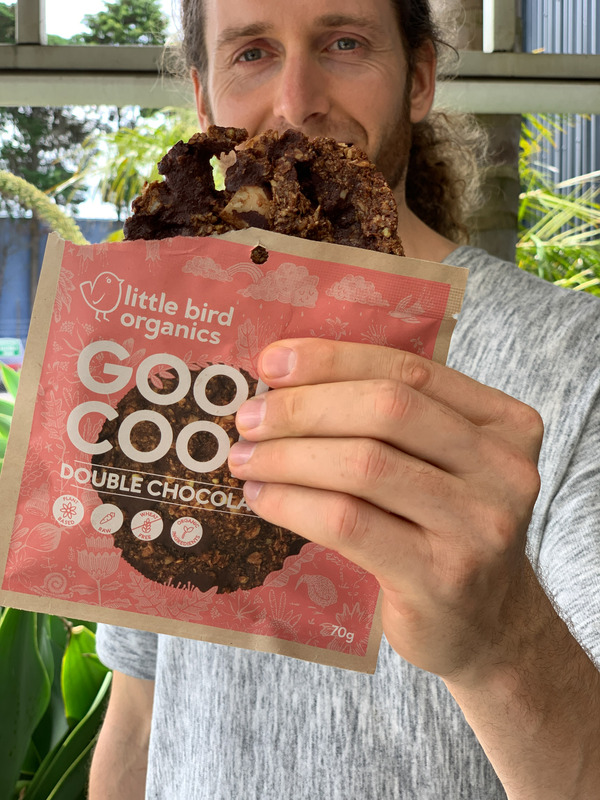 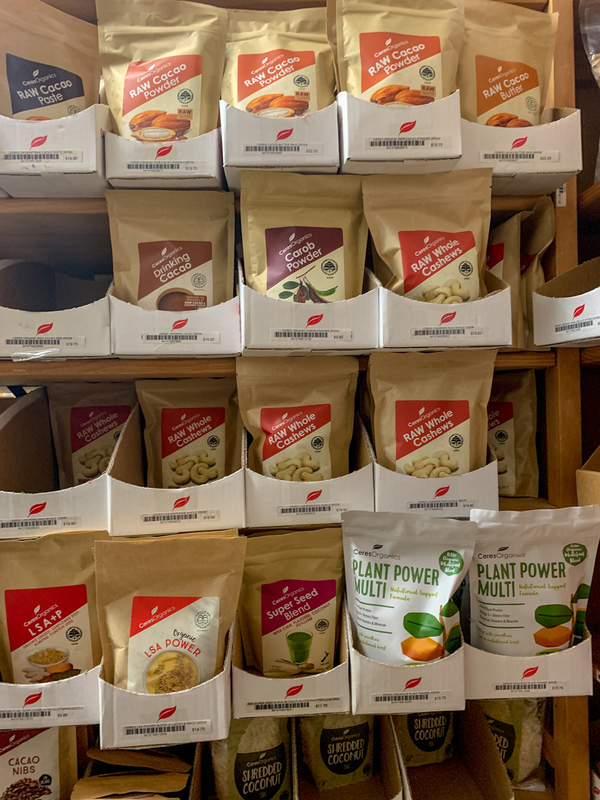 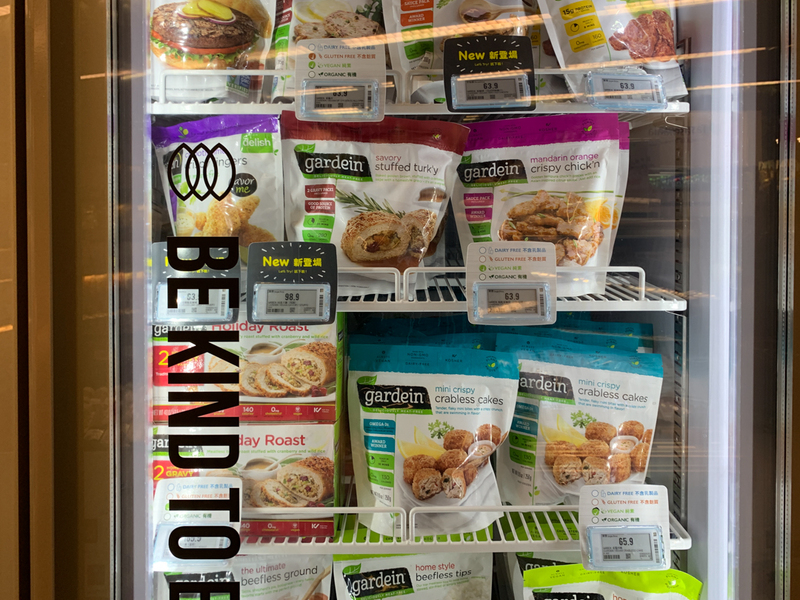 Here more random plant-based food we as raw foodies don’t buy but happy to share if you need them. 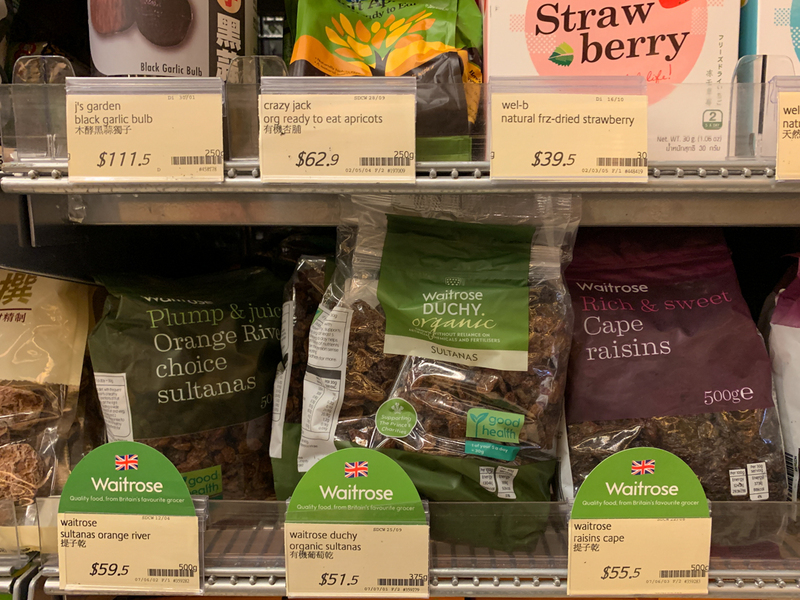 We actually bought the raisins. 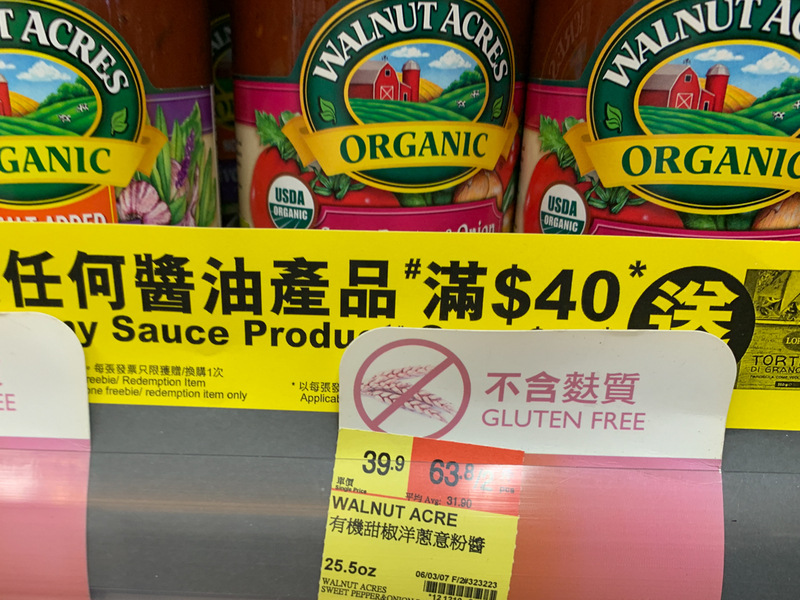 They were oil coated, haven’t seen this at the store, oh well. 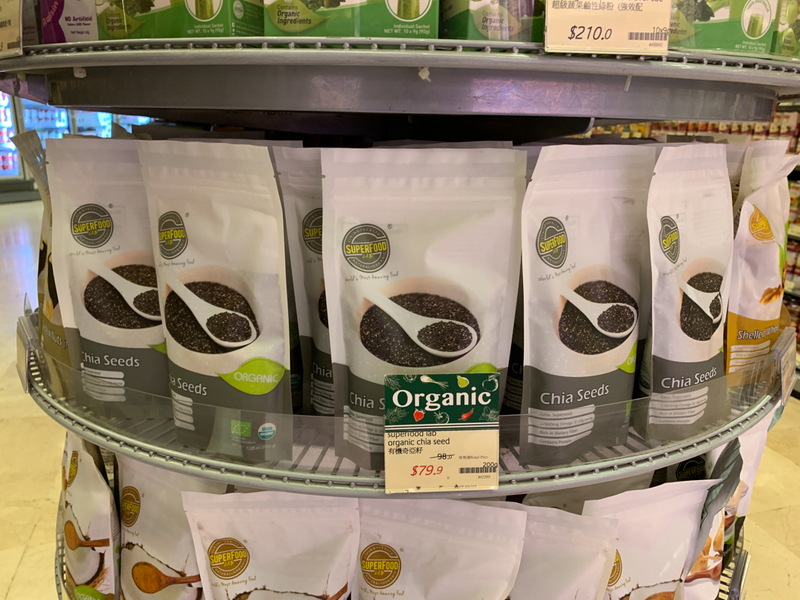 Got these organic chia seeds. 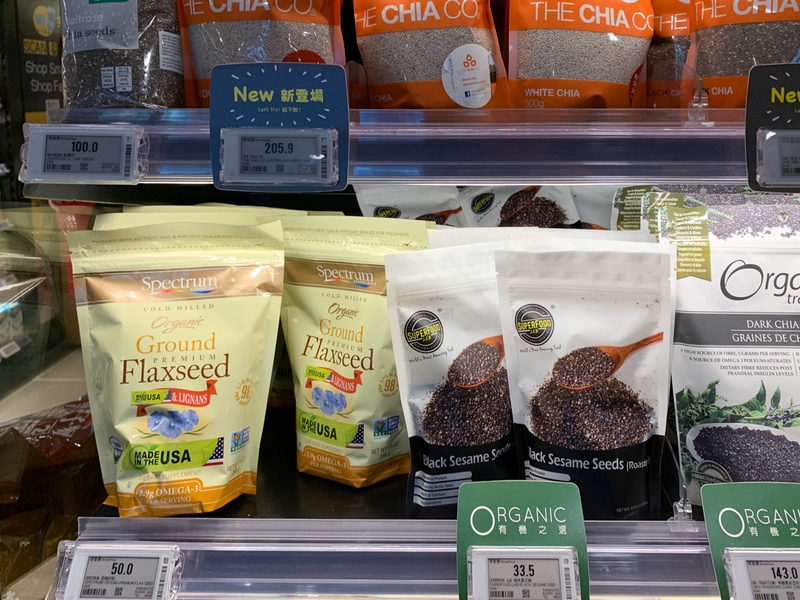 Chia puddings are so easy to make even while traveling with no equipment. 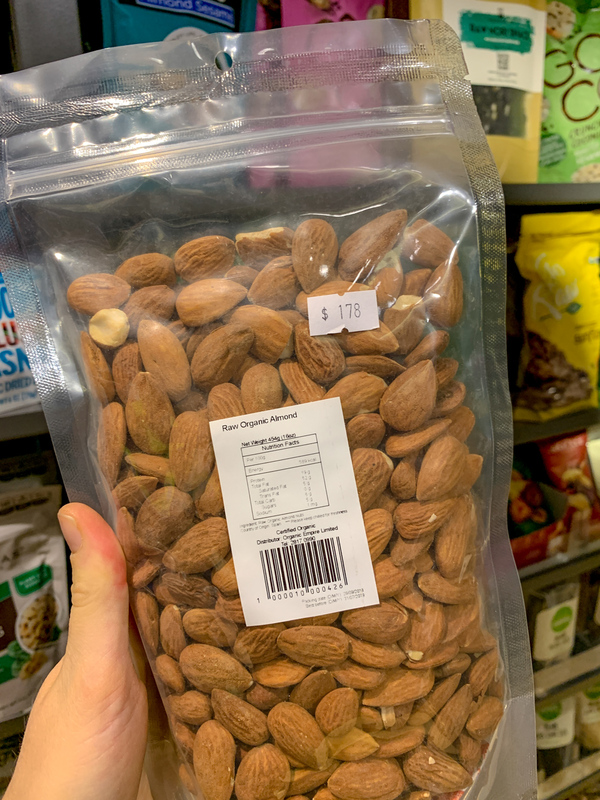 We still had some almonds we brought with us from Germany, but we might get them next week. 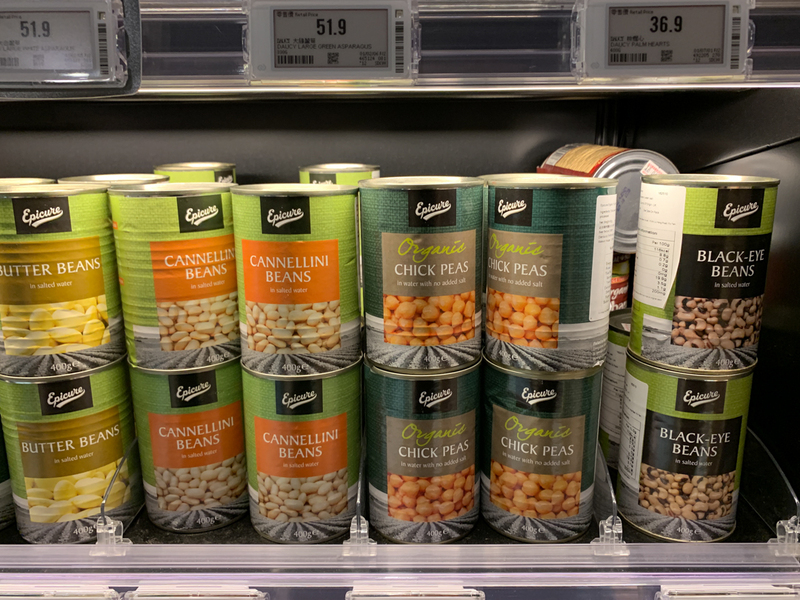 Beens and lentils, some even salt free. 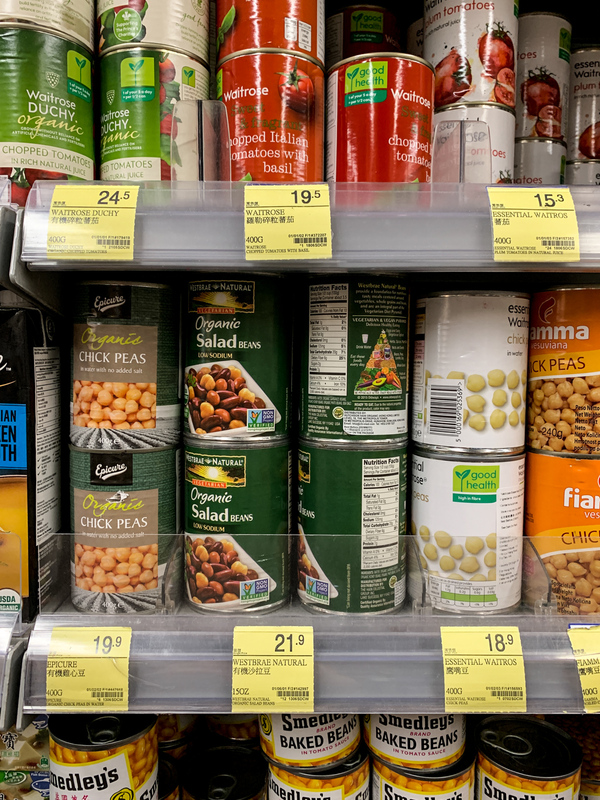 But don’t let be fooled by the low sodium statement on the cans. 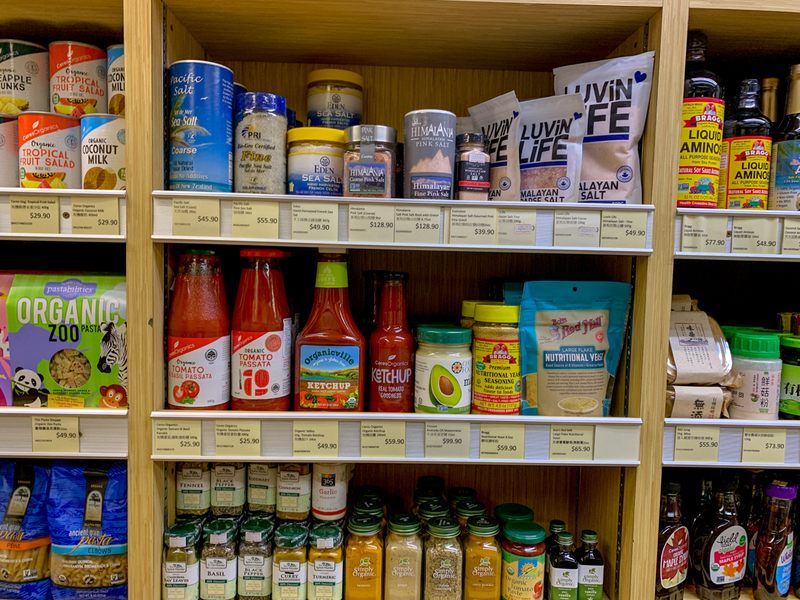 The so called “low sodium” products usually contain salt. 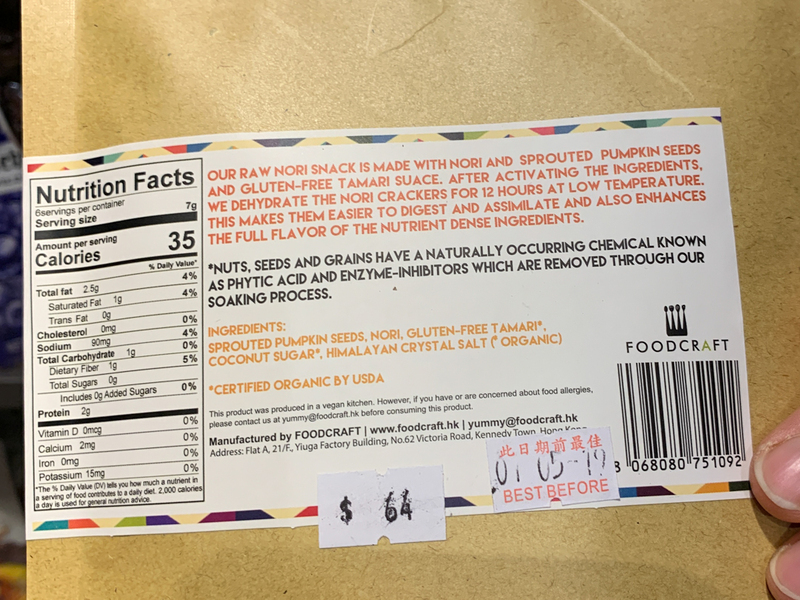 Look in the ingredients List for a product with no added salt at all. 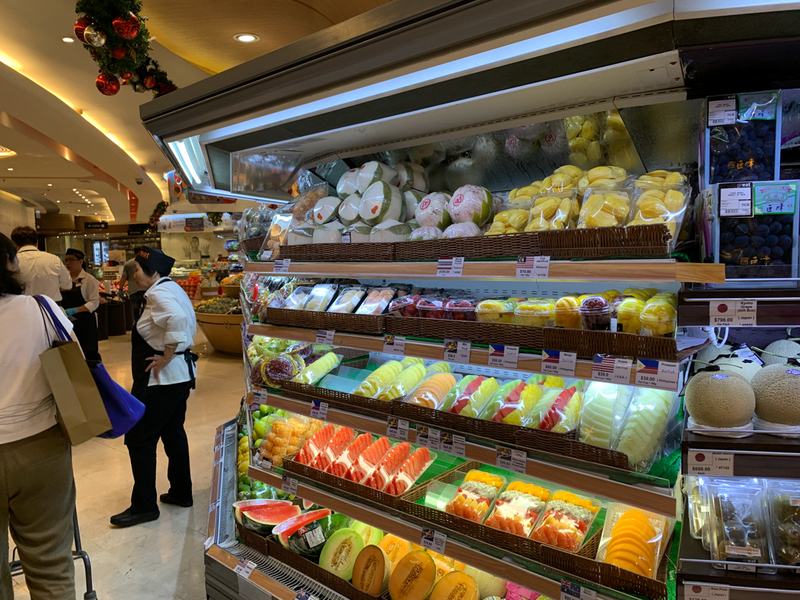 The frozen section, they had organic veggies, but all the fruit was conventional. 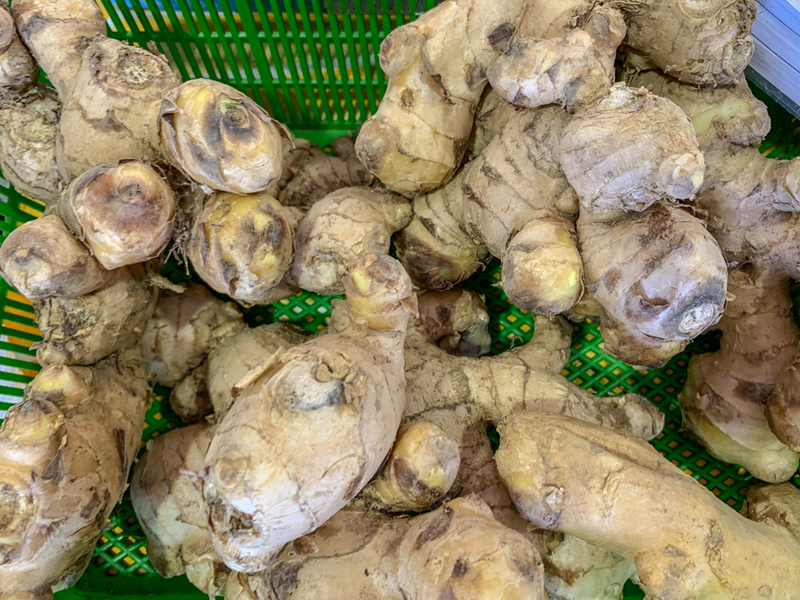 Raw organic mulberies, will be great in a chia pudding. 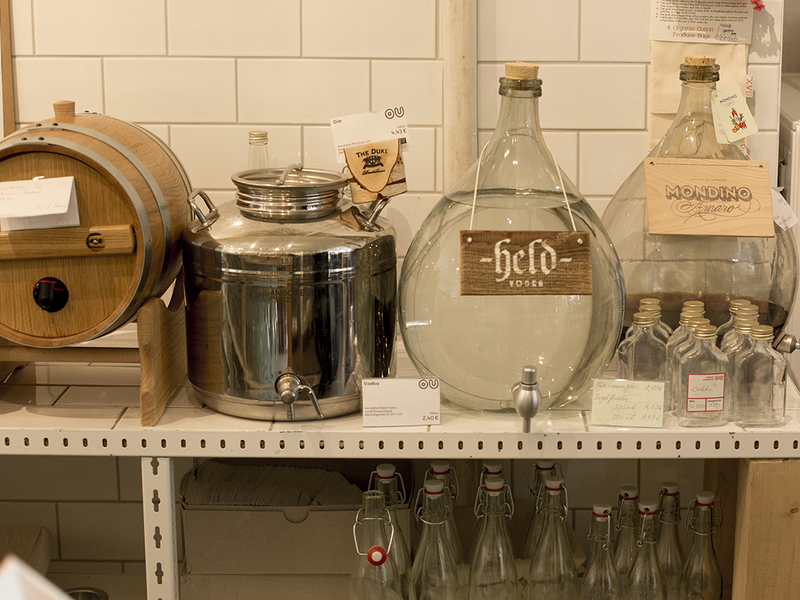 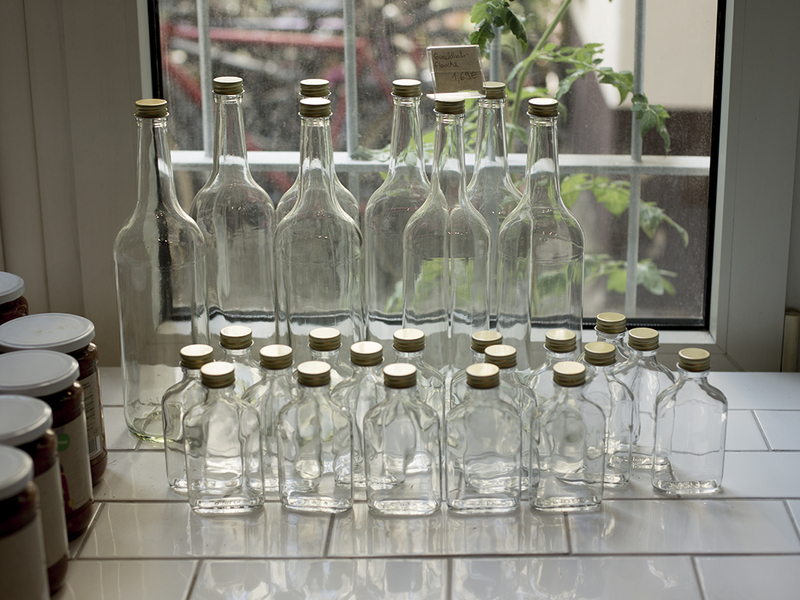 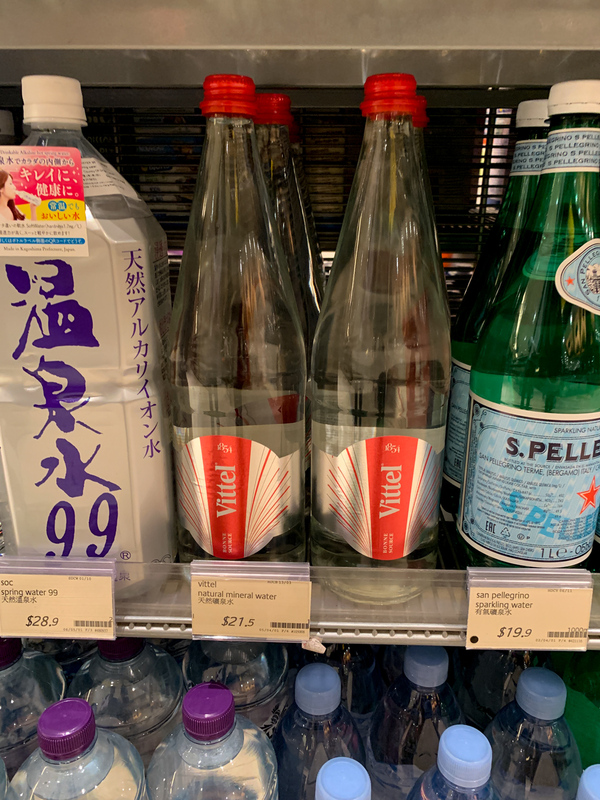 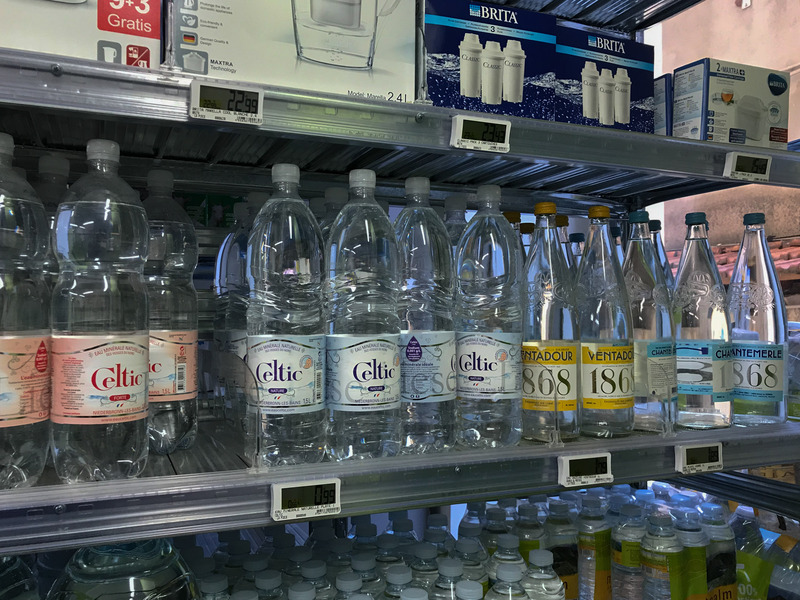 Lastly, the water in glass bottles. 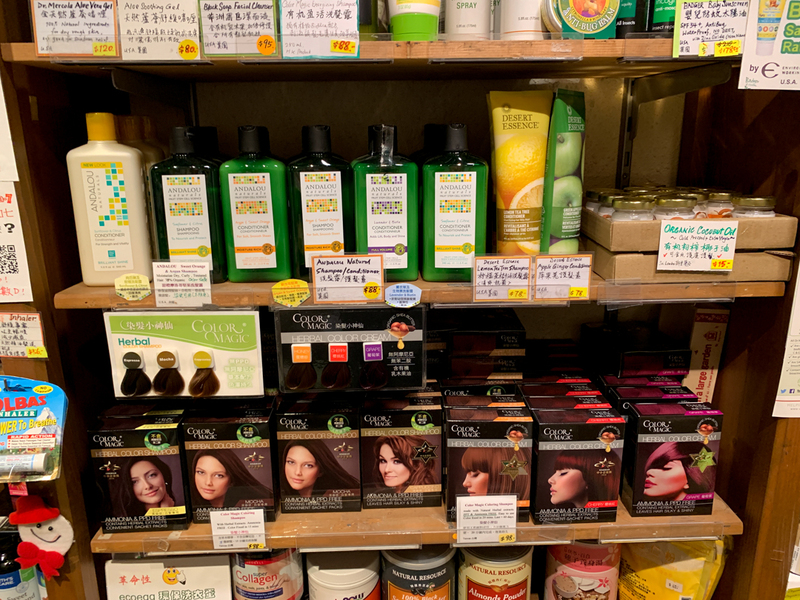 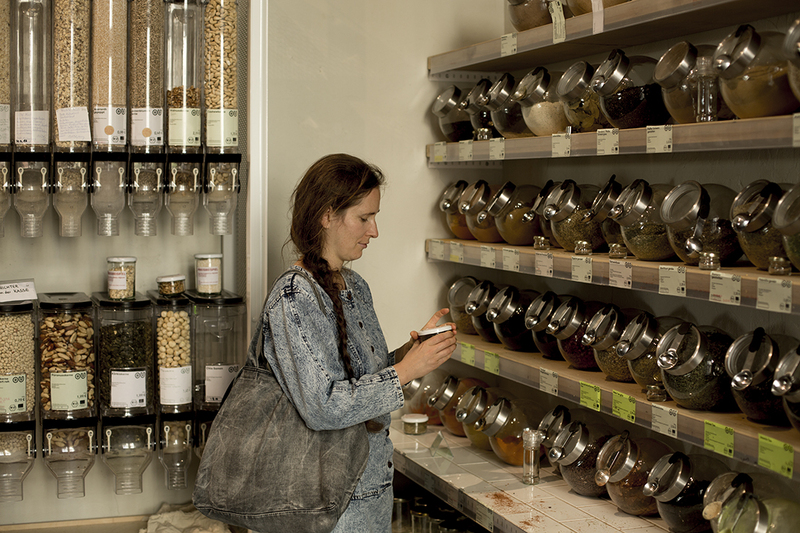 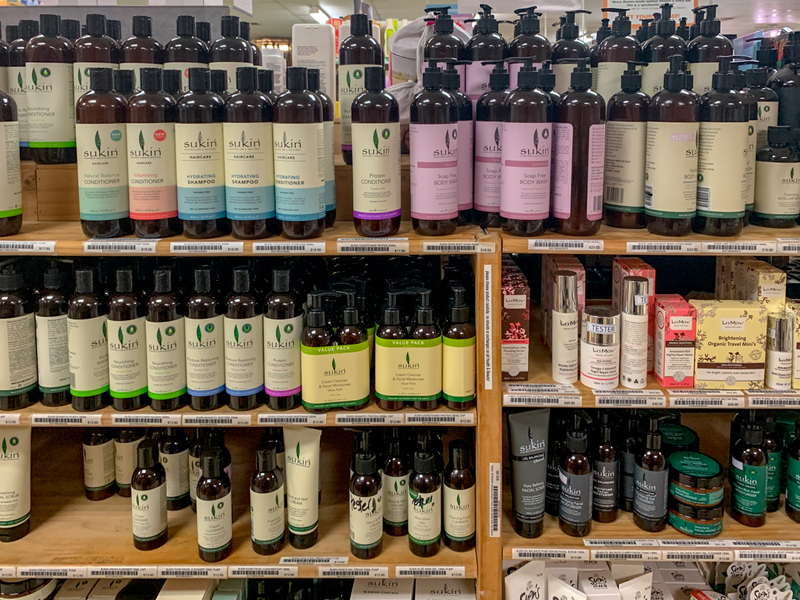 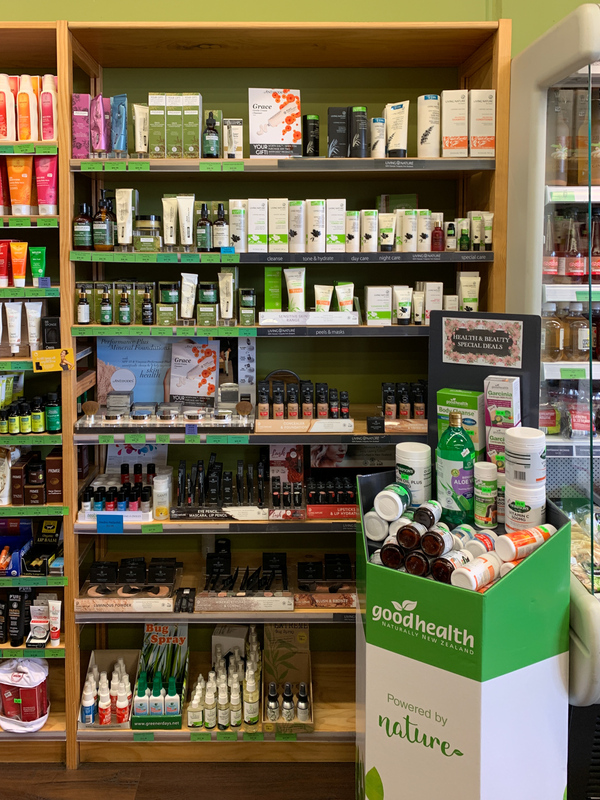 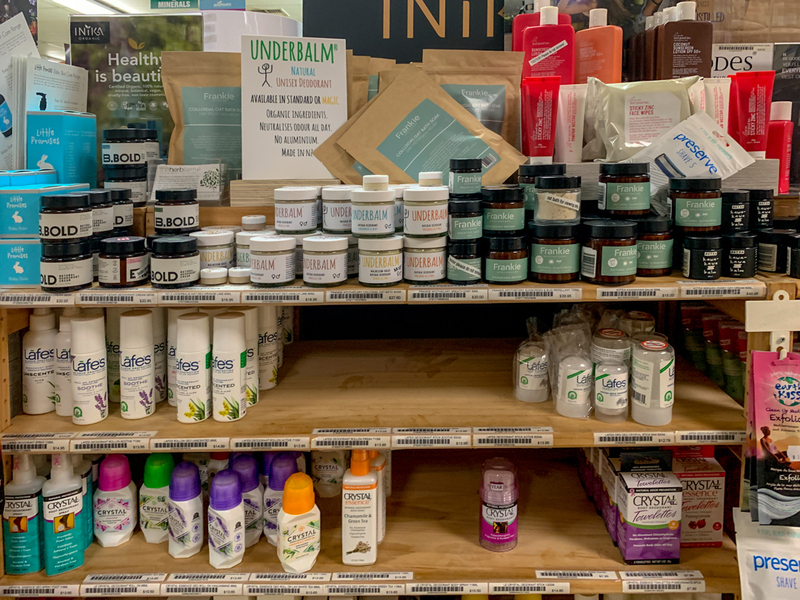 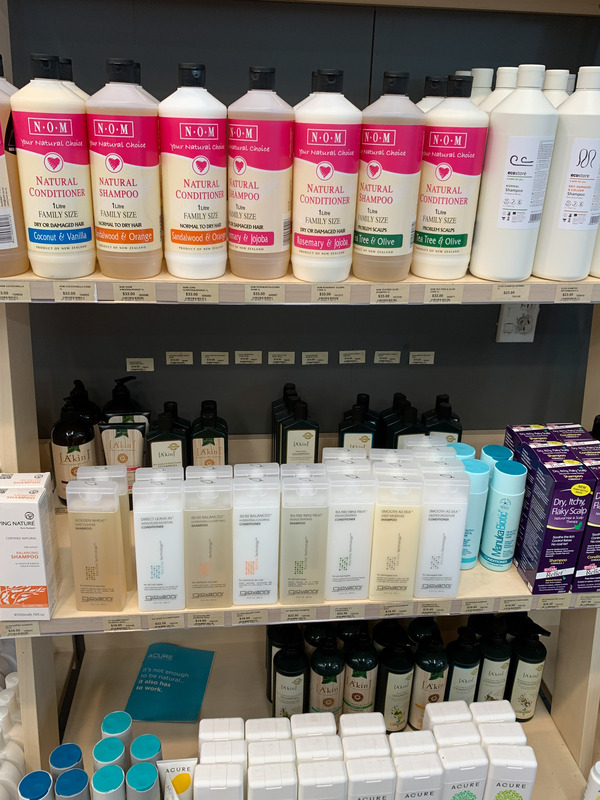 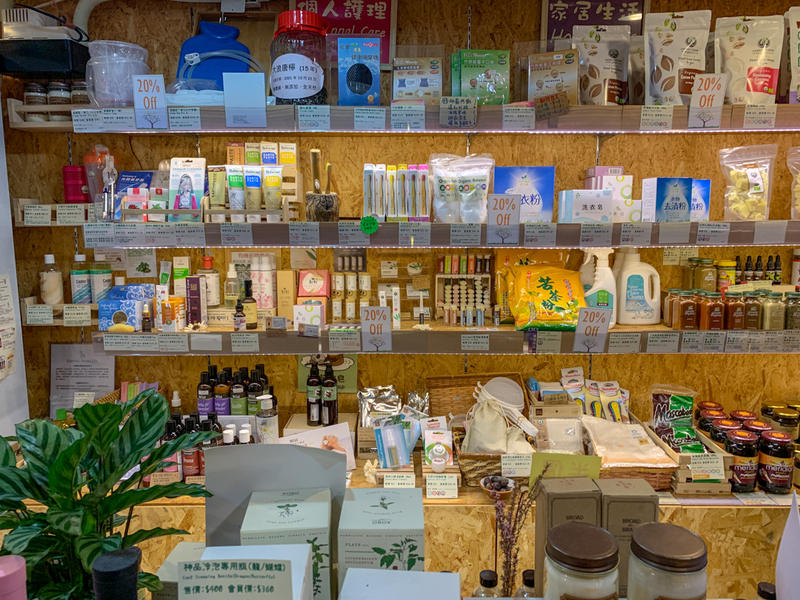 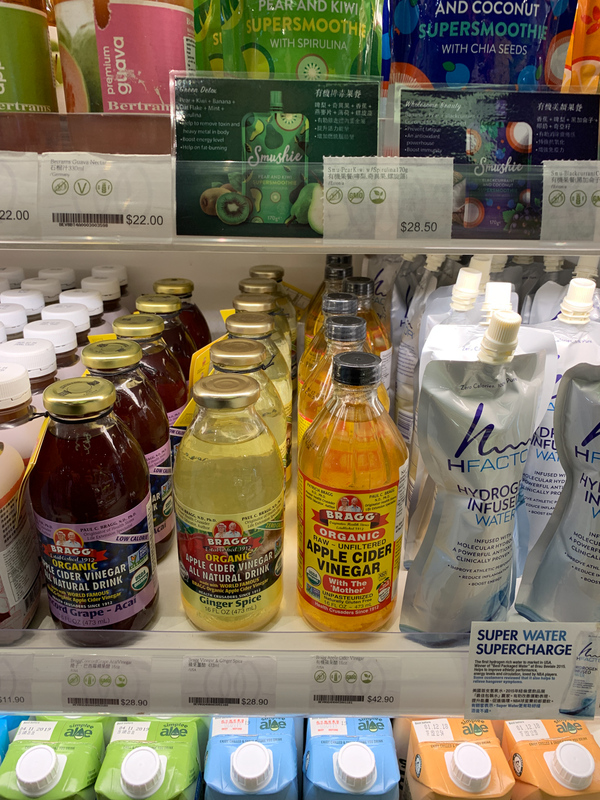 Organic and natural shampoo and beauty products are near the cashier.